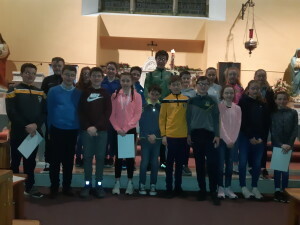 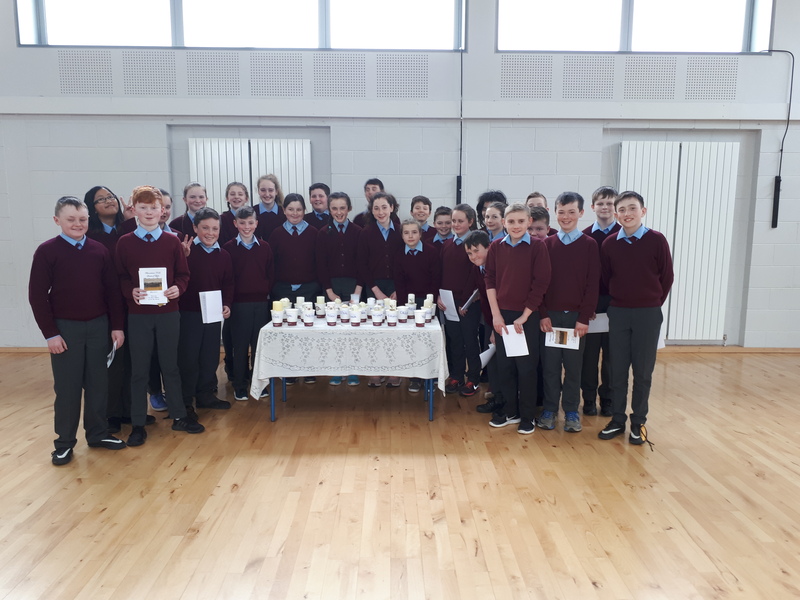 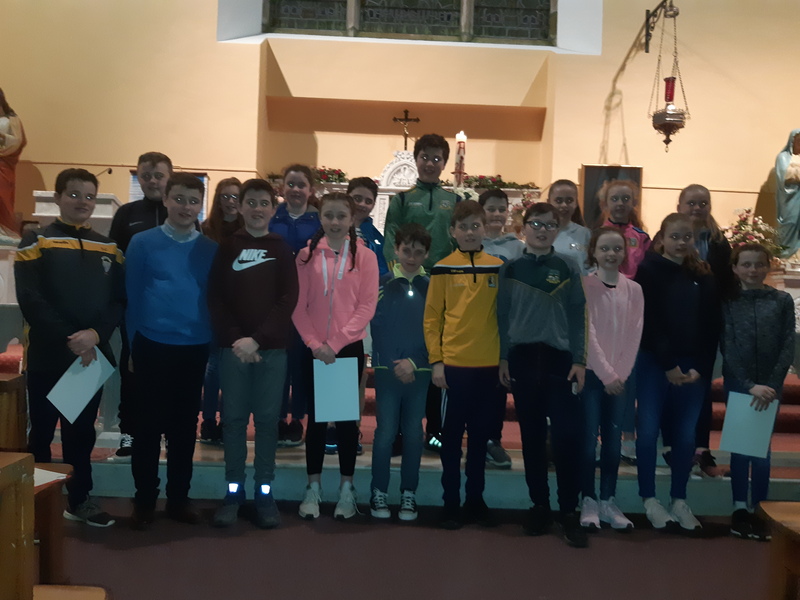 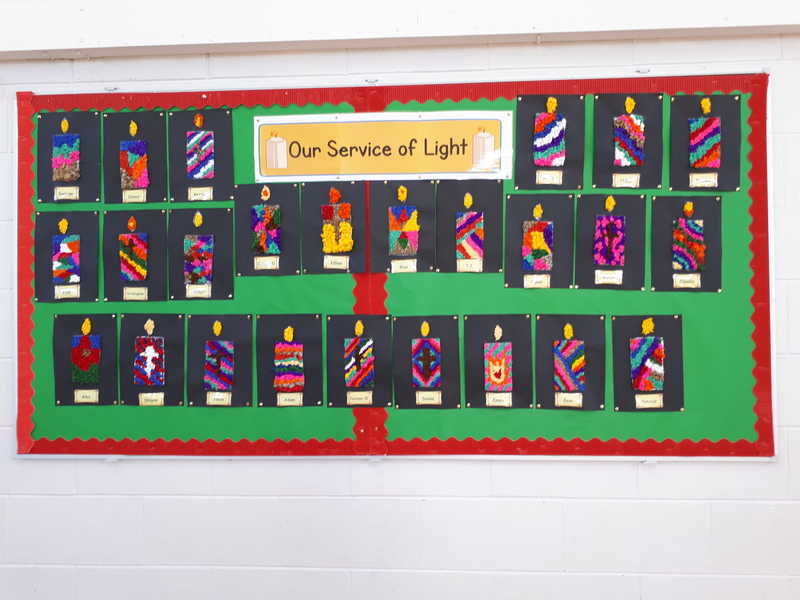 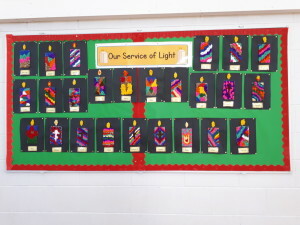 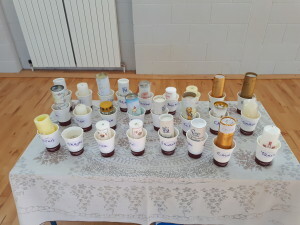 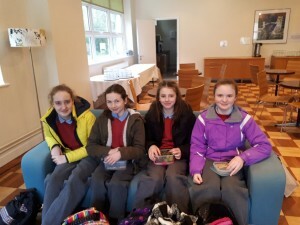 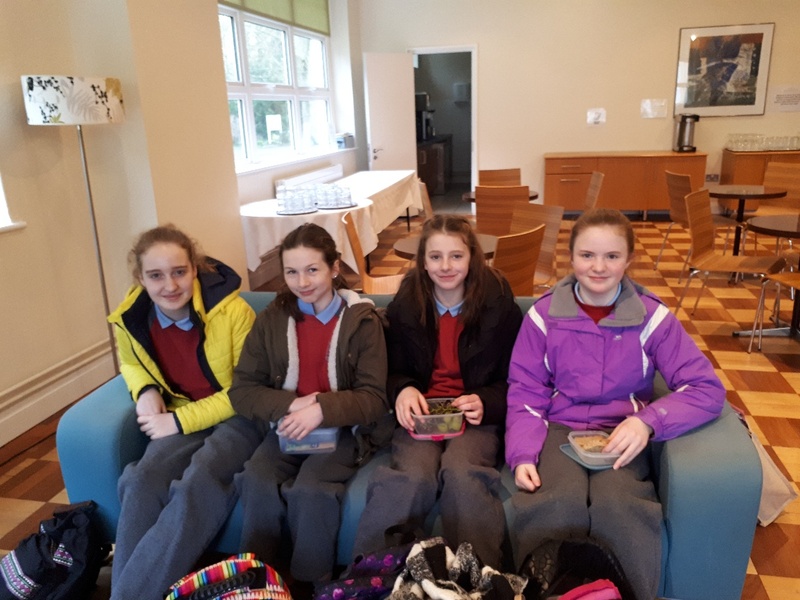 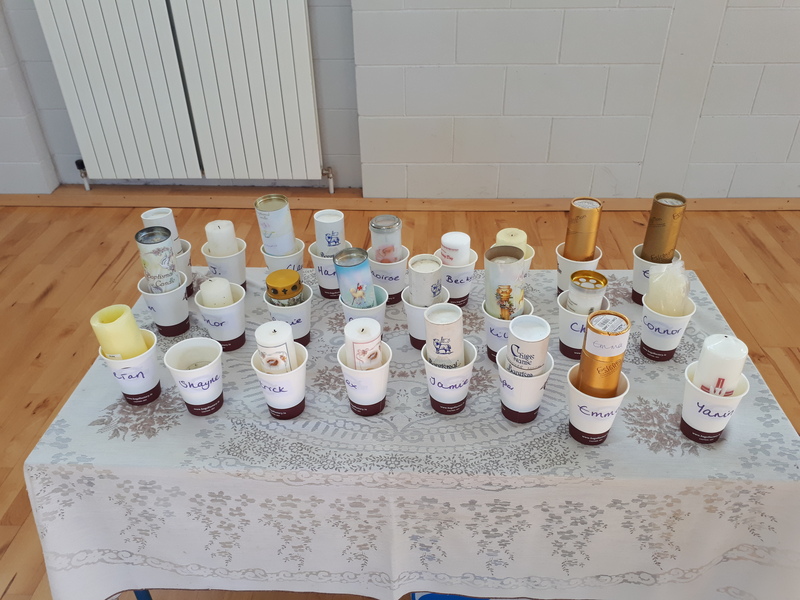 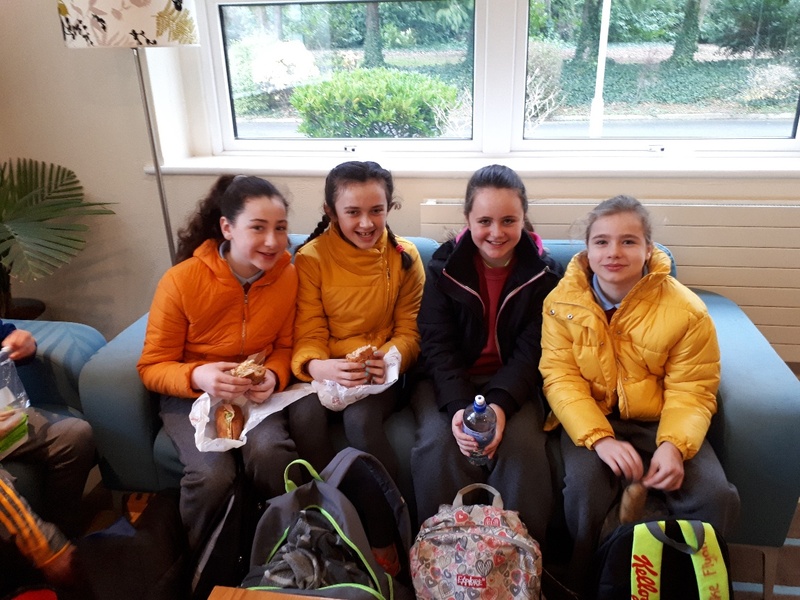 Ms Murphy’s 6th class had their Service of Light in Jordanstown Church on February 26th, in preparation for their Confirmation. 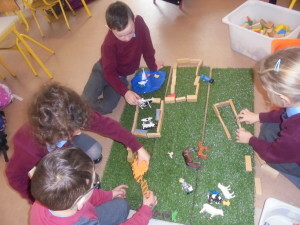 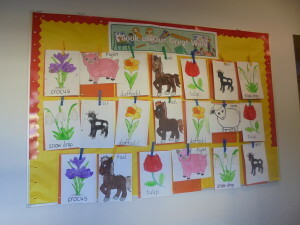 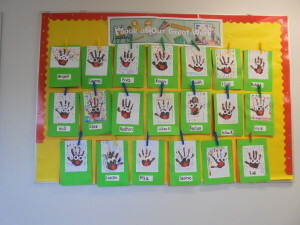 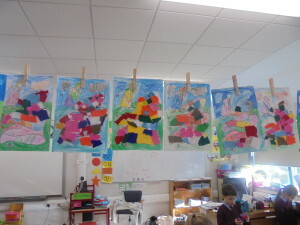 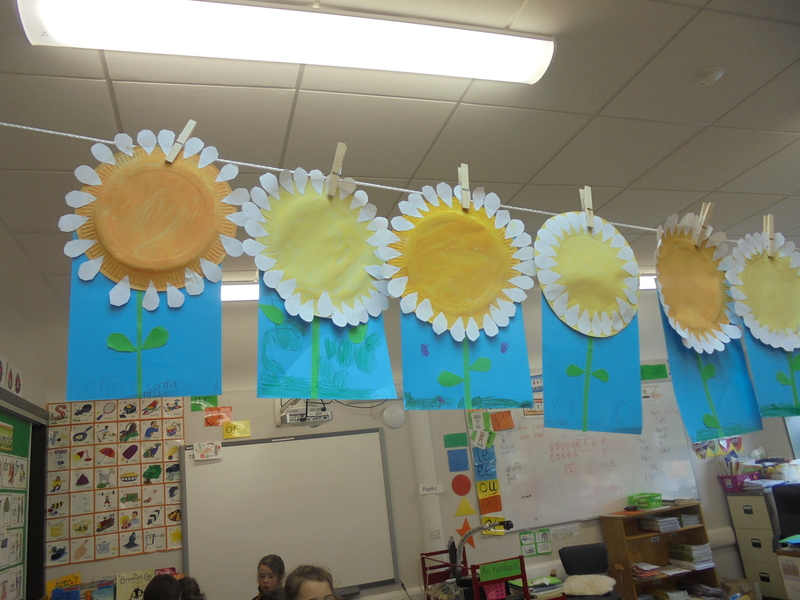 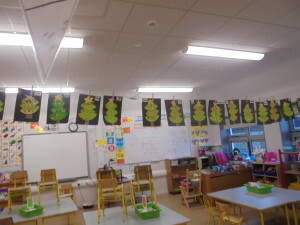 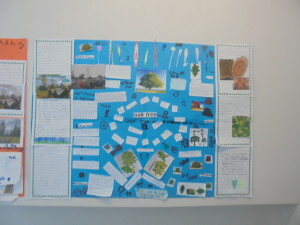 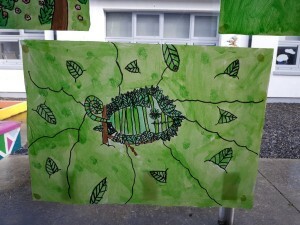 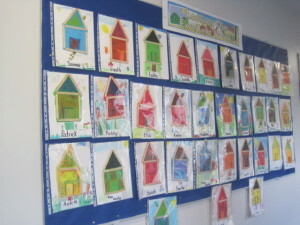 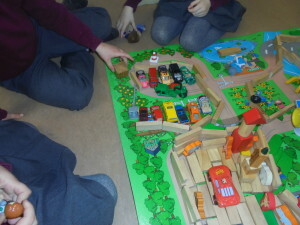 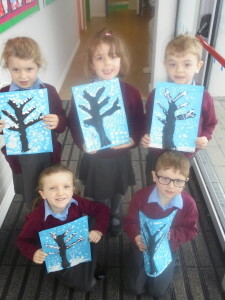 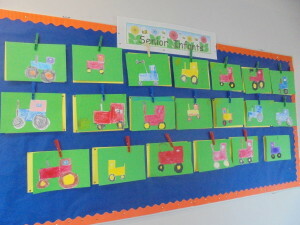 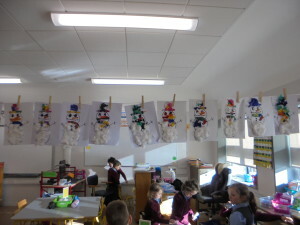 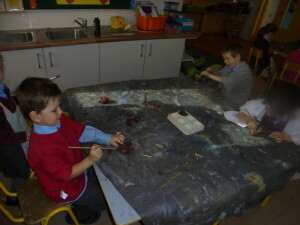 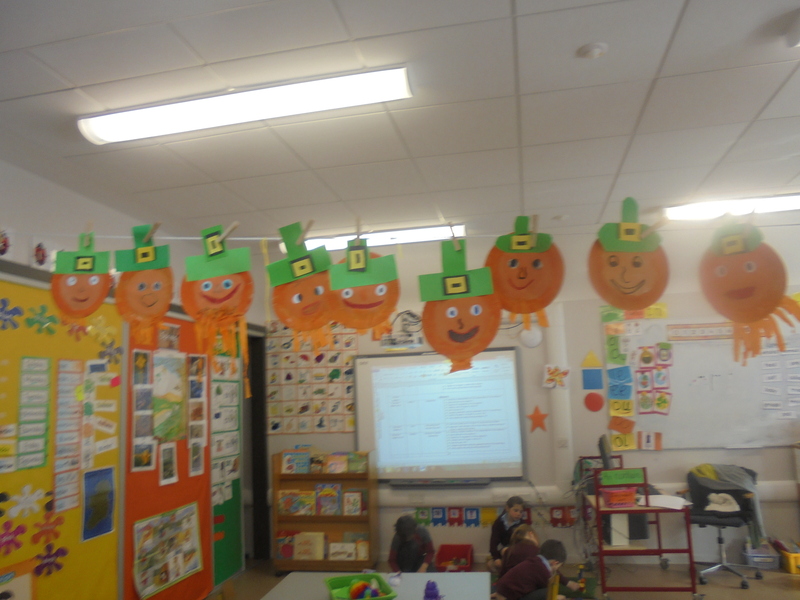 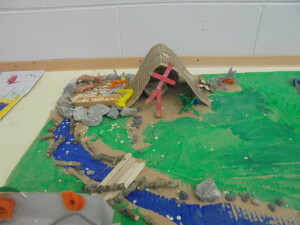 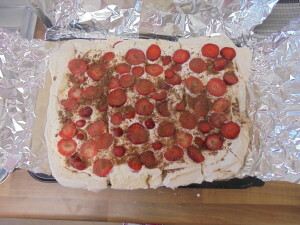 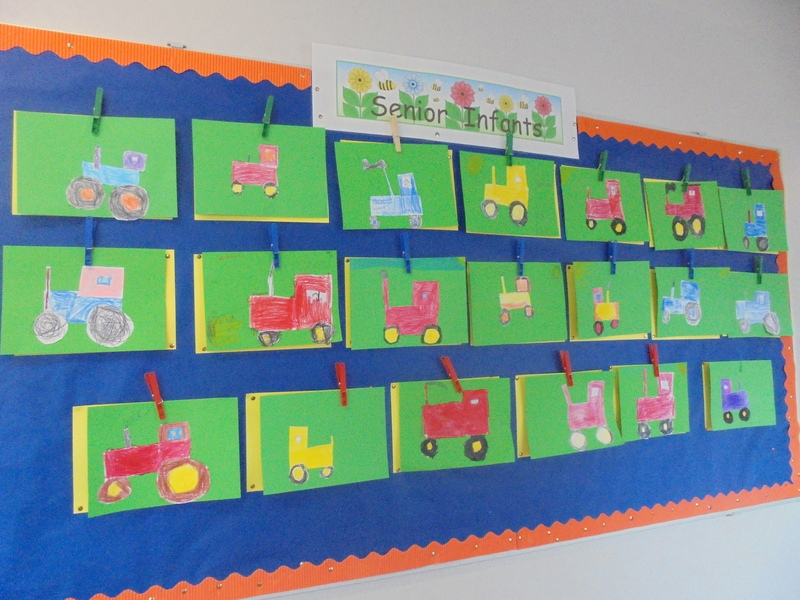 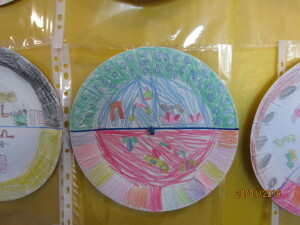 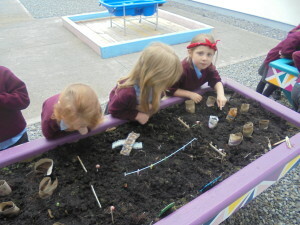 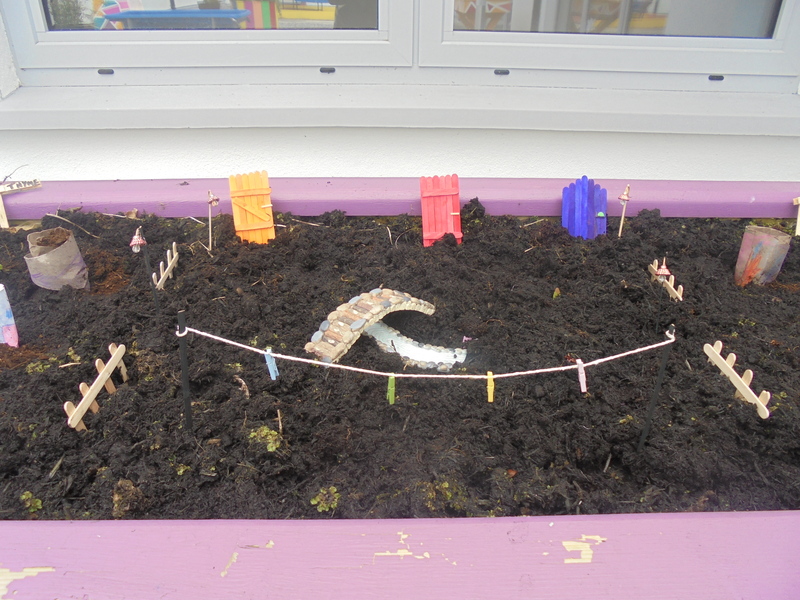 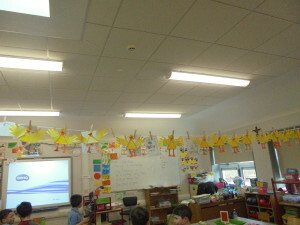 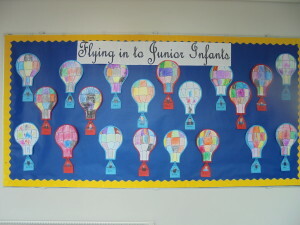 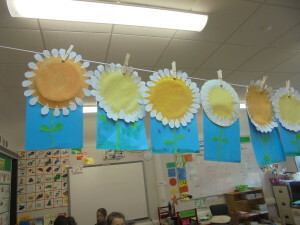 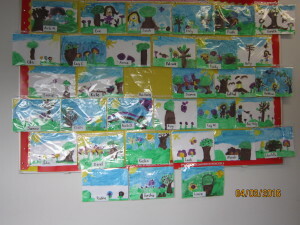 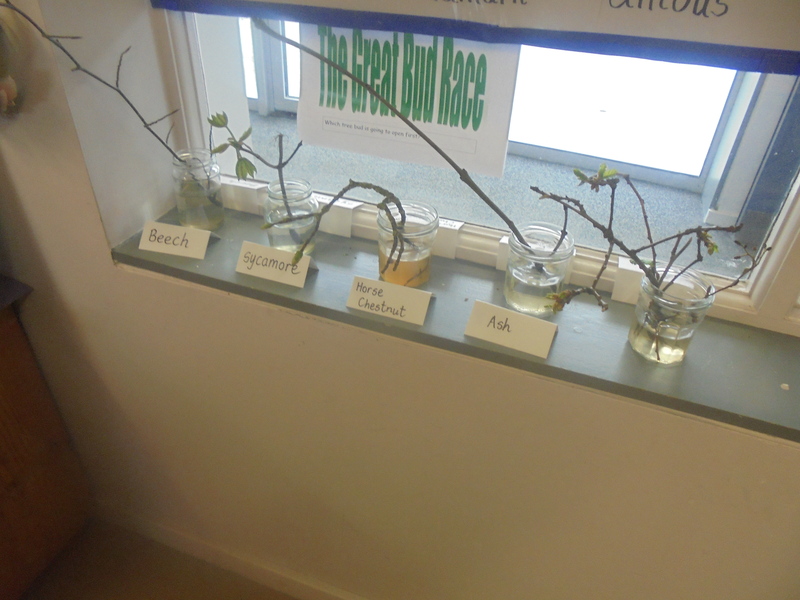 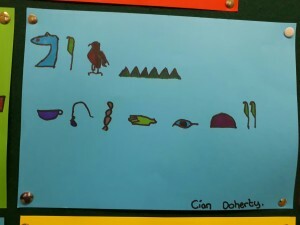 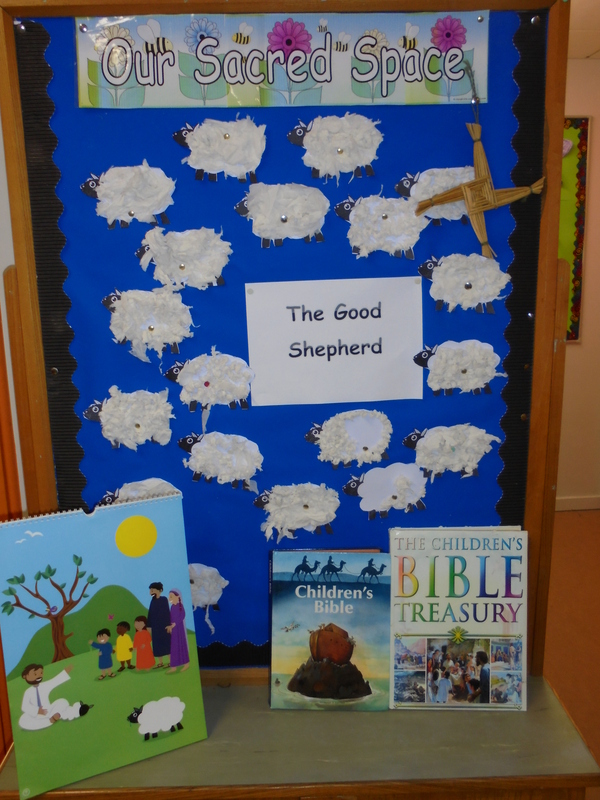 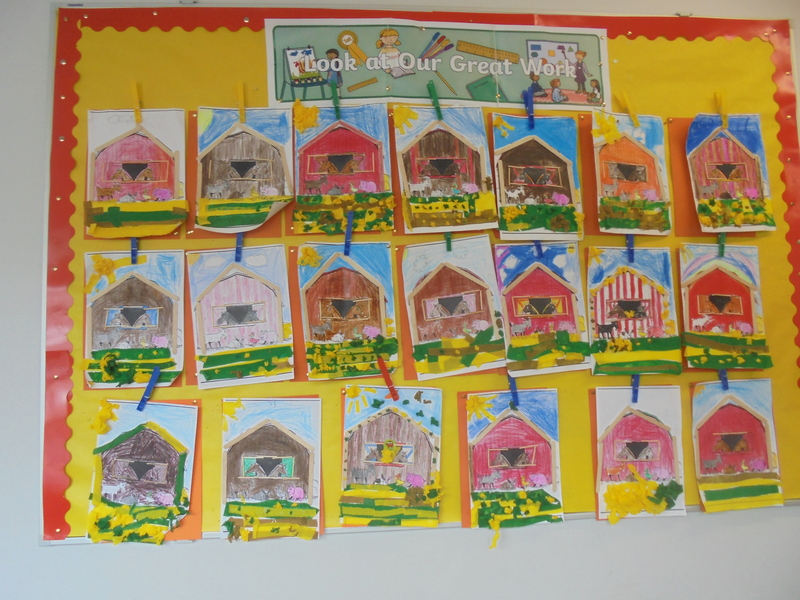 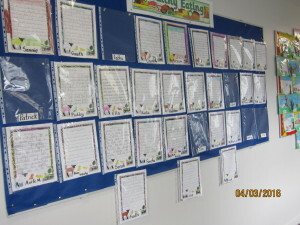 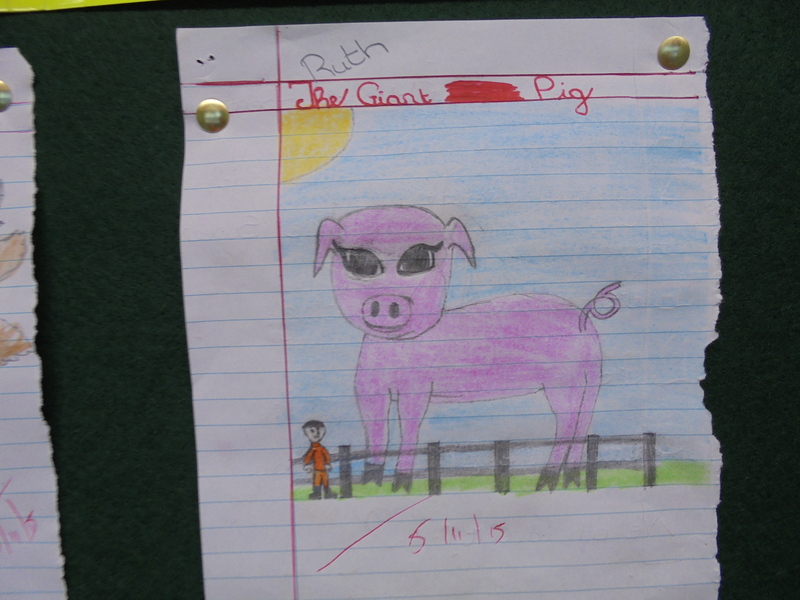 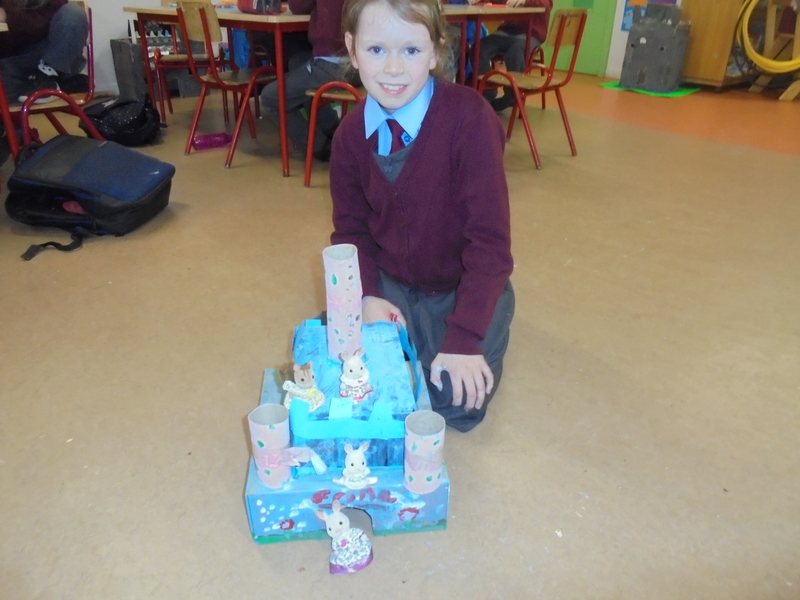 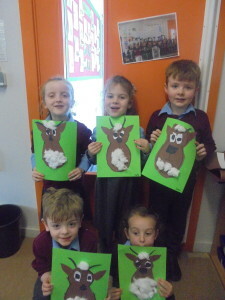 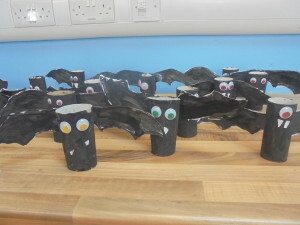 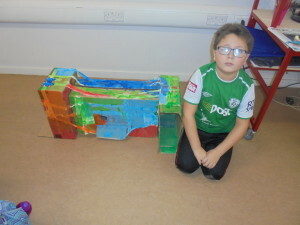 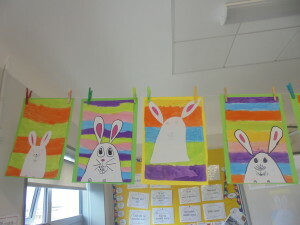 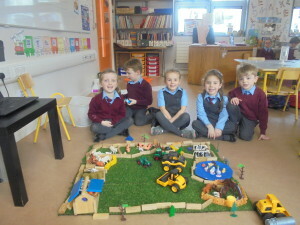 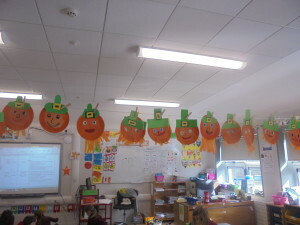 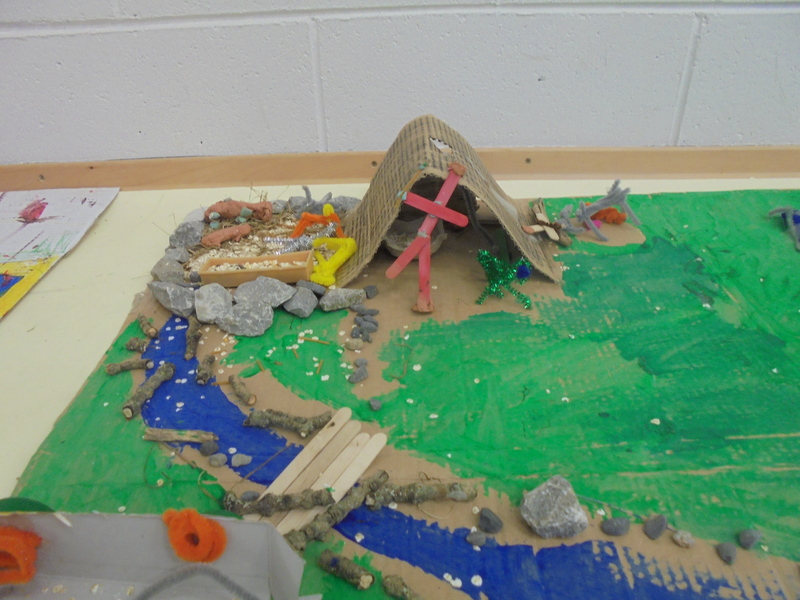 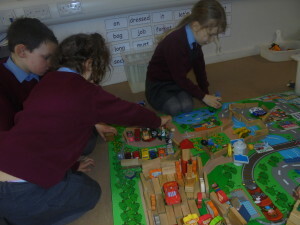 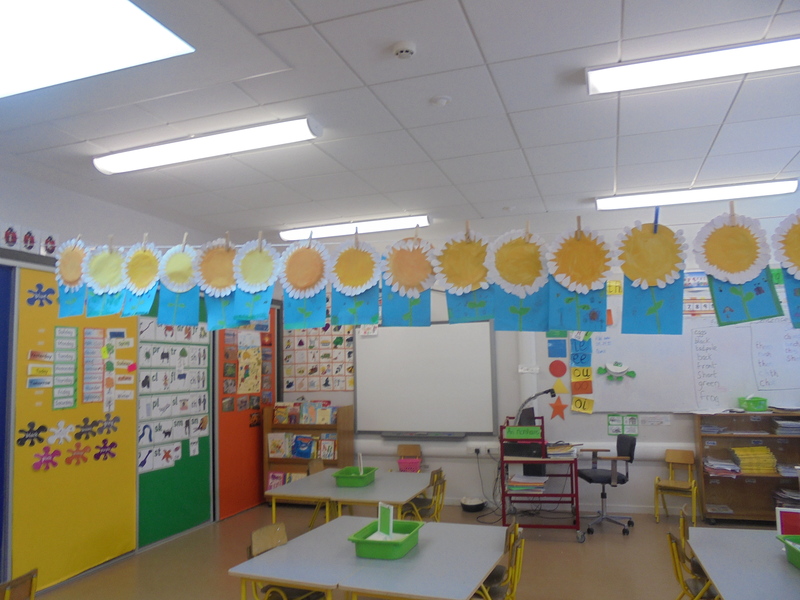 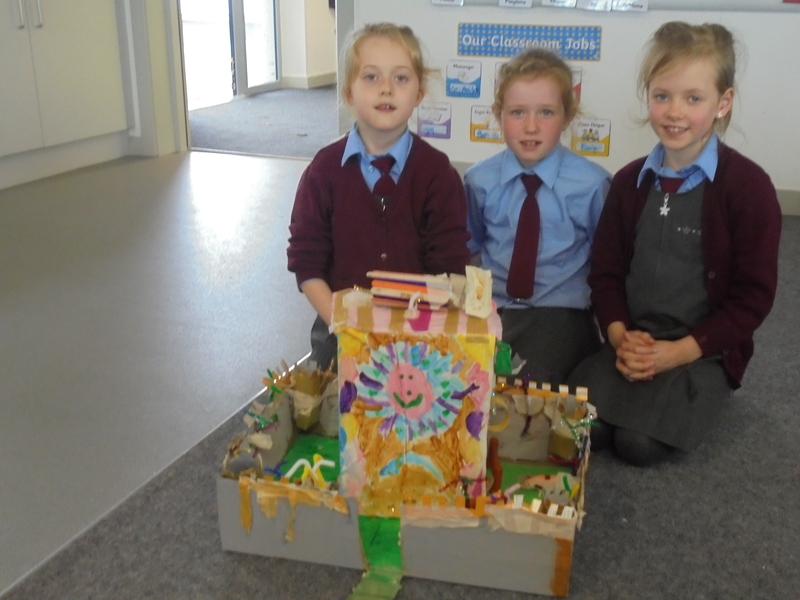 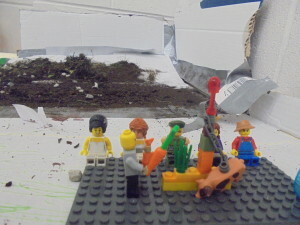 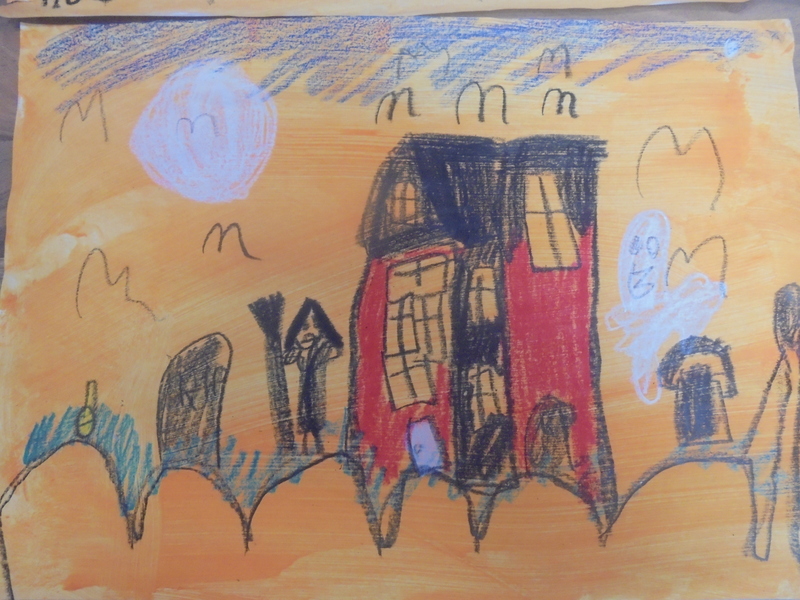 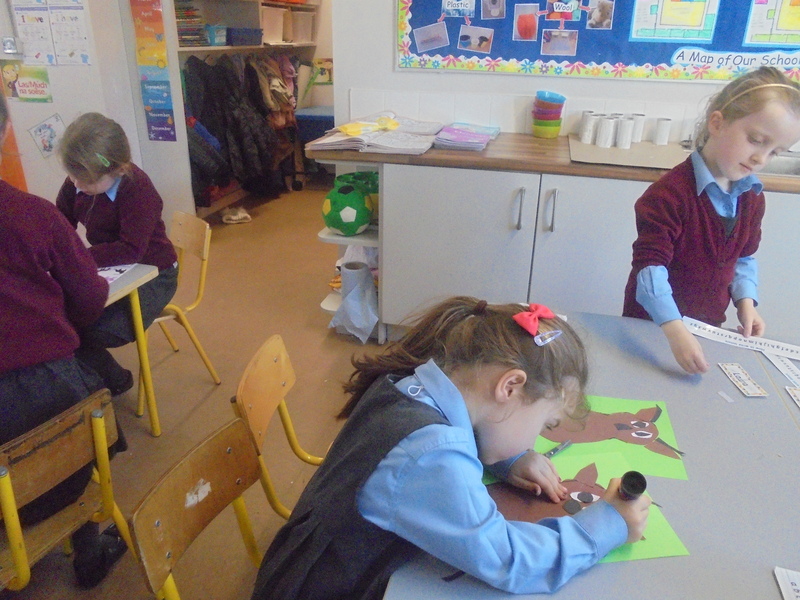 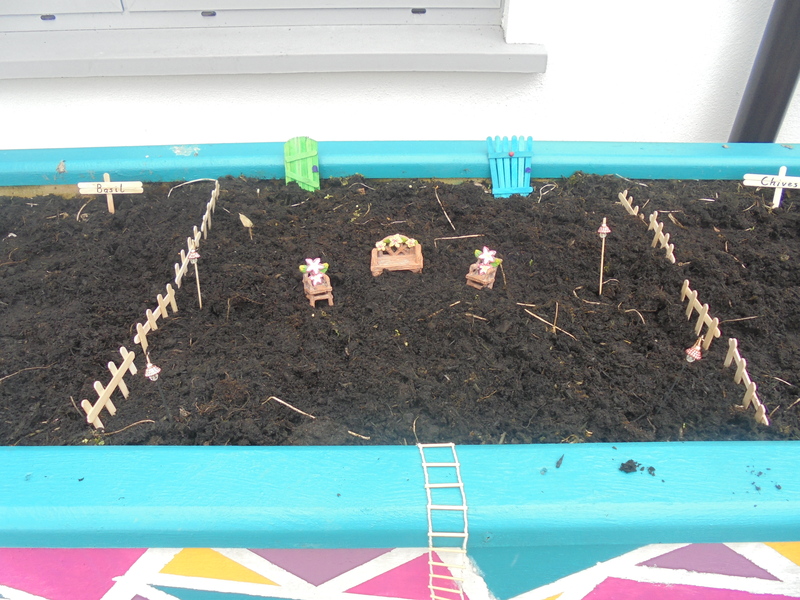 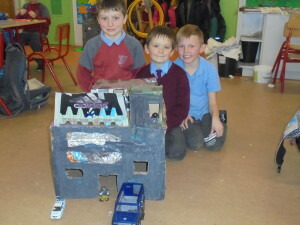 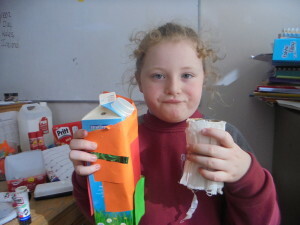 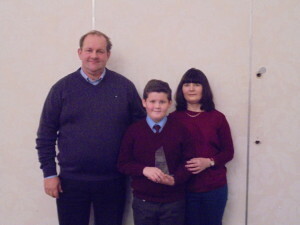 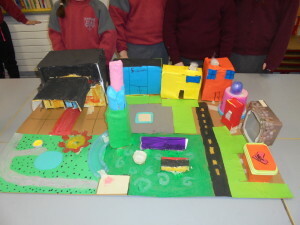 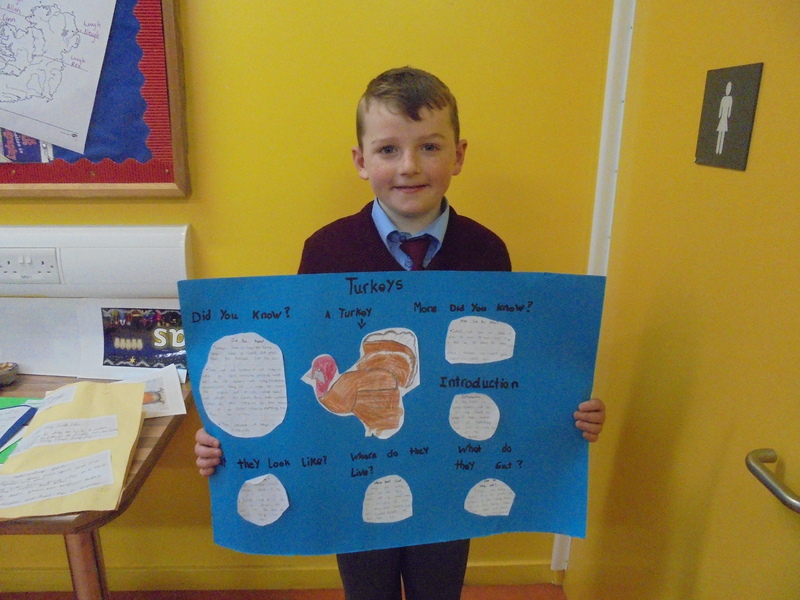 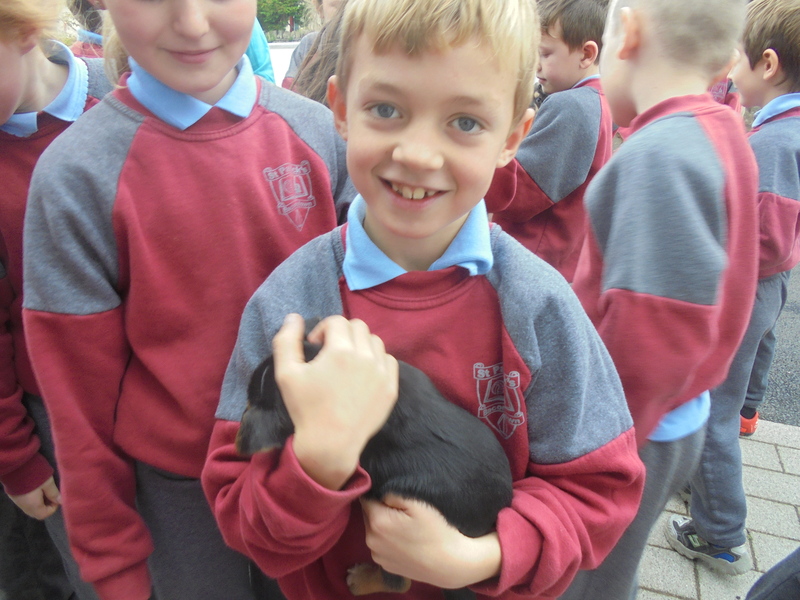 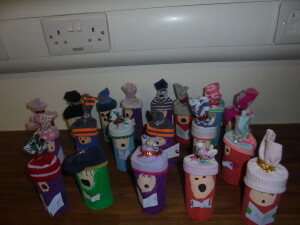 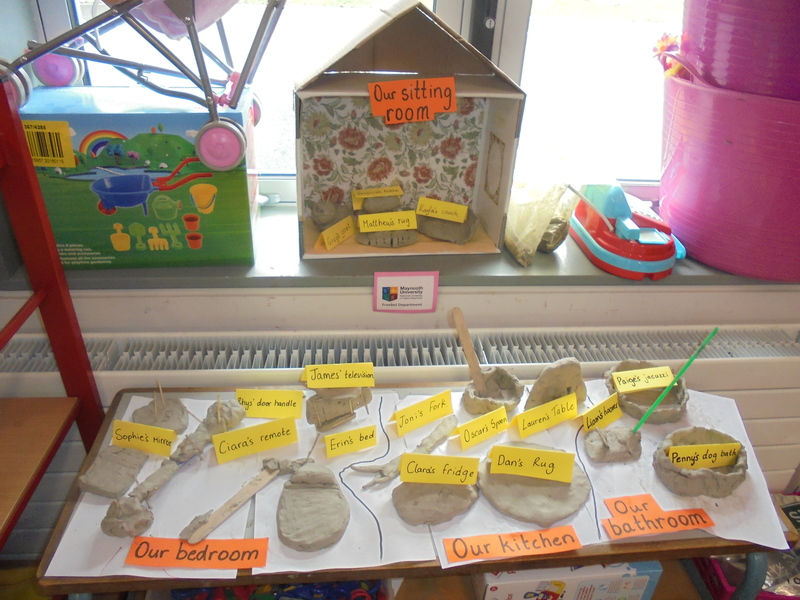 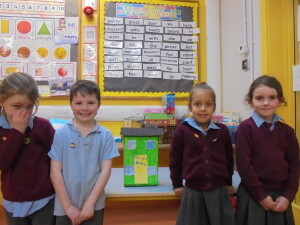 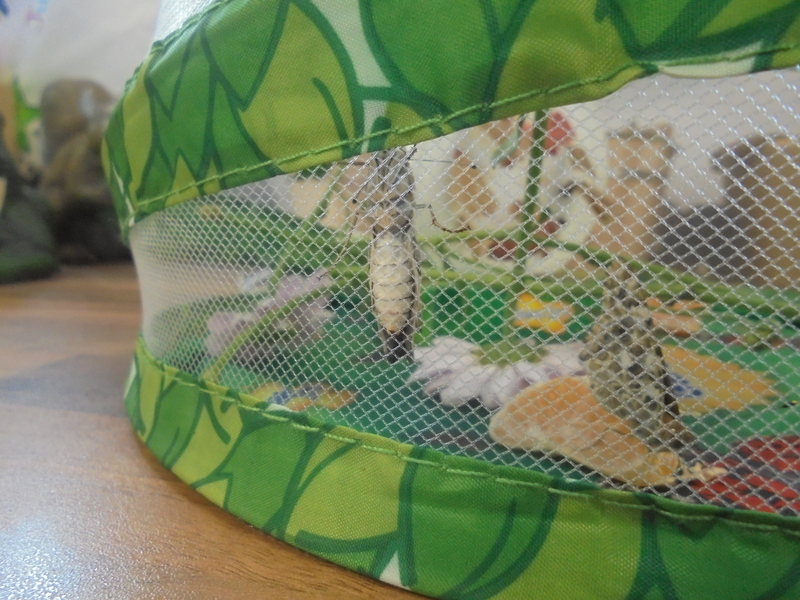 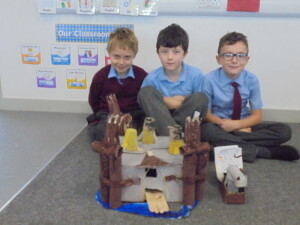 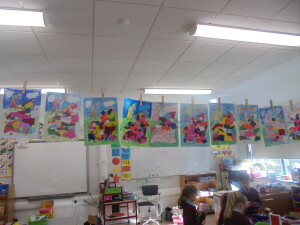 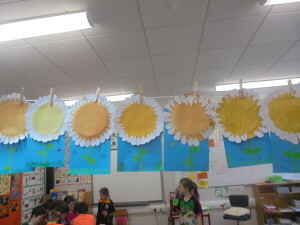 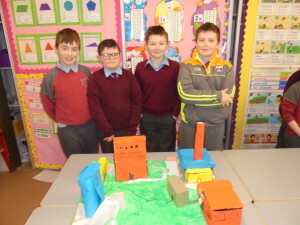 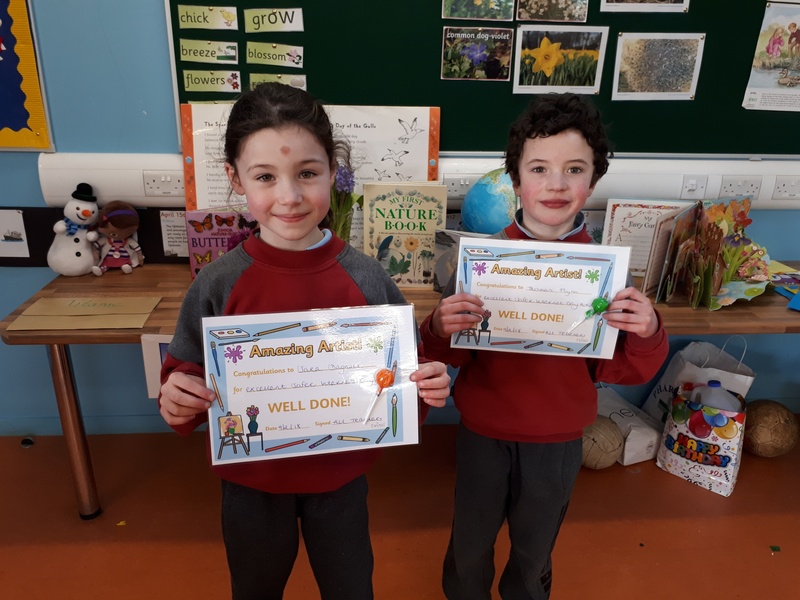 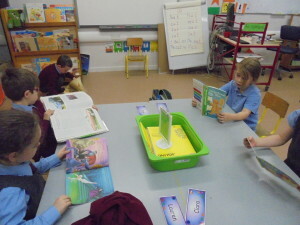 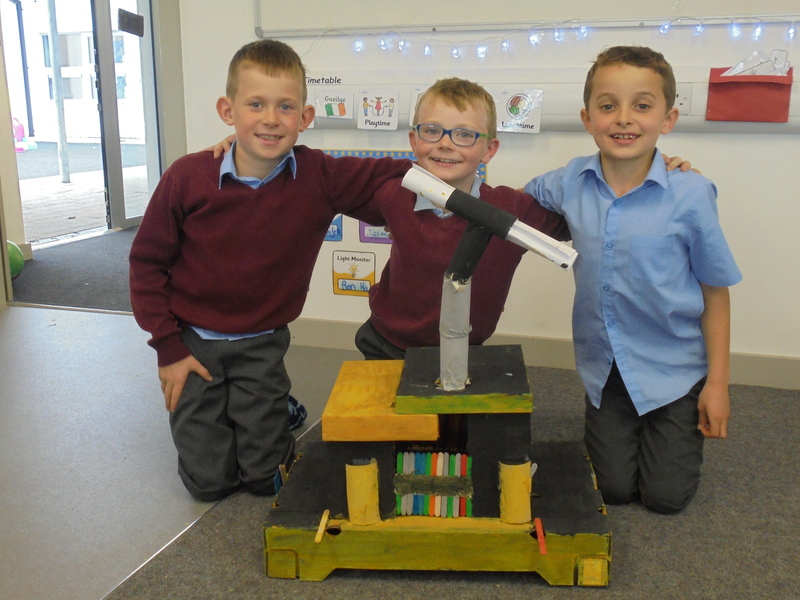 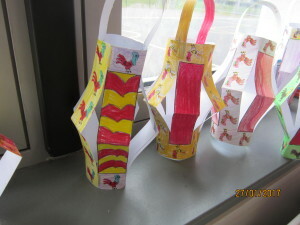 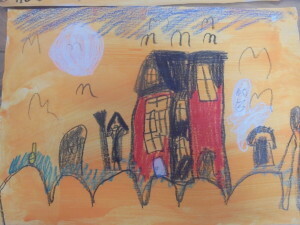 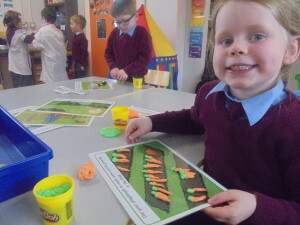 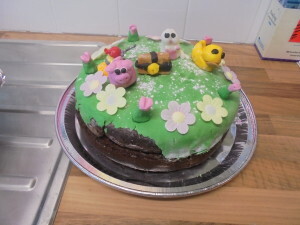 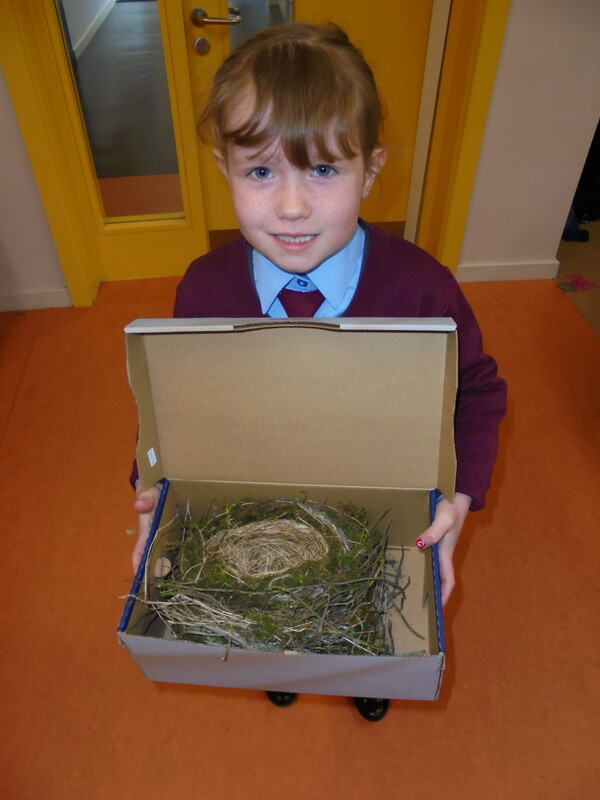 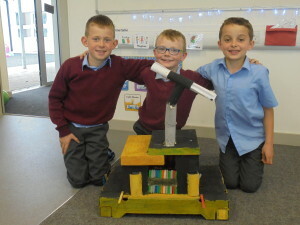 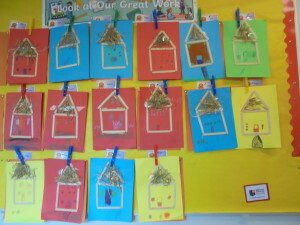 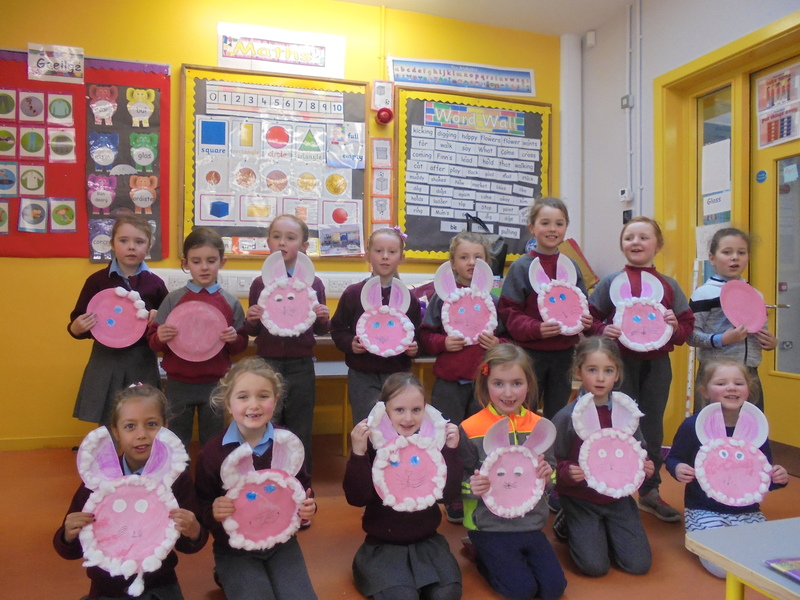 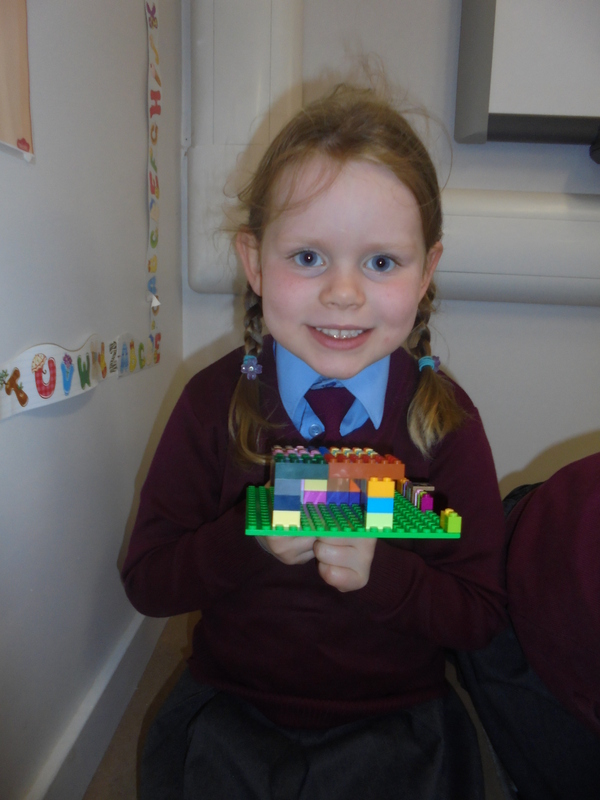 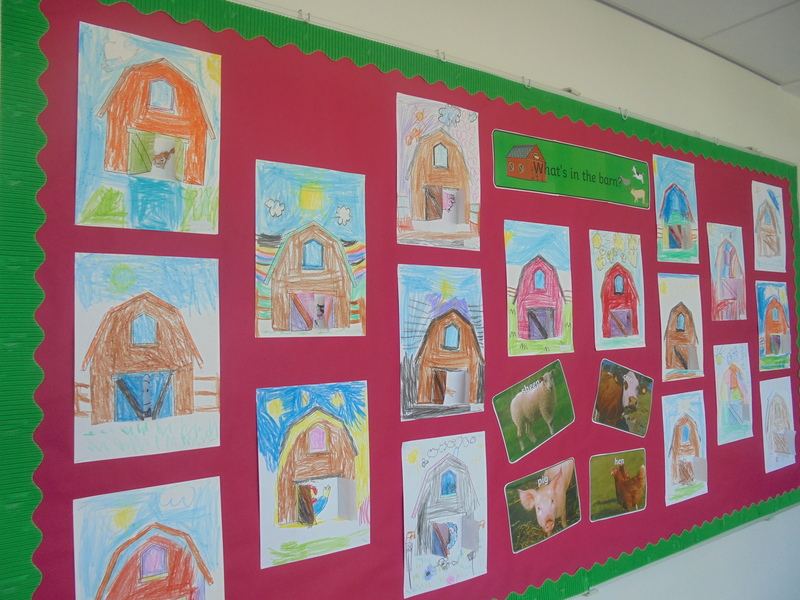 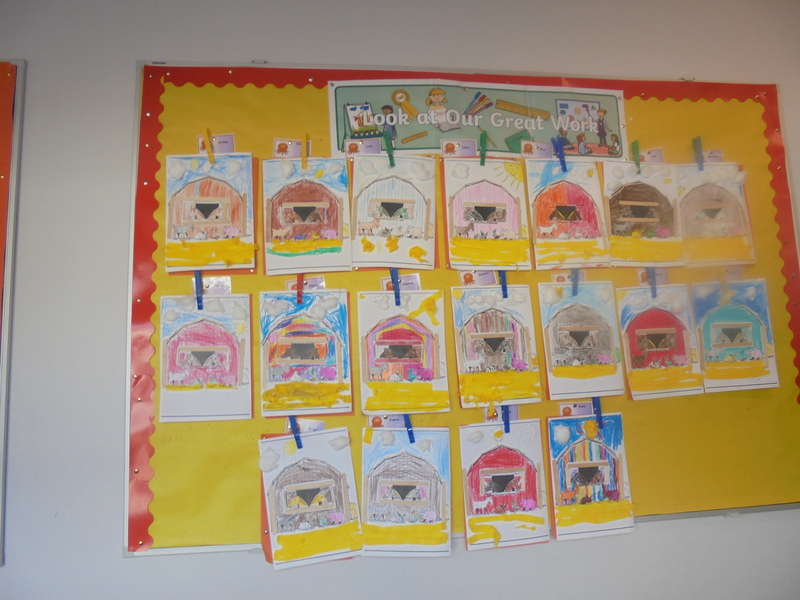 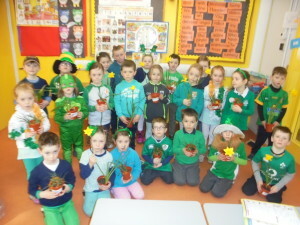 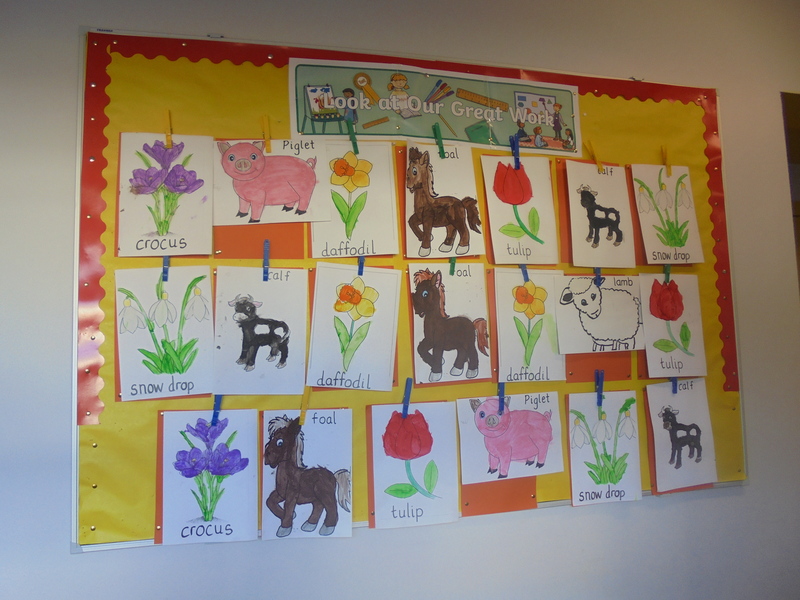 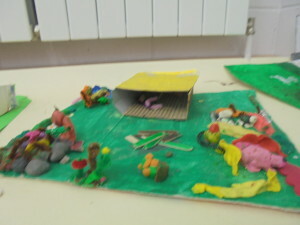 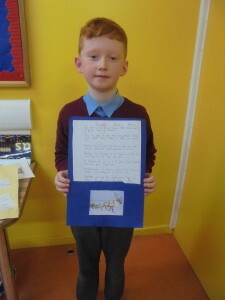 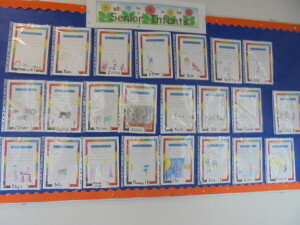 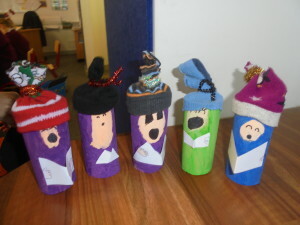 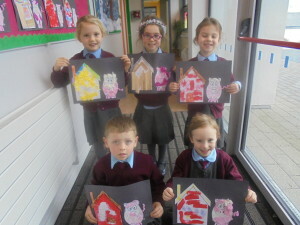 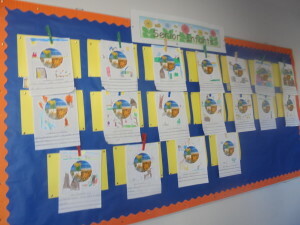 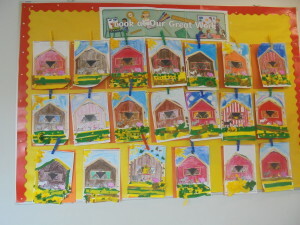 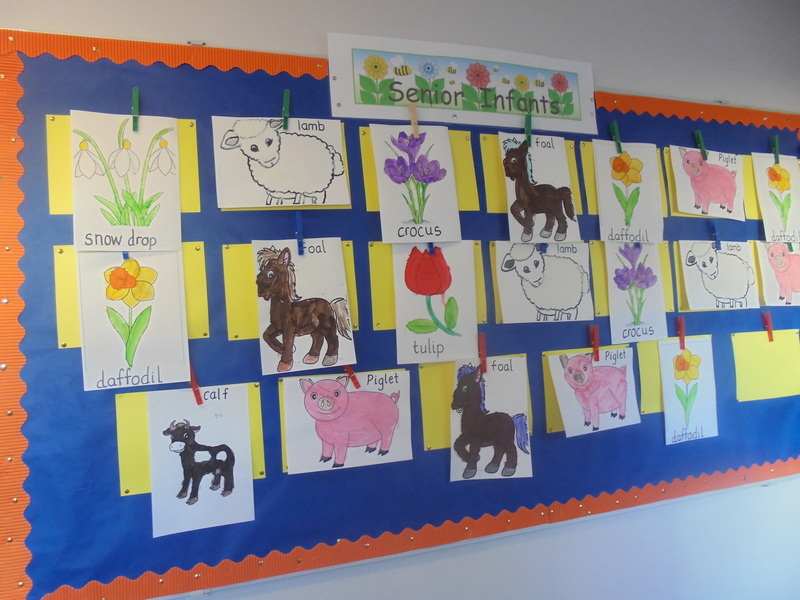 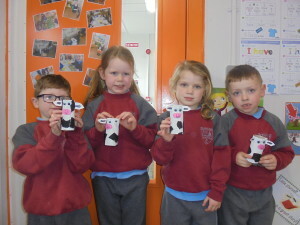 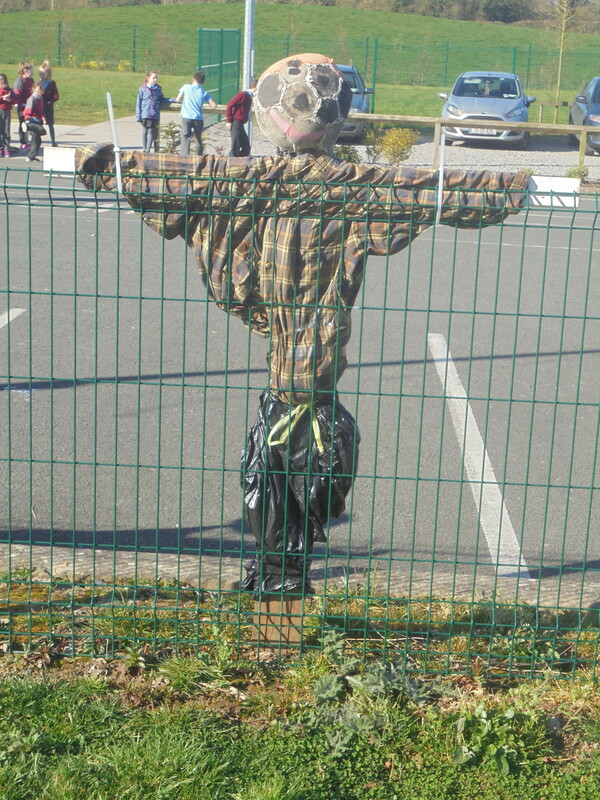 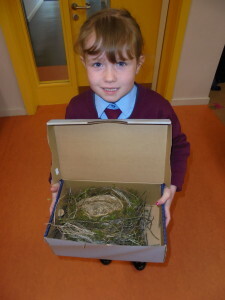 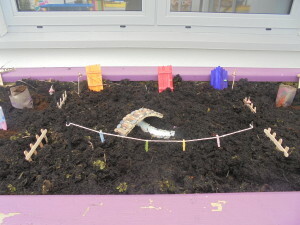 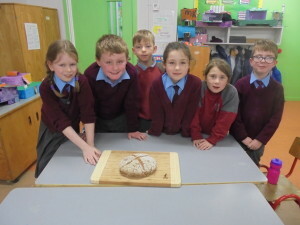 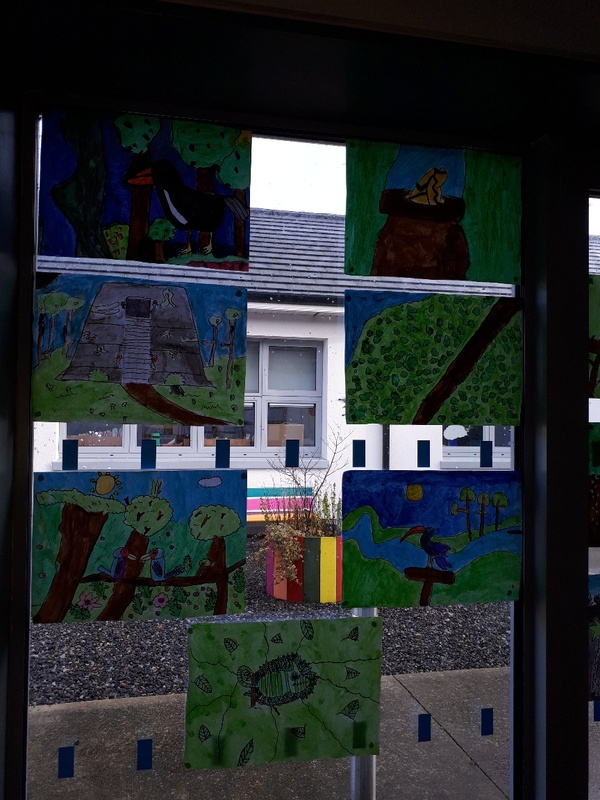 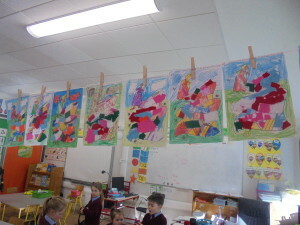 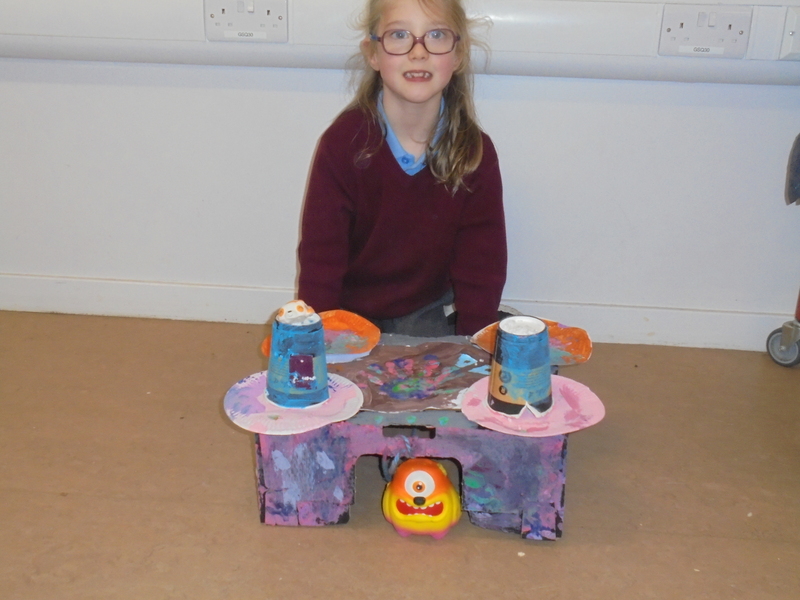 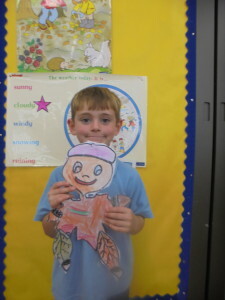 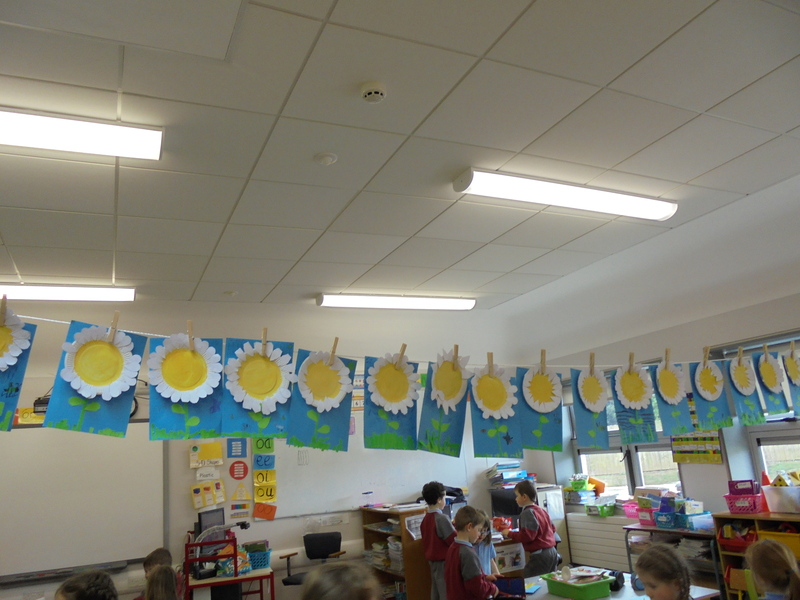 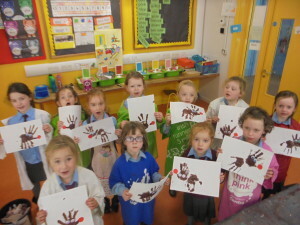 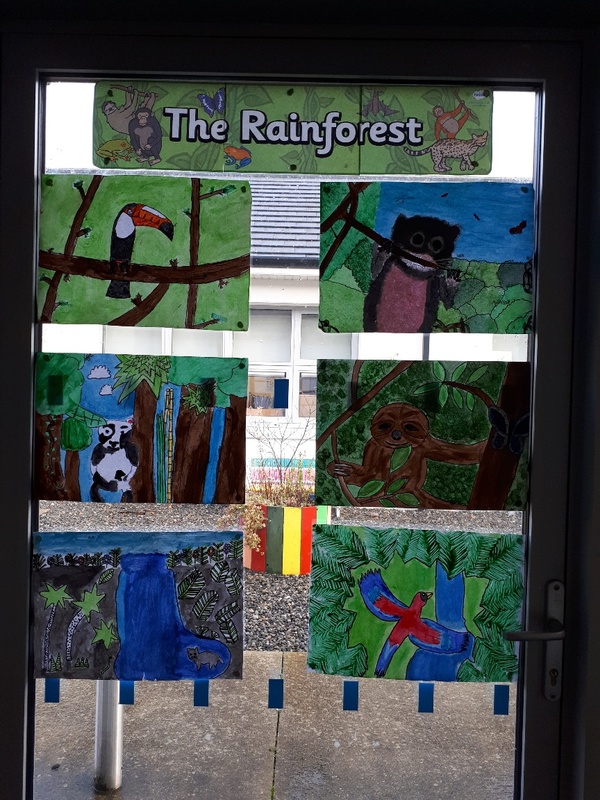 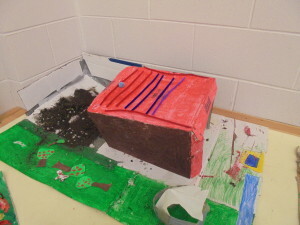 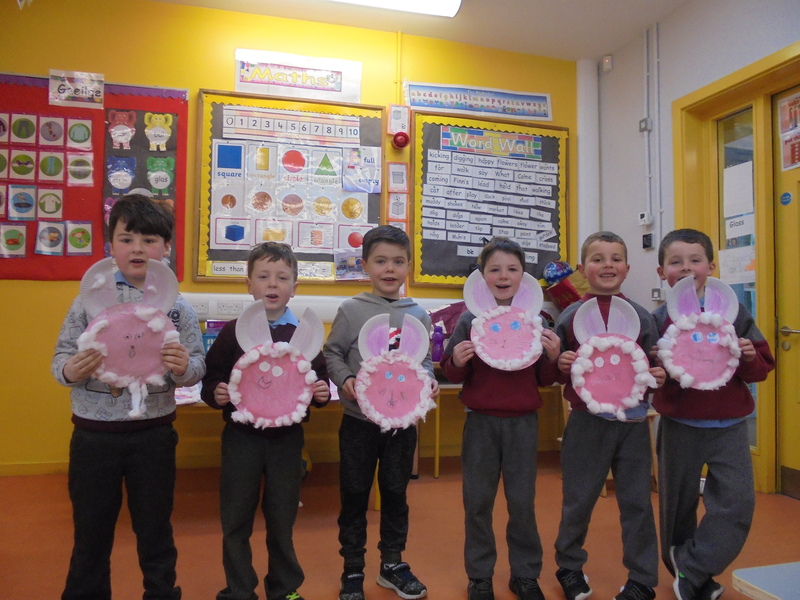 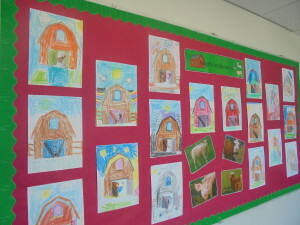 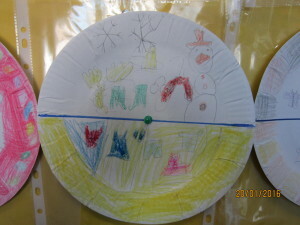 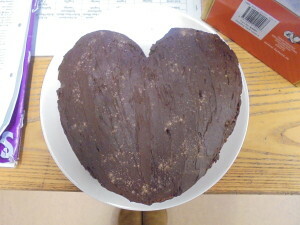 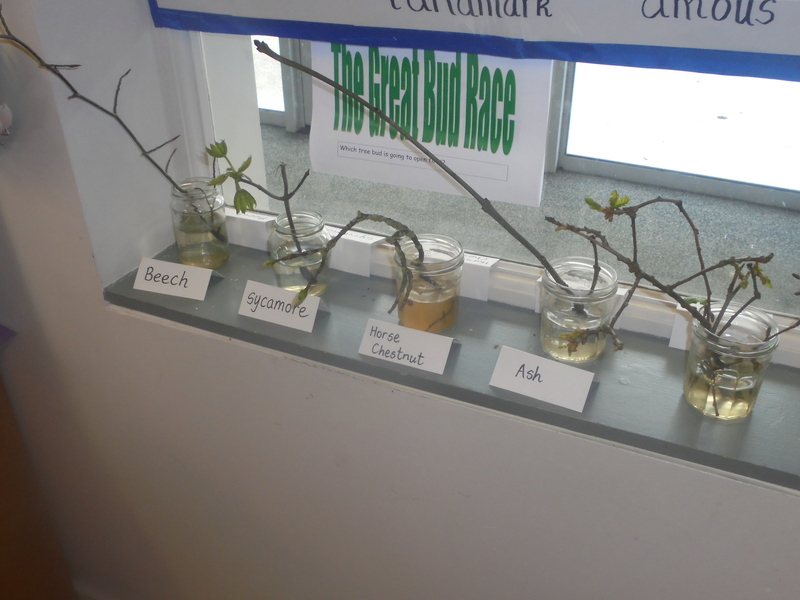 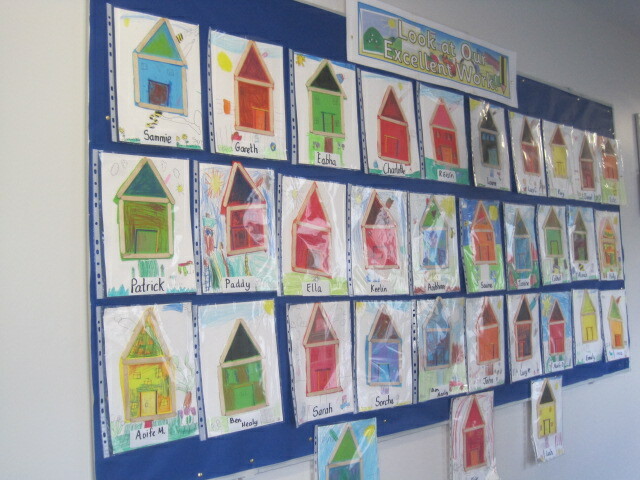 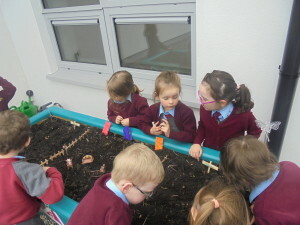 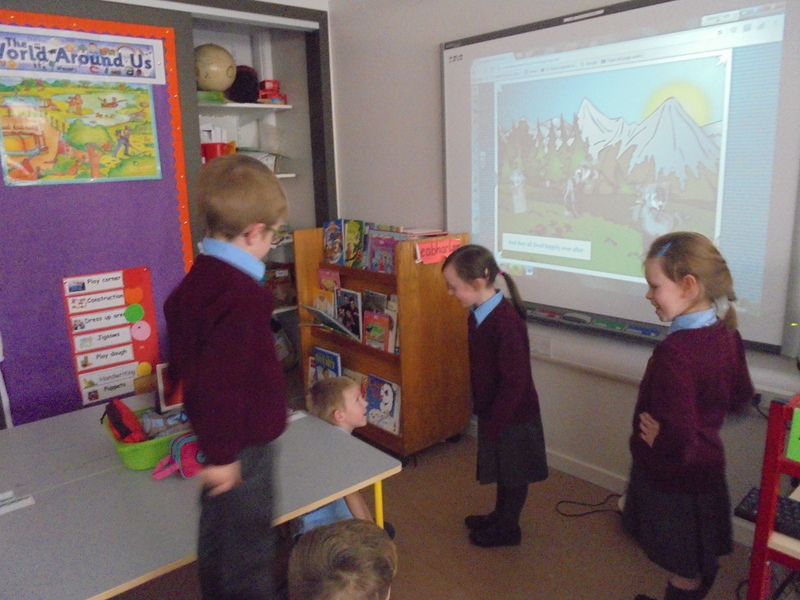 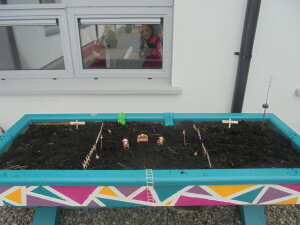 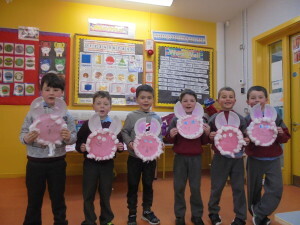 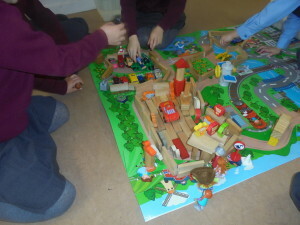 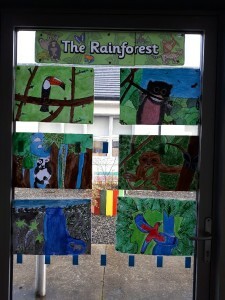 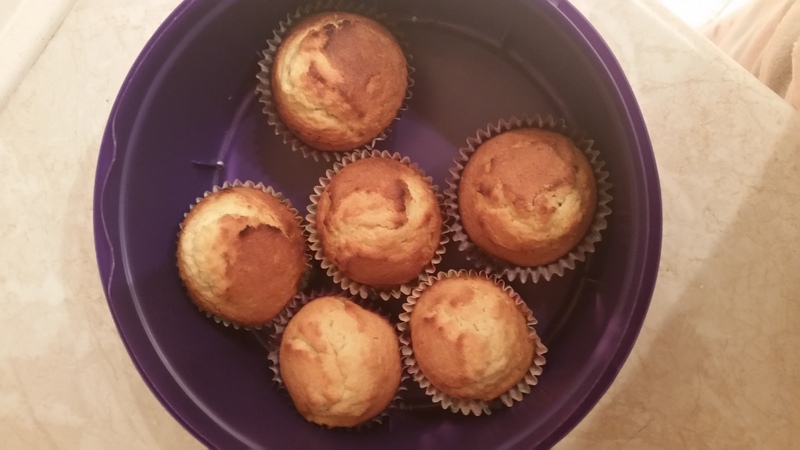 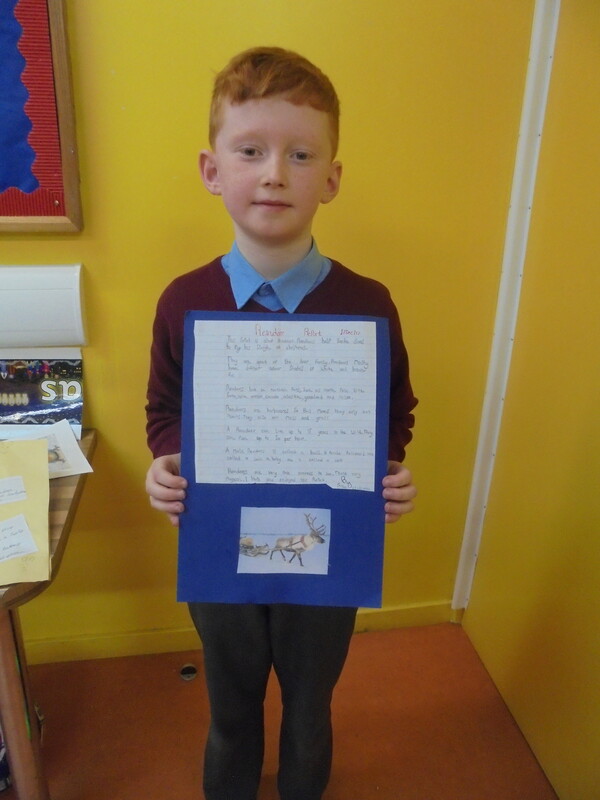 Ms Brogan’s Junior Infants theme for February Aistear was The Farm. 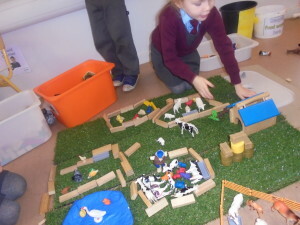 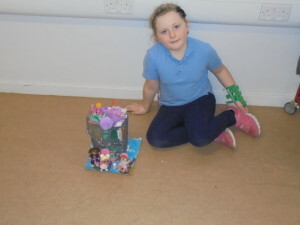 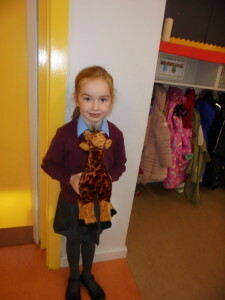 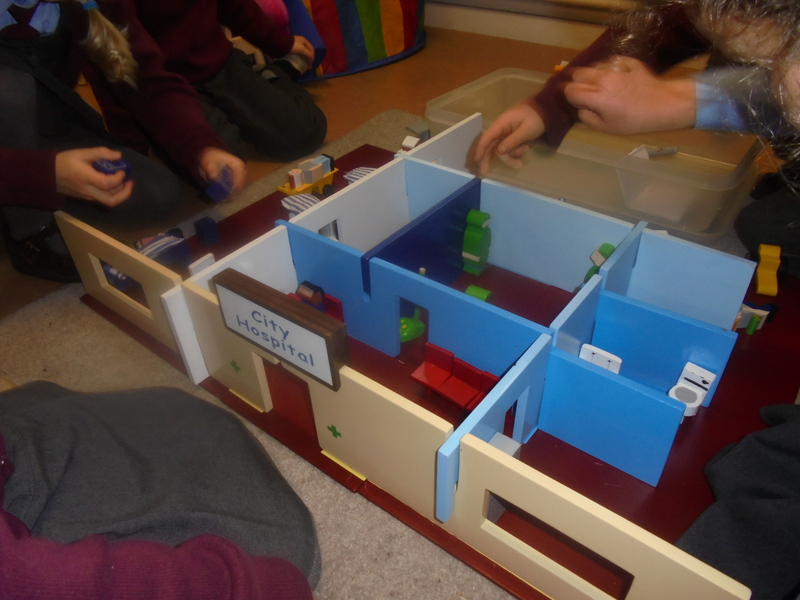 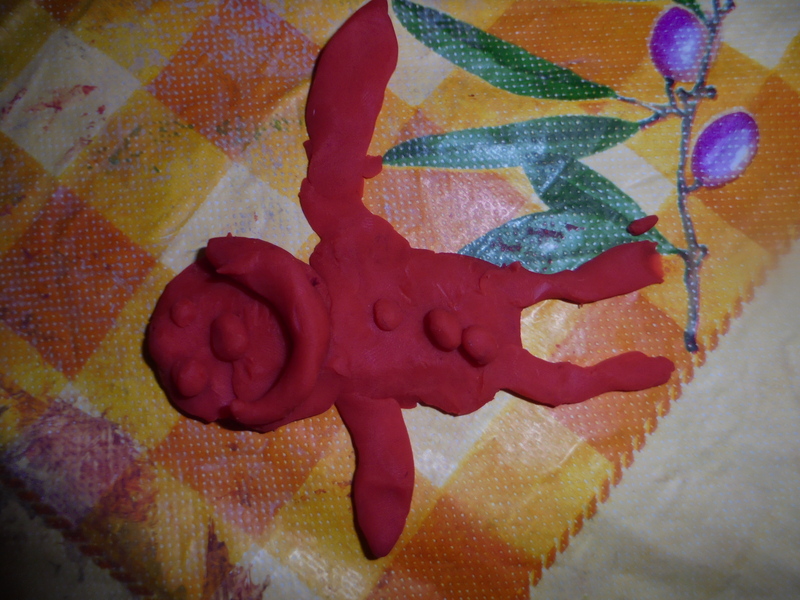 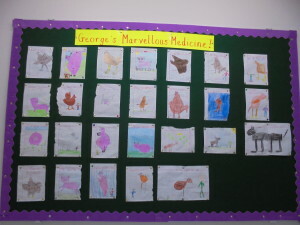 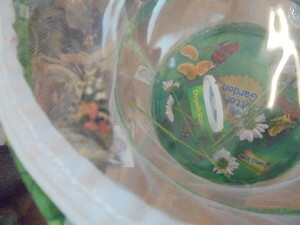 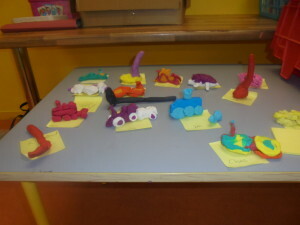 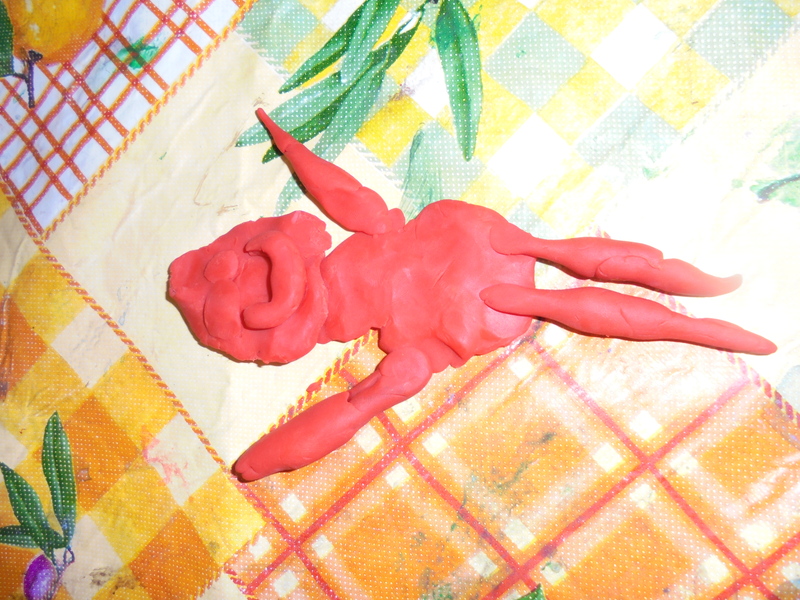 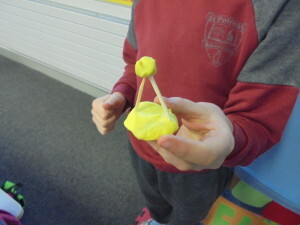 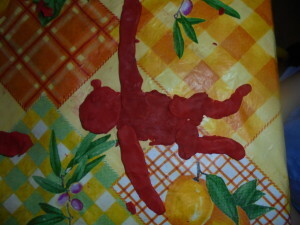 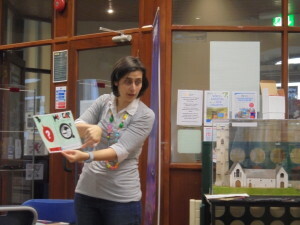 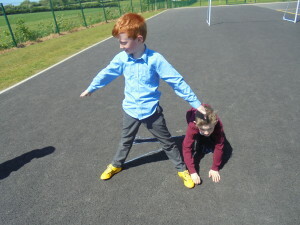 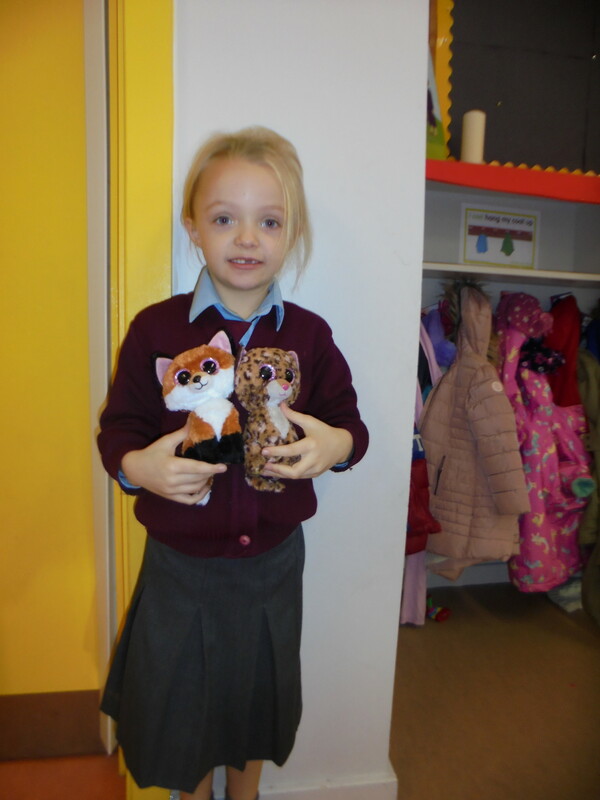 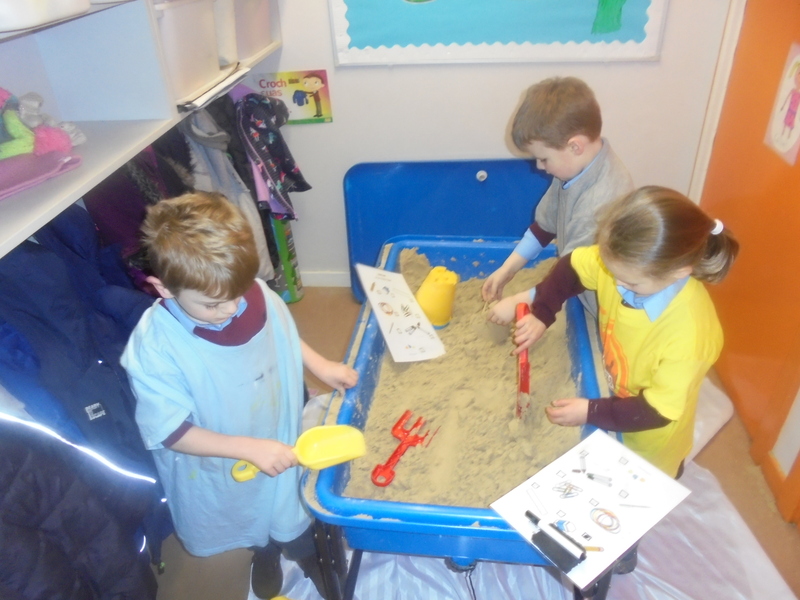 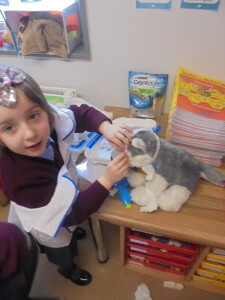 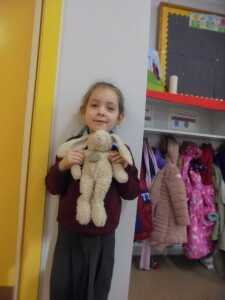 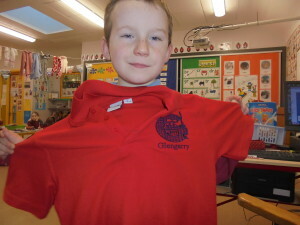 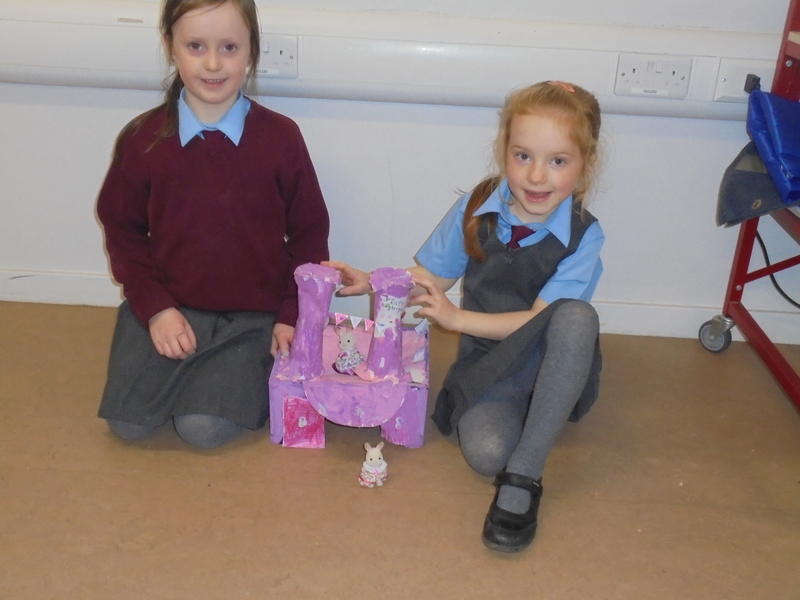 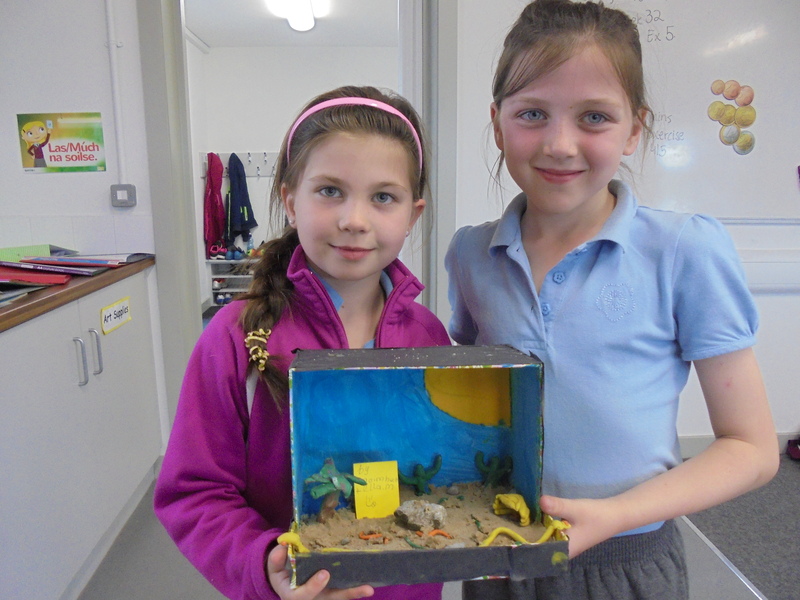 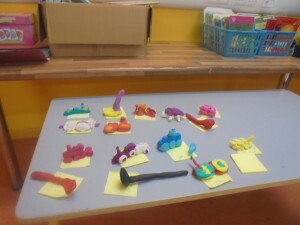 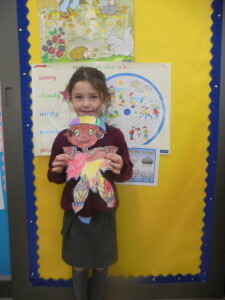 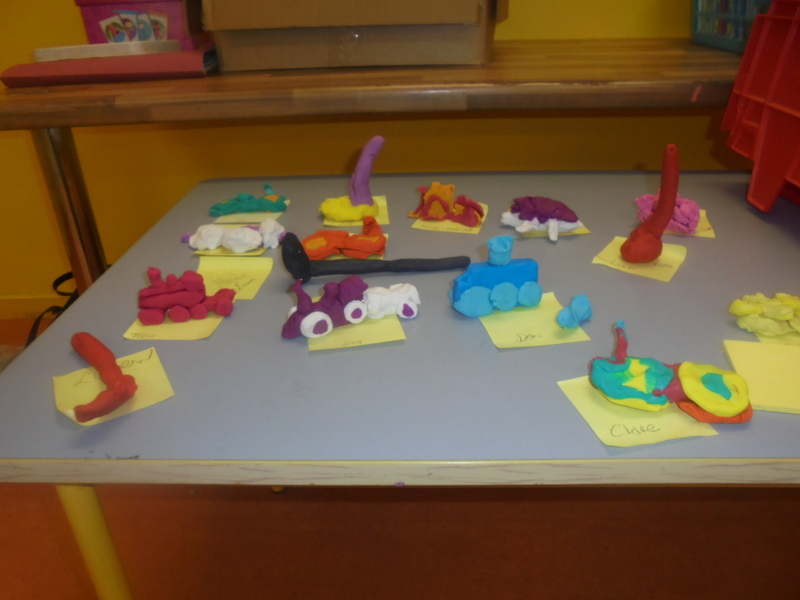 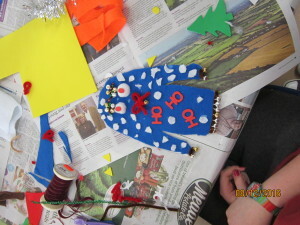 The children enjoyed making animals out of play dough, role playing as vets and playing with “small world” farms. 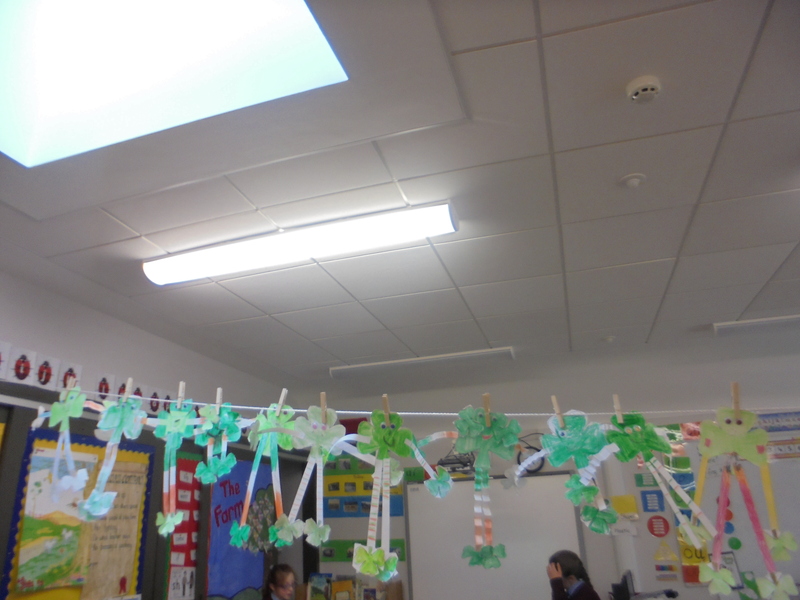 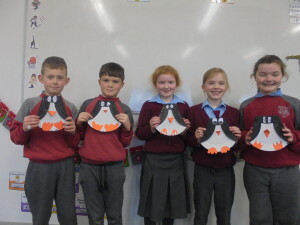 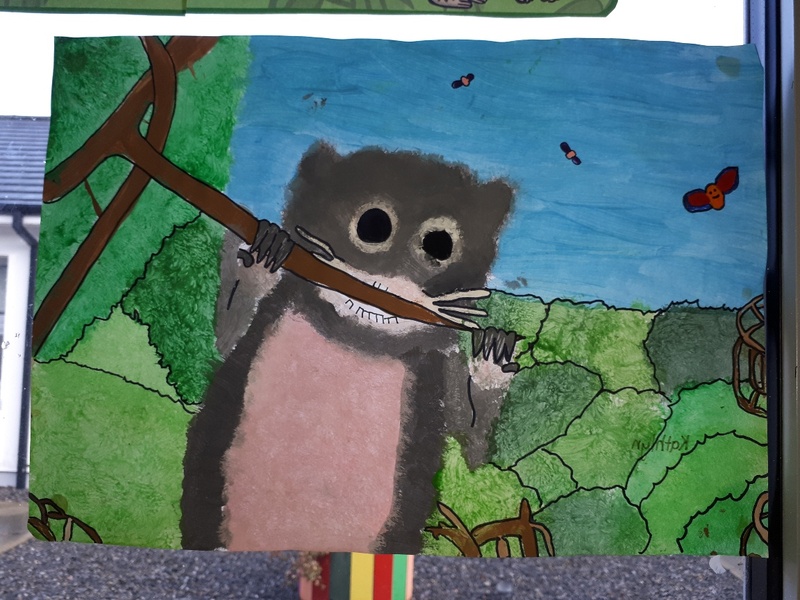 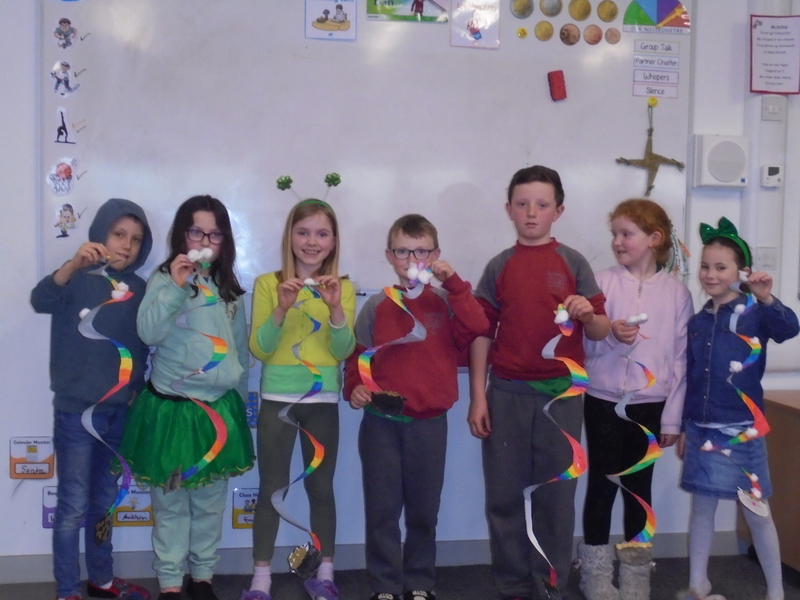 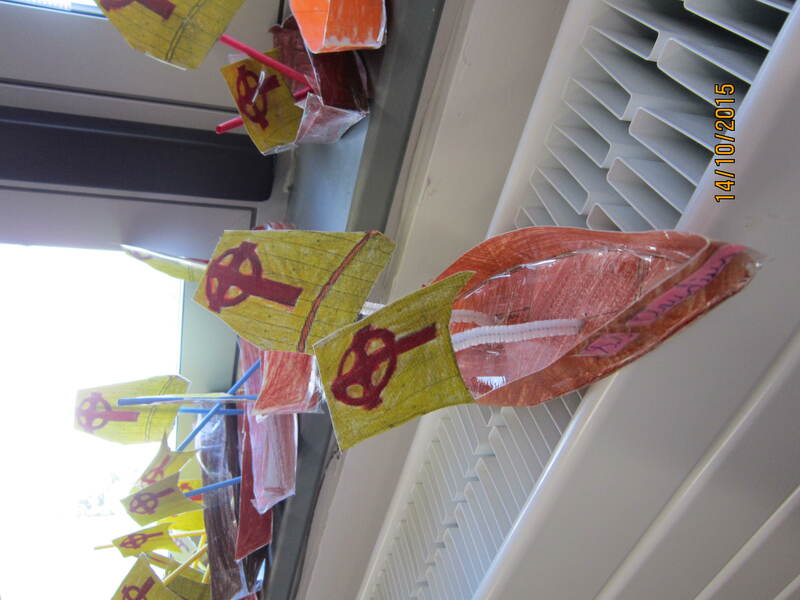 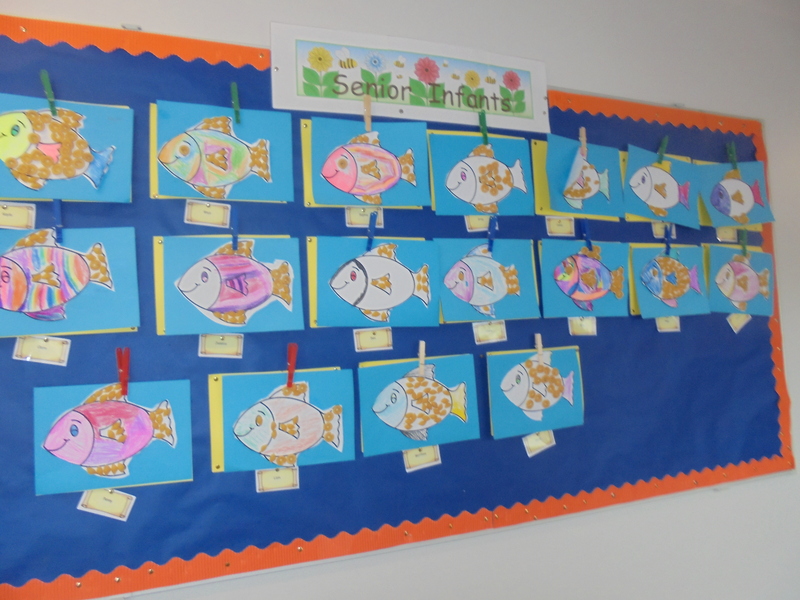 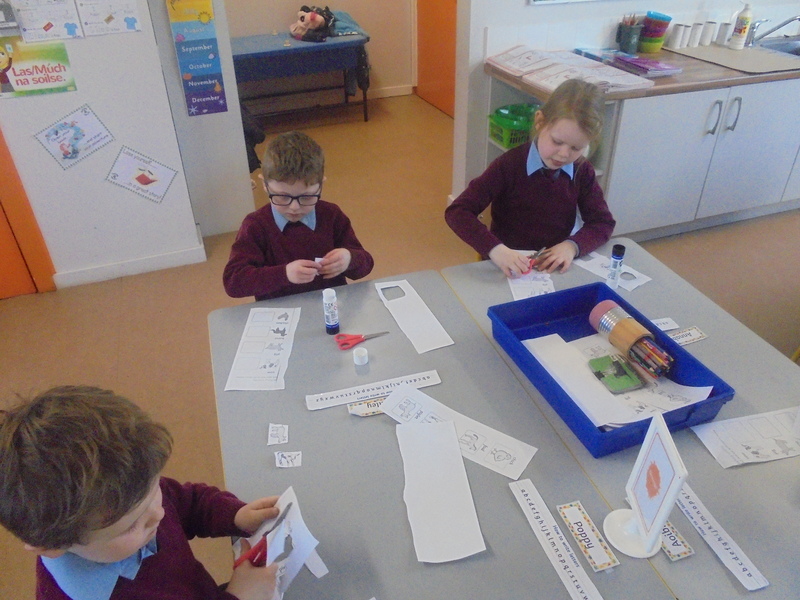 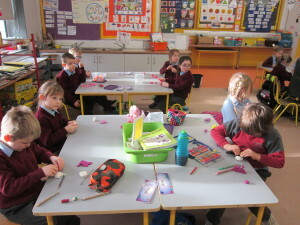 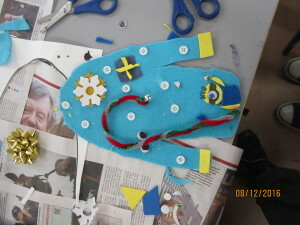 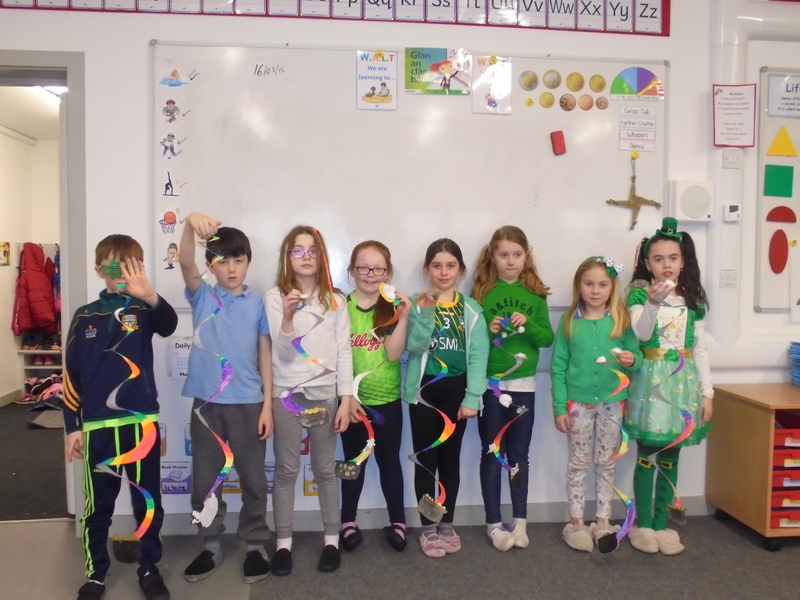 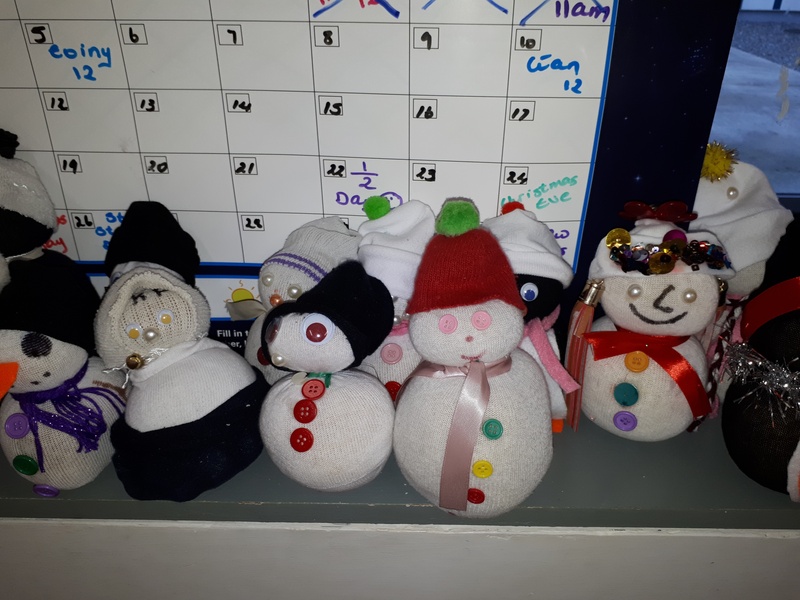 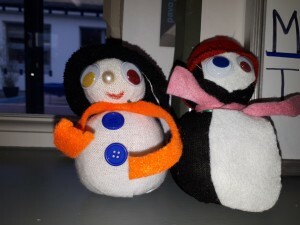 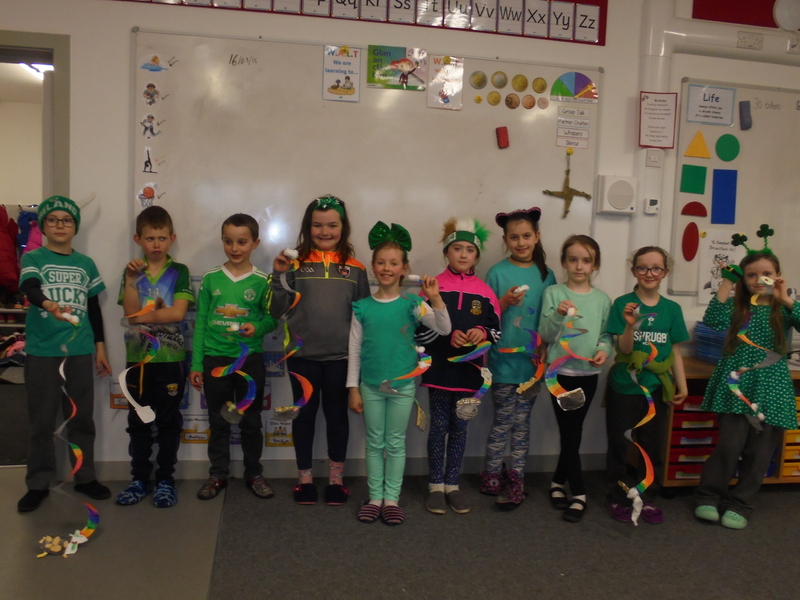 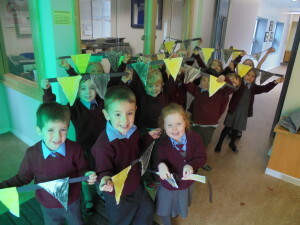 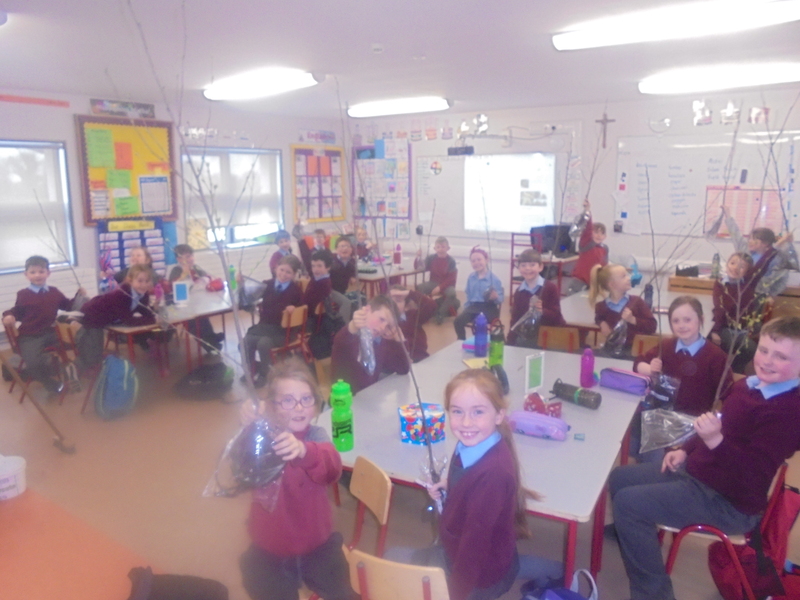 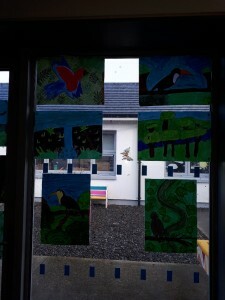 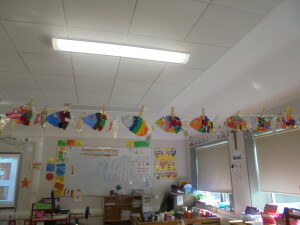 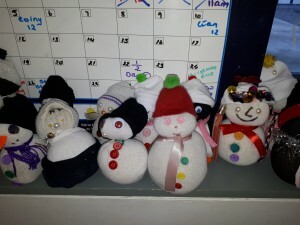 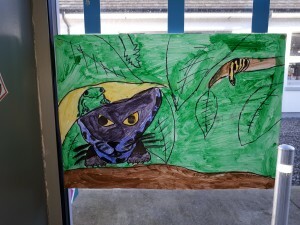 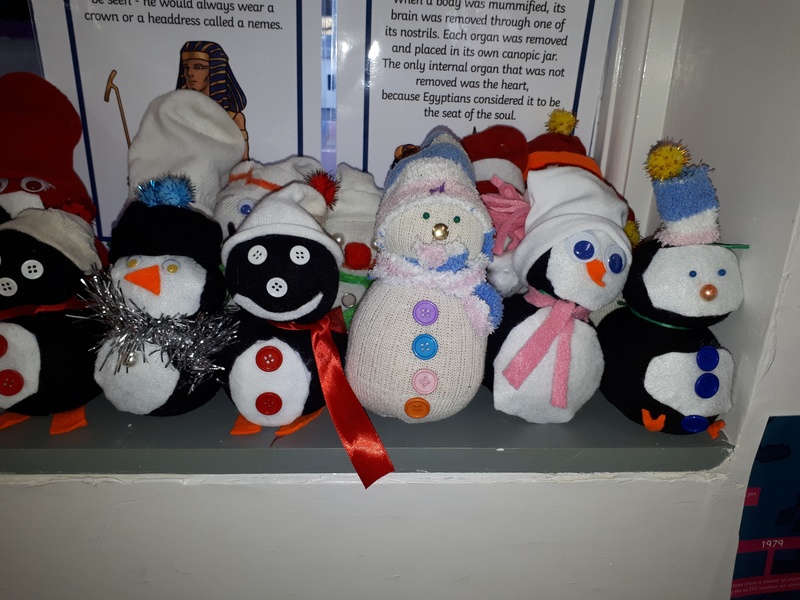 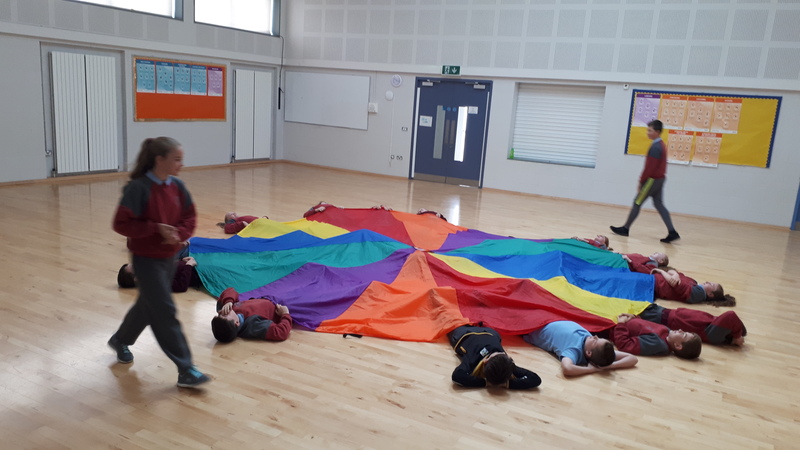 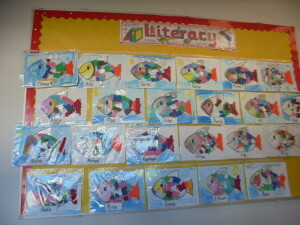 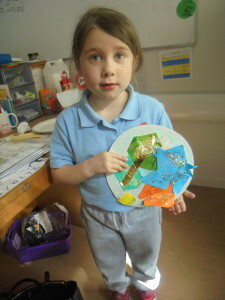 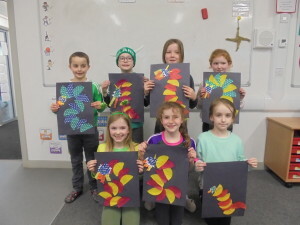 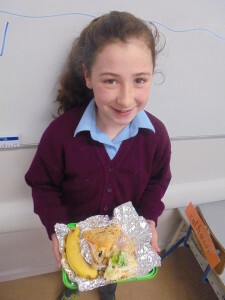 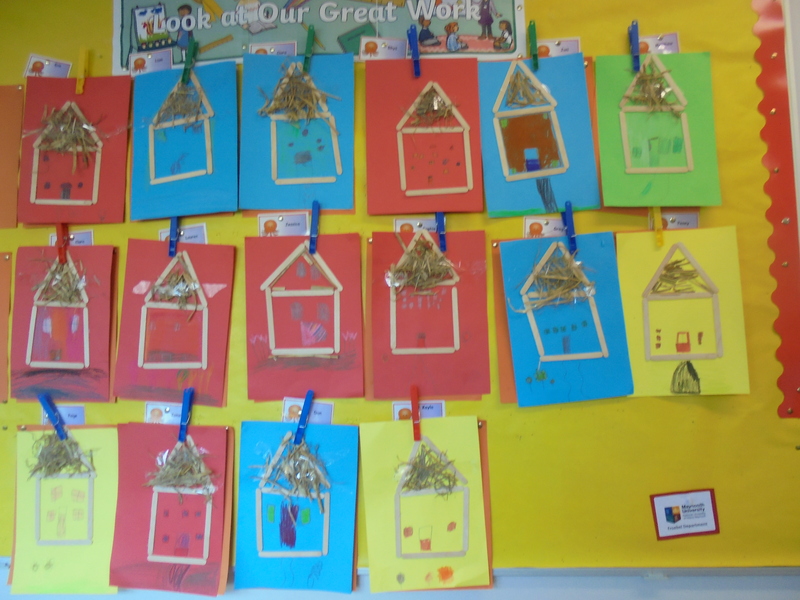 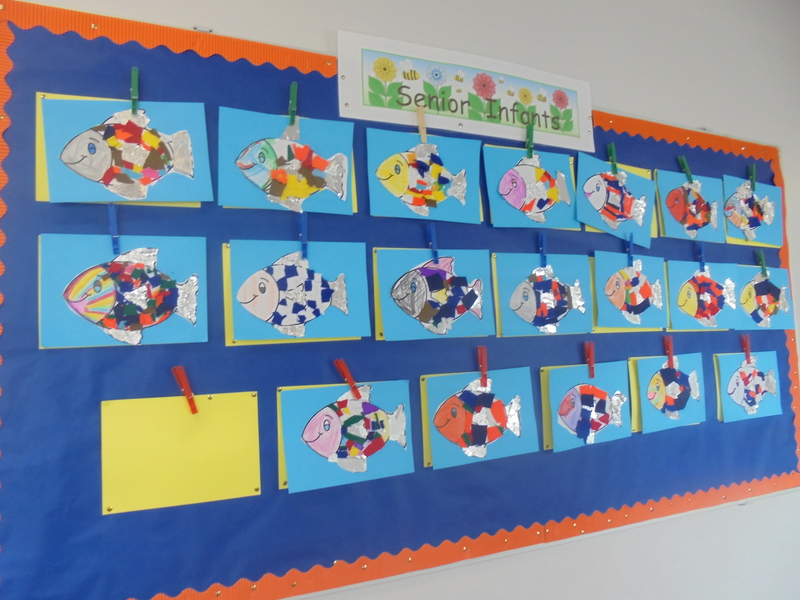 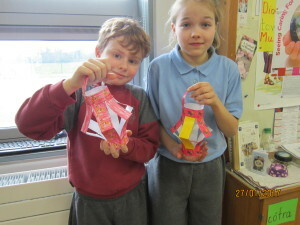 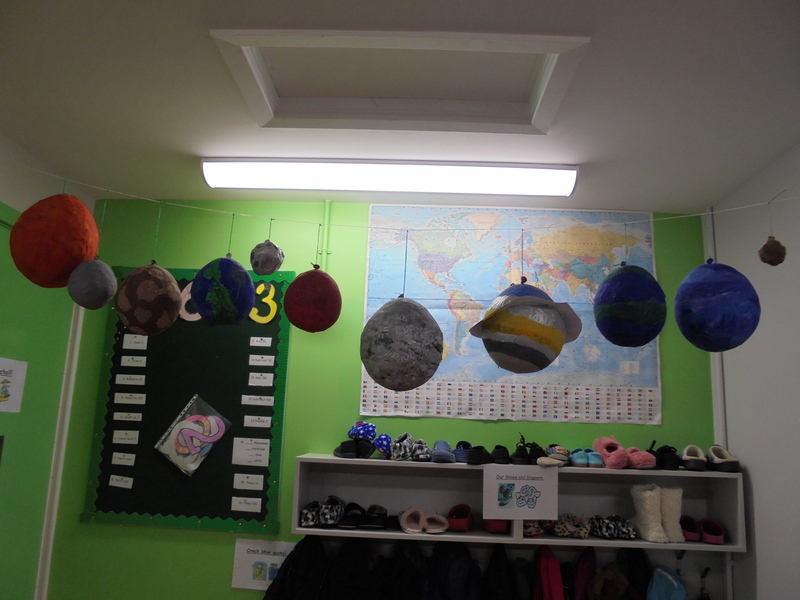 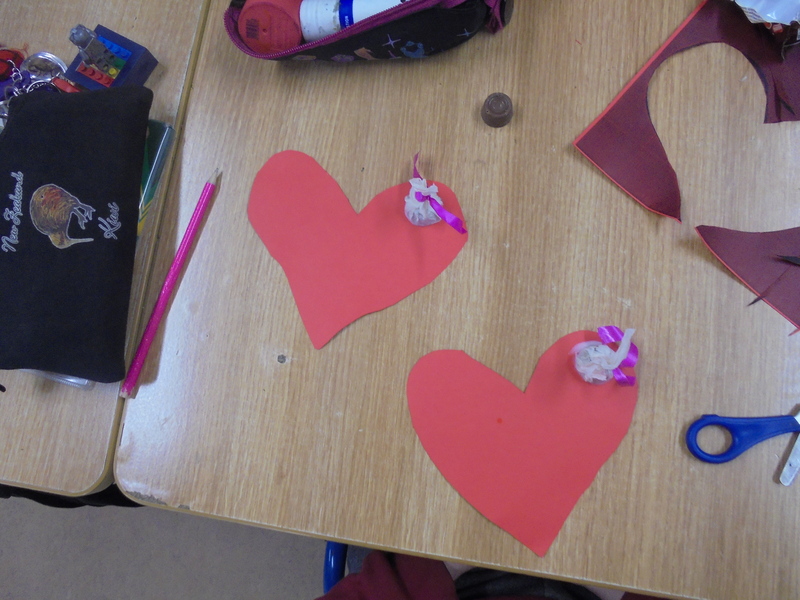 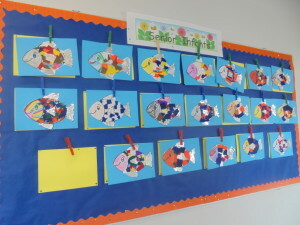 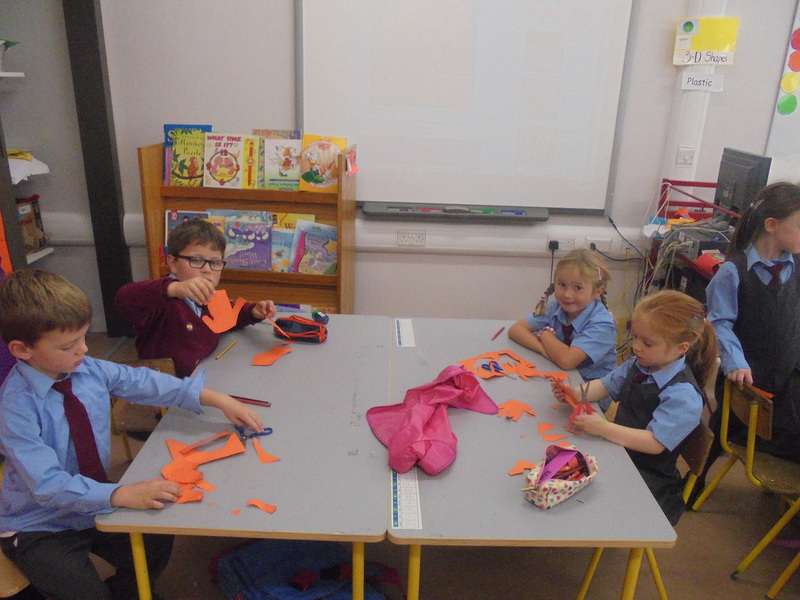 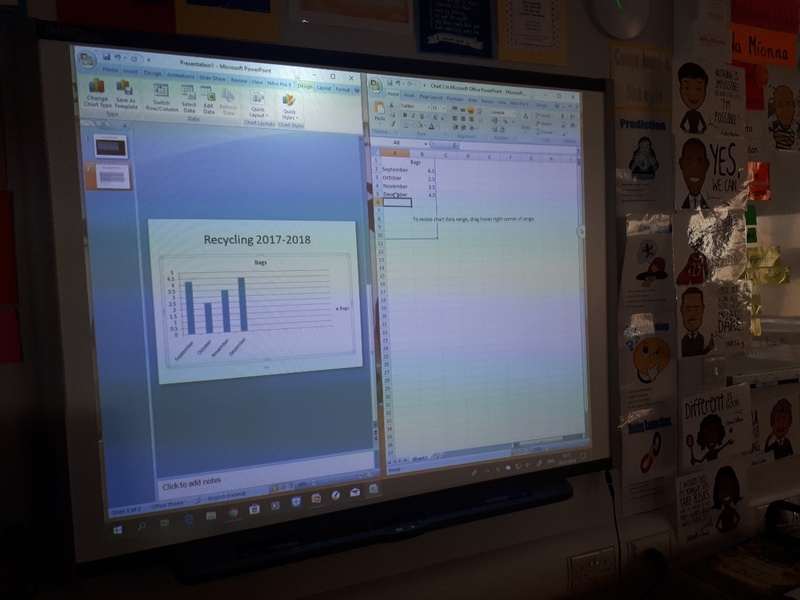 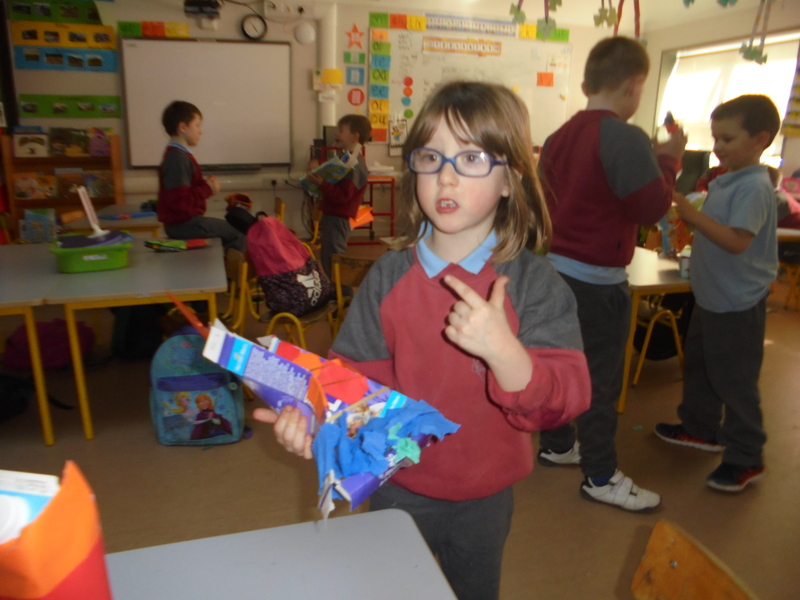 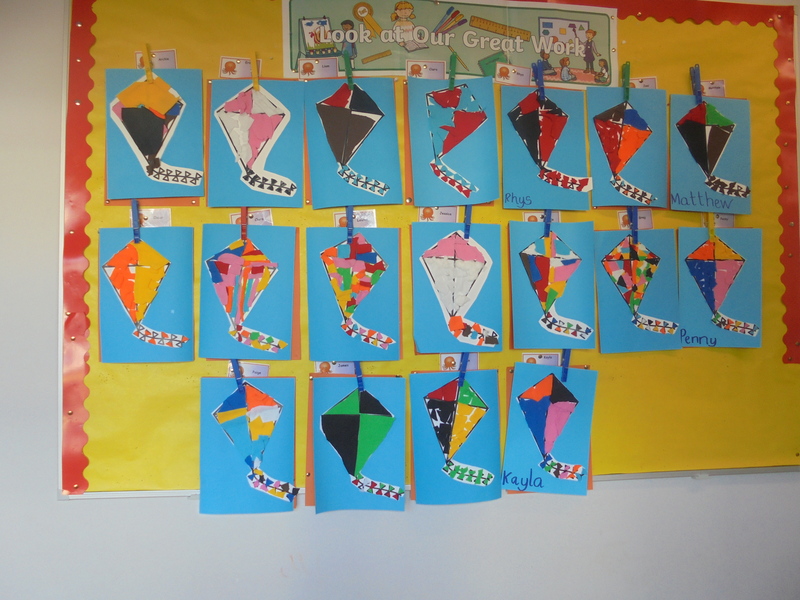 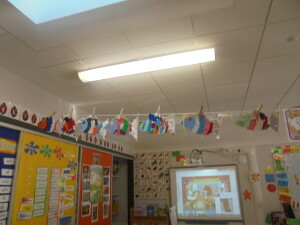 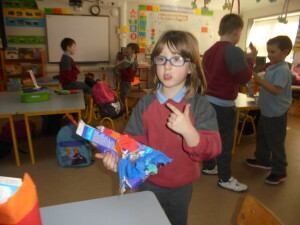 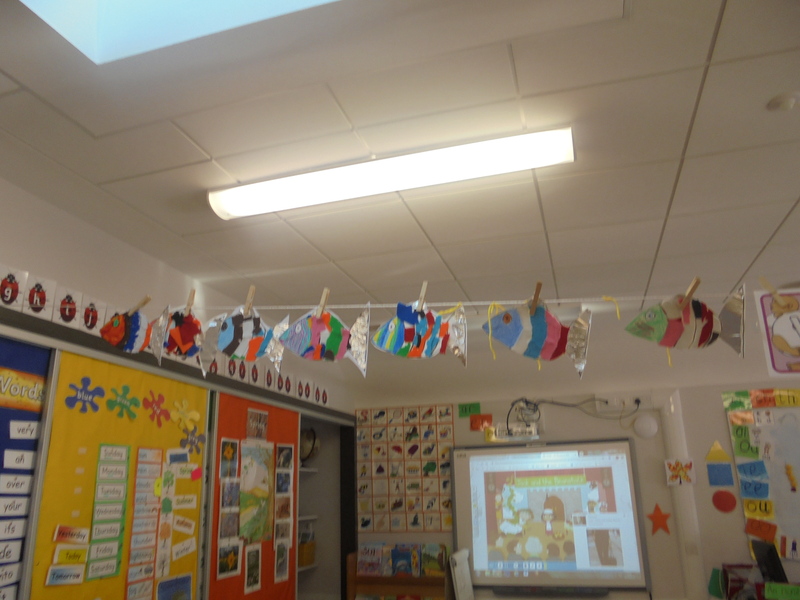 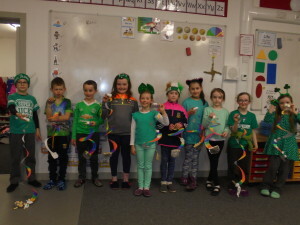 Ms Ward’s Senior Infants made fish and kites from felt and tinfoil (Feb 2019). 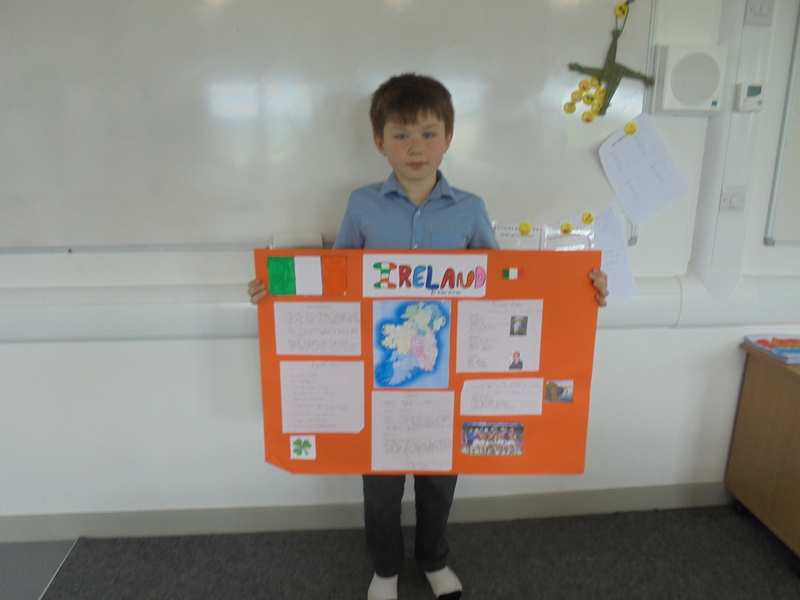 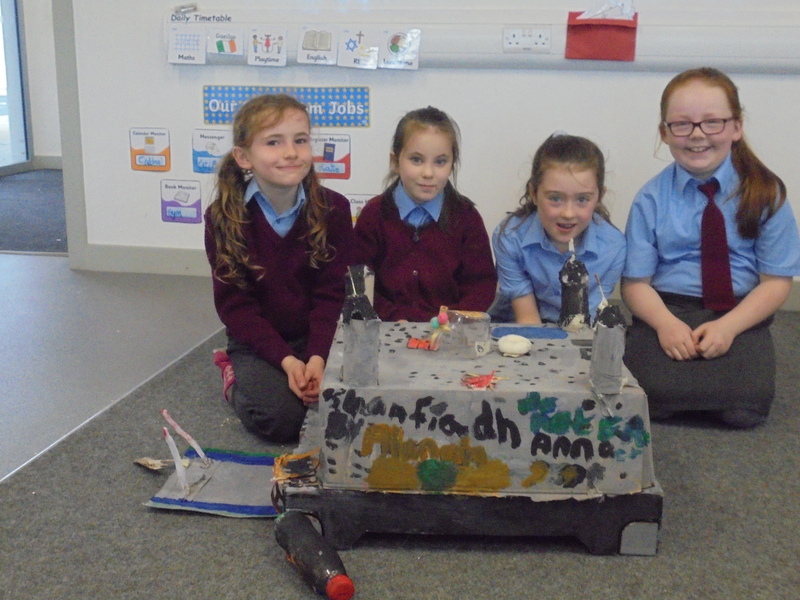 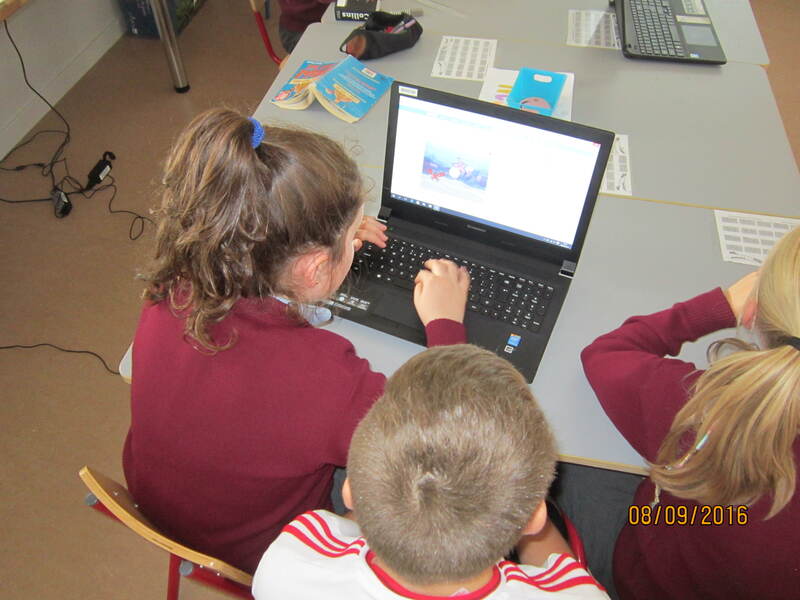 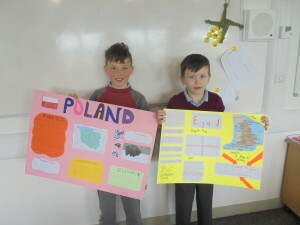 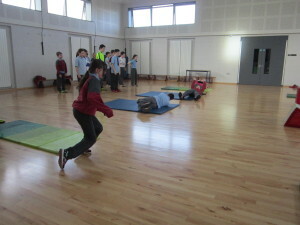 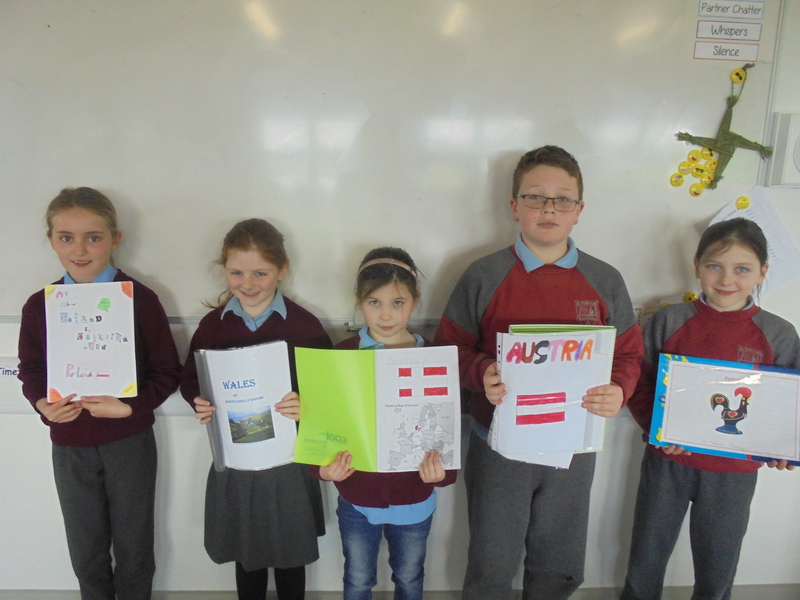 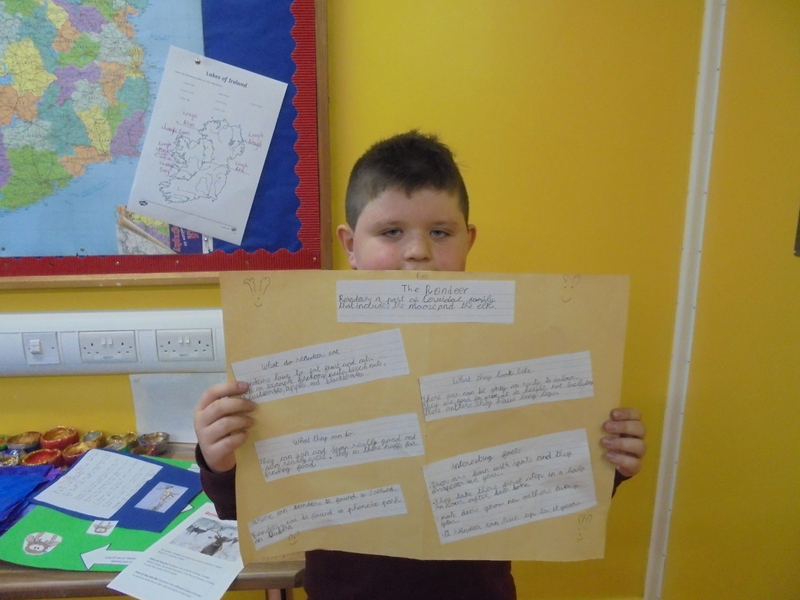 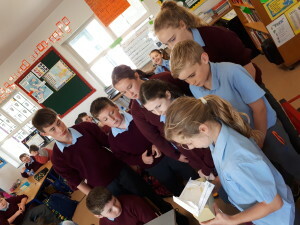 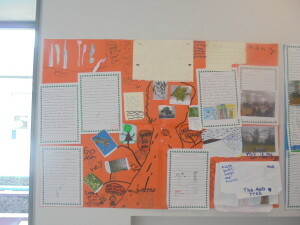 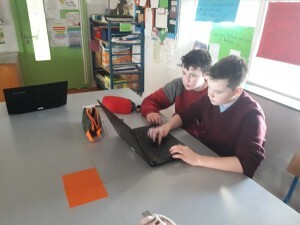 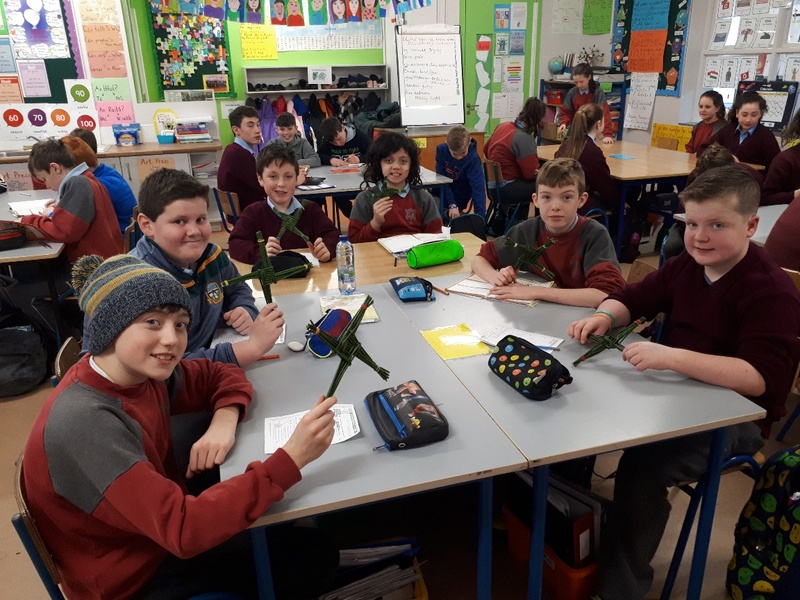 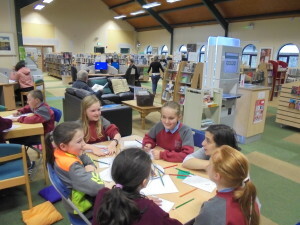 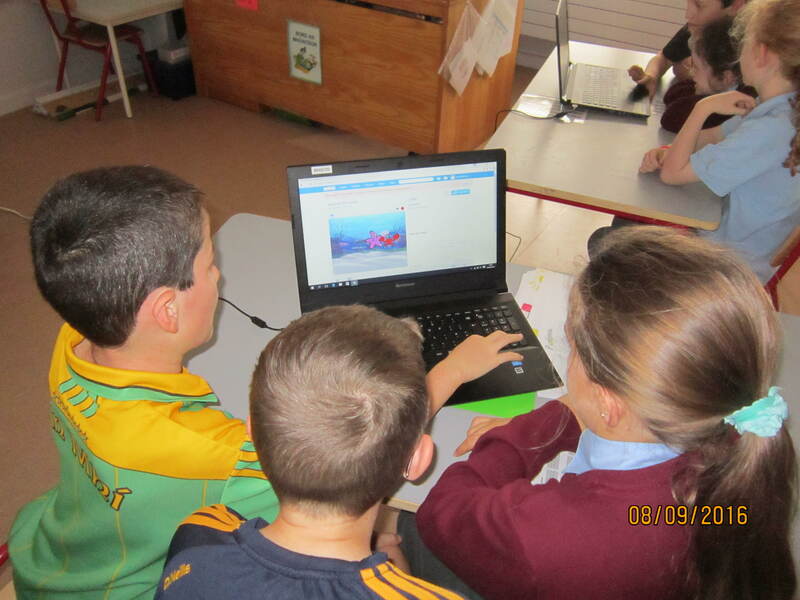 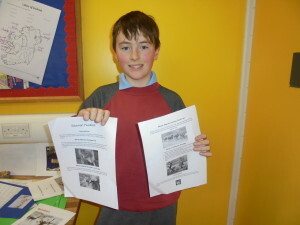 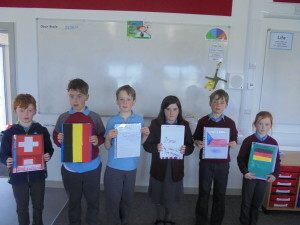 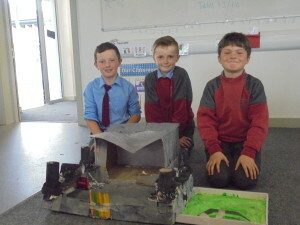 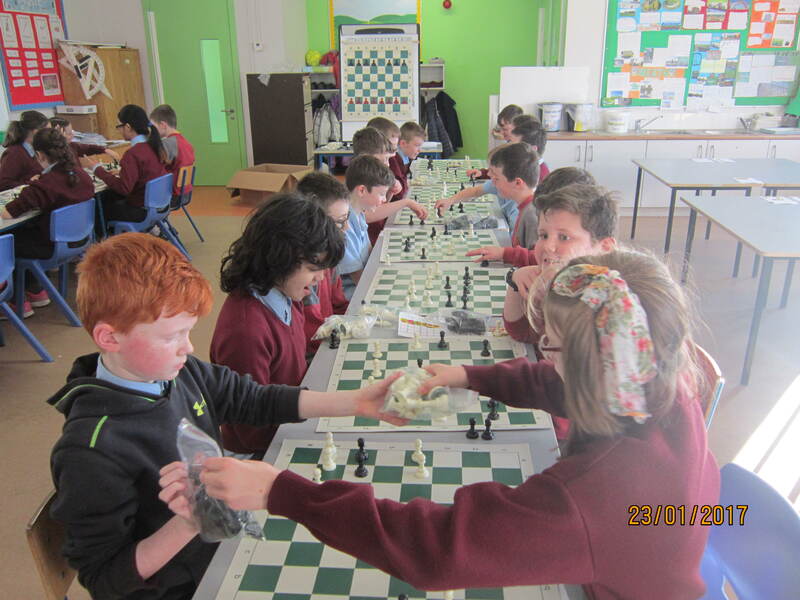 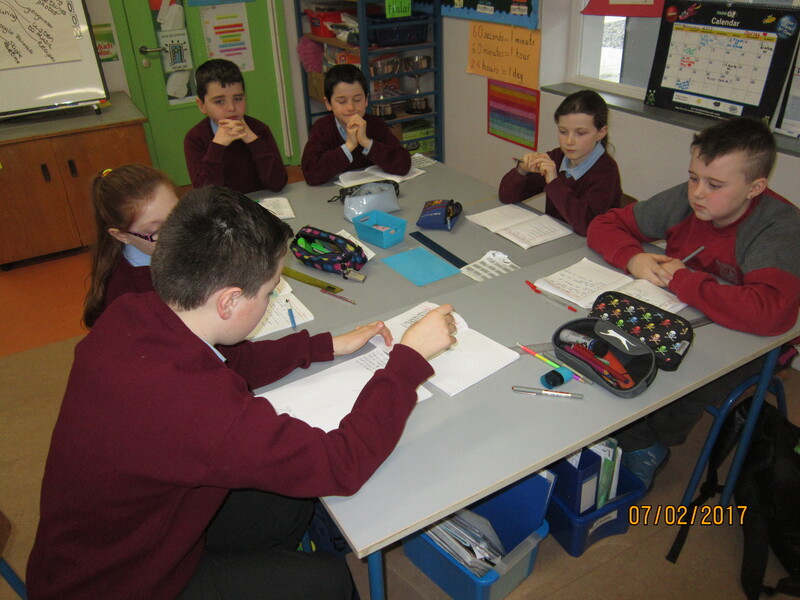 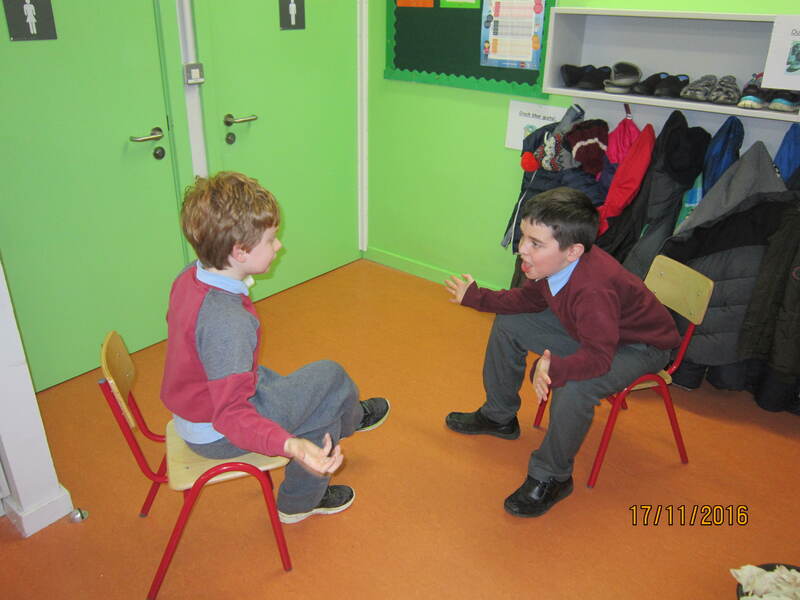 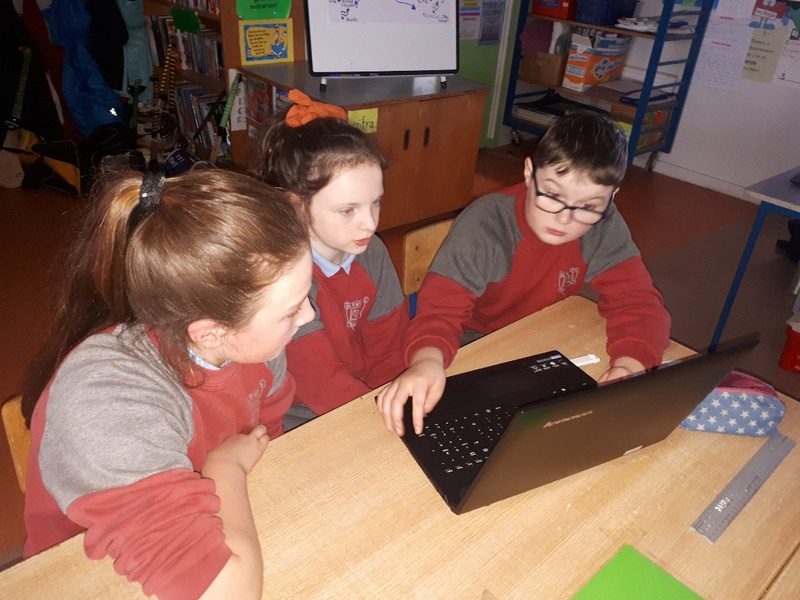 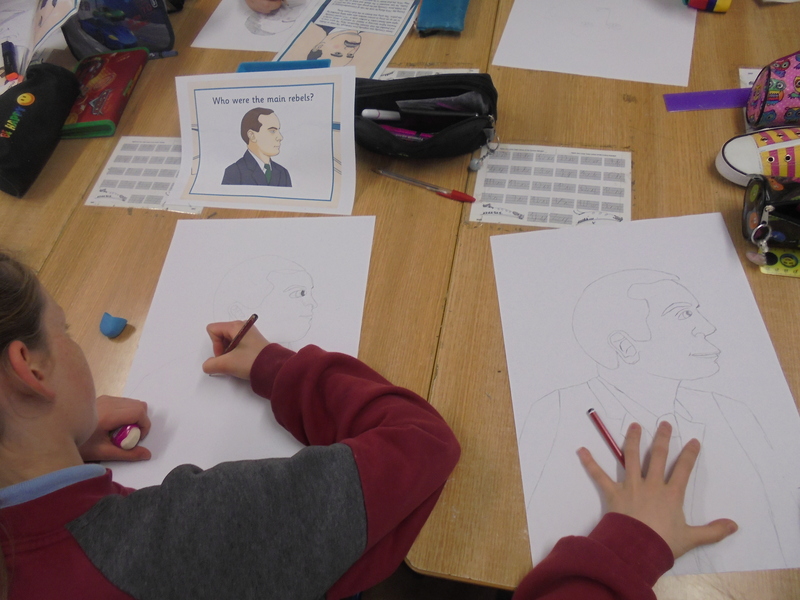 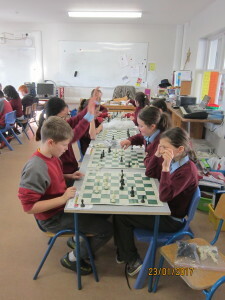 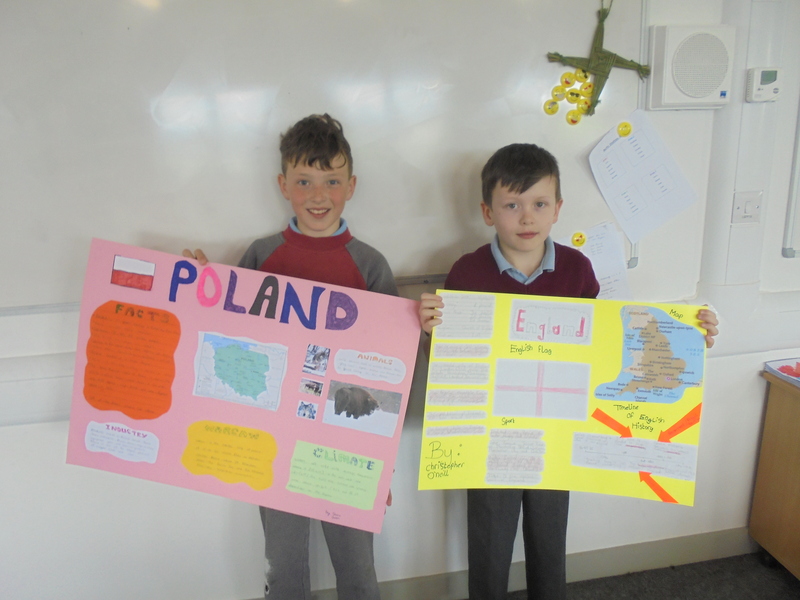 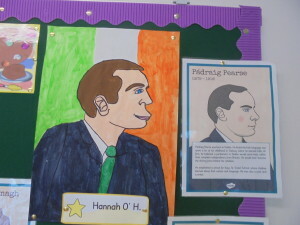 Ms Murphy’s 6th class began learning about World War 2. 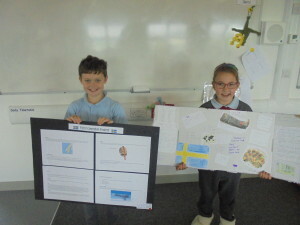 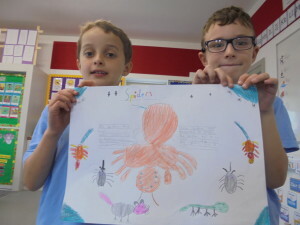 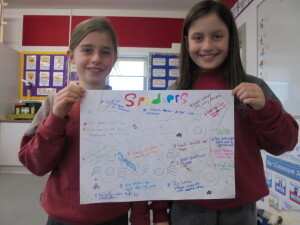 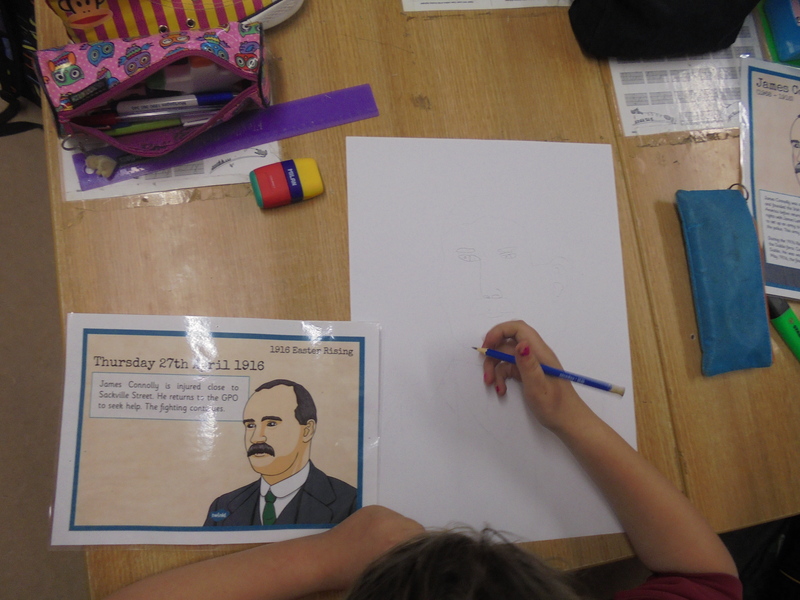 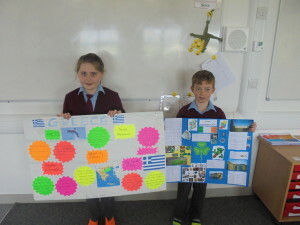 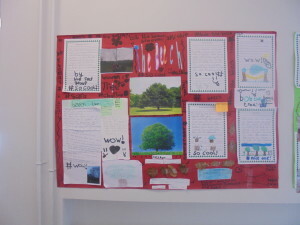 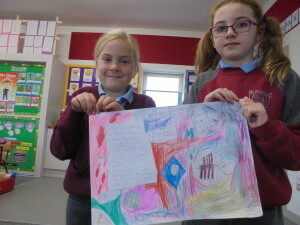 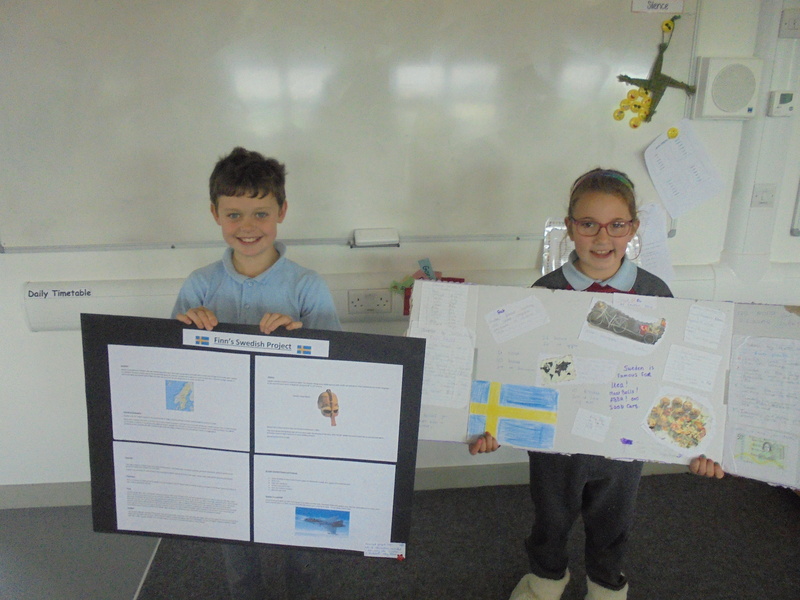 Using their new knowledge about propaganda, they designed and created their own WW2 propaganda posters. 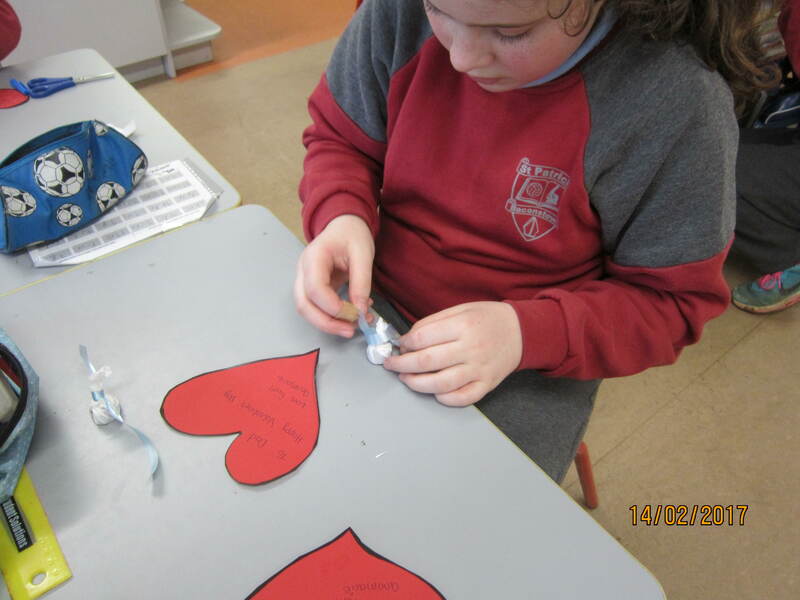 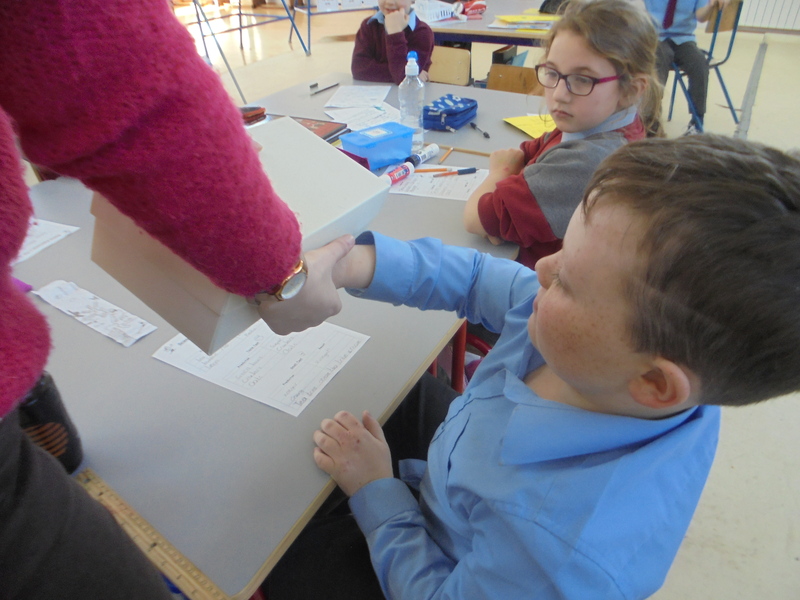 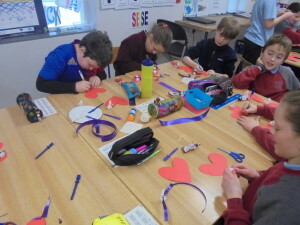 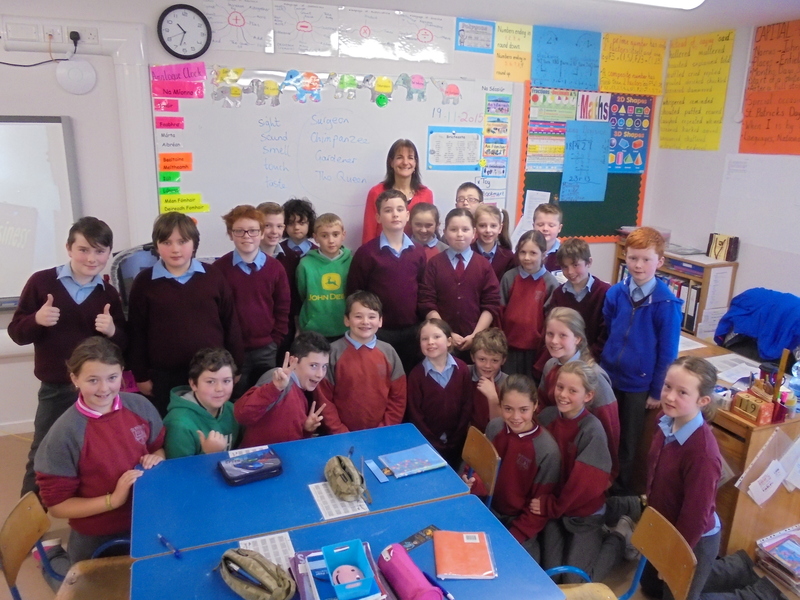 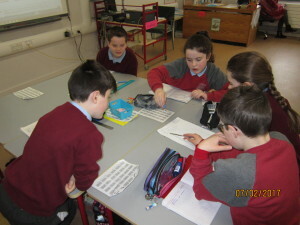 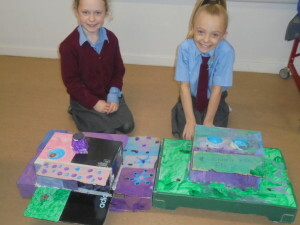 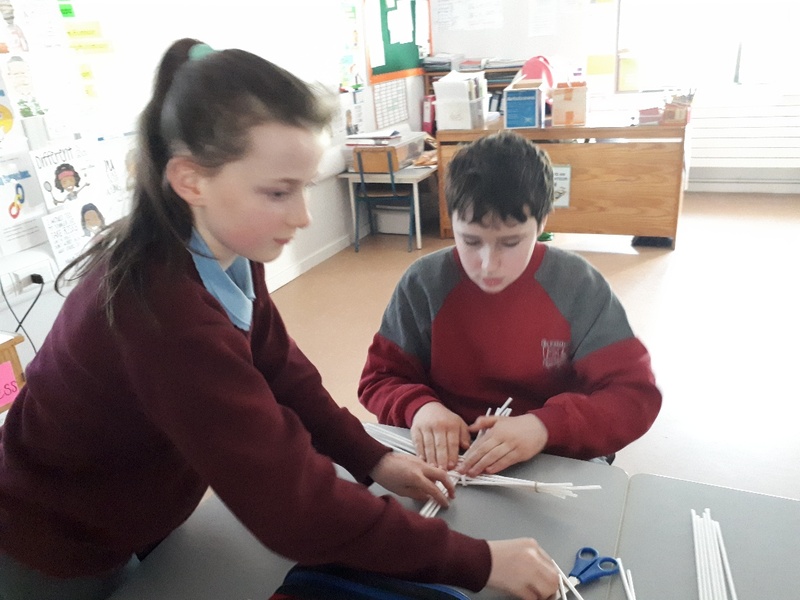 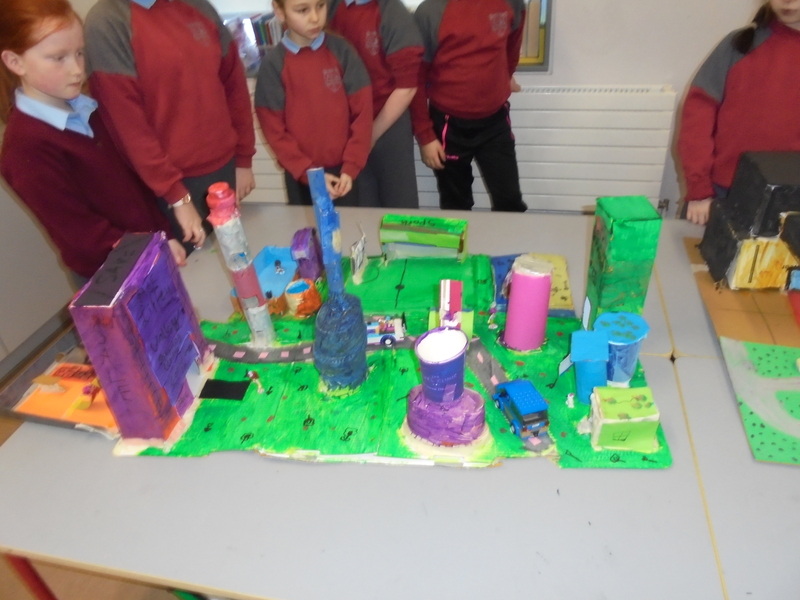 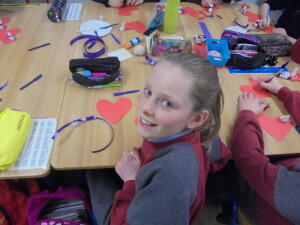 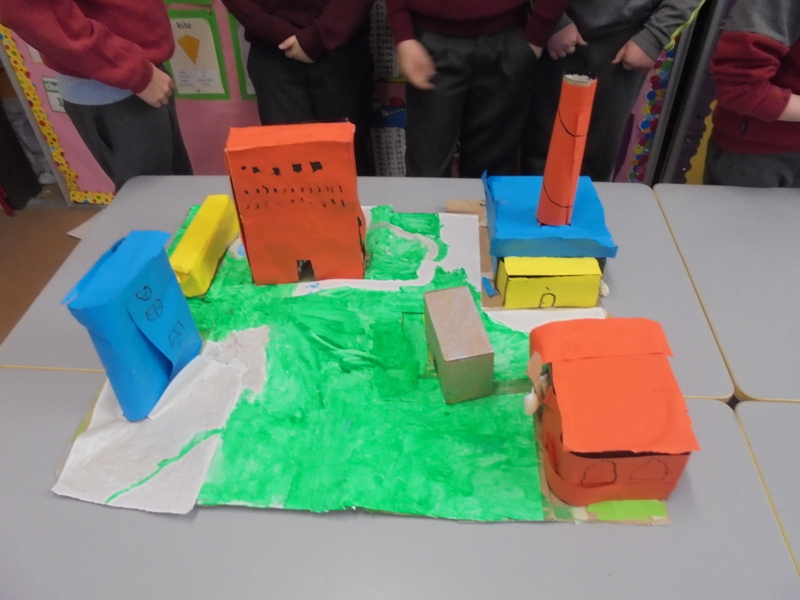 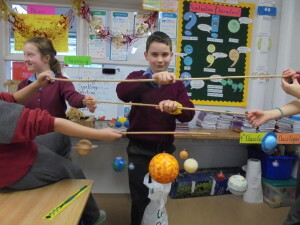 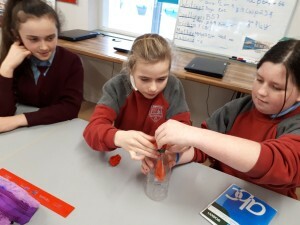 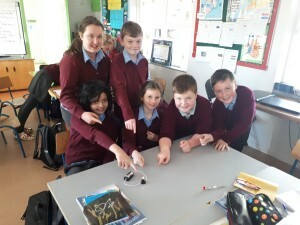 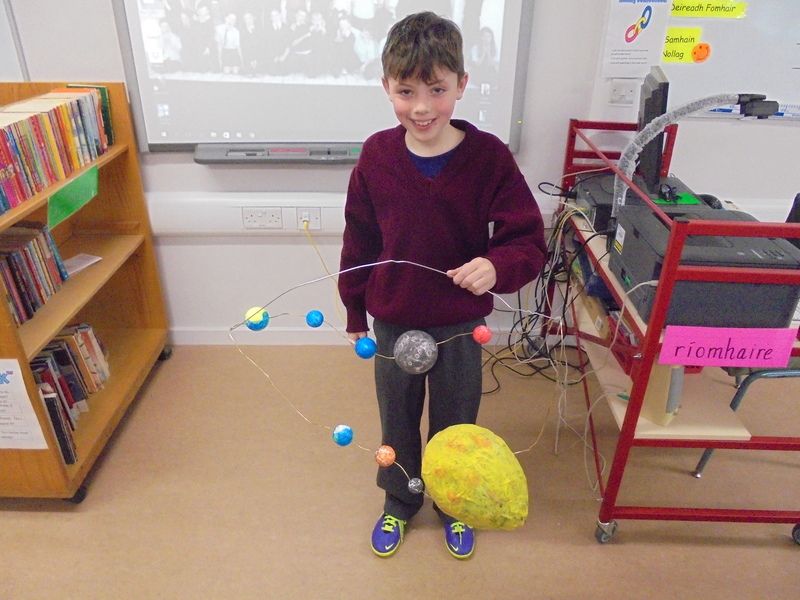 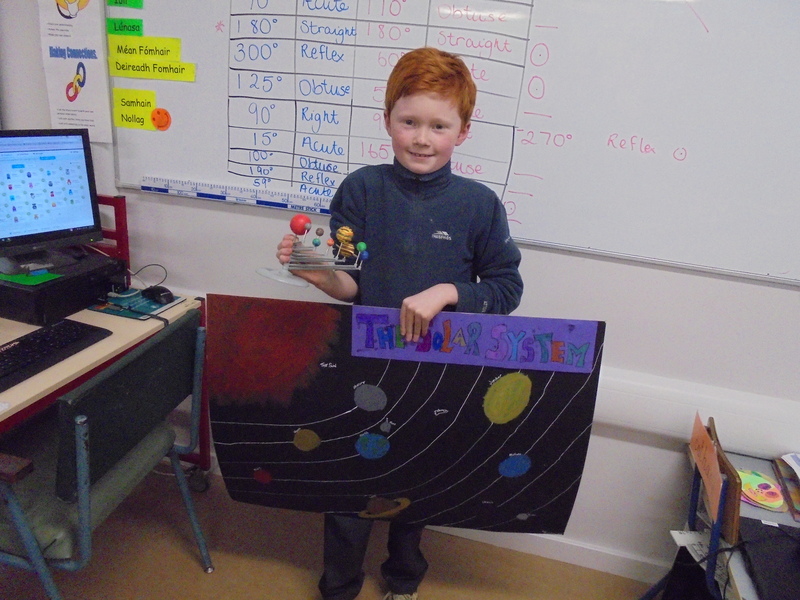 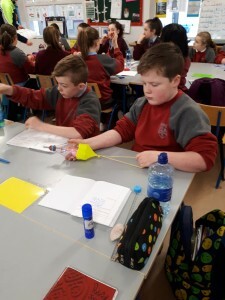 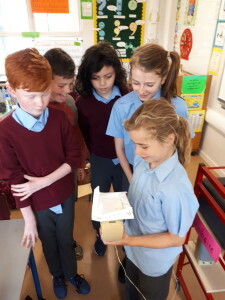 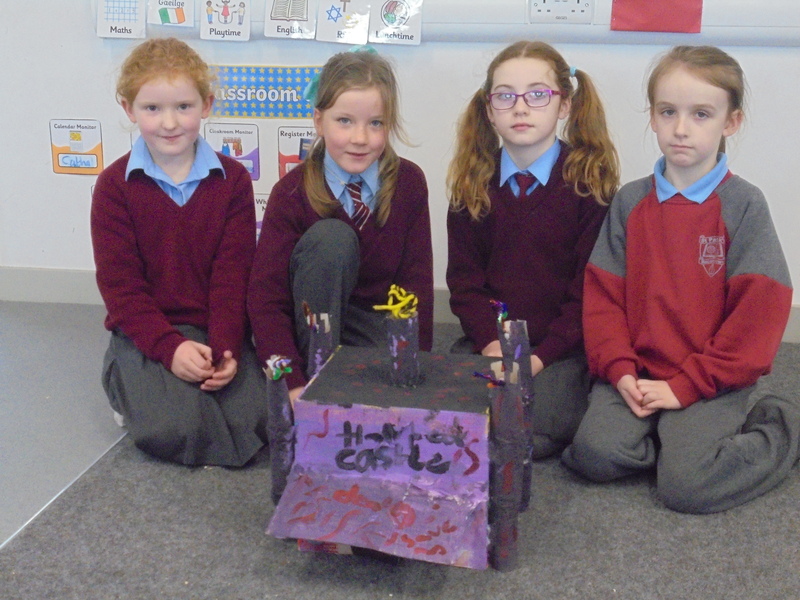 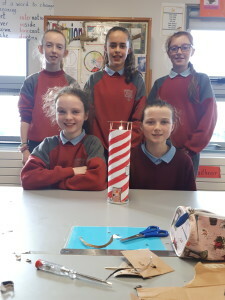 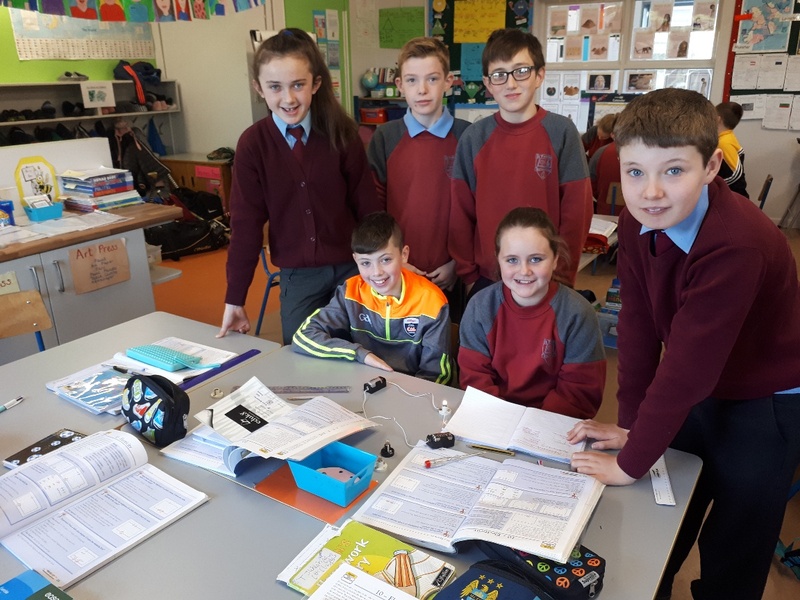 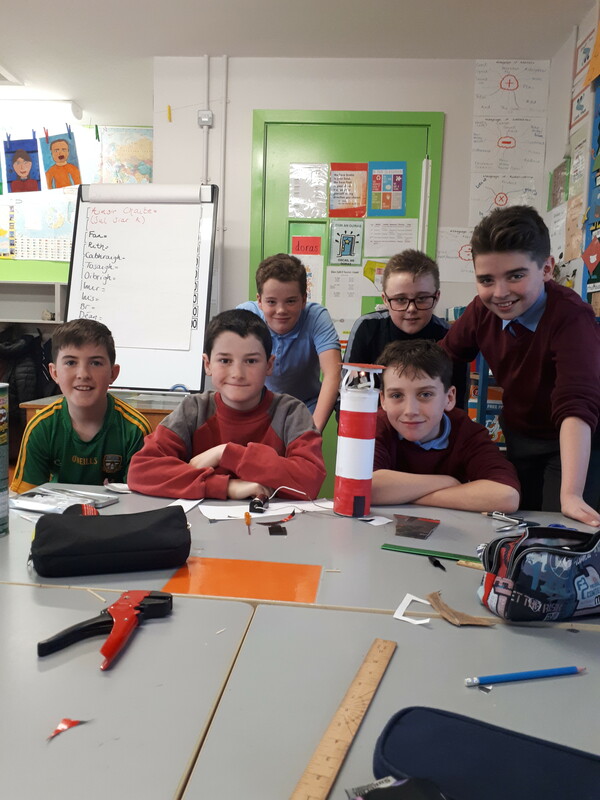 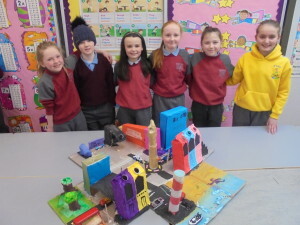 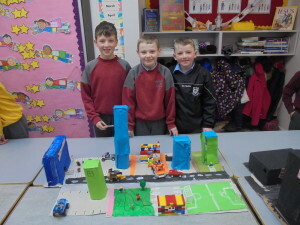 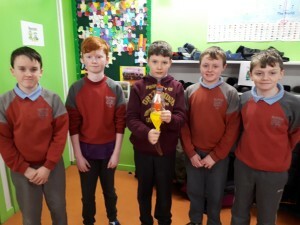 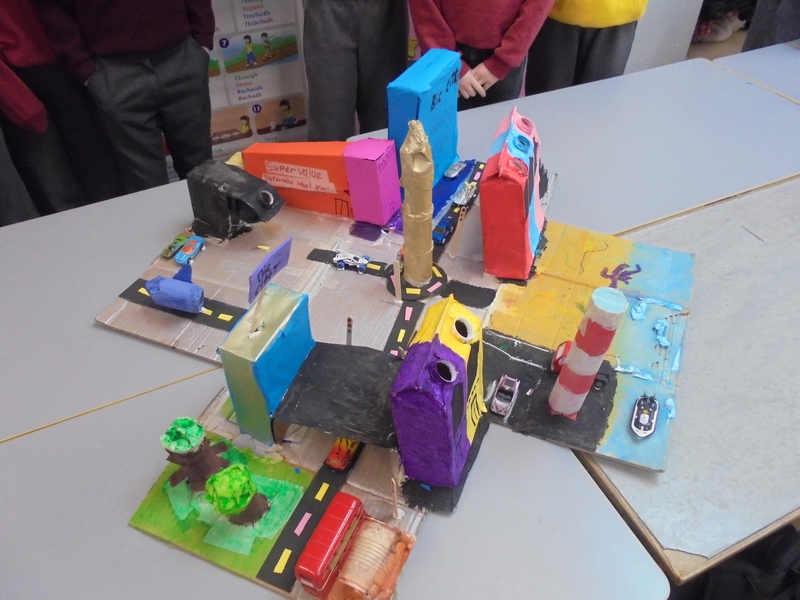 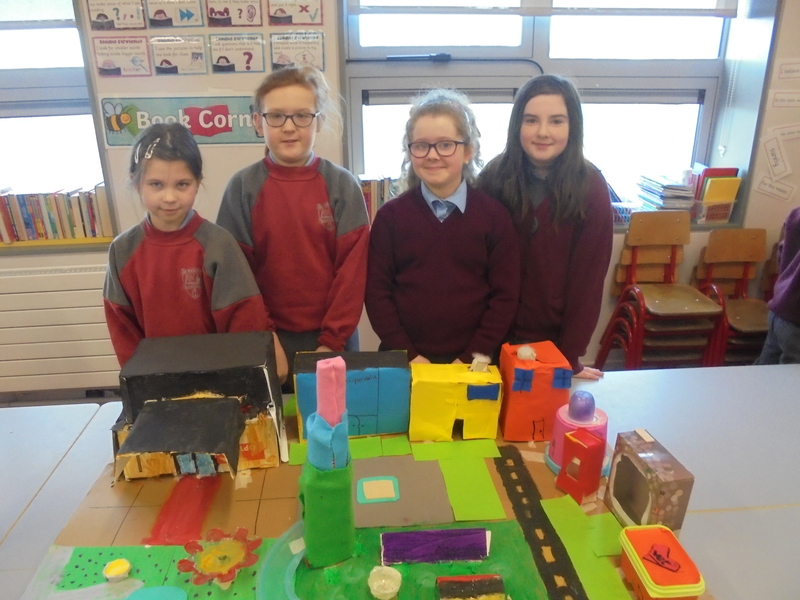 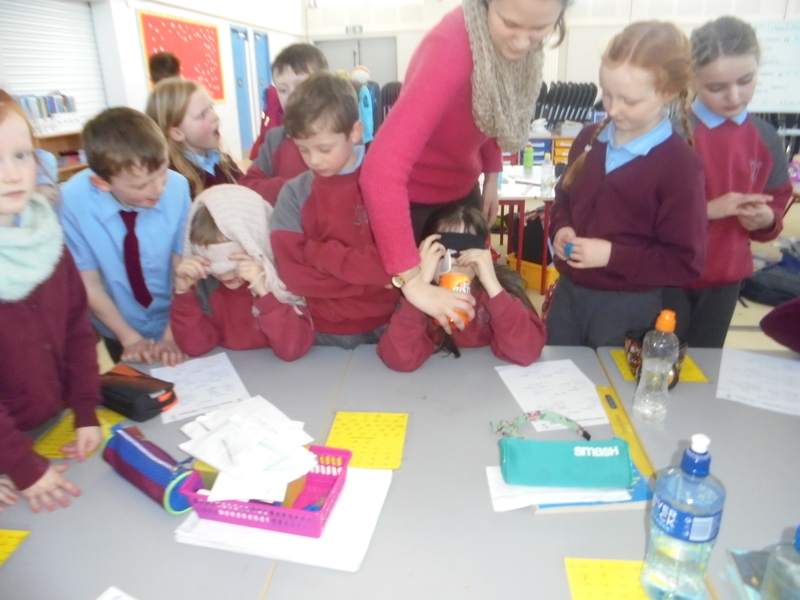 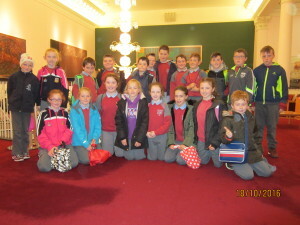 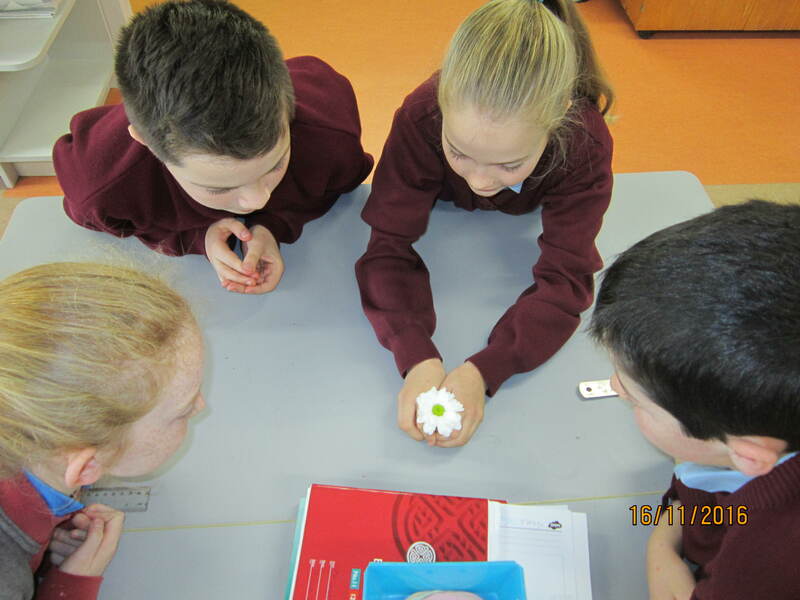 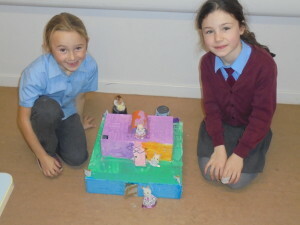 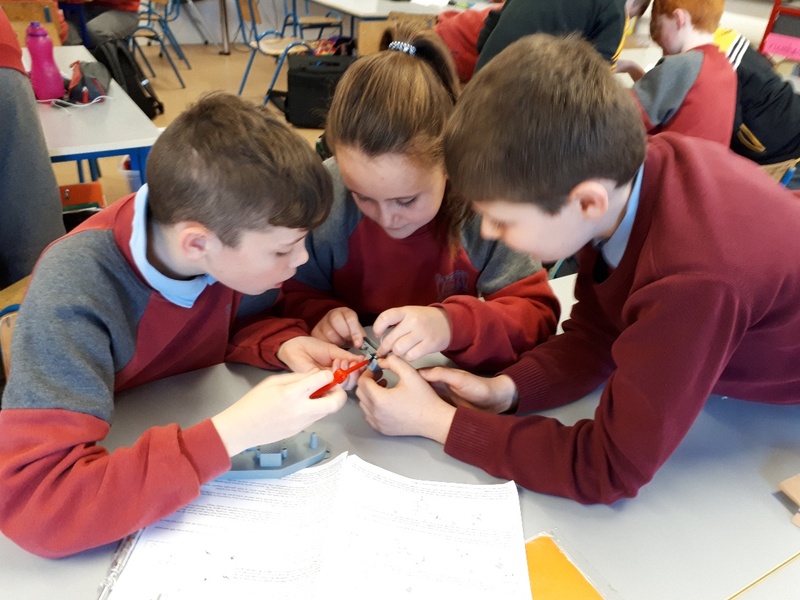 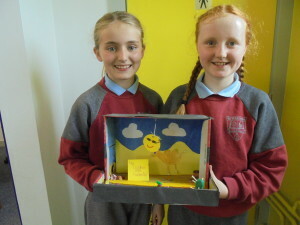 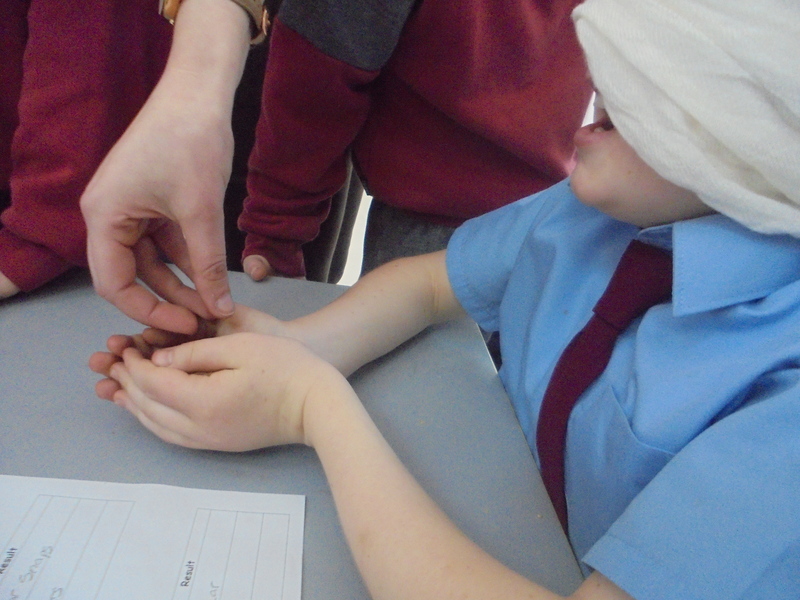 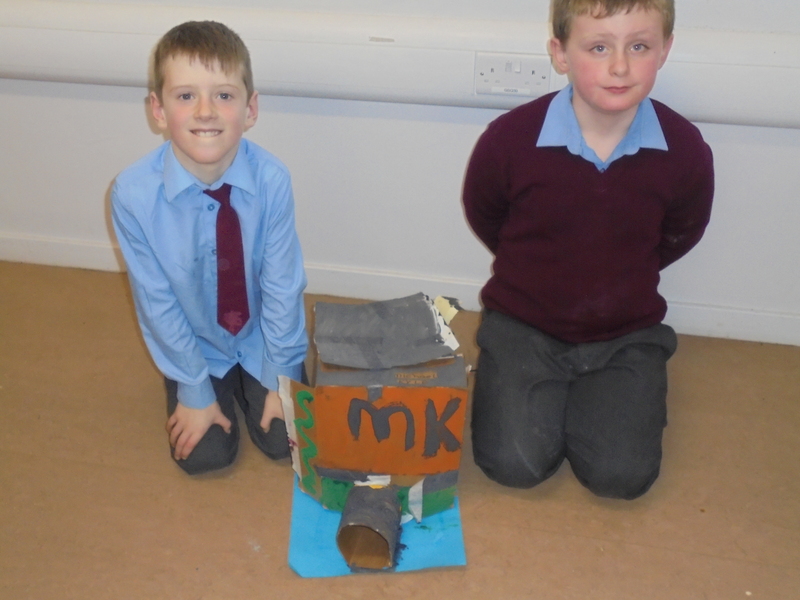 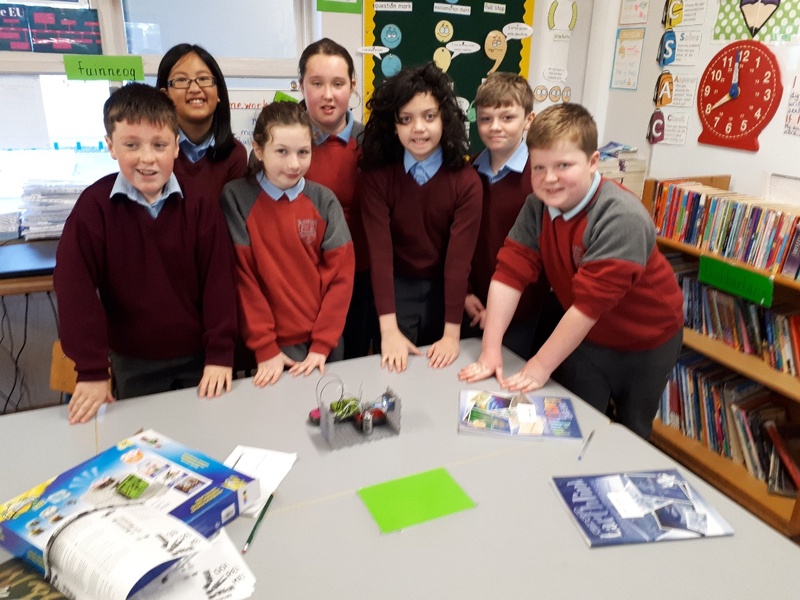 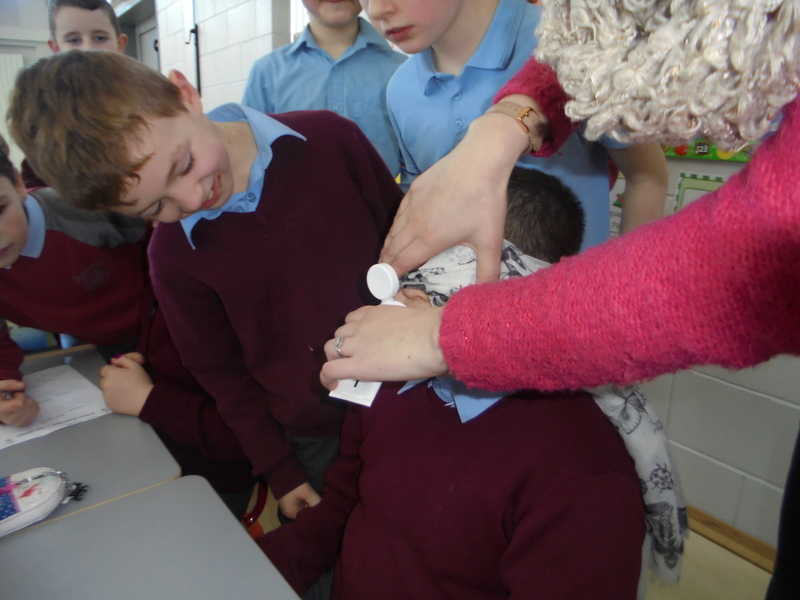 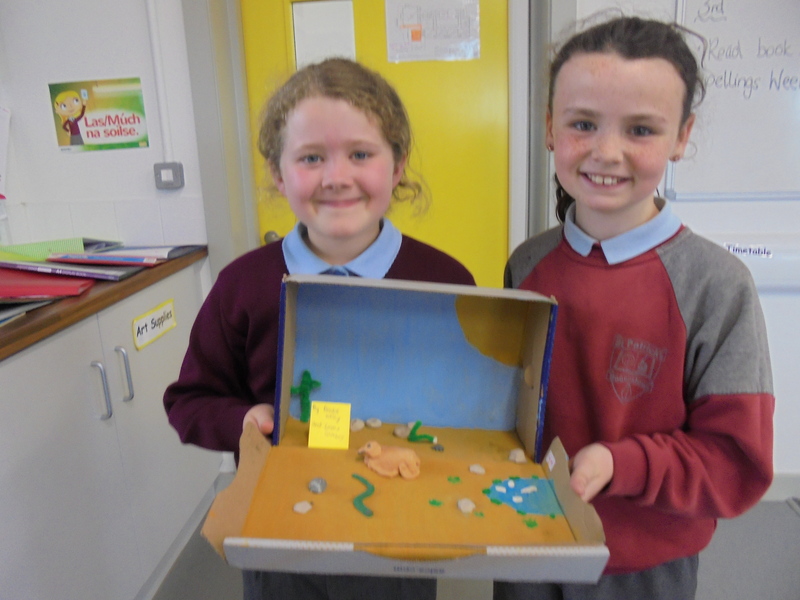 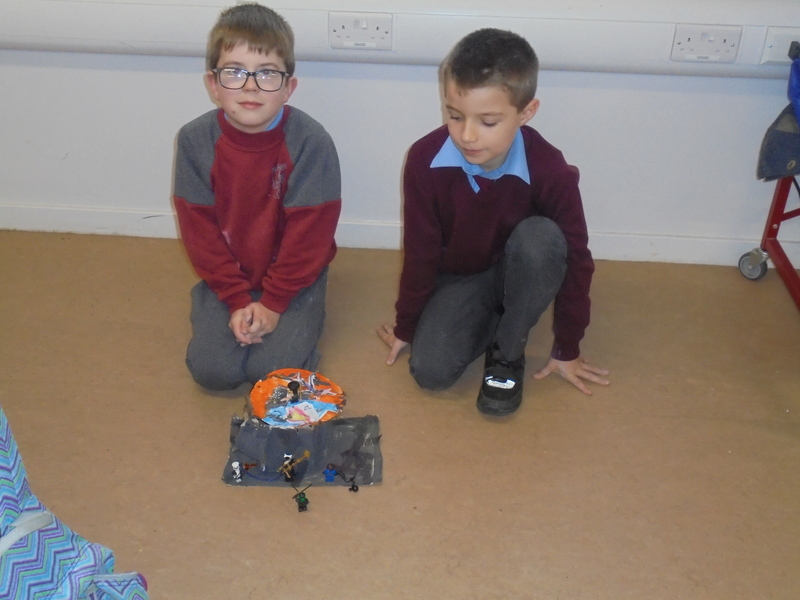 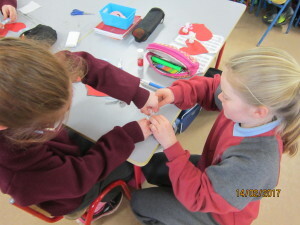 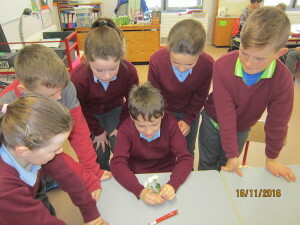 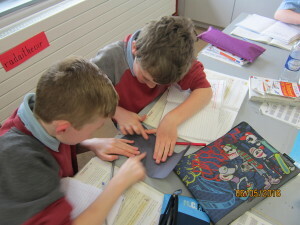 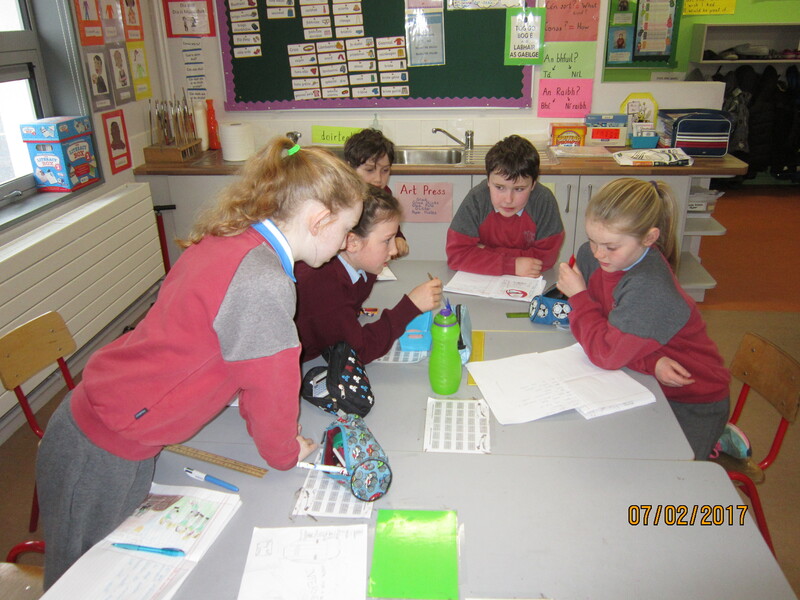 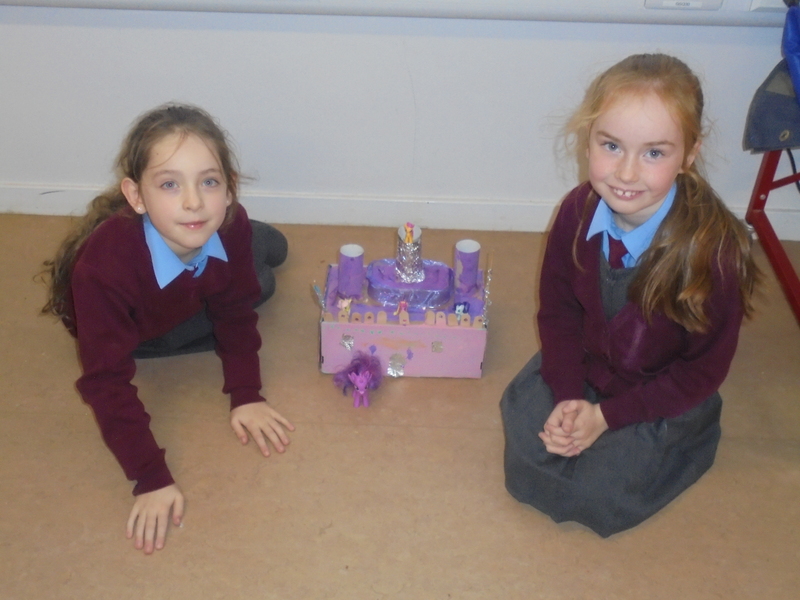 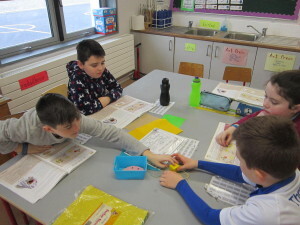 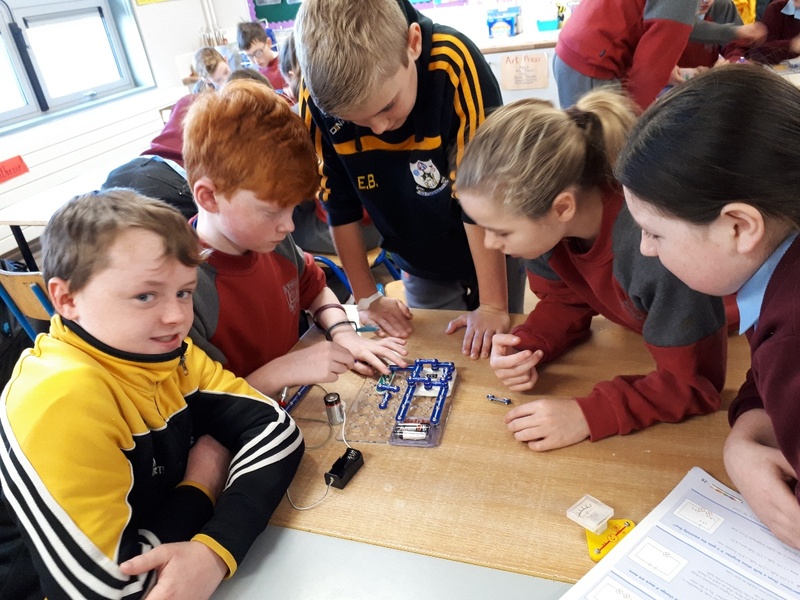 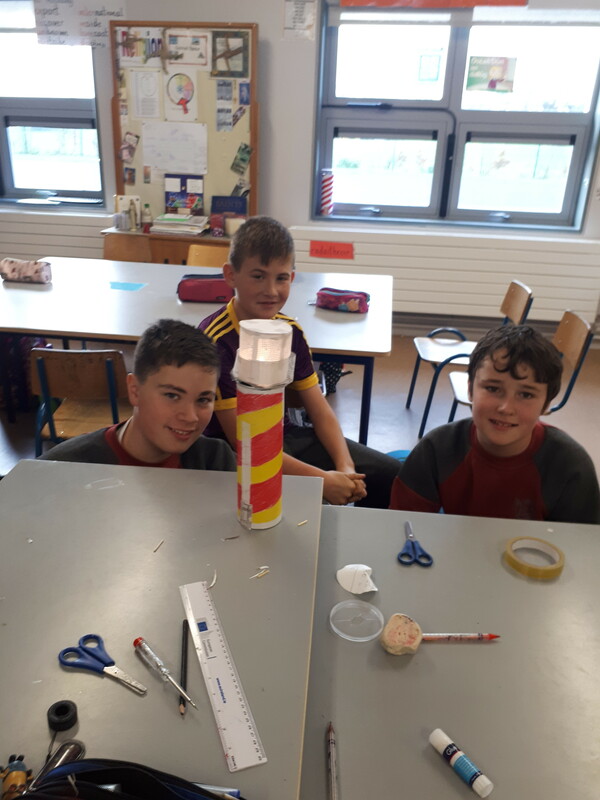 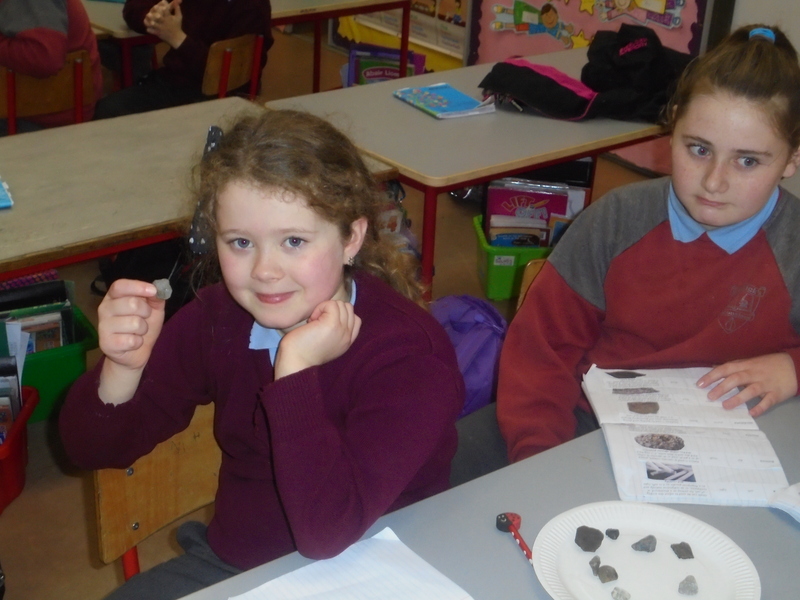 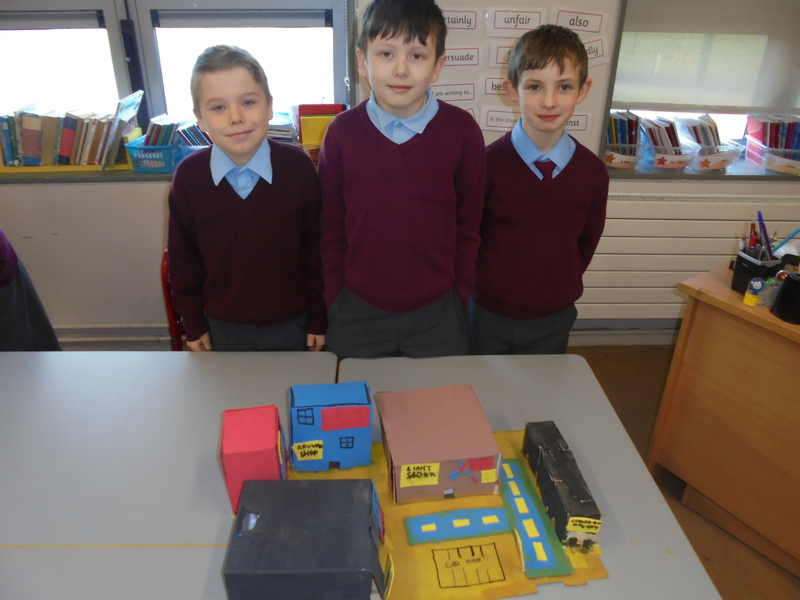 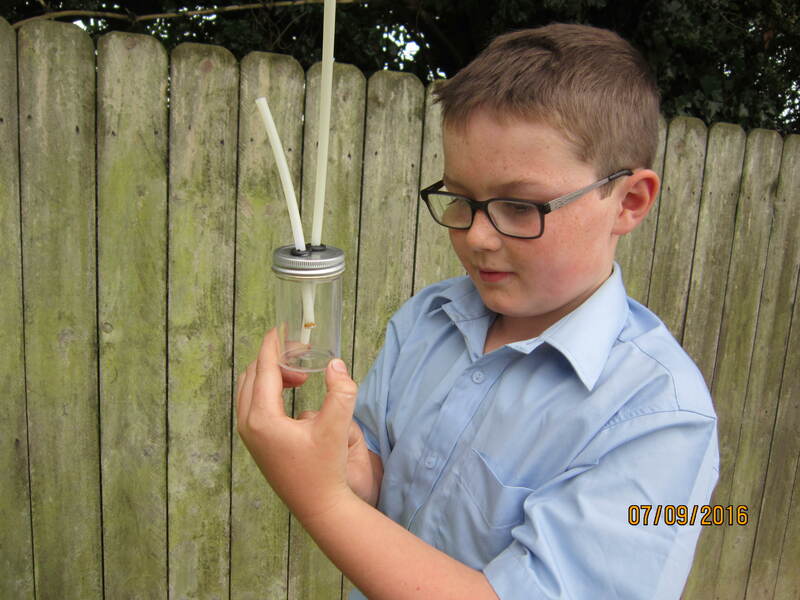 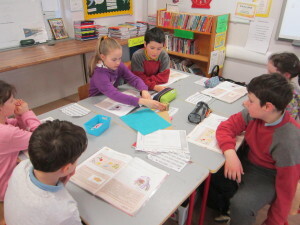 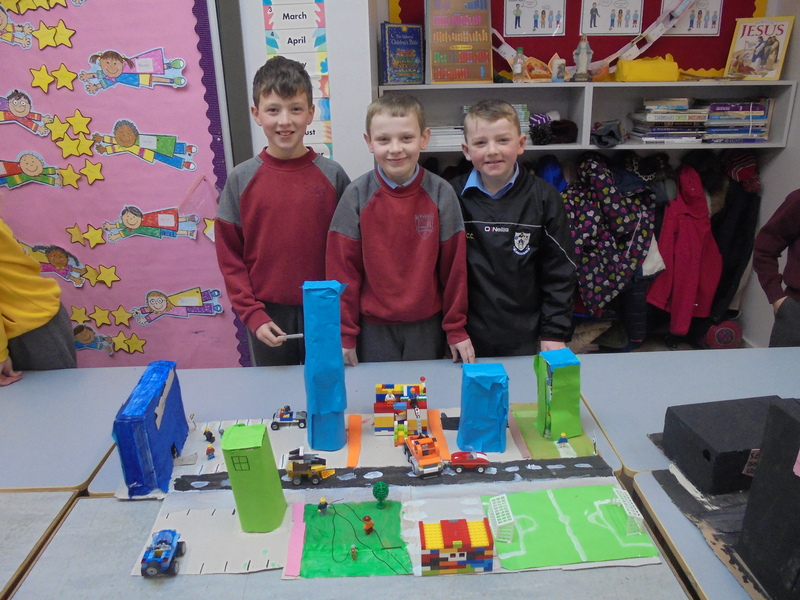 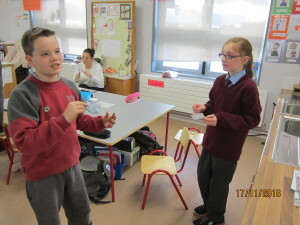 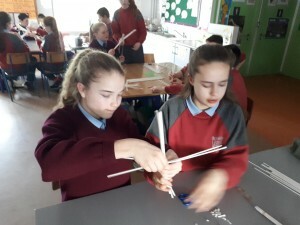 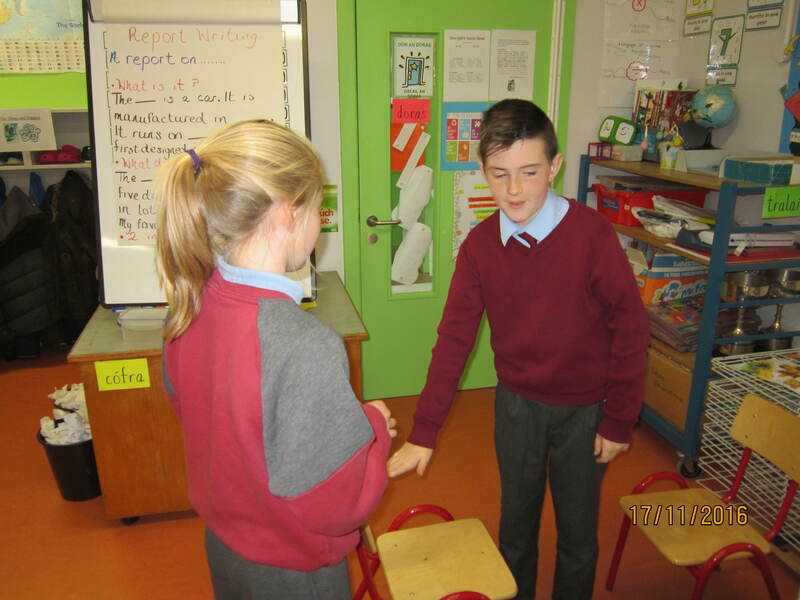 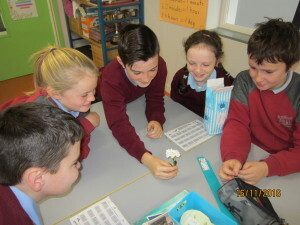 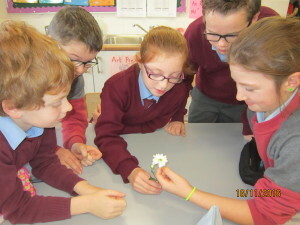 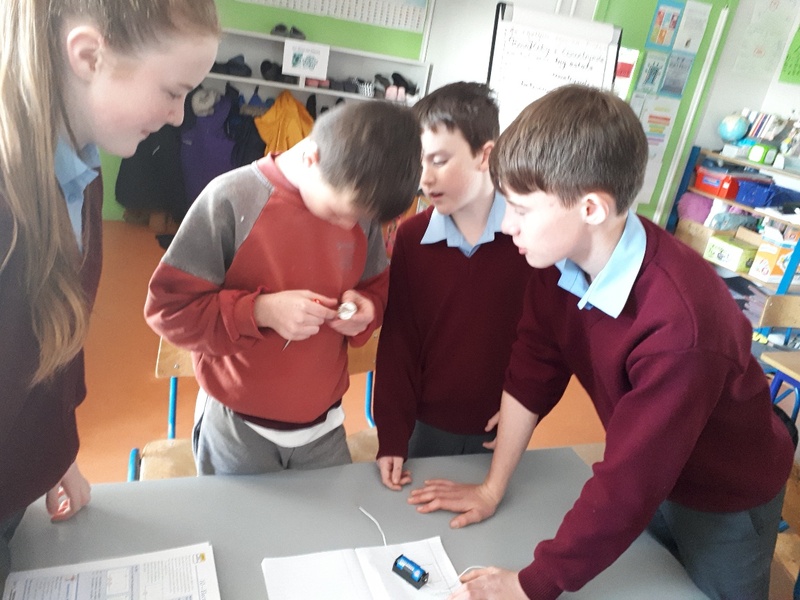 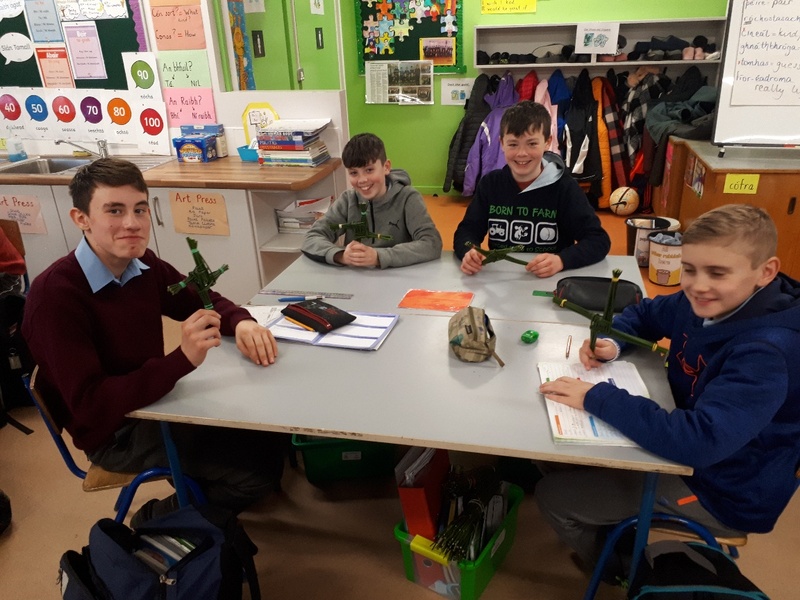 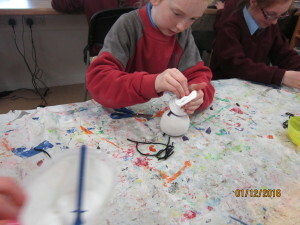 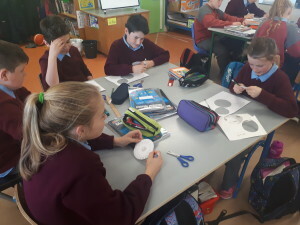 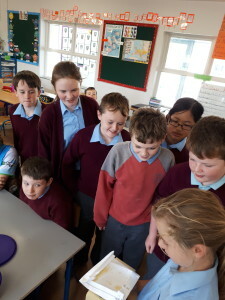 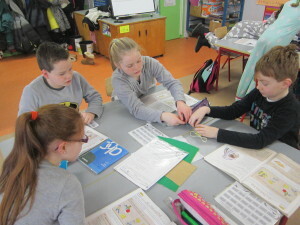 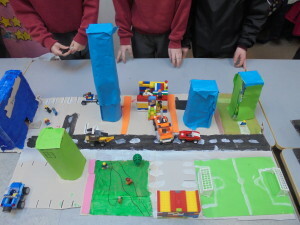 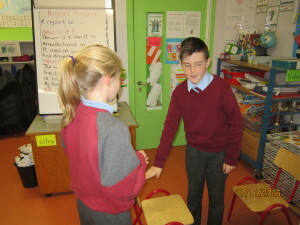 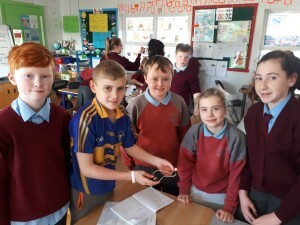 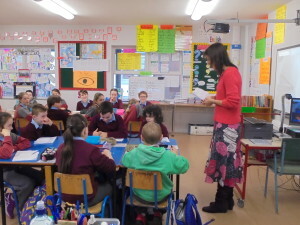 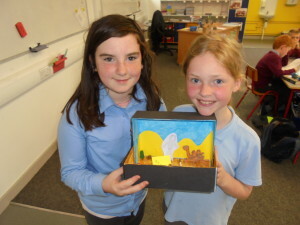 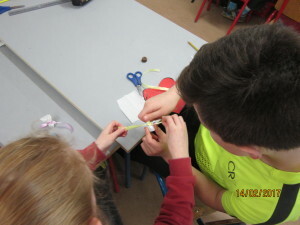 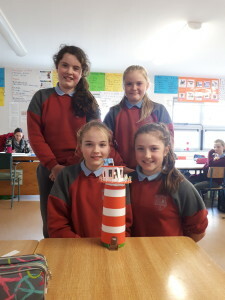 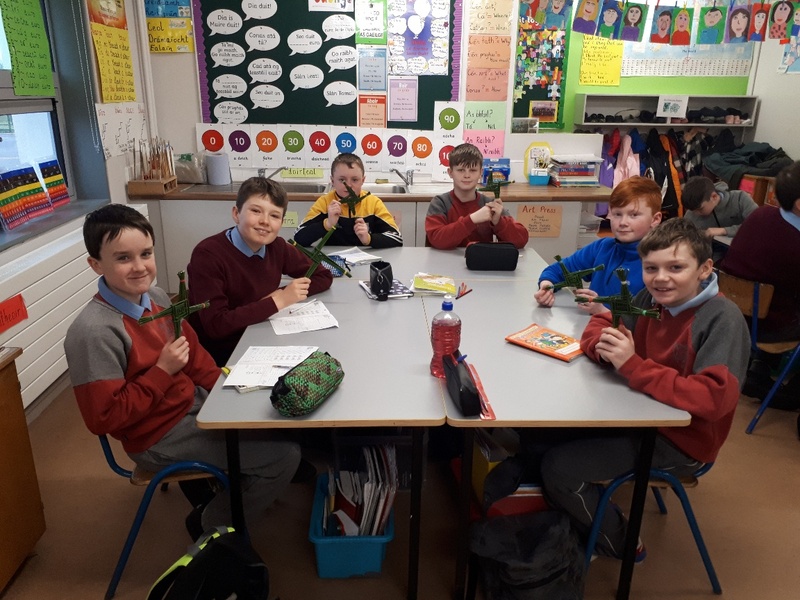 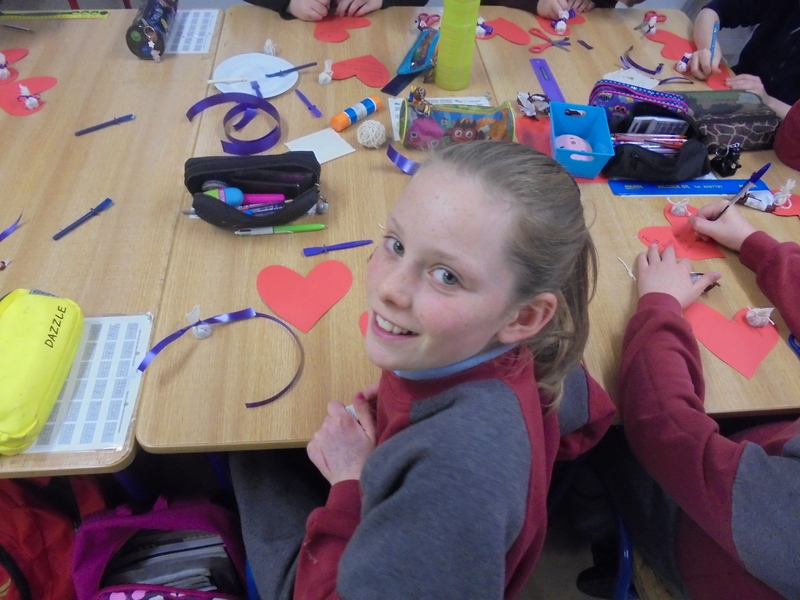 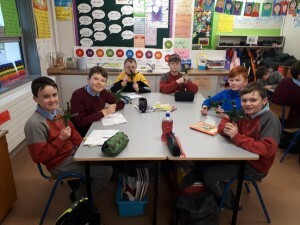 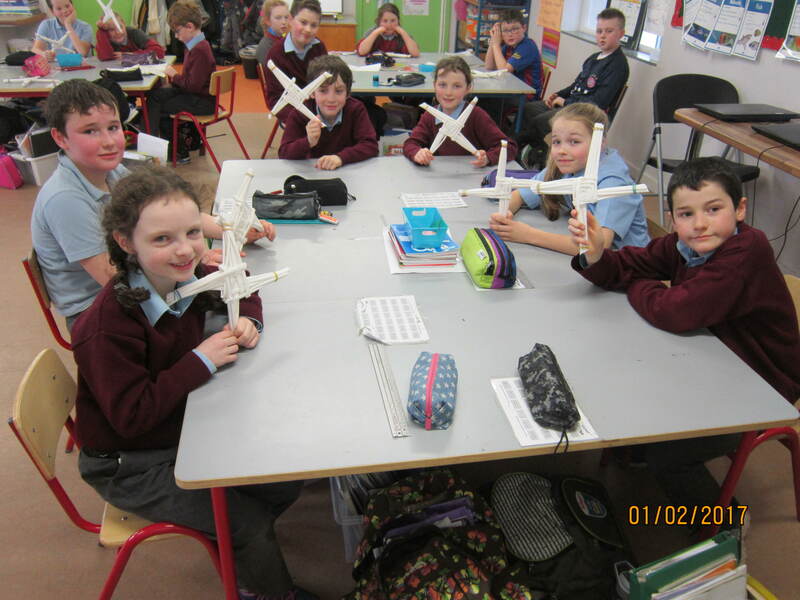 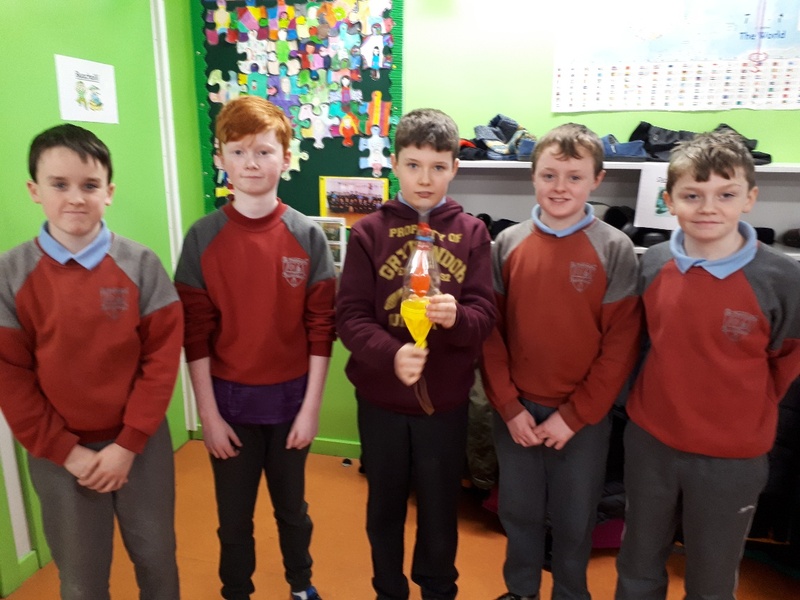 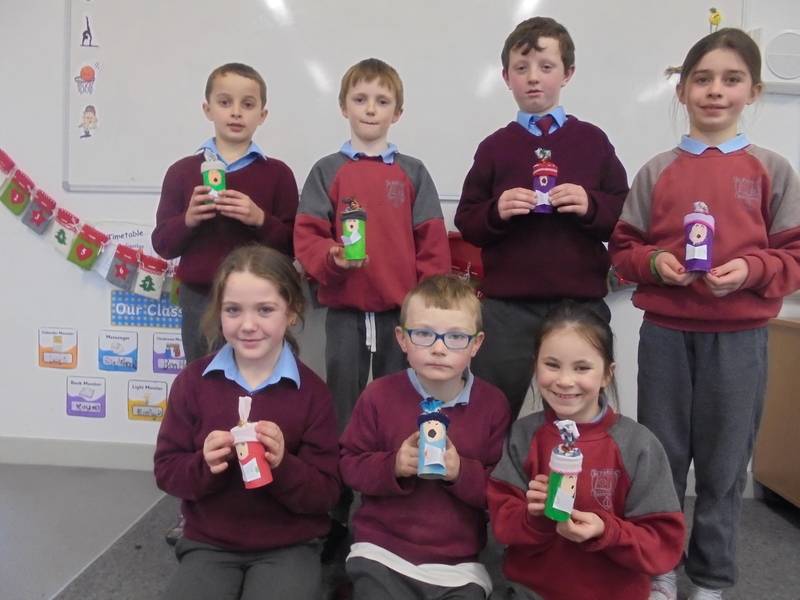 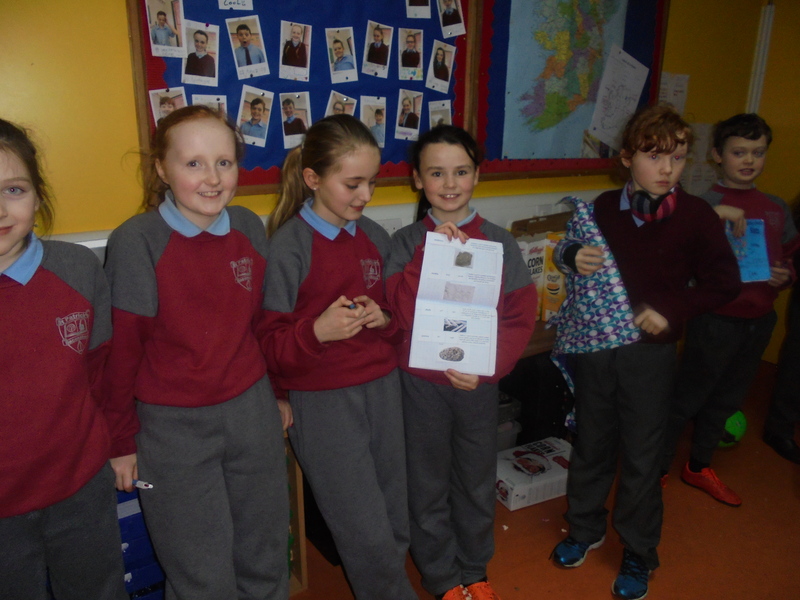 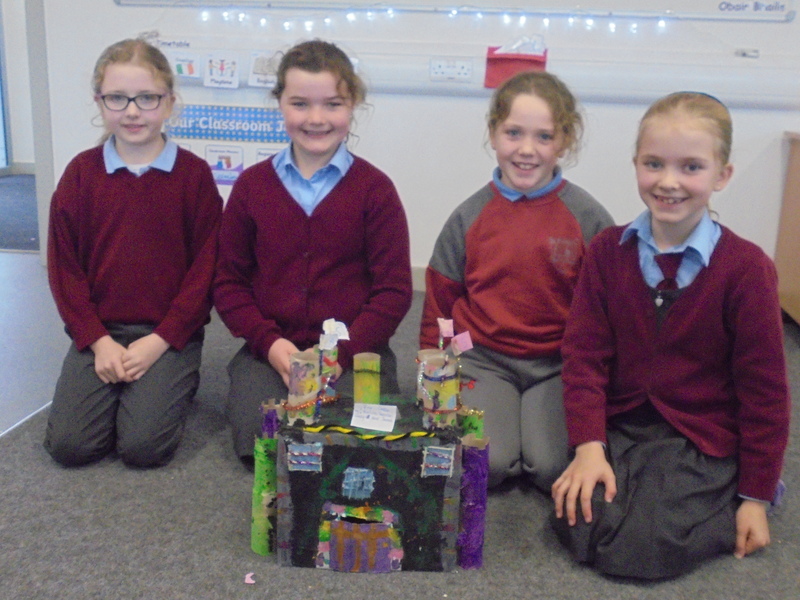 Ms Murphy’s 6th Class learned about electricity and how to make circuits during Science Week. 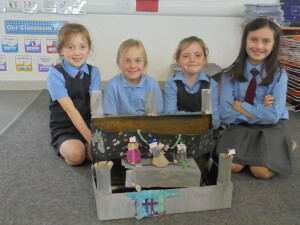 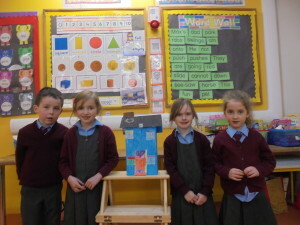 Using this knowledge, they designed and created Lighthouses. 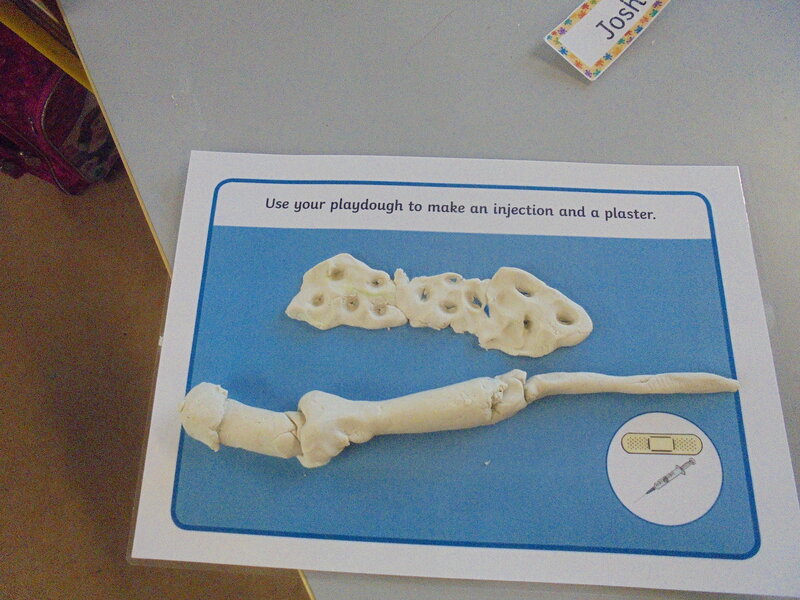 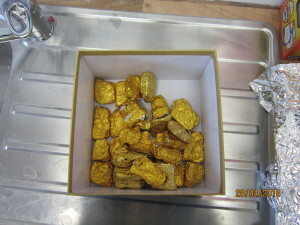 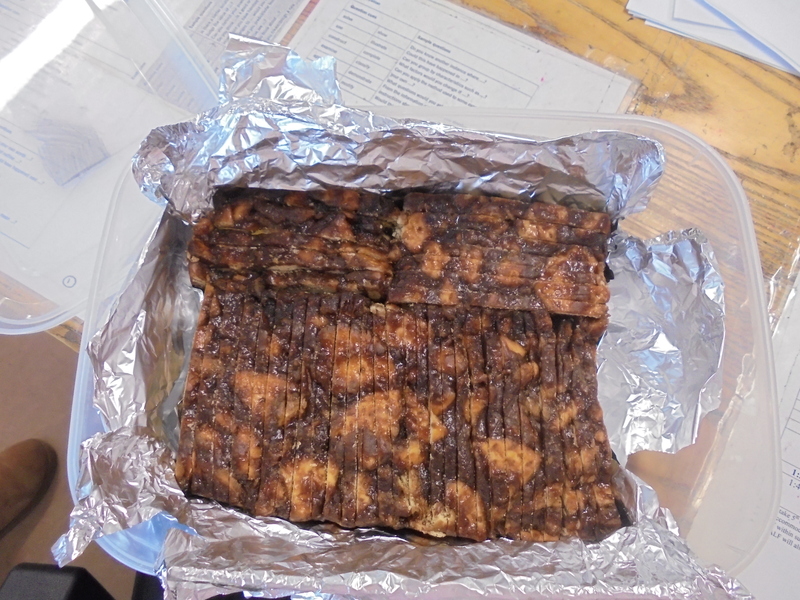 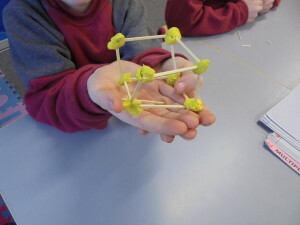 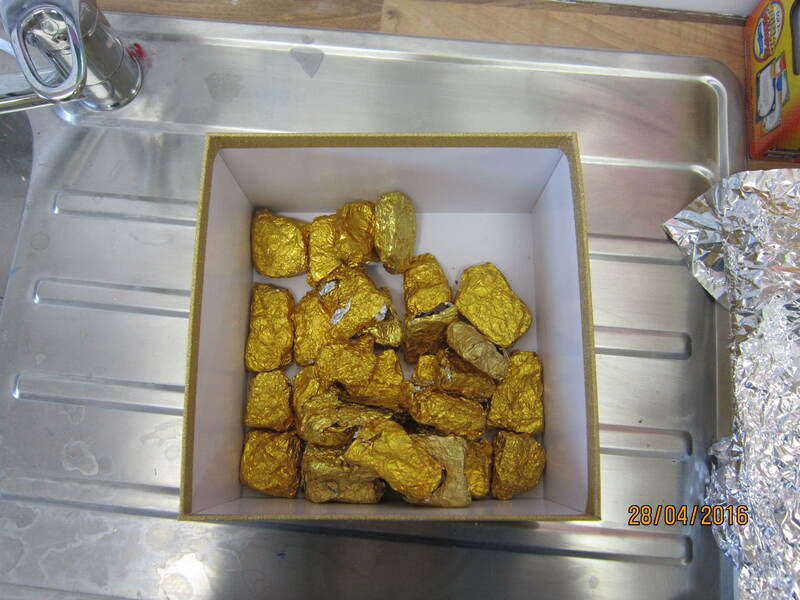 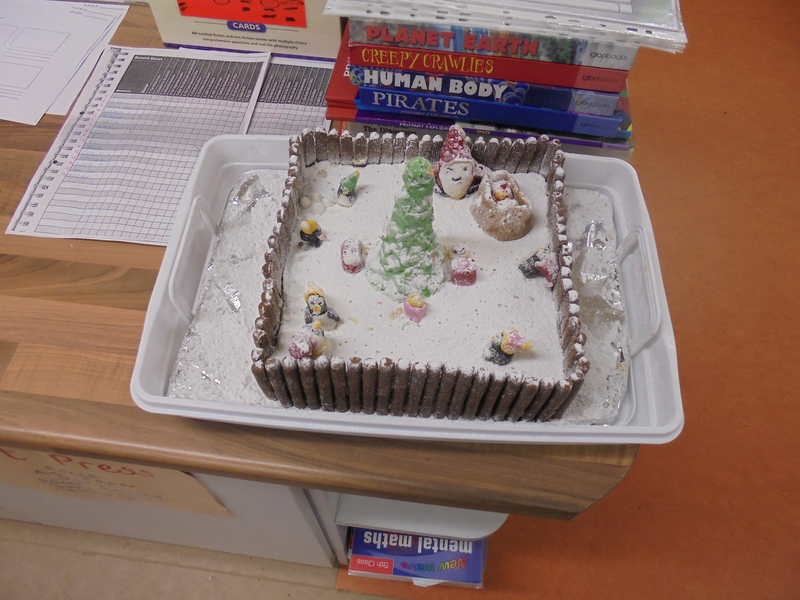 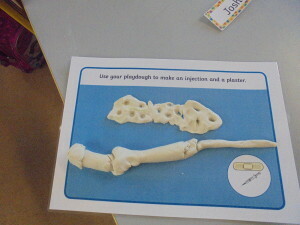 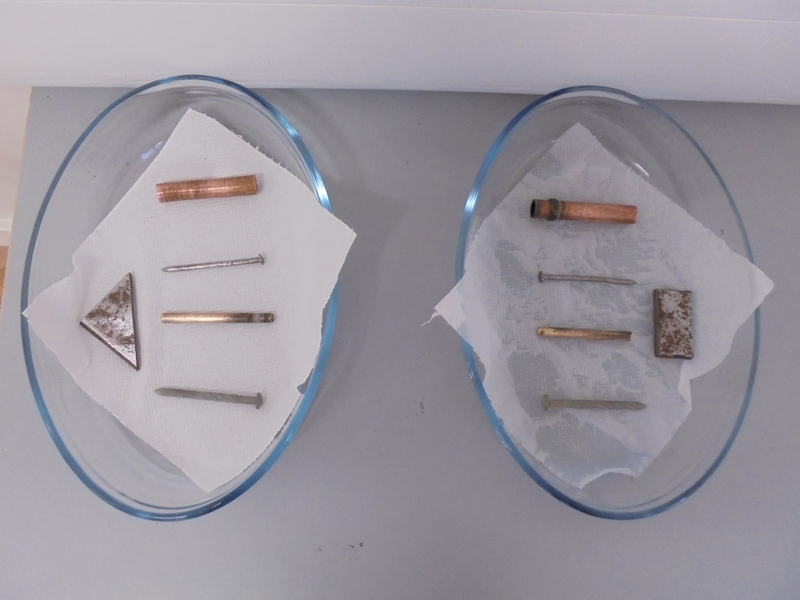 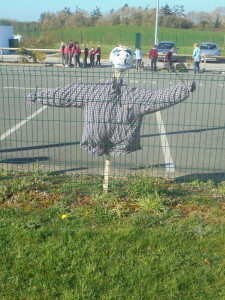 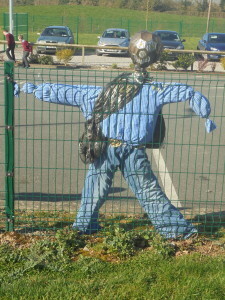 They also explored the effect acid has on our bones and learned about famous scientists! 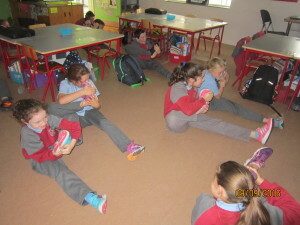 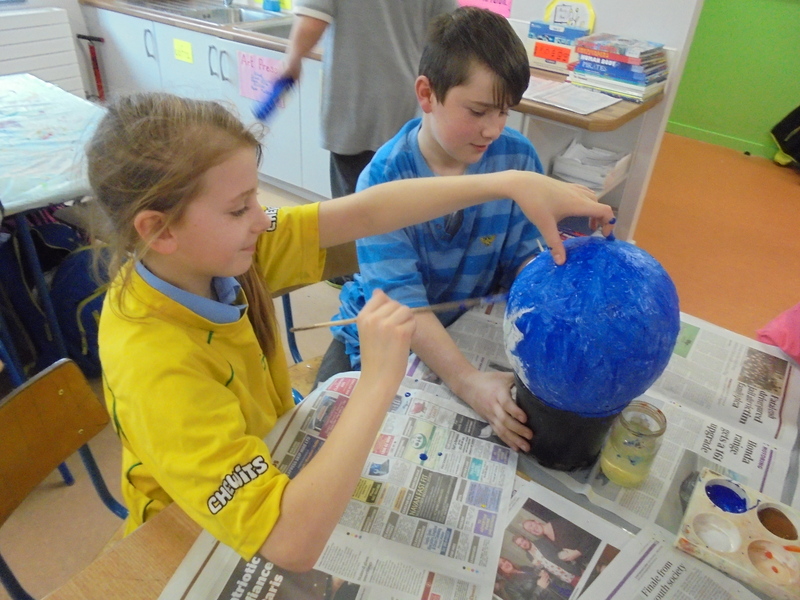 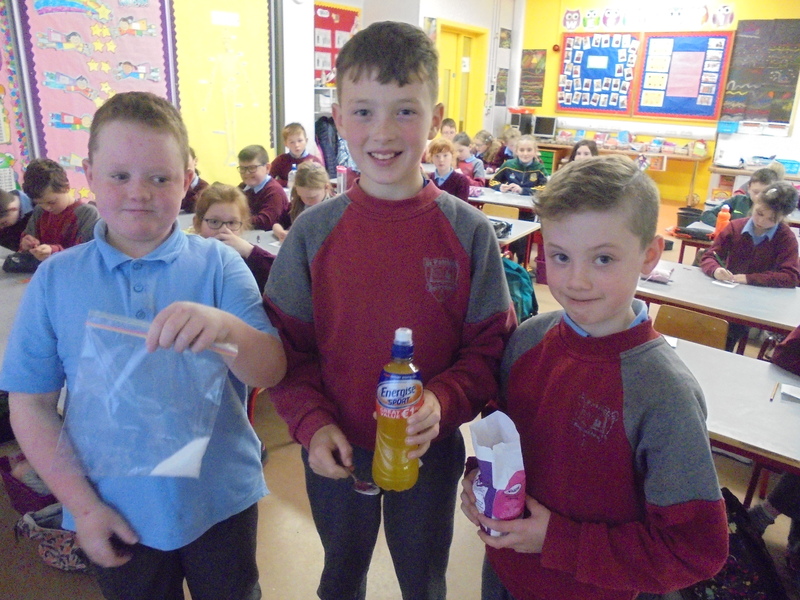 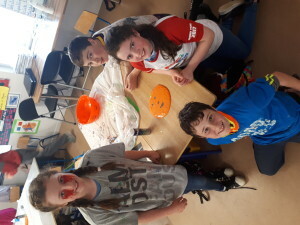 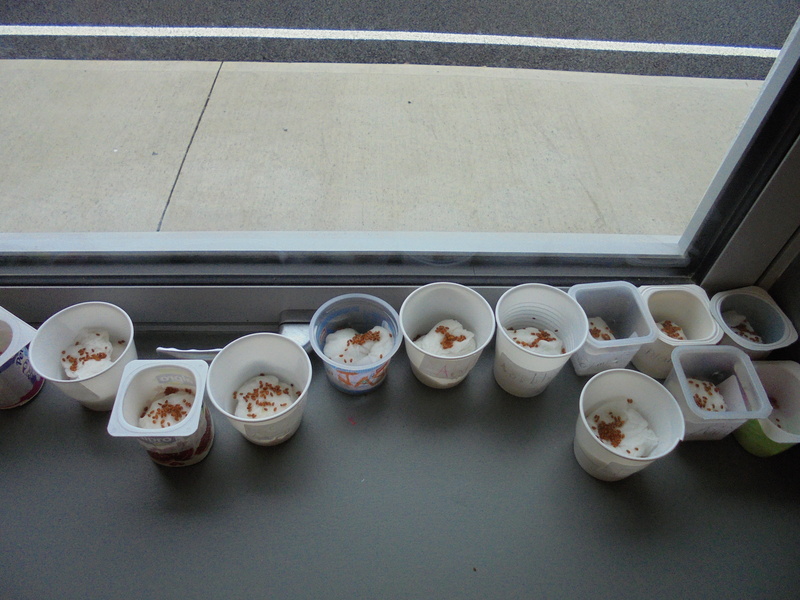 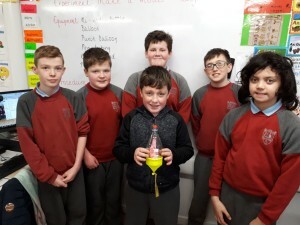 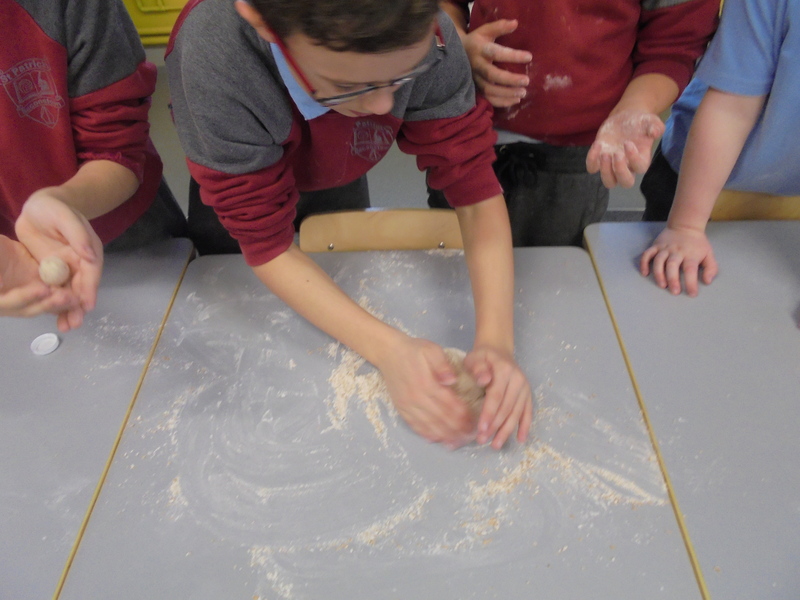 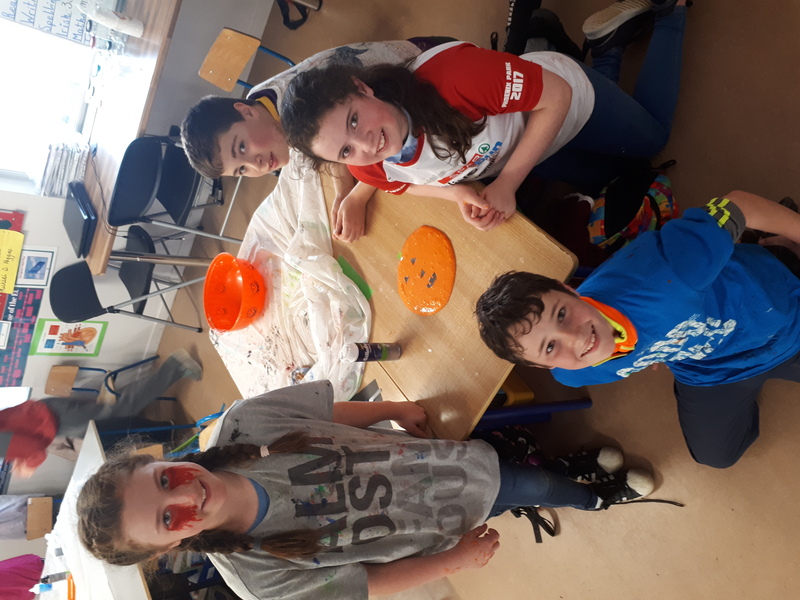 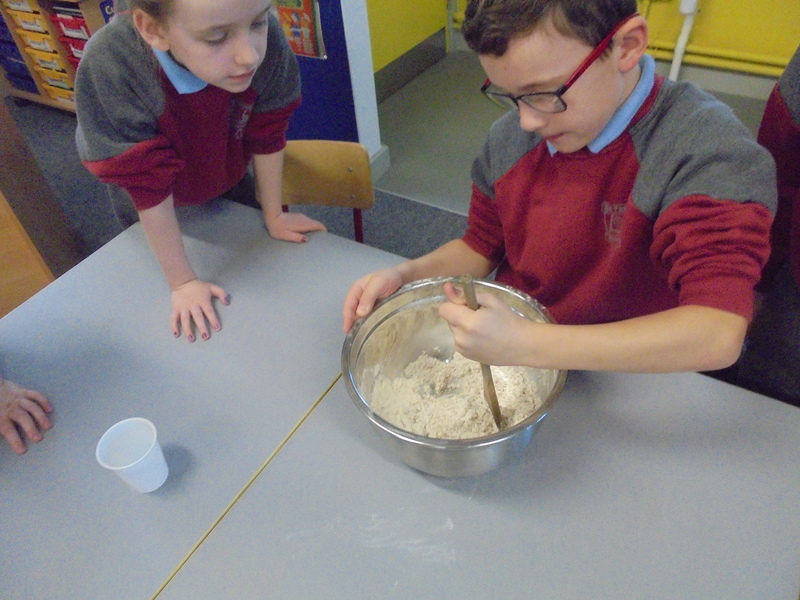 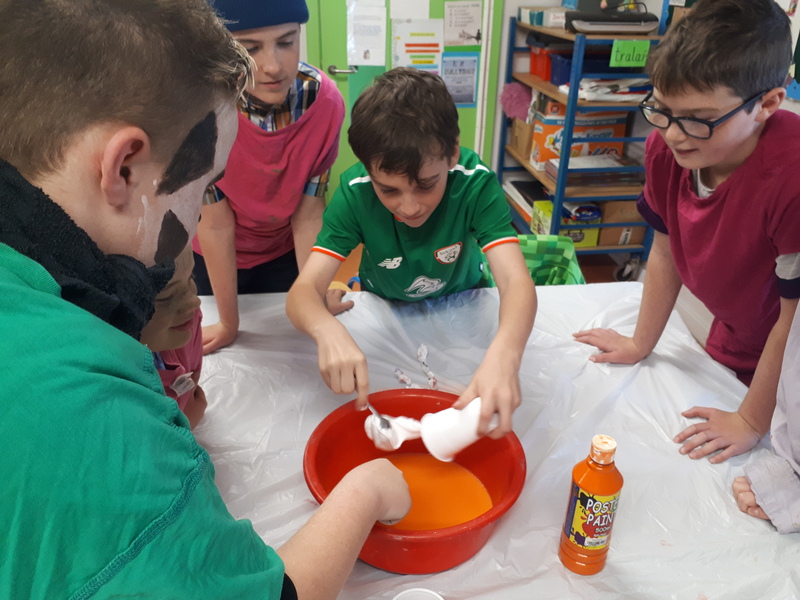 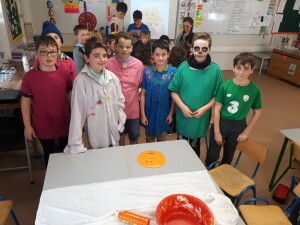 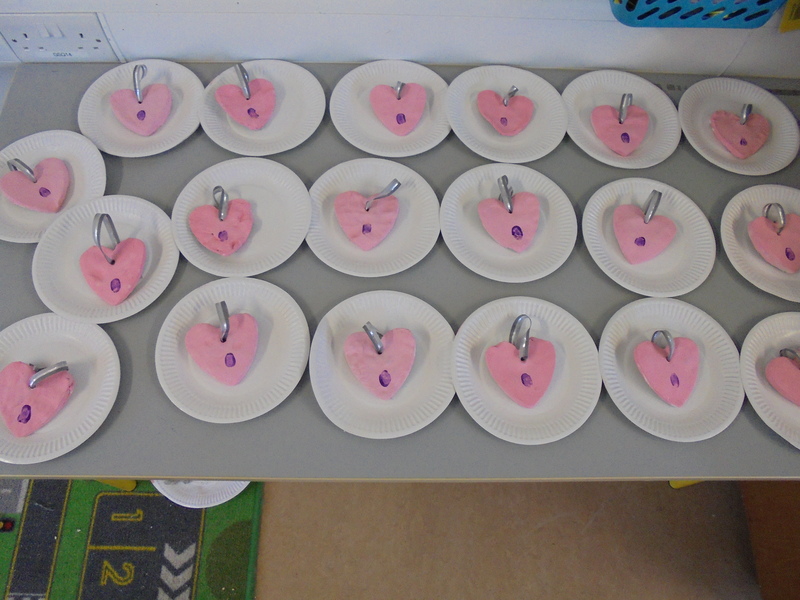 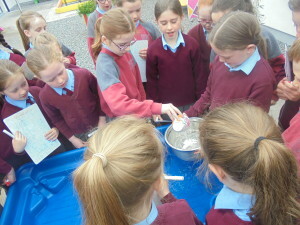 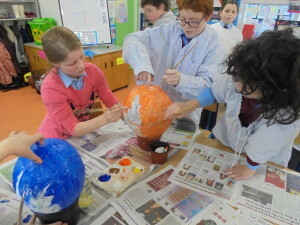 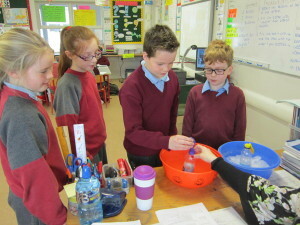 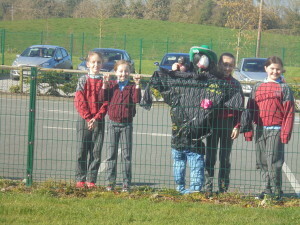 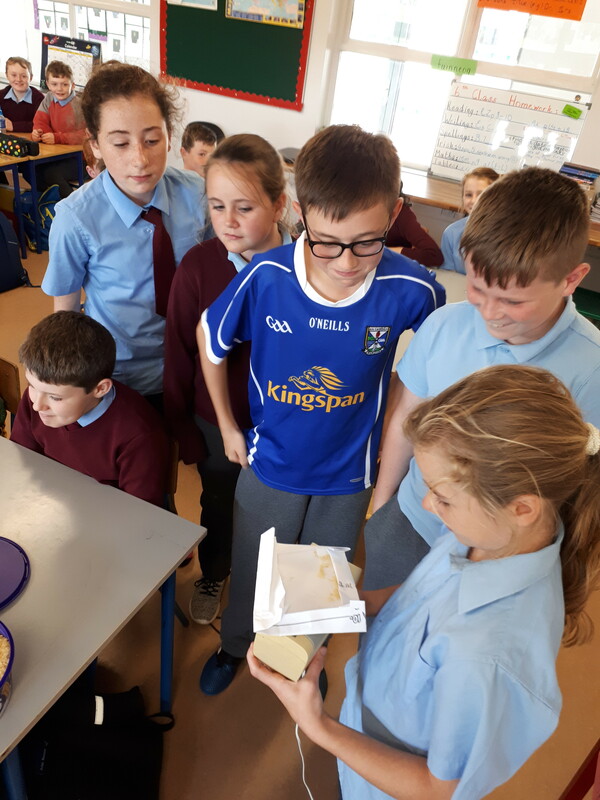 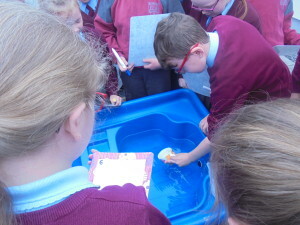 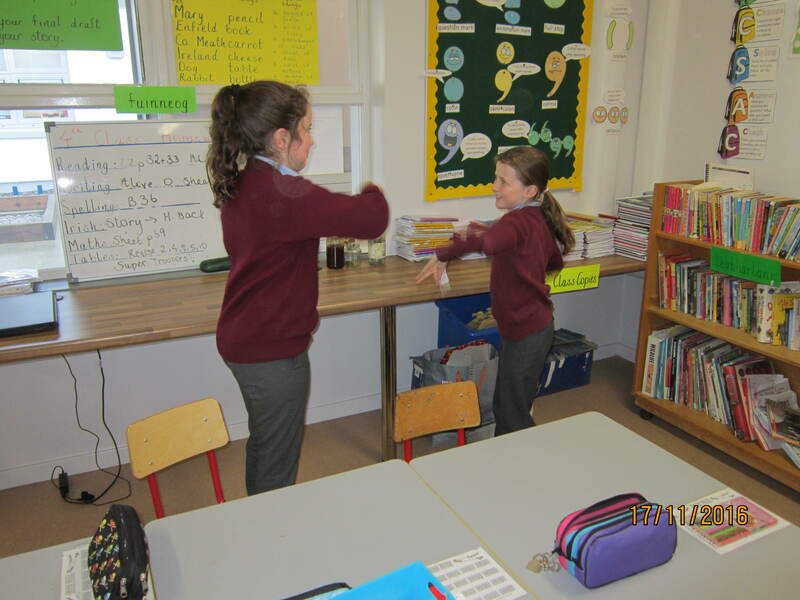 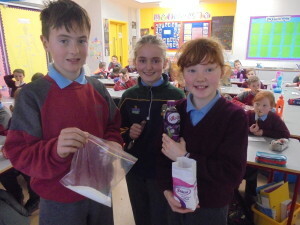 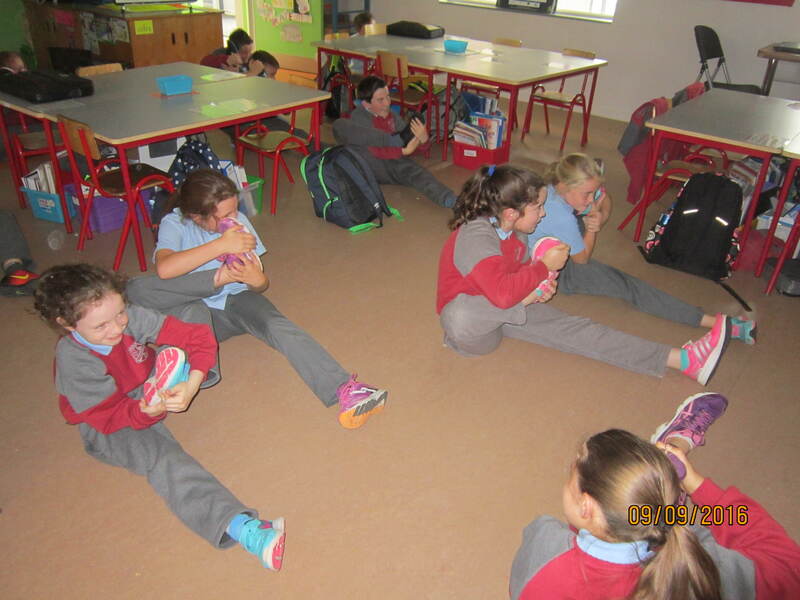 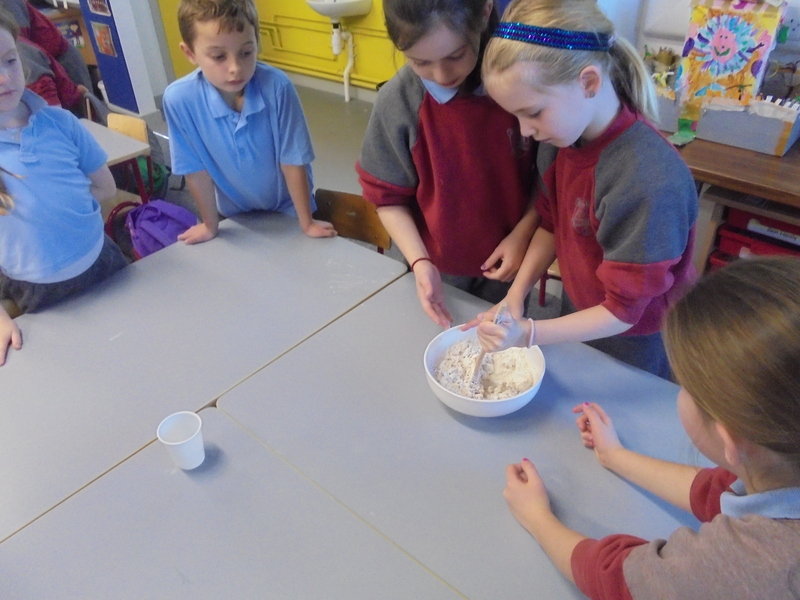 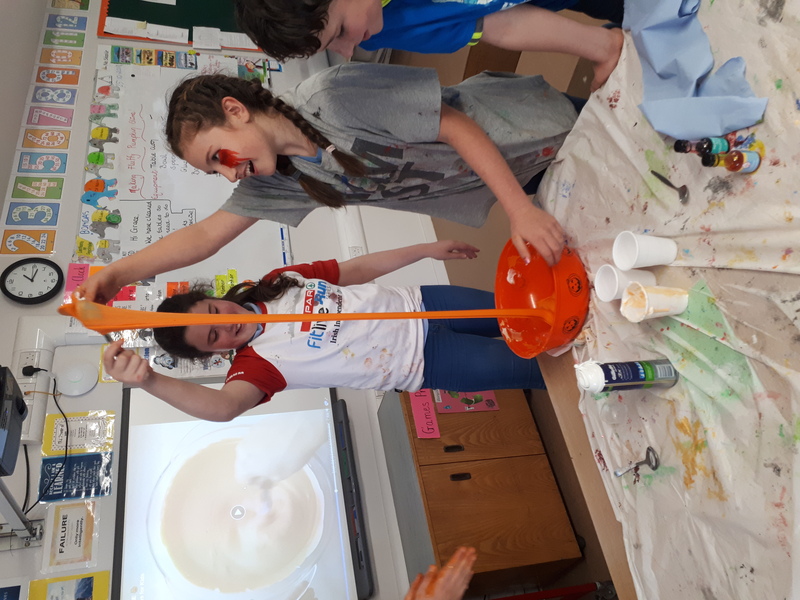 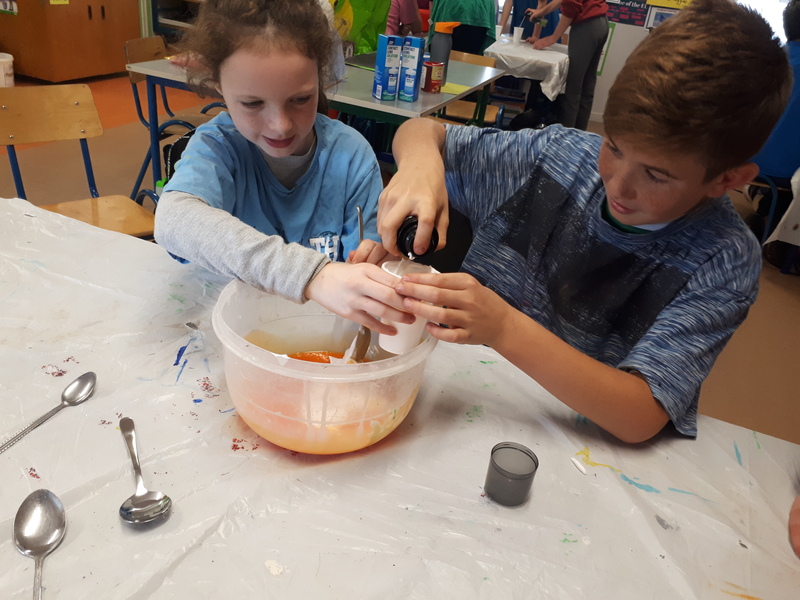 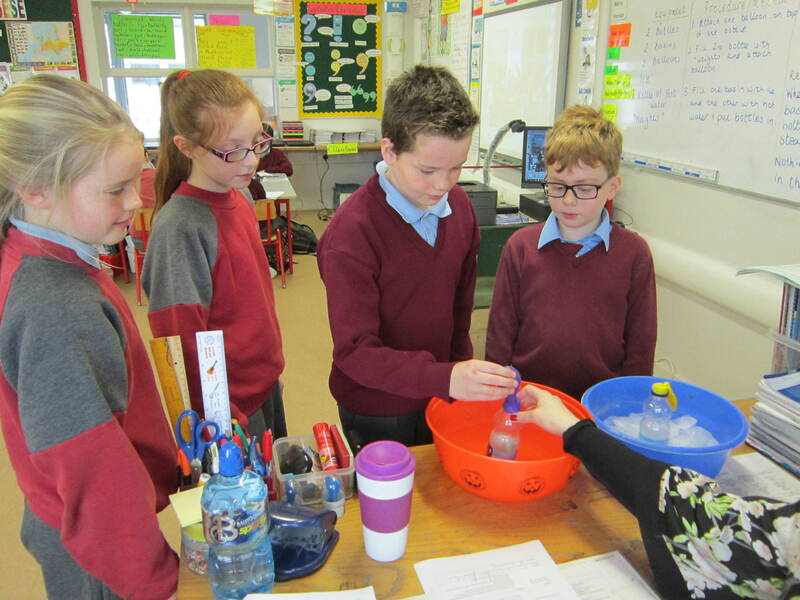 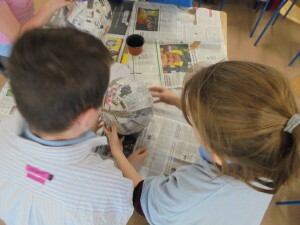 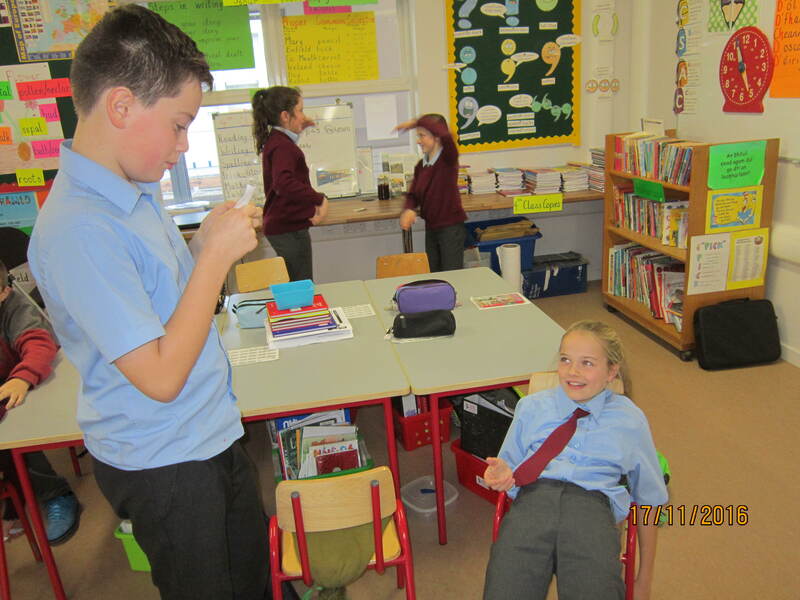 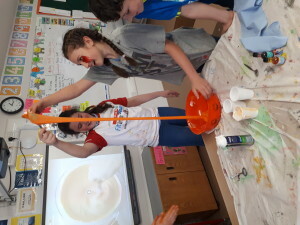 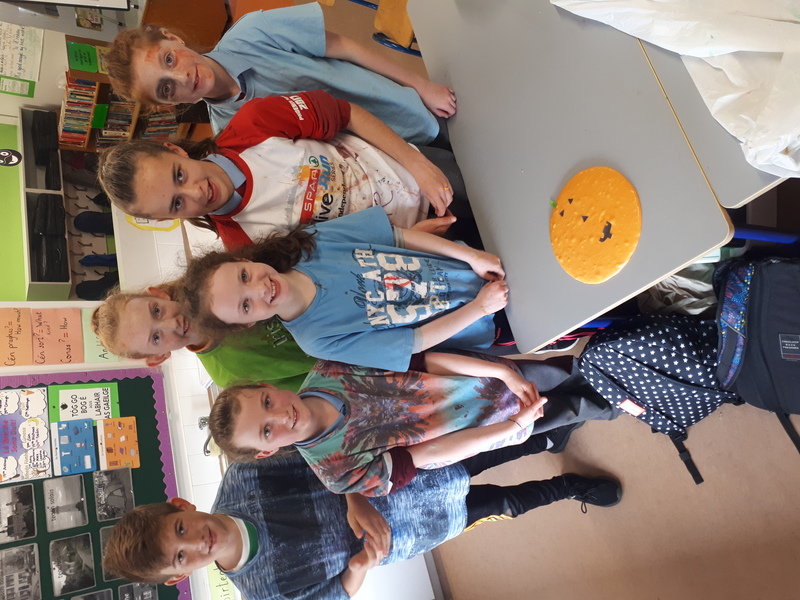 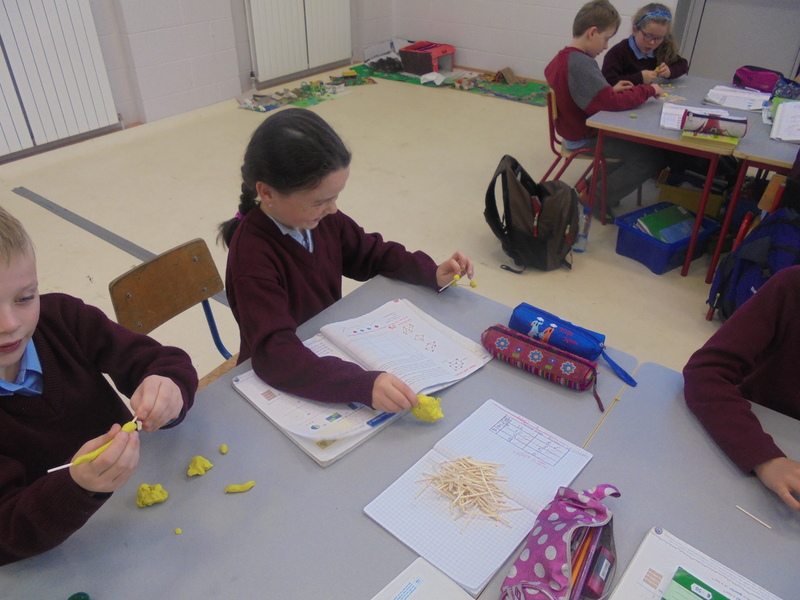 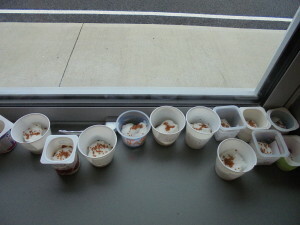 Ms Murphy’s 6th Class explored the change in Materials by making Halloween Slime. 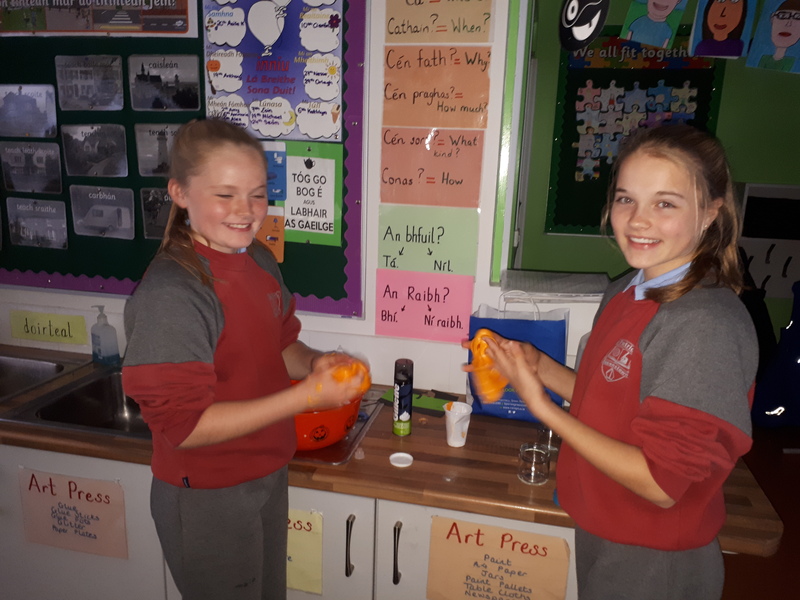 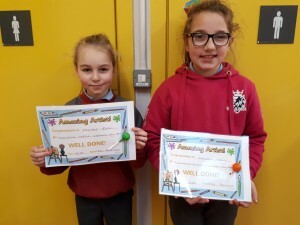 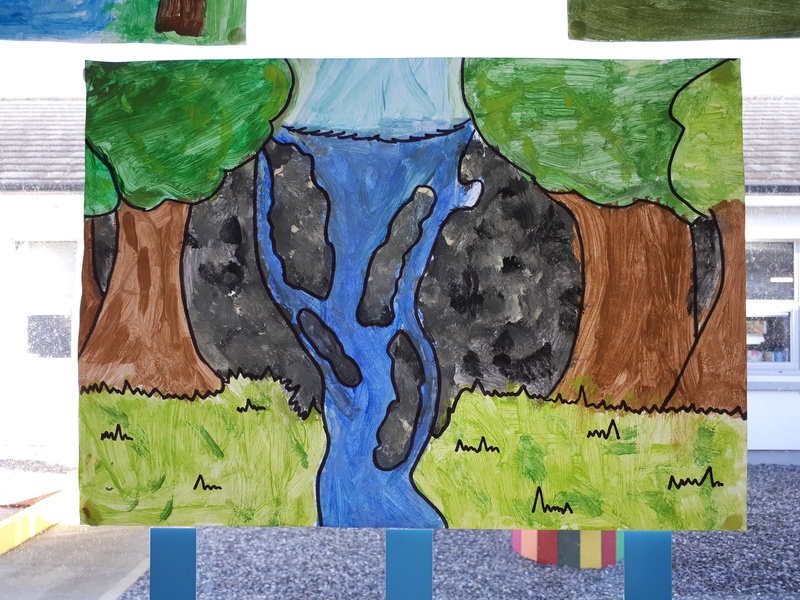 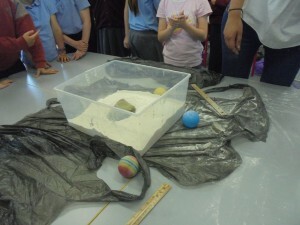 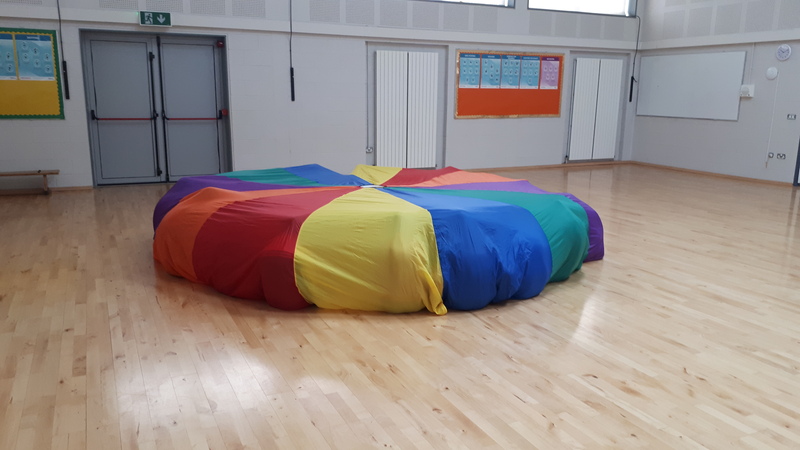 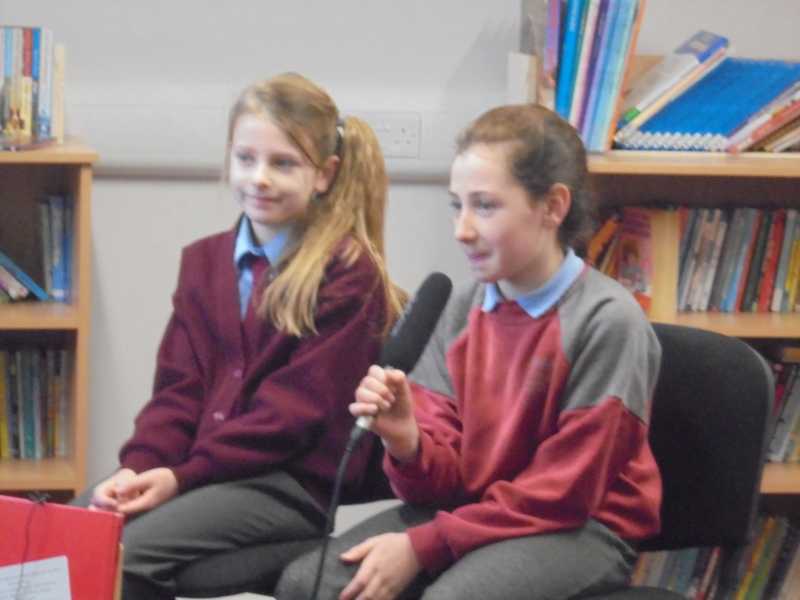 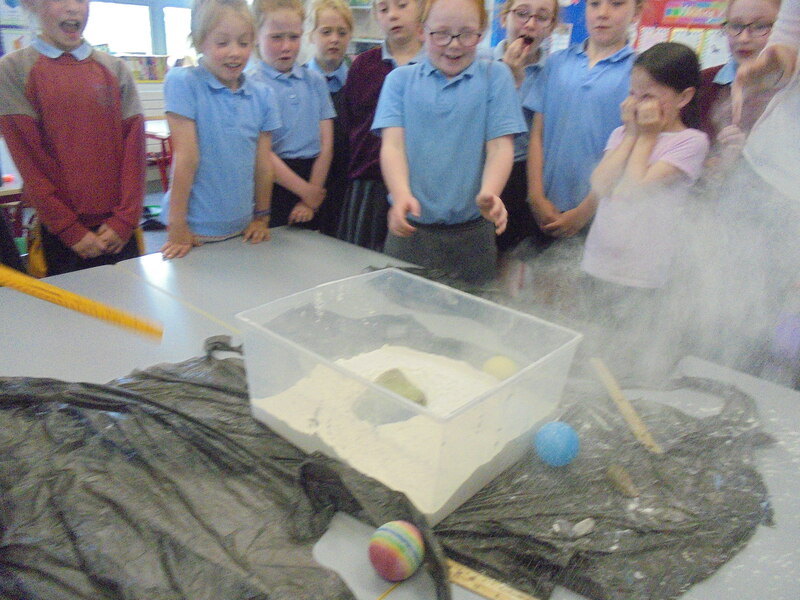 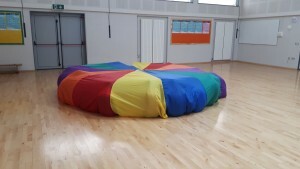 Lauren and Leesha are experts in this area and became teachers for the afternoon, as they led their class mates and instructed them on how to make the slime. 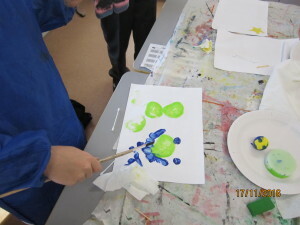 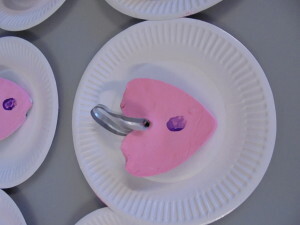 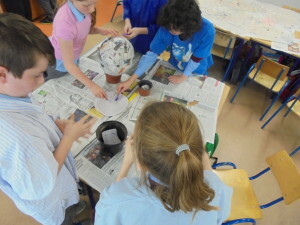 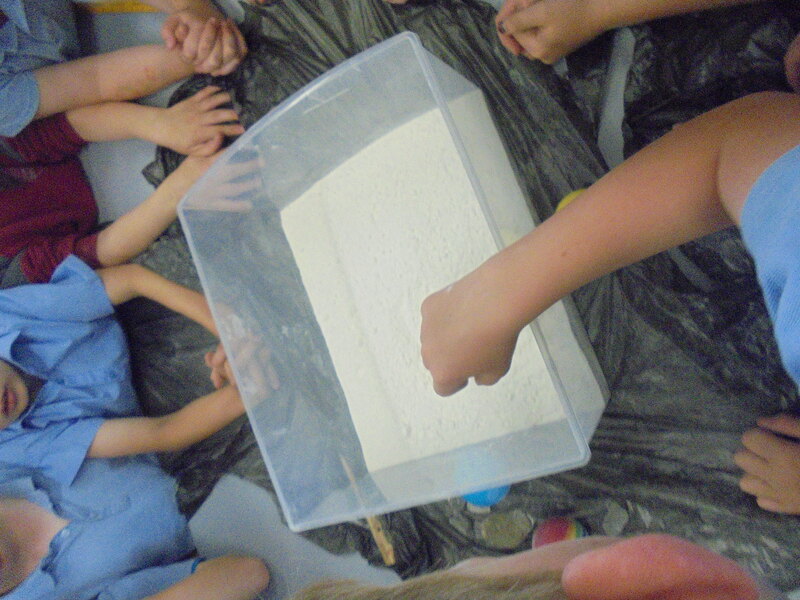 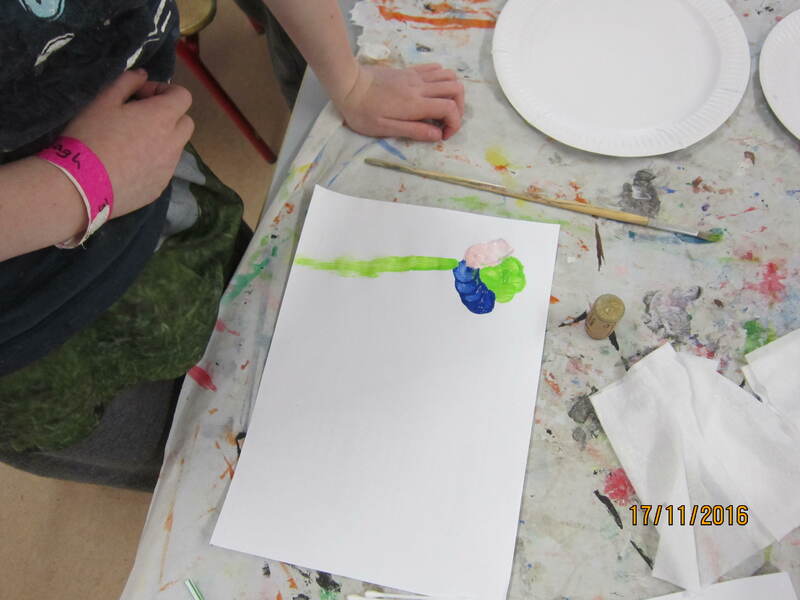 The whole class had so much fun exploring the different textures until the slime became stretchy!!! 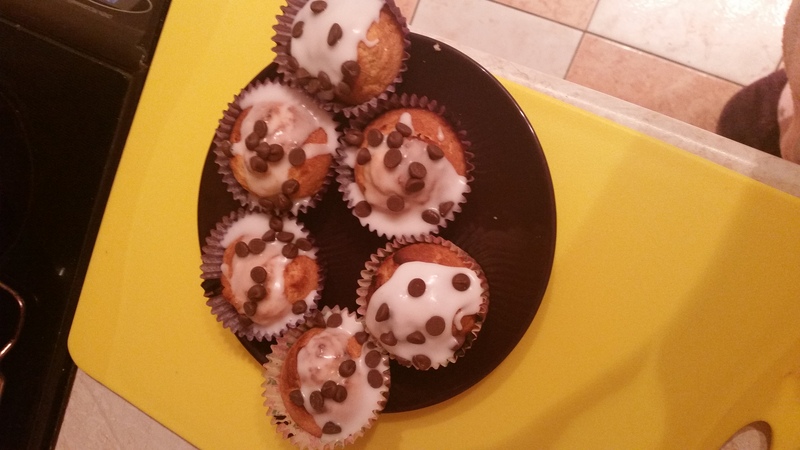 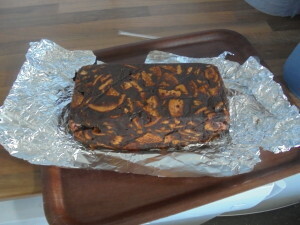 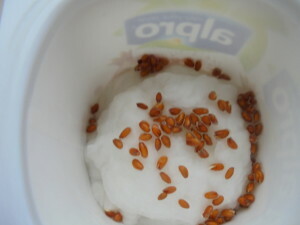 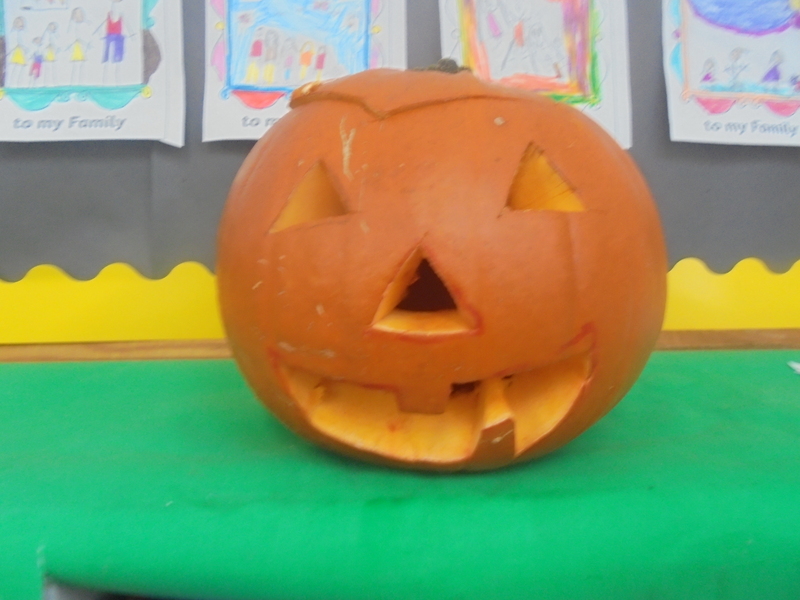 They then turned their slime into Pumpkins! 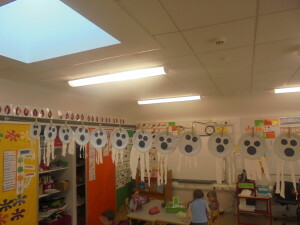 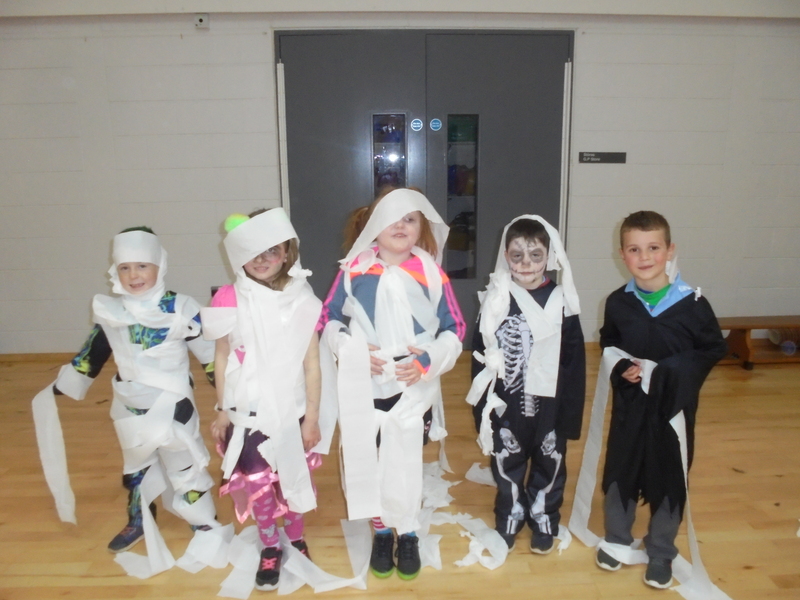 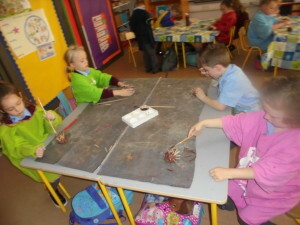 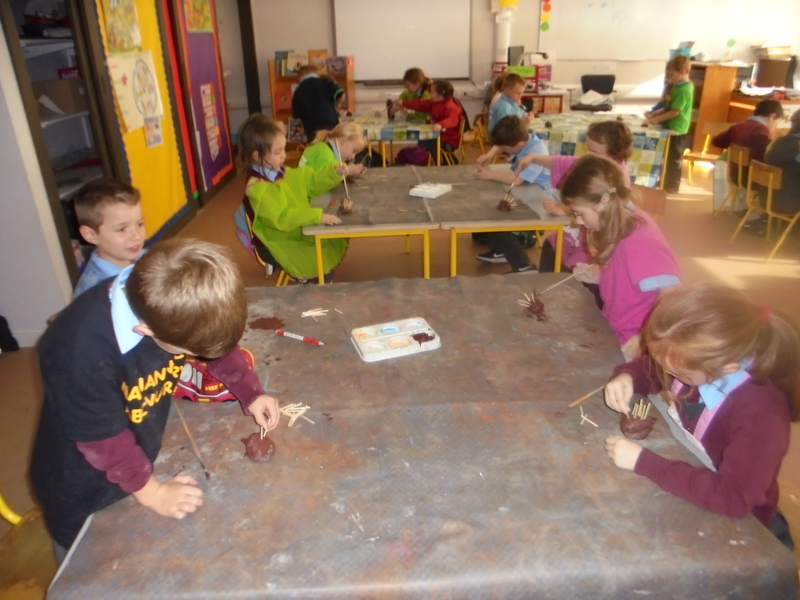 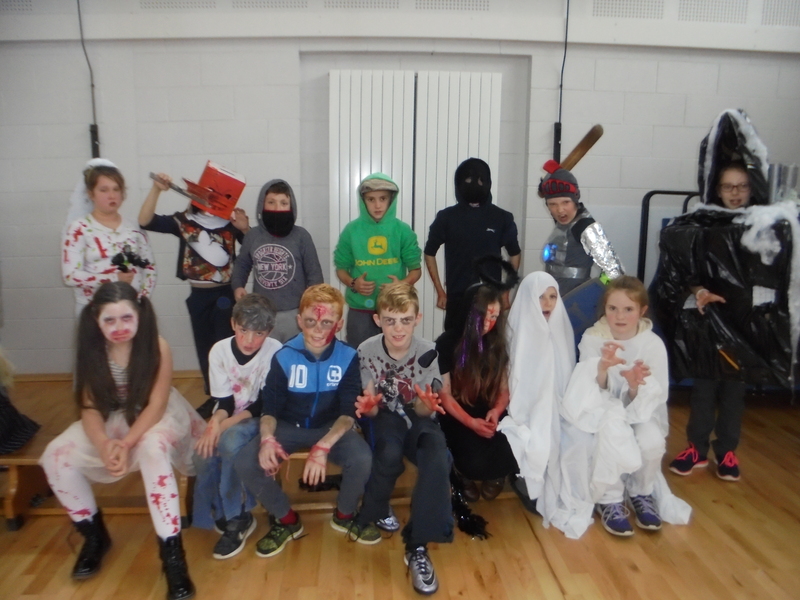 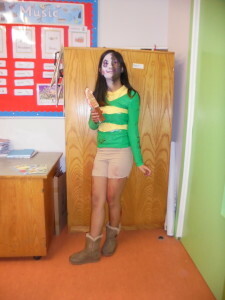 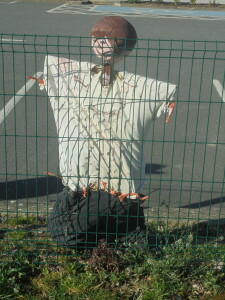 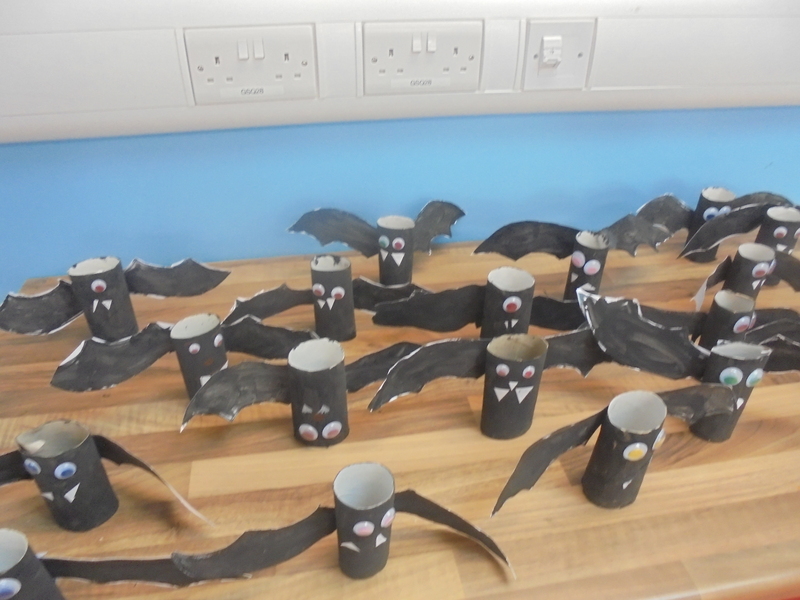 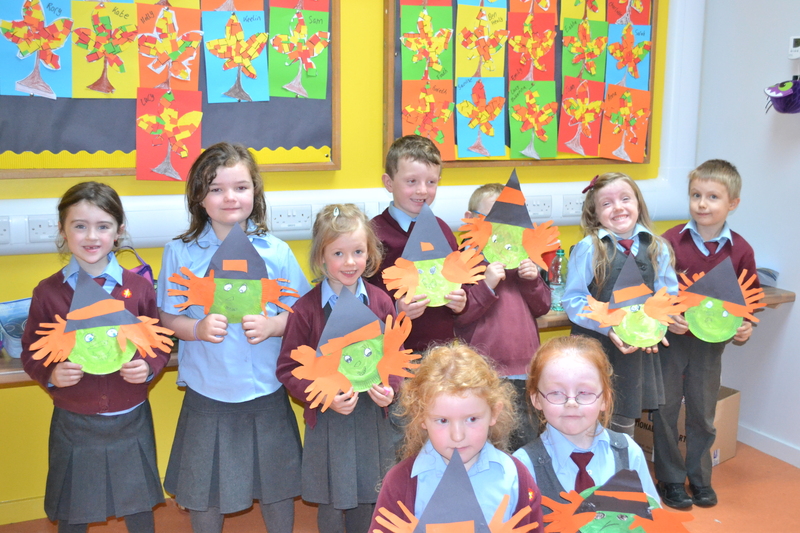 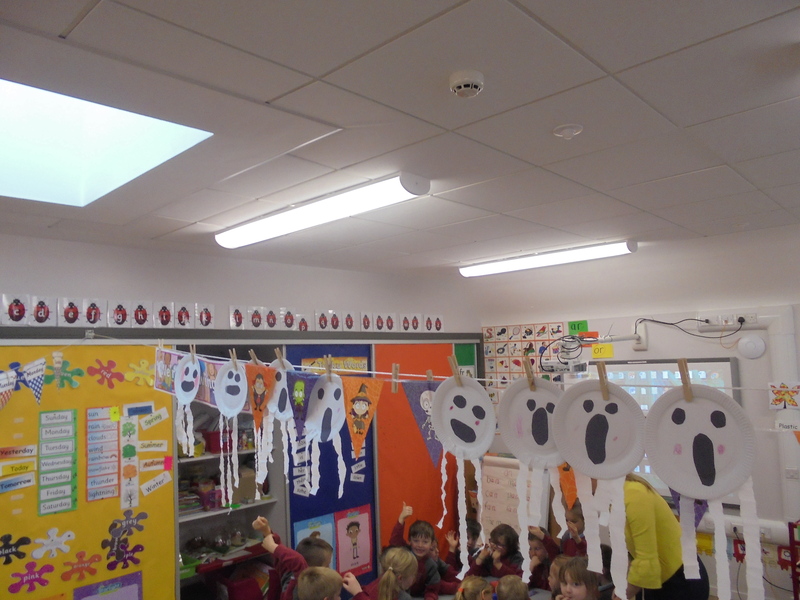 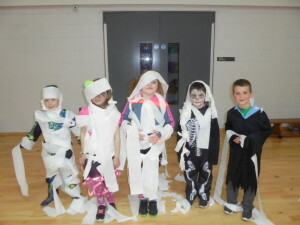 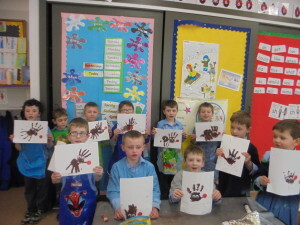 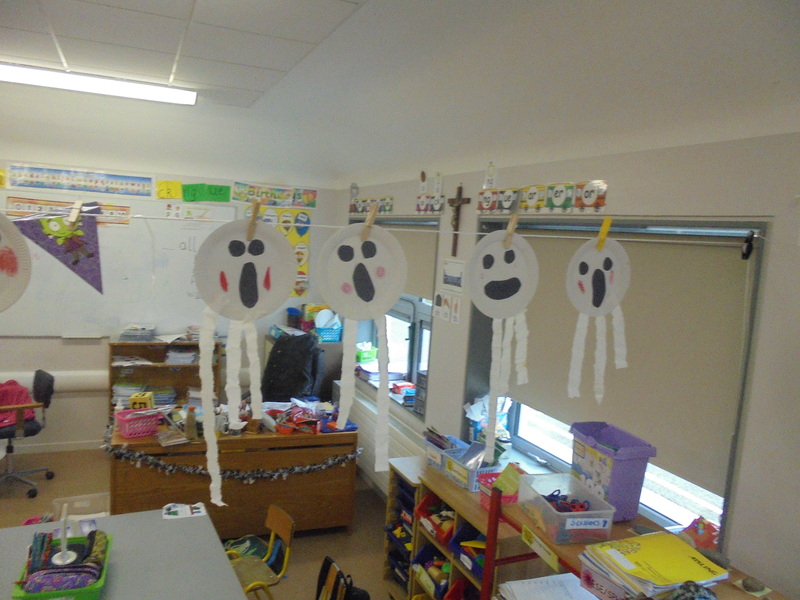 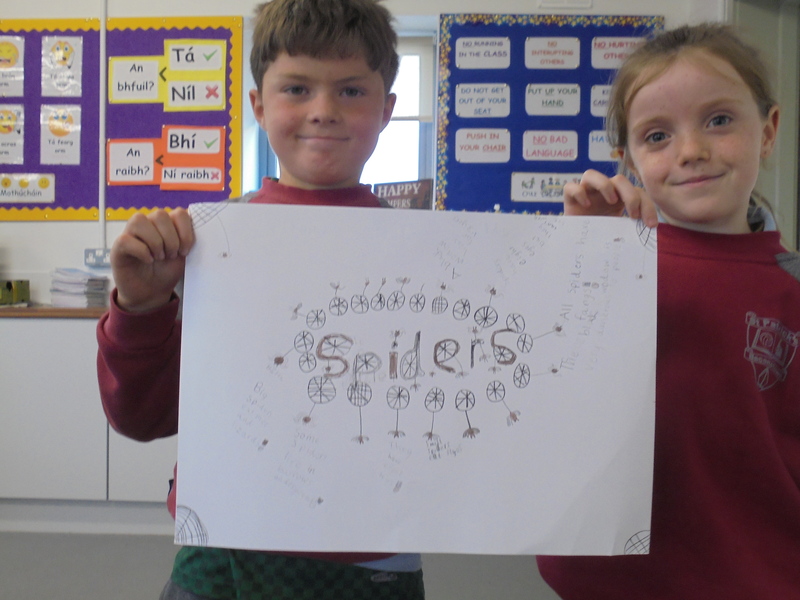 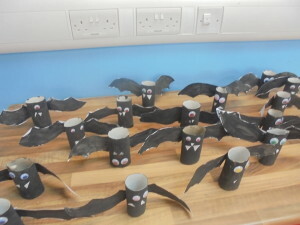 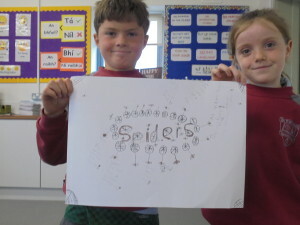 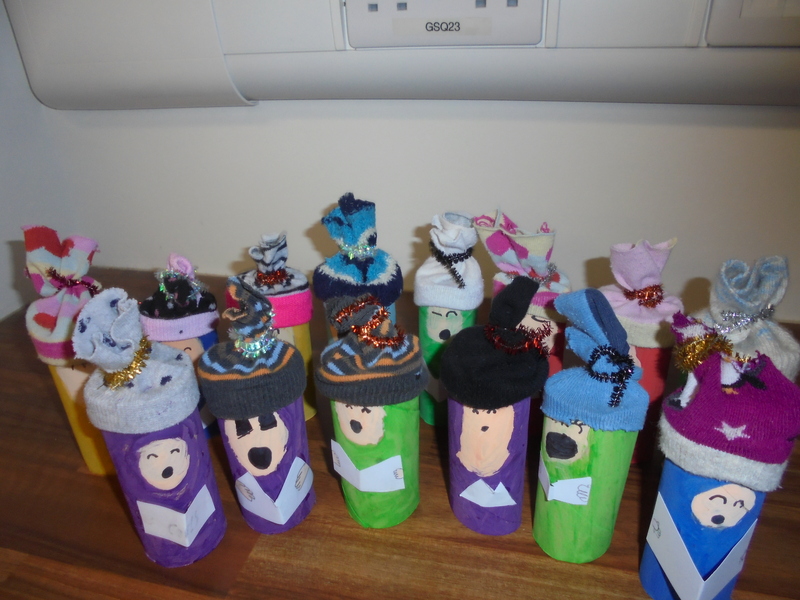 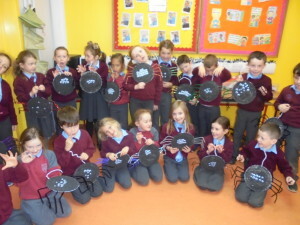 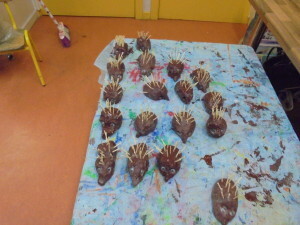 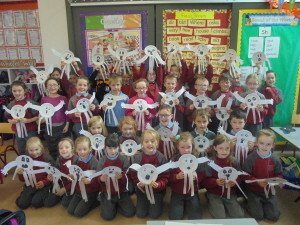 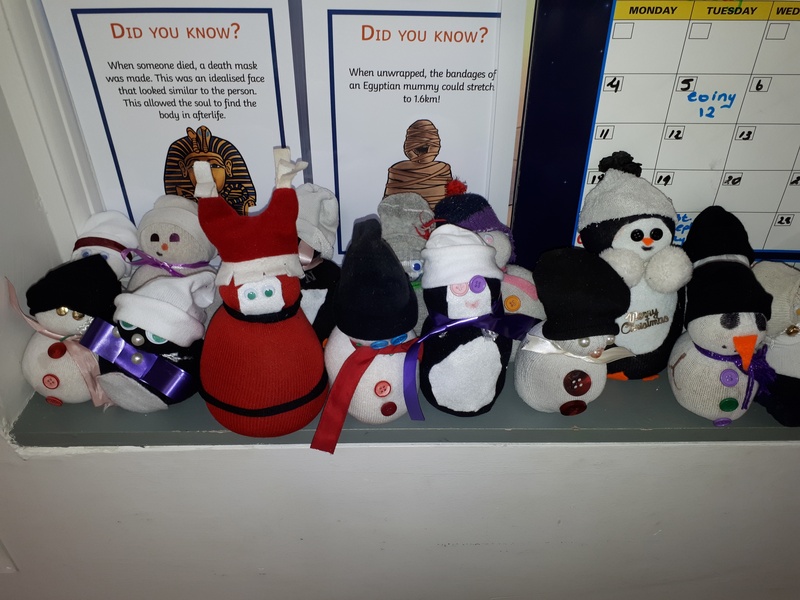 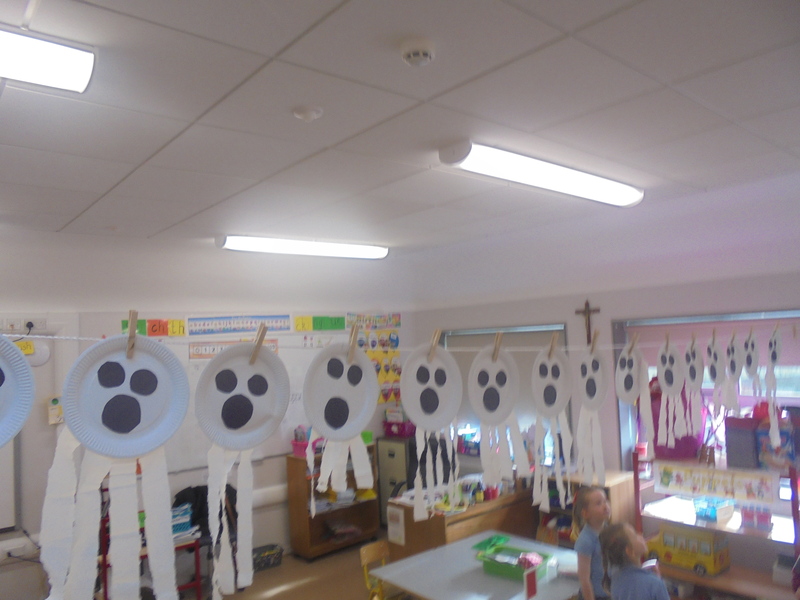 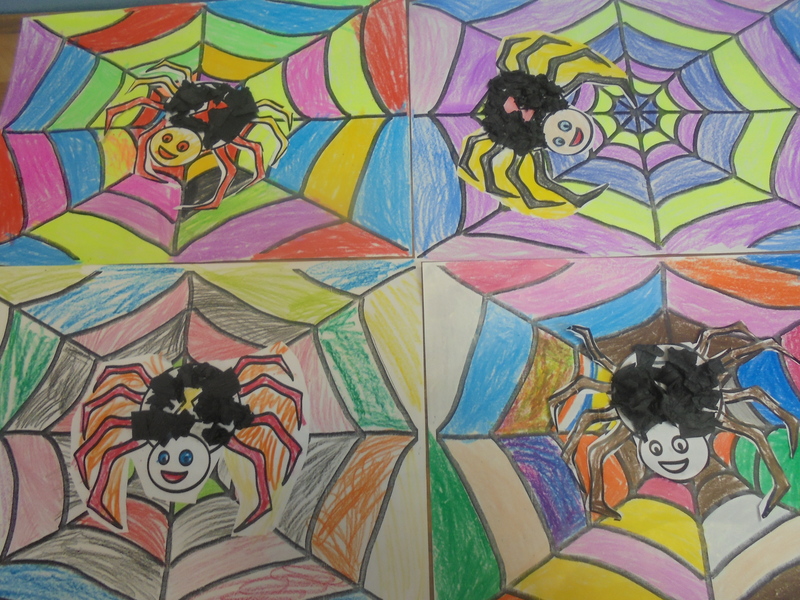 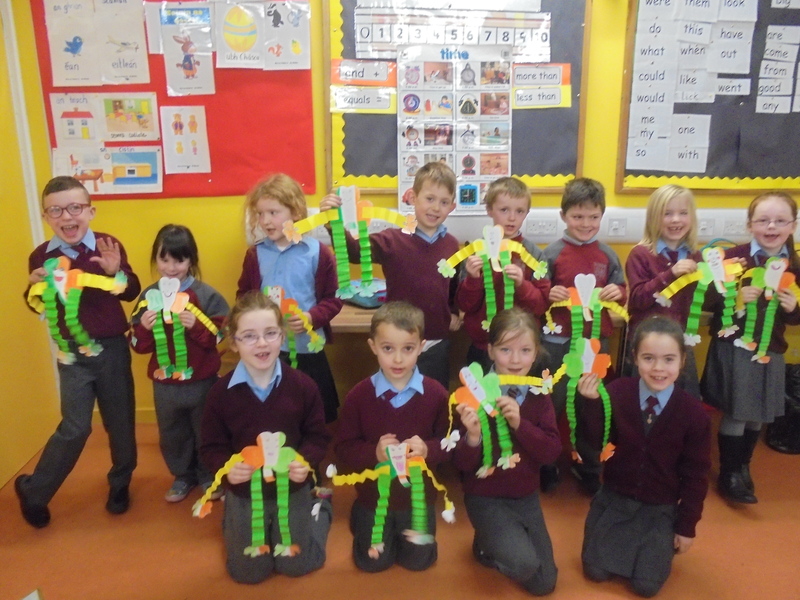 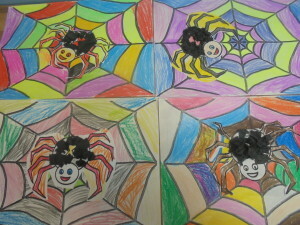 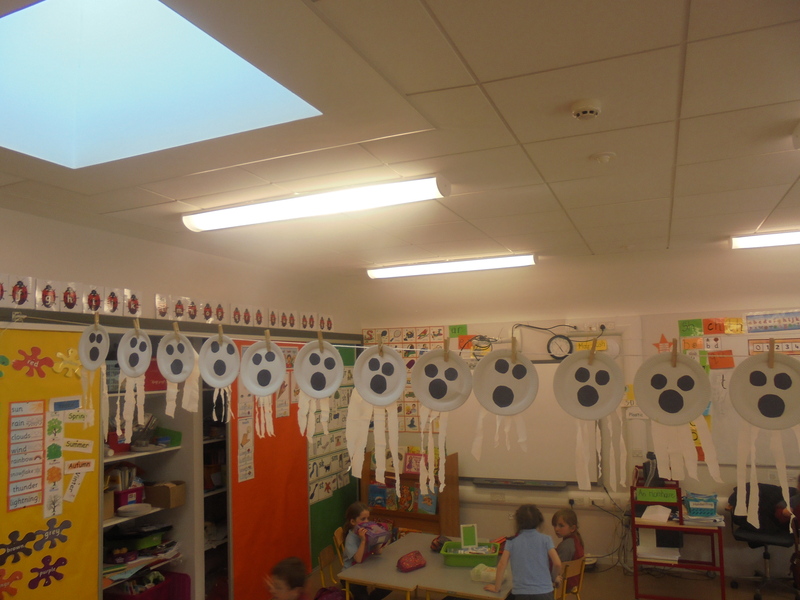 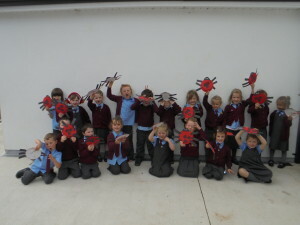 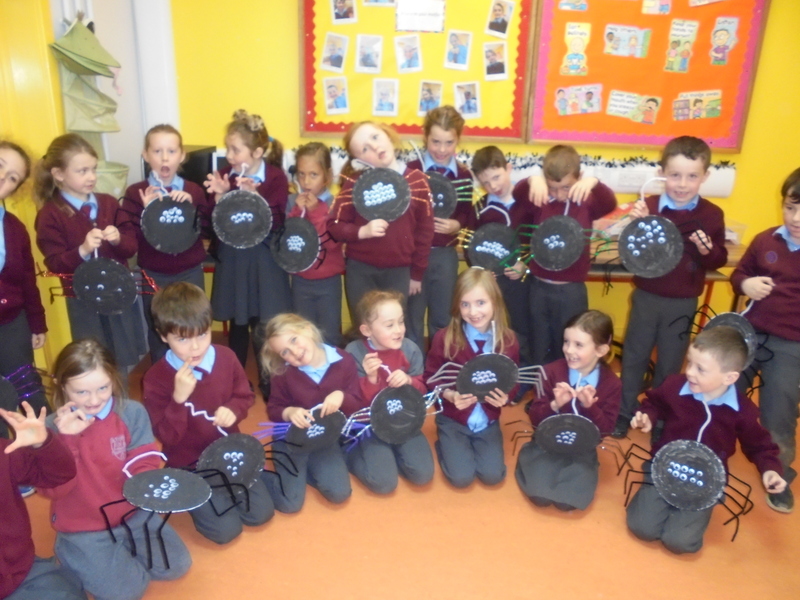 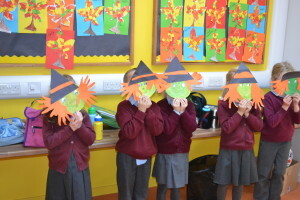 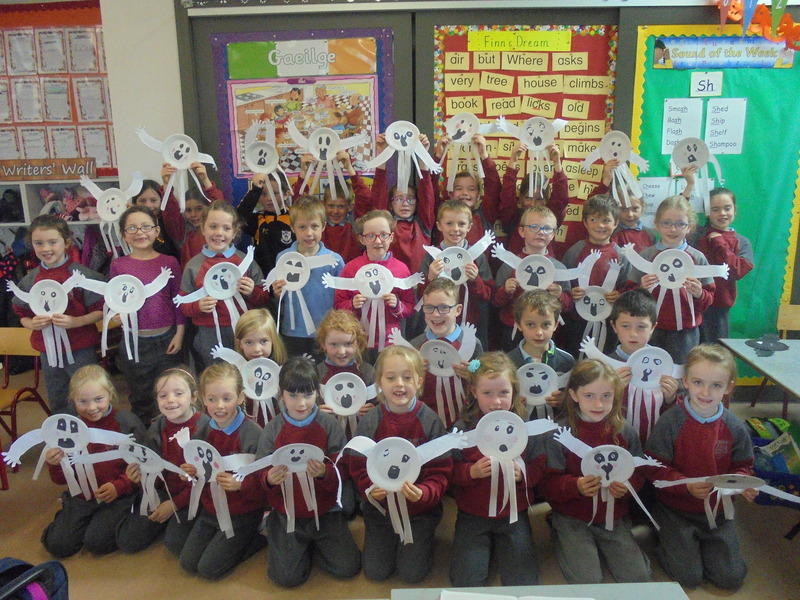 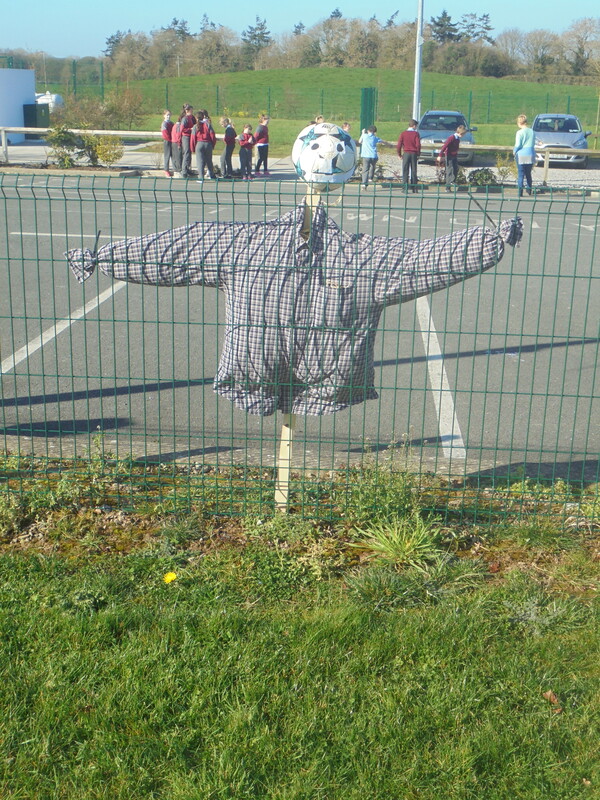 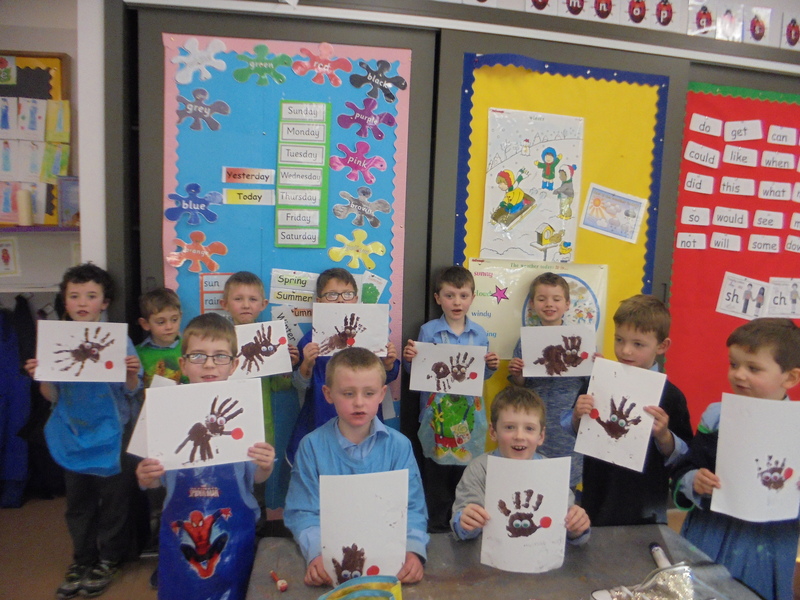 Ms Keogh’s 1st class made Hallowe’en spiders in art and made dressed up as mummies! 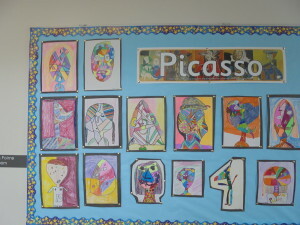 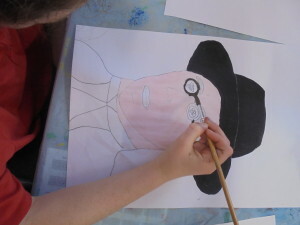 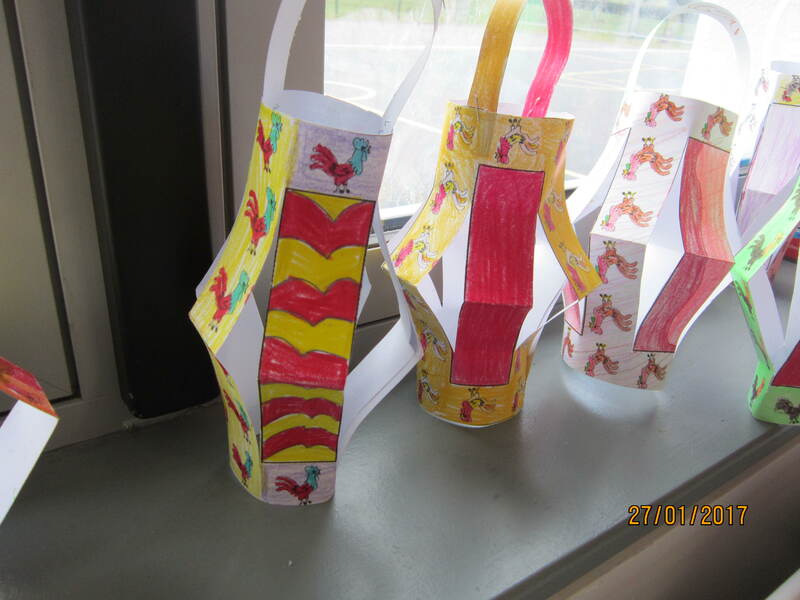 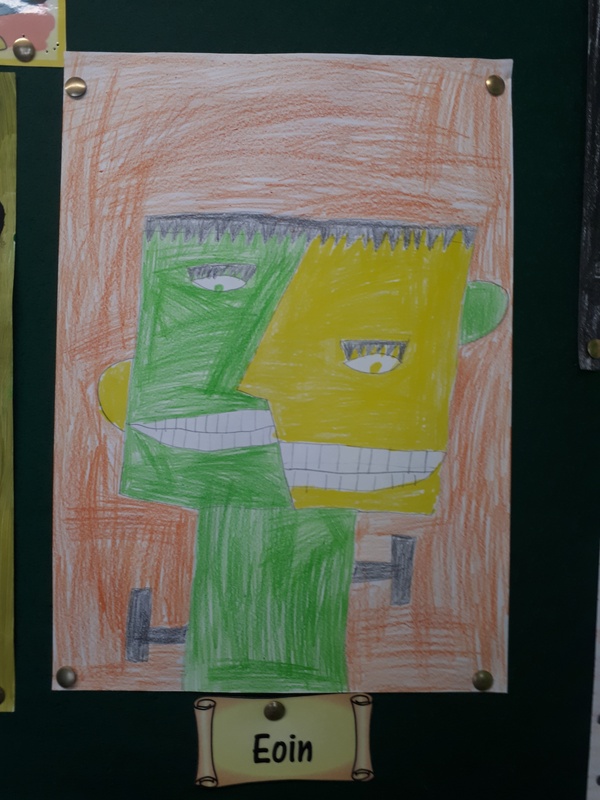 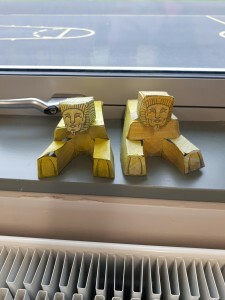 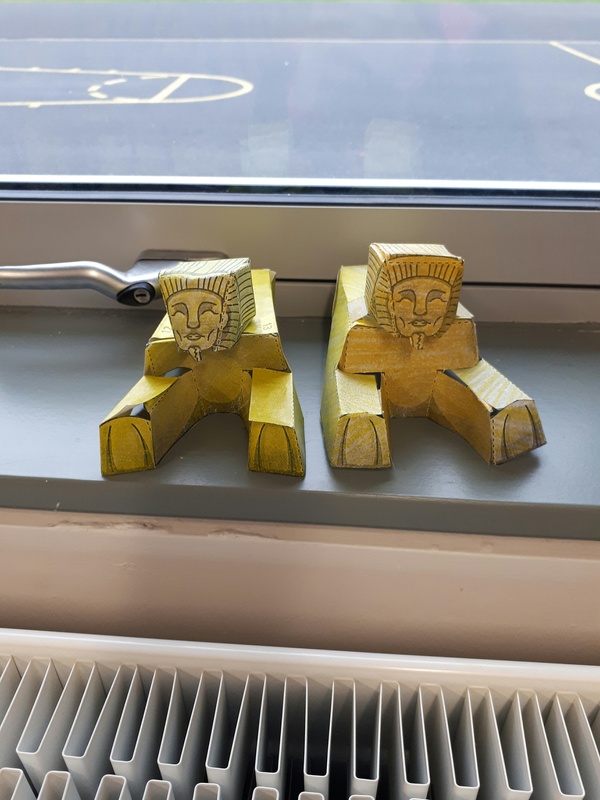 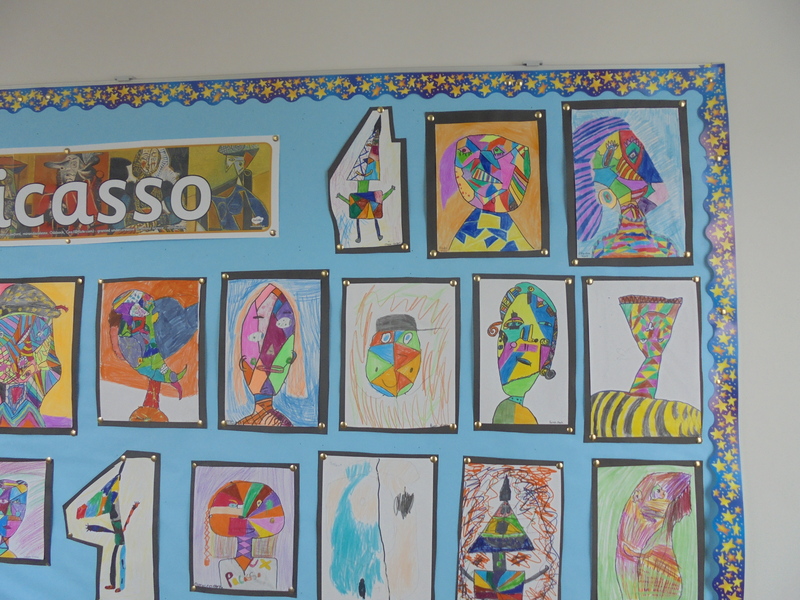 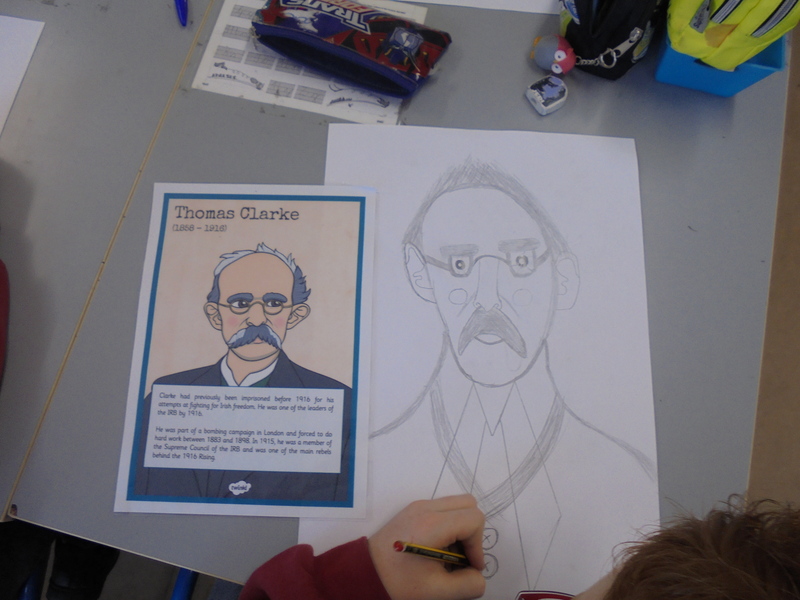 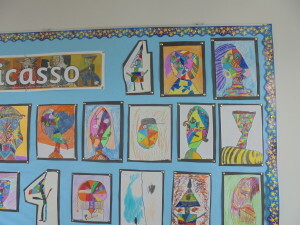 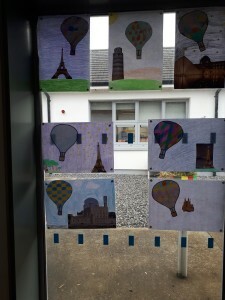 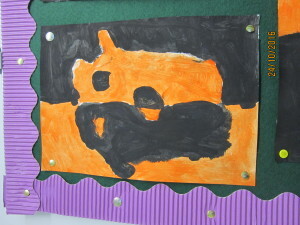 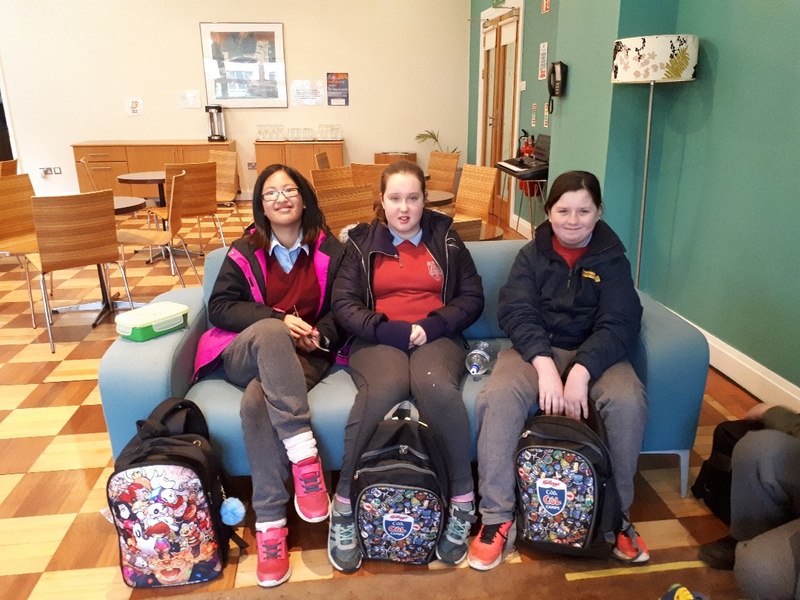 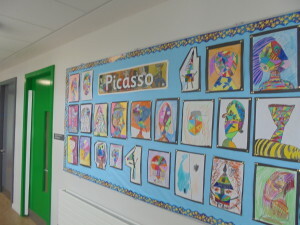 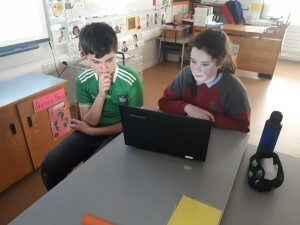 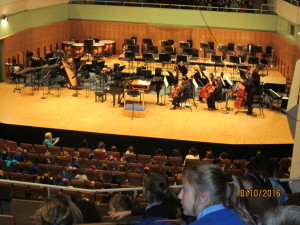 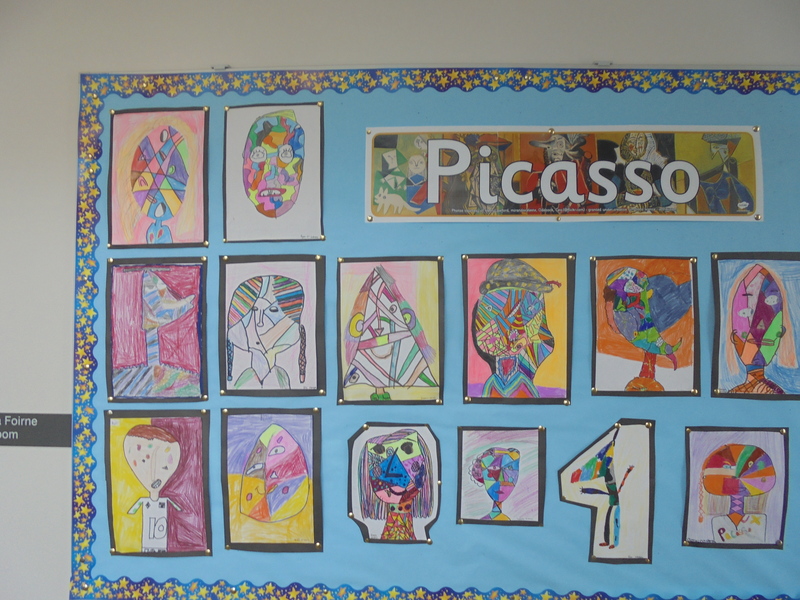 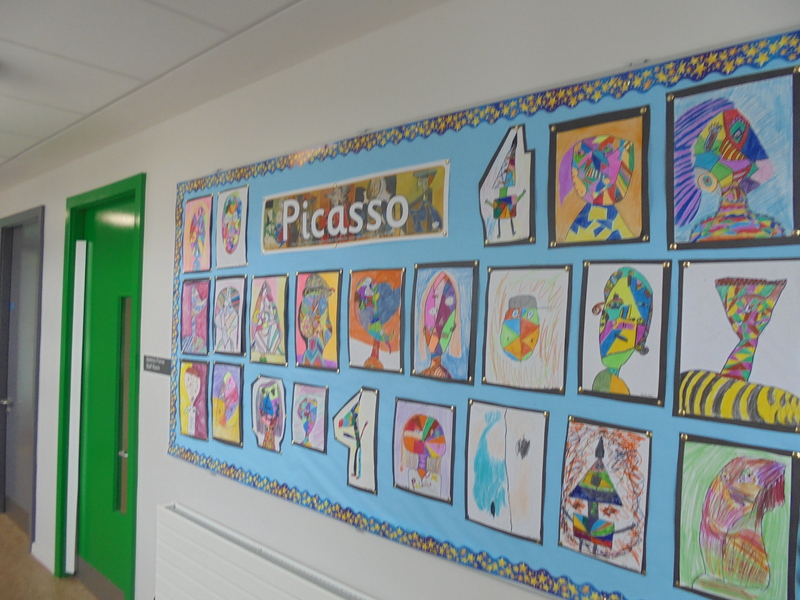 Ms Murphy’s 6th class were looking at cubism, a technique used by Pablo Picasso. 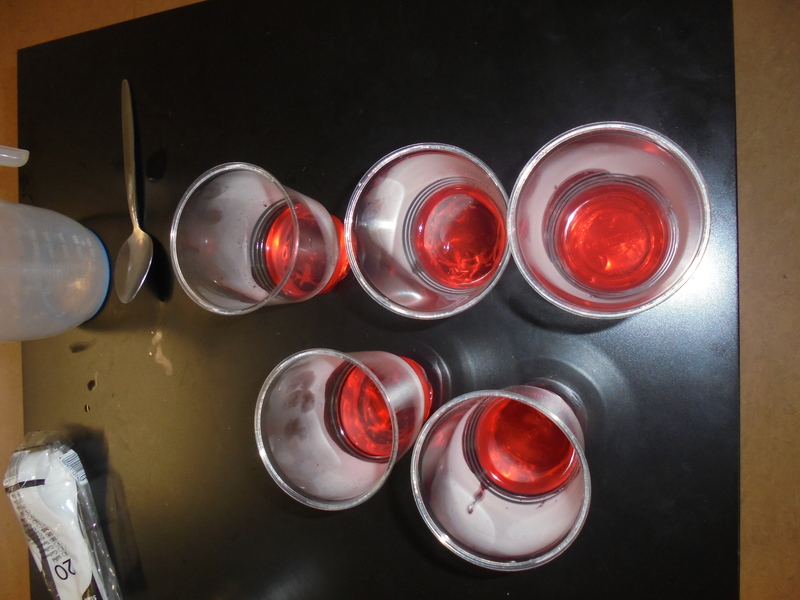 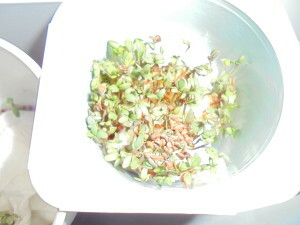 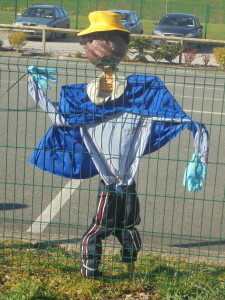 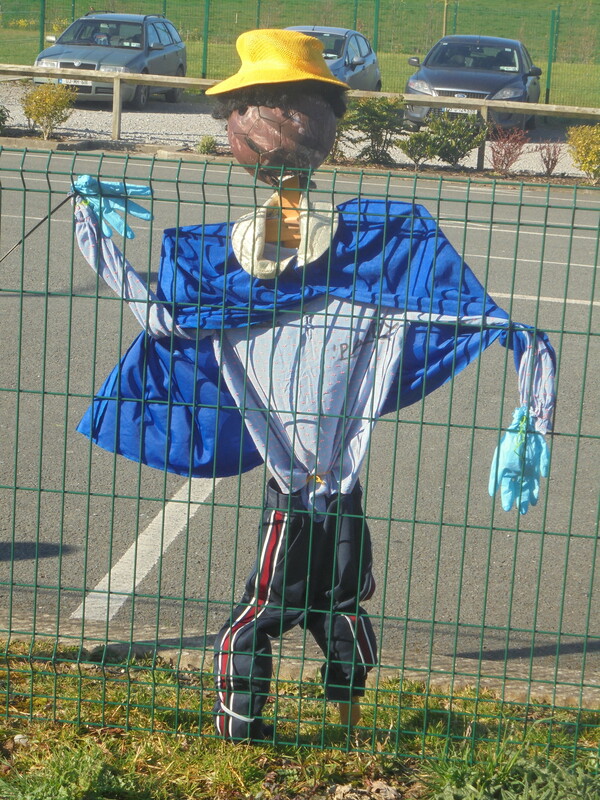 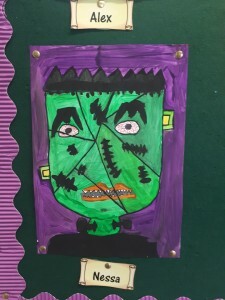 We responded by creating our own Frankensteins. 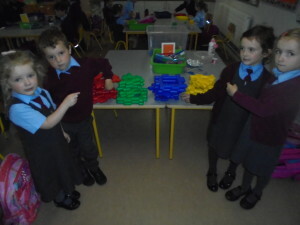 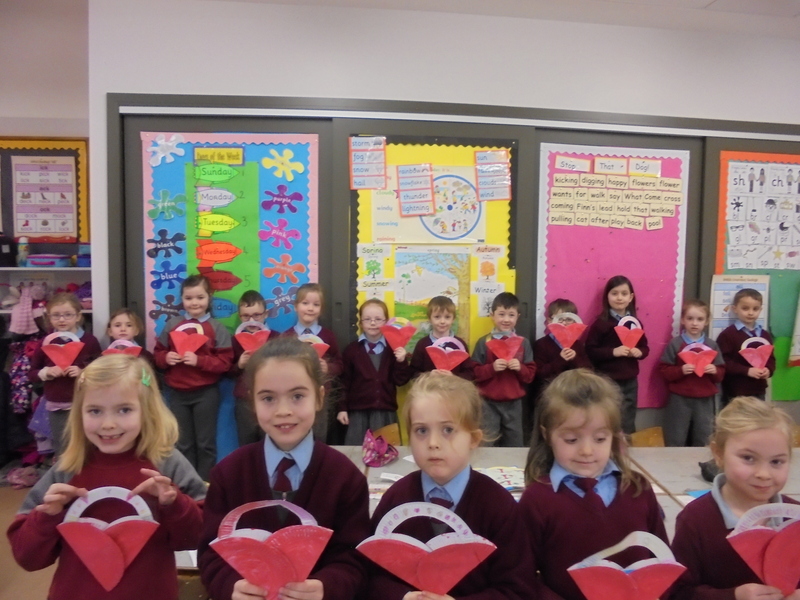 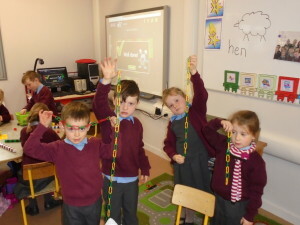 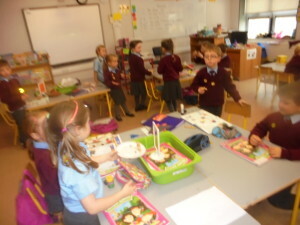 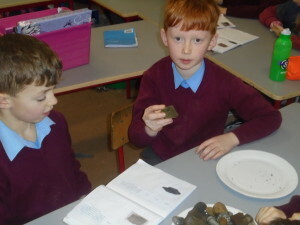 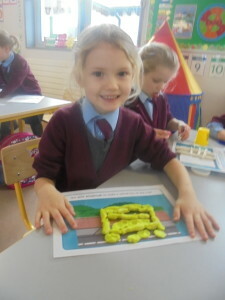 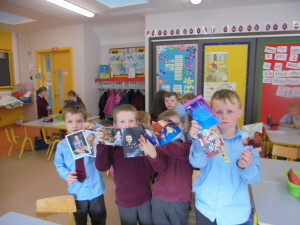 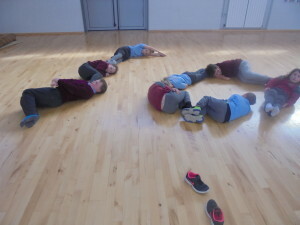 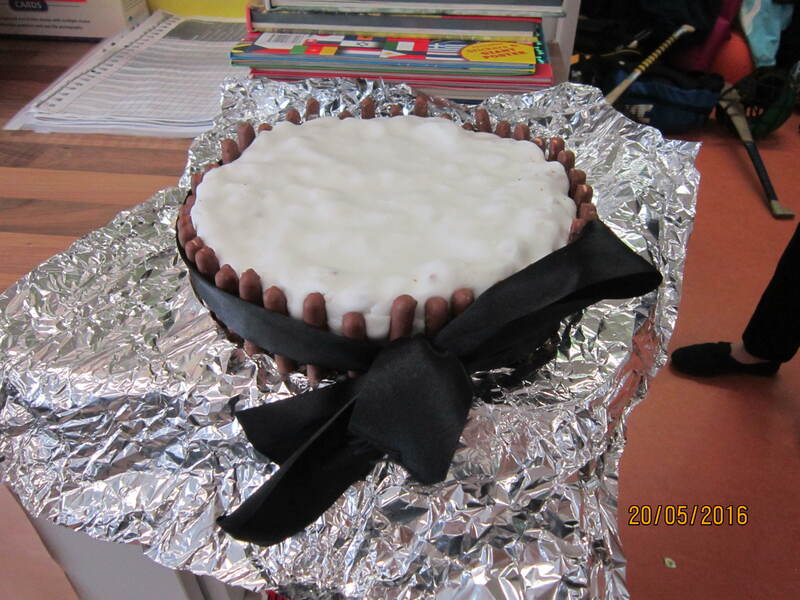 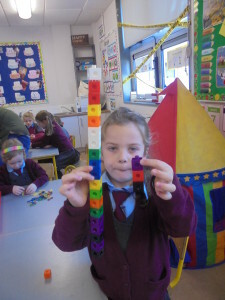 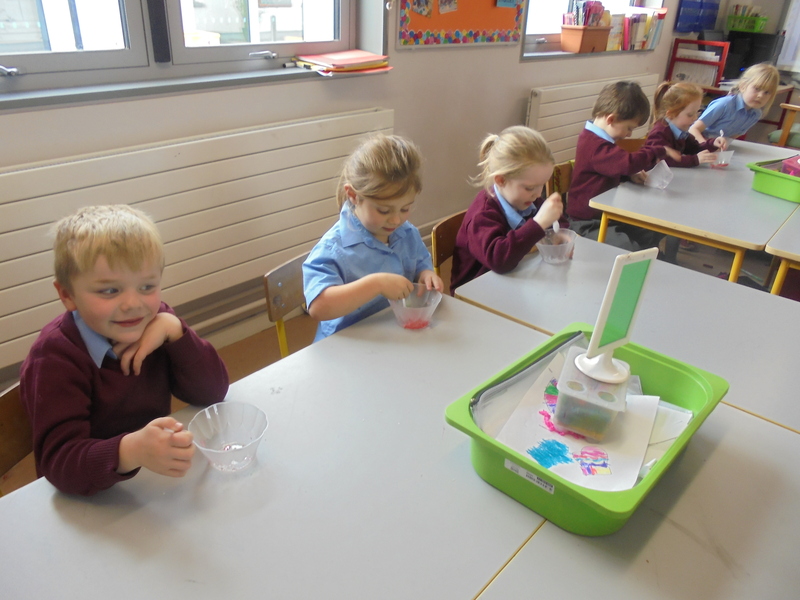 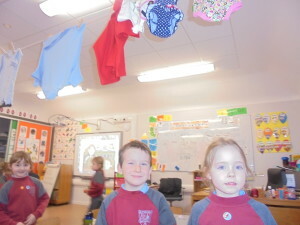 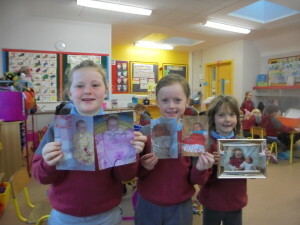 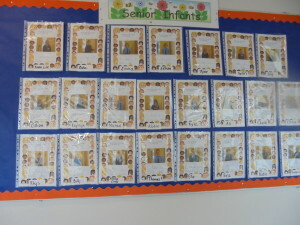 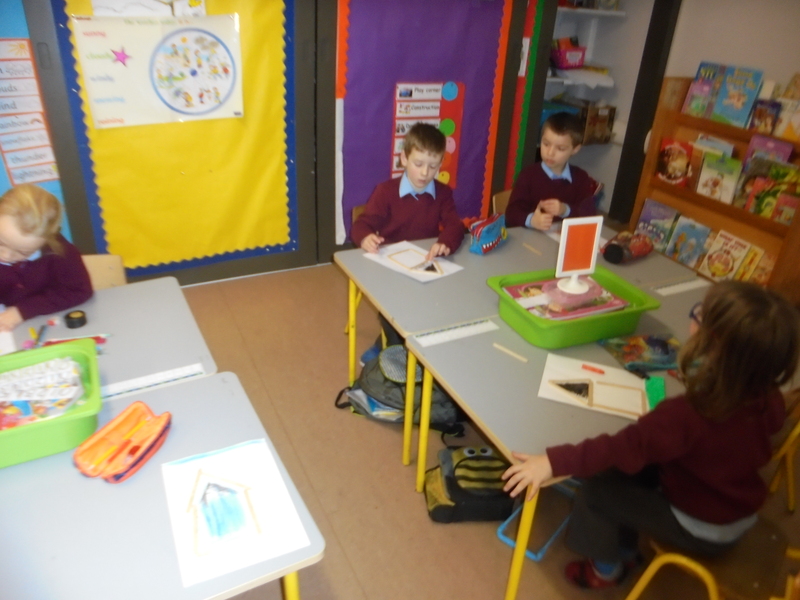 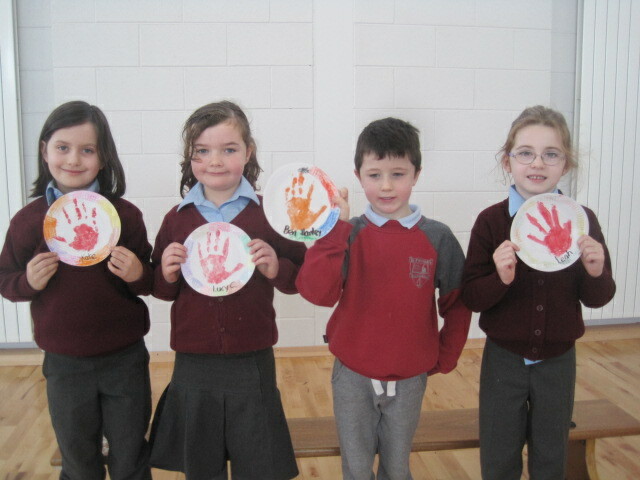 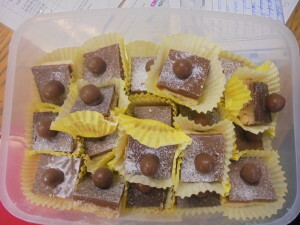 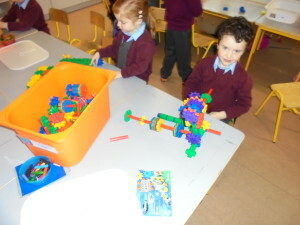 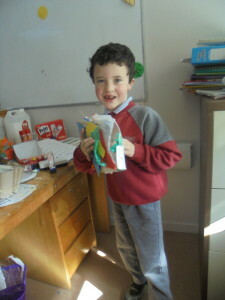 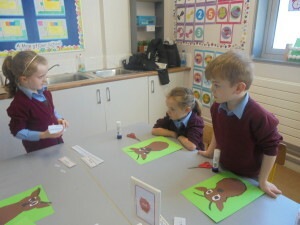 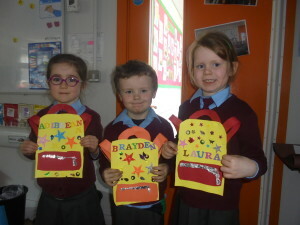 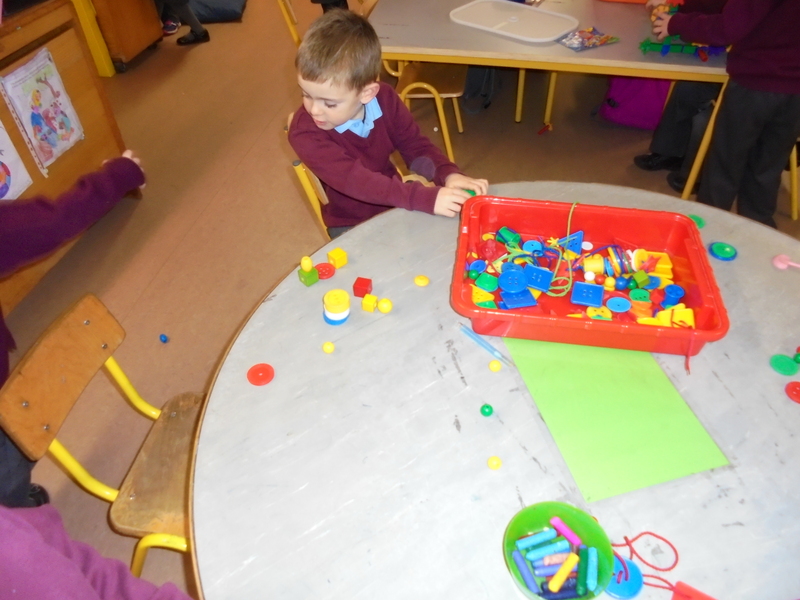 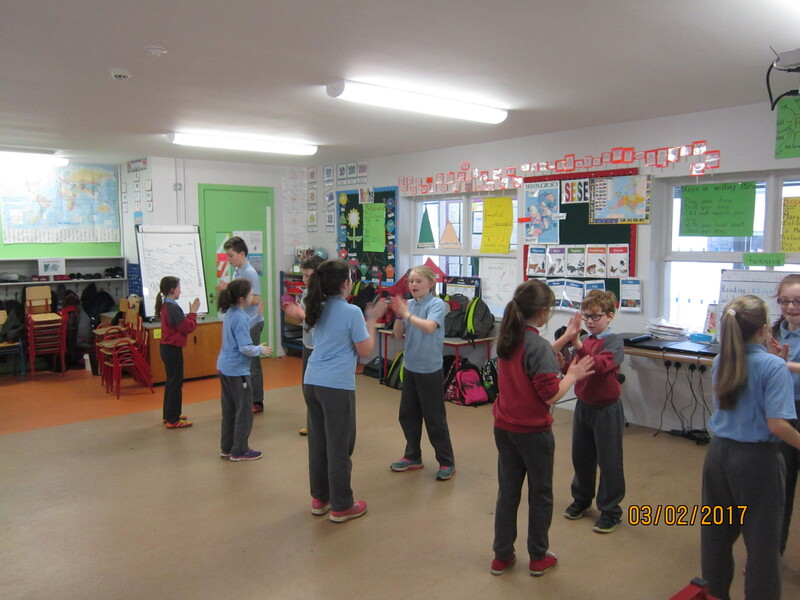 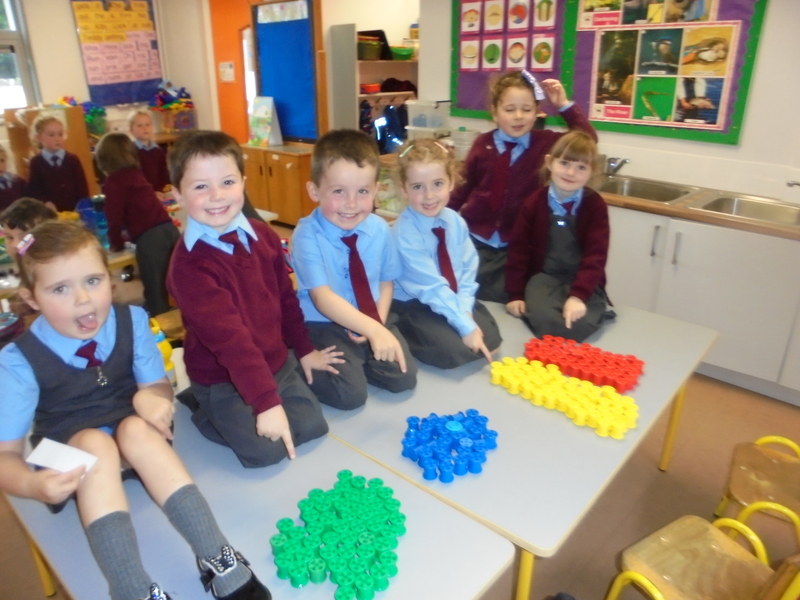 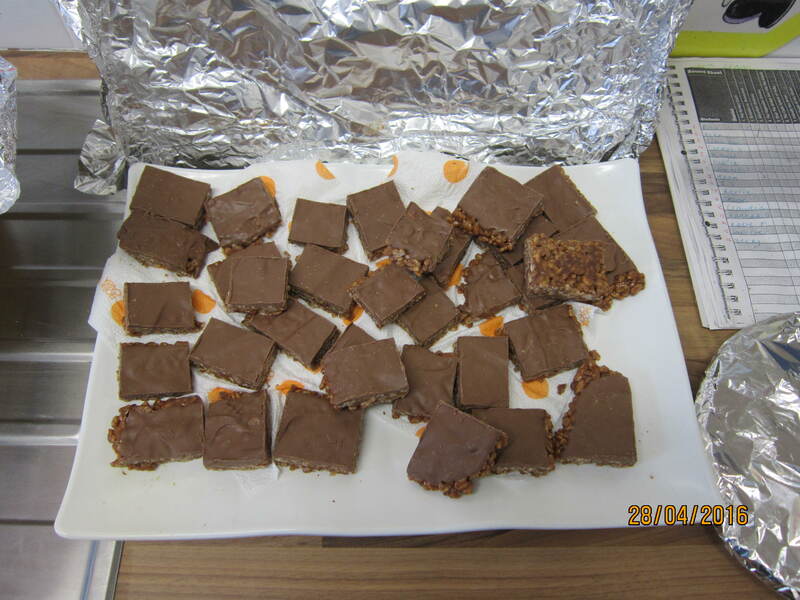 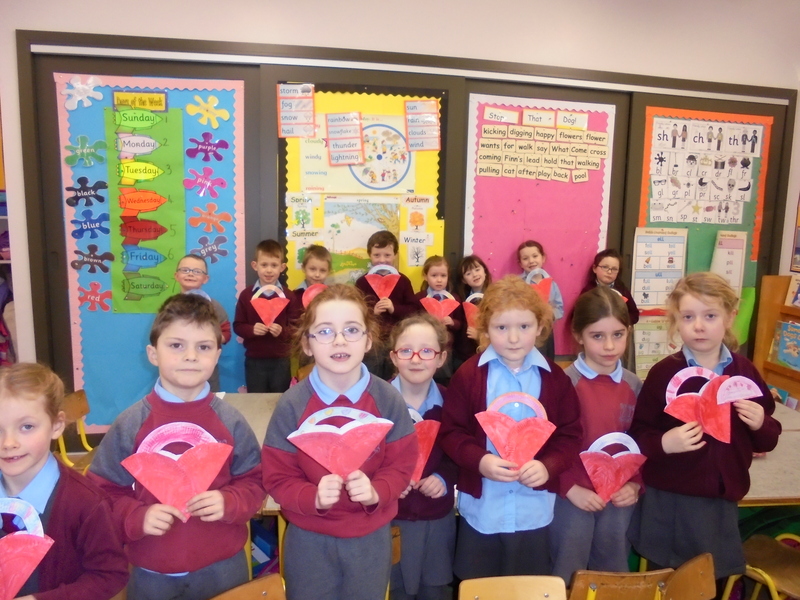 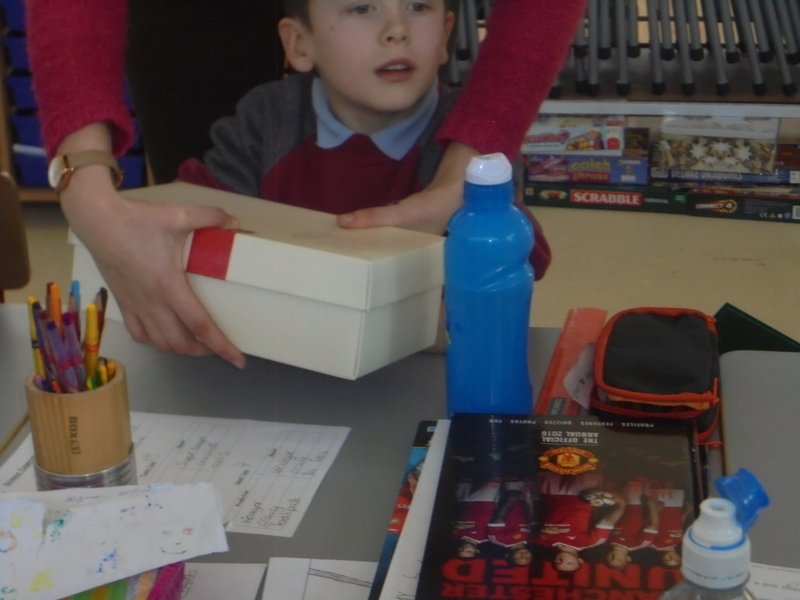 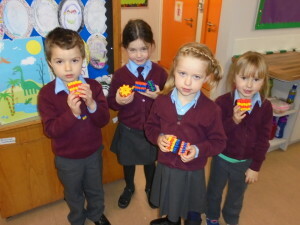 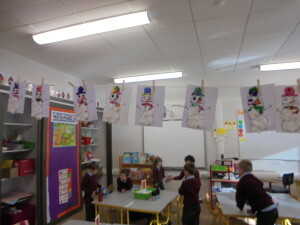 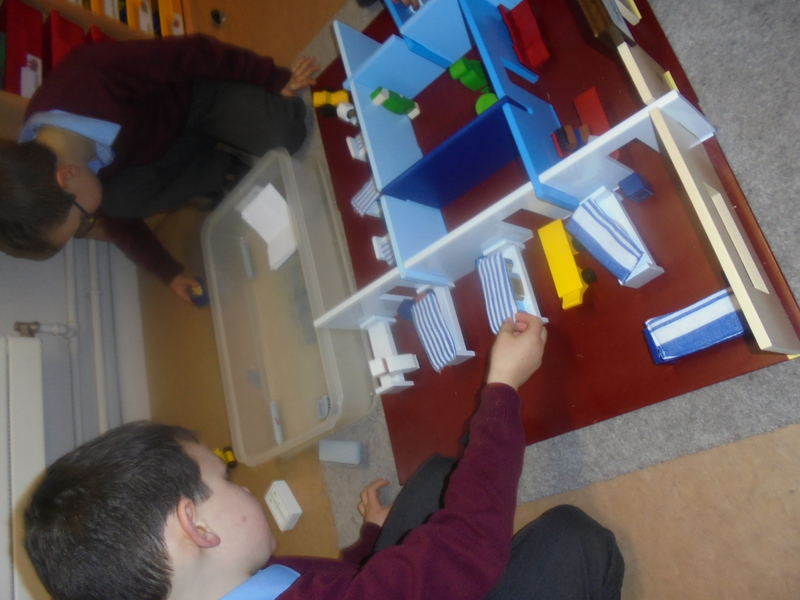 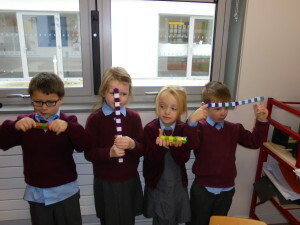 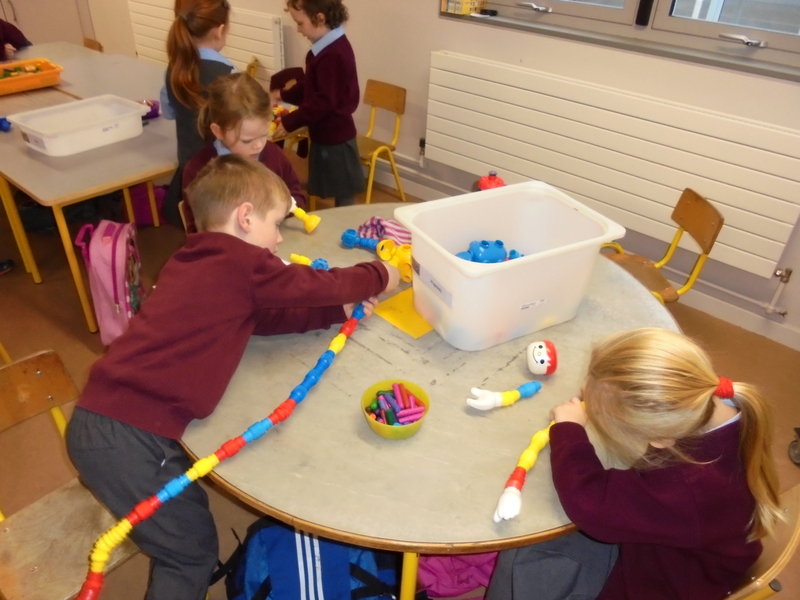 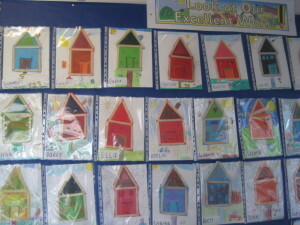 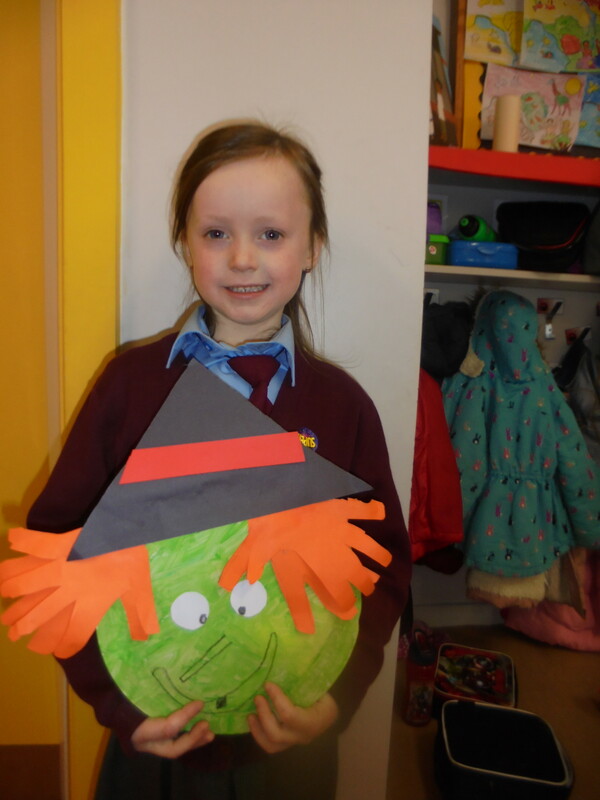 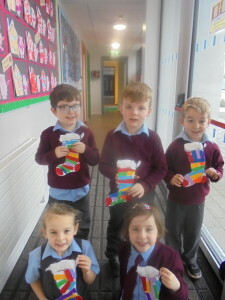 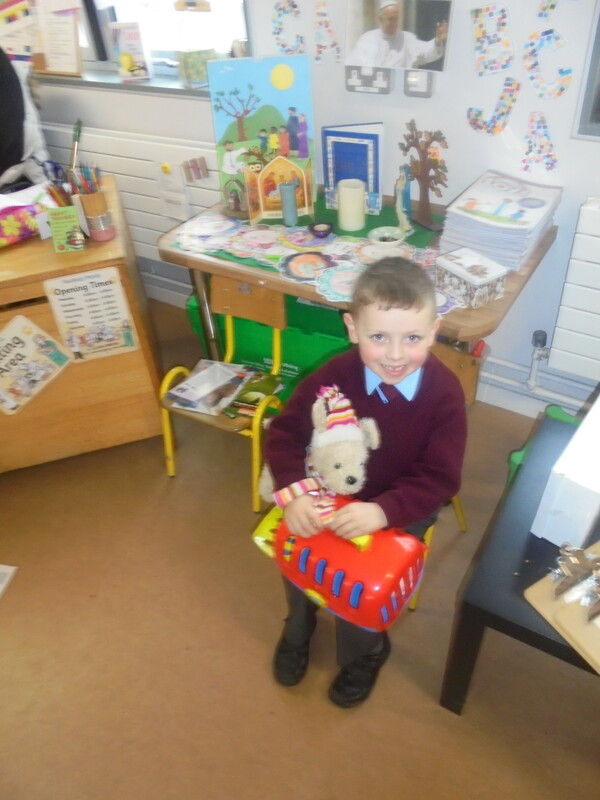 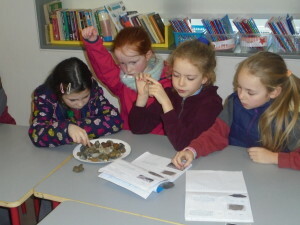 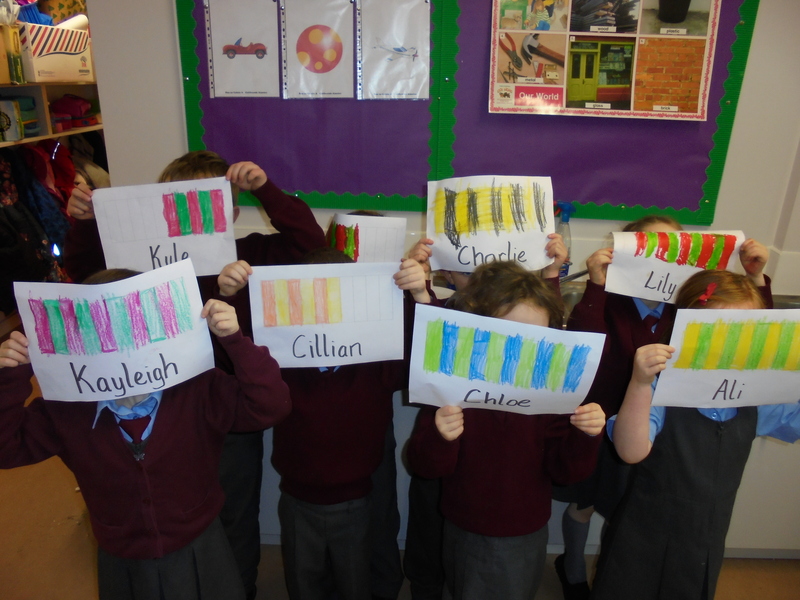 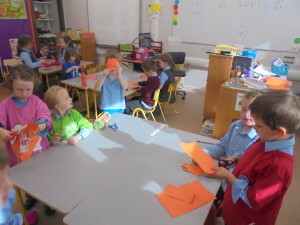 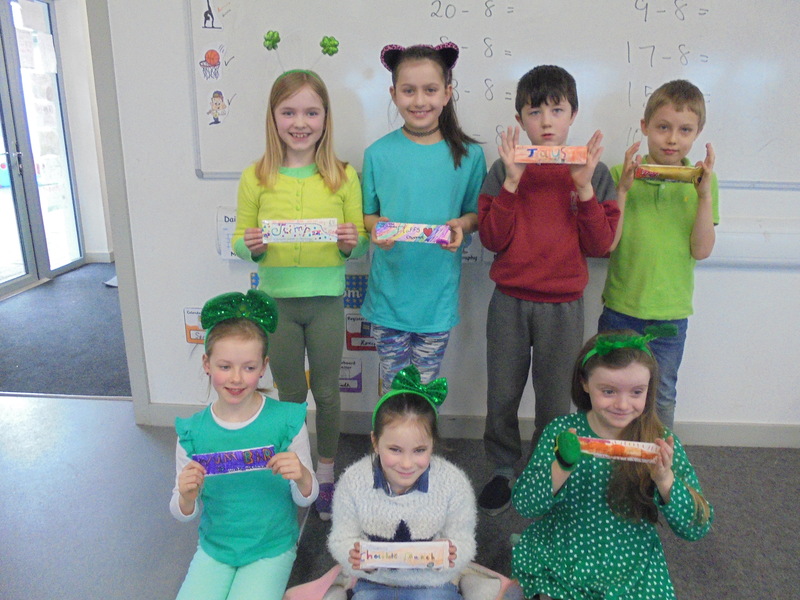 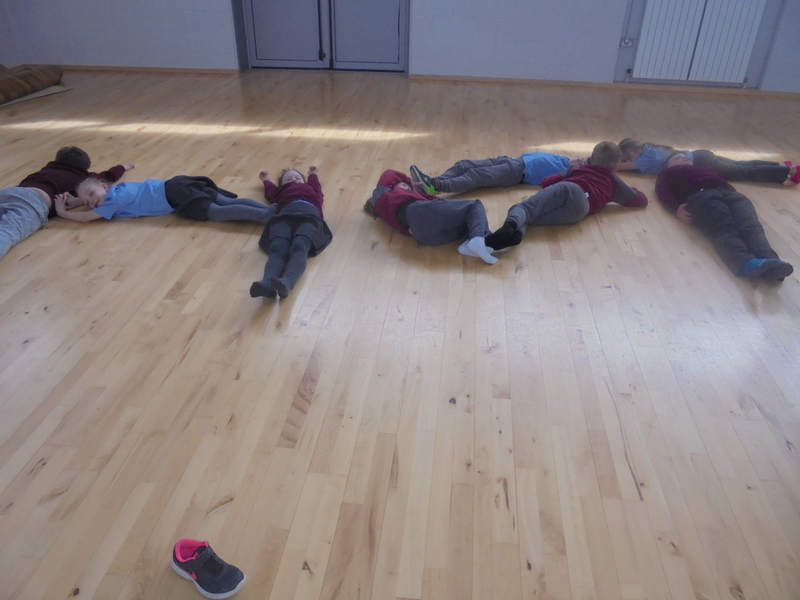 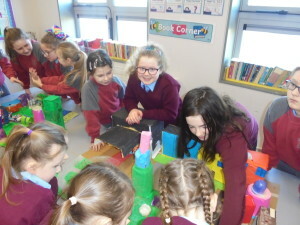 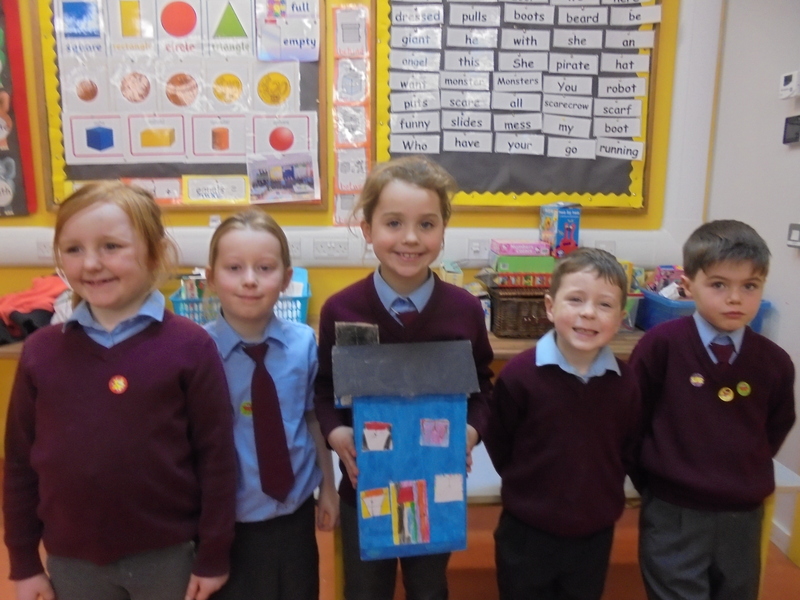 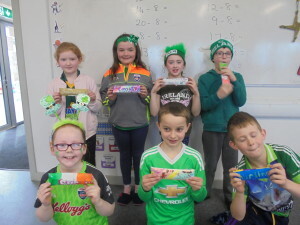 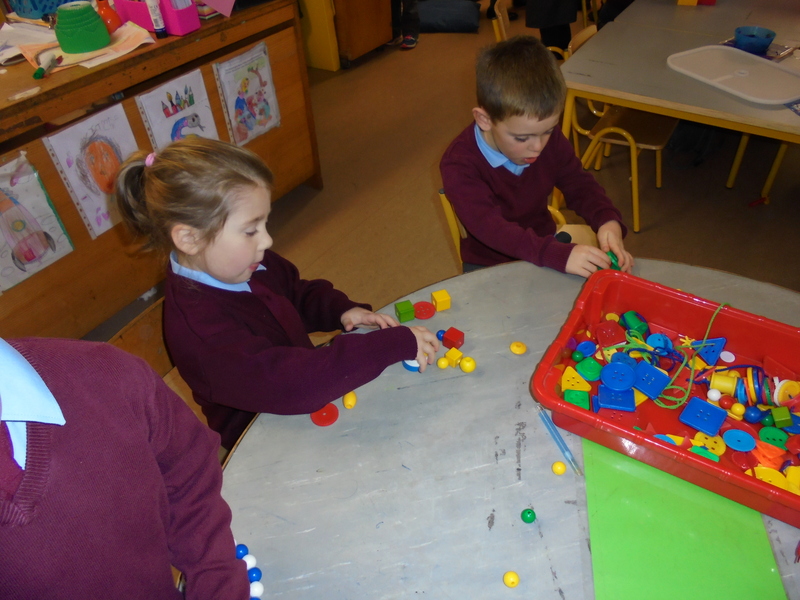 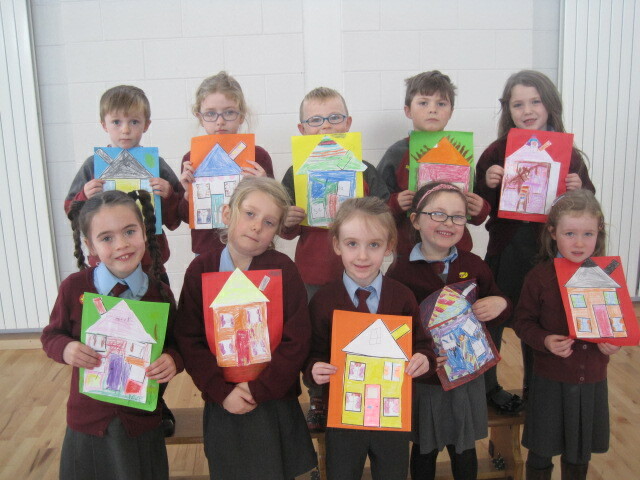 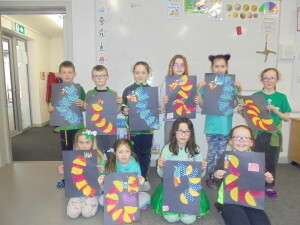 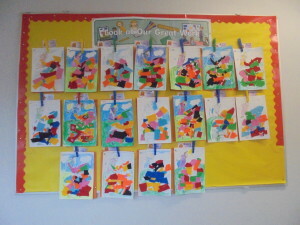 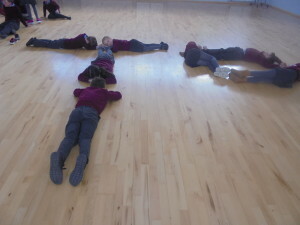 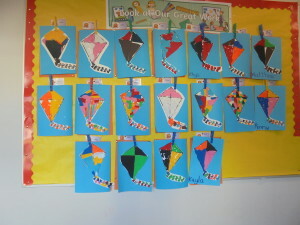 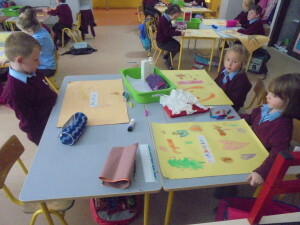 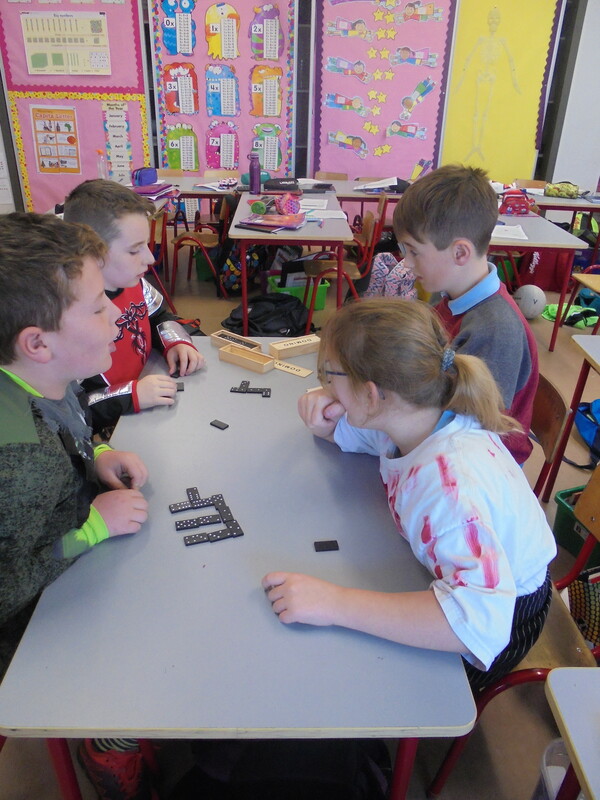 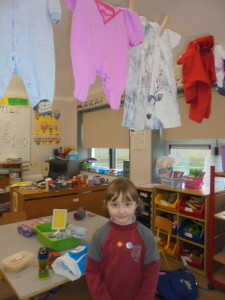 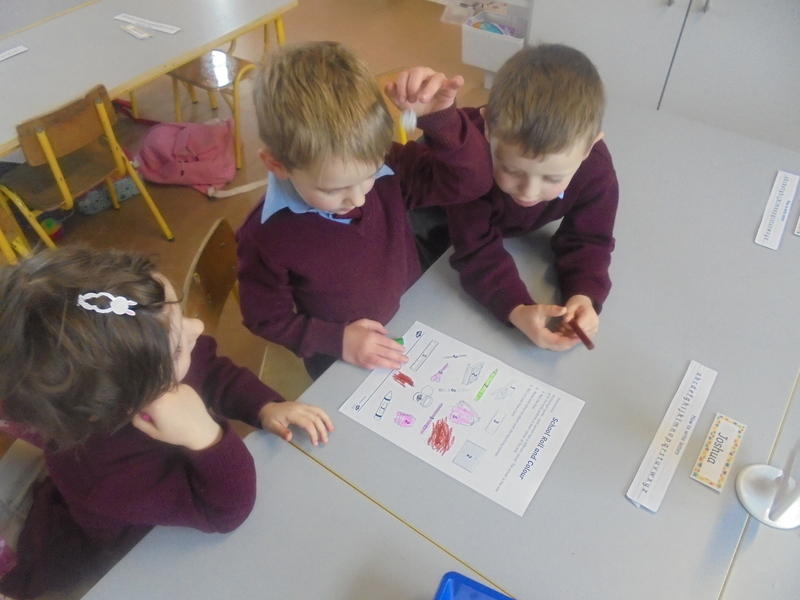 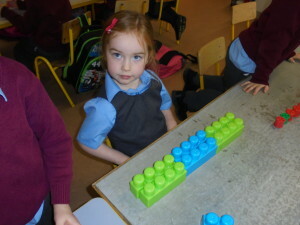 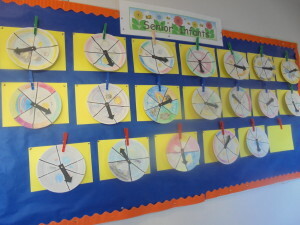 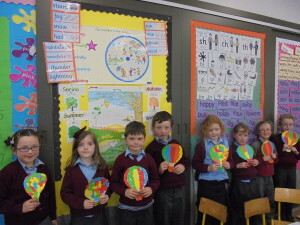 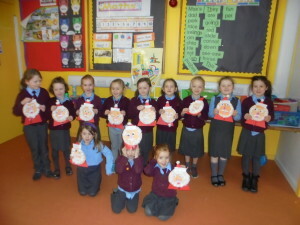 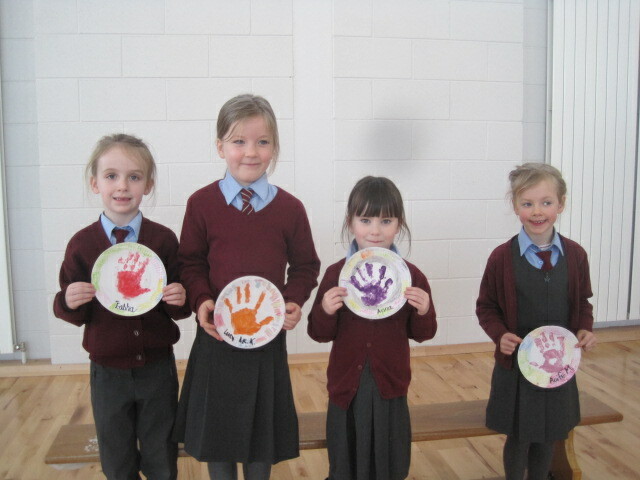 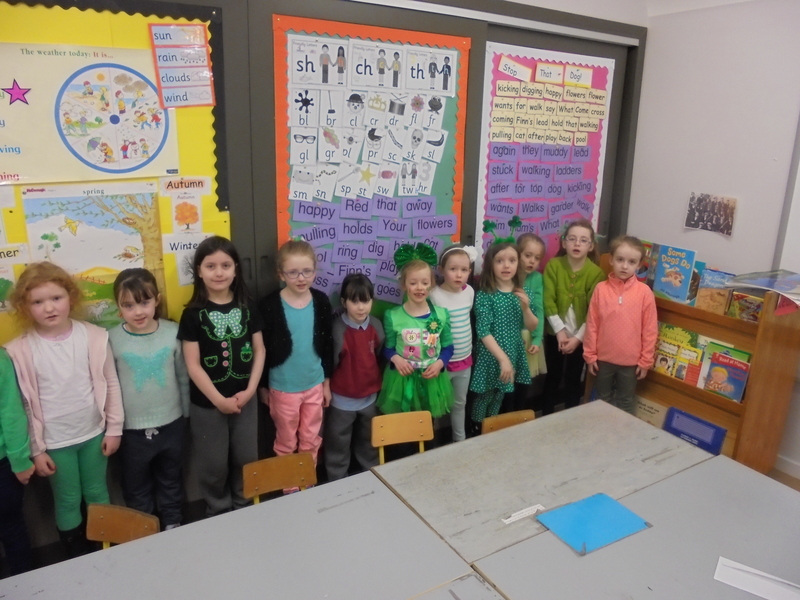 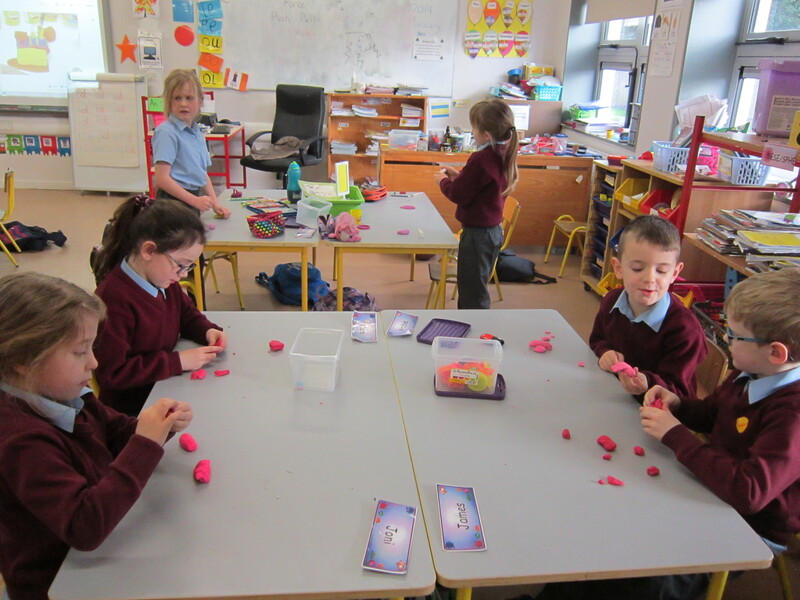 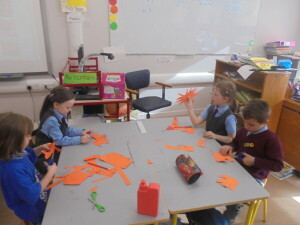 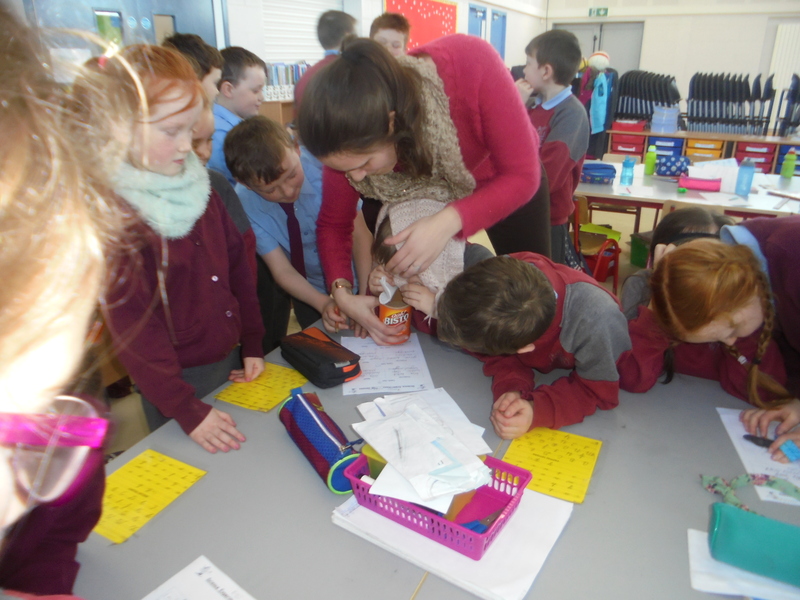 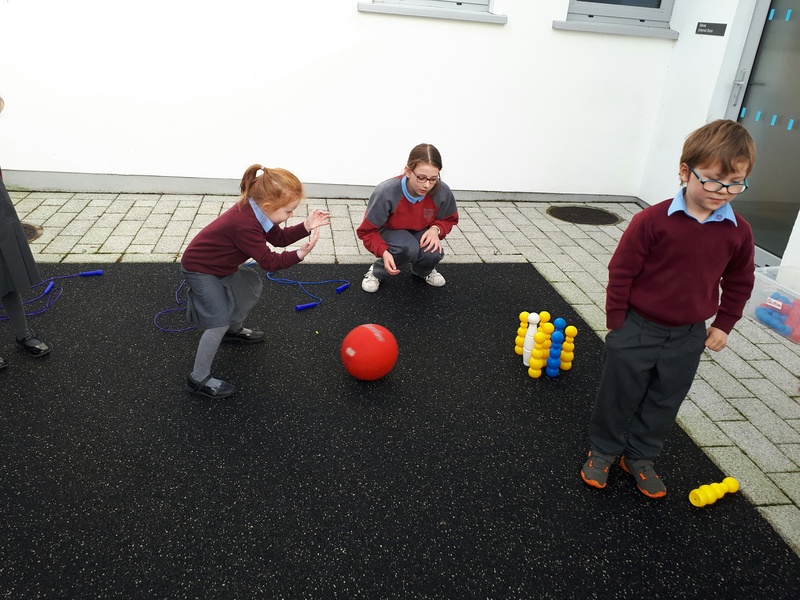 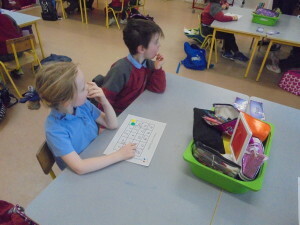 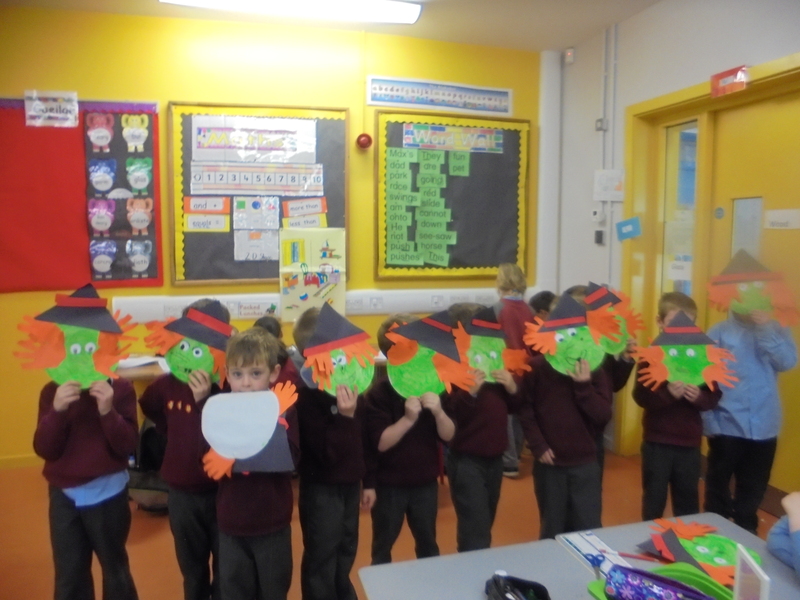 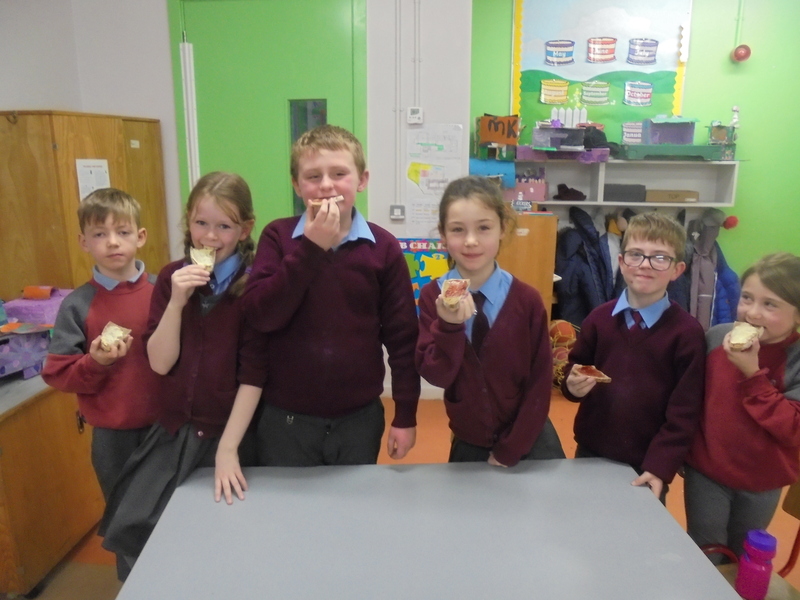 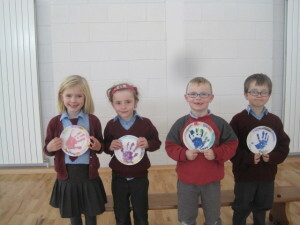 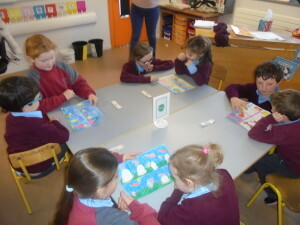 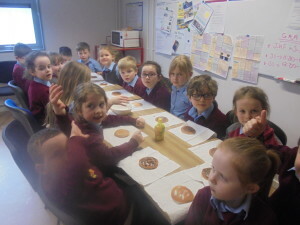 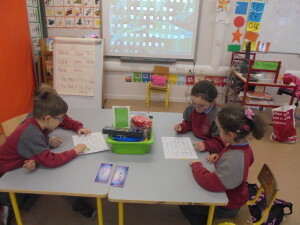 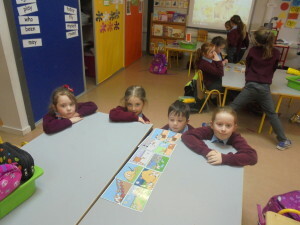 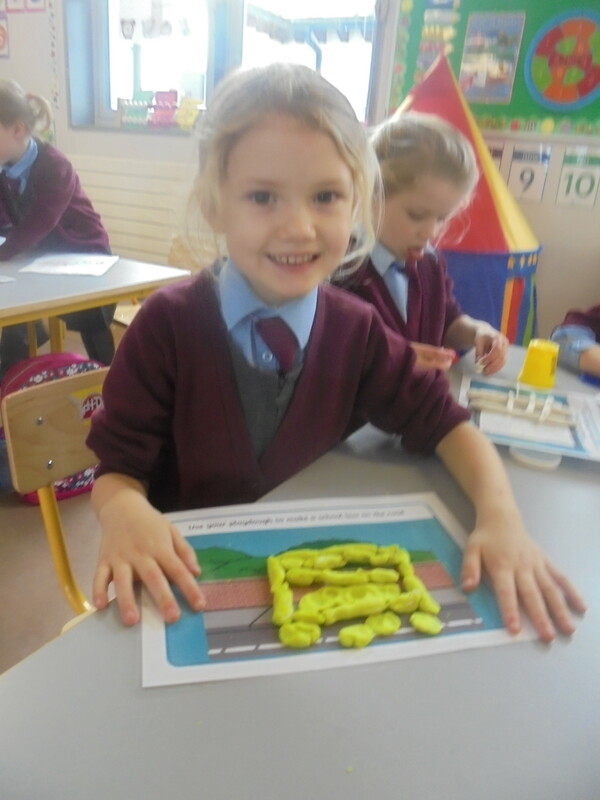 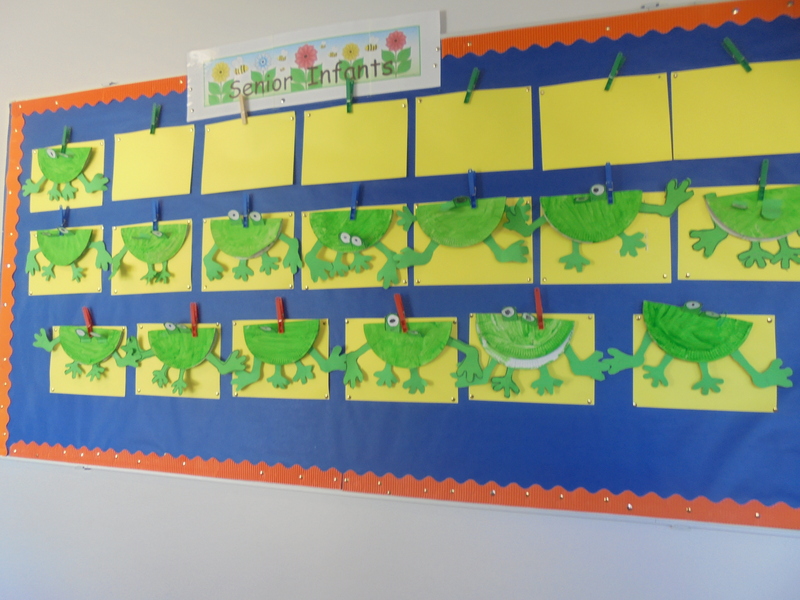 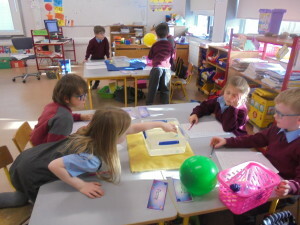 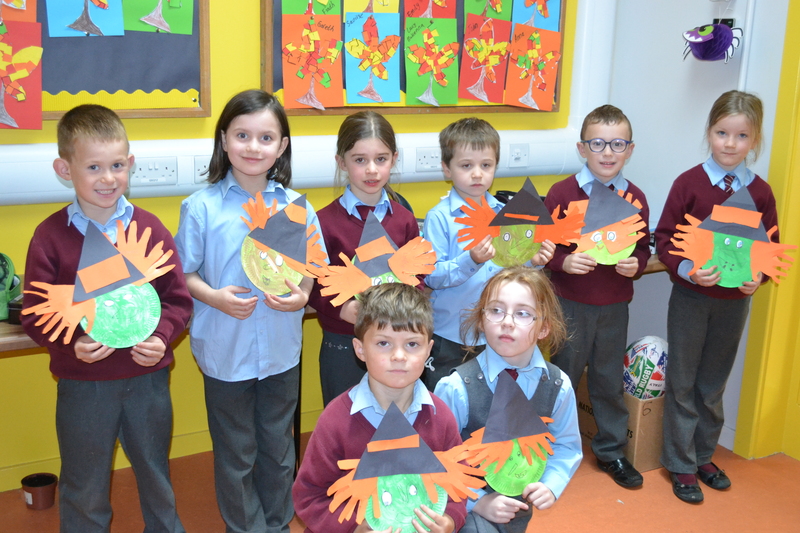 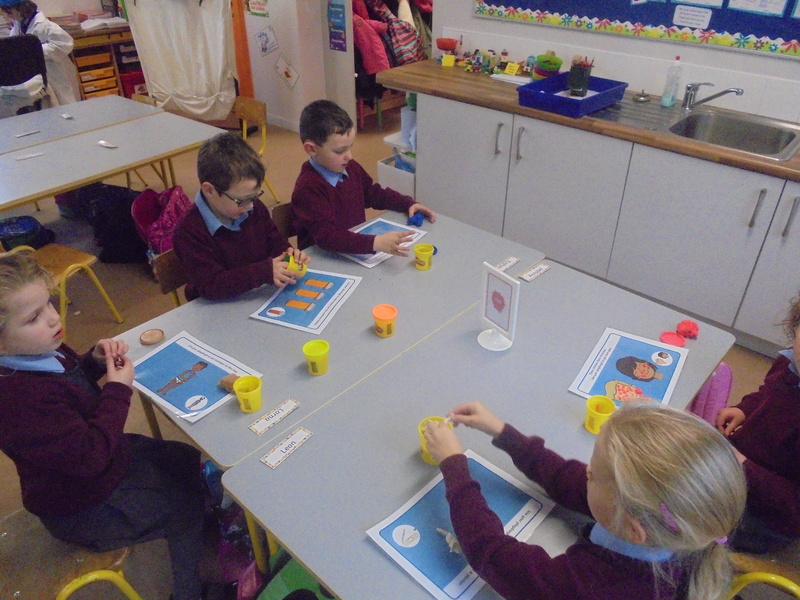 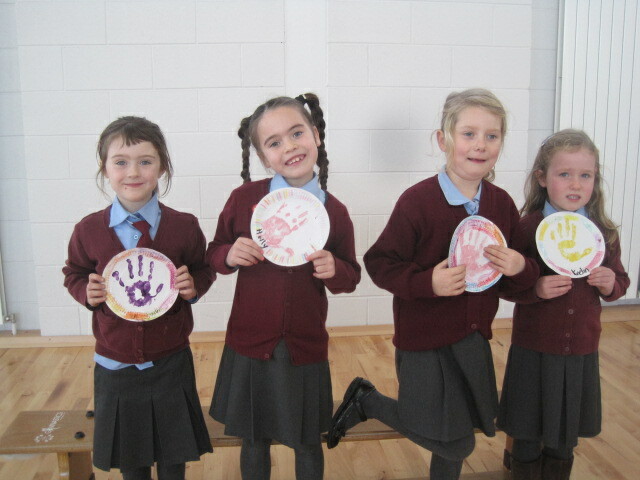 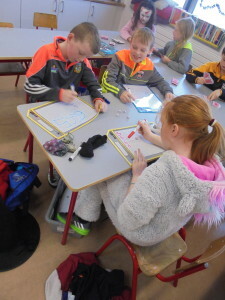 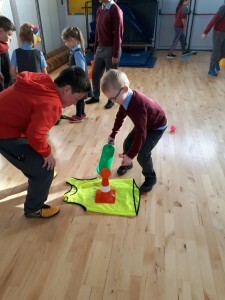 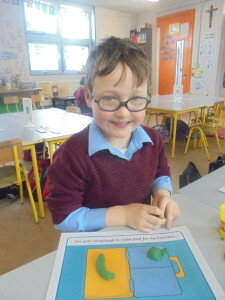 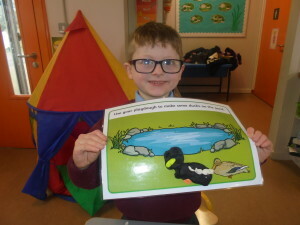 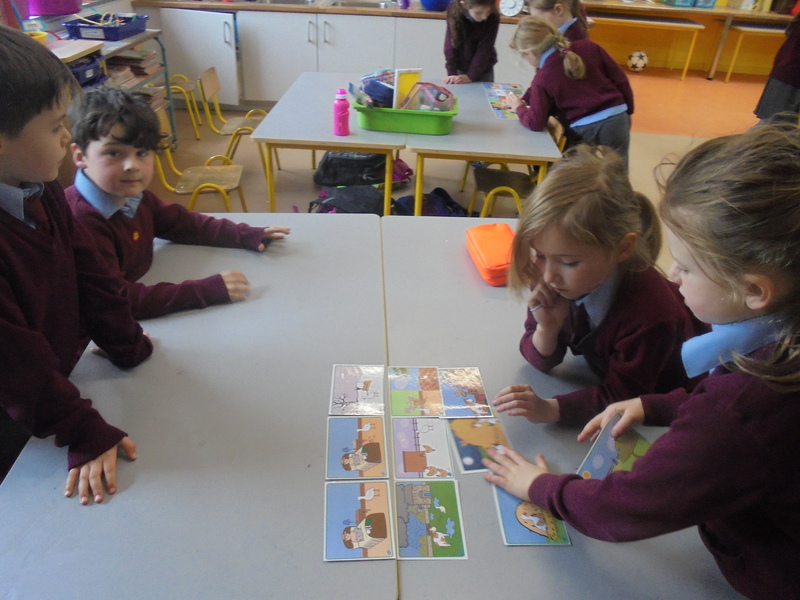 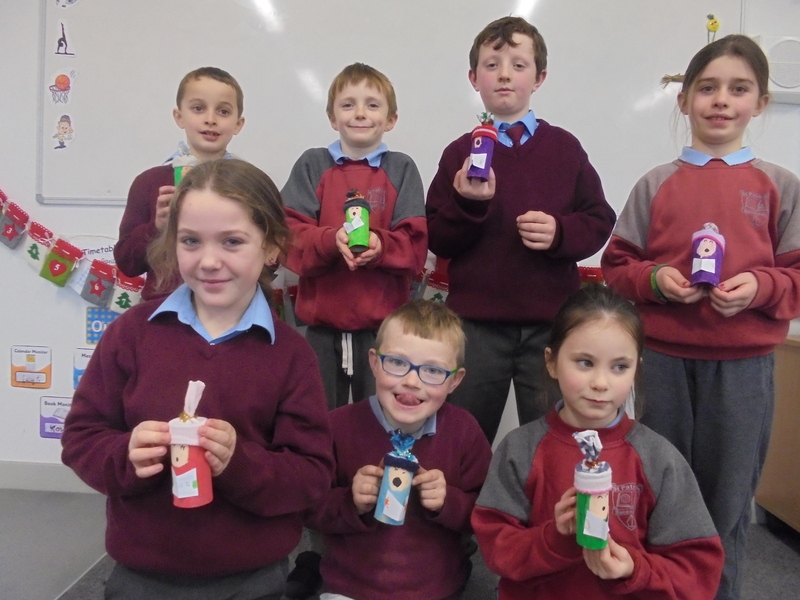 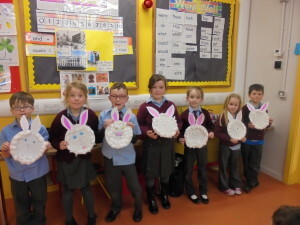 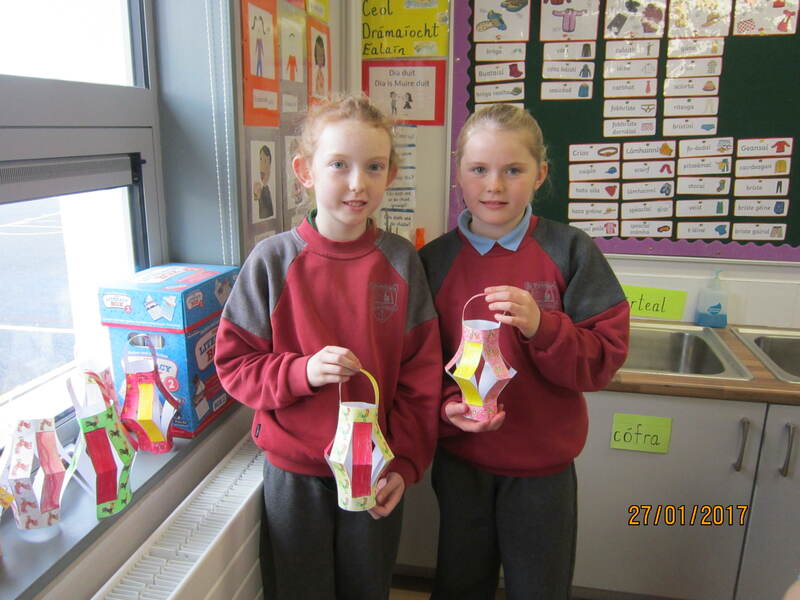 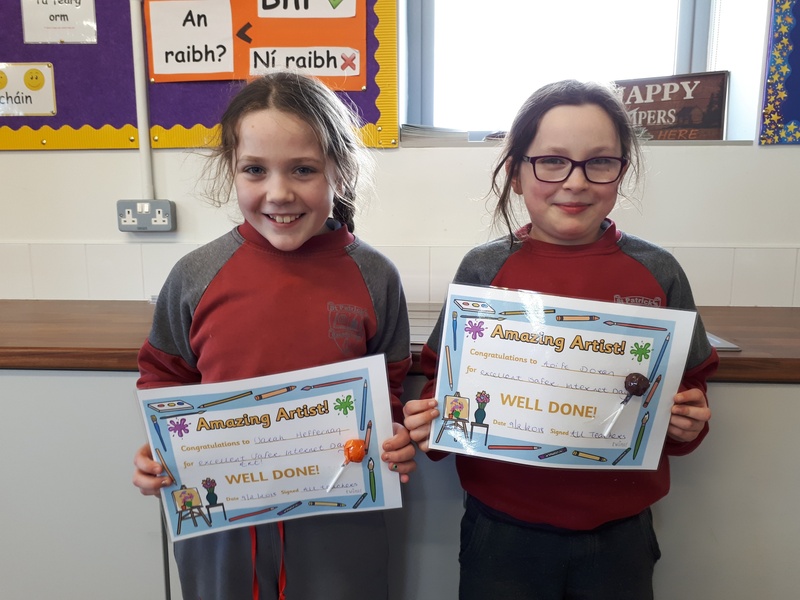 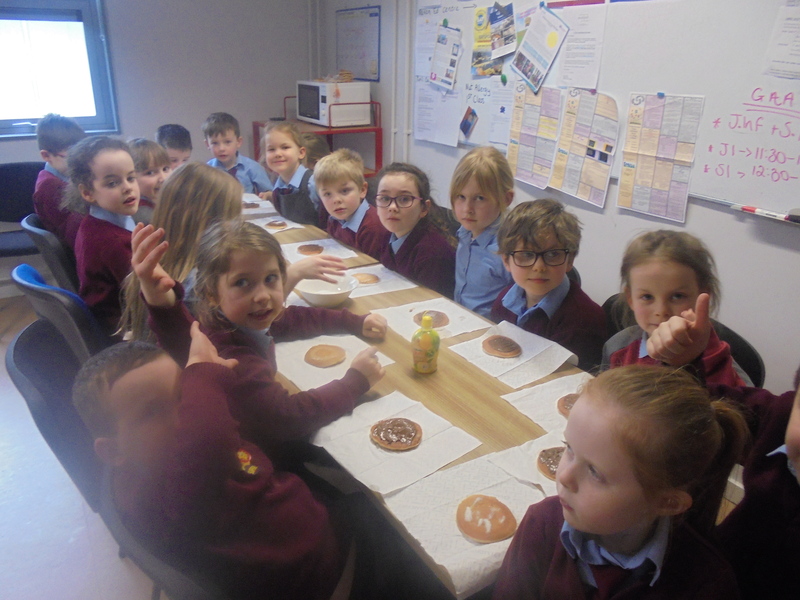 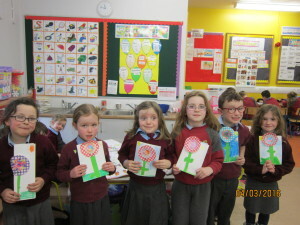 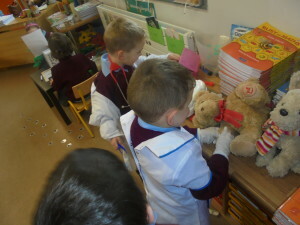 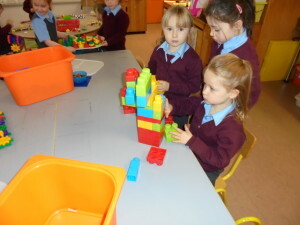 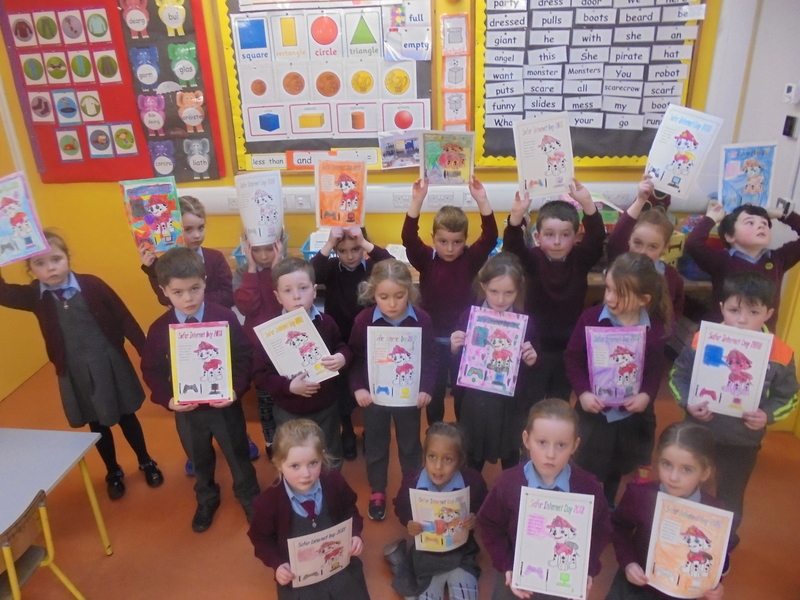 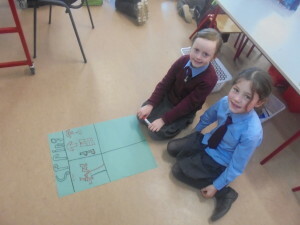 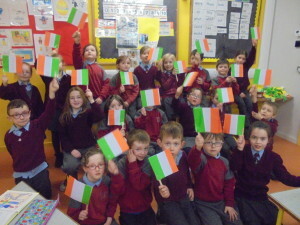 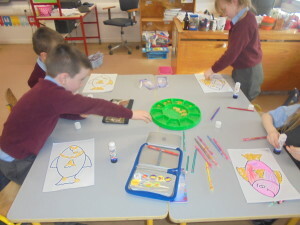 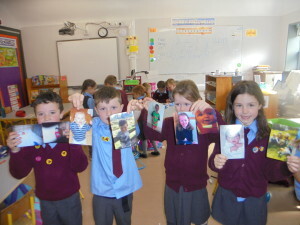 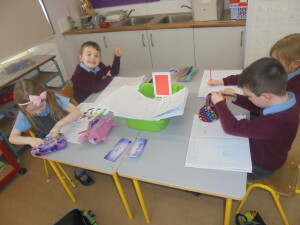 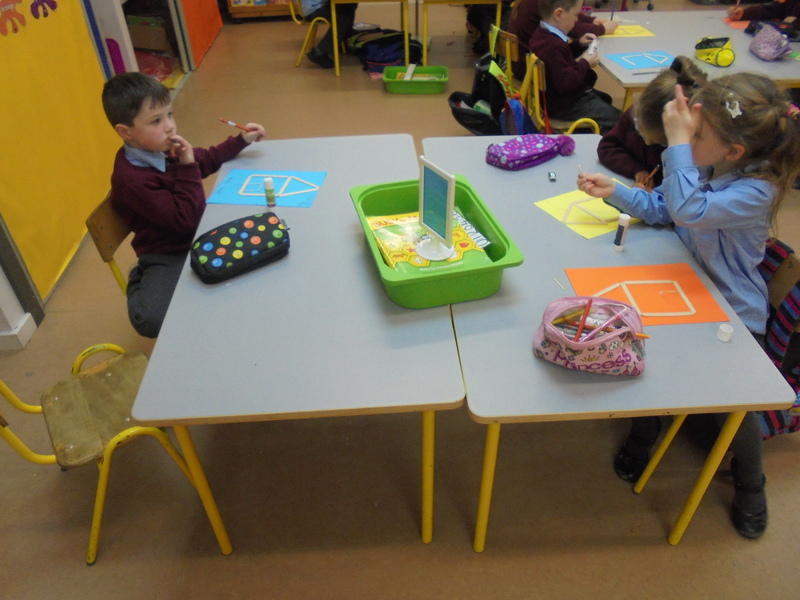 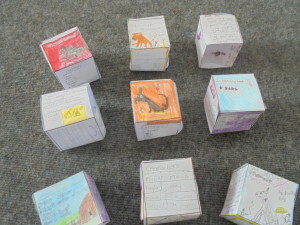 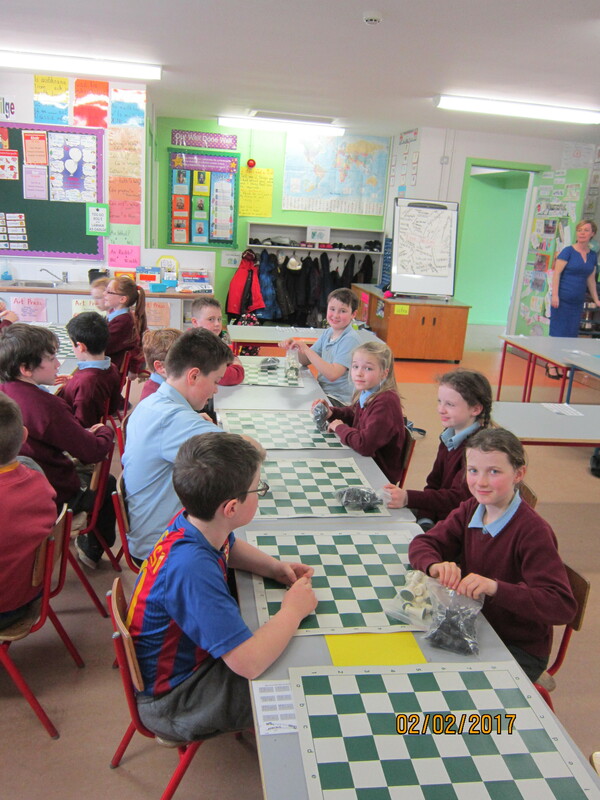 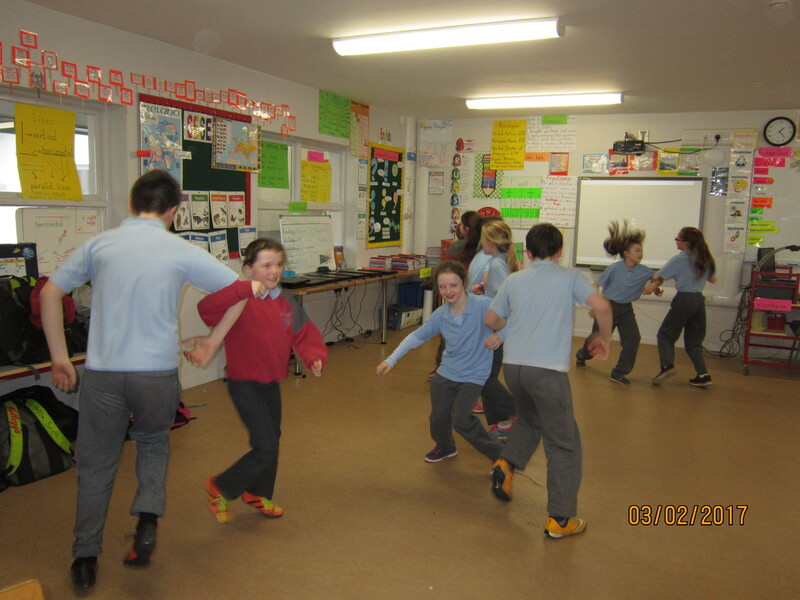 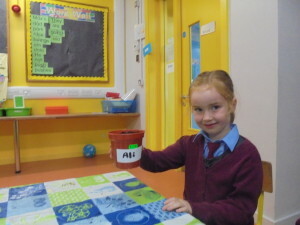 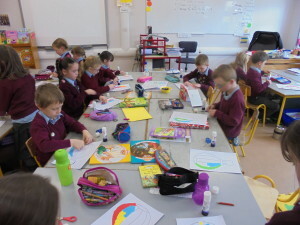 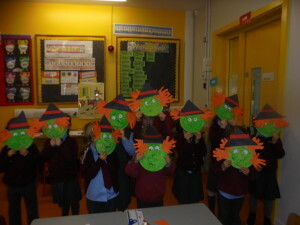 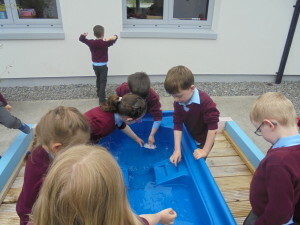 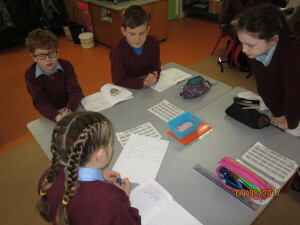 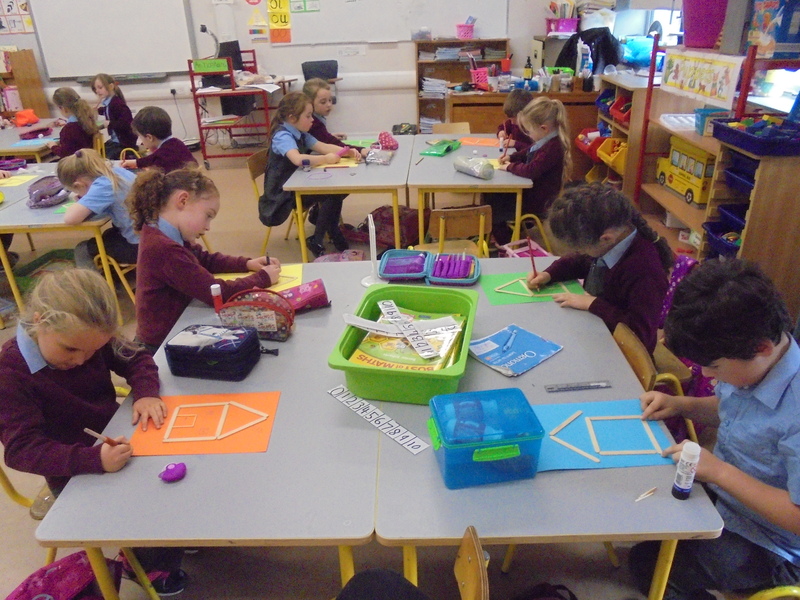 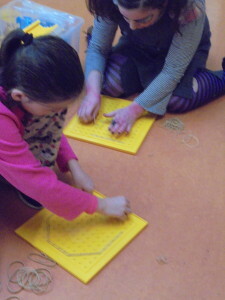 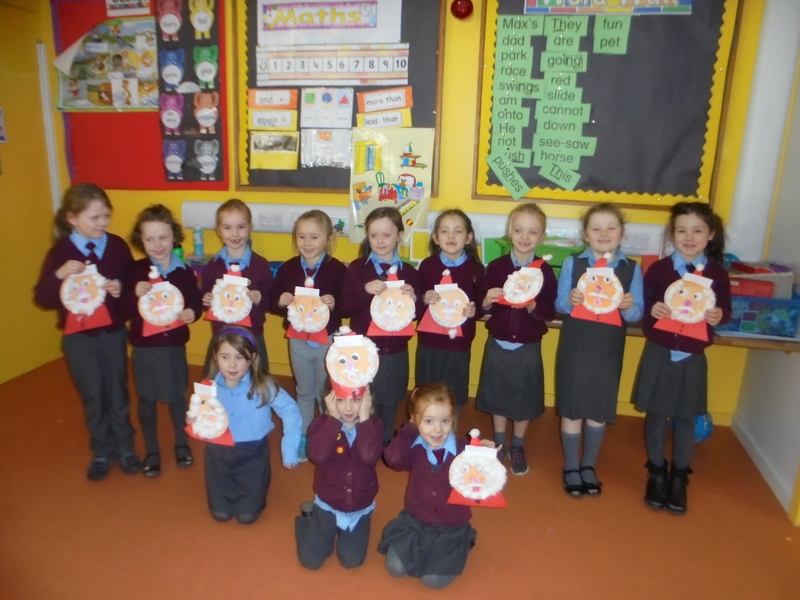 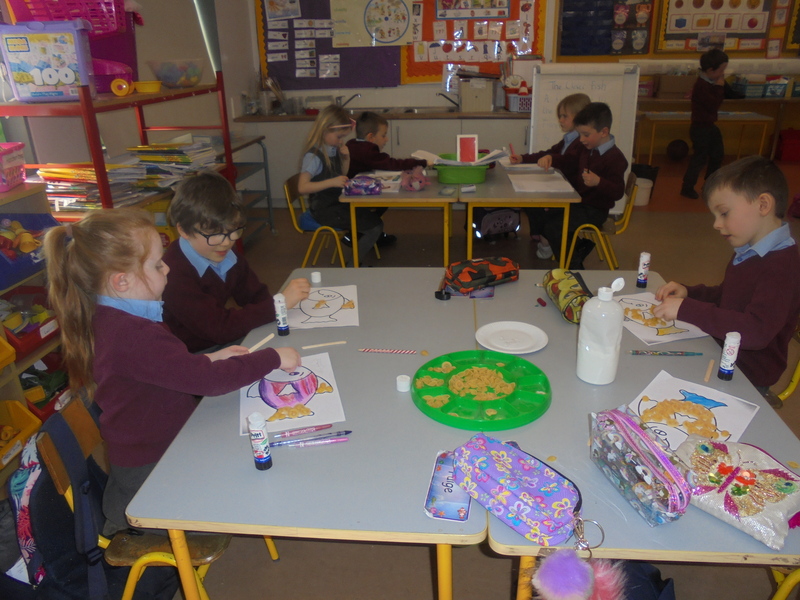 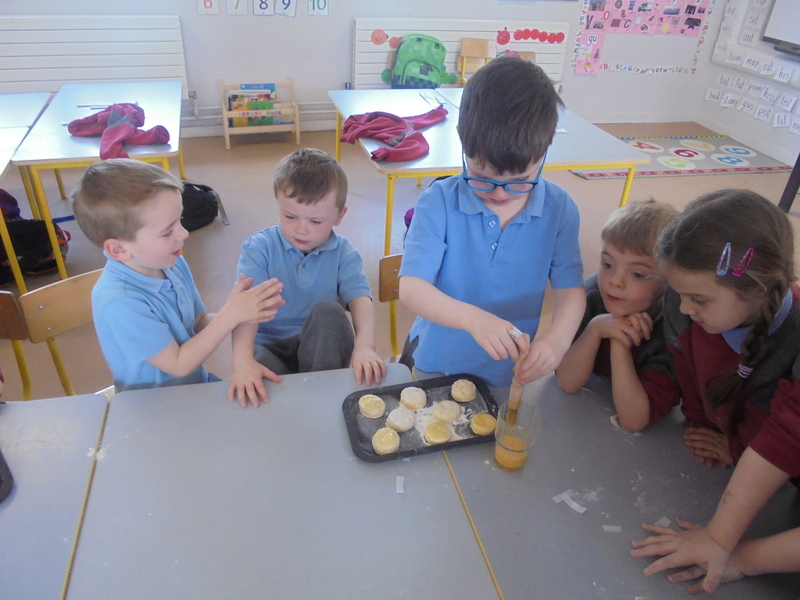 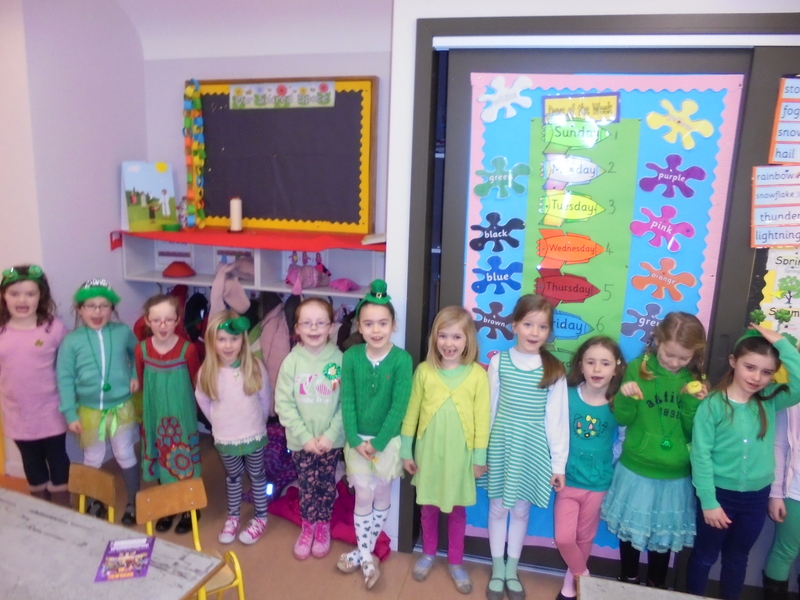 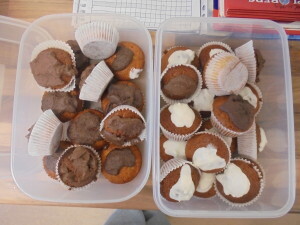 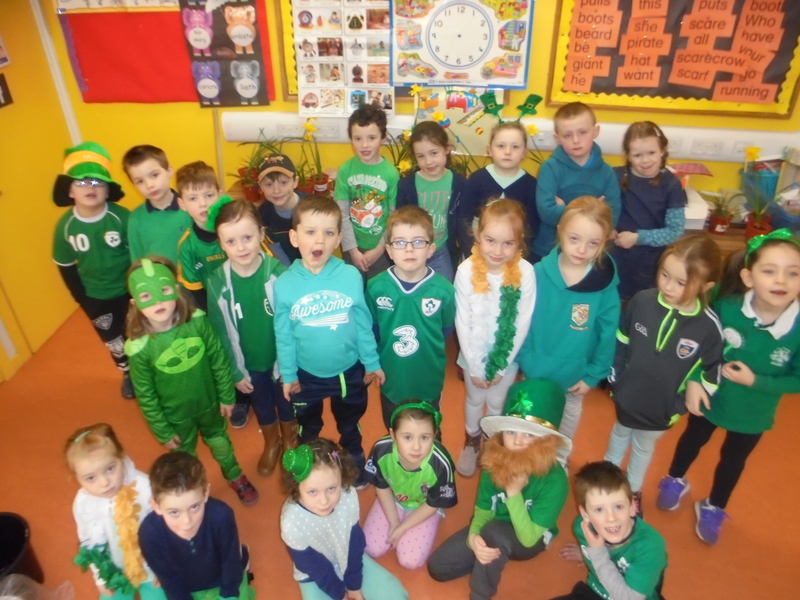 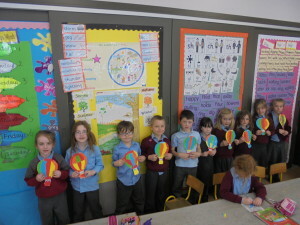 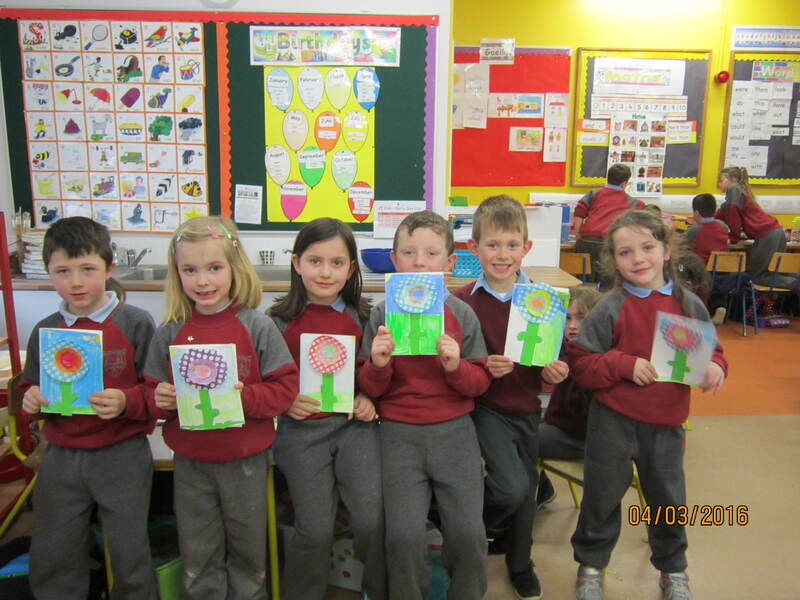 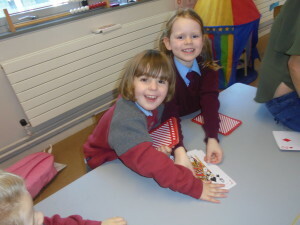 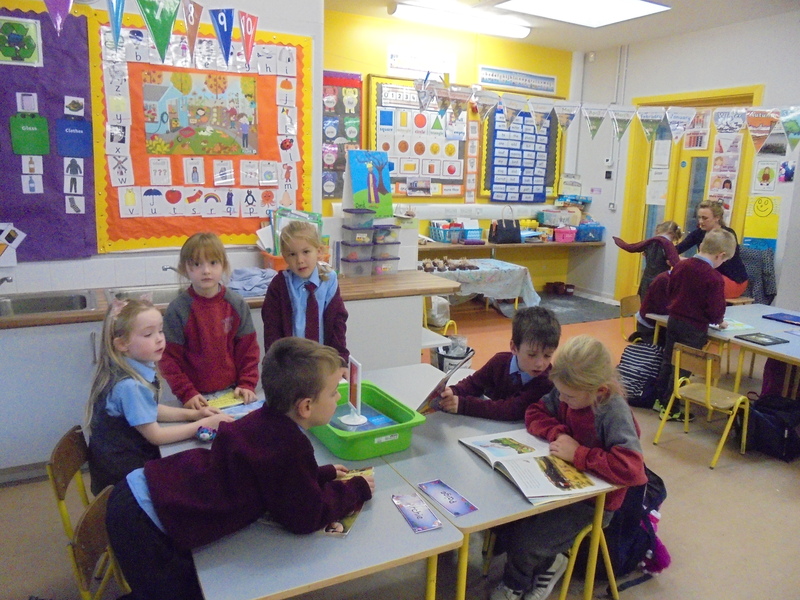 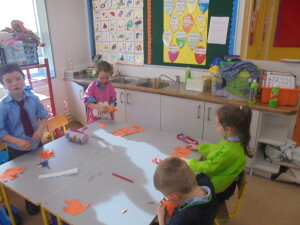 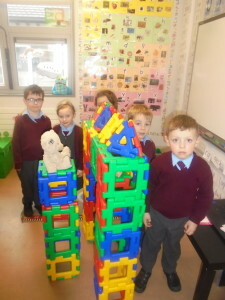 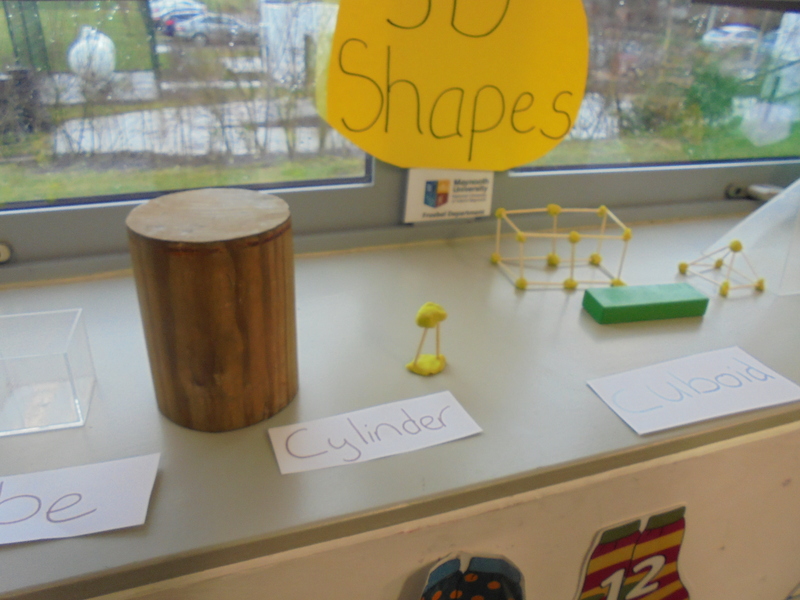 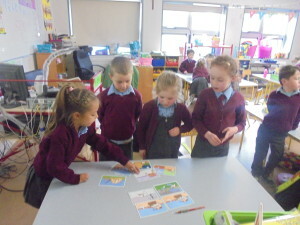 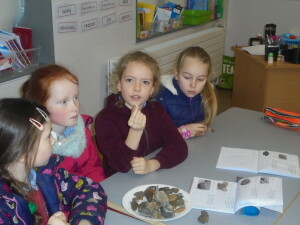 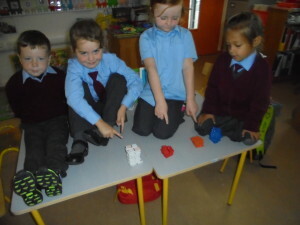 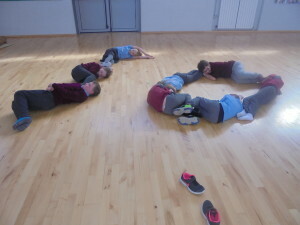 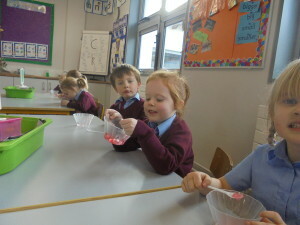 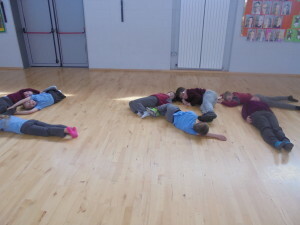 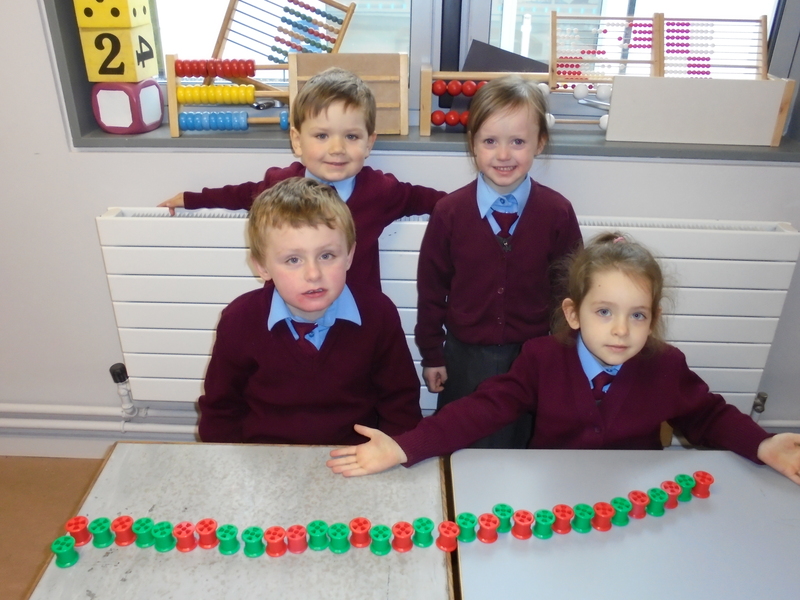 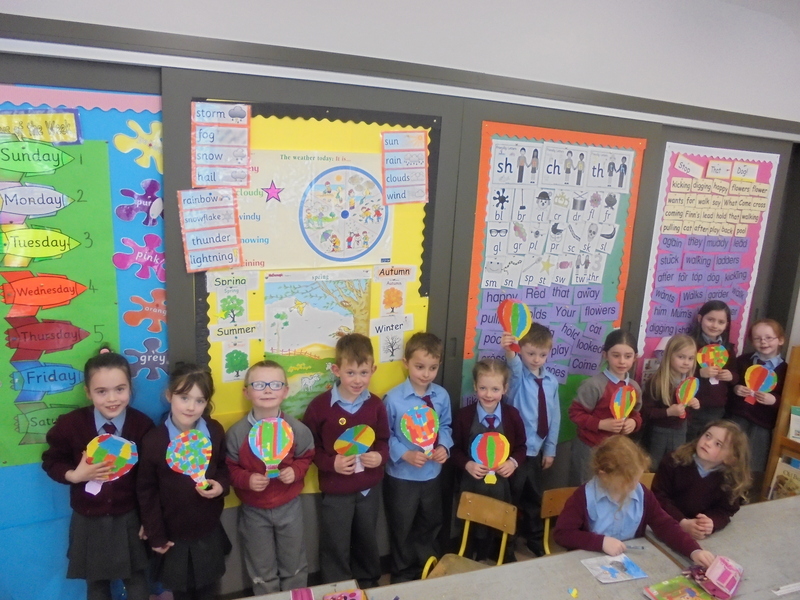 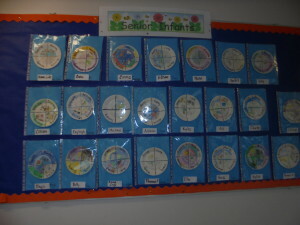 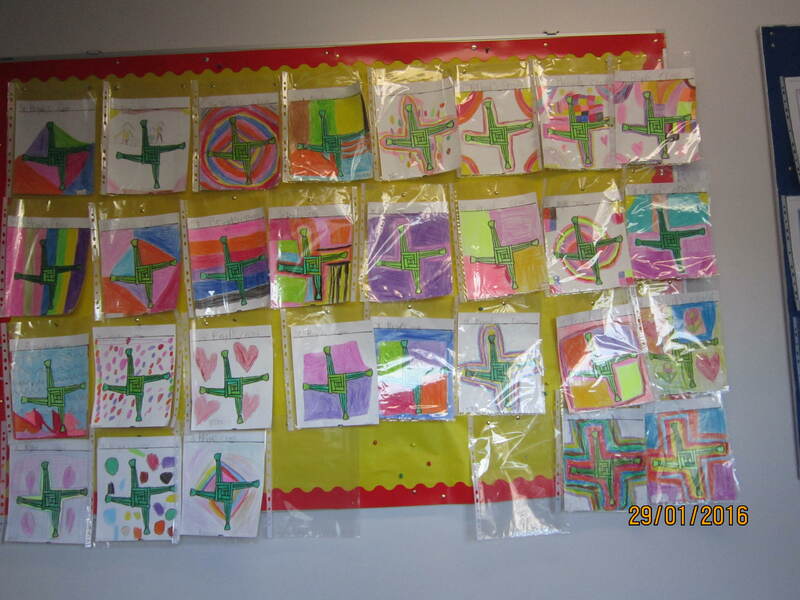 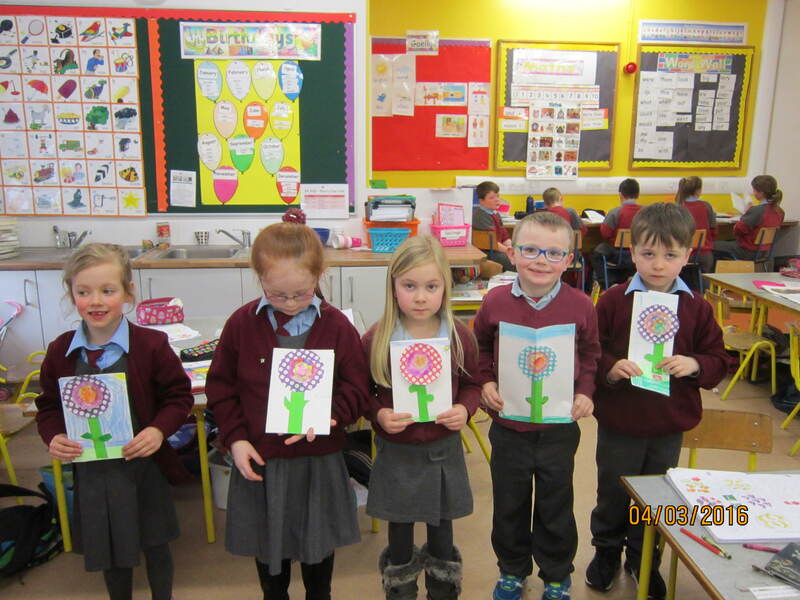 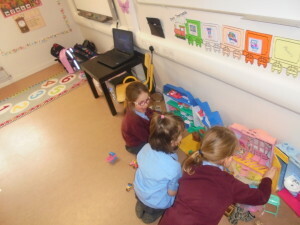 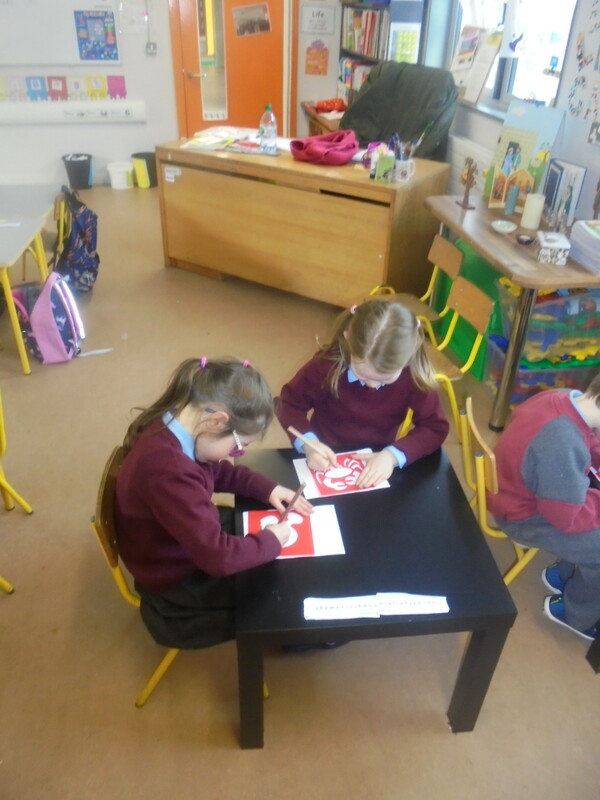 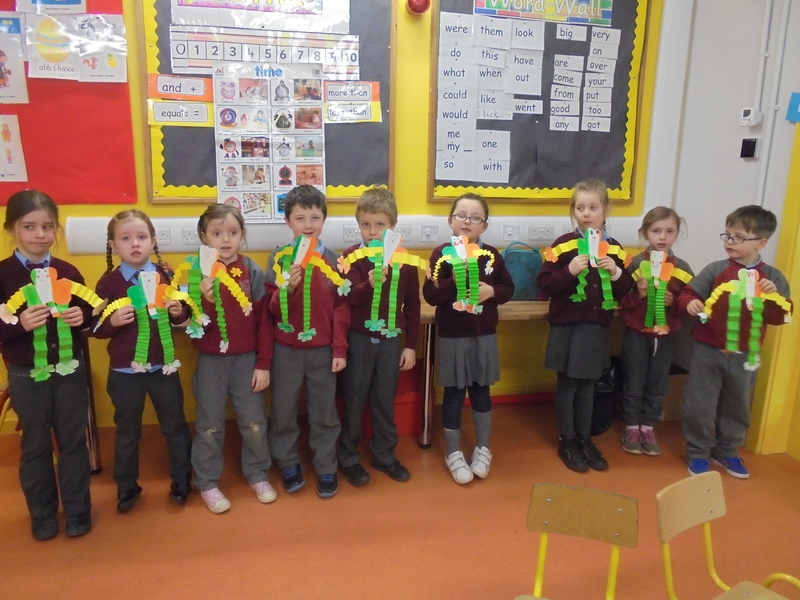 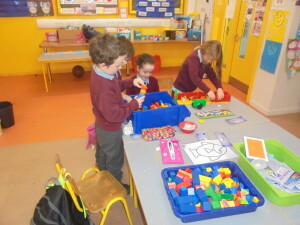 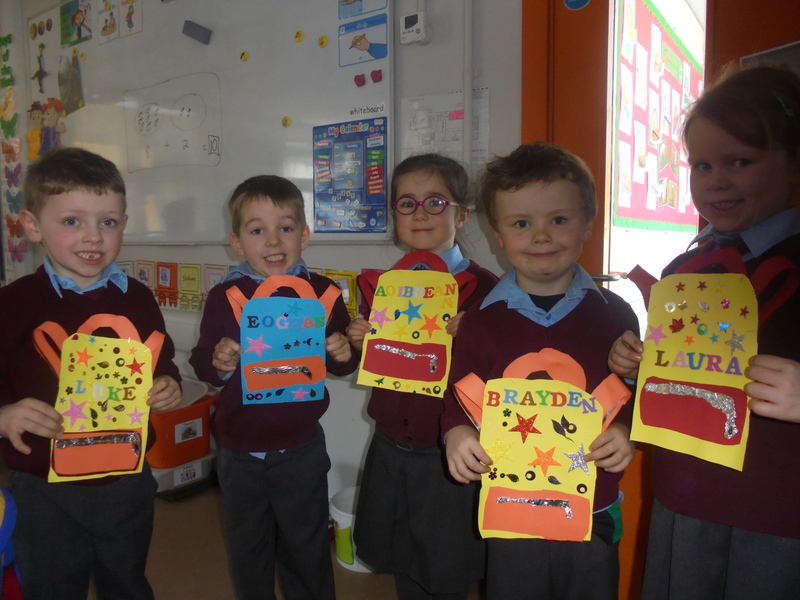 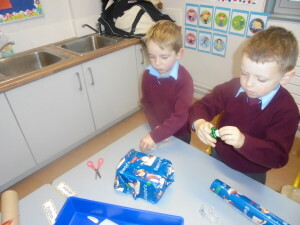 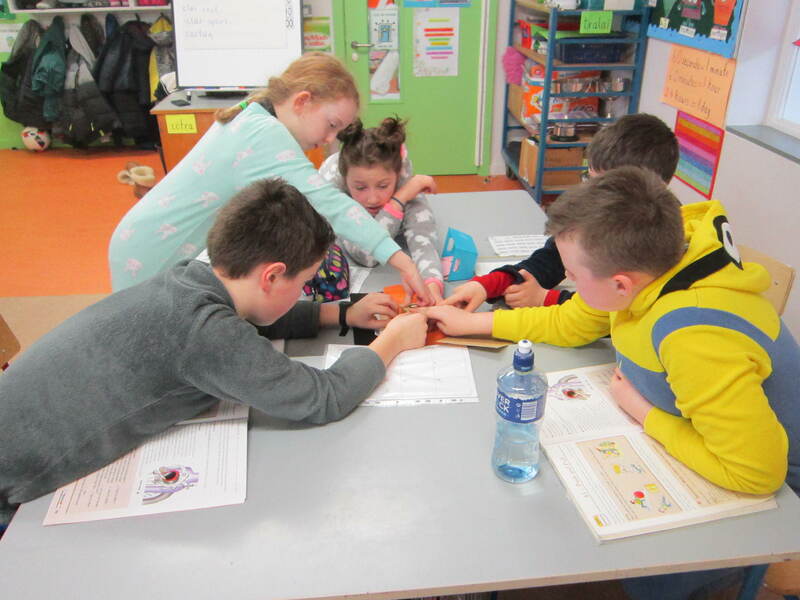 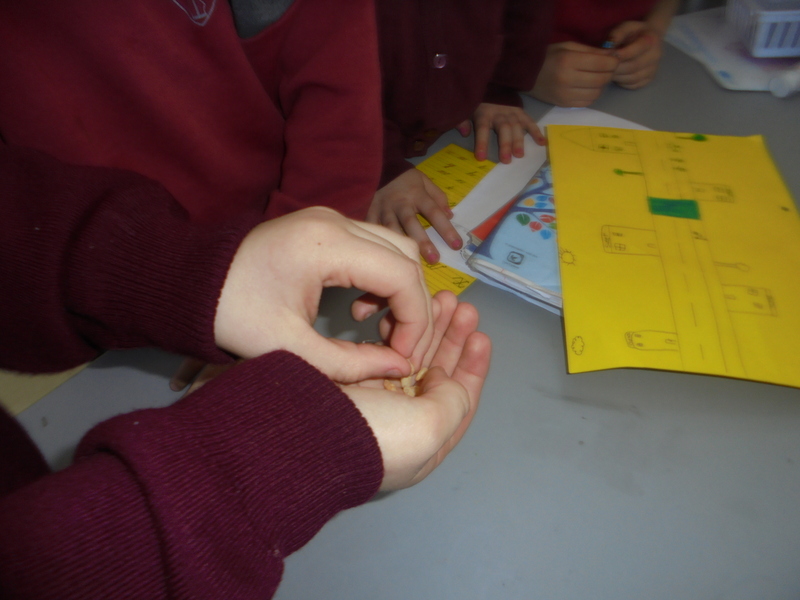 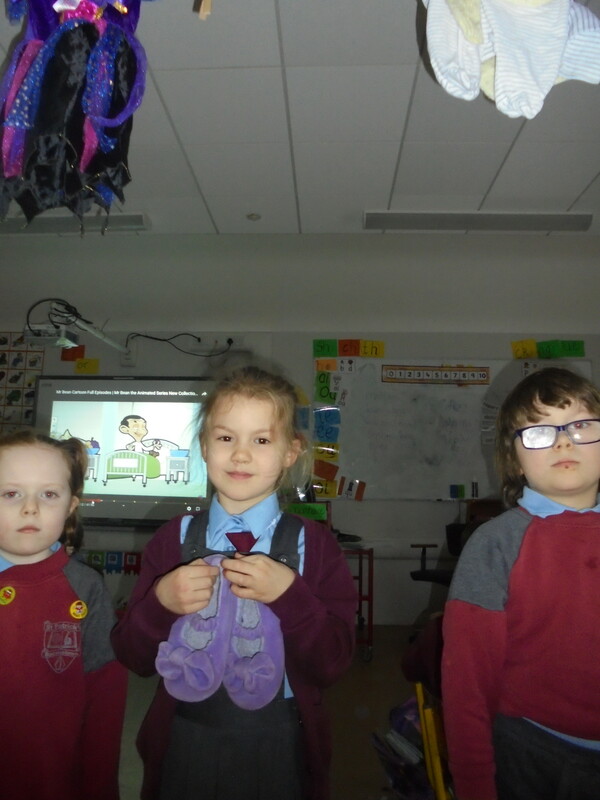 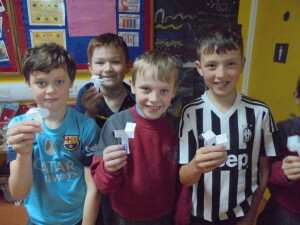 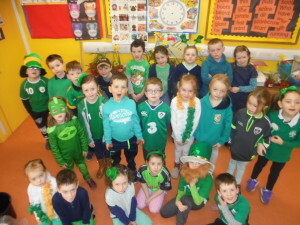 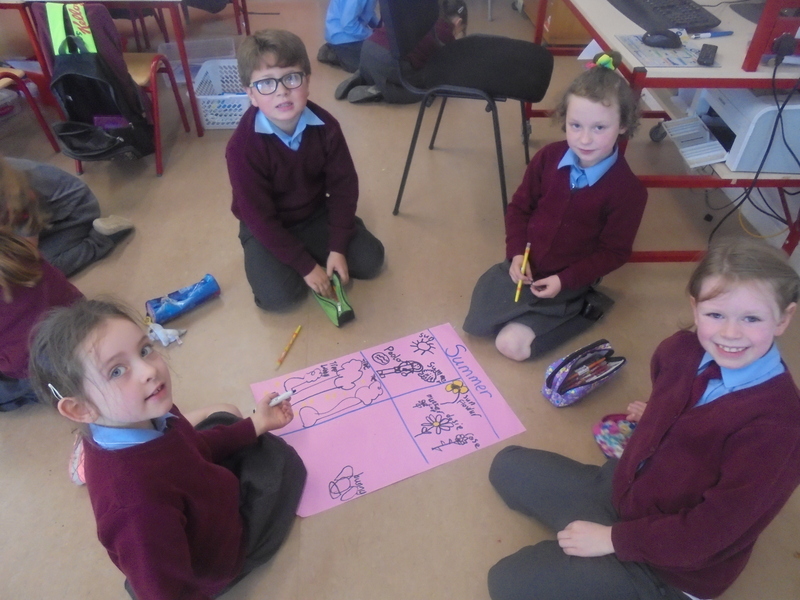 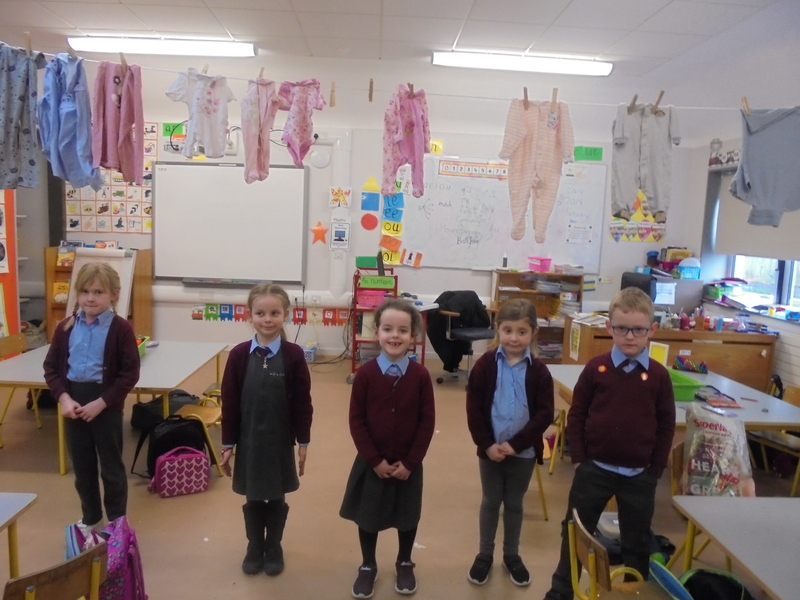 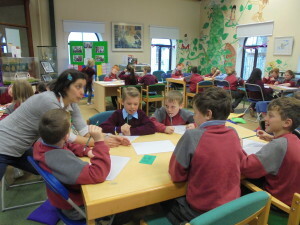 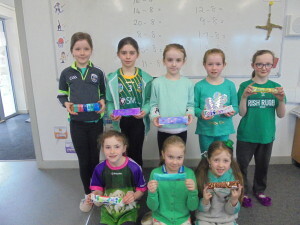 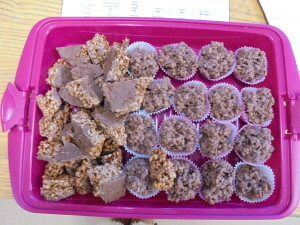 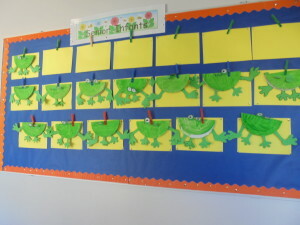 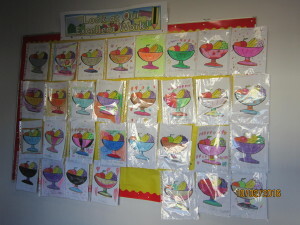 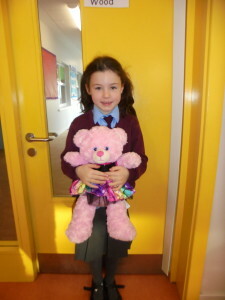 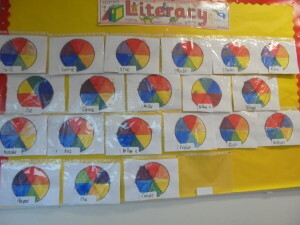 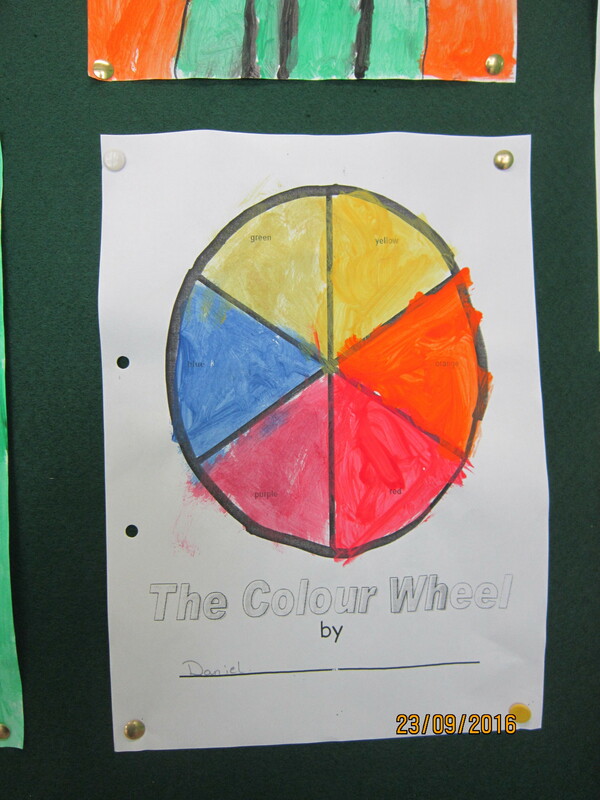 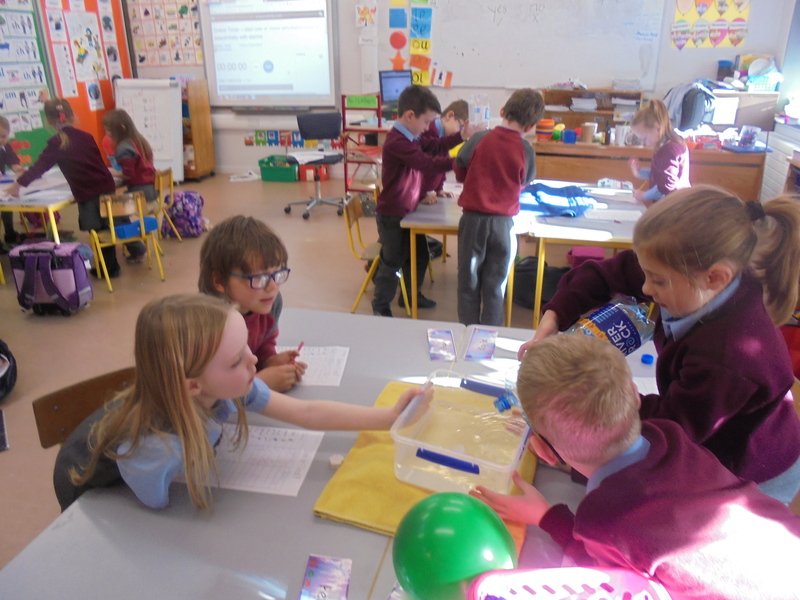 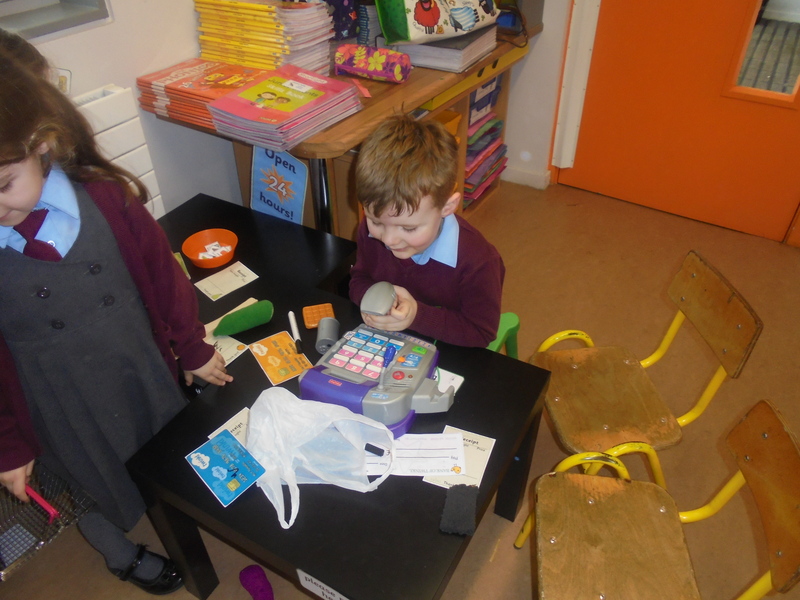 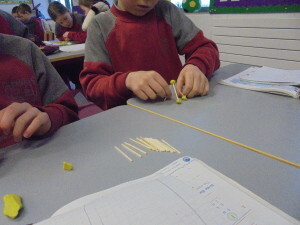 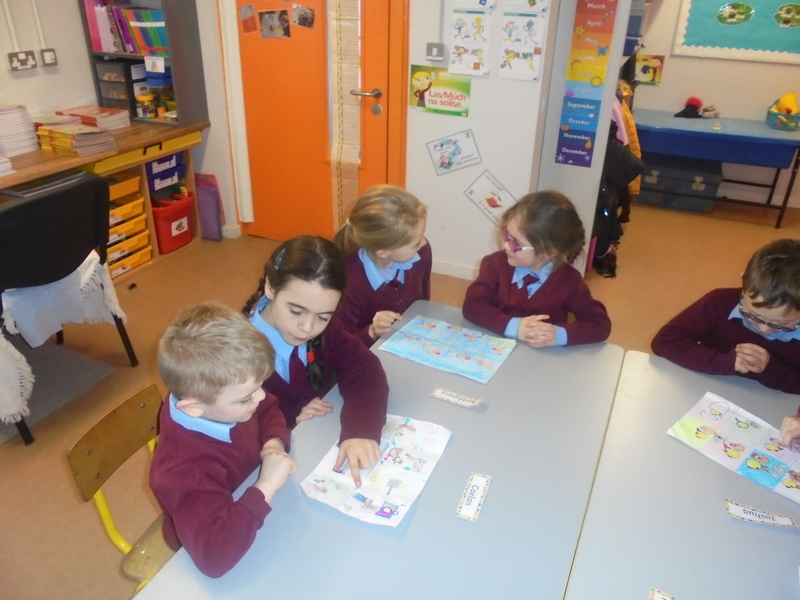 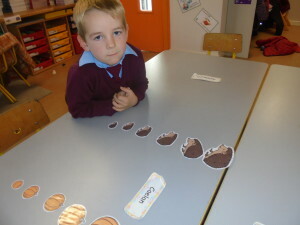 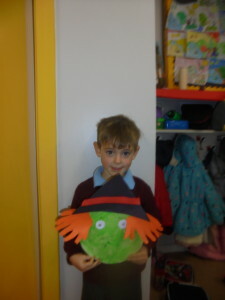 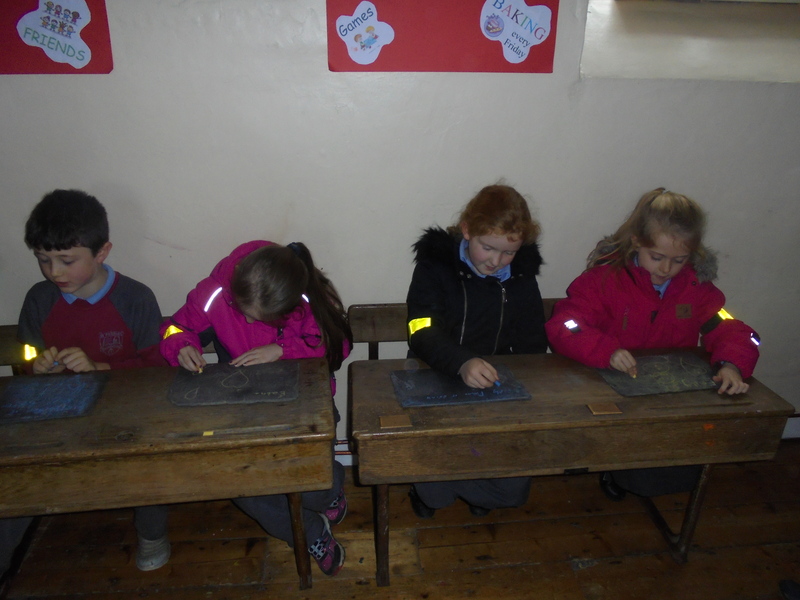 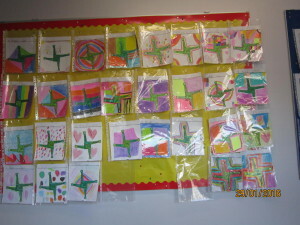 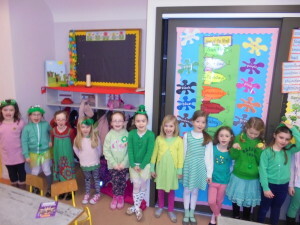 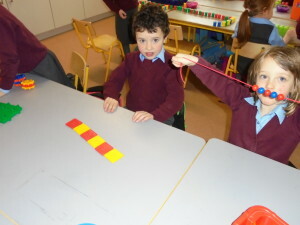 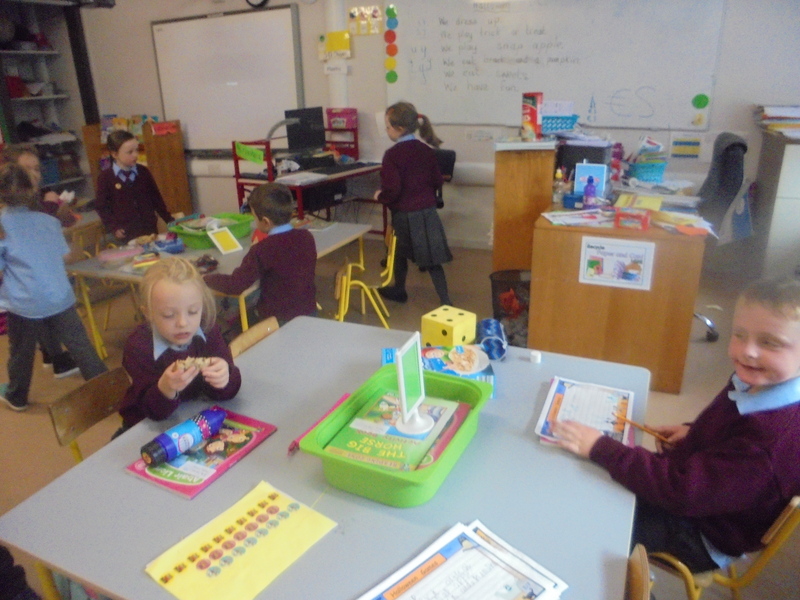 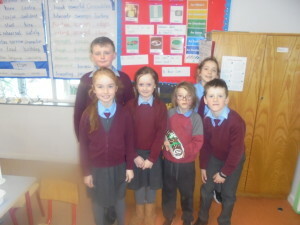 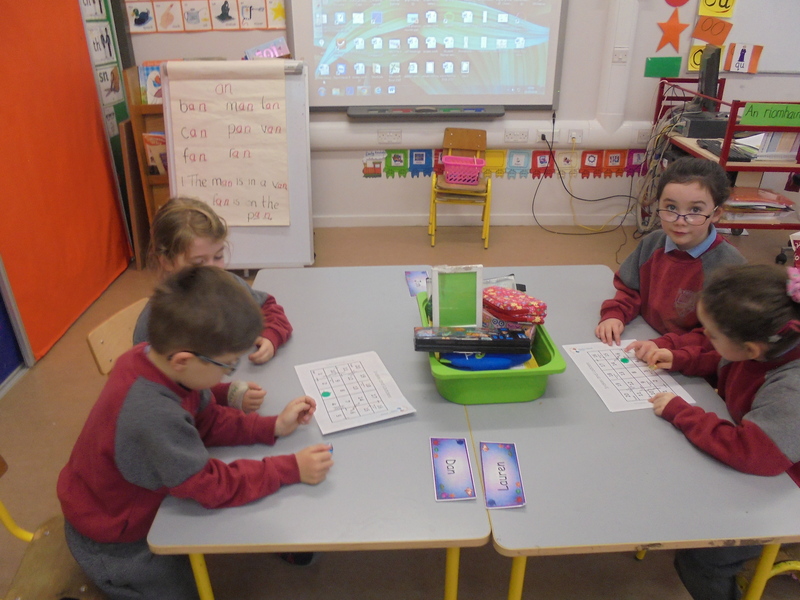 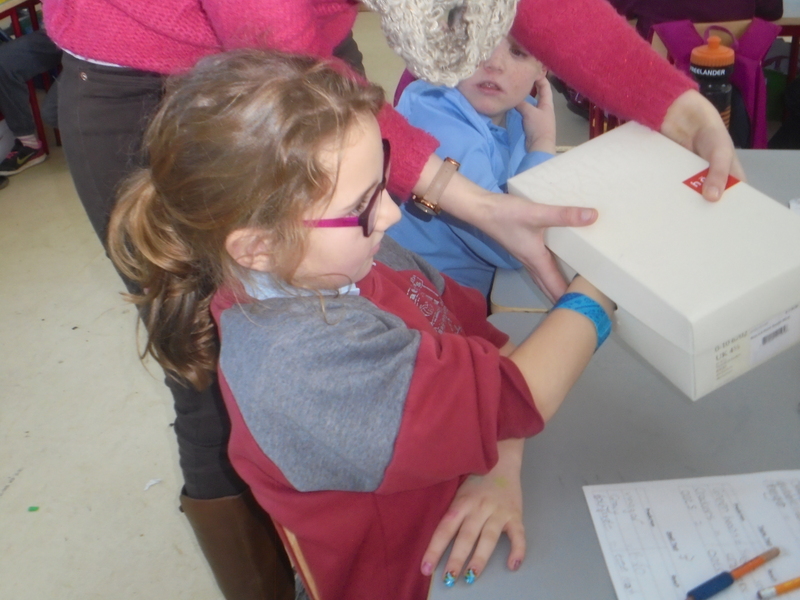 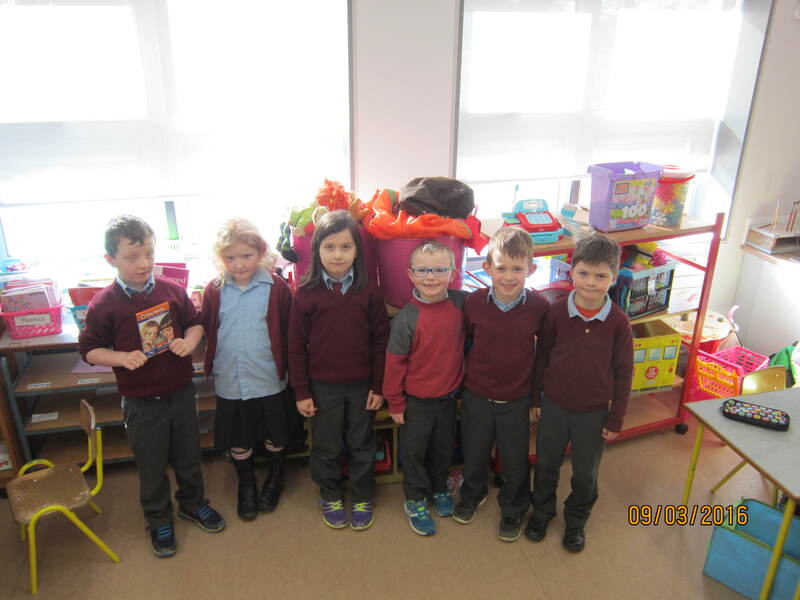 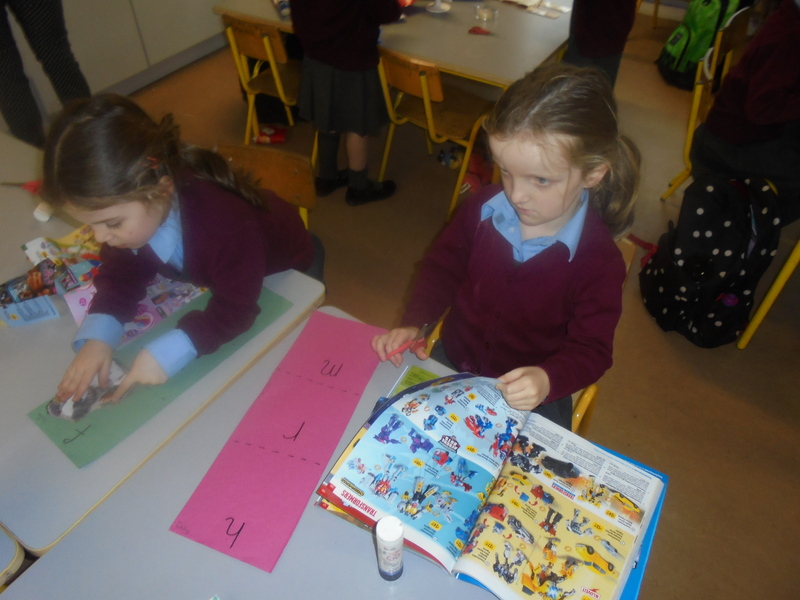 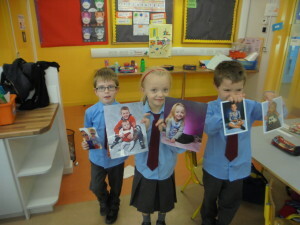 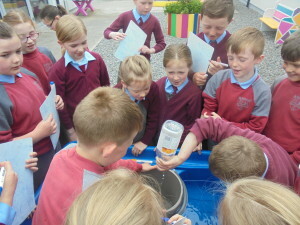 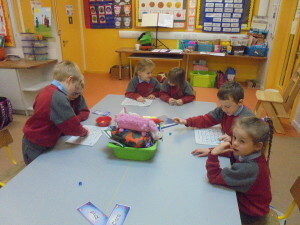 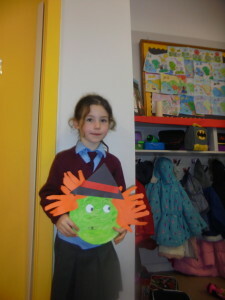 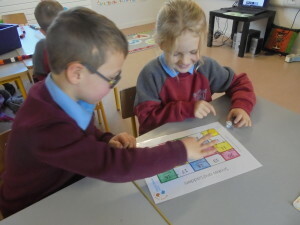 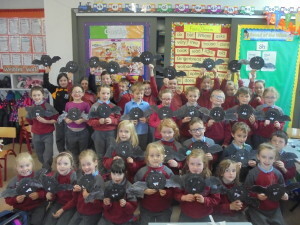 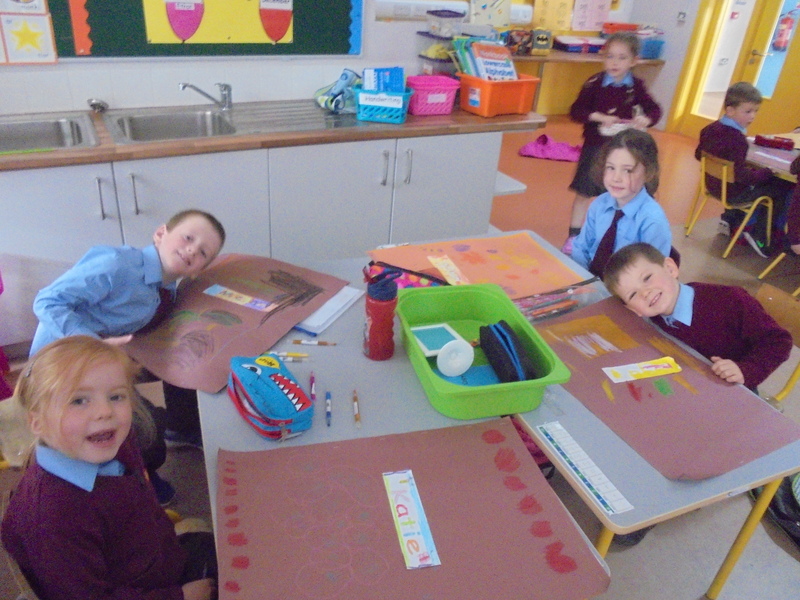 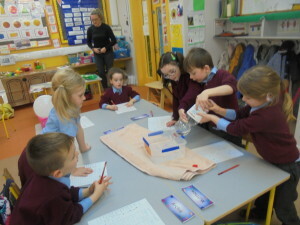 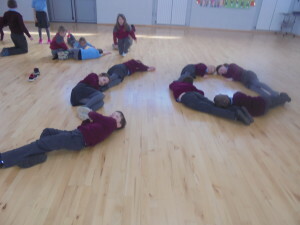 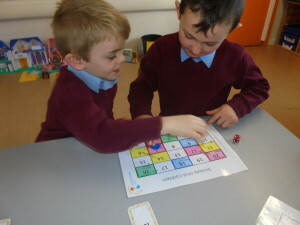 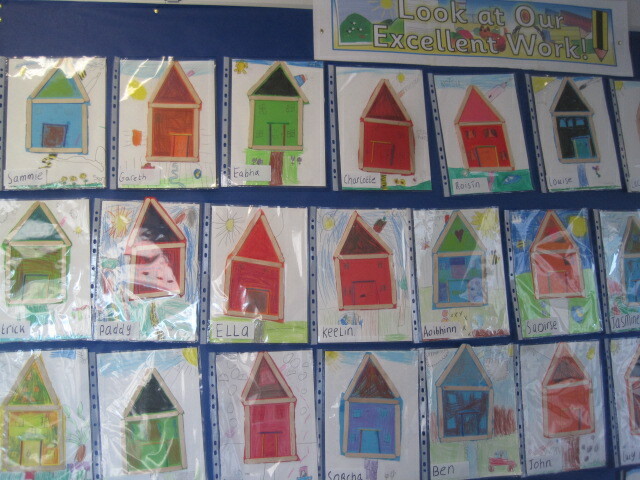 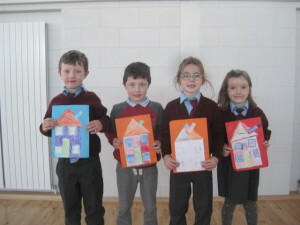 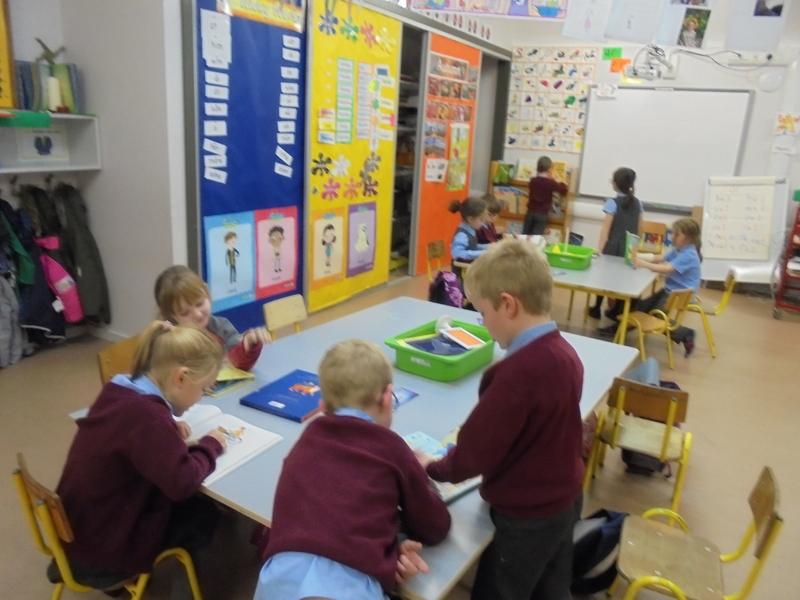 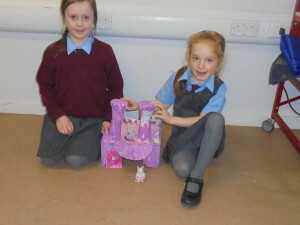 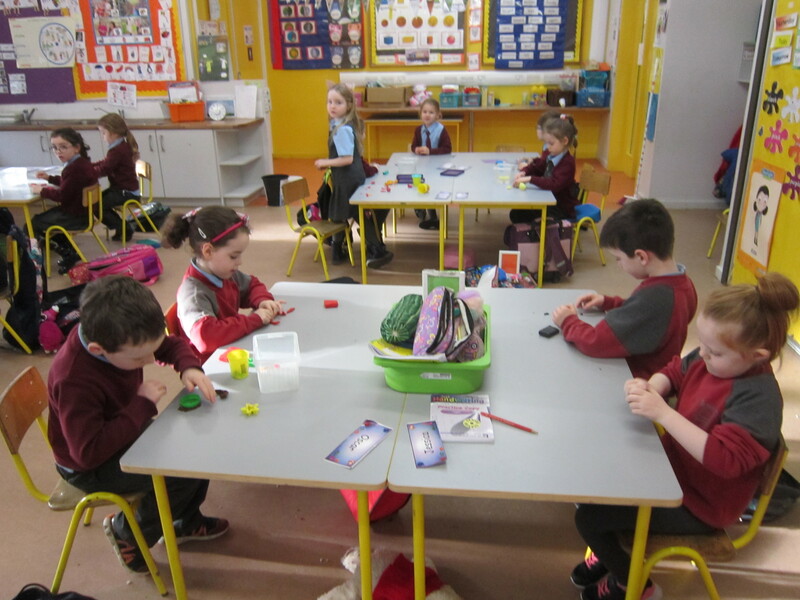 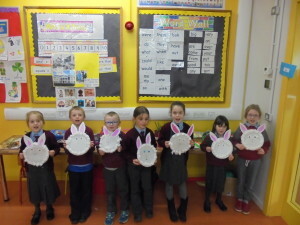 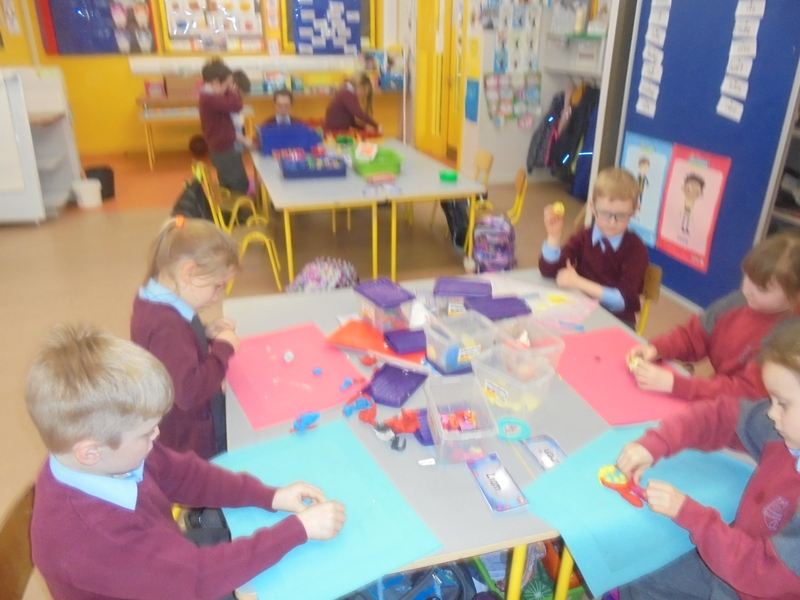 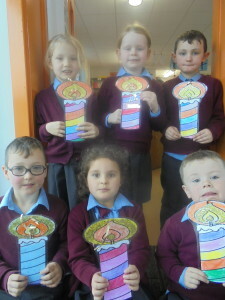 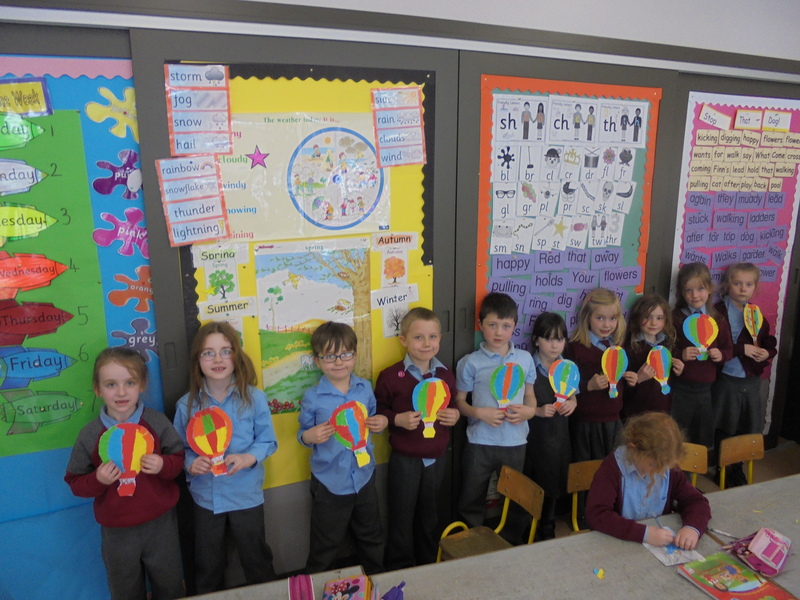 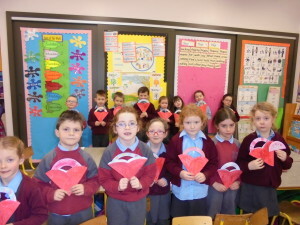 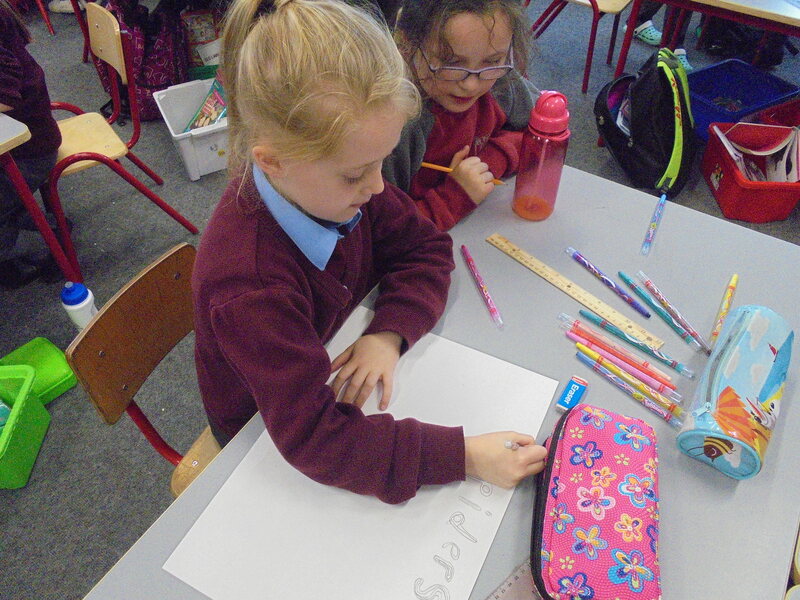 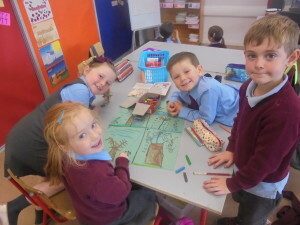 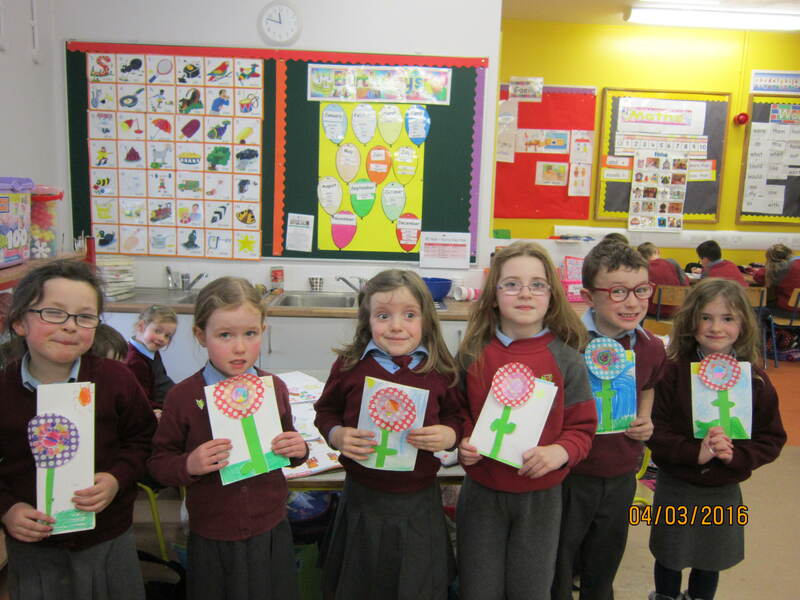 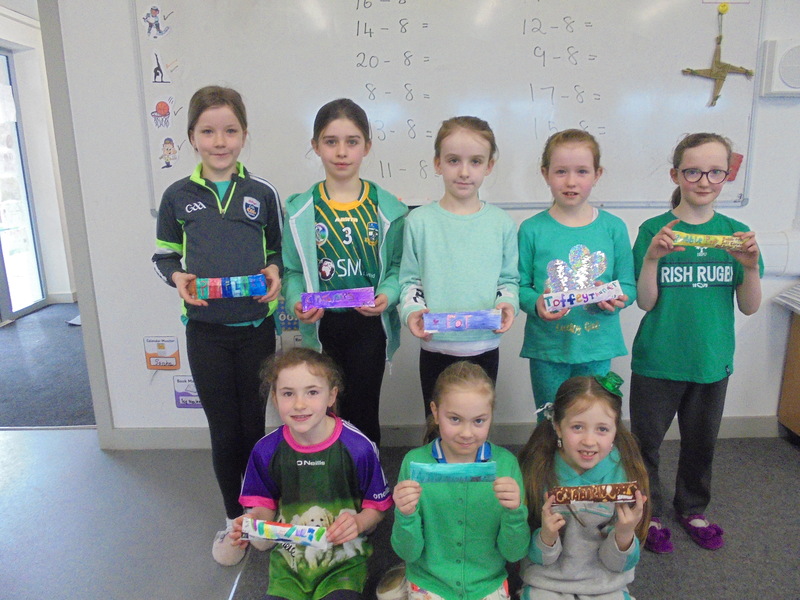 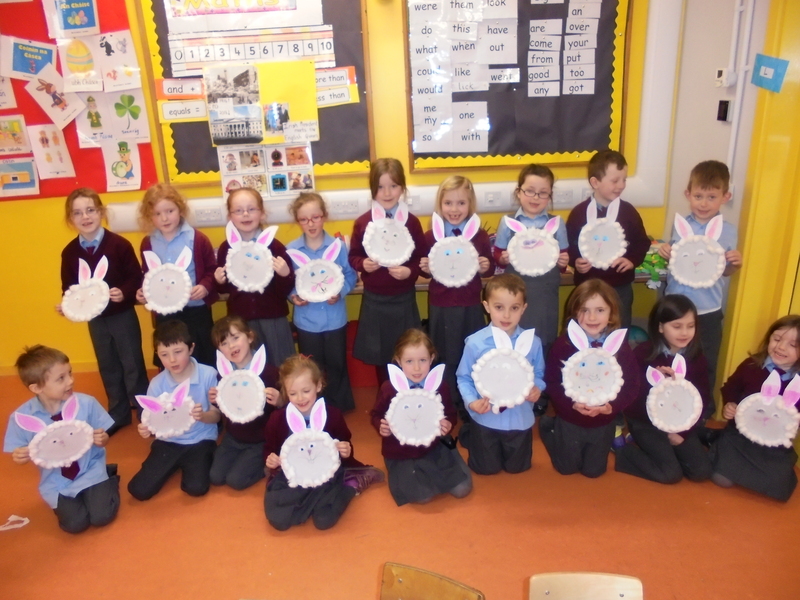 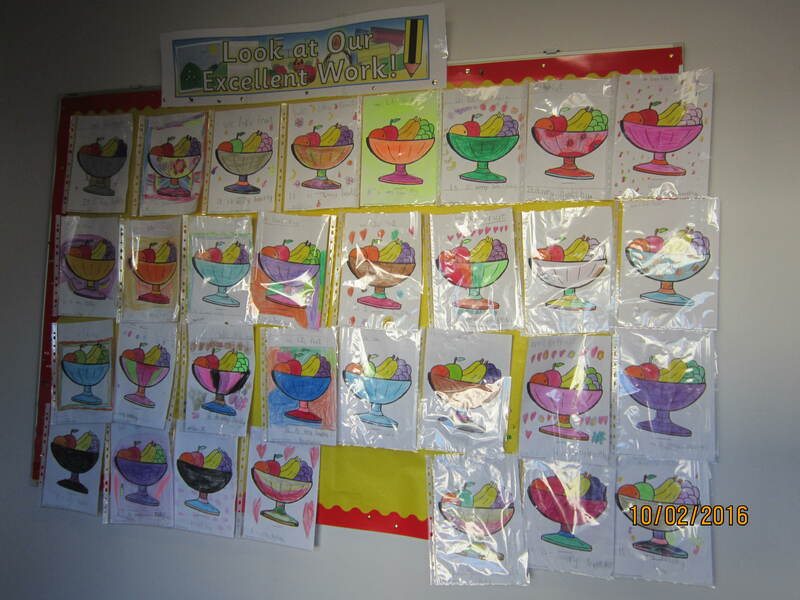 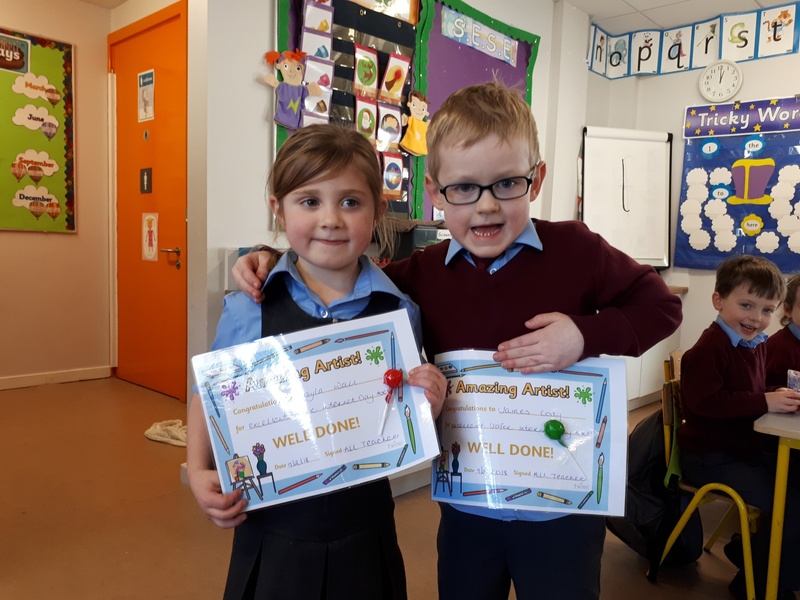 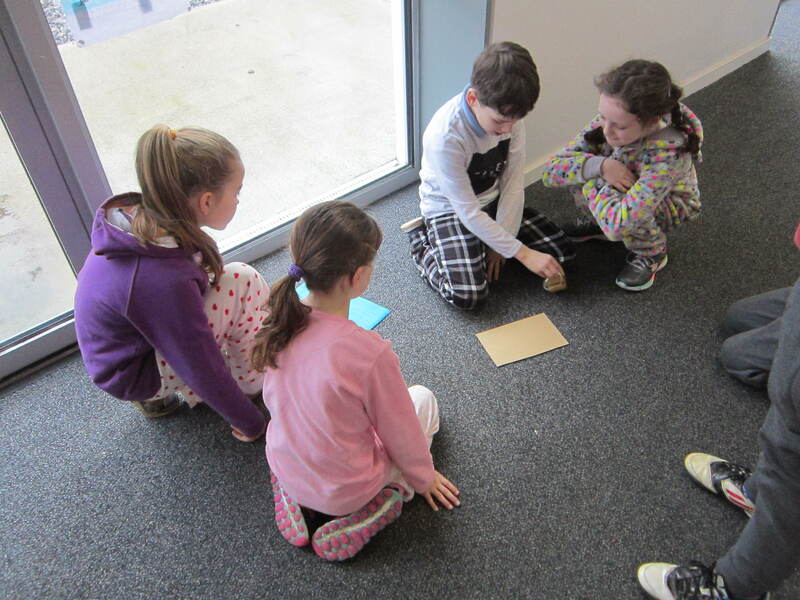 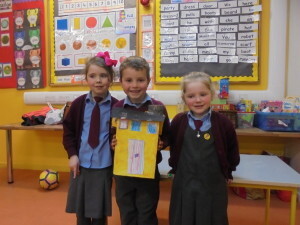 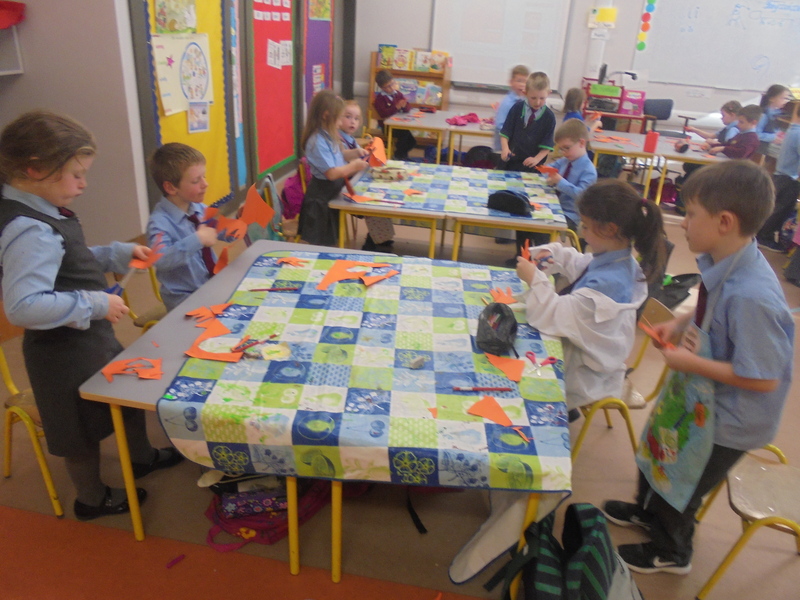 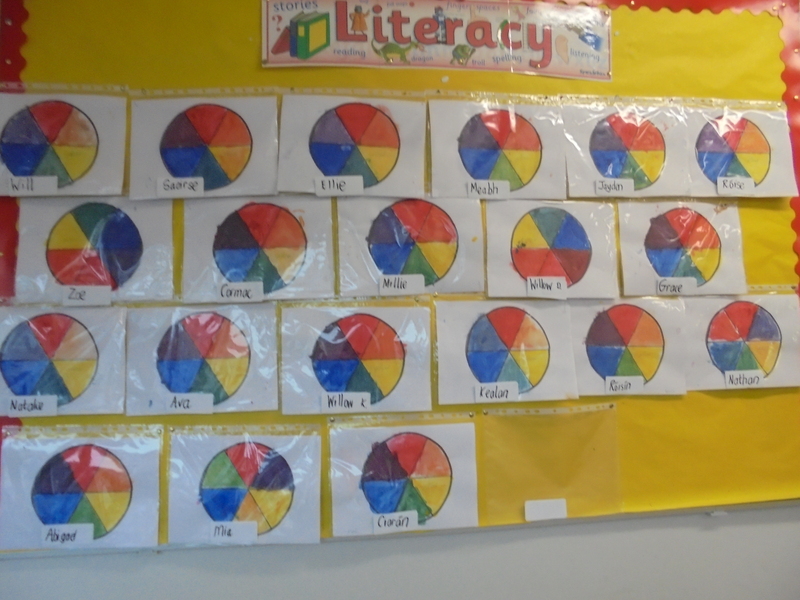 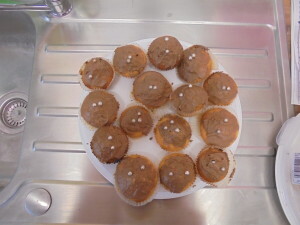 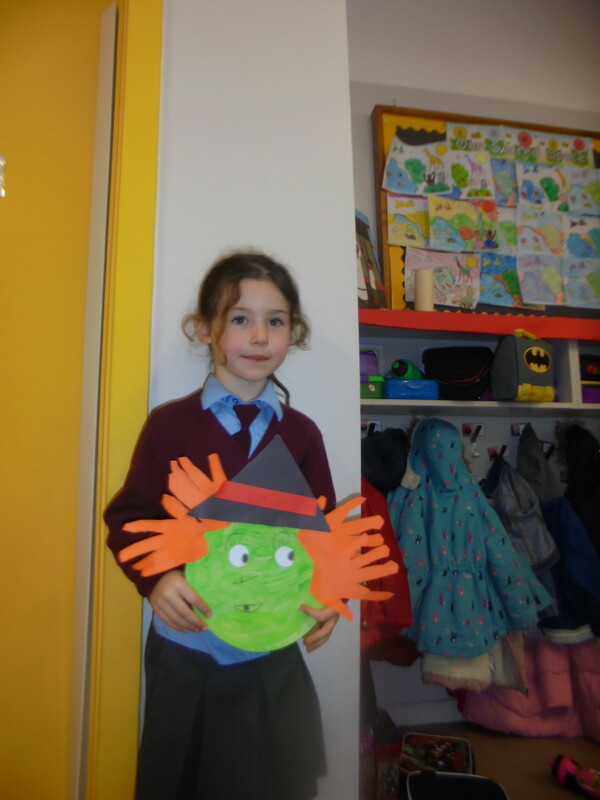 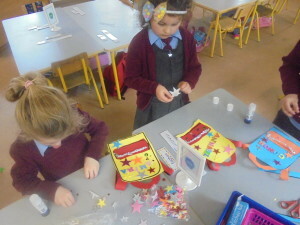 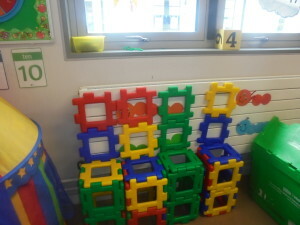 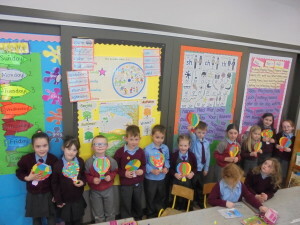 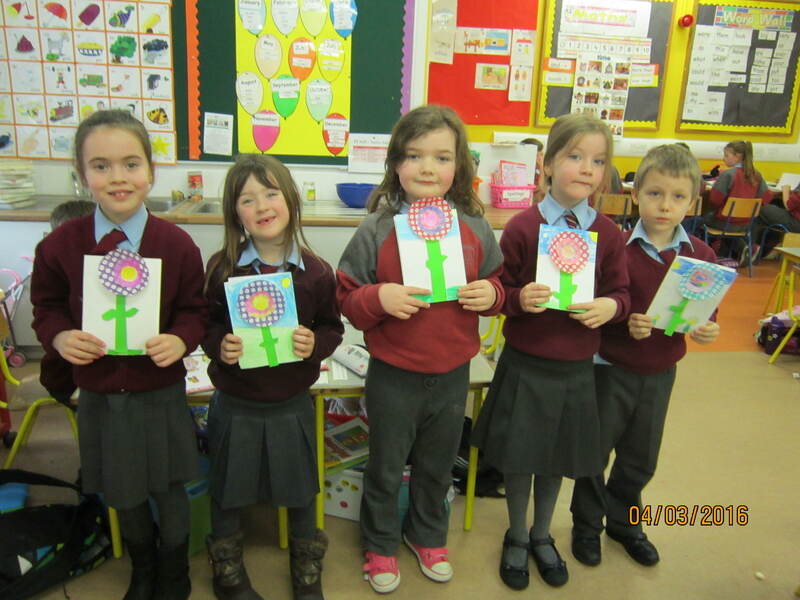 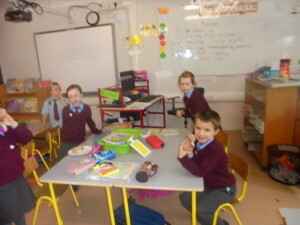 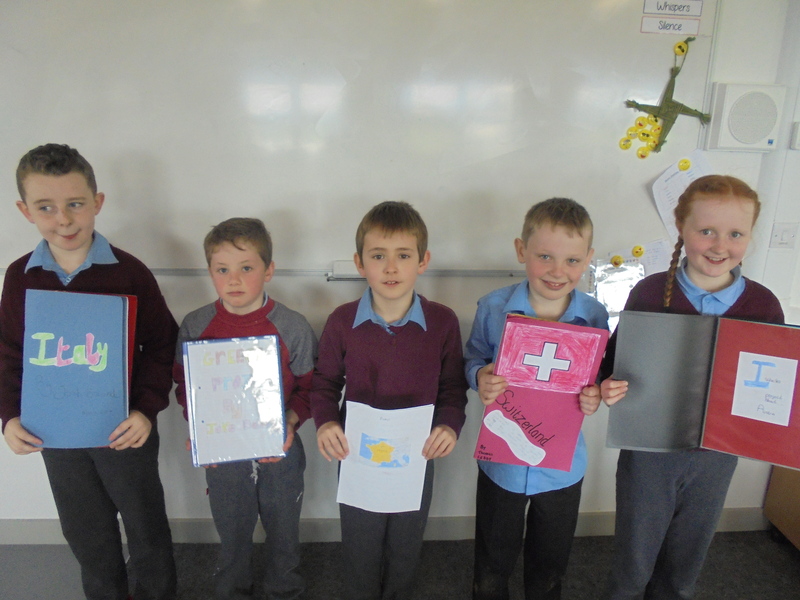 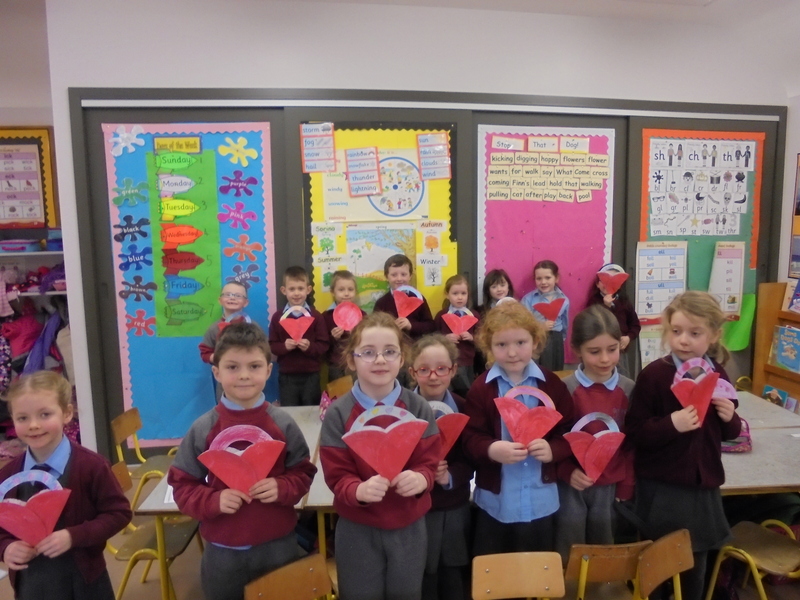 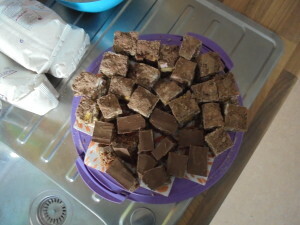 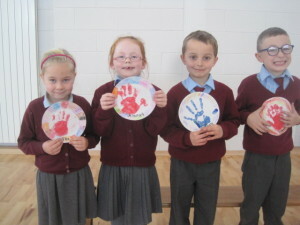 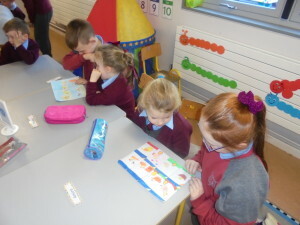 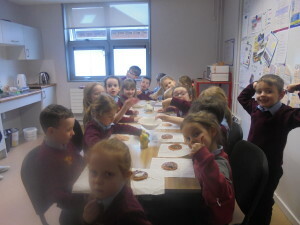 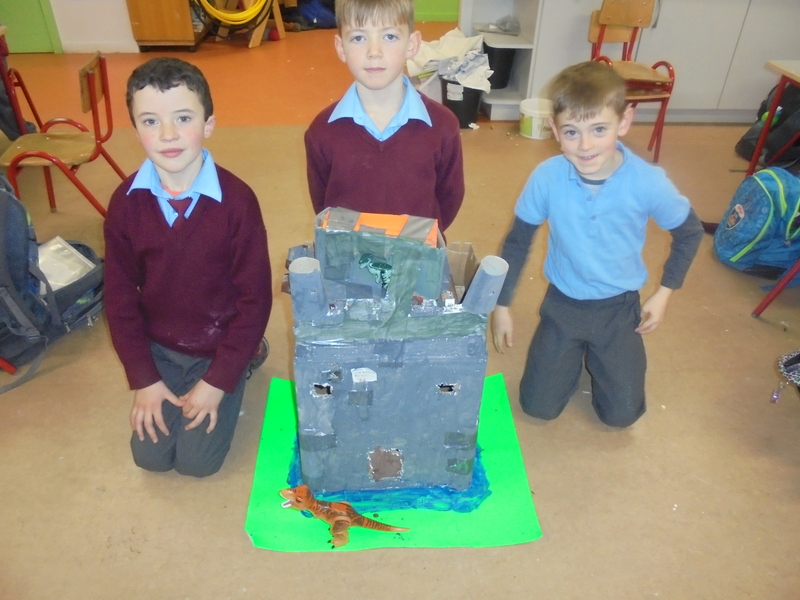 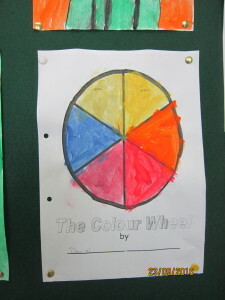 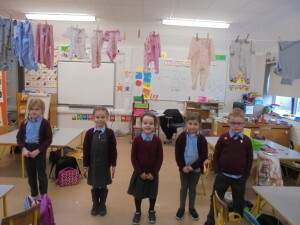 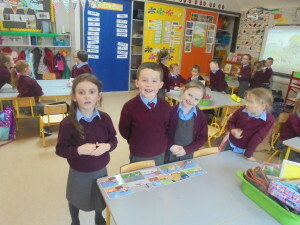 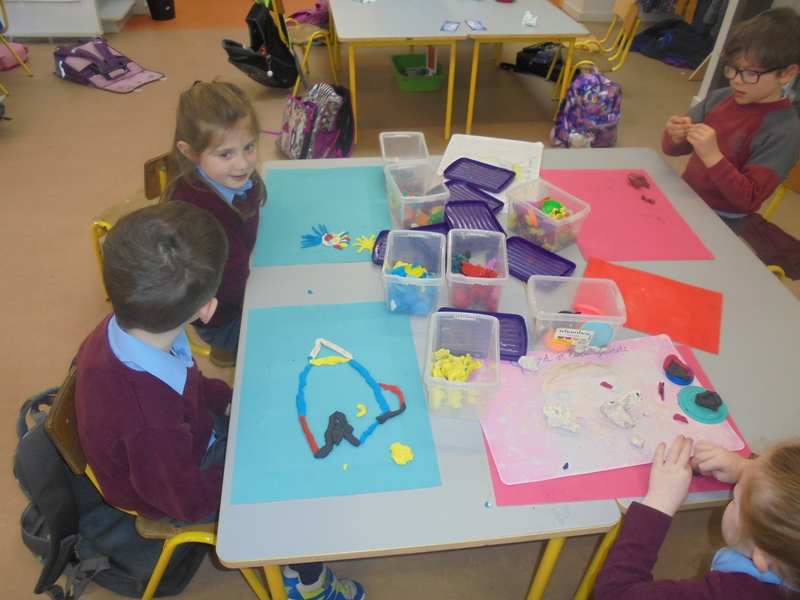 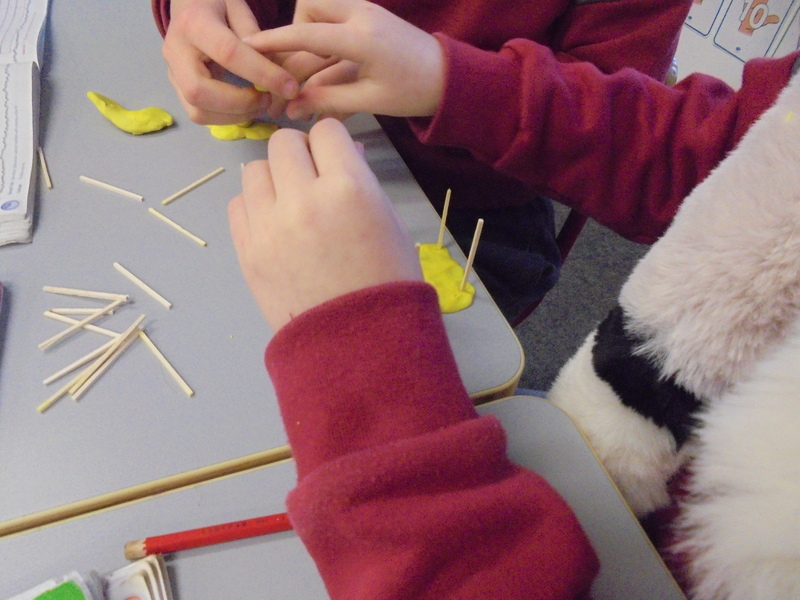 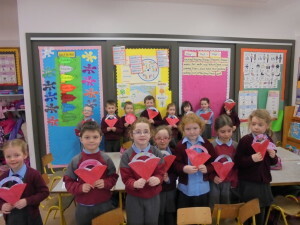 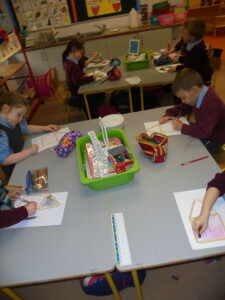 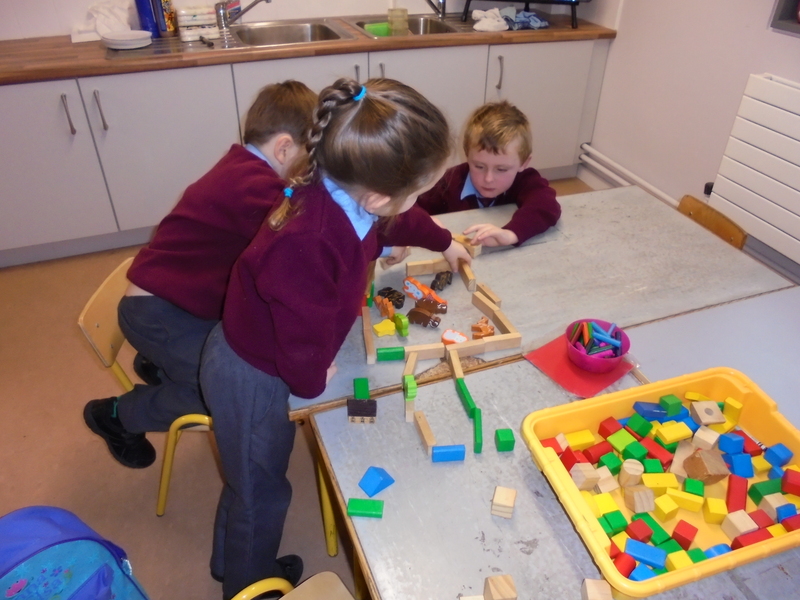 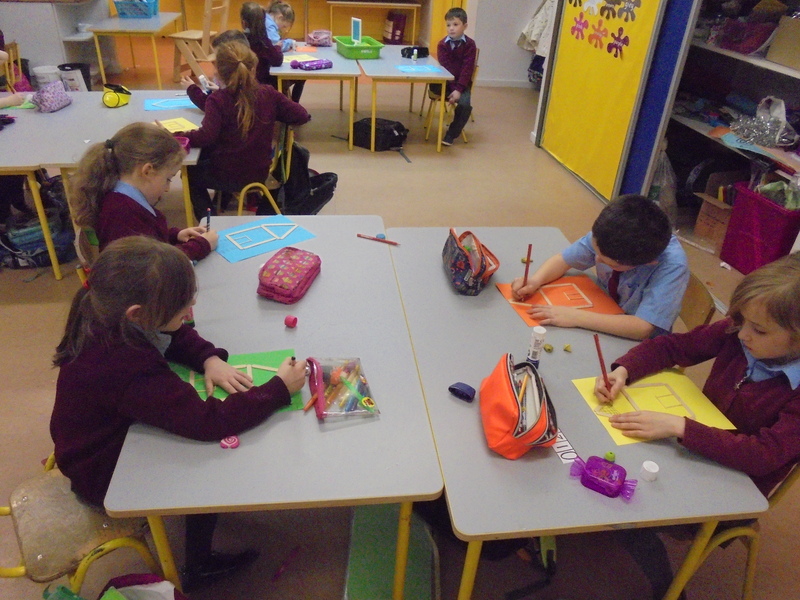 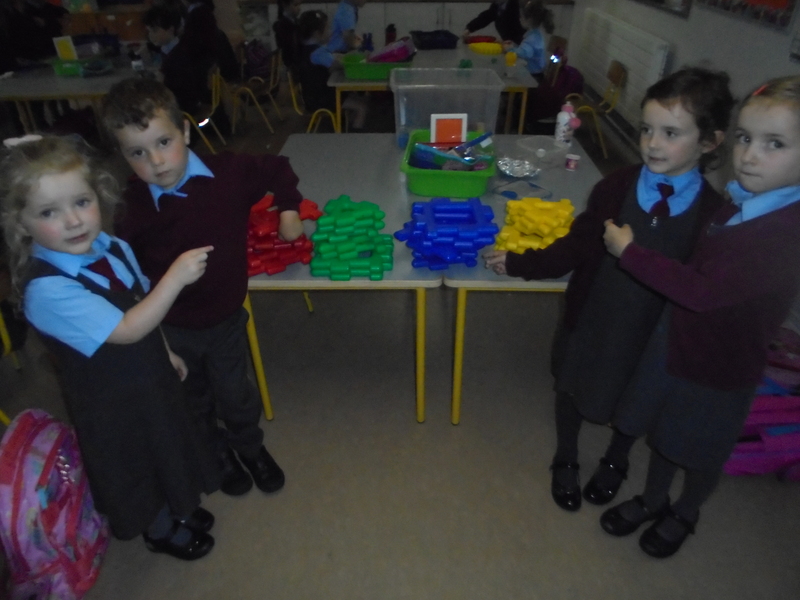 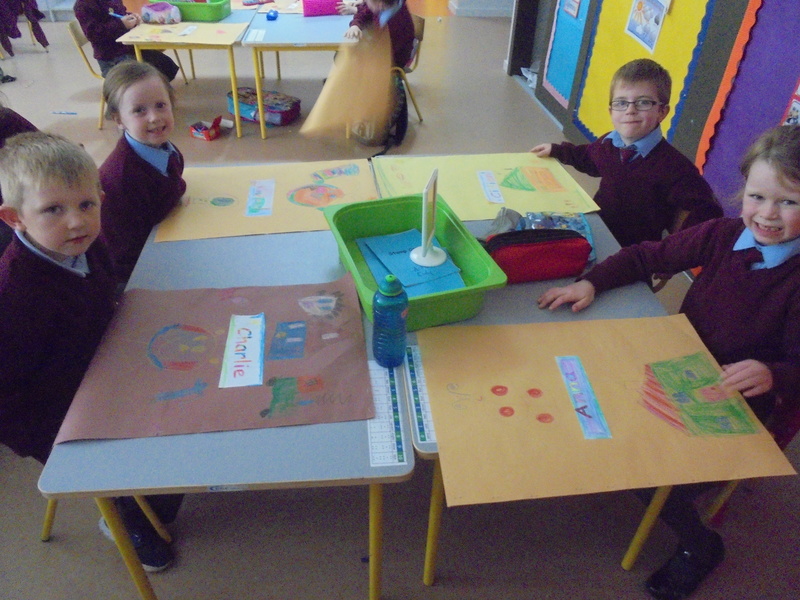 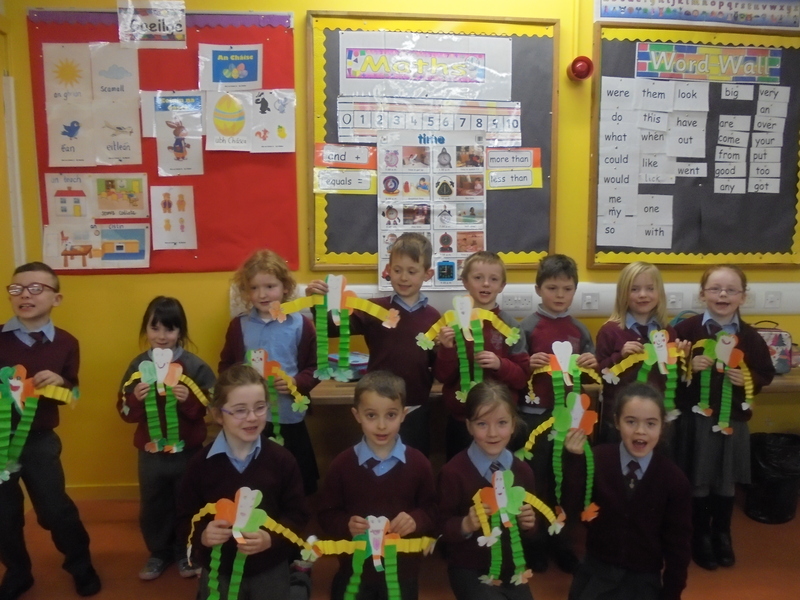 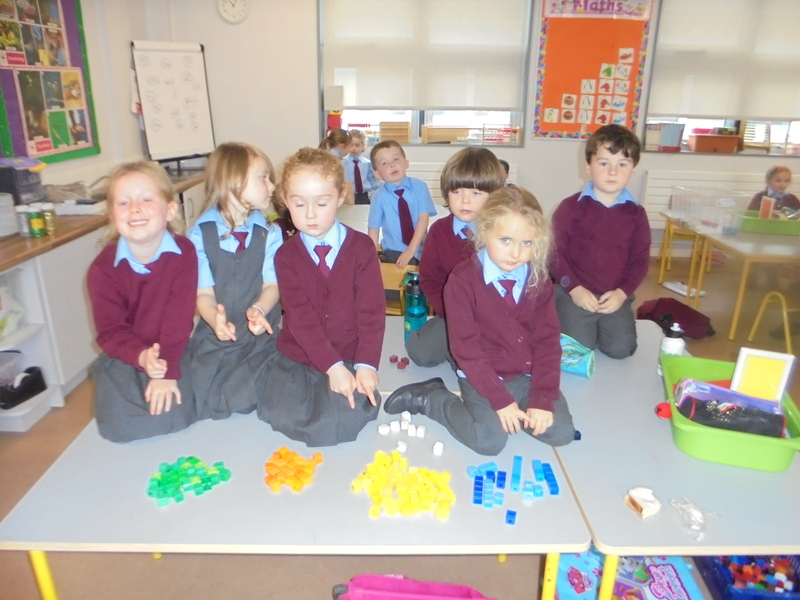 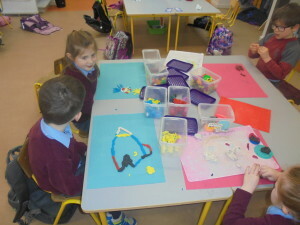 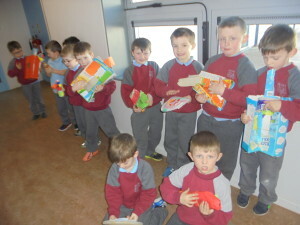 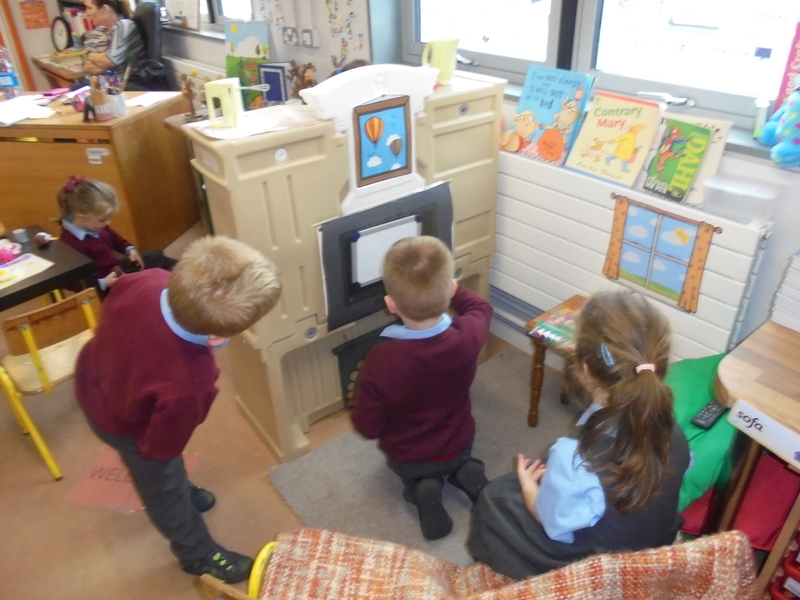 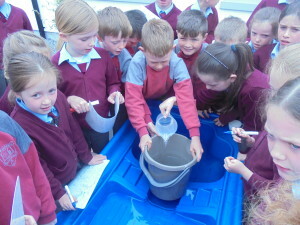 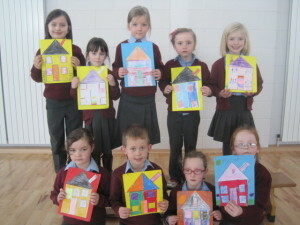 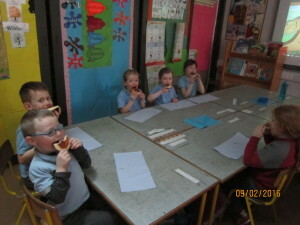 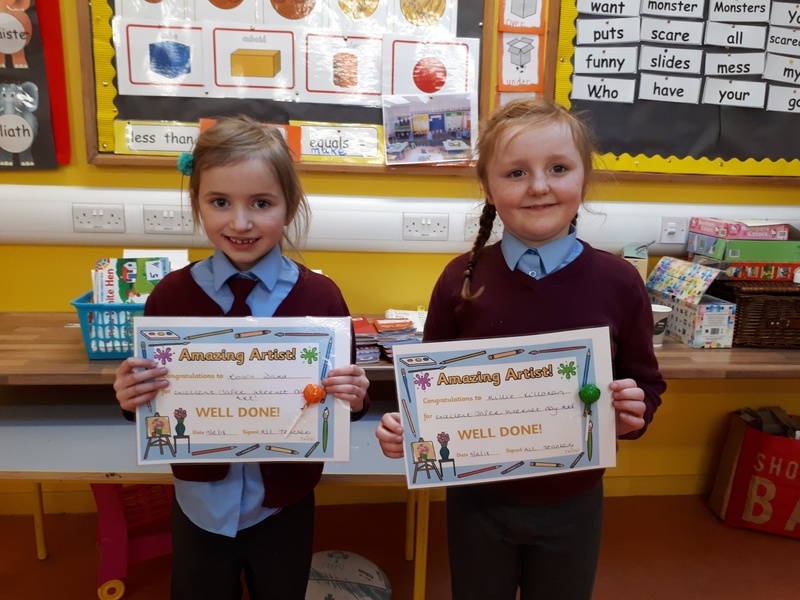 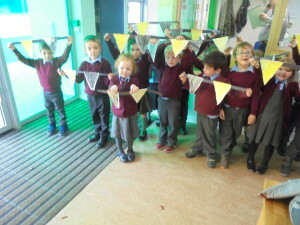 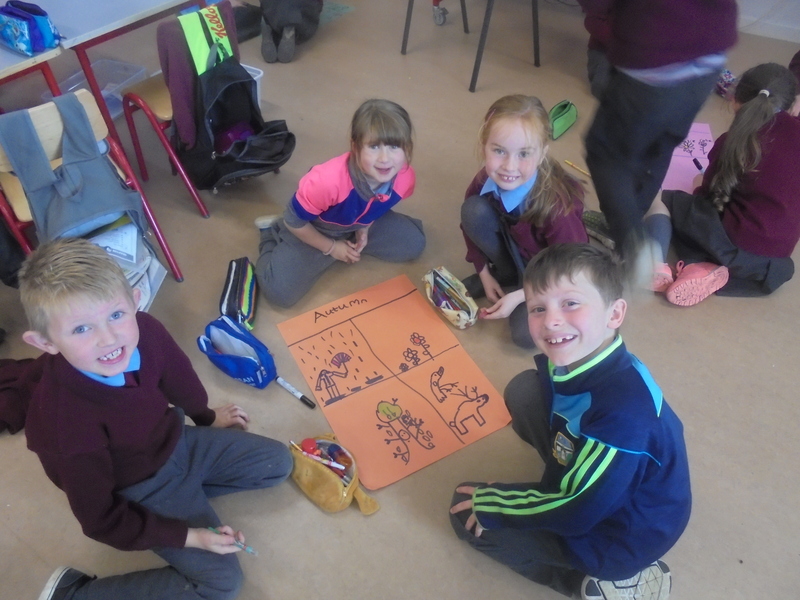 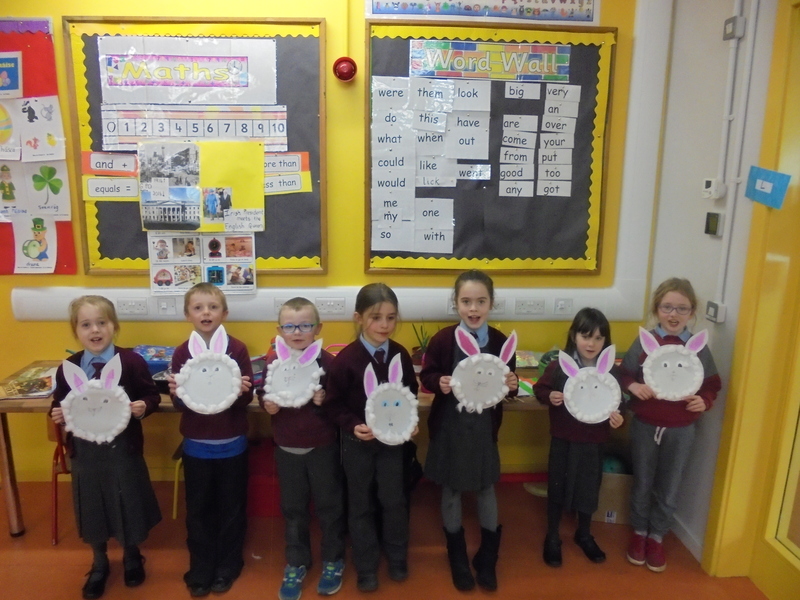 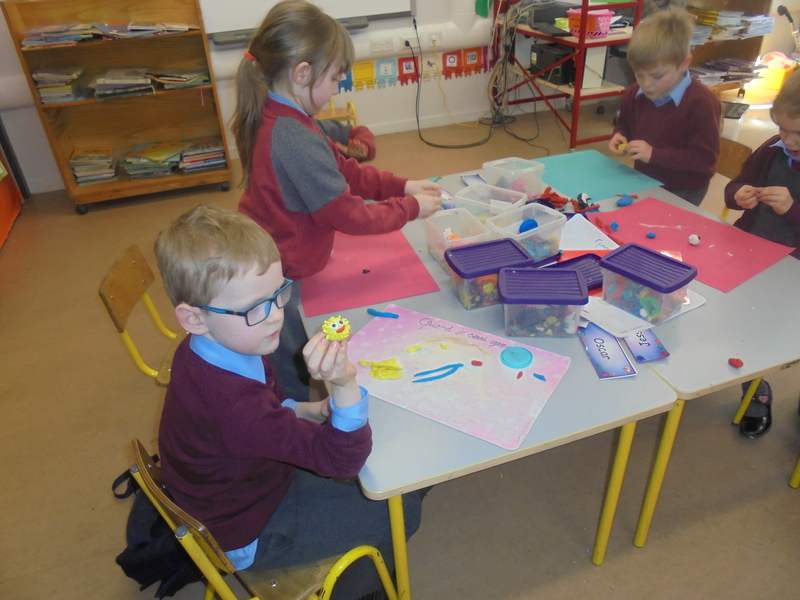 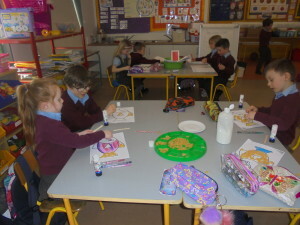 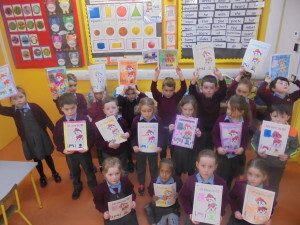 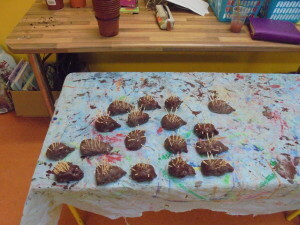 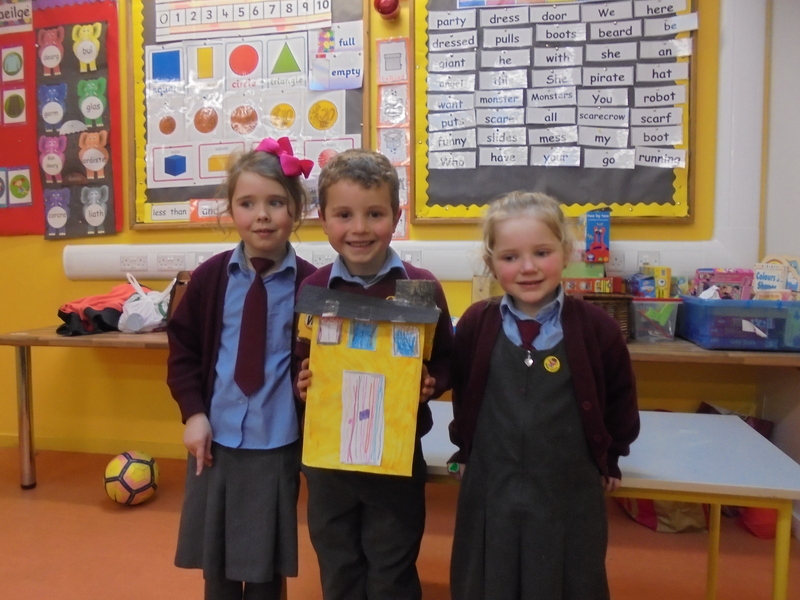 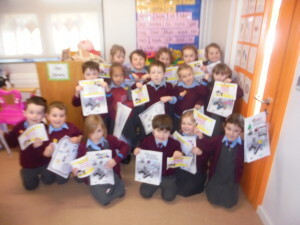 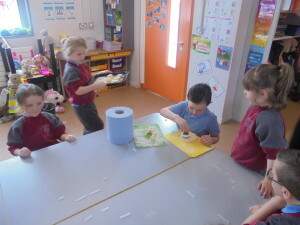 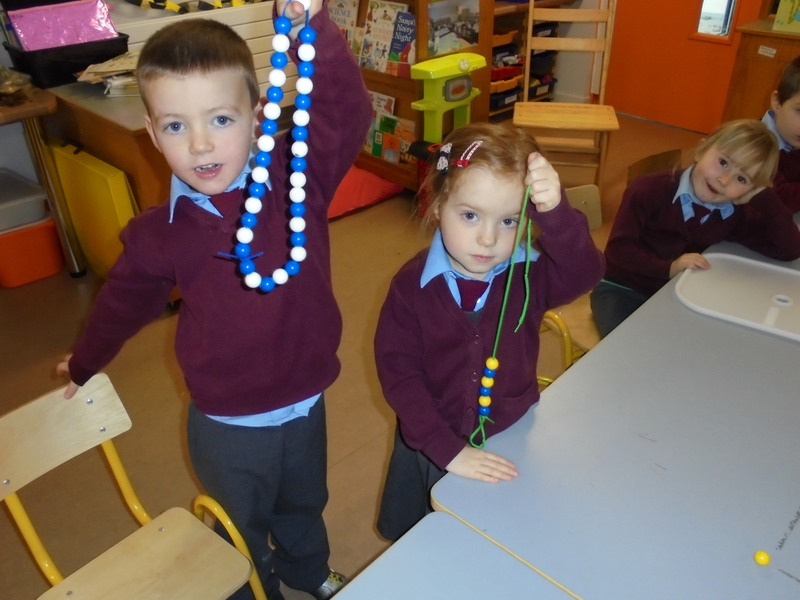 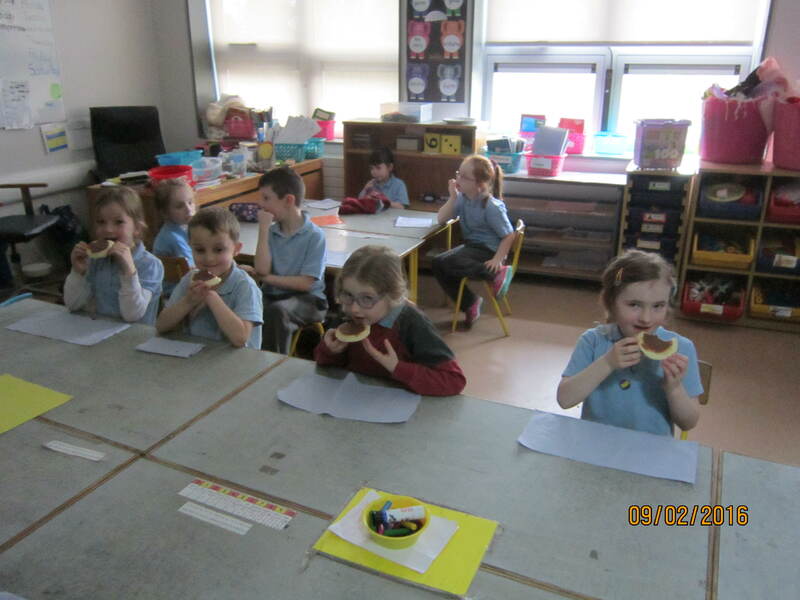 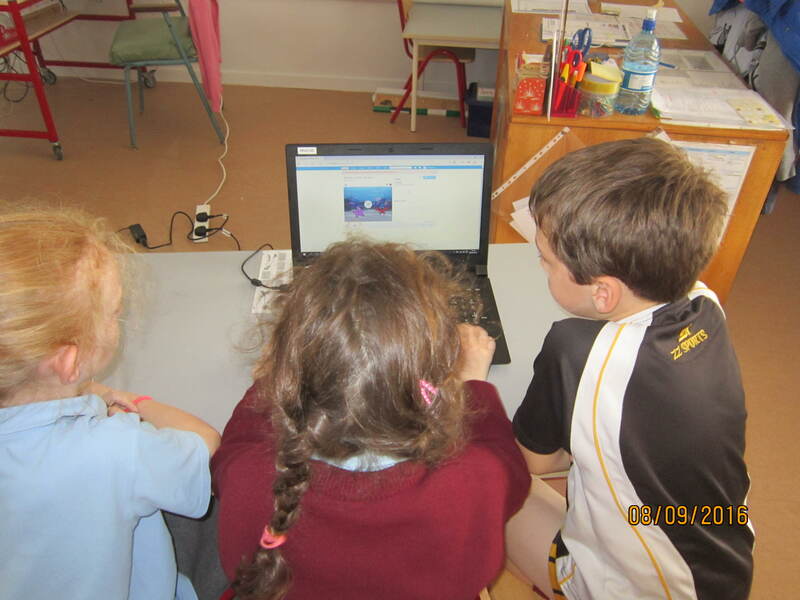 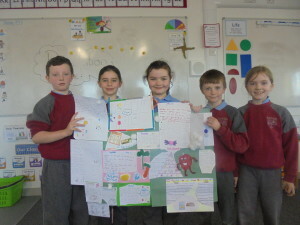 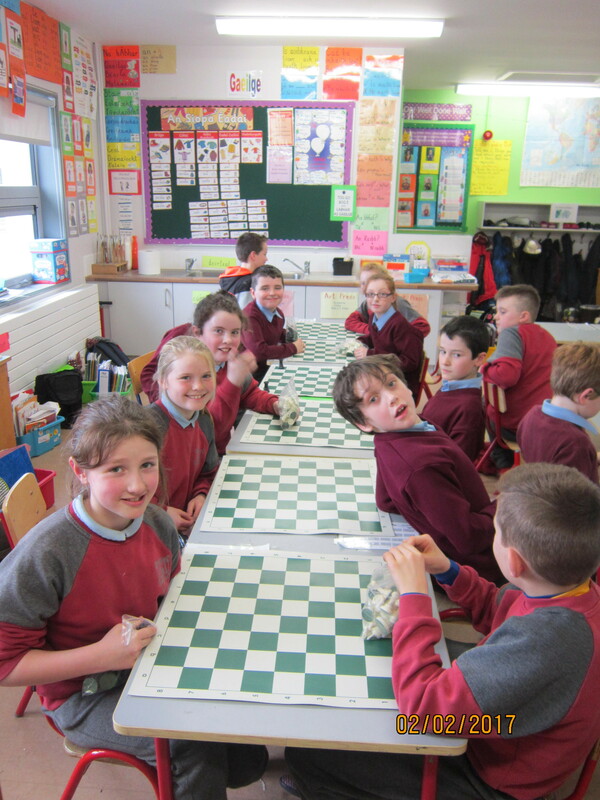 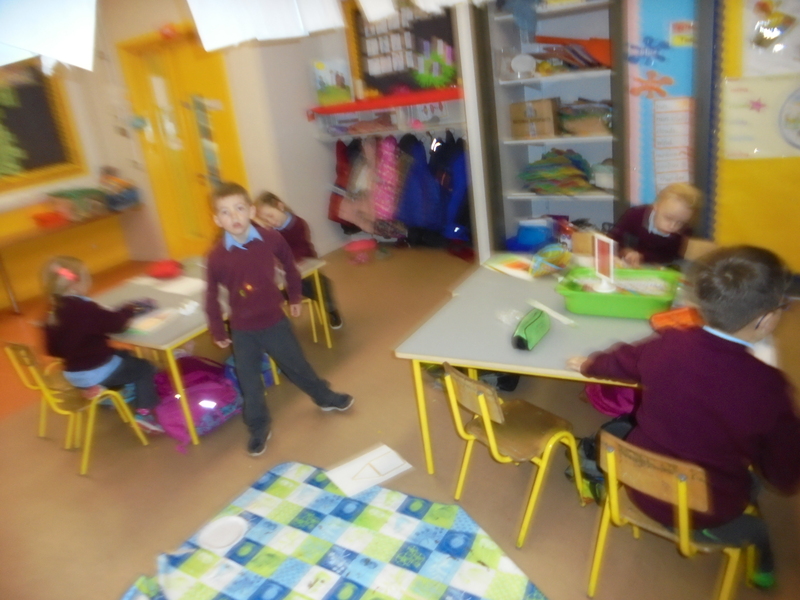 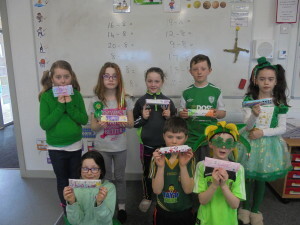 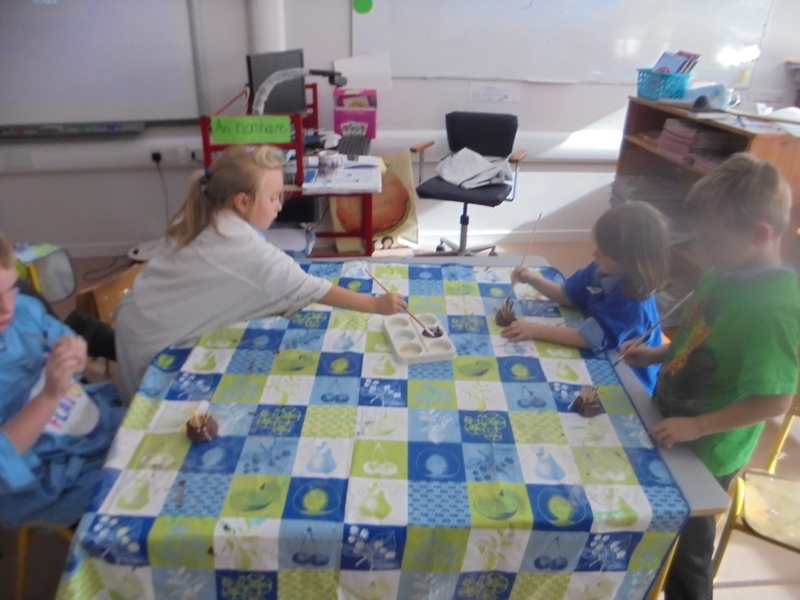 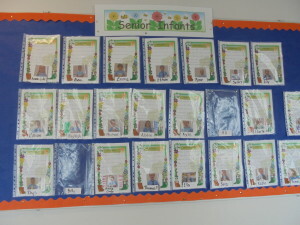 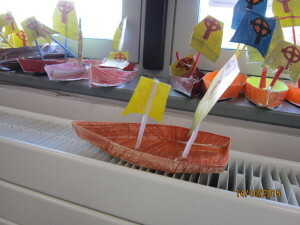 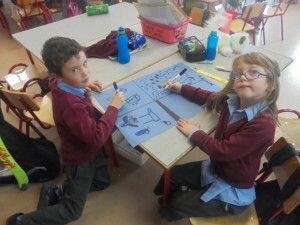 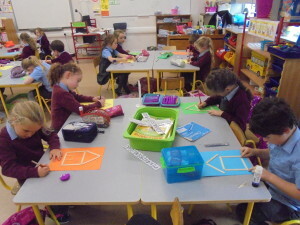 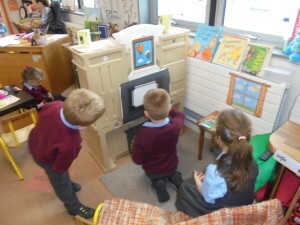 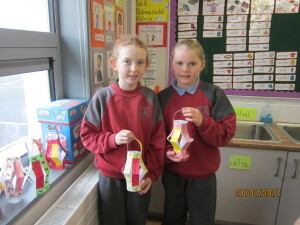 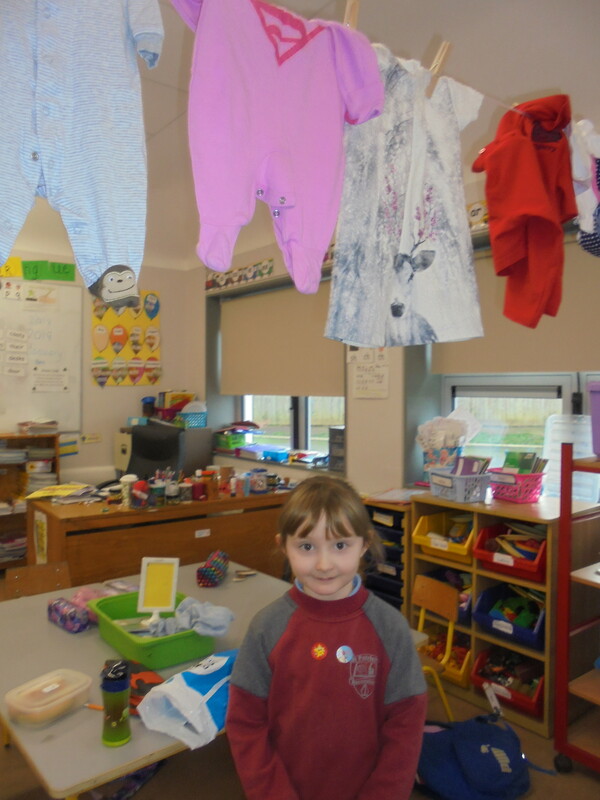 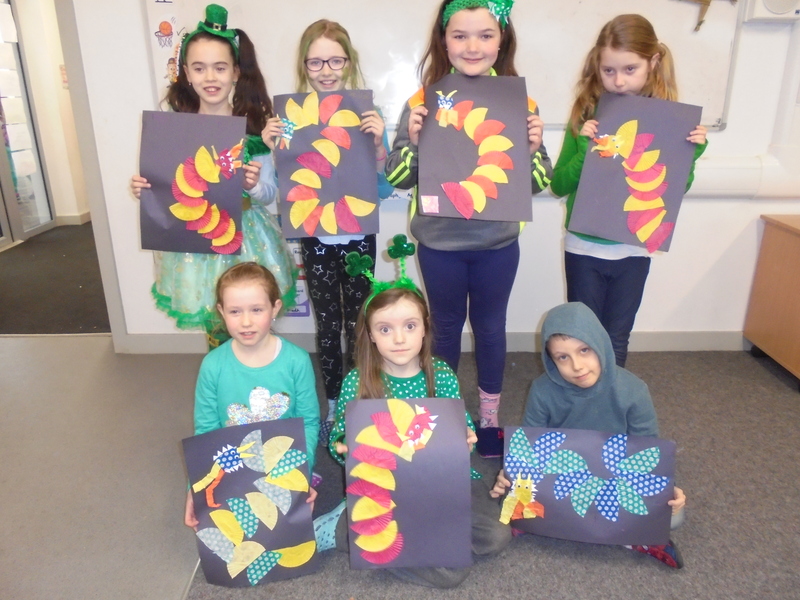 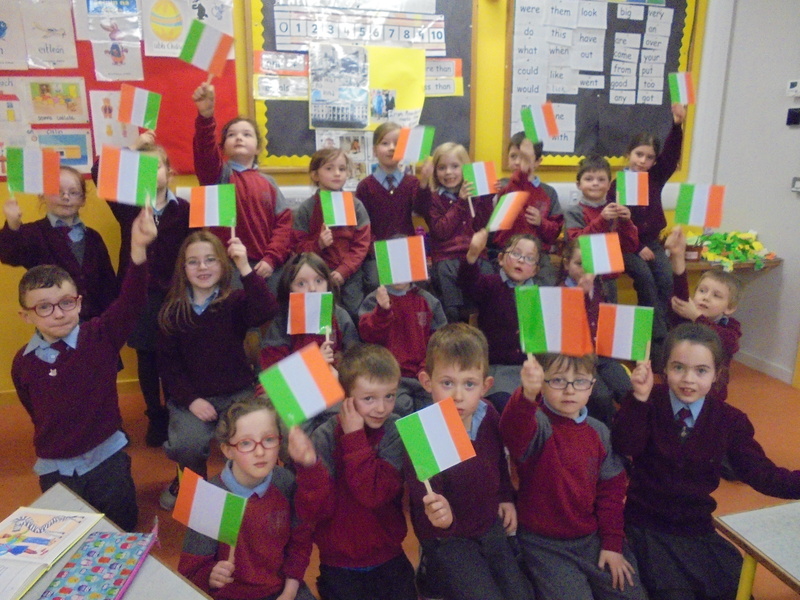 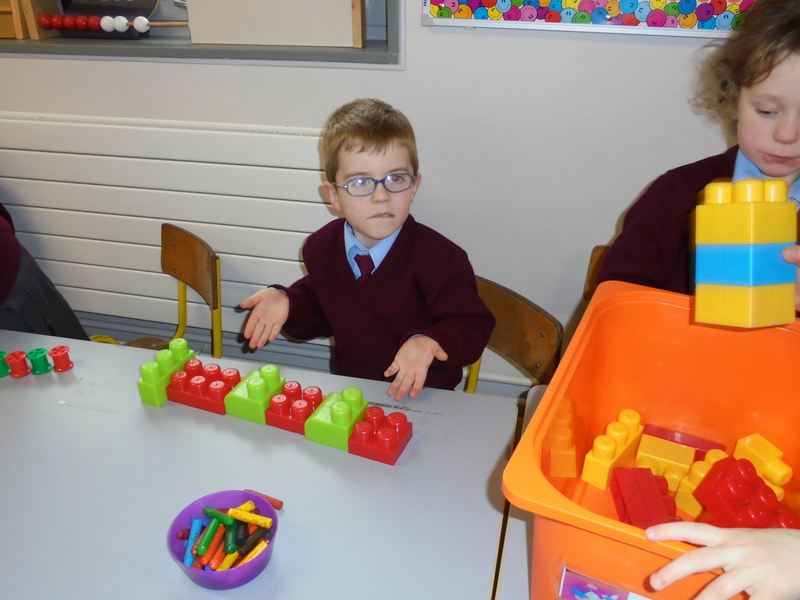 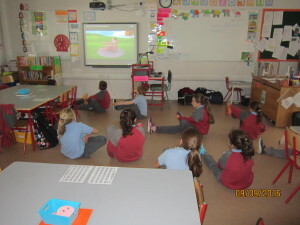 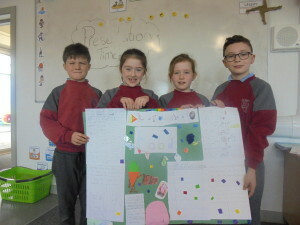 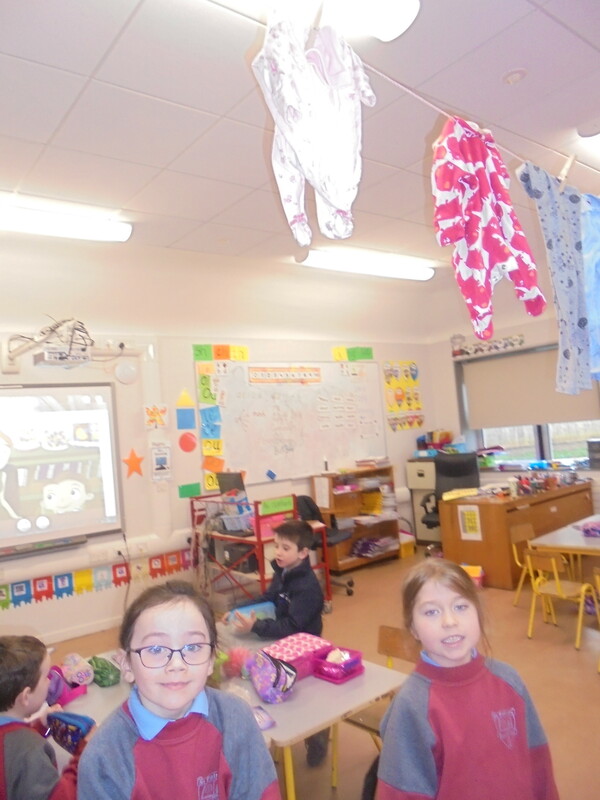 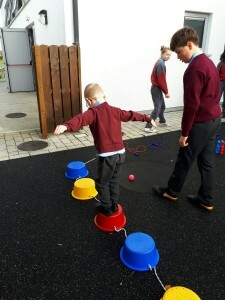 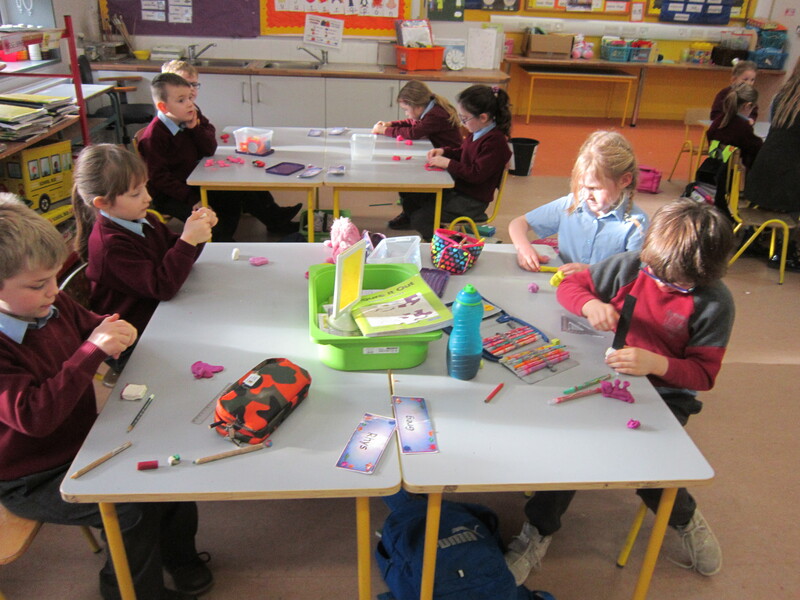 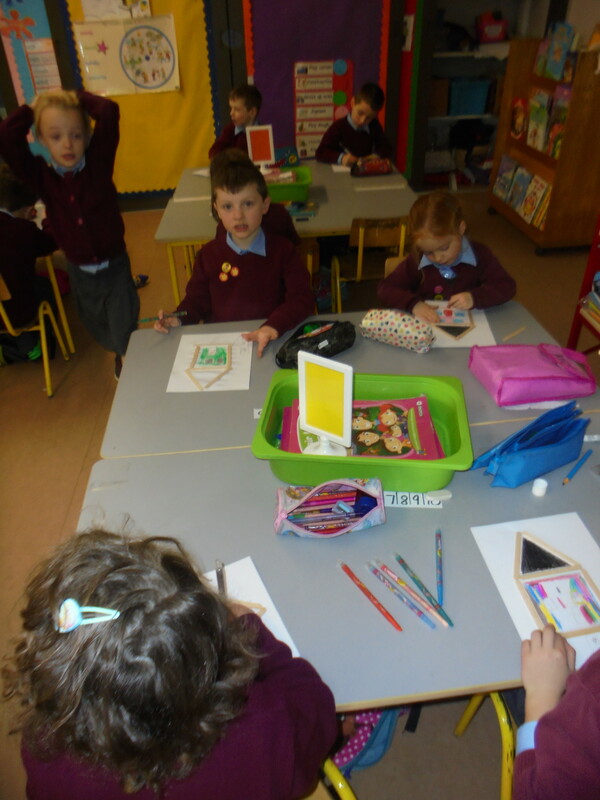 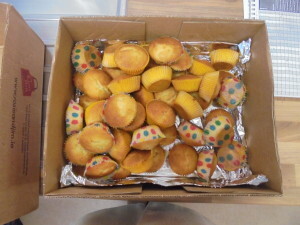 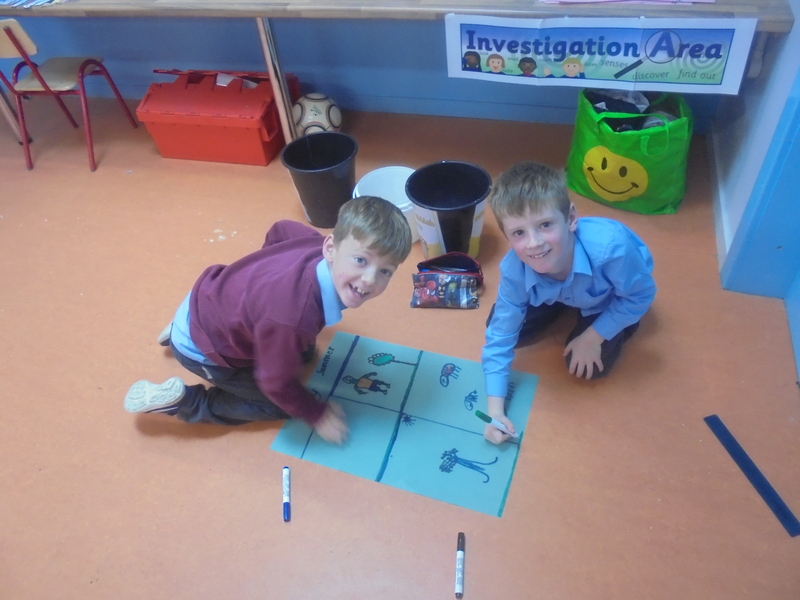 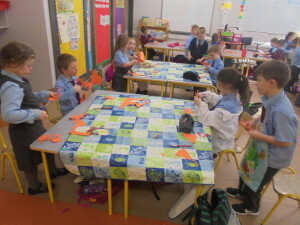 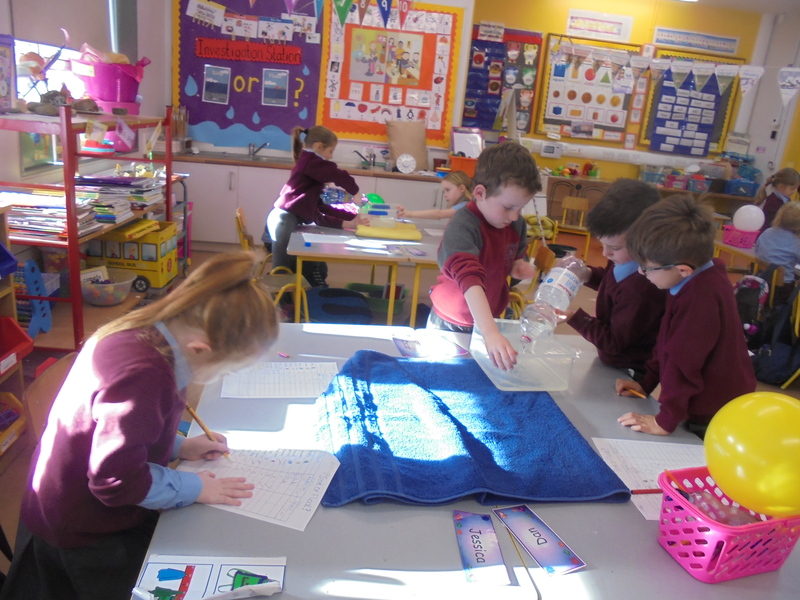 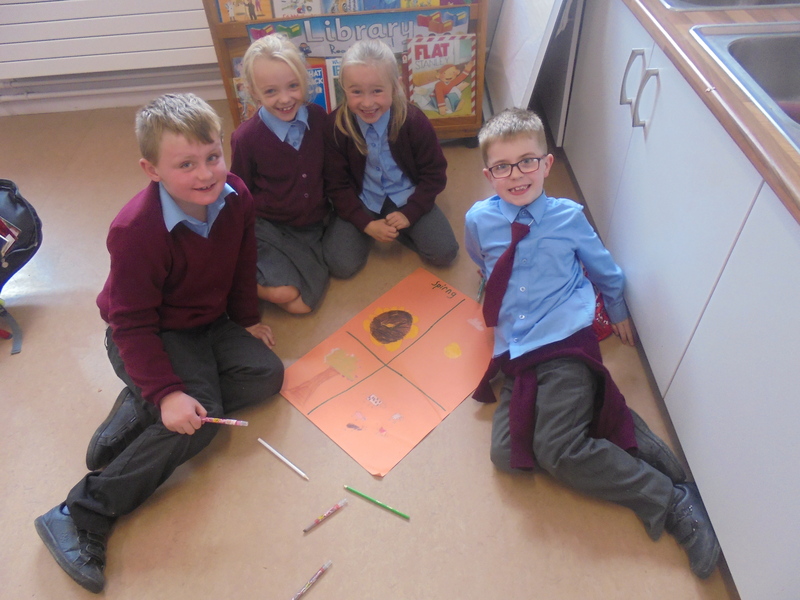 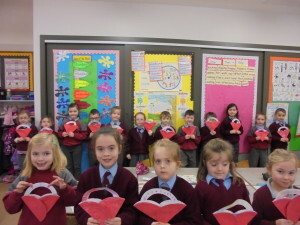 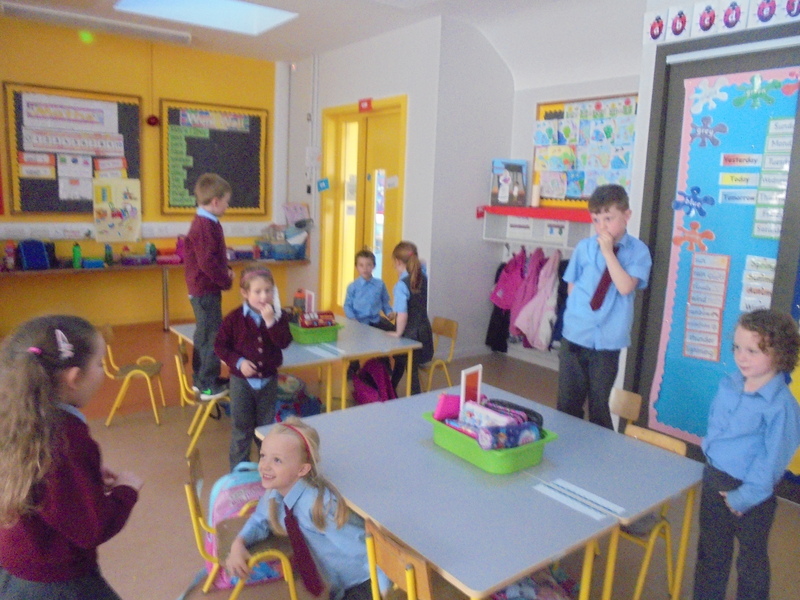 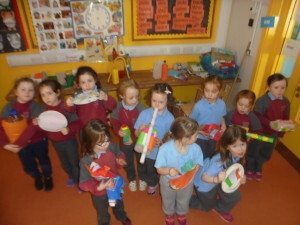 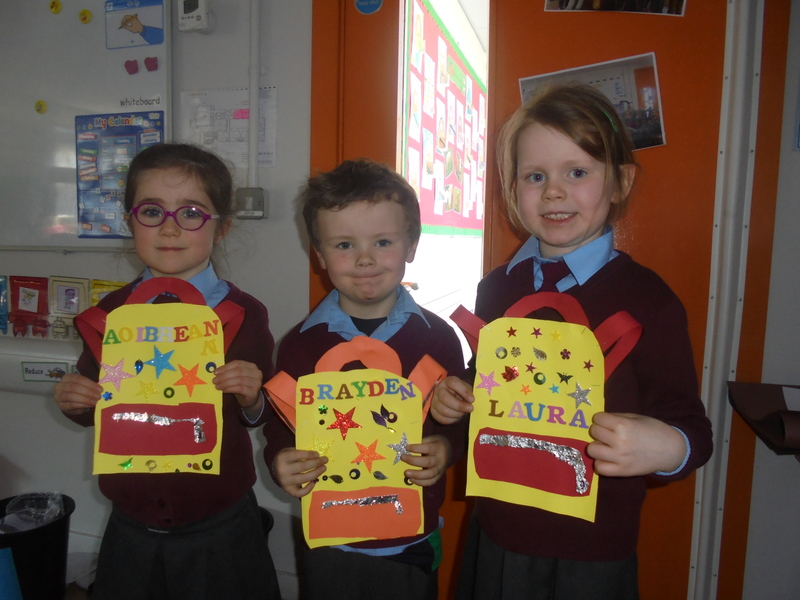 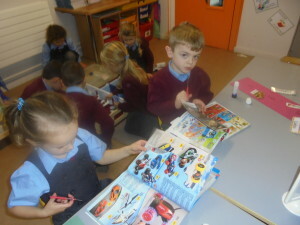 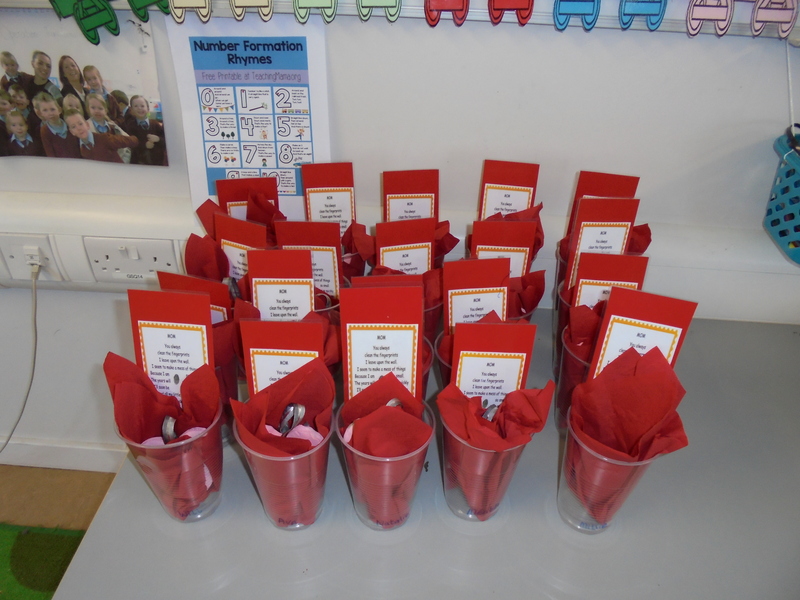 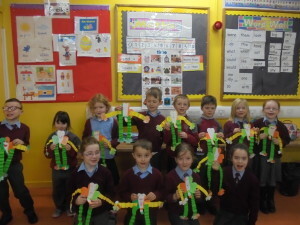 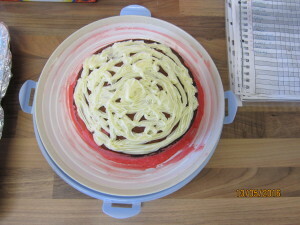 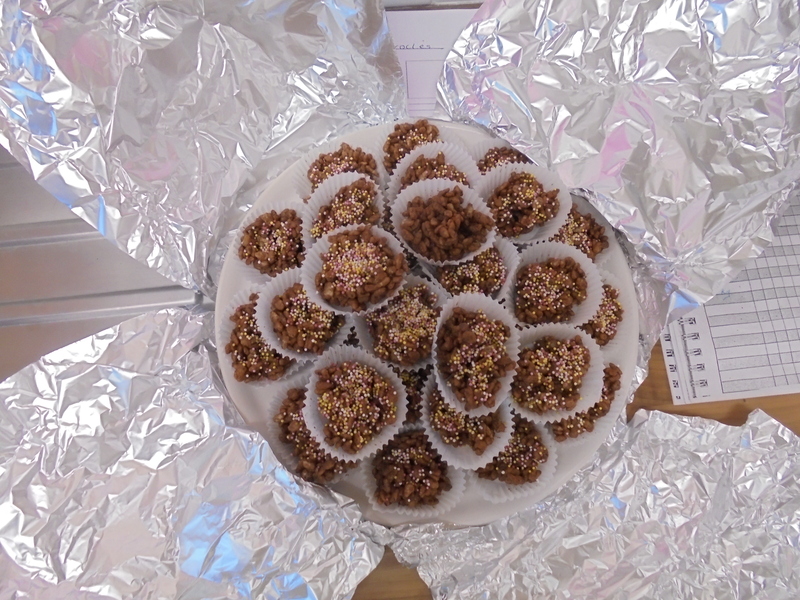 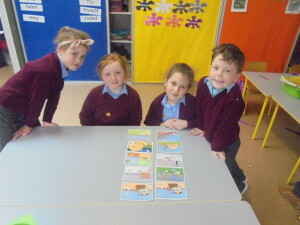 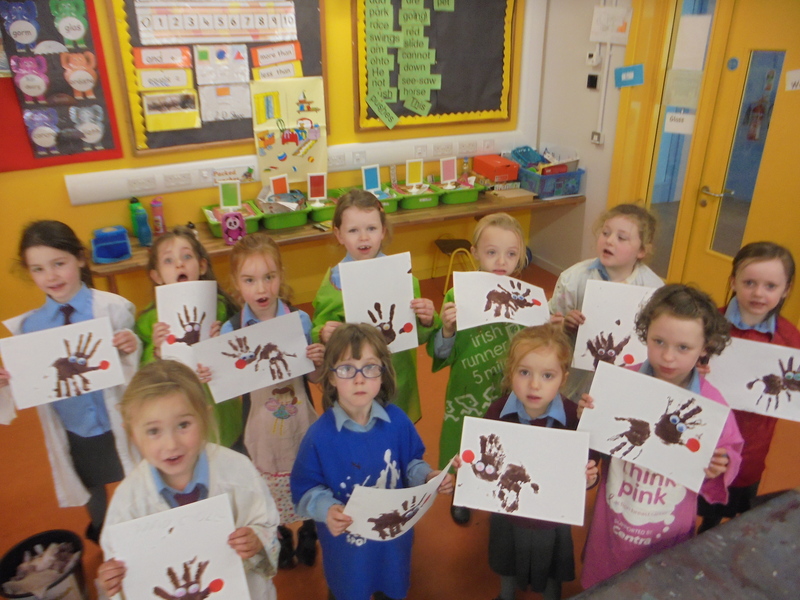 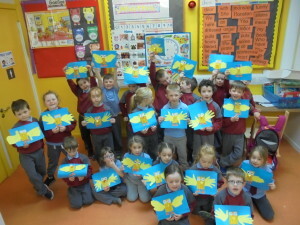 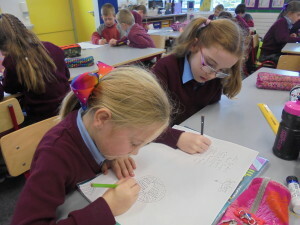 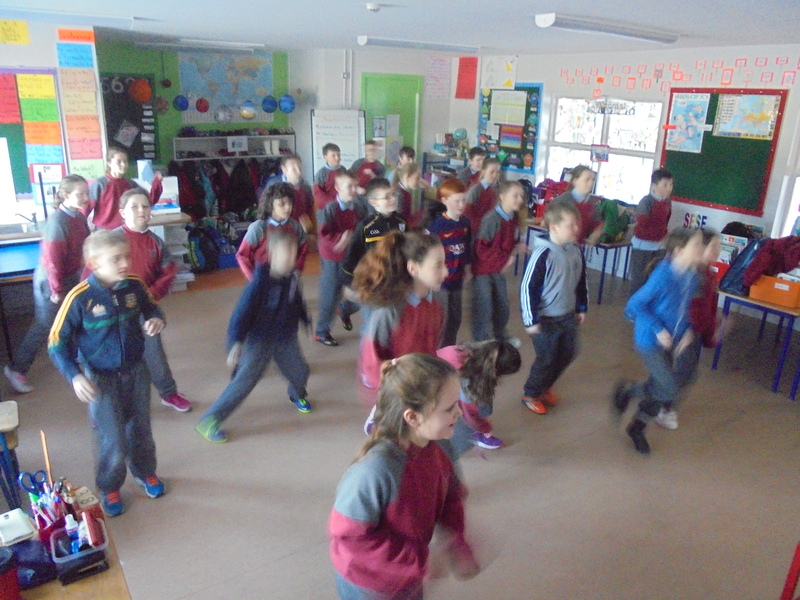 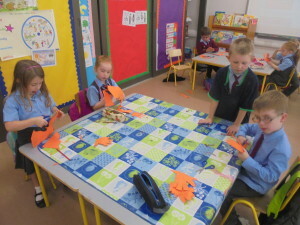 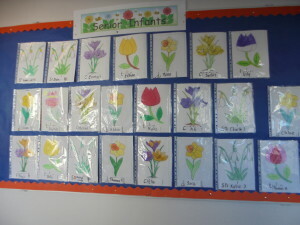 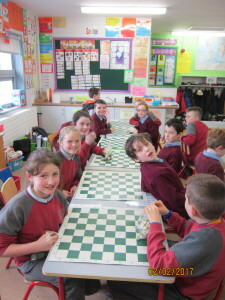 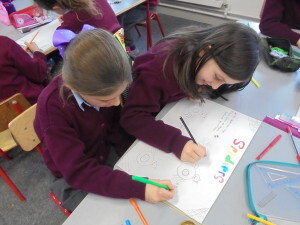 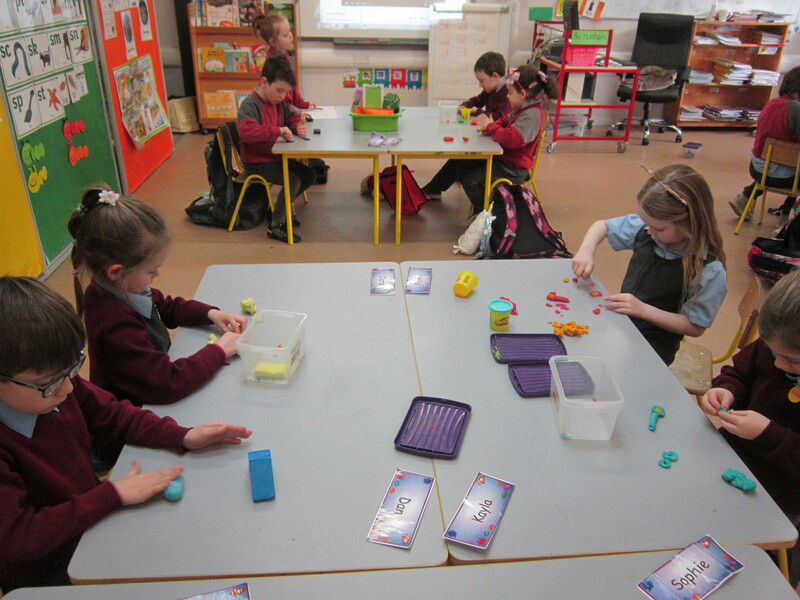 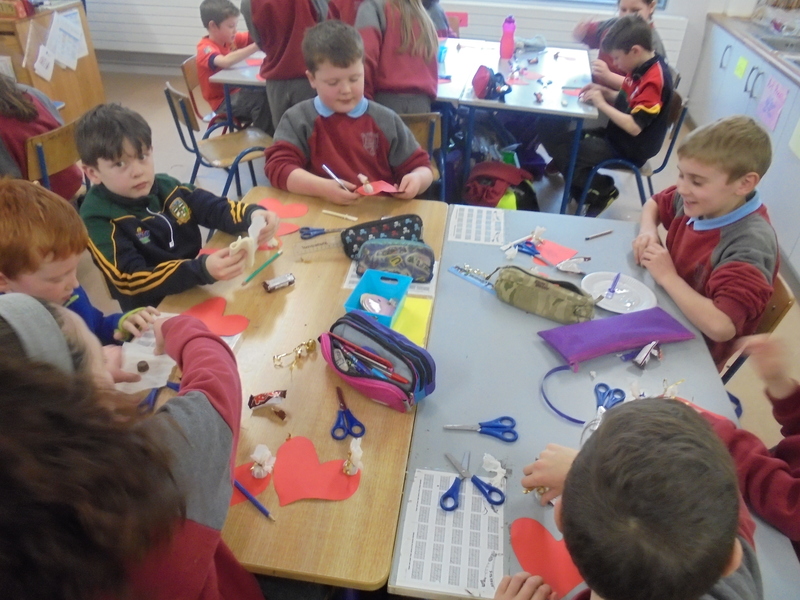 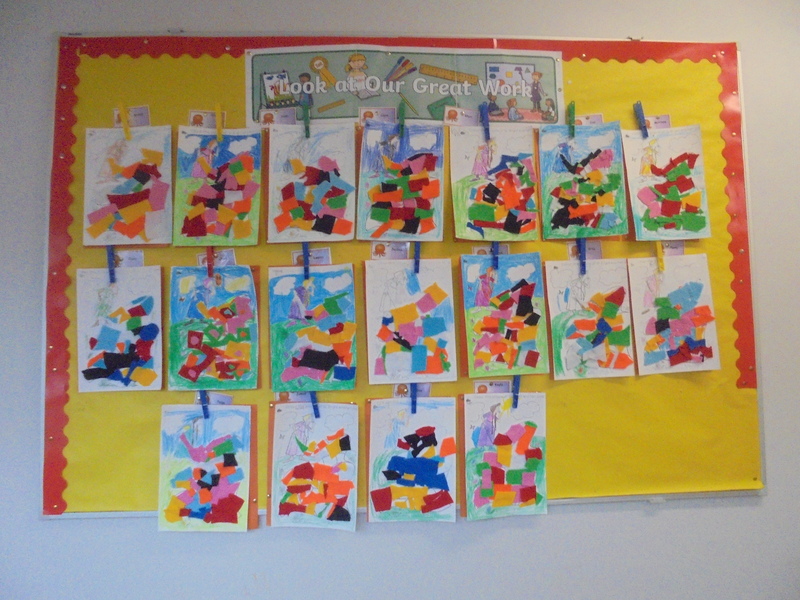 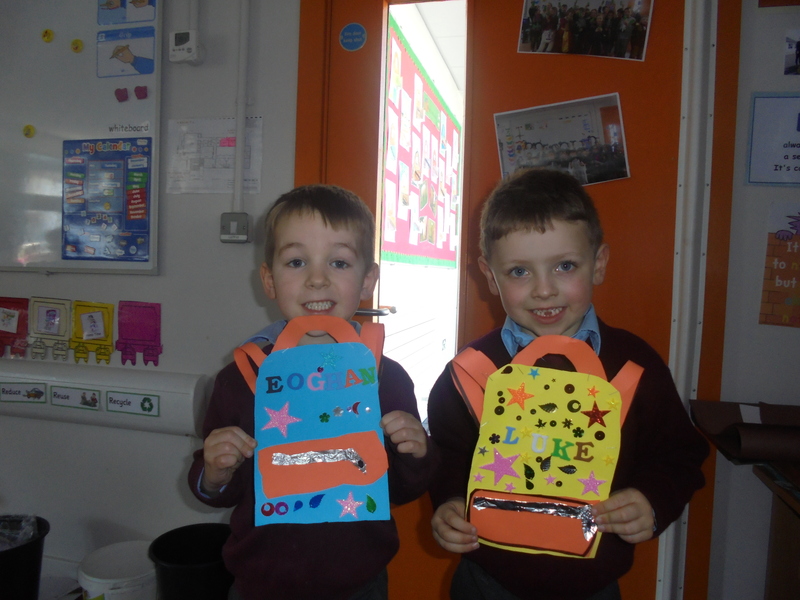 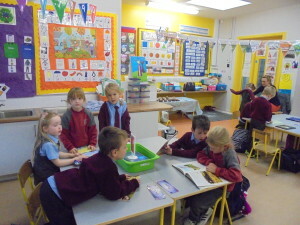 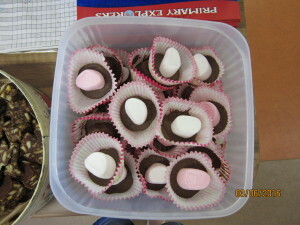 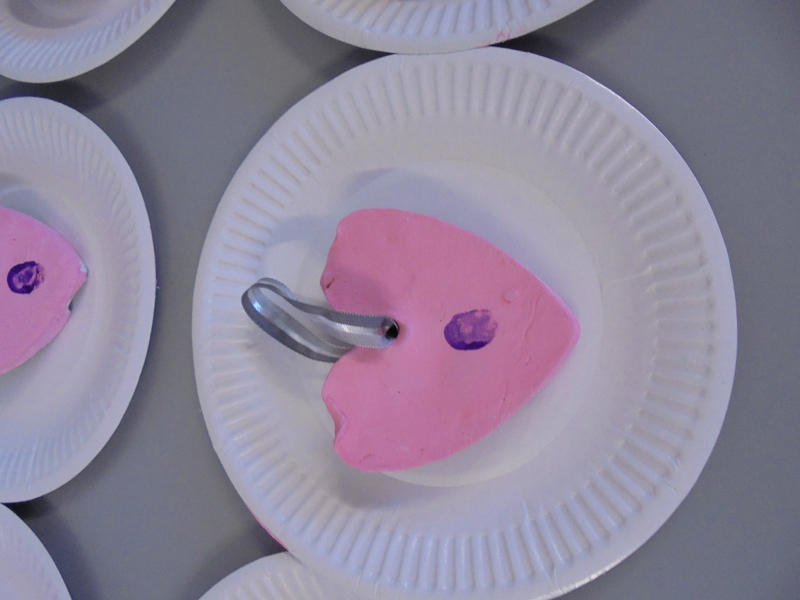 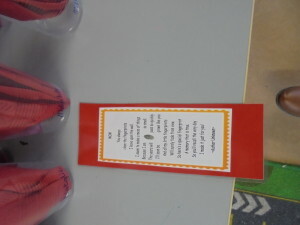 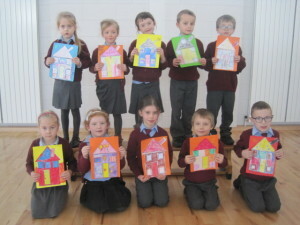 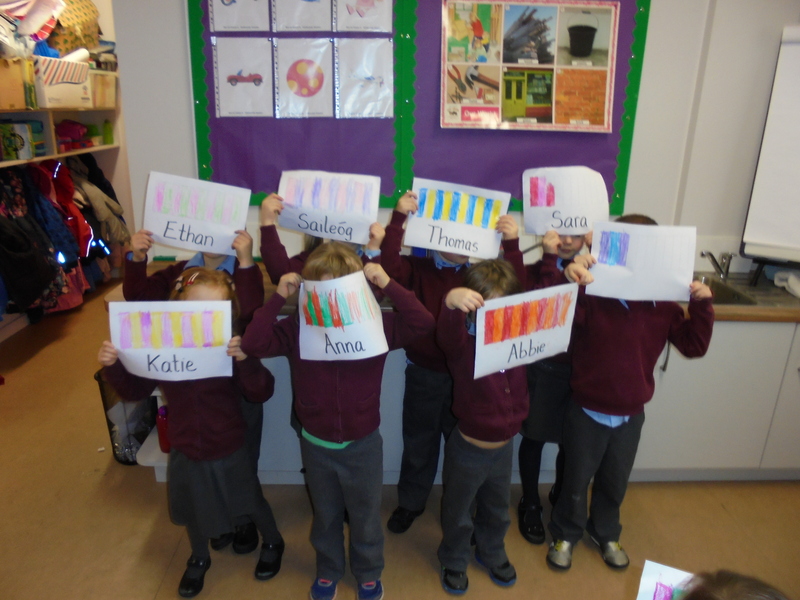 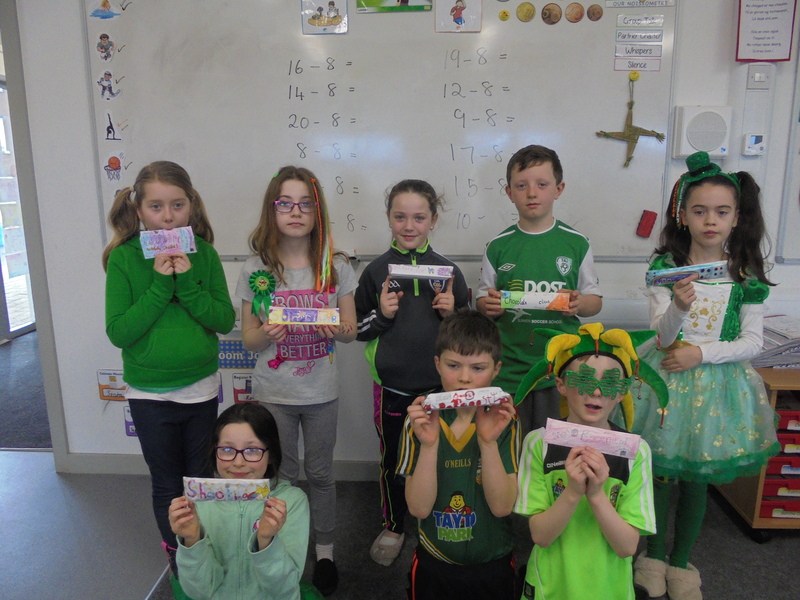 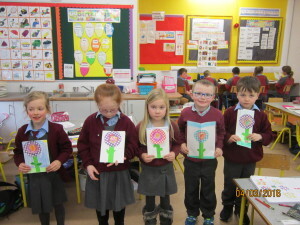 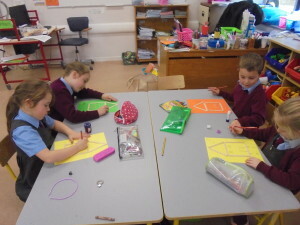 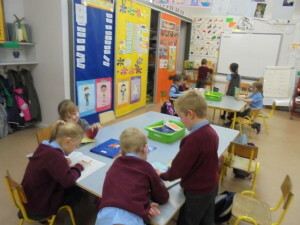 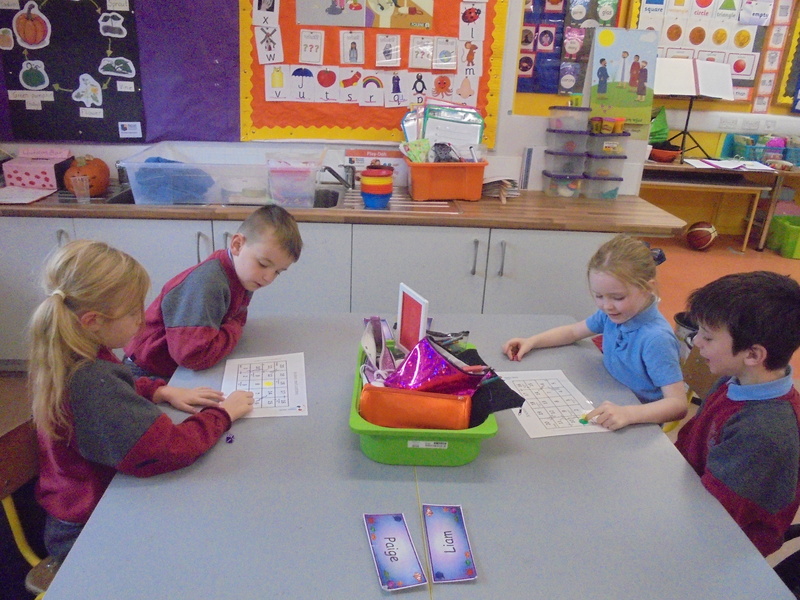 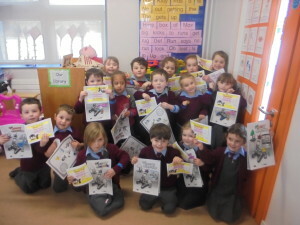 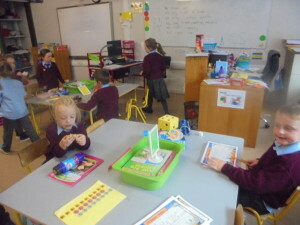 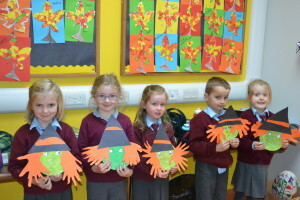 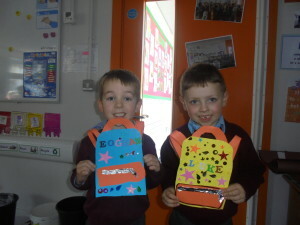 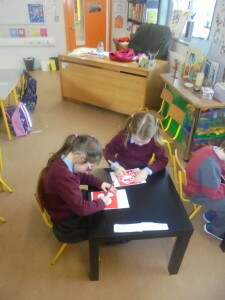 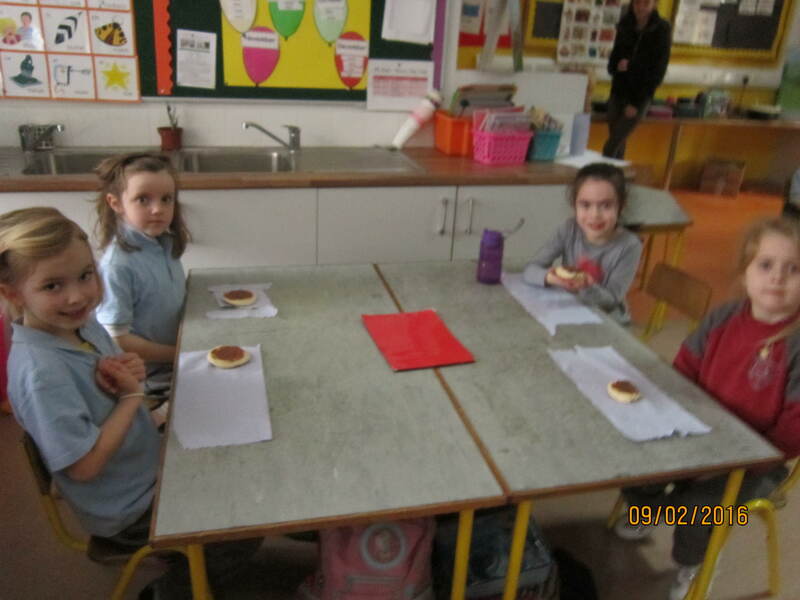 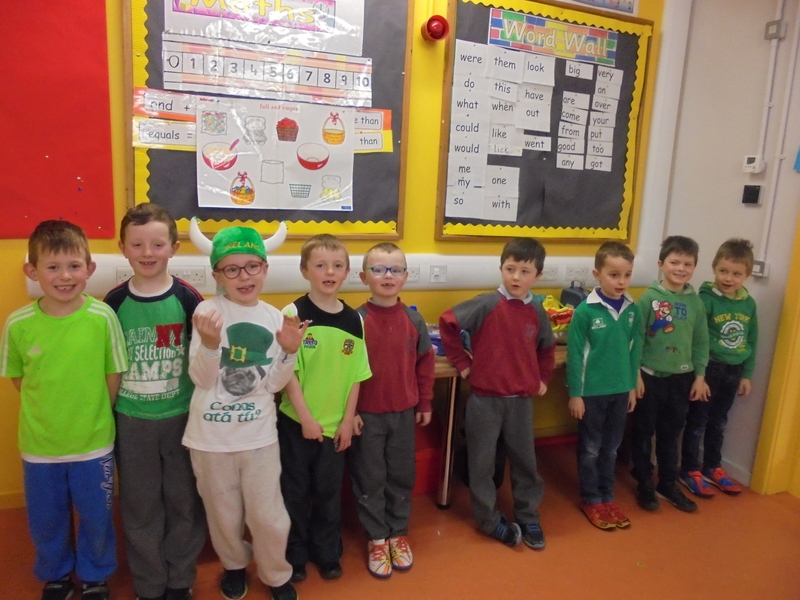 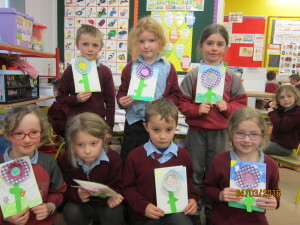 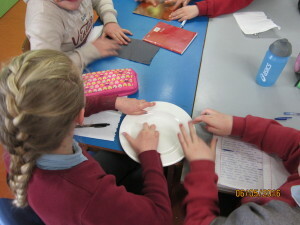 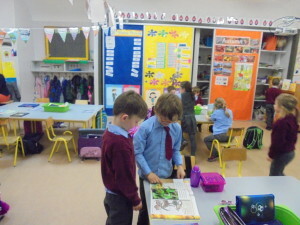 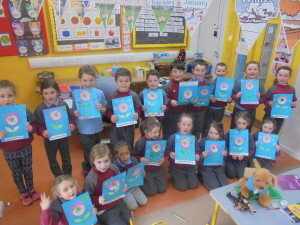 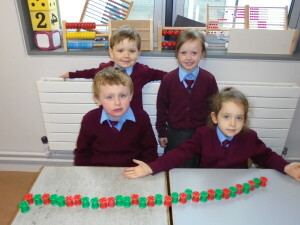 Ms Ward’s Senior Infants celebrated maths week with various maths activities. 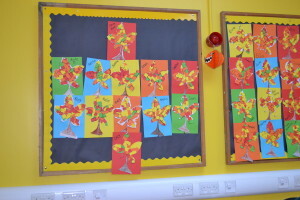 Oct 2018. 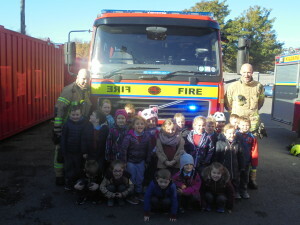 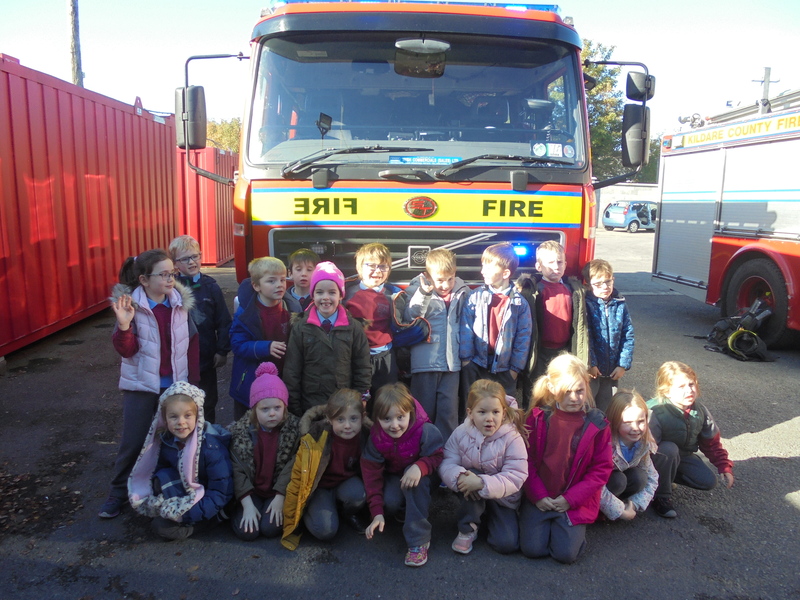 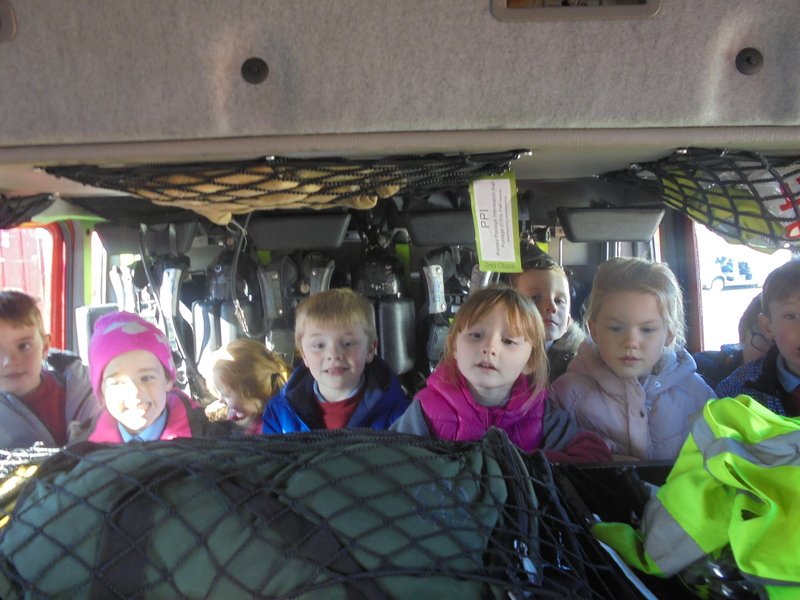 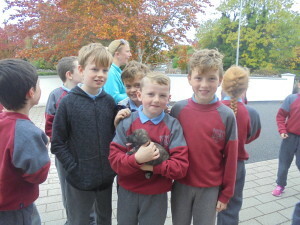 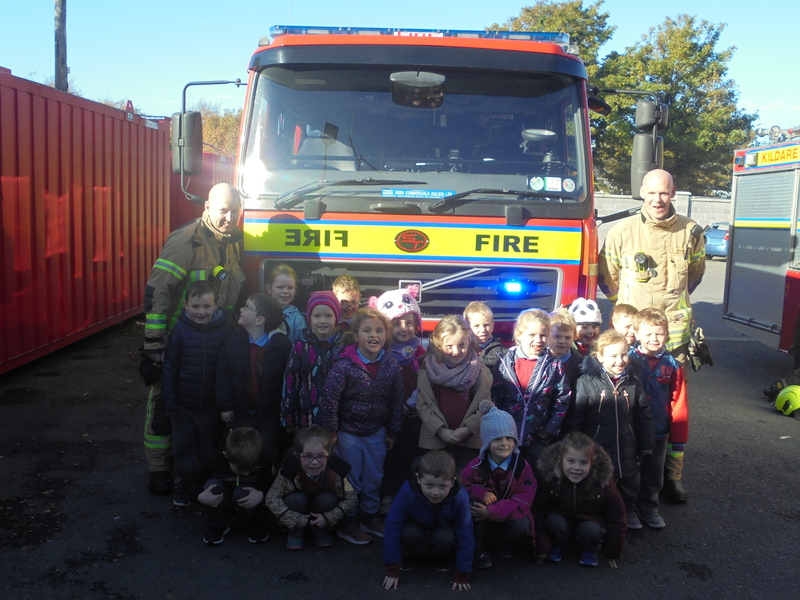 Ms Brogan’s Junior Infants and Ms Ward’s Senior Infants had fun on their visit to Maynooth Fire Station. 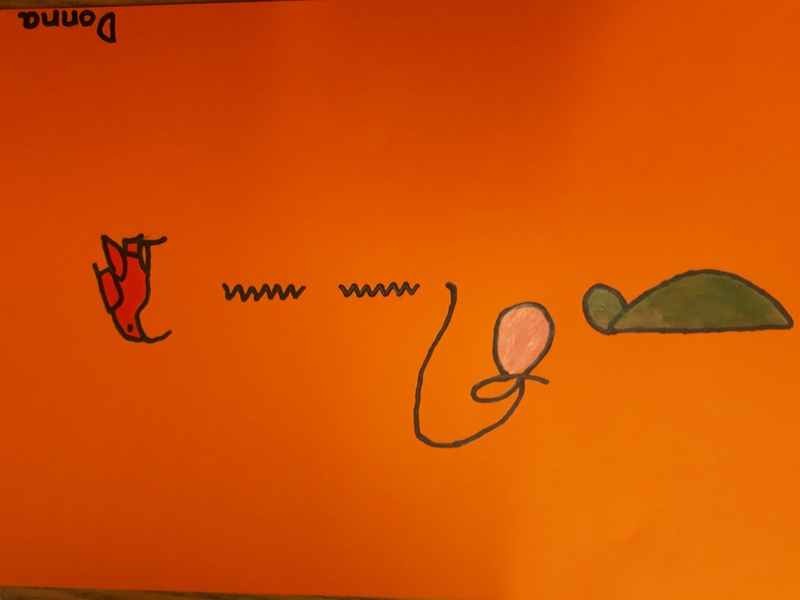 Oct 2018. 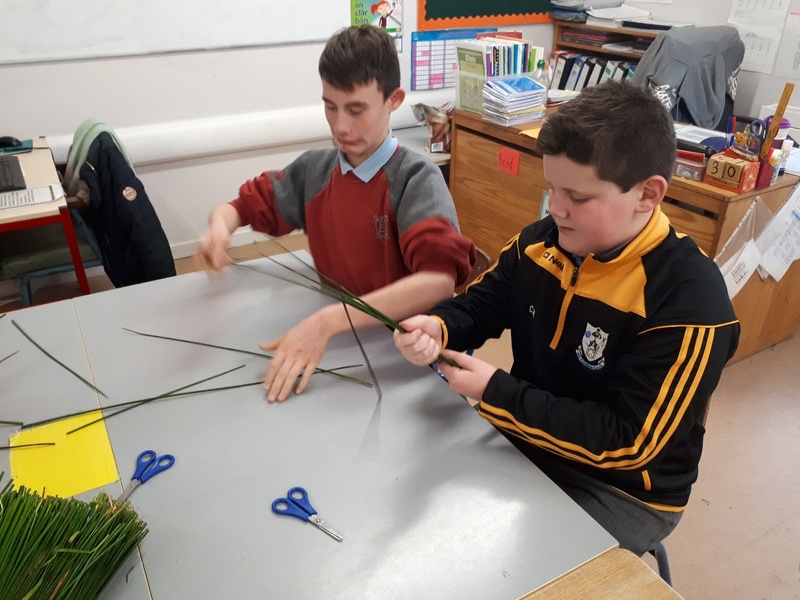 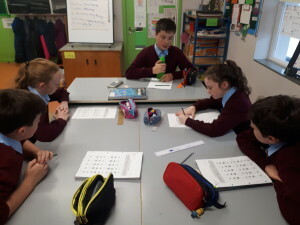 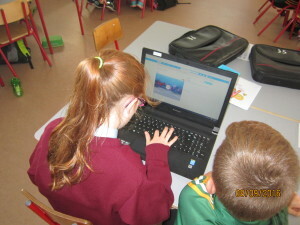 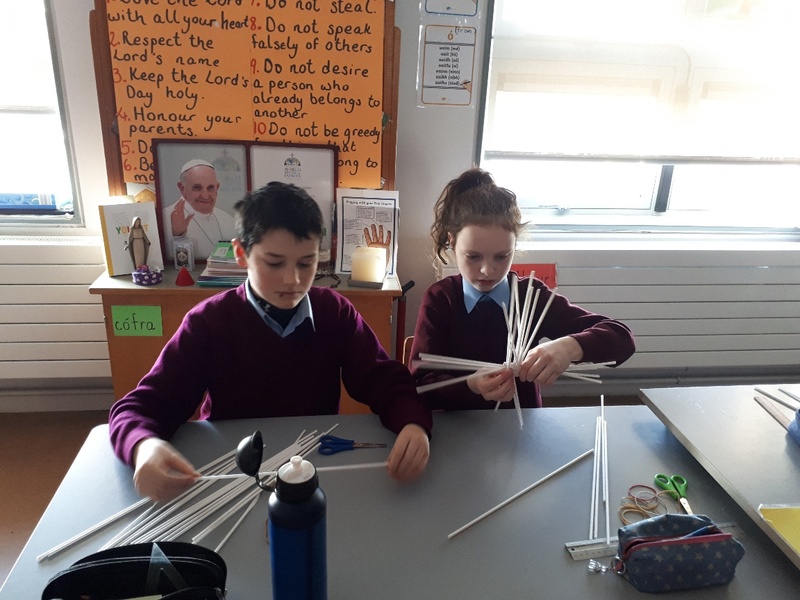 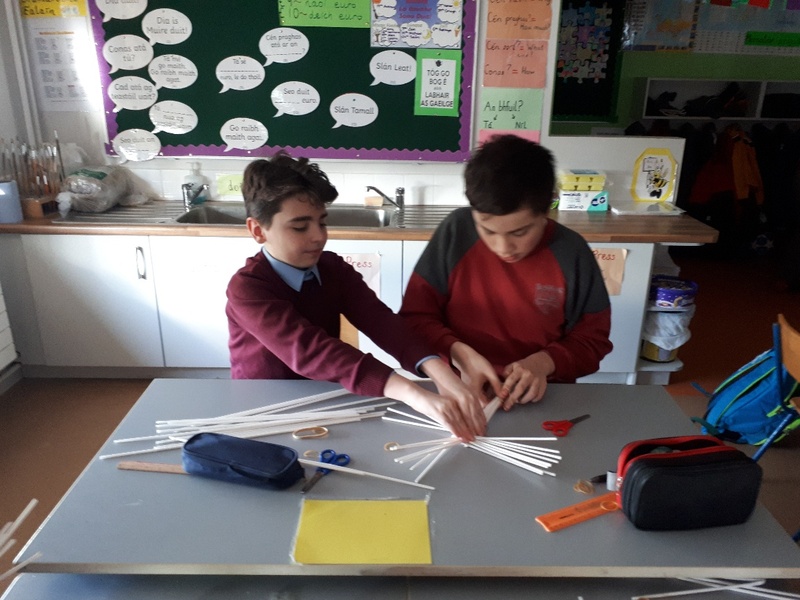 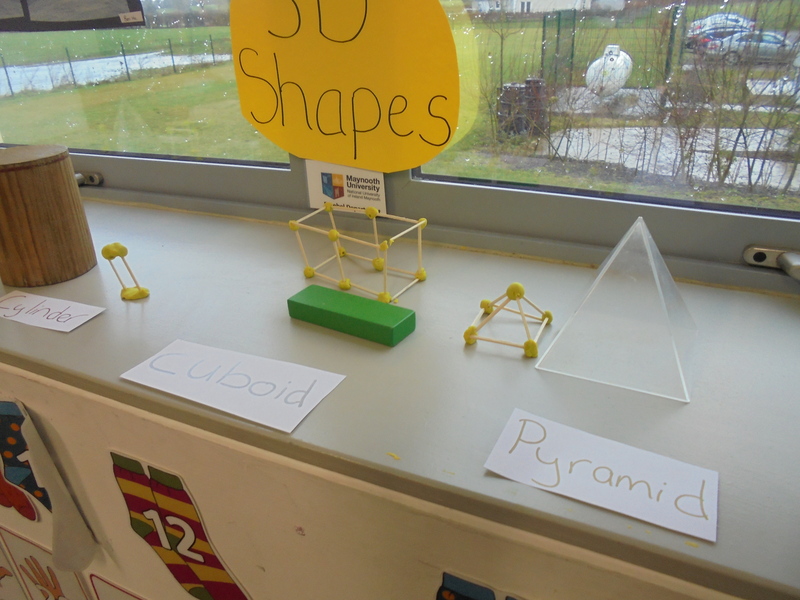 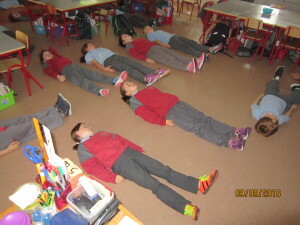 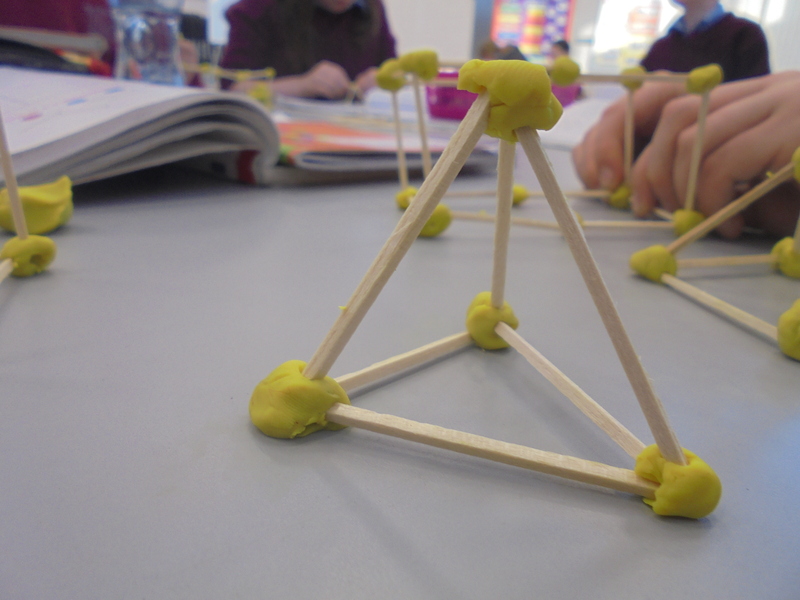 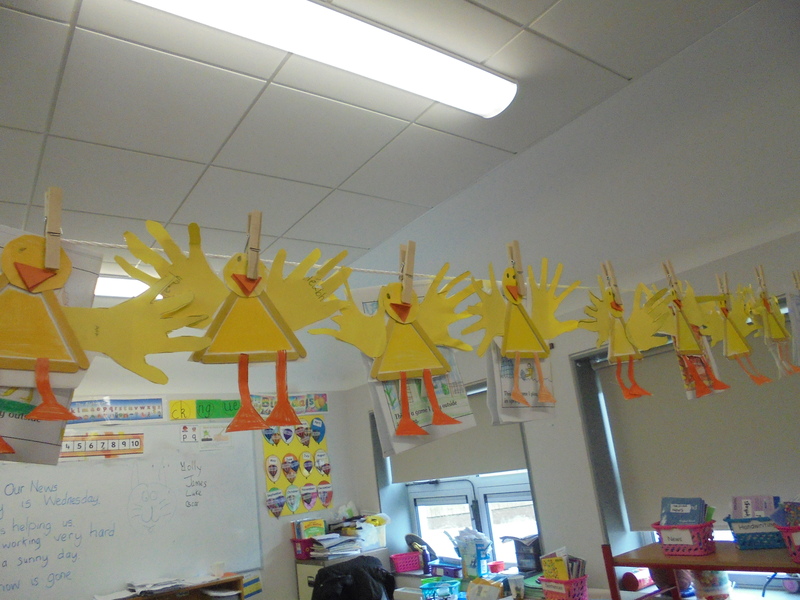 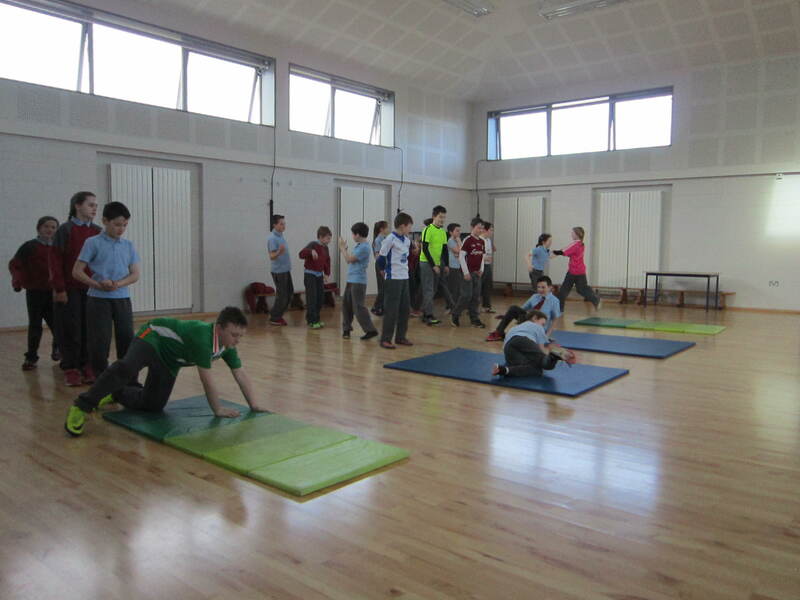 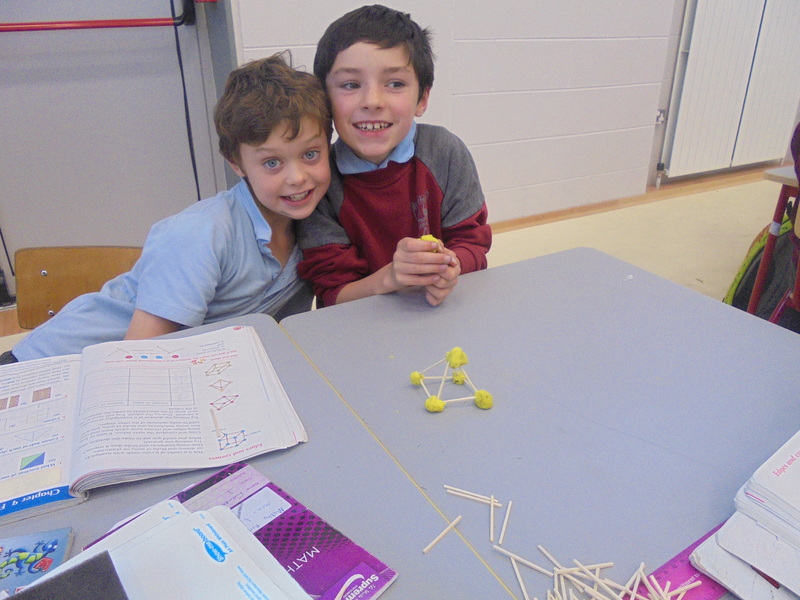 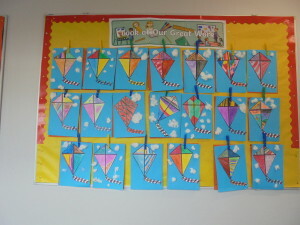 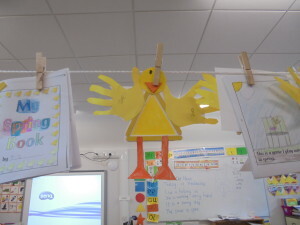 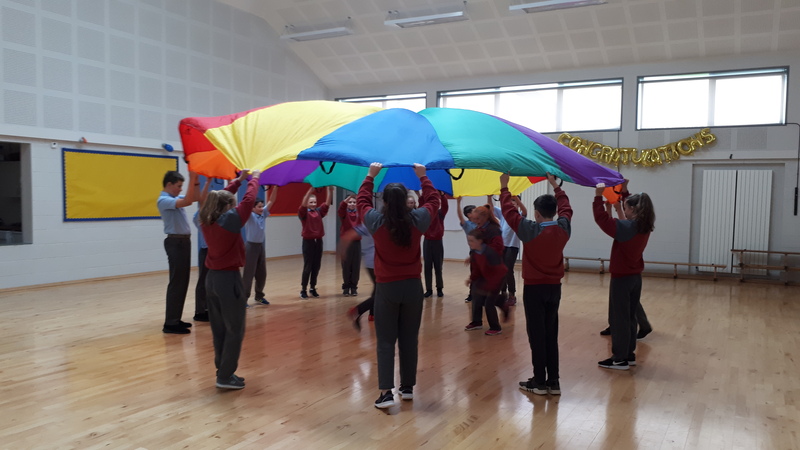 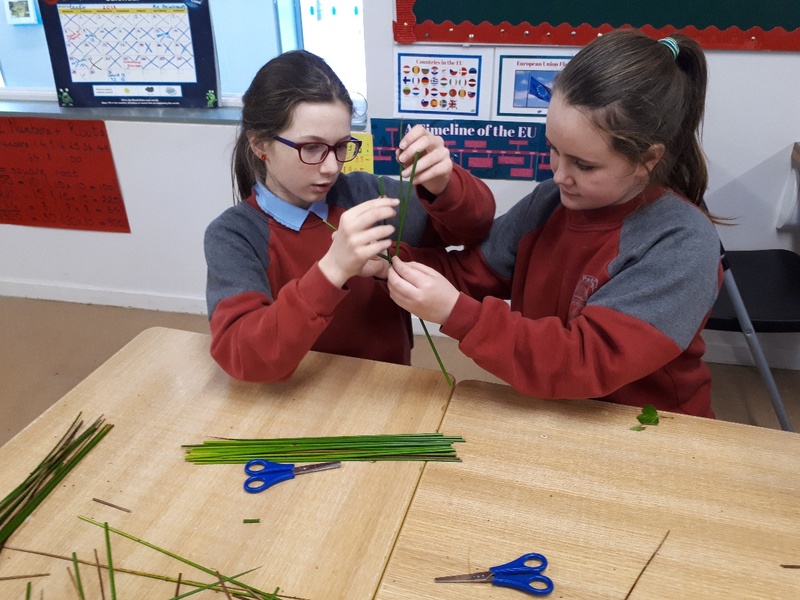 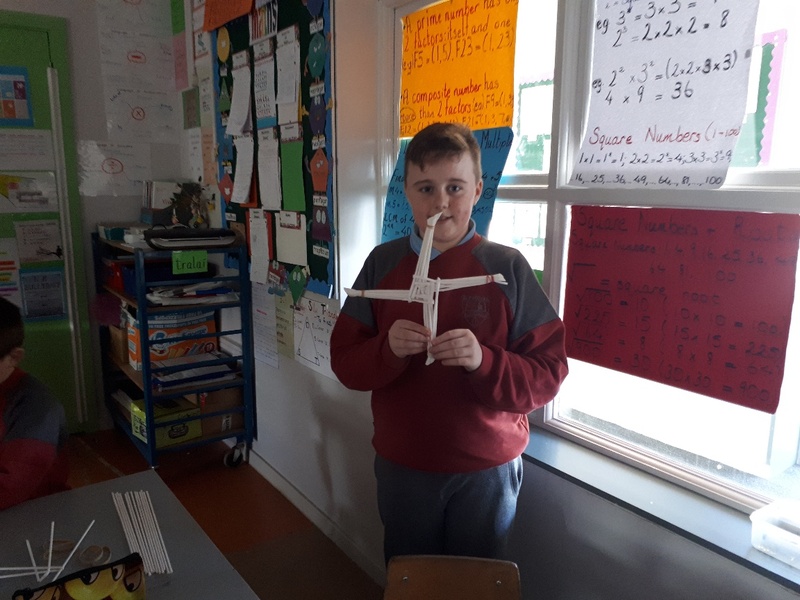 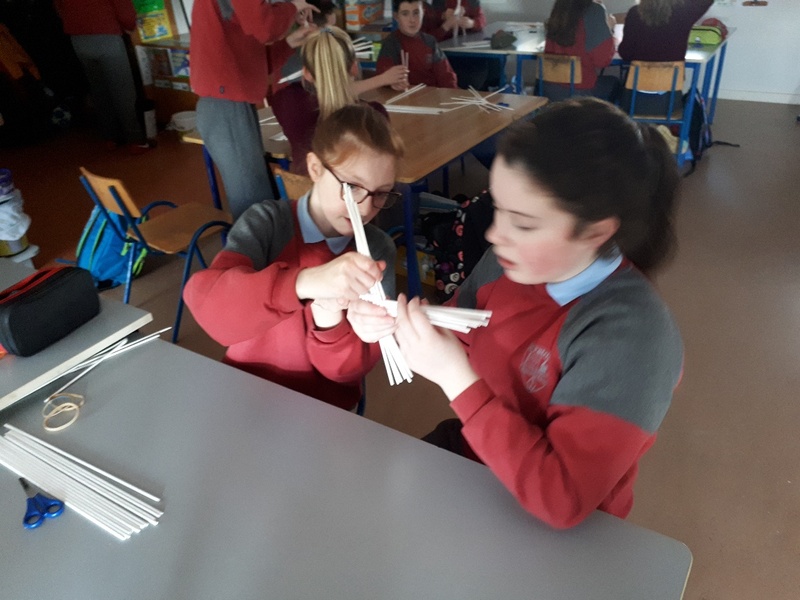 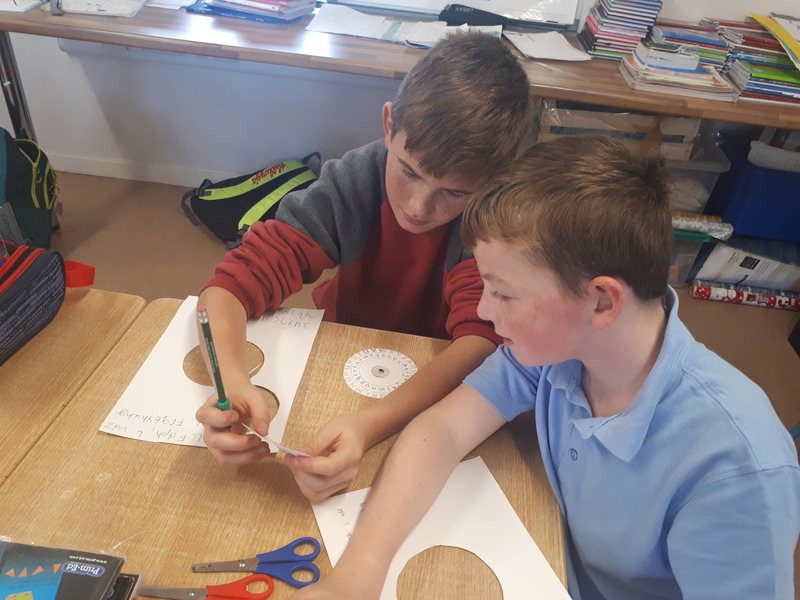 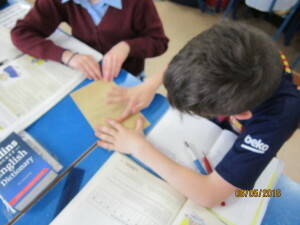 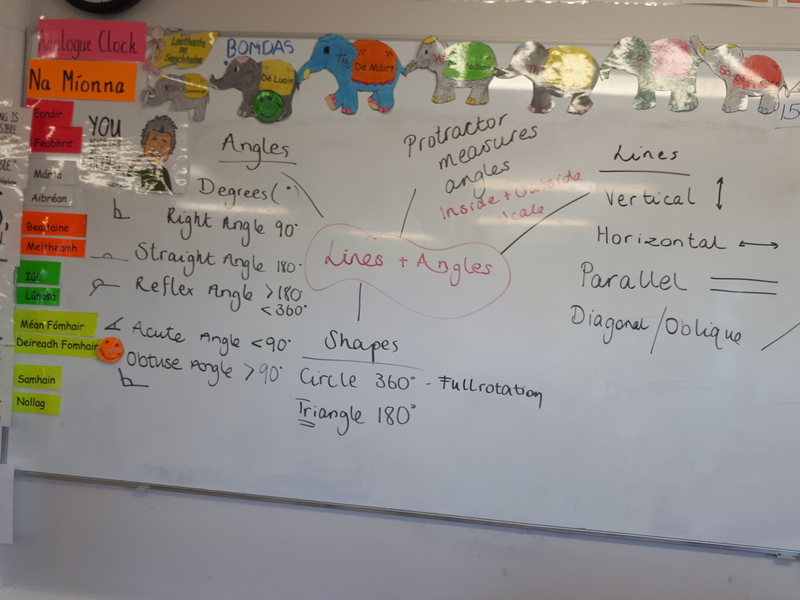 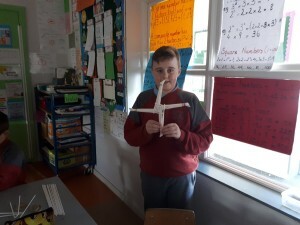 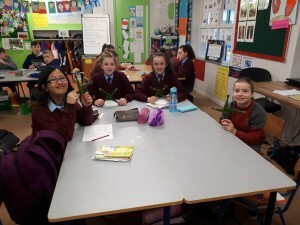 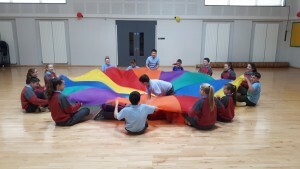 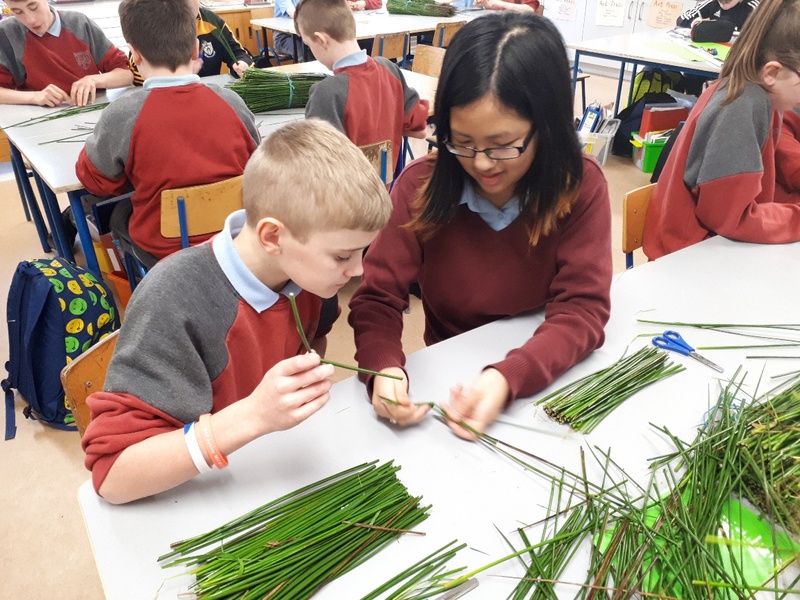 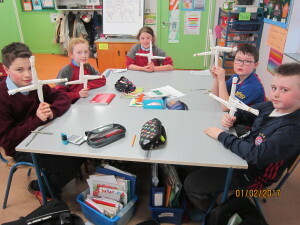 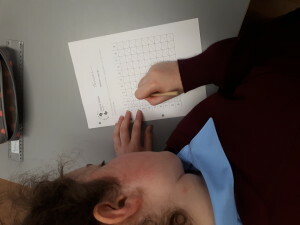 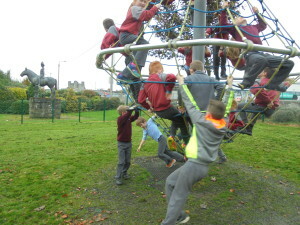 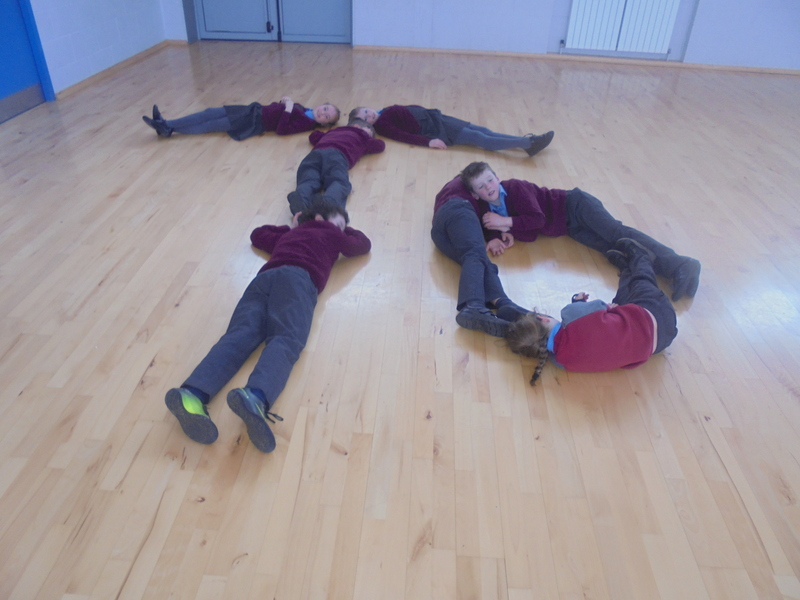 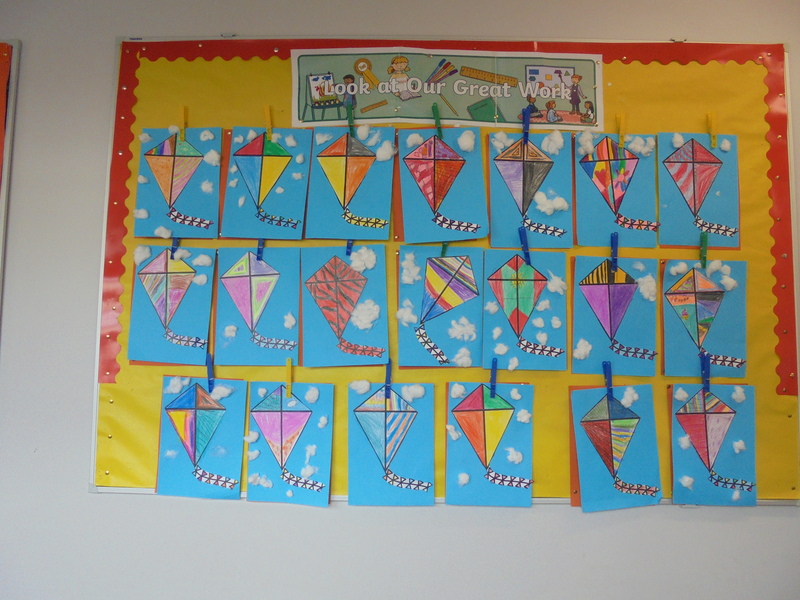 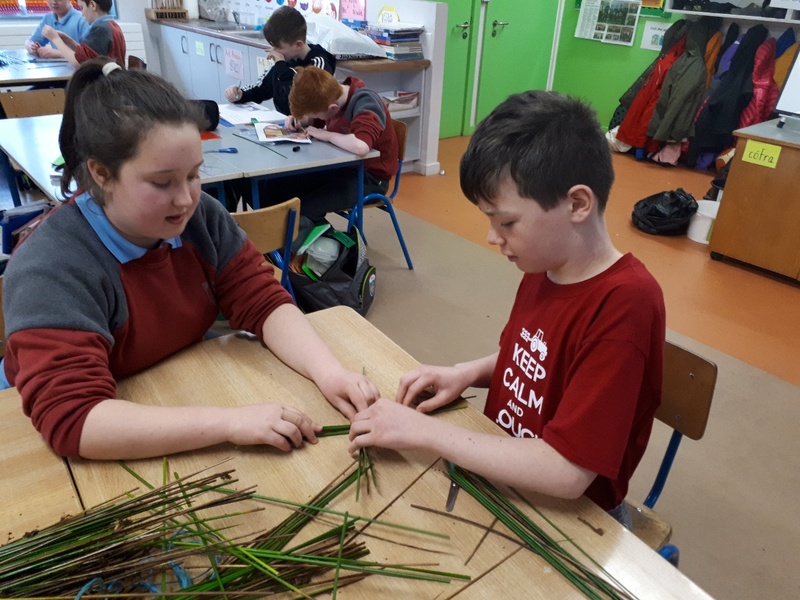 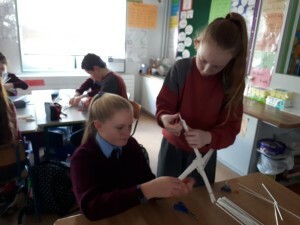 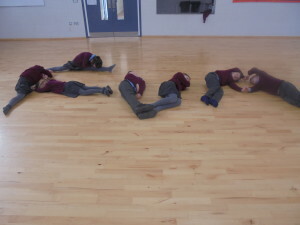 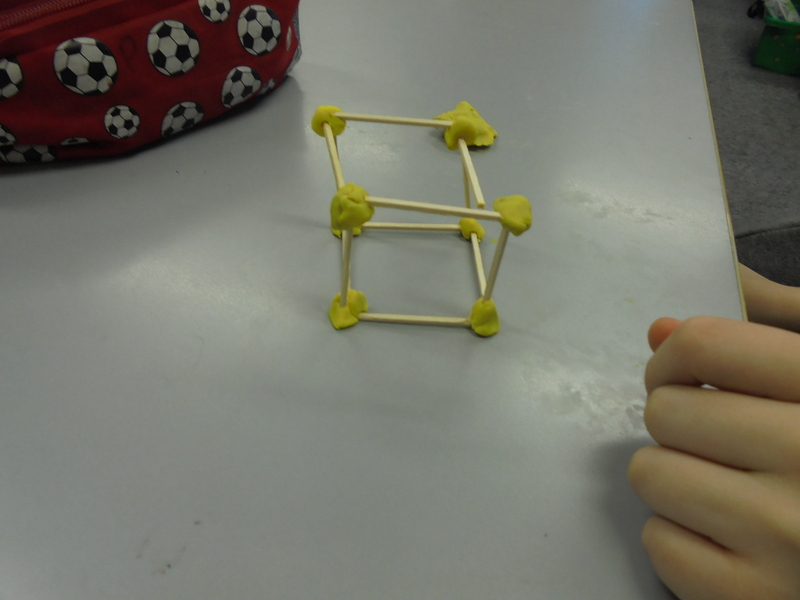 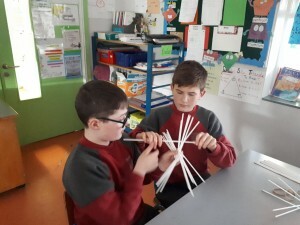 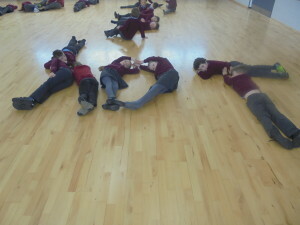 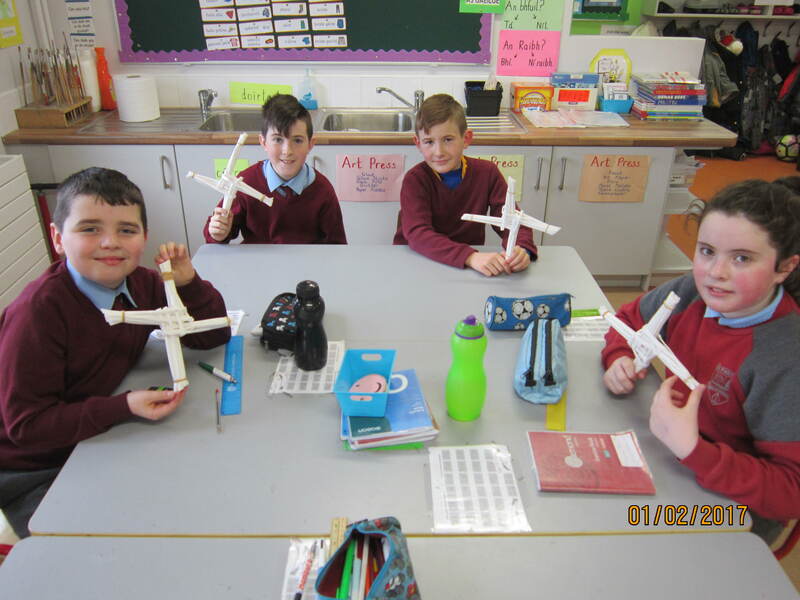 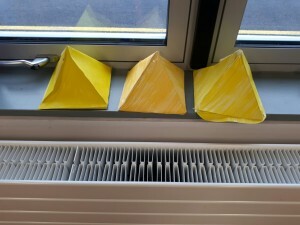 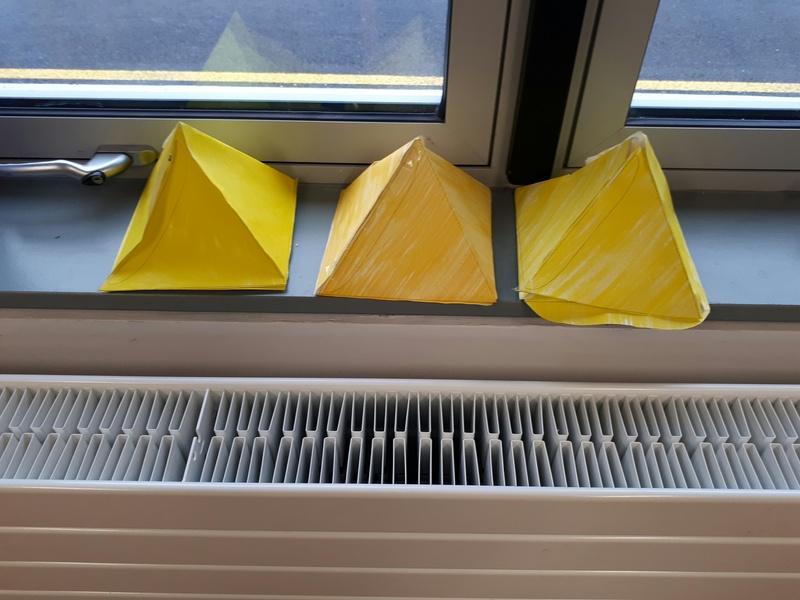 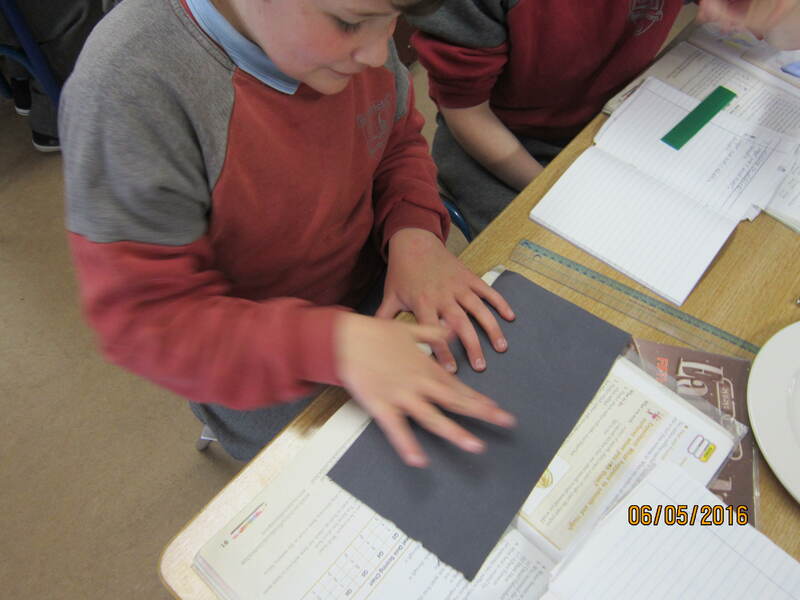 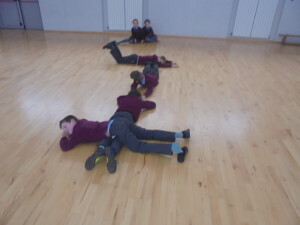 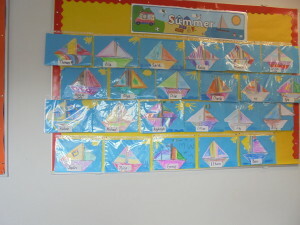 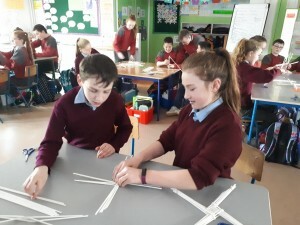 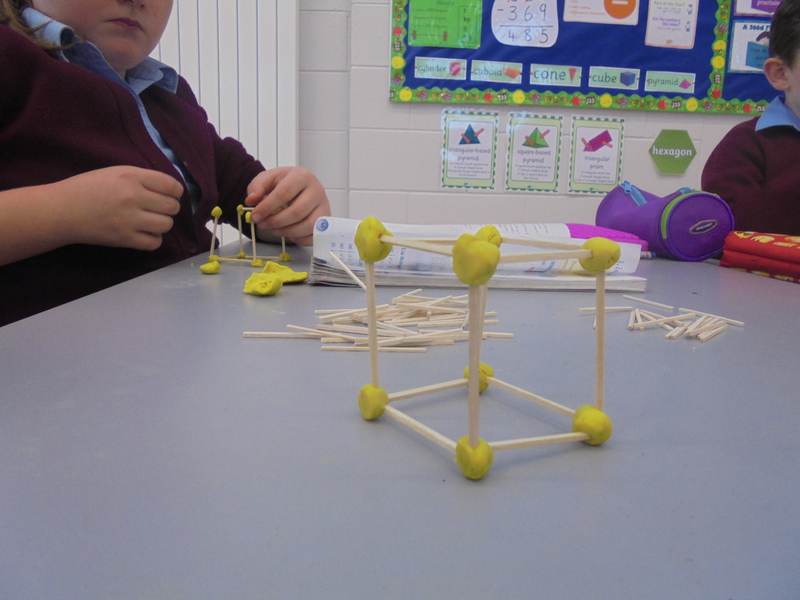 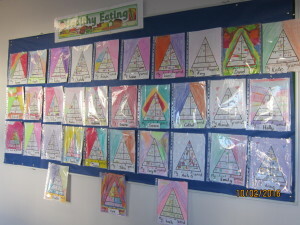 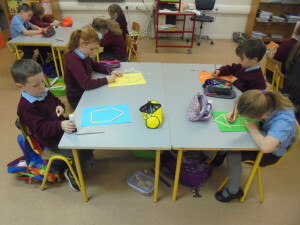 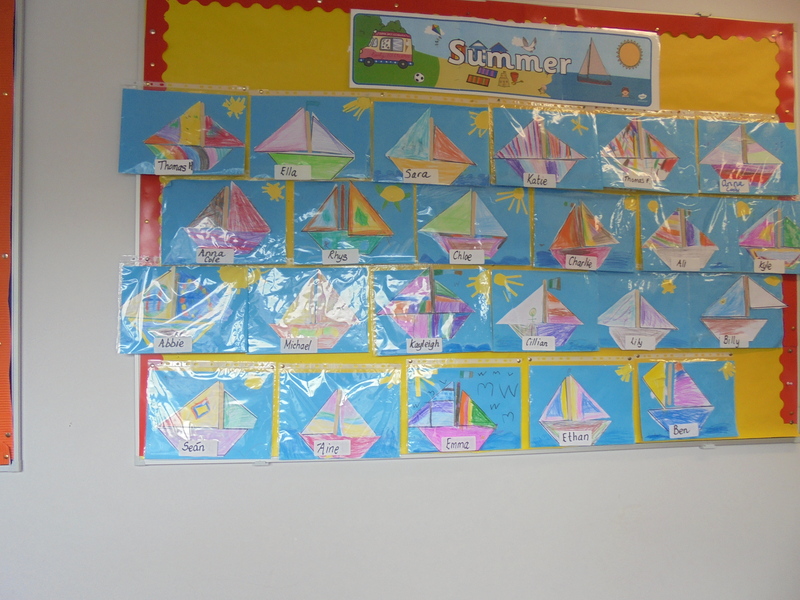 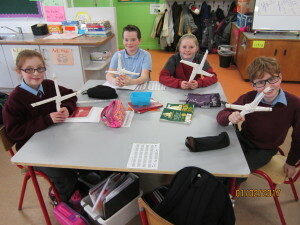 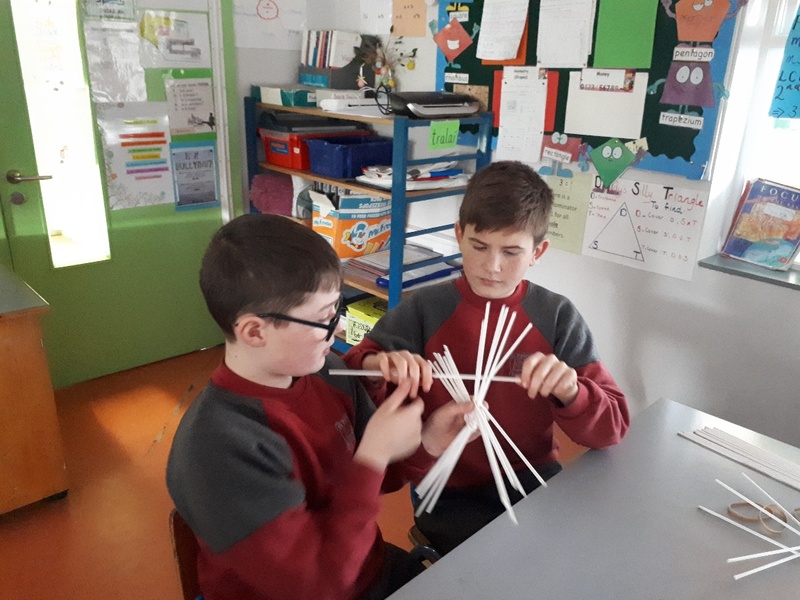 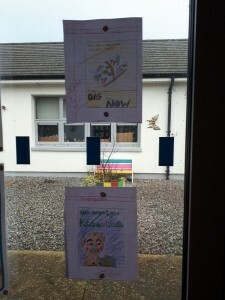 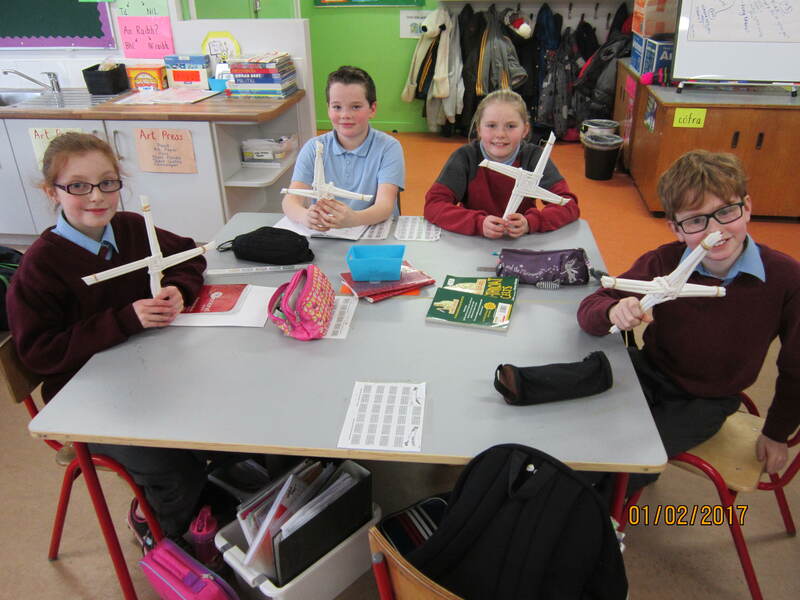 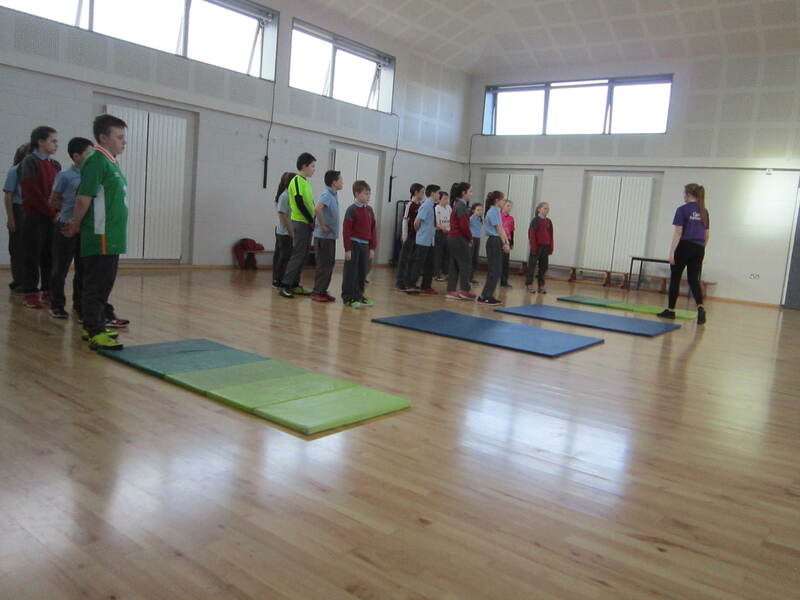 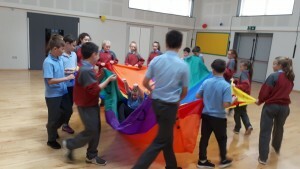 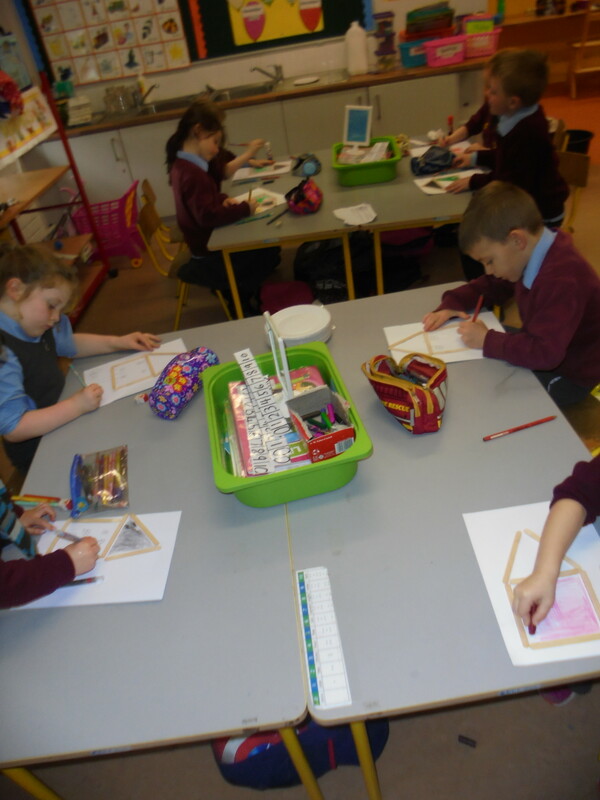 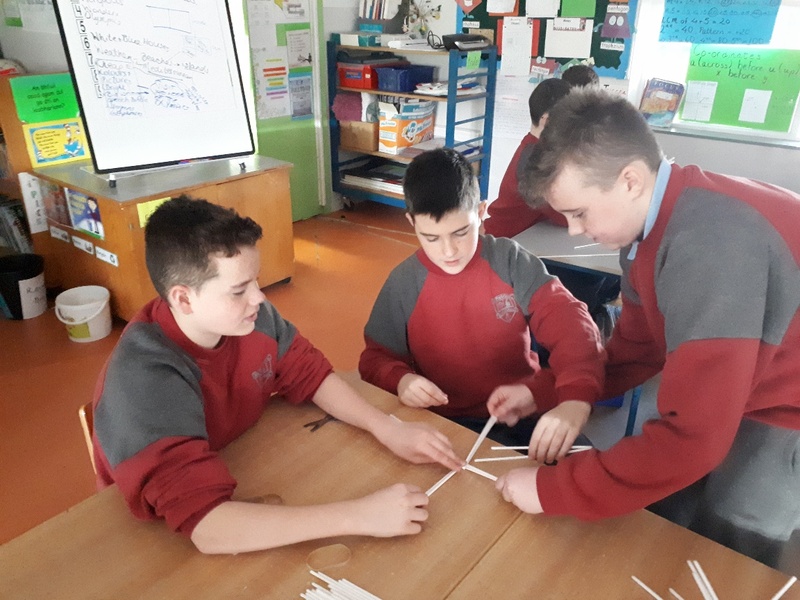 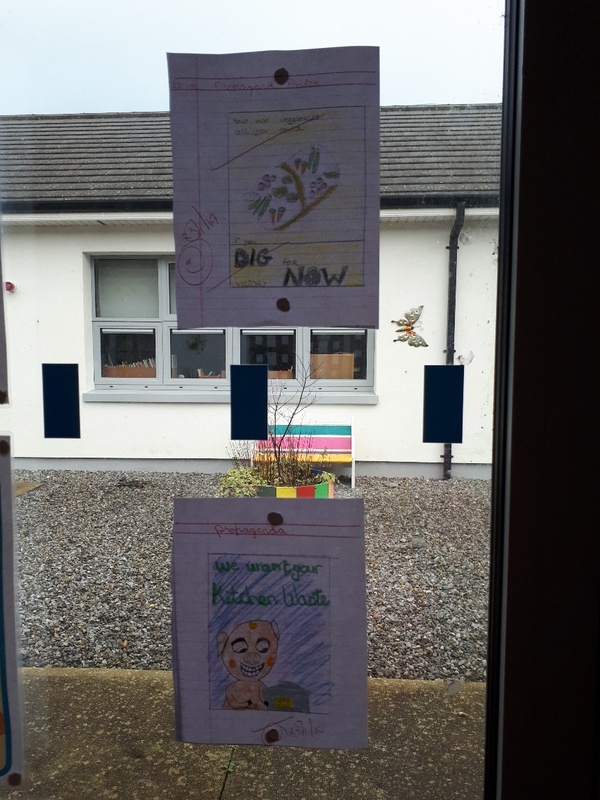 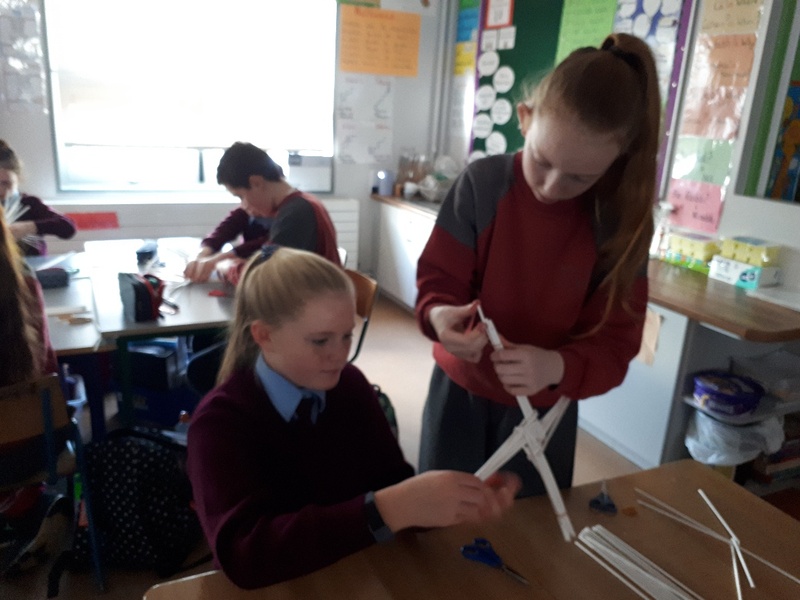 Ms Murphy’s 6th class learned how to construct triangles during their normal Maths lessons. 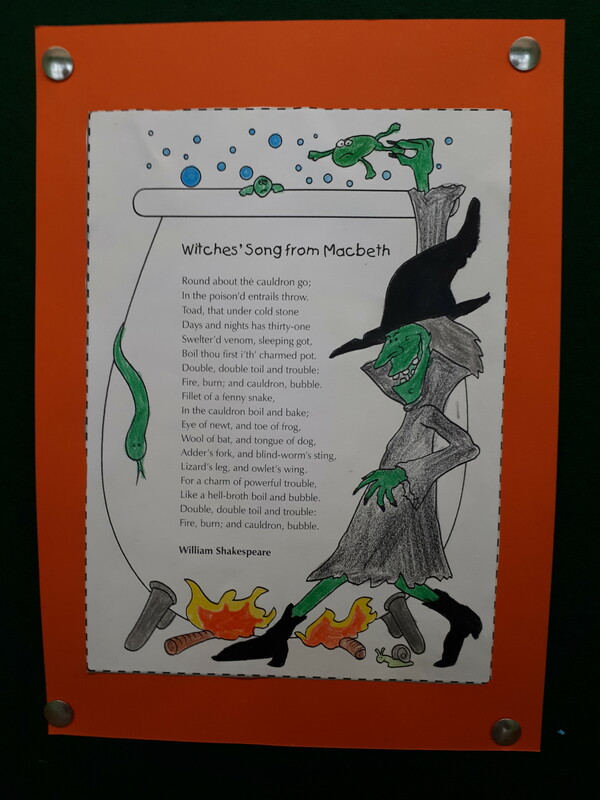 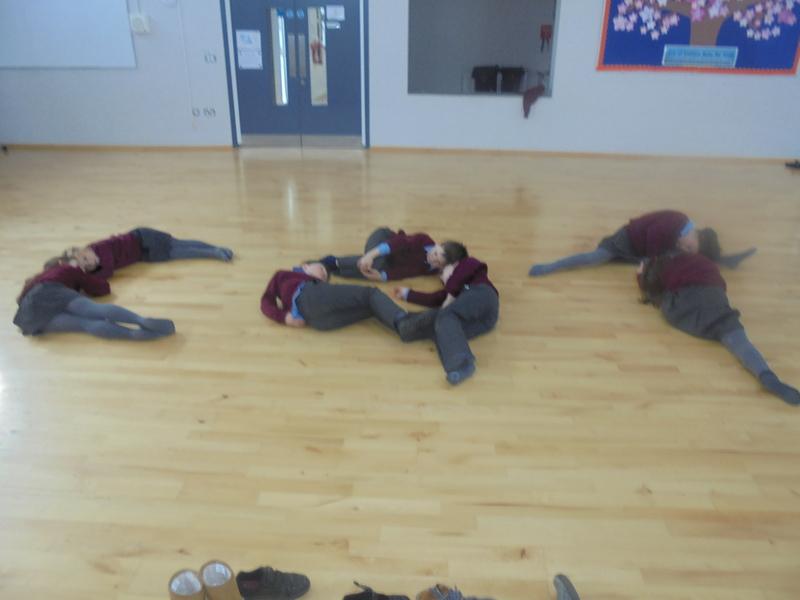 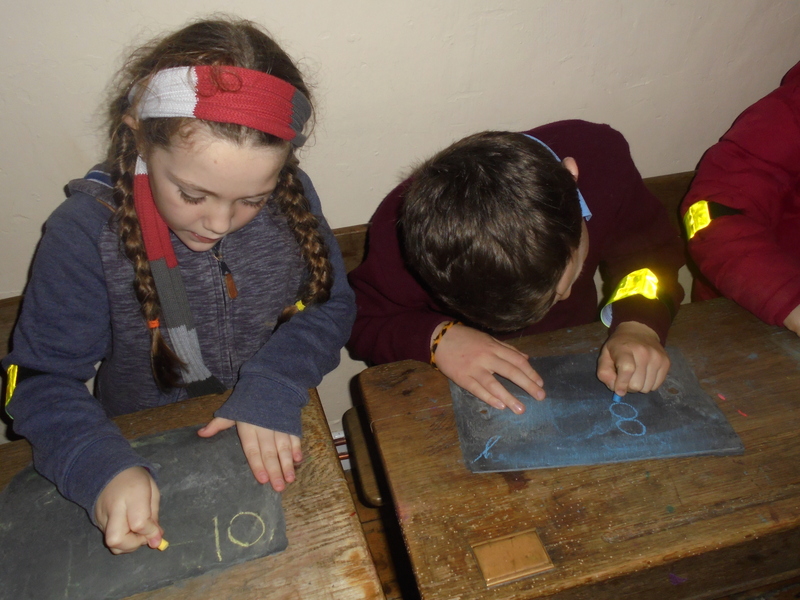 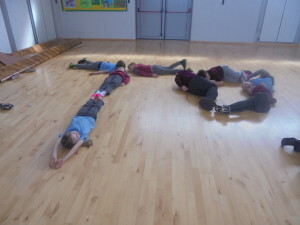 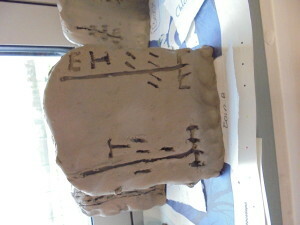 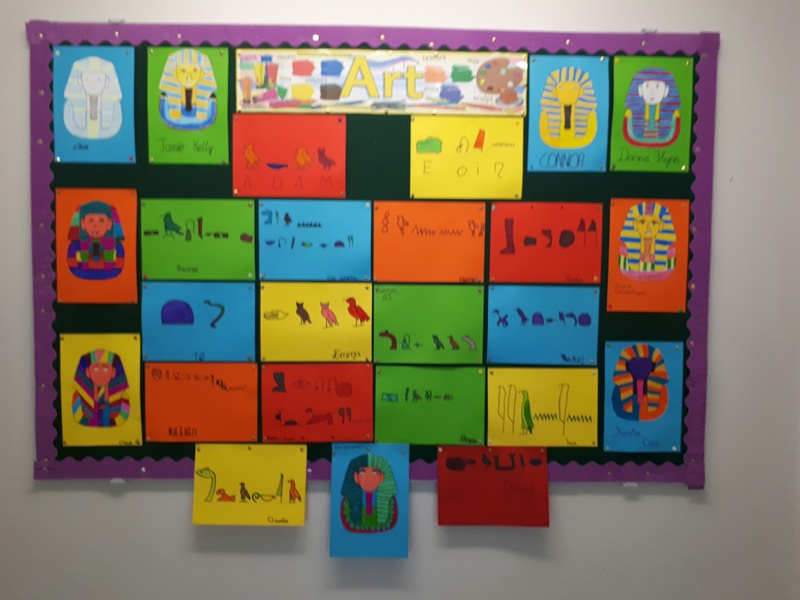 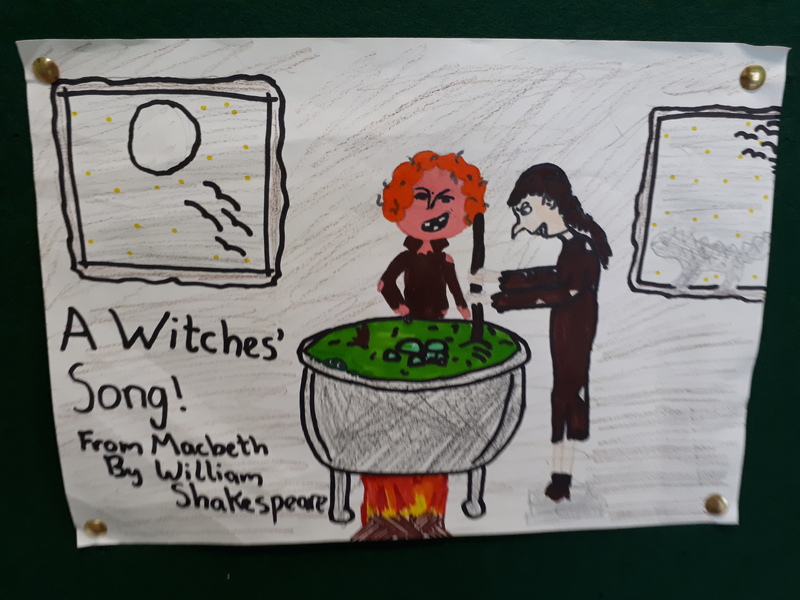 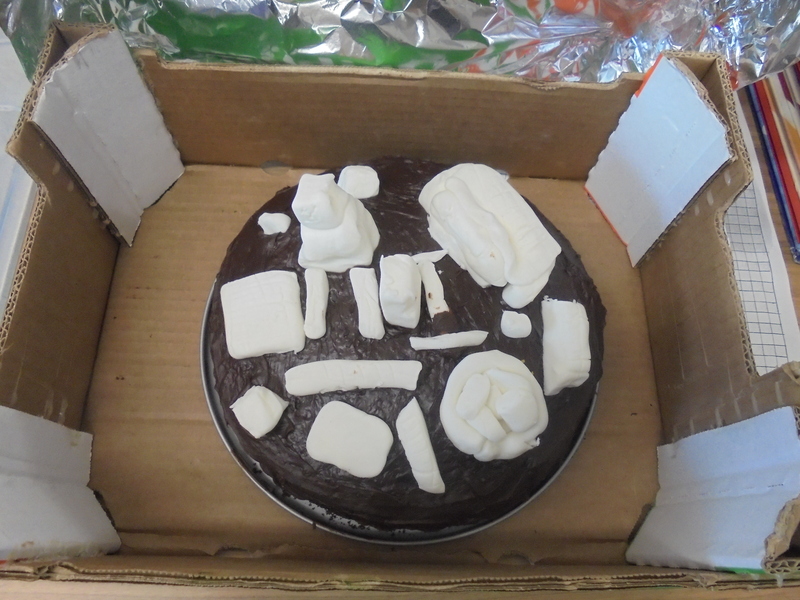 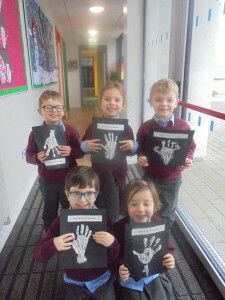 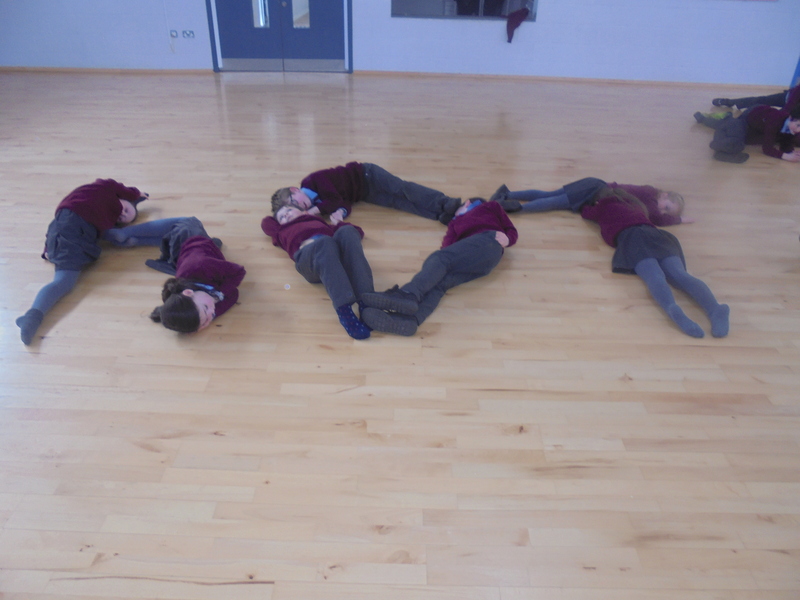 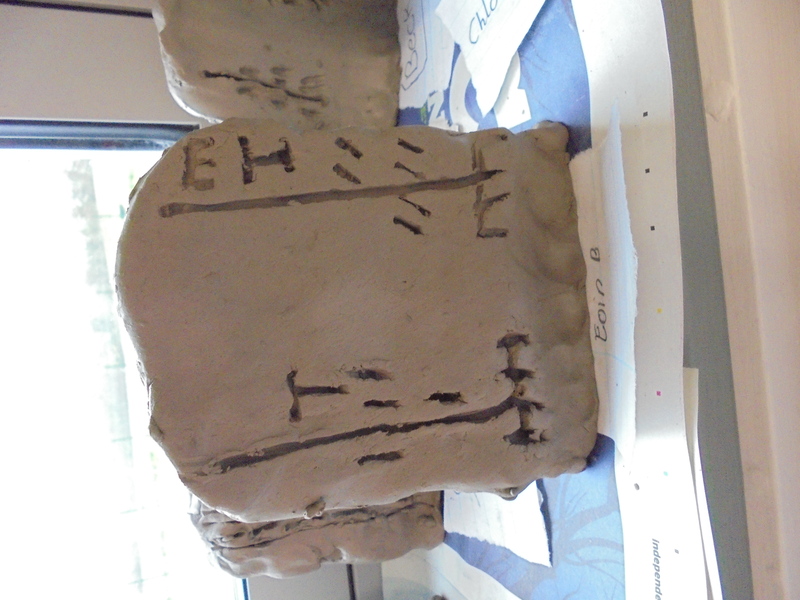 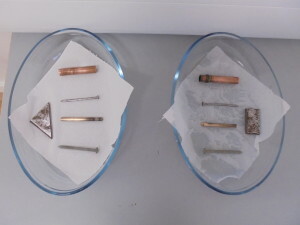 As well as this, to celebrate Maths Week they learned about Napier’s Bones, an old method of multiplication, The Mayan Number System, Caesar Cipher, a method of encoding messages used by Julius Caesar and Leonardo da Vinci’s Vitruvian Man! 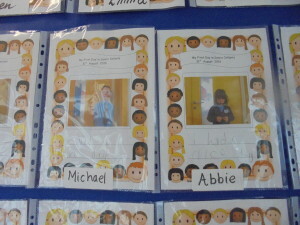 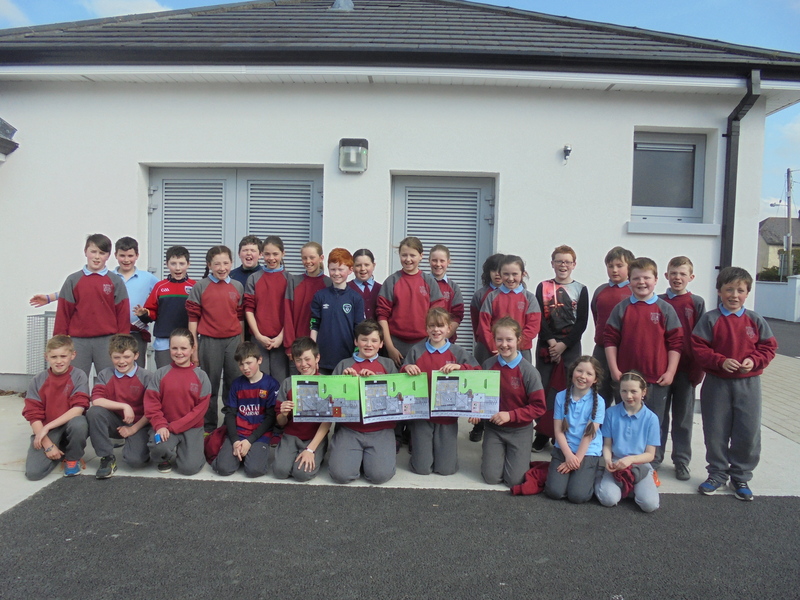 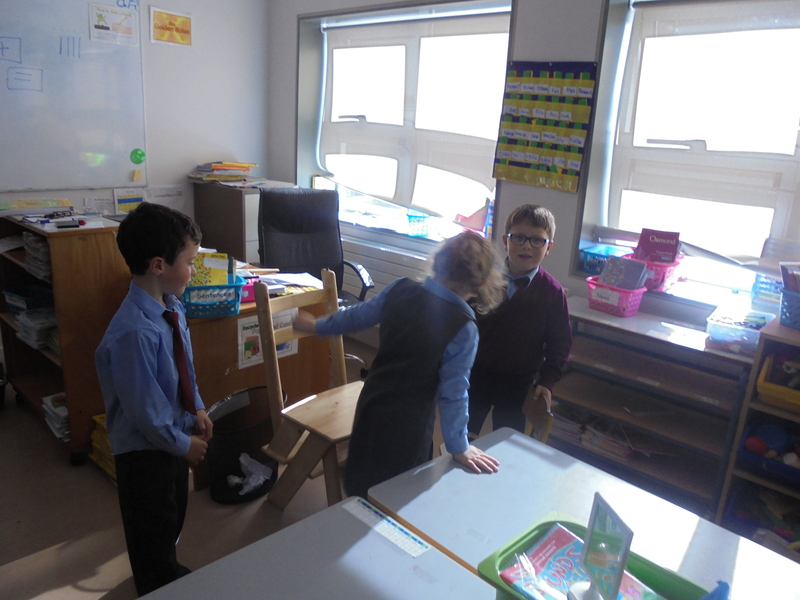 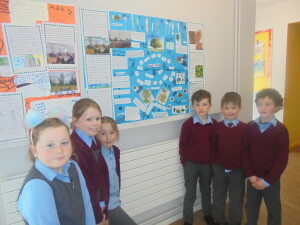 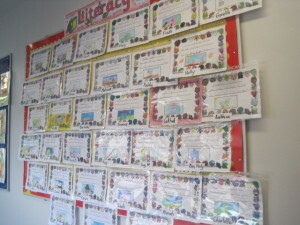 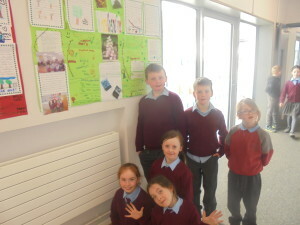 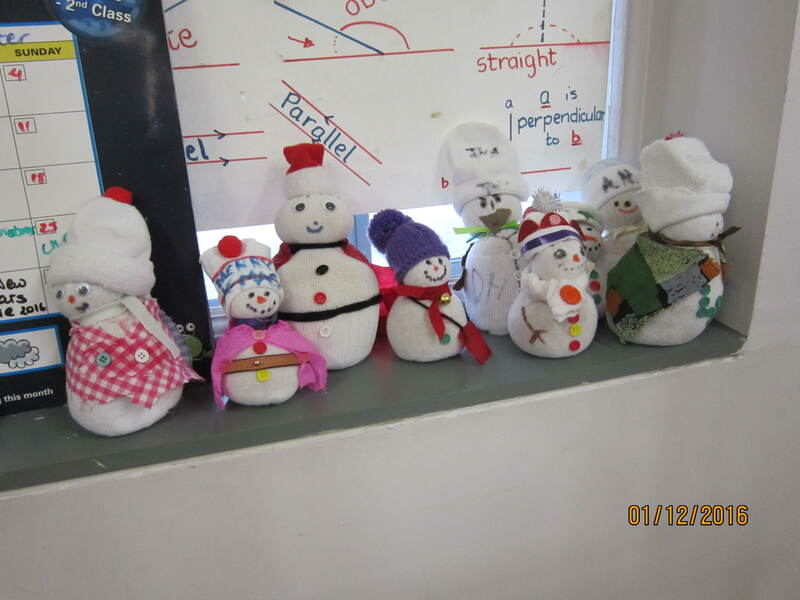 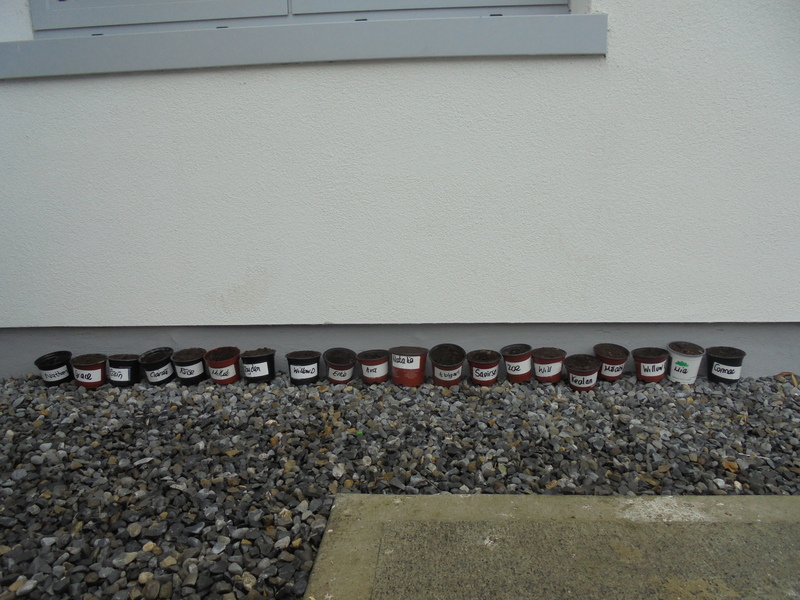 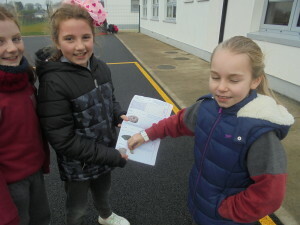 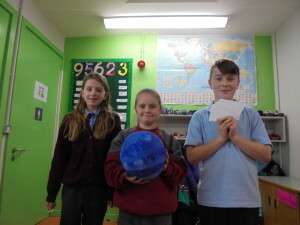 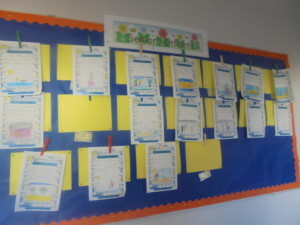 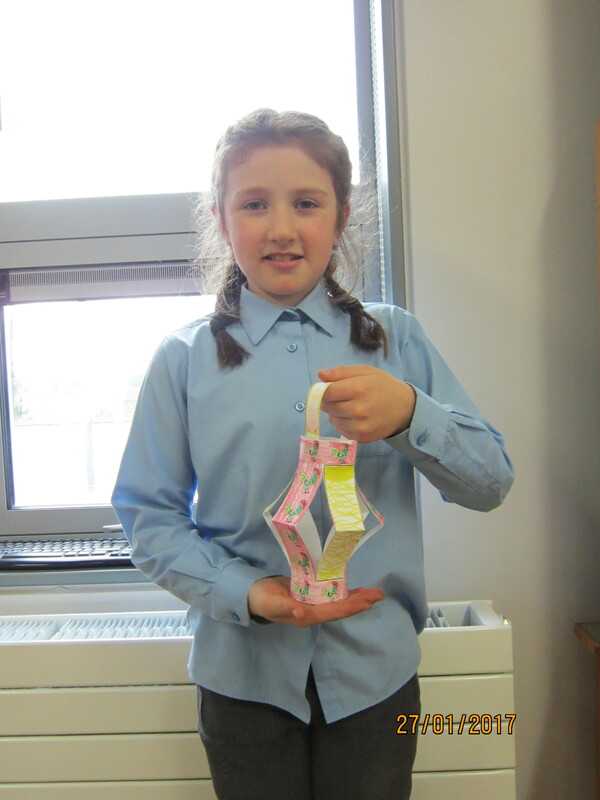 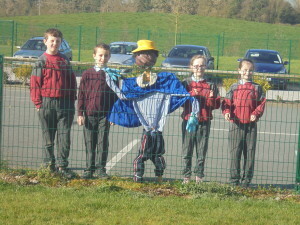 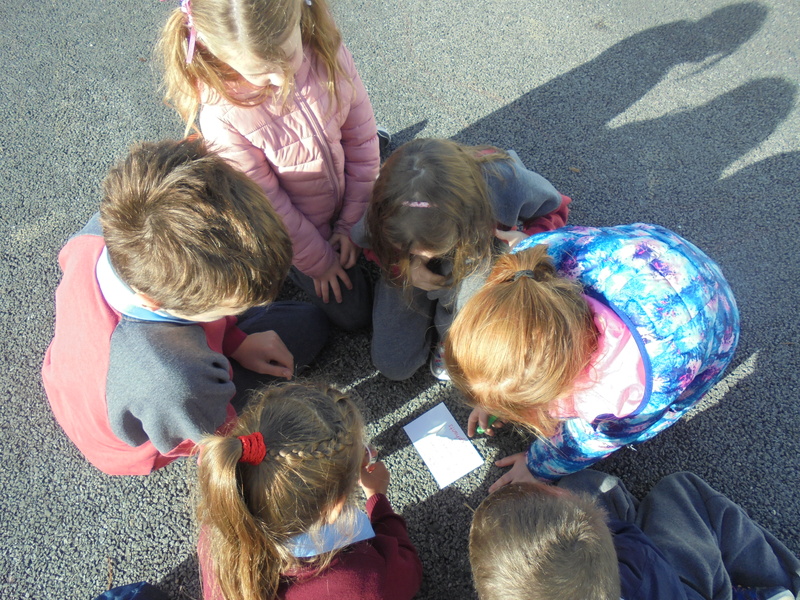 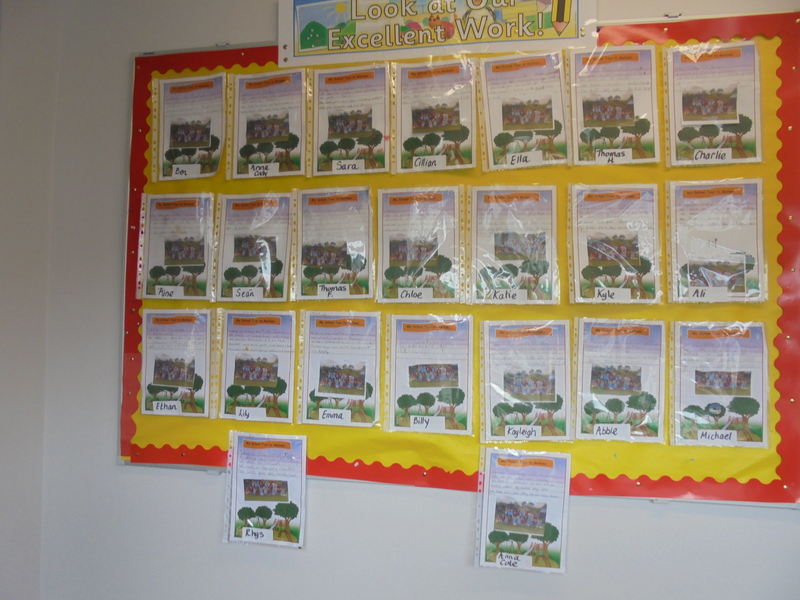 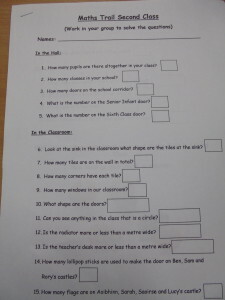 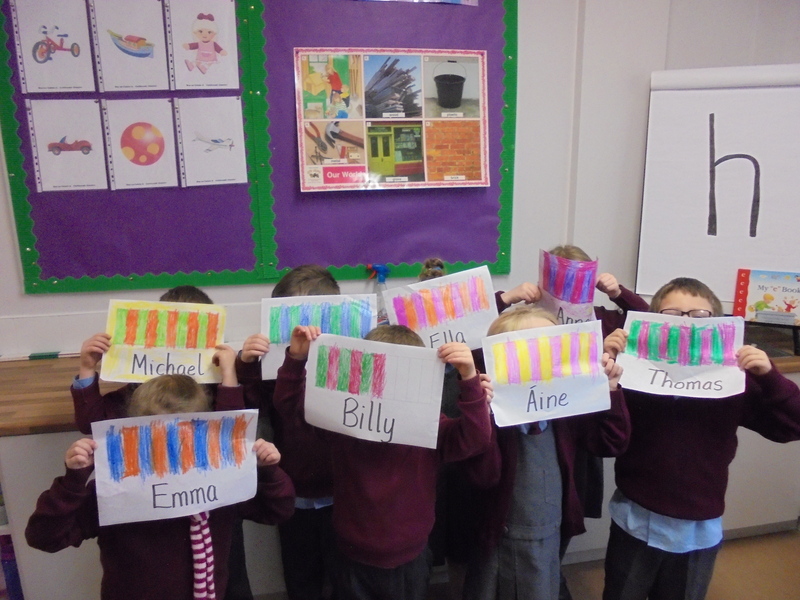 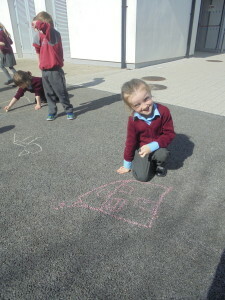 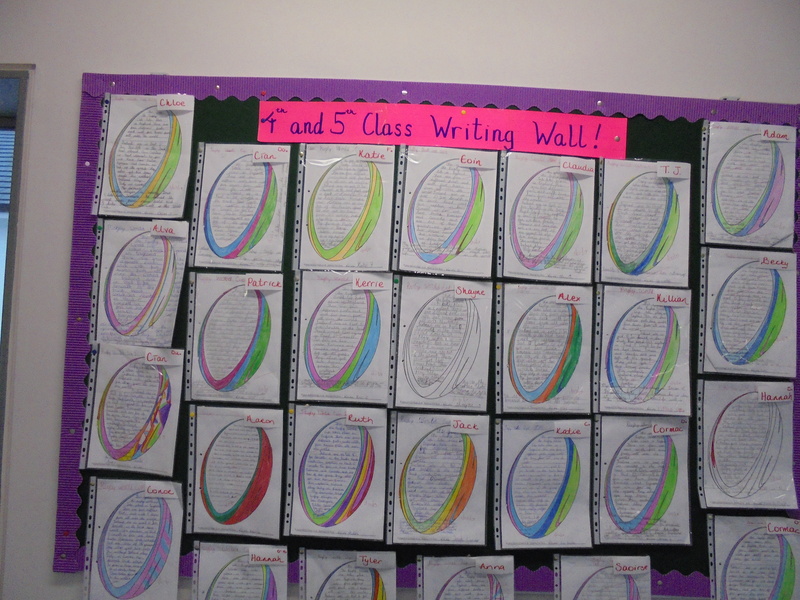 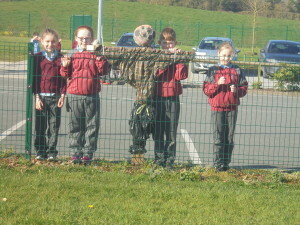 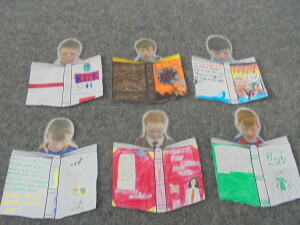 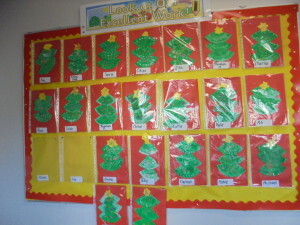 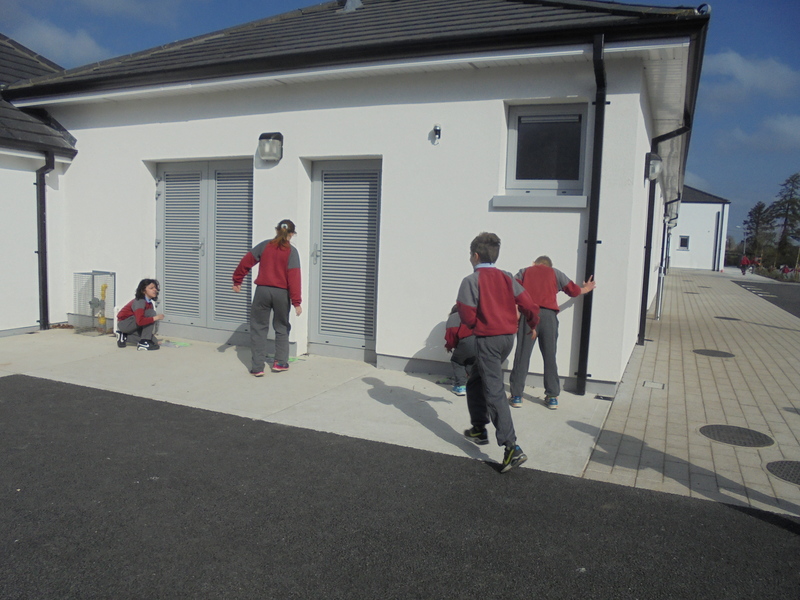 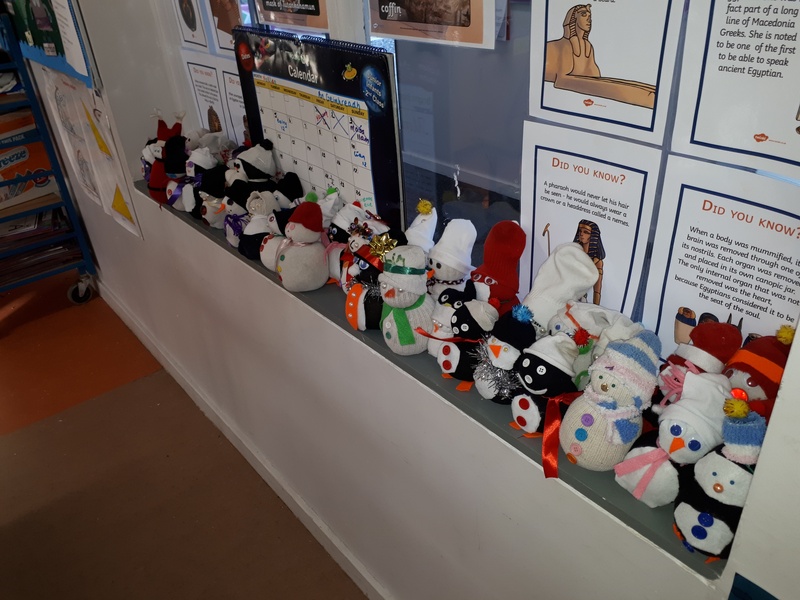 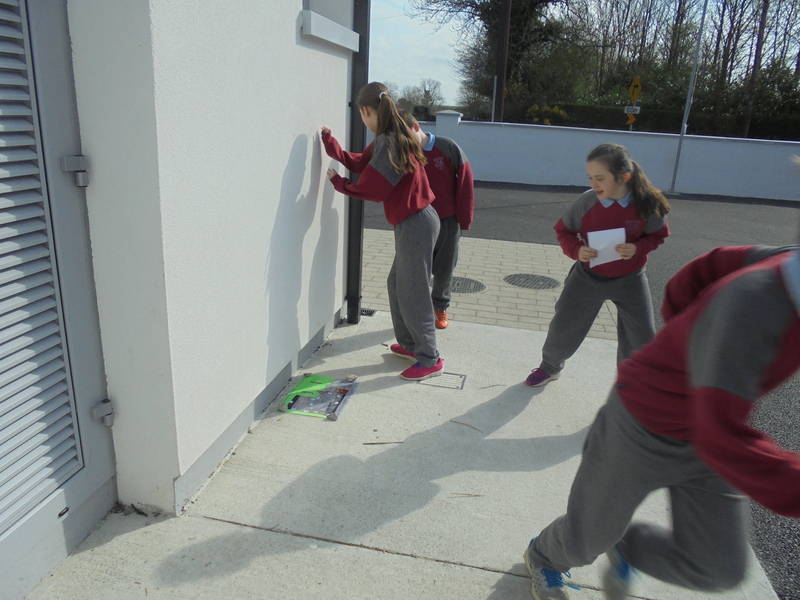 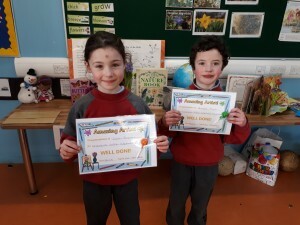 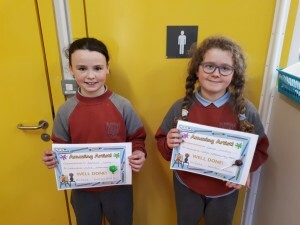 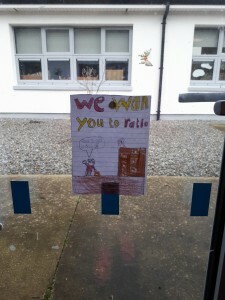 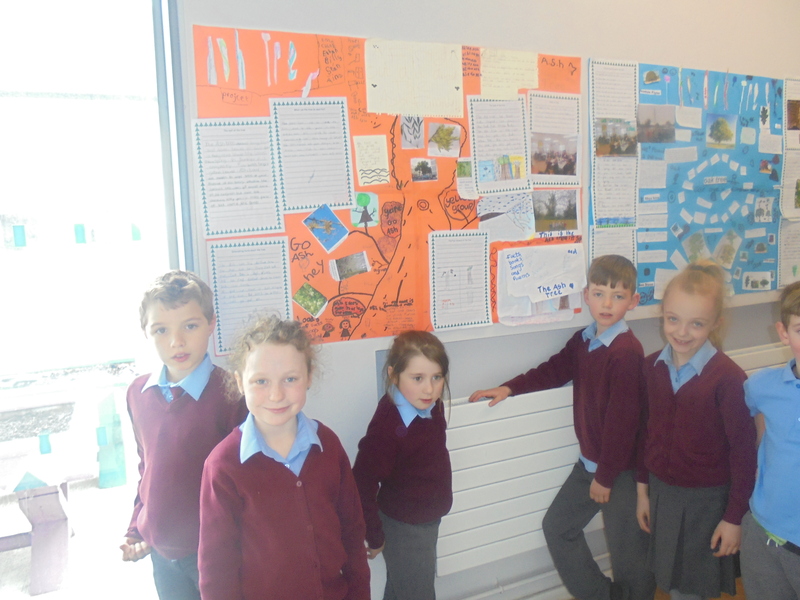 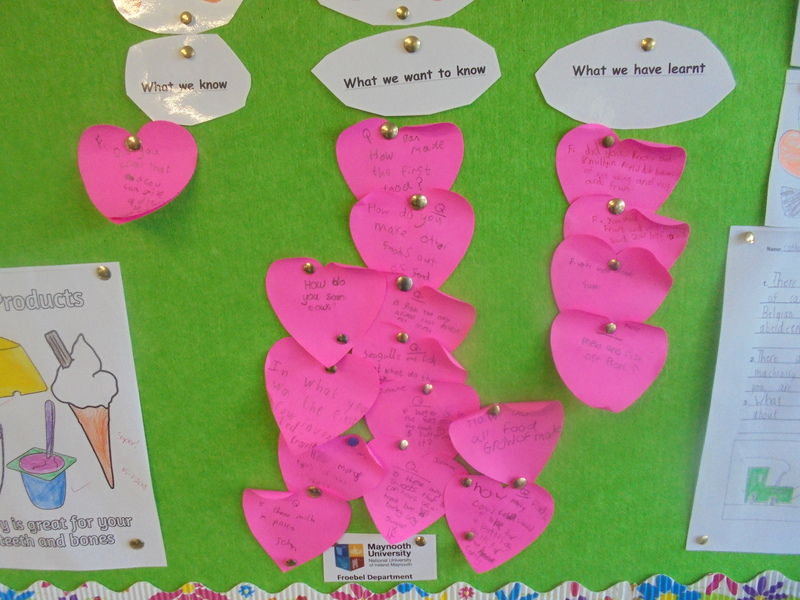 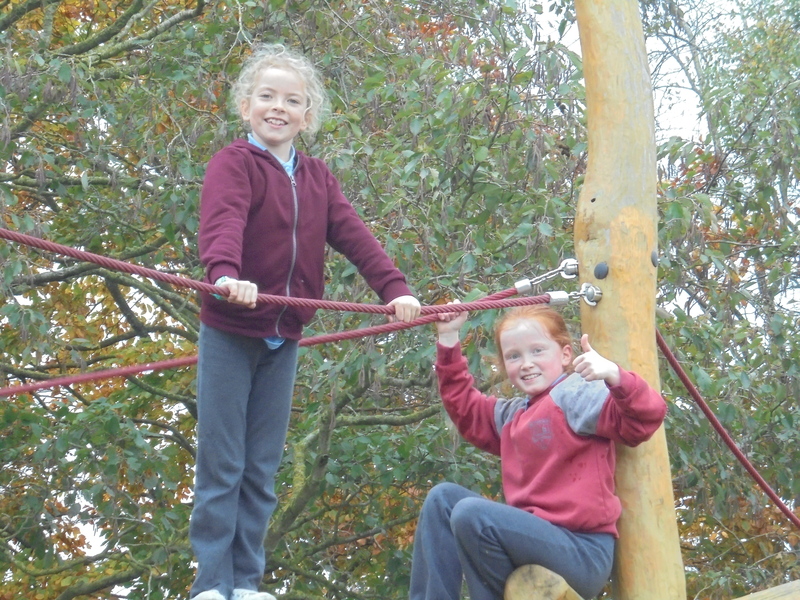 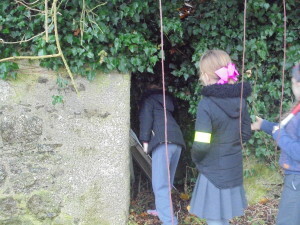 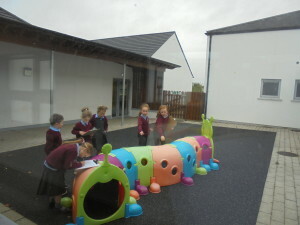 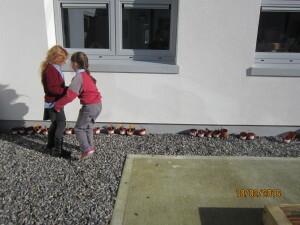 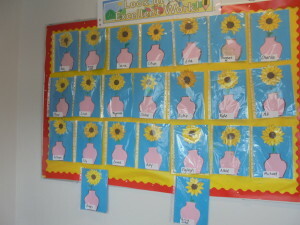 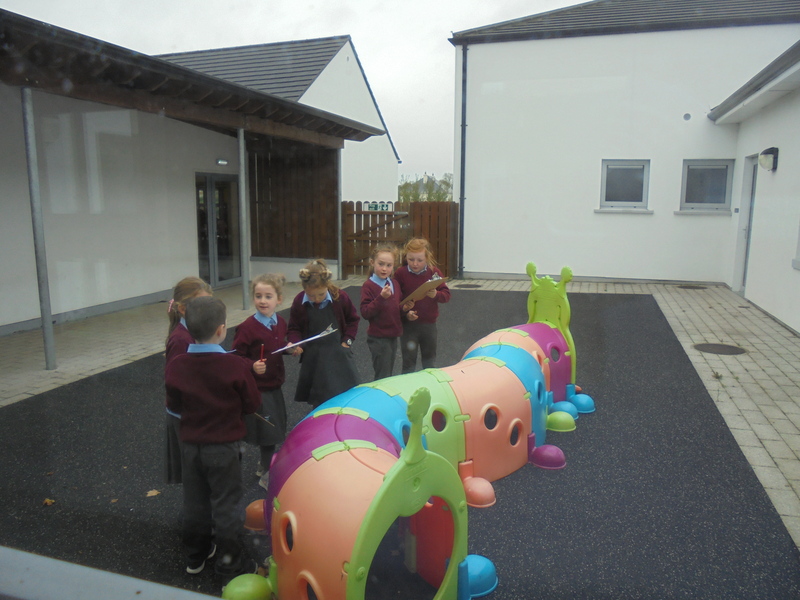 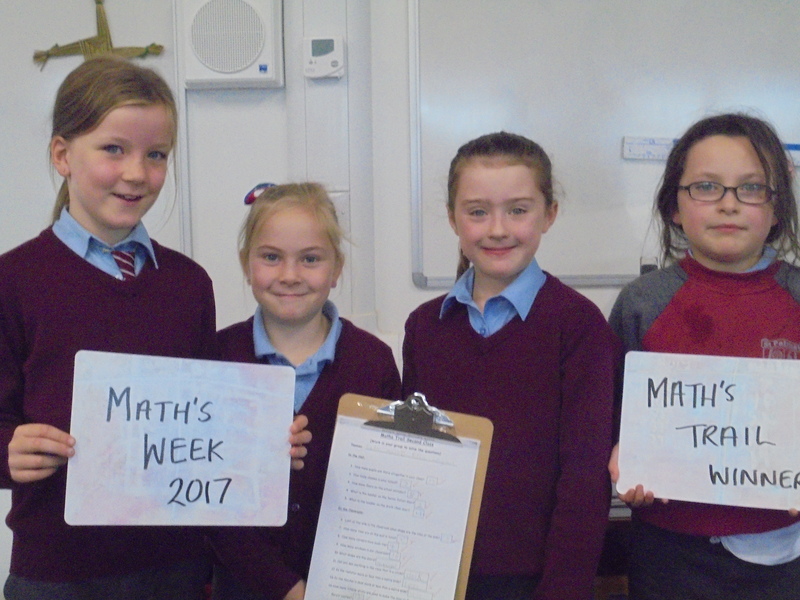 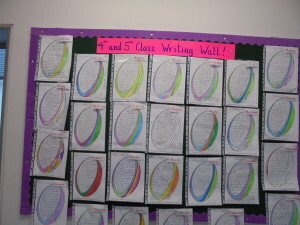 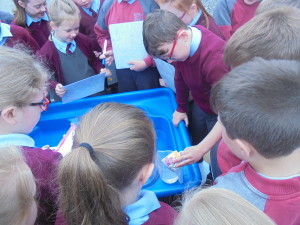 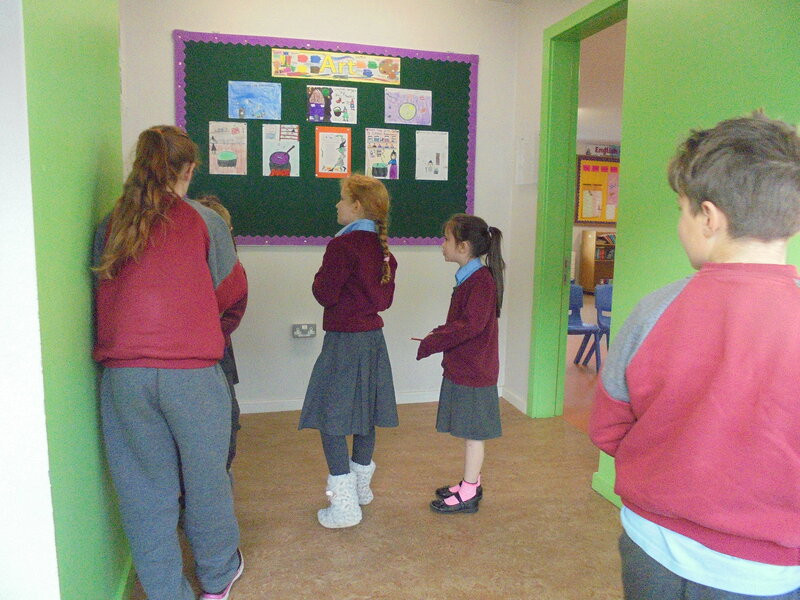 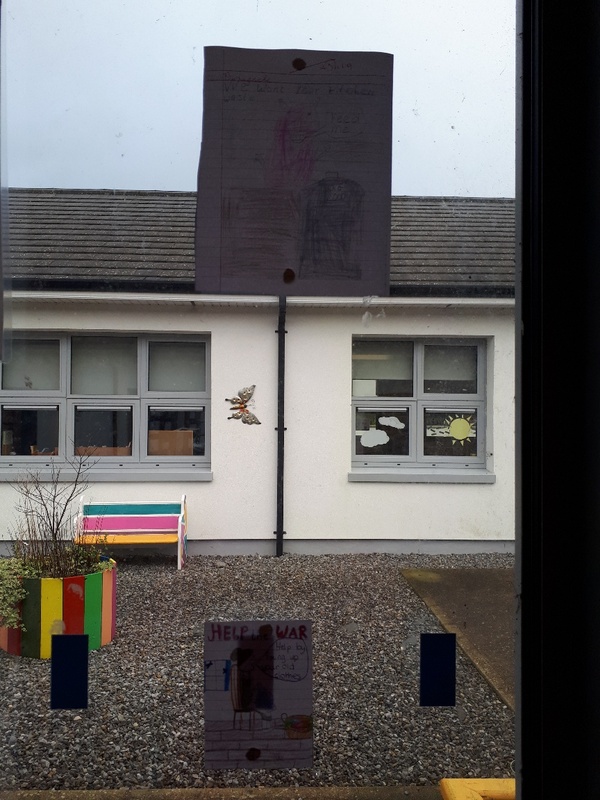 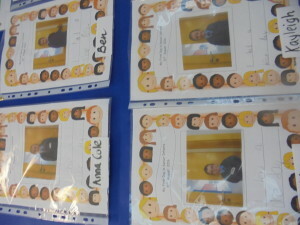 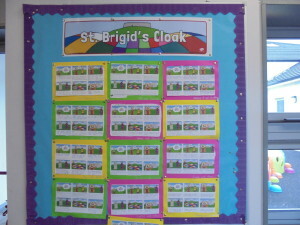 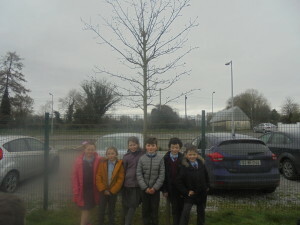 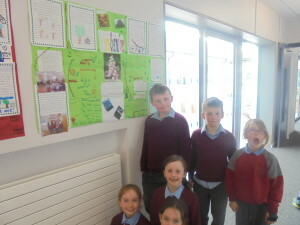 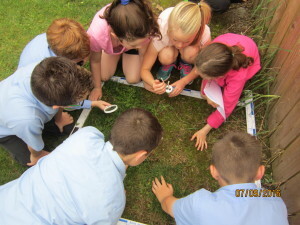 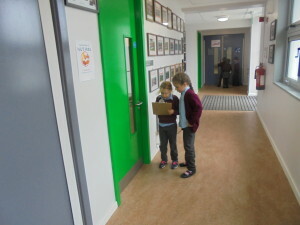 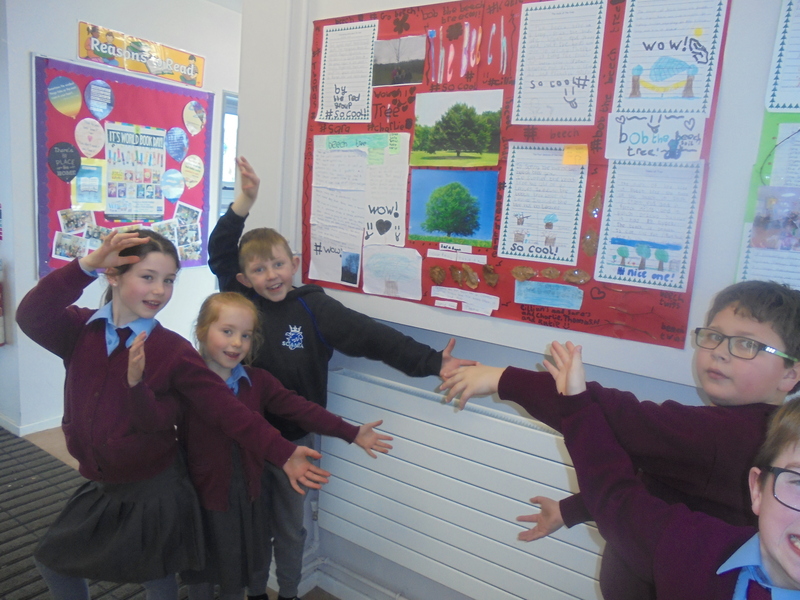 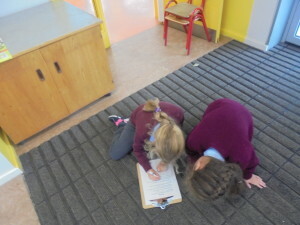 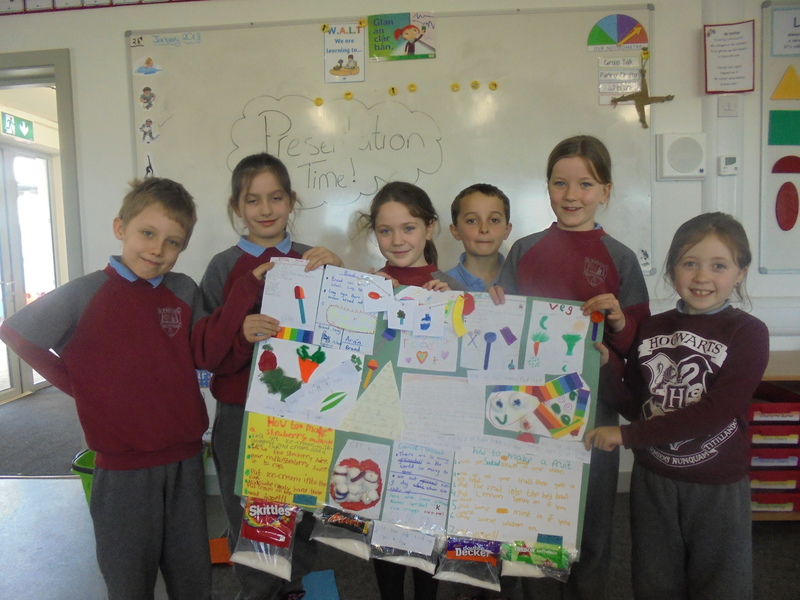 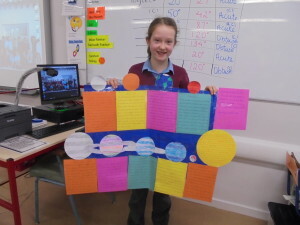 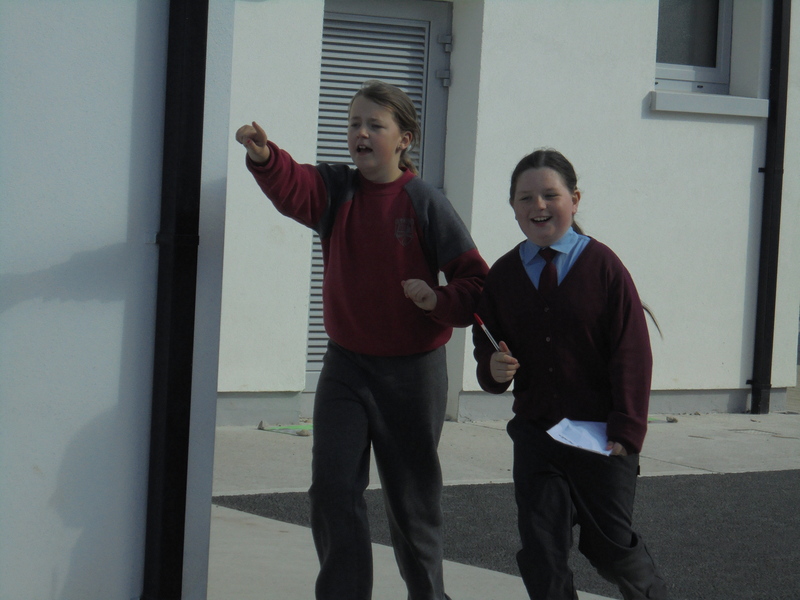 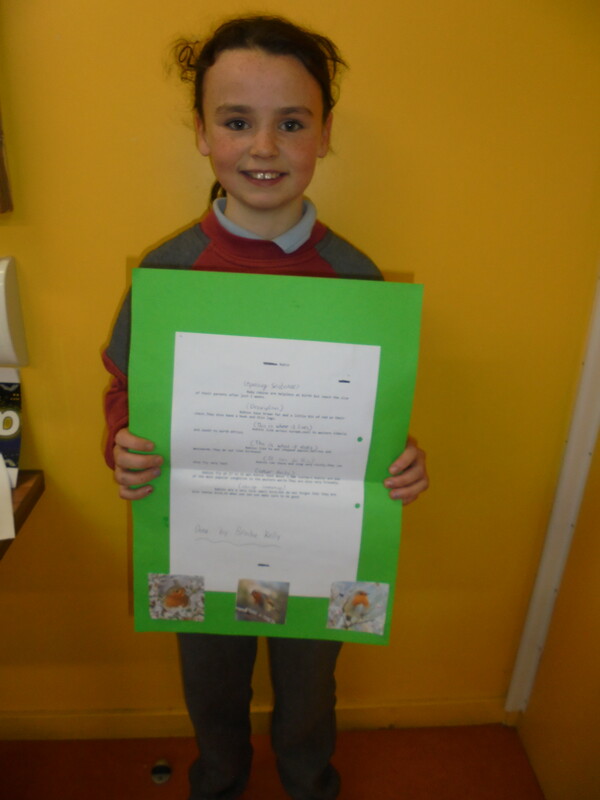 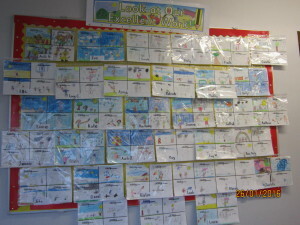 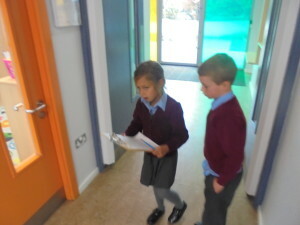 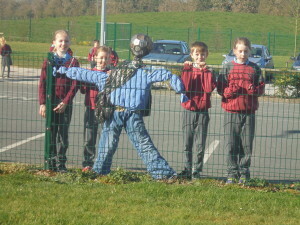 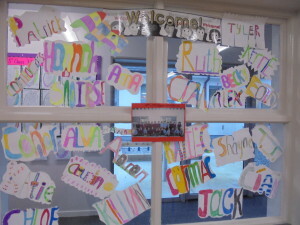 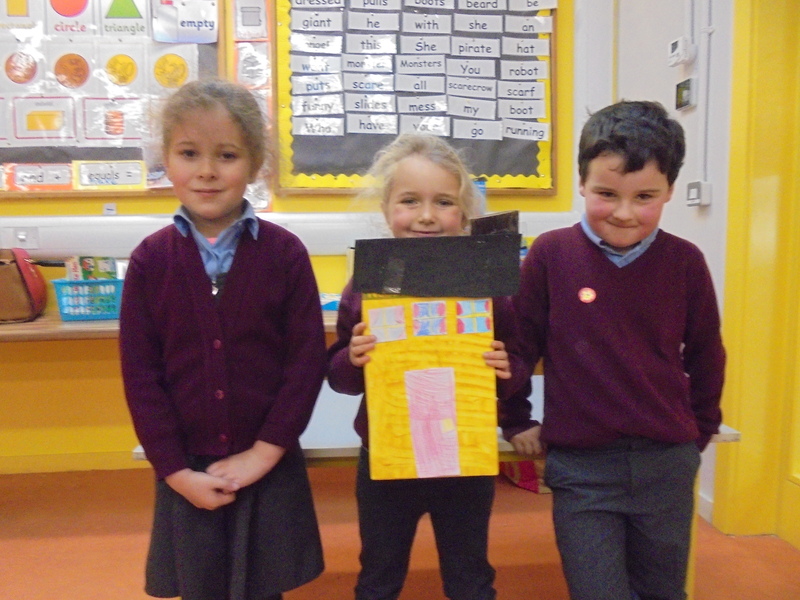 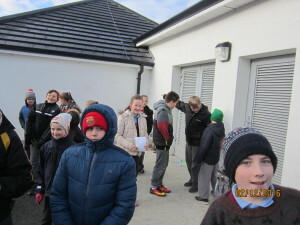 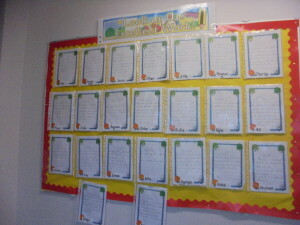 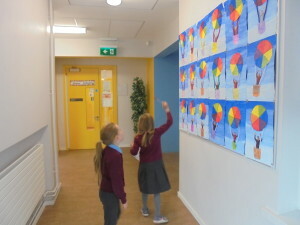 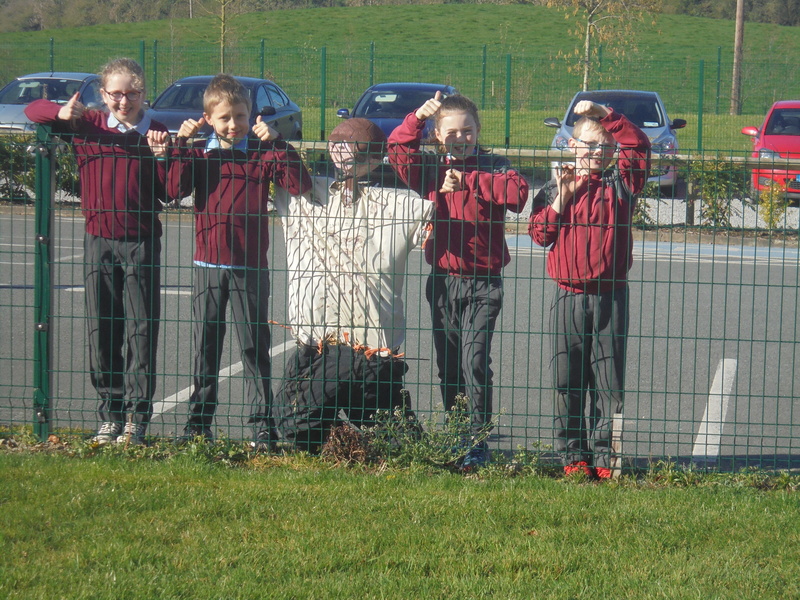 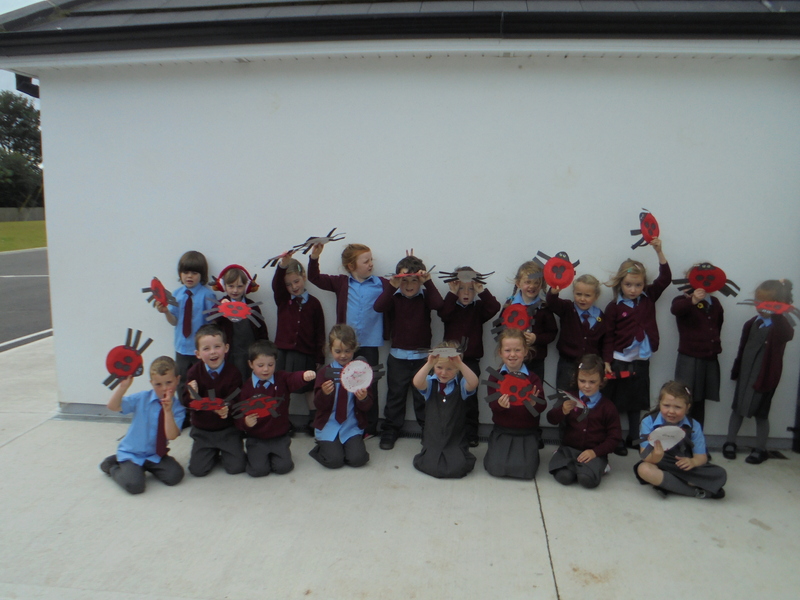 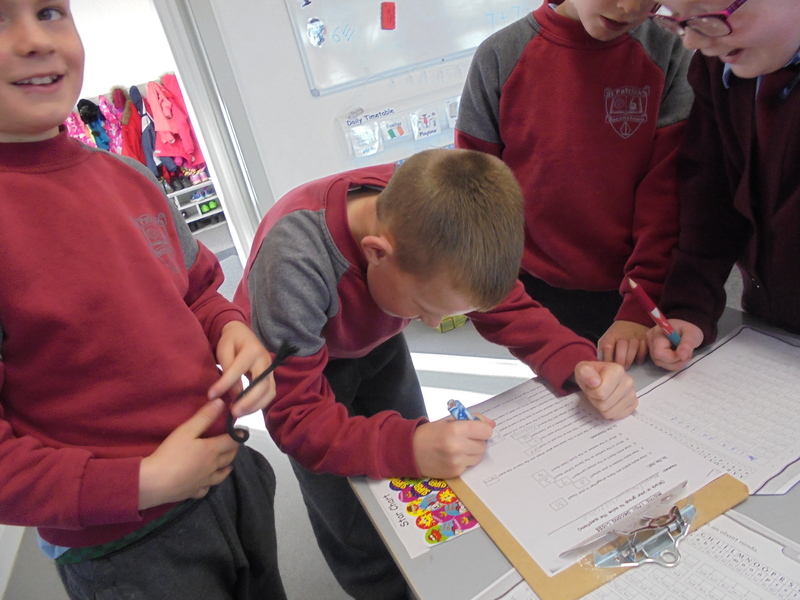 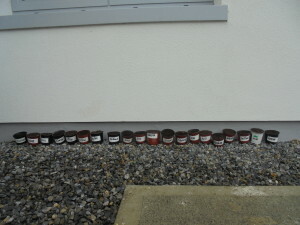 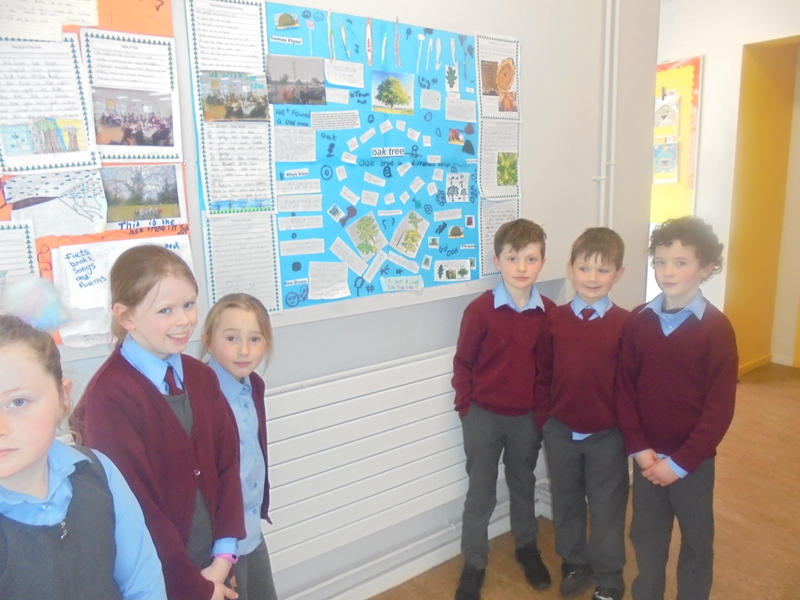 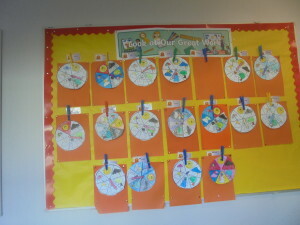 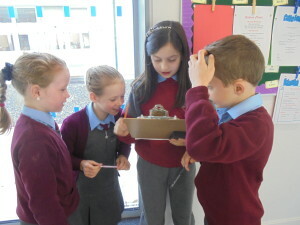 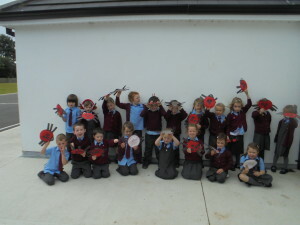 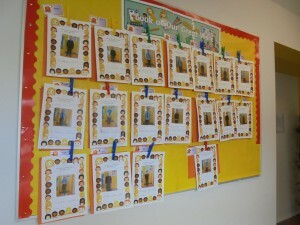 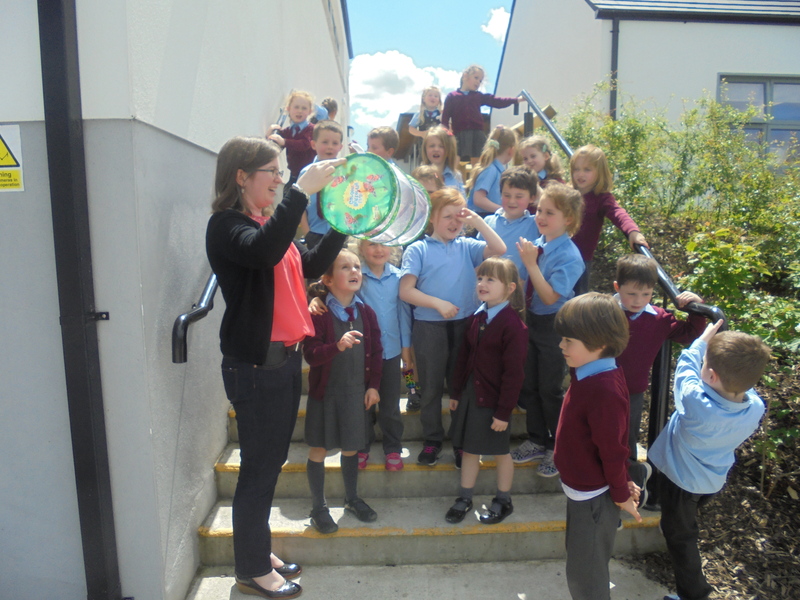 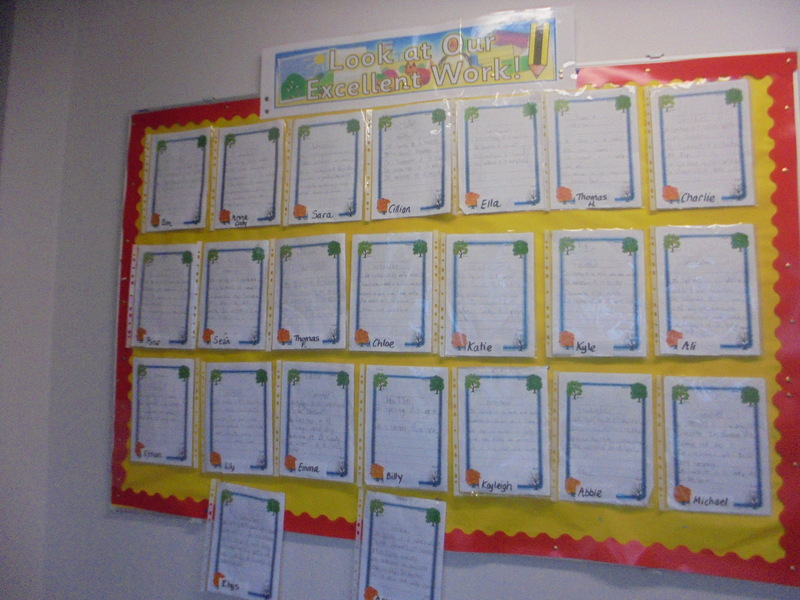 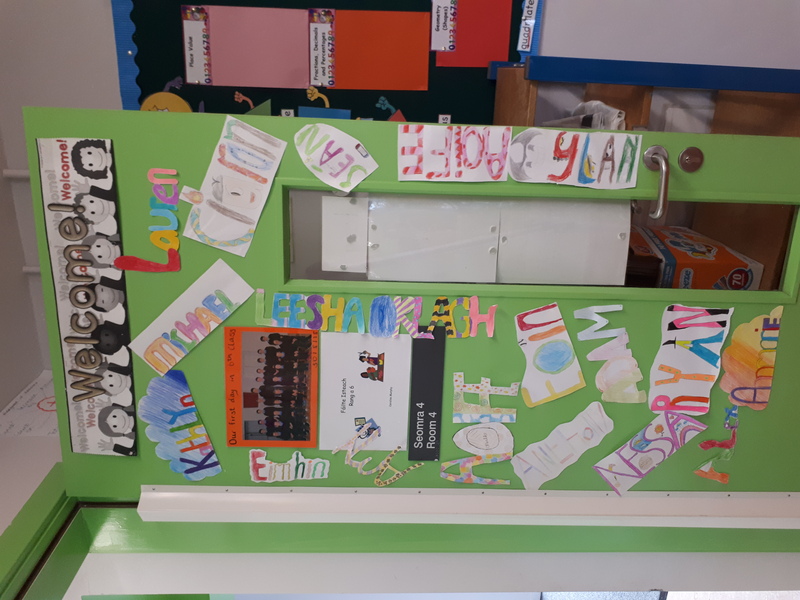 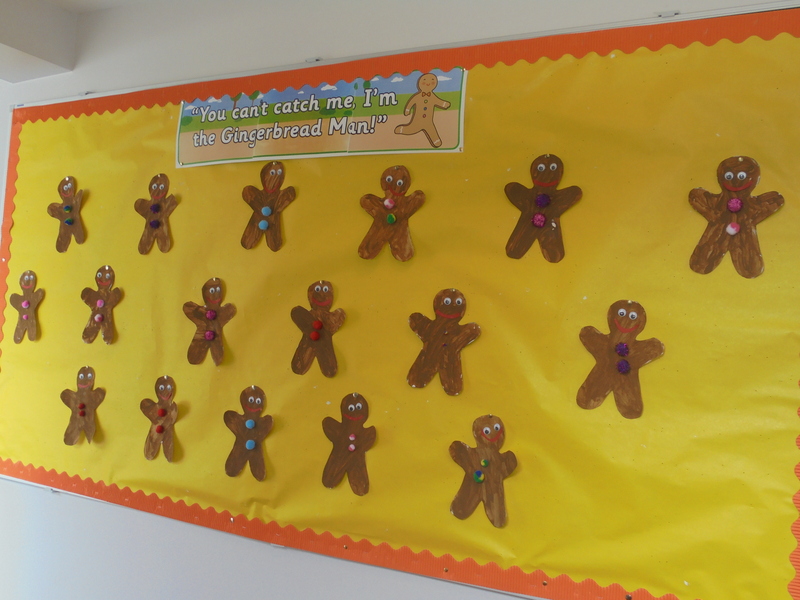 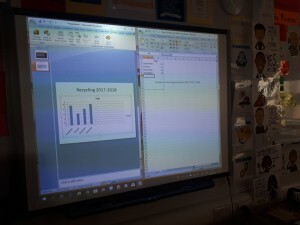 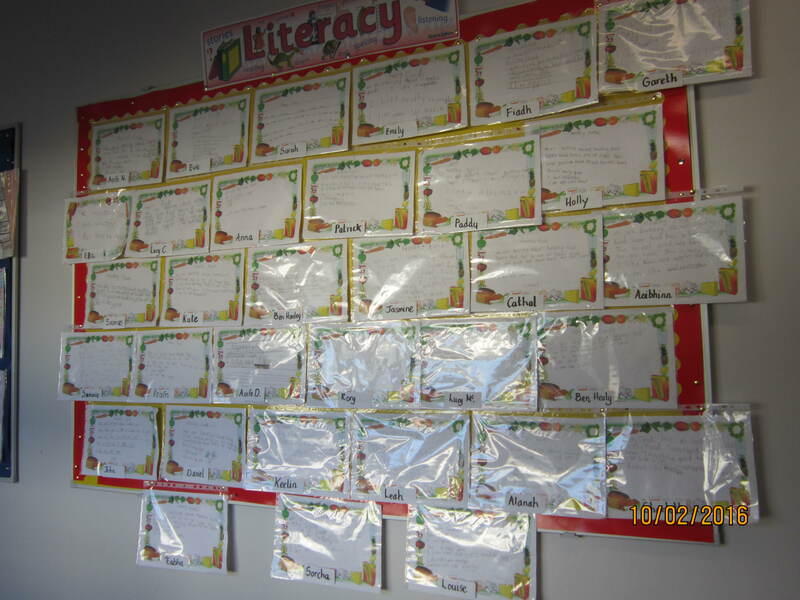 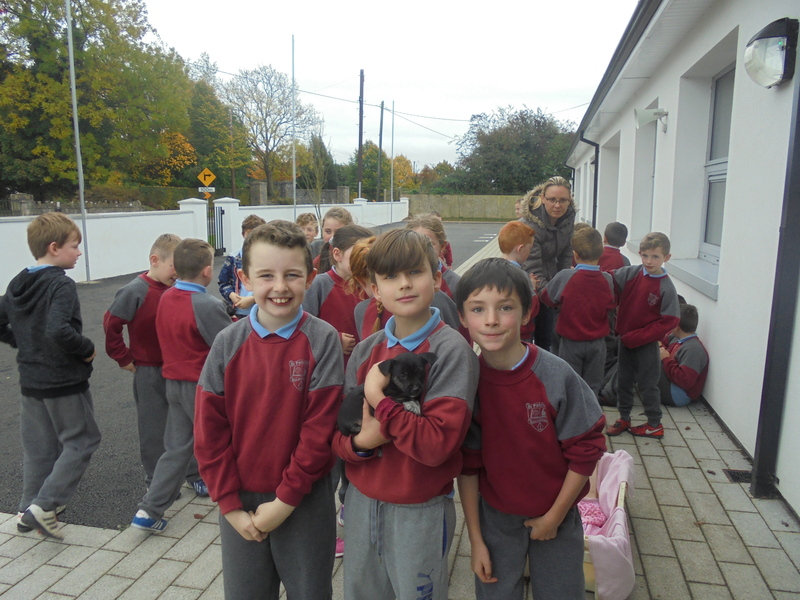 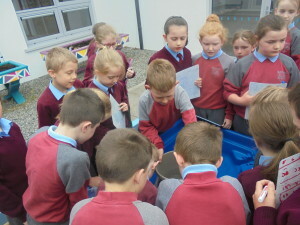 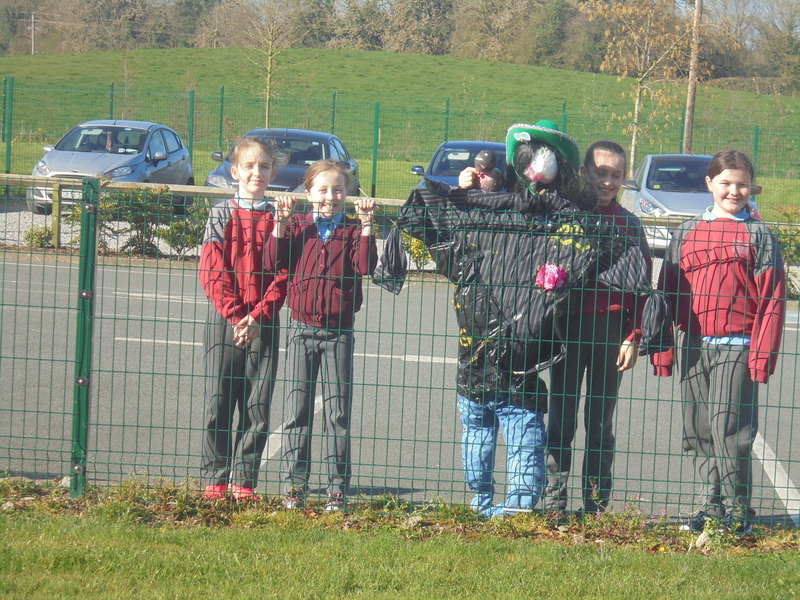 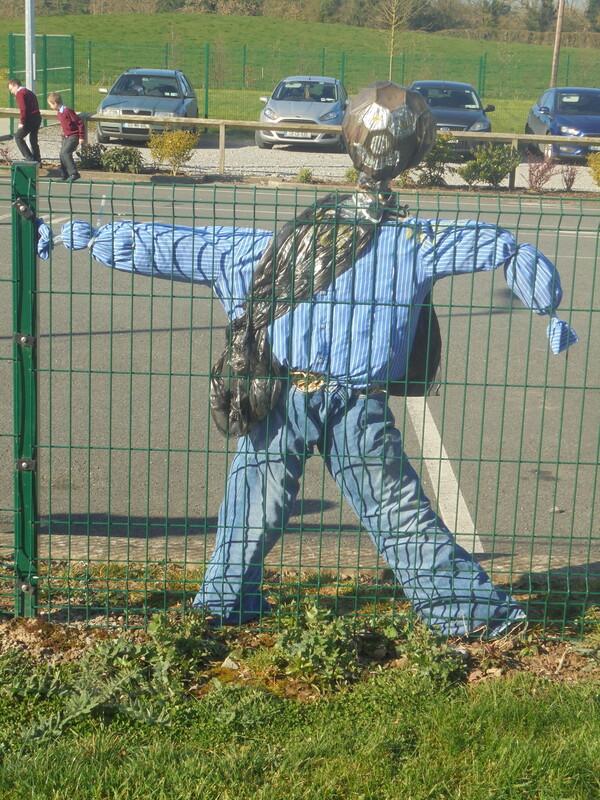 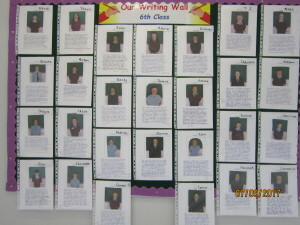 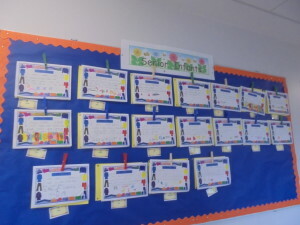 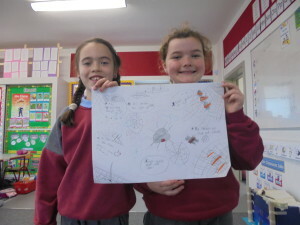 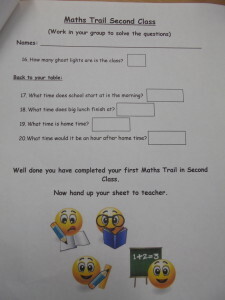 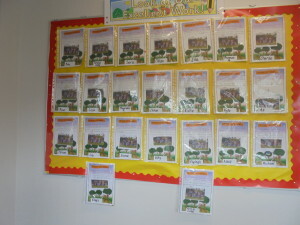 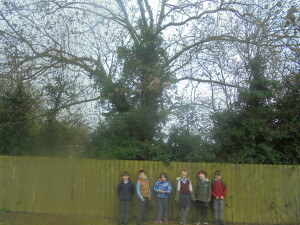 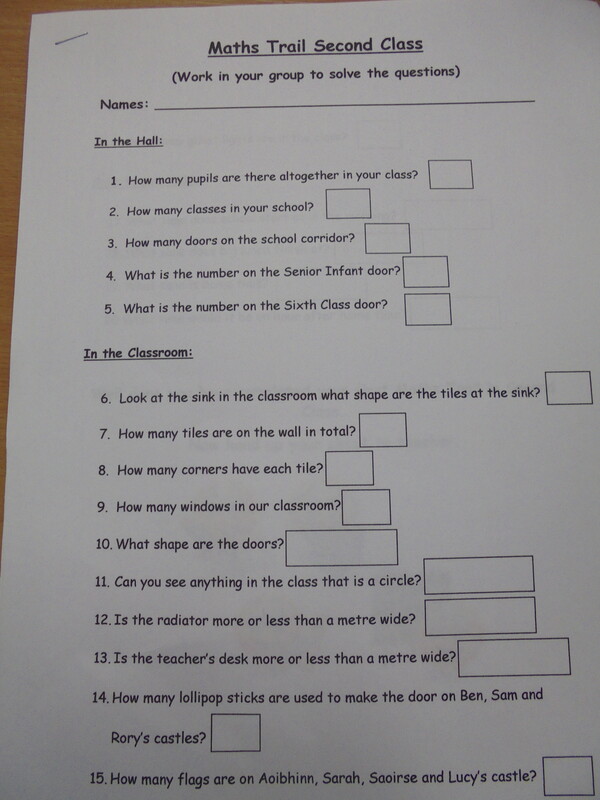 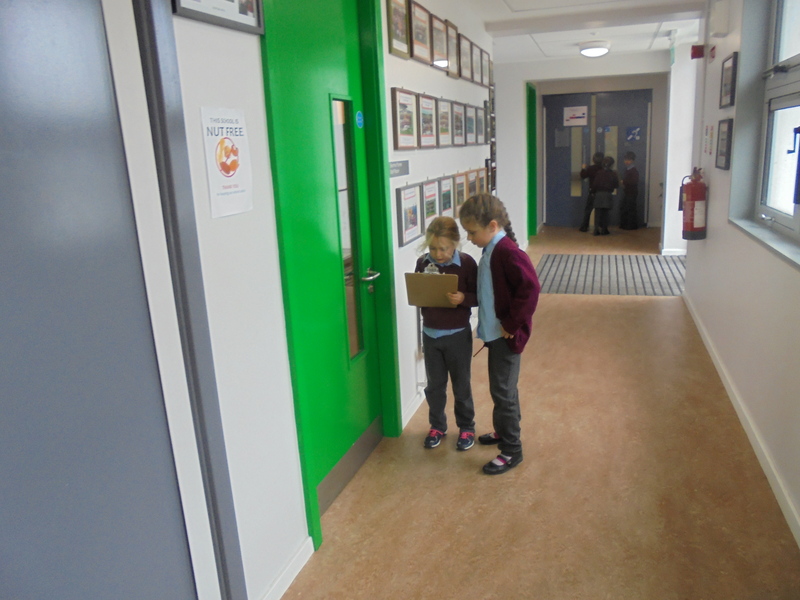 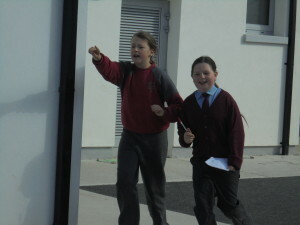 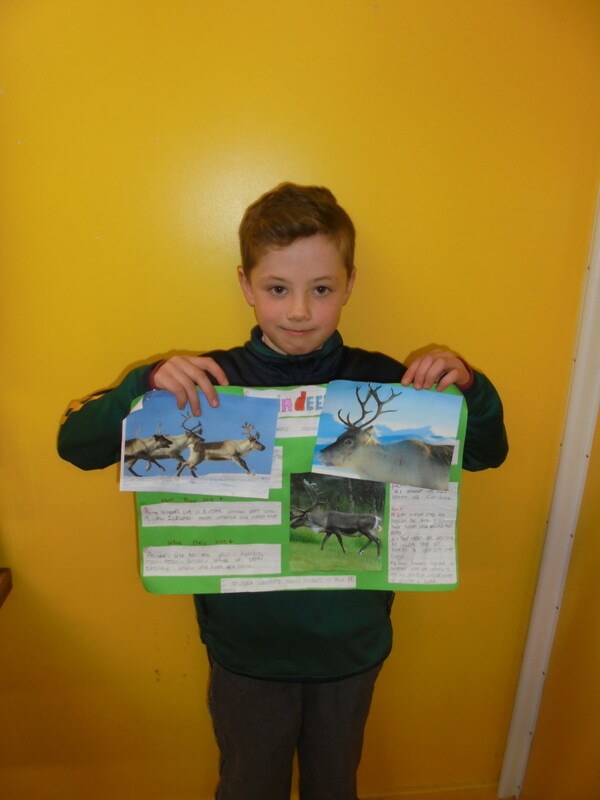 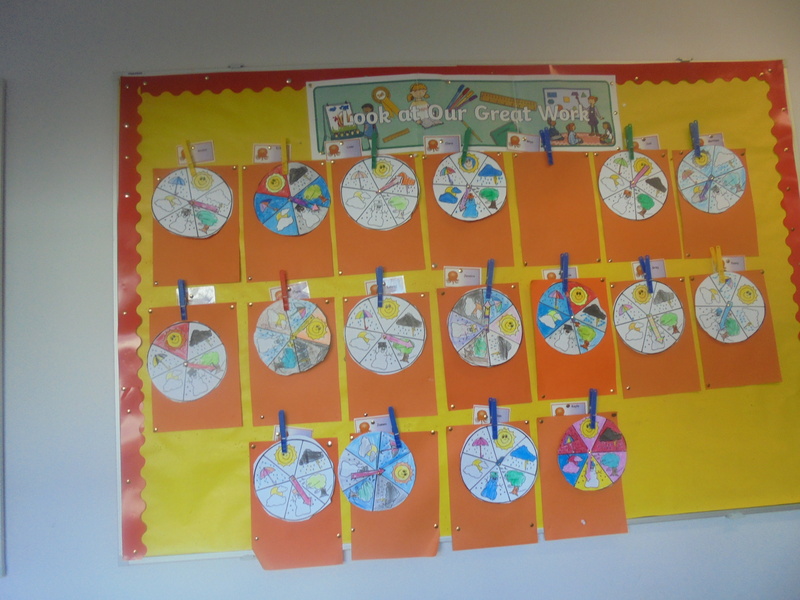 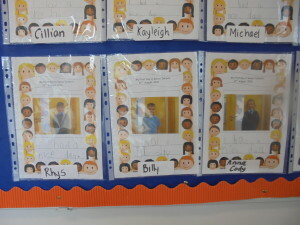 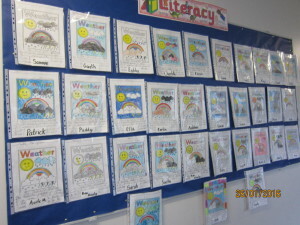 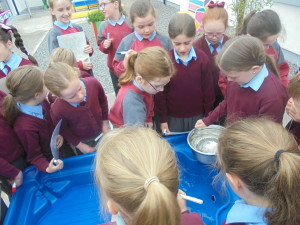 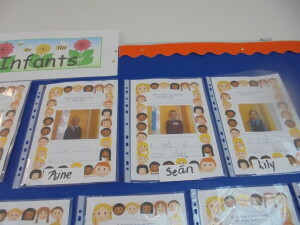 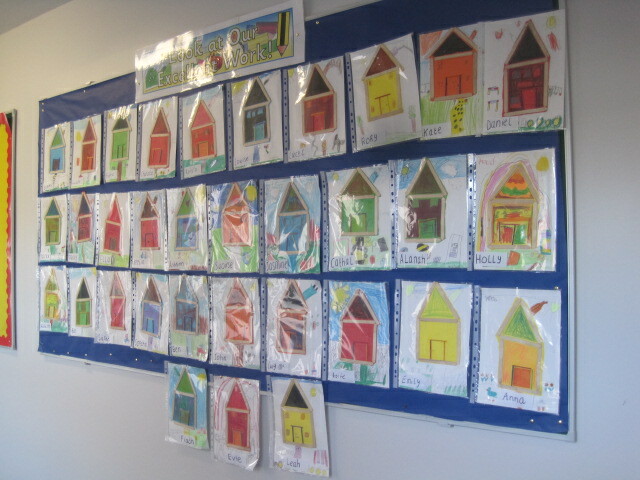 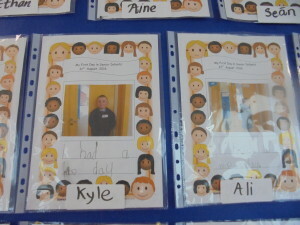 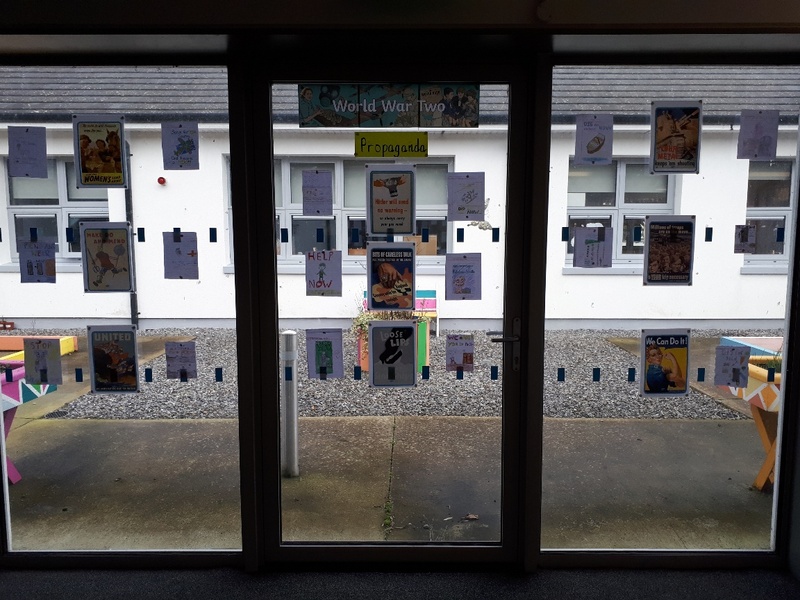 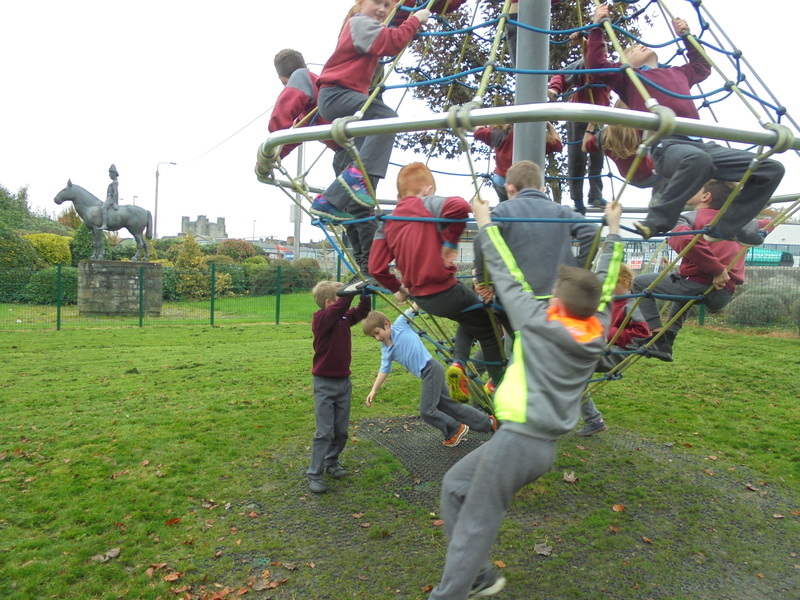 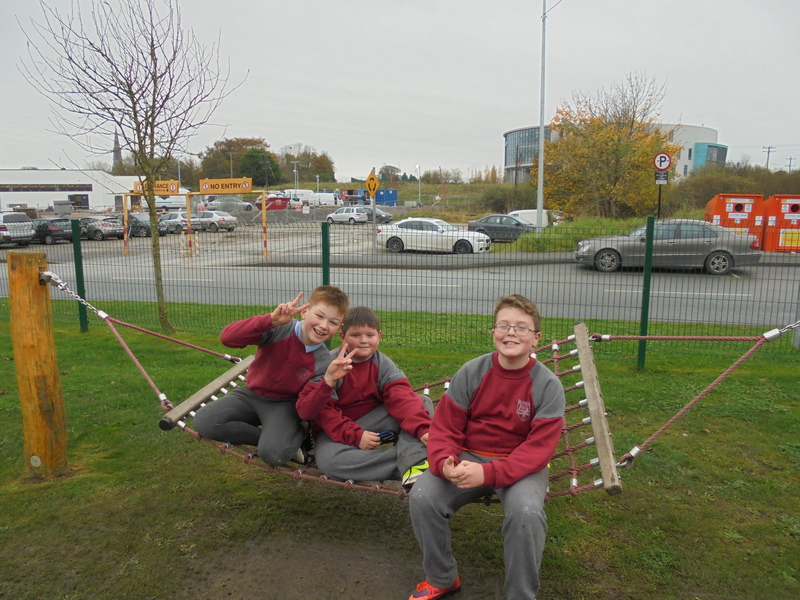 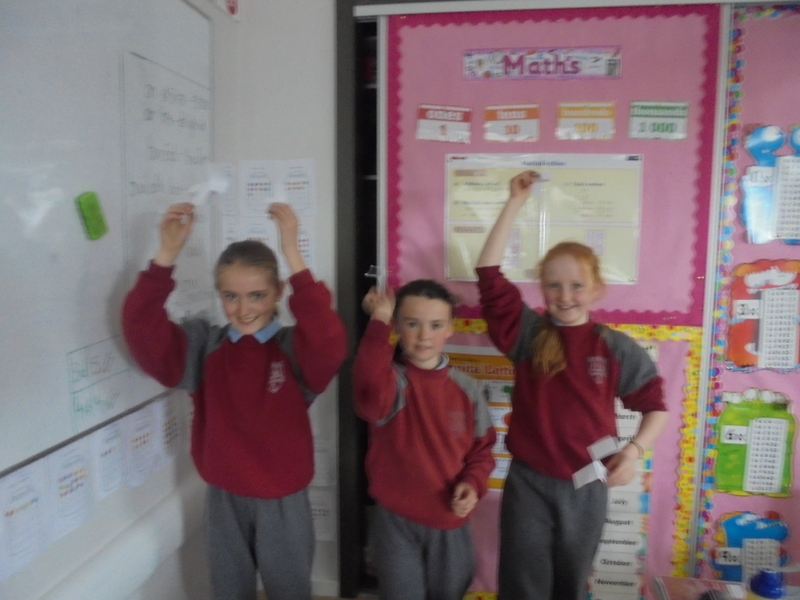 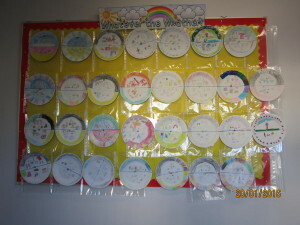 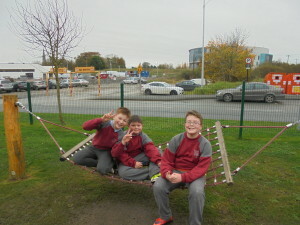 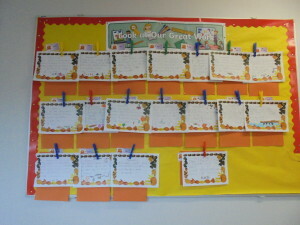 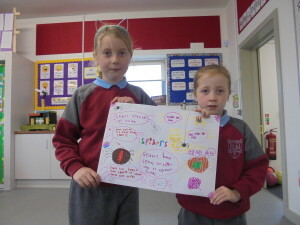 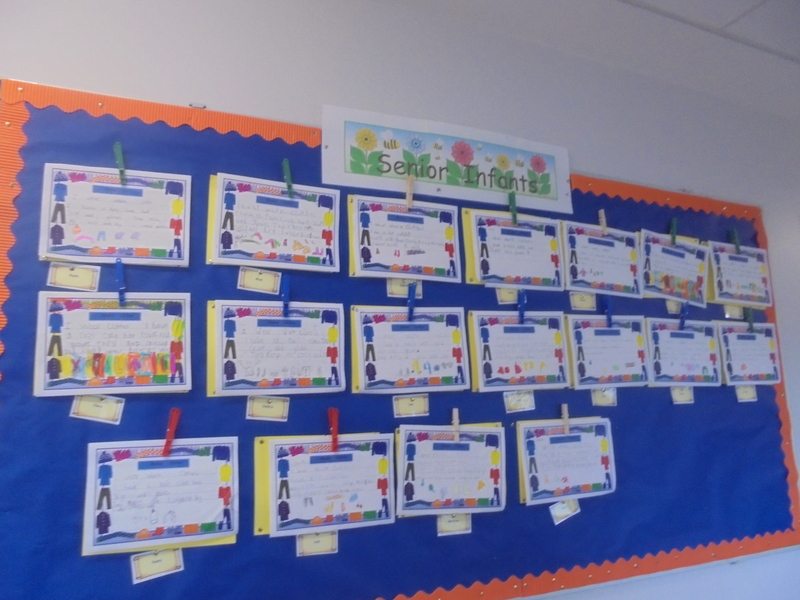 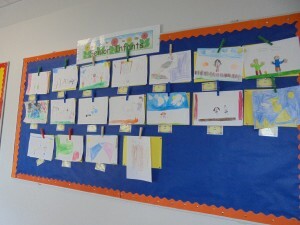 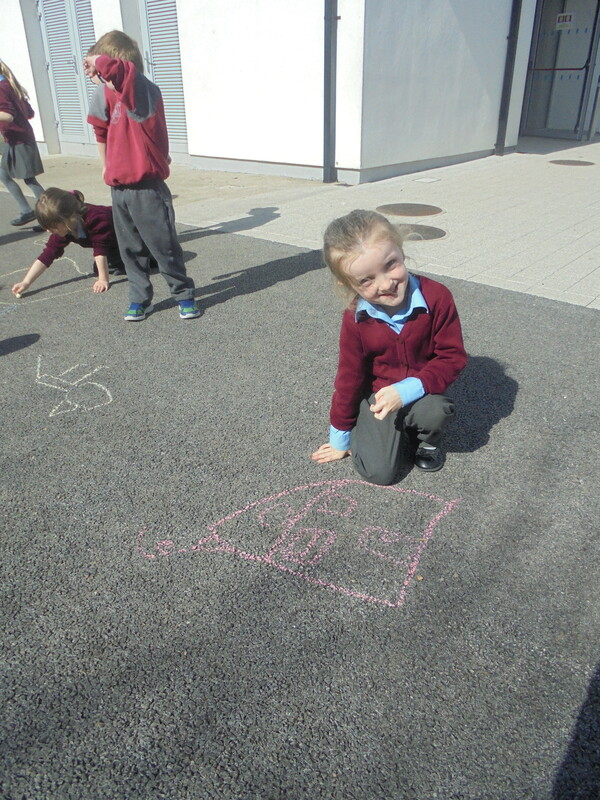 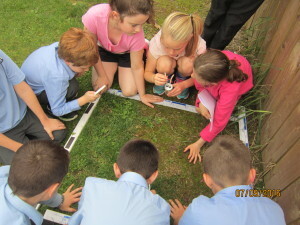 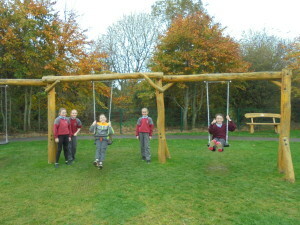 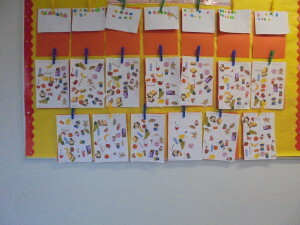 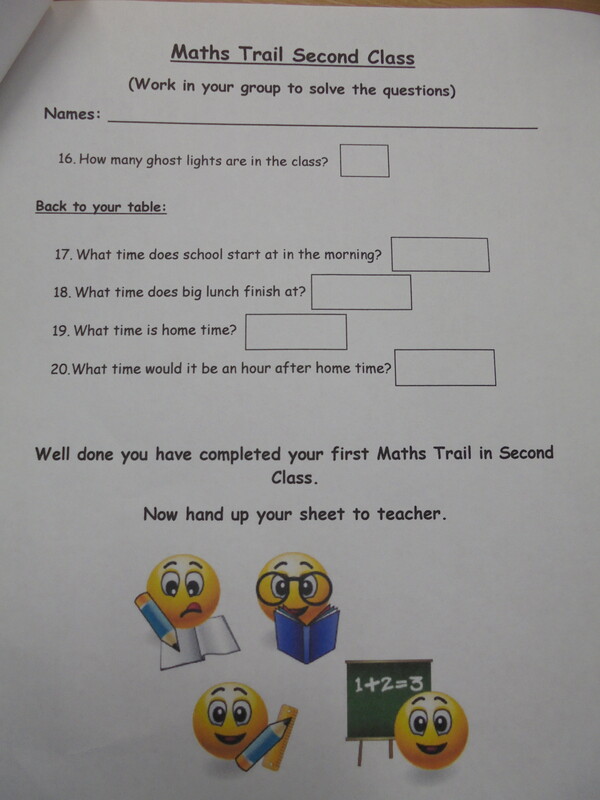 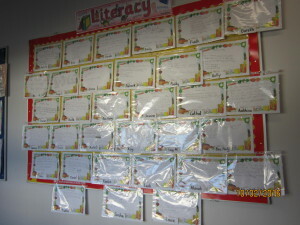 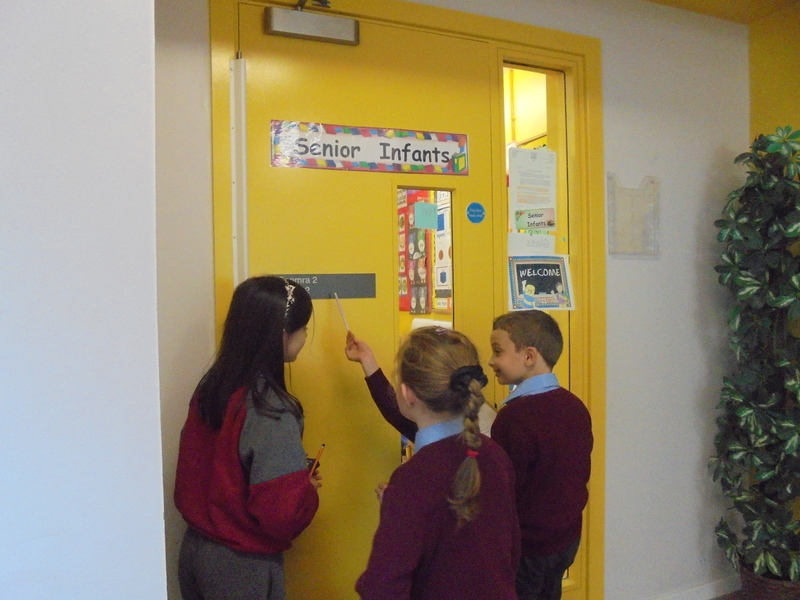 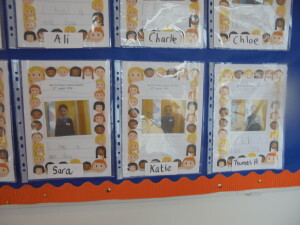 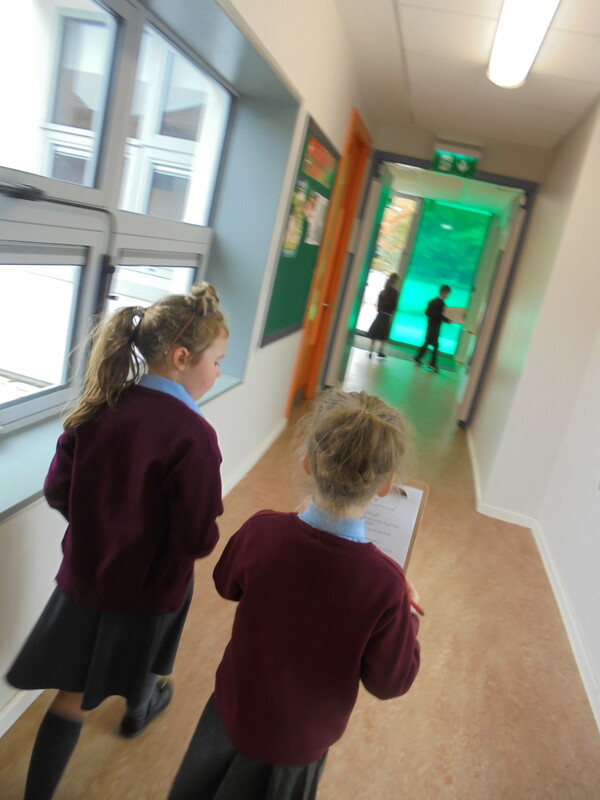 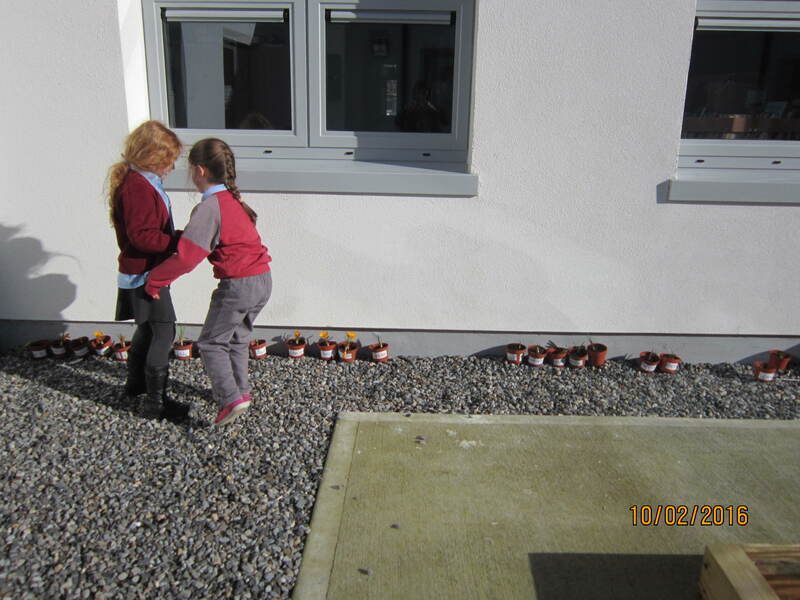 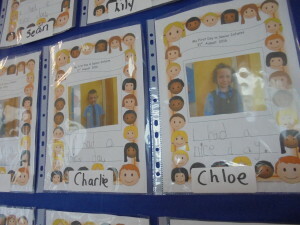 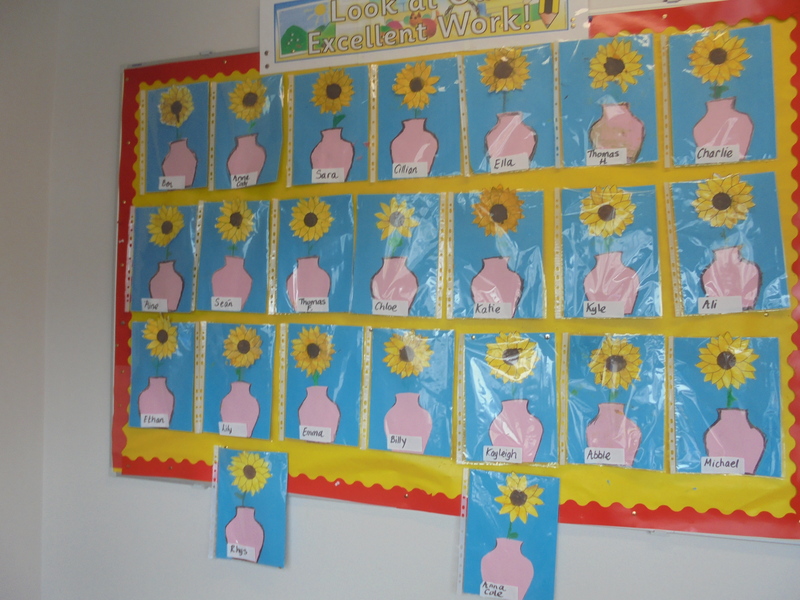 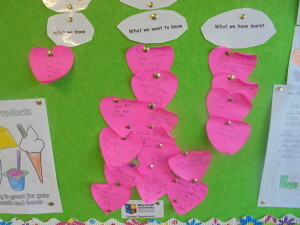 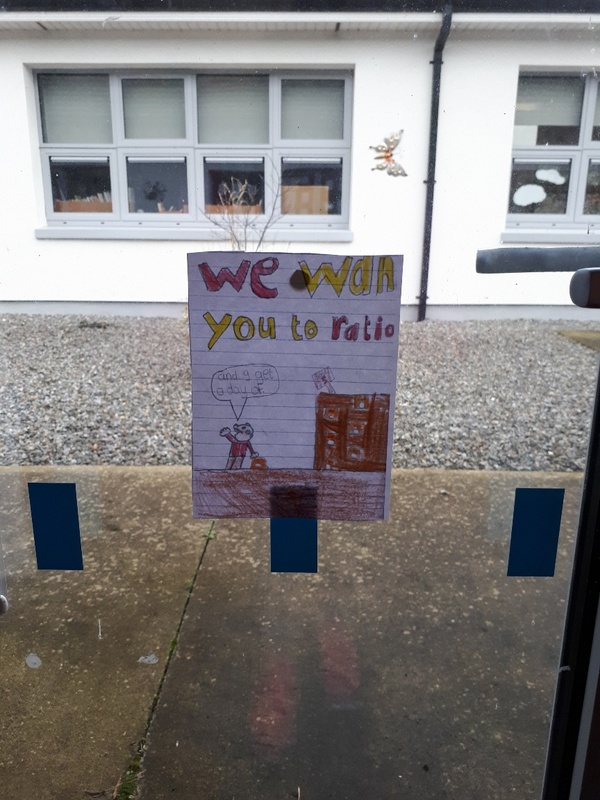 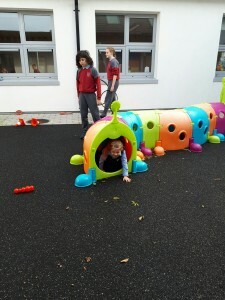 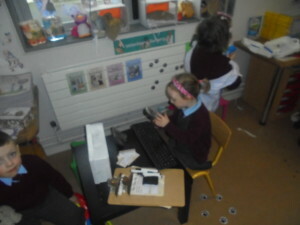 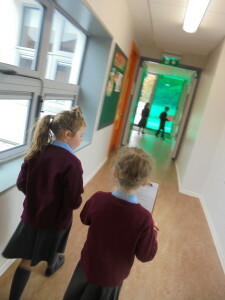 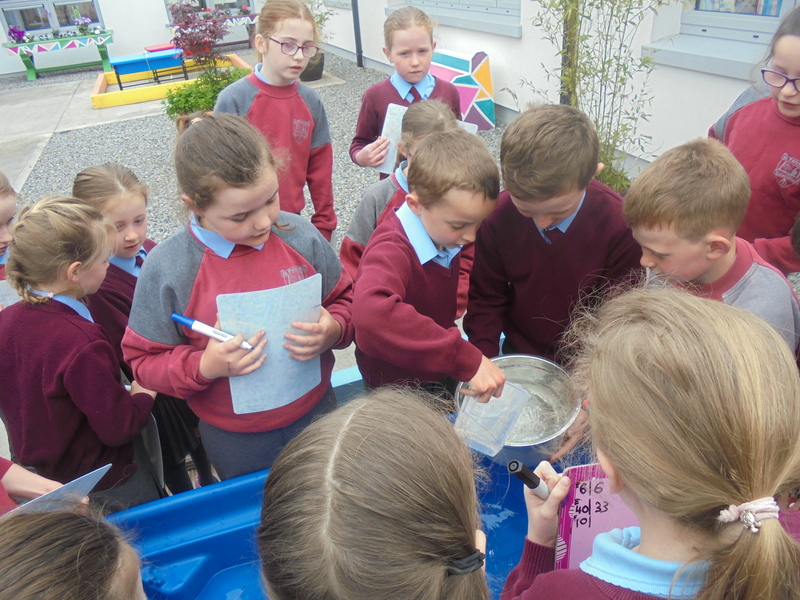 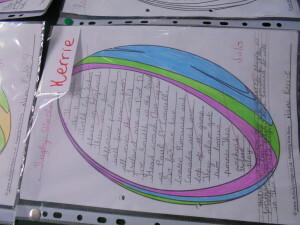 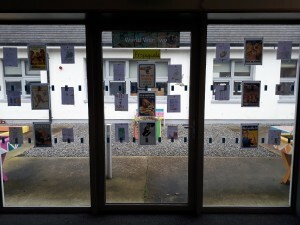 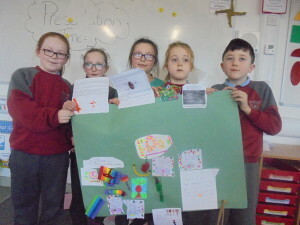 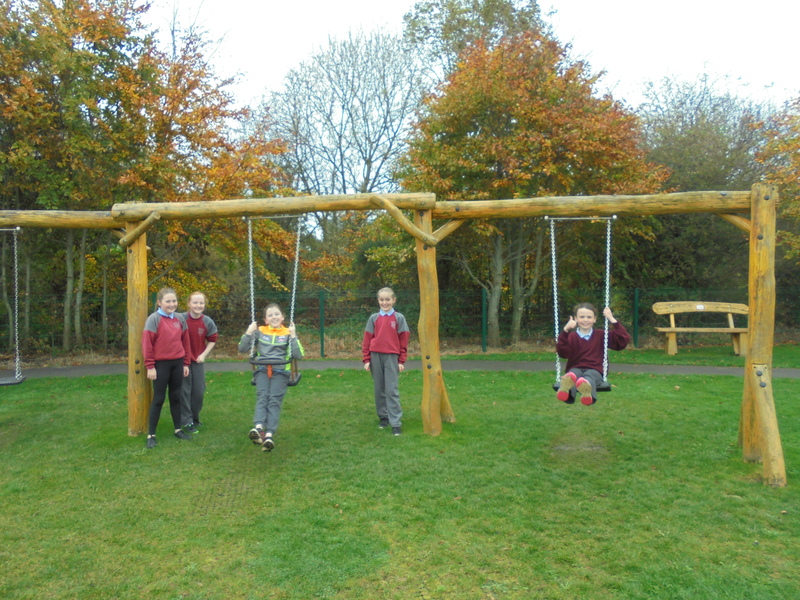 Ms Keogh’s 1st Class completed a maths trail around the school as part of maths week. 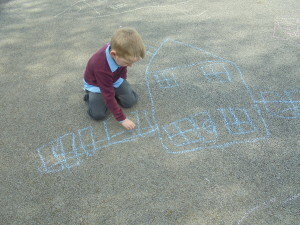 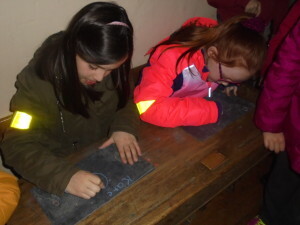 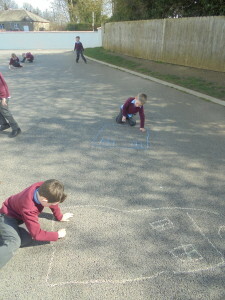 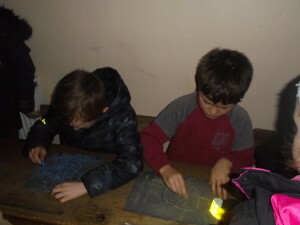 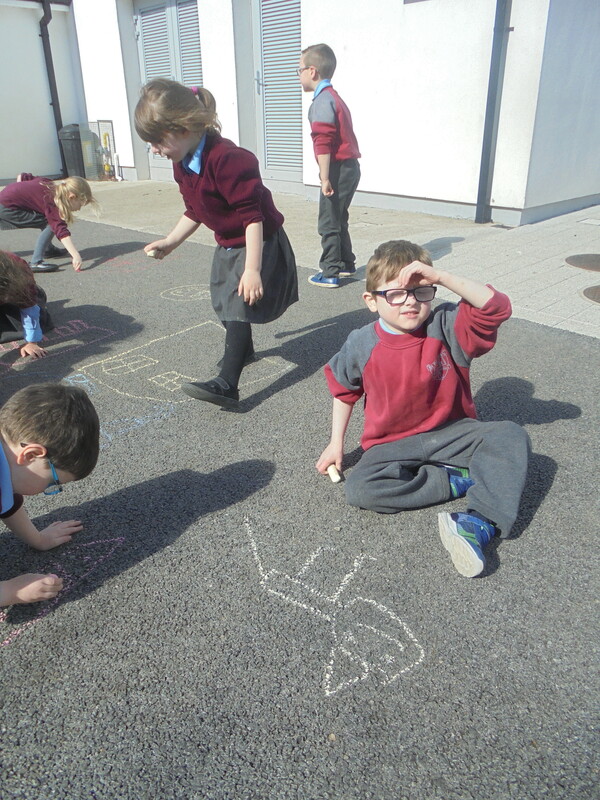 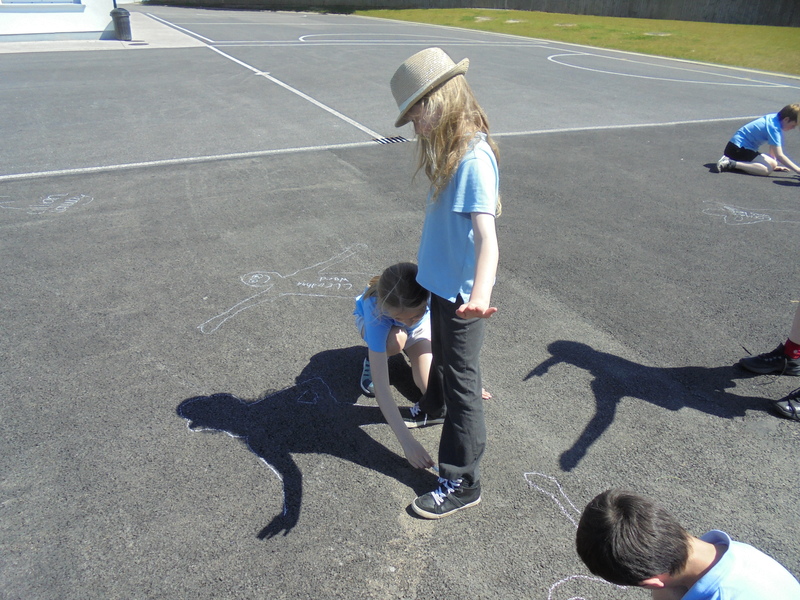 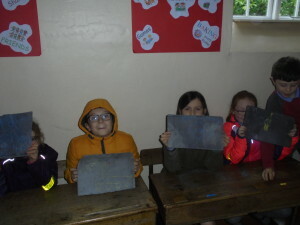 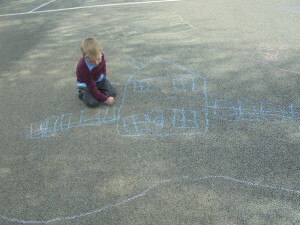 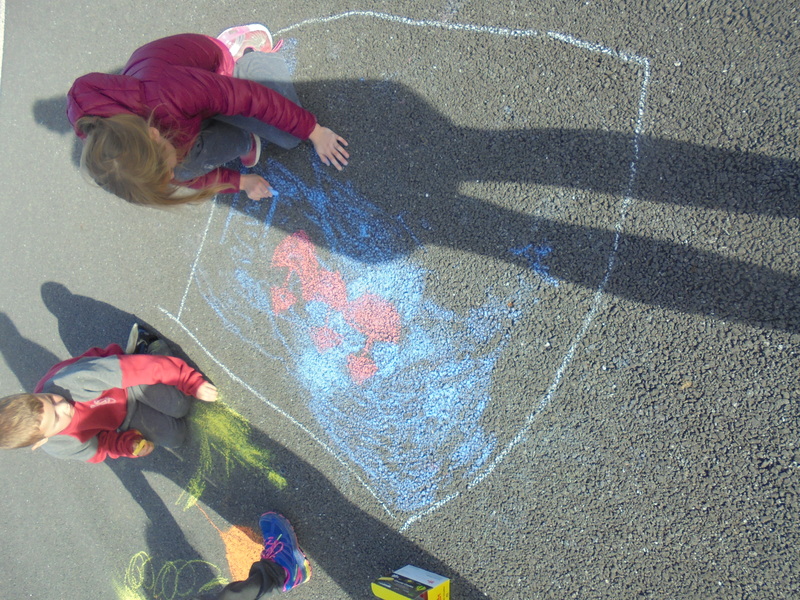 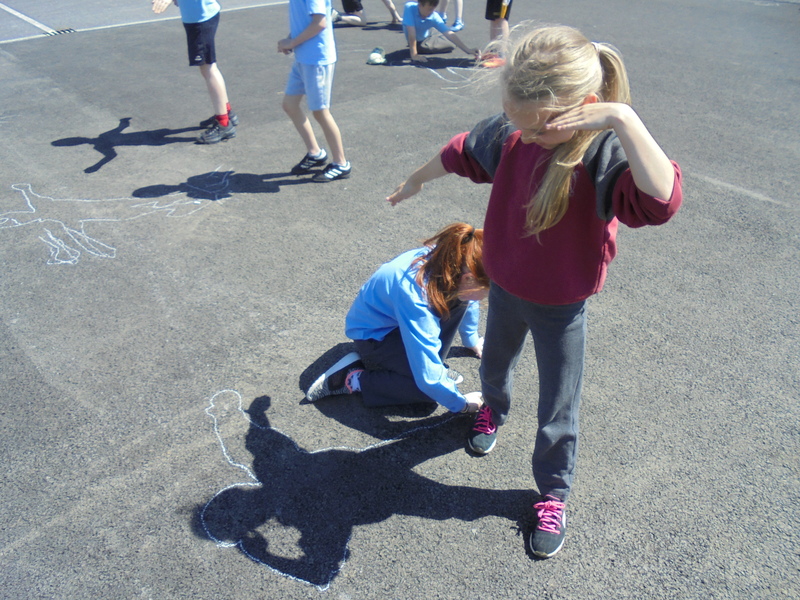 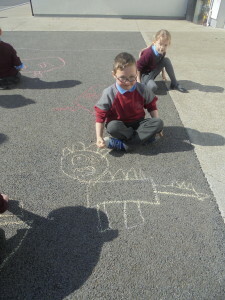 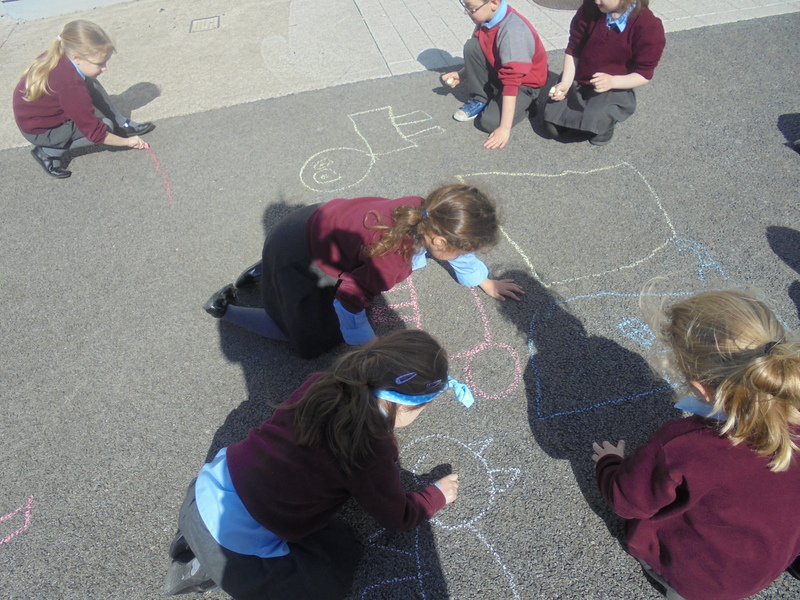 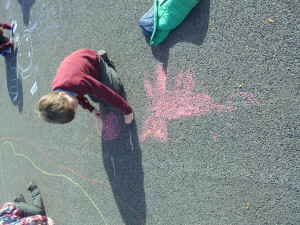 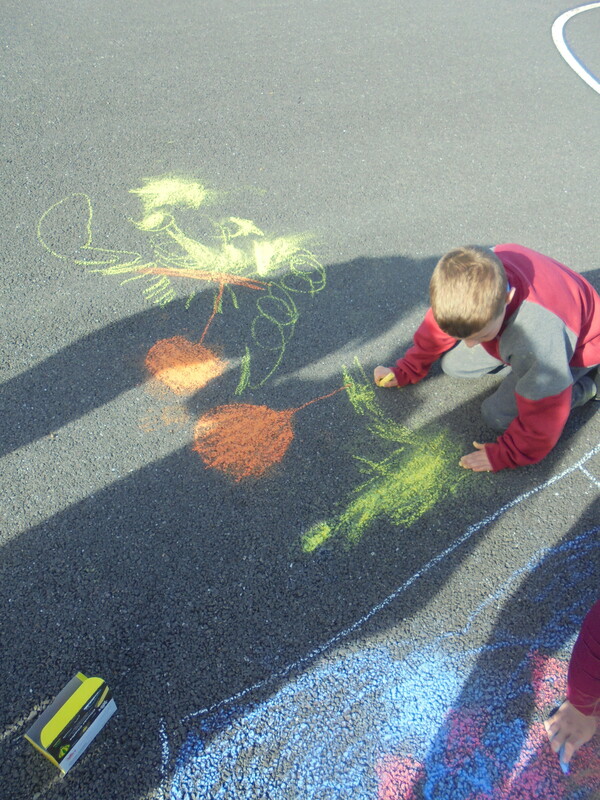 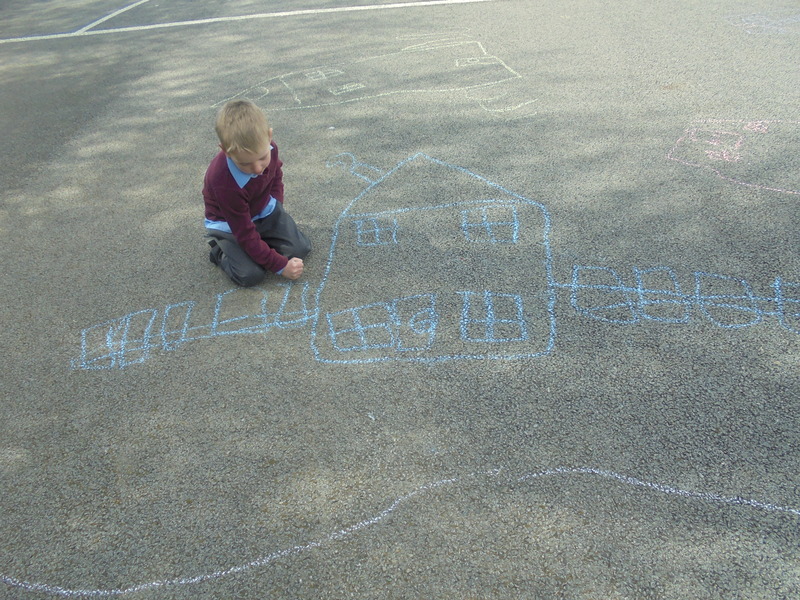 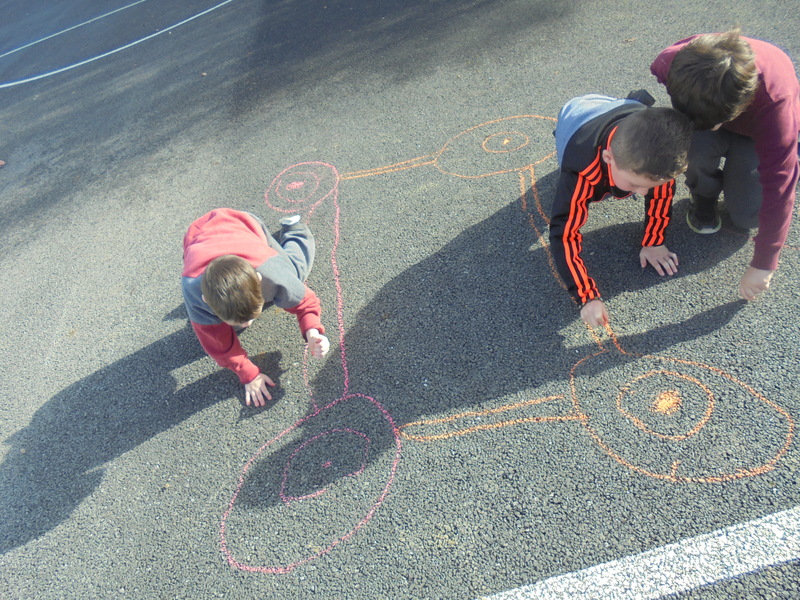 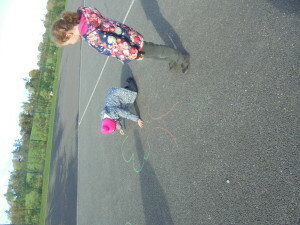 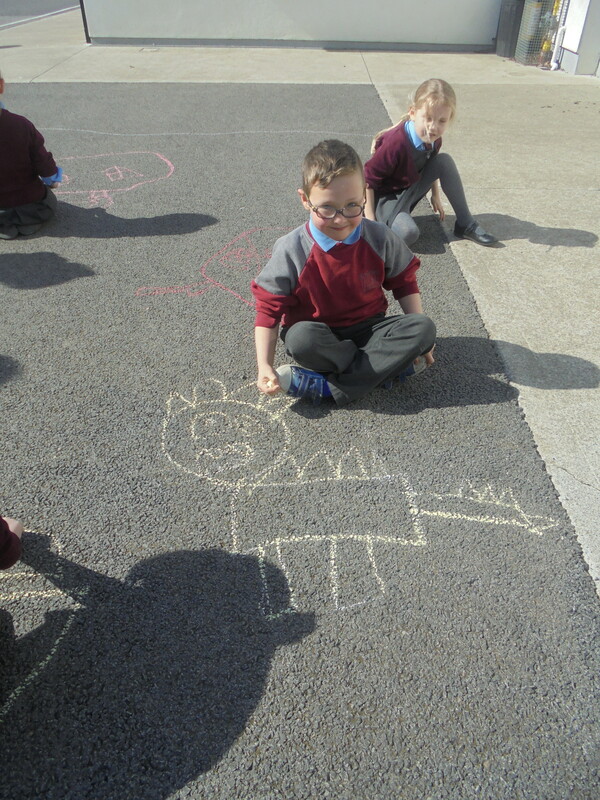 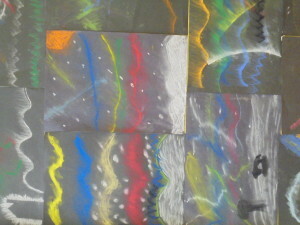 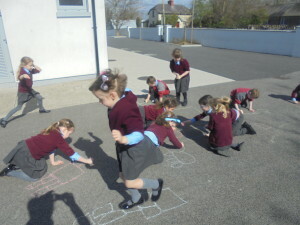 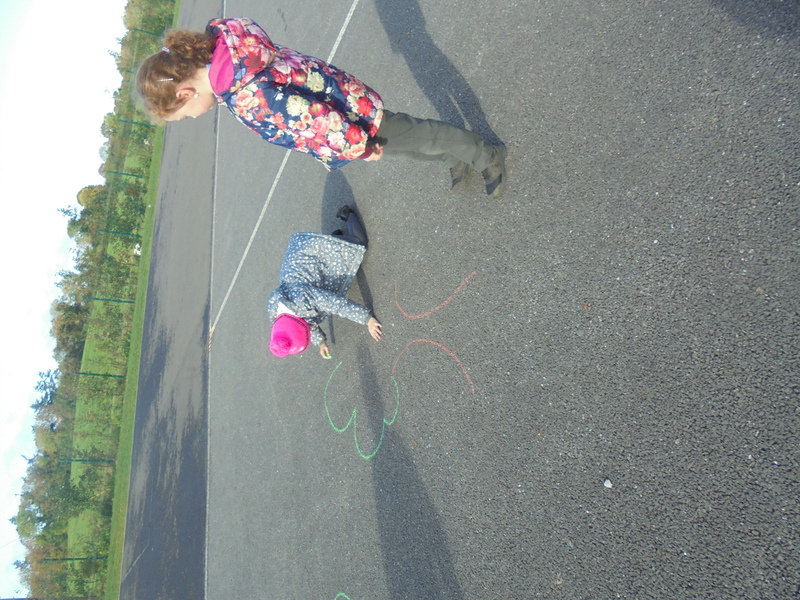 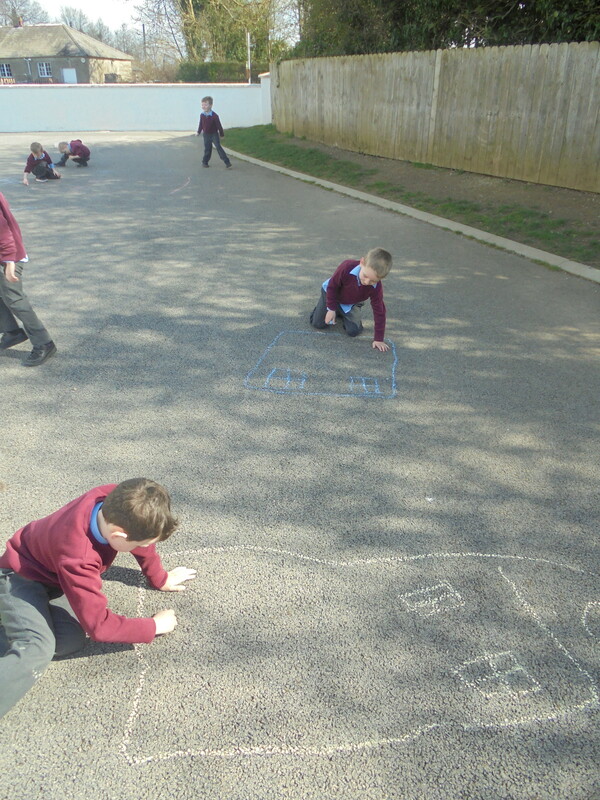 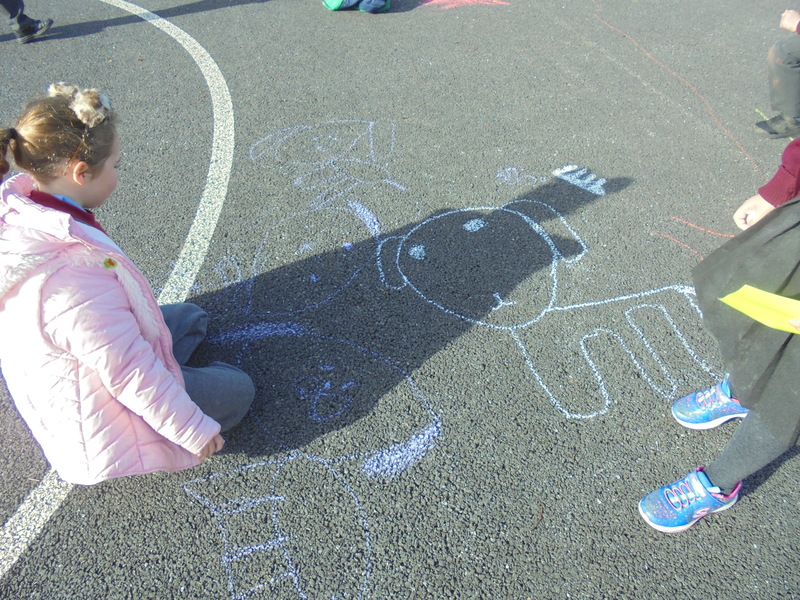 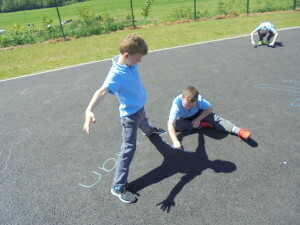 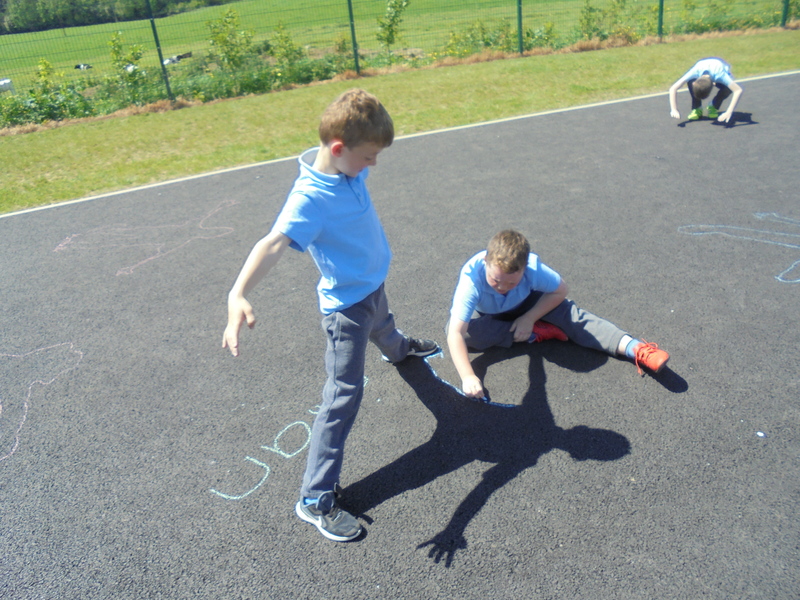 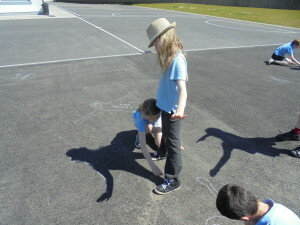 They also worked in groups to complete chalk pictures with number and shape instructions. 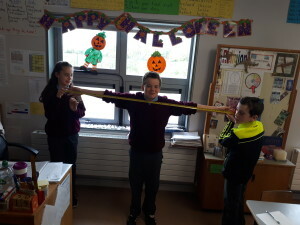 Oct 2018. 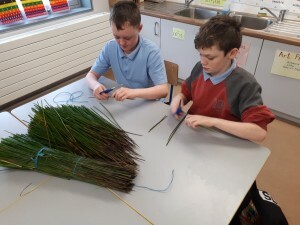 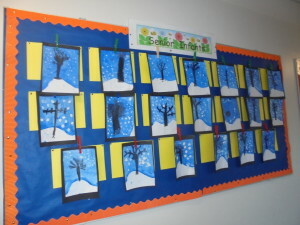 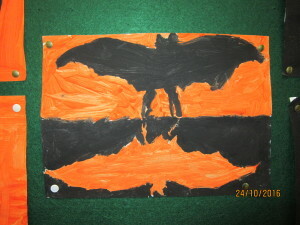 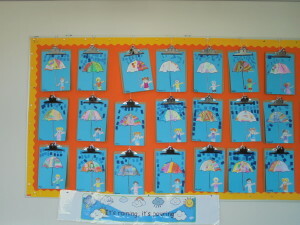 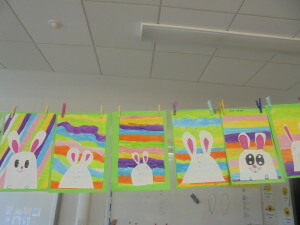 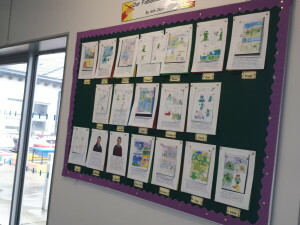 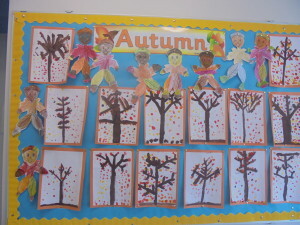 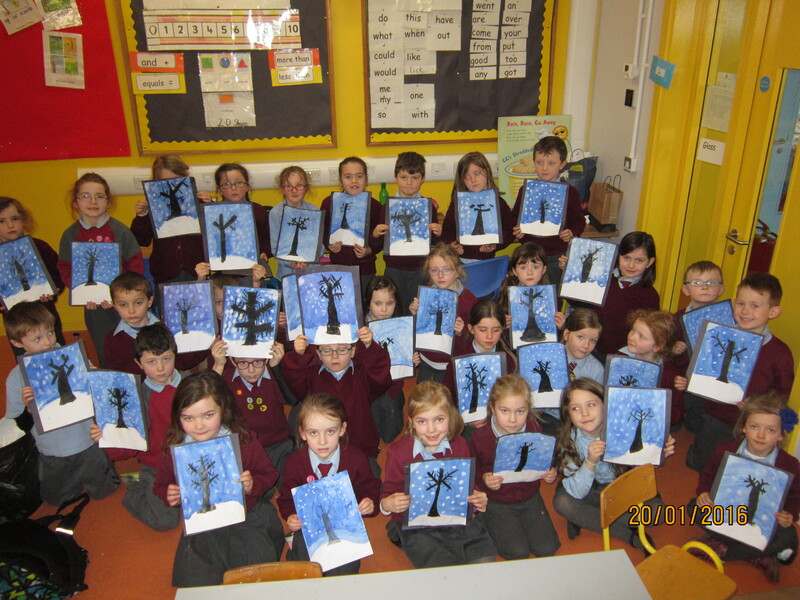 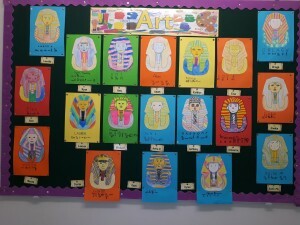 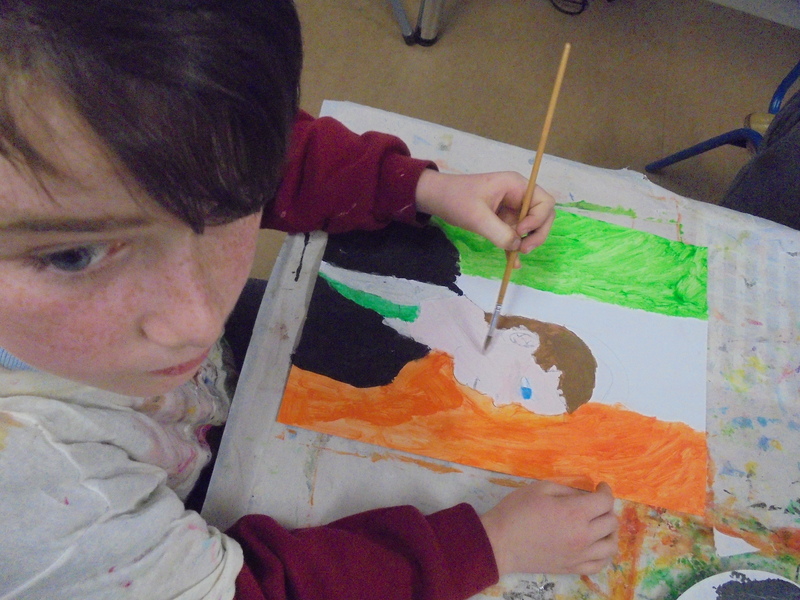 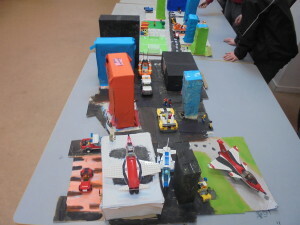 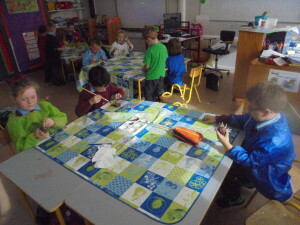 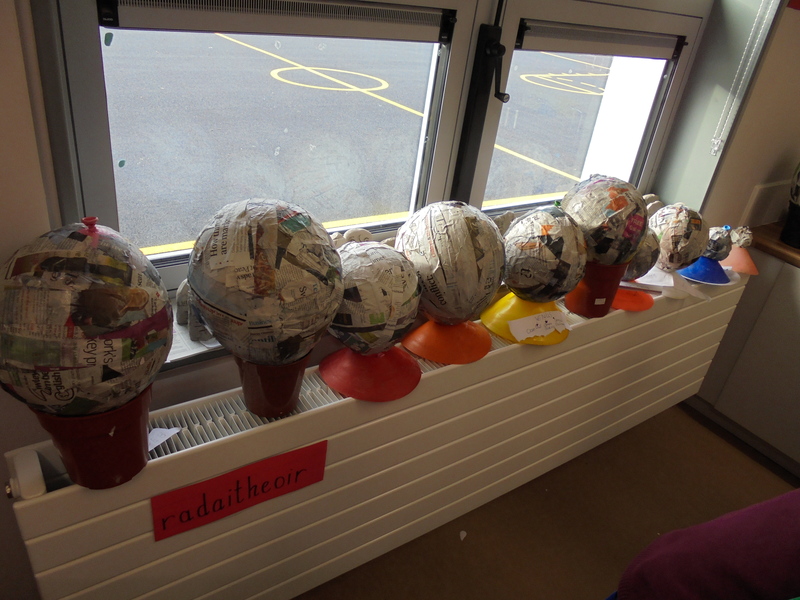 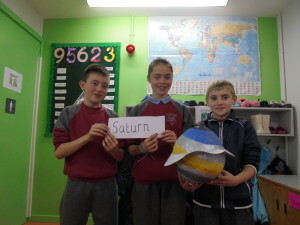 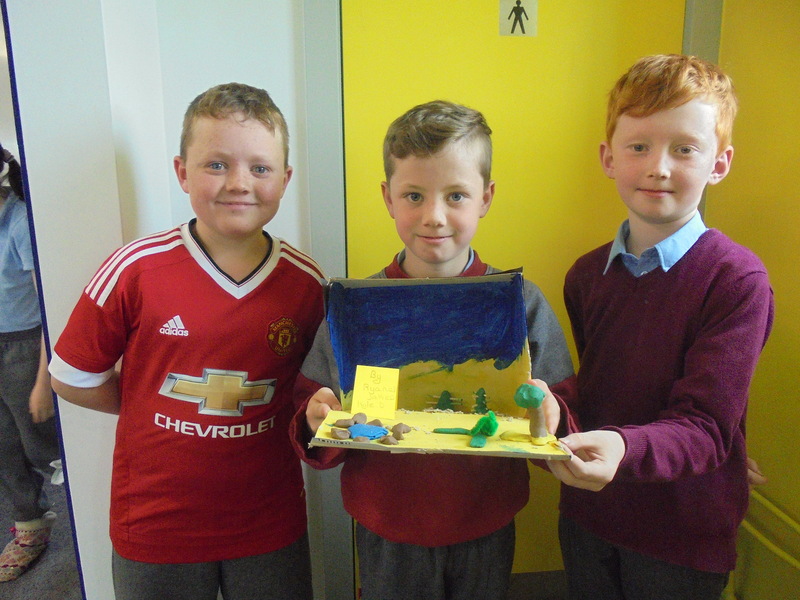 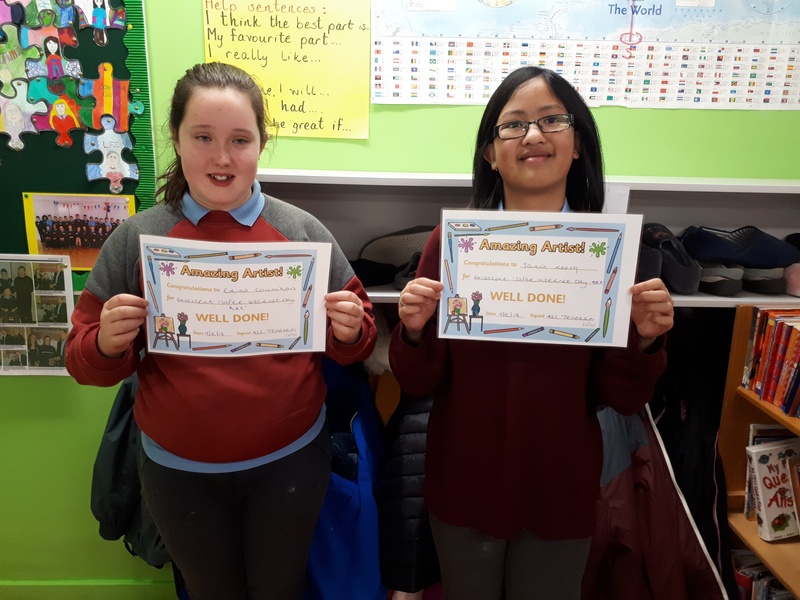 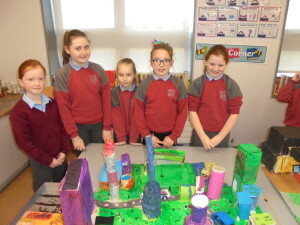 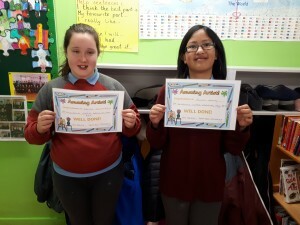 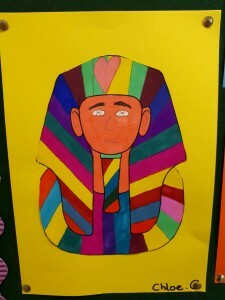 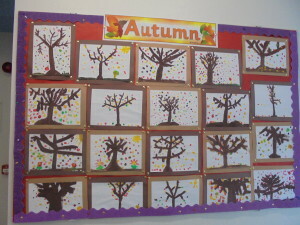 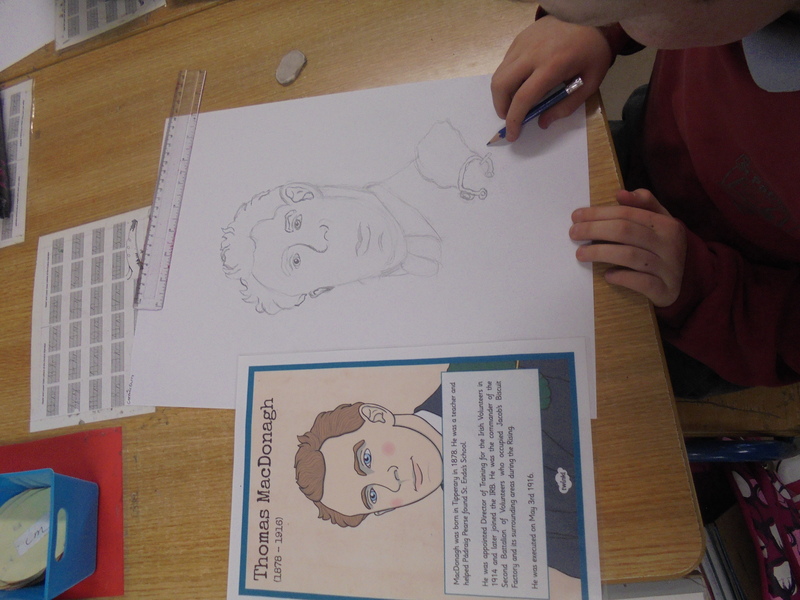 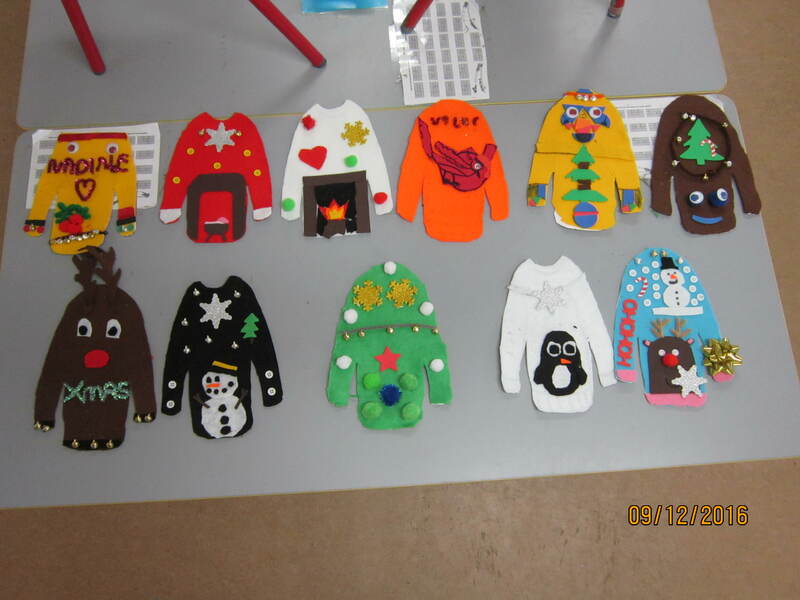 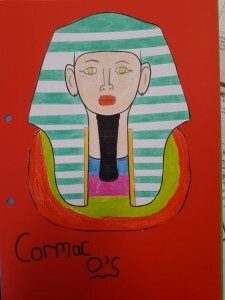 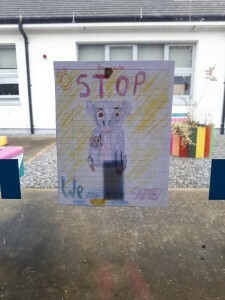 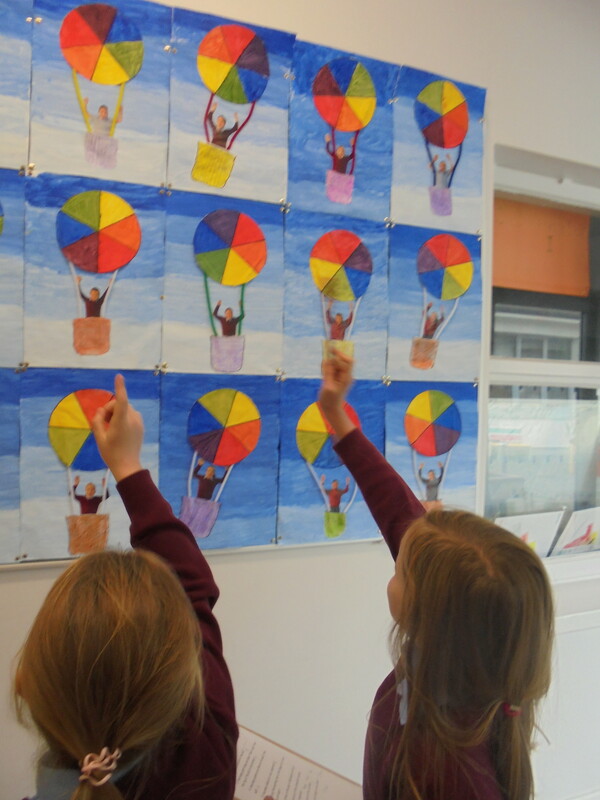 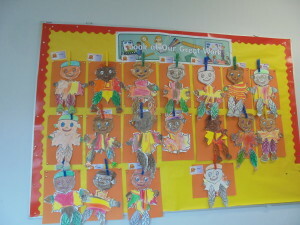 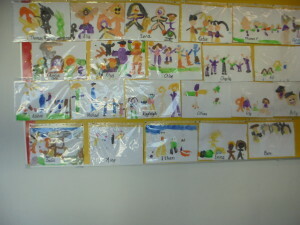 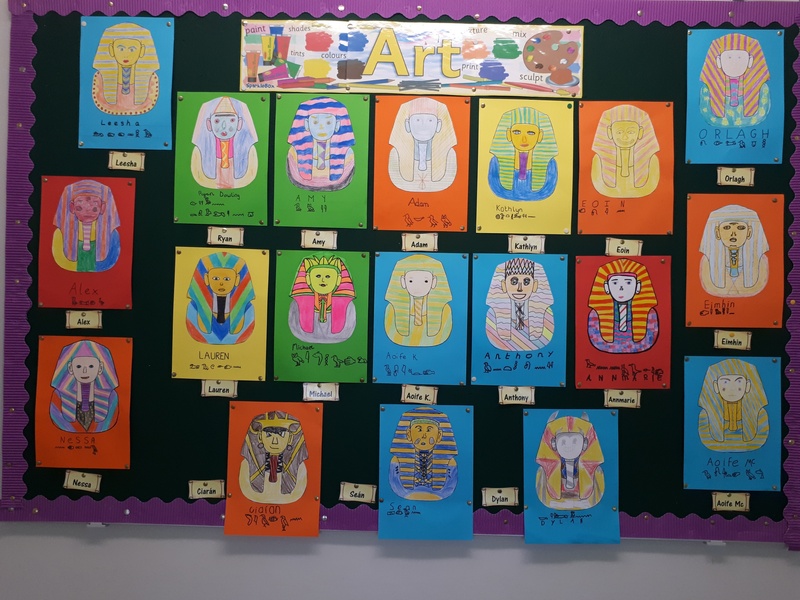 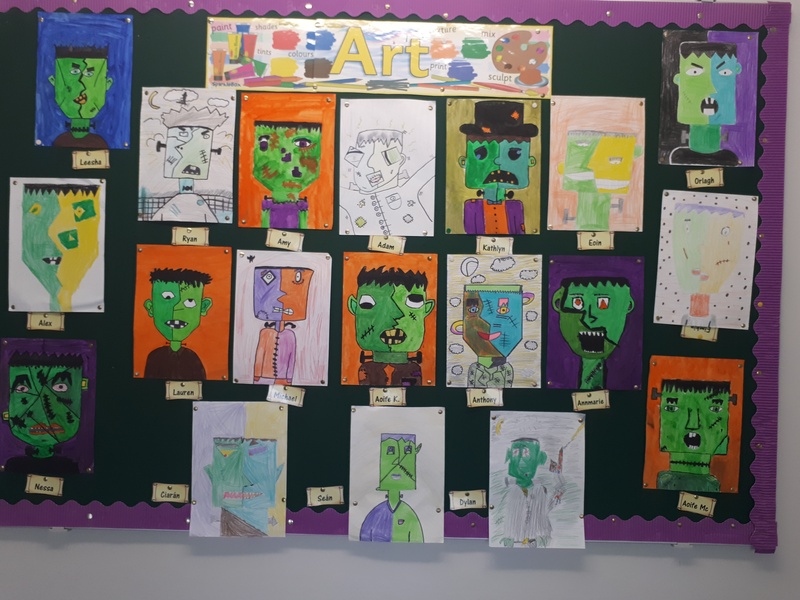 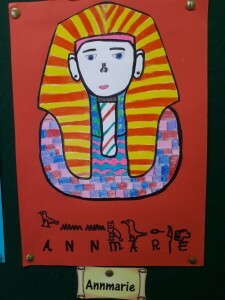 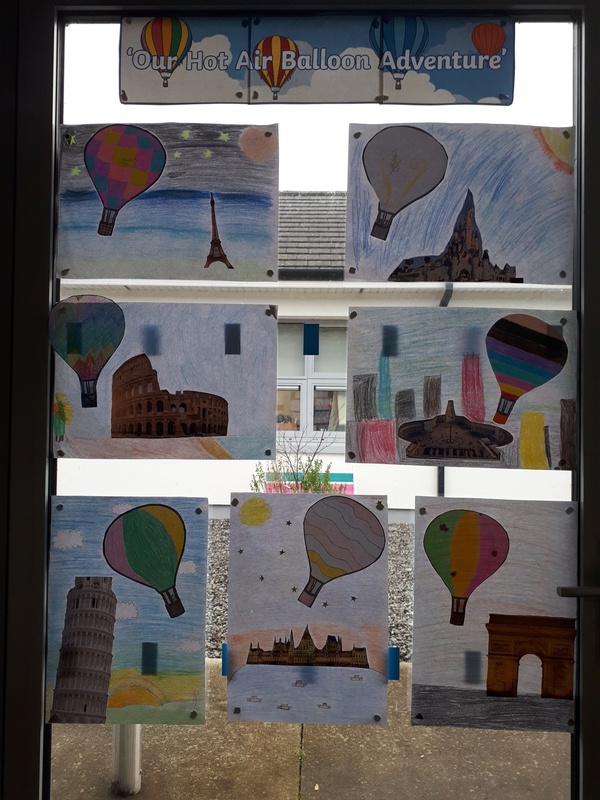 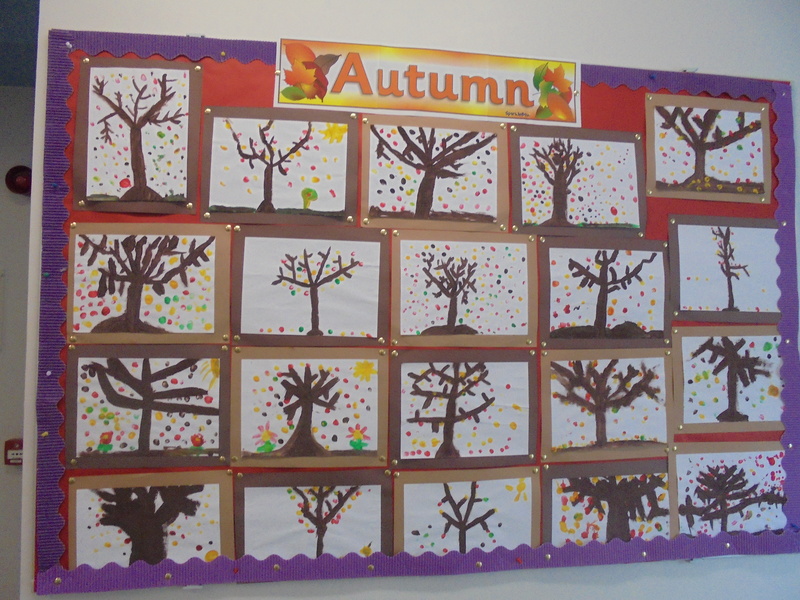 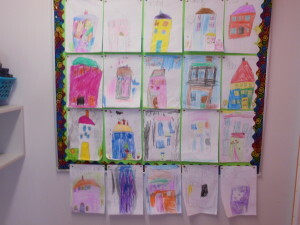 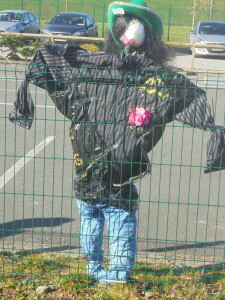 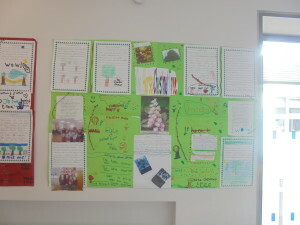 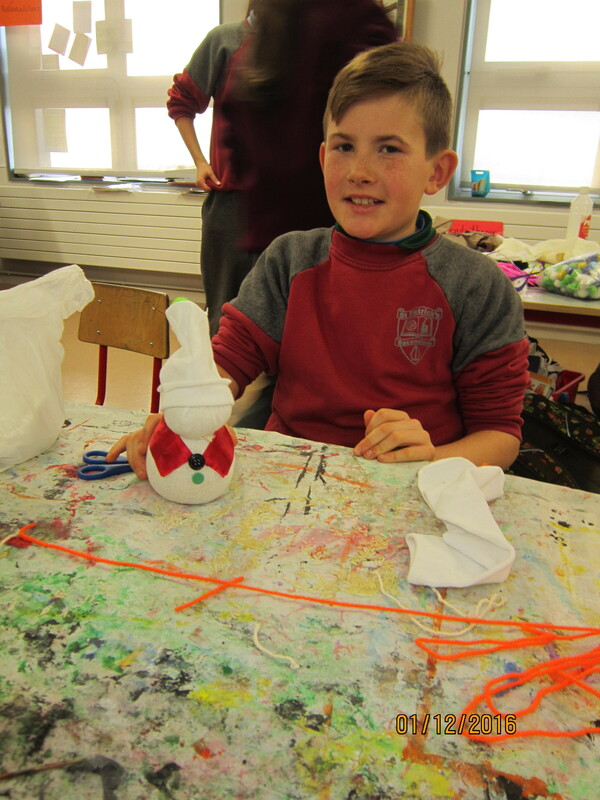 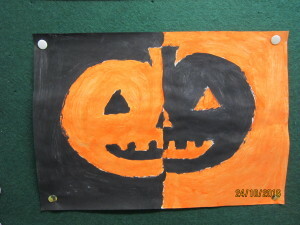 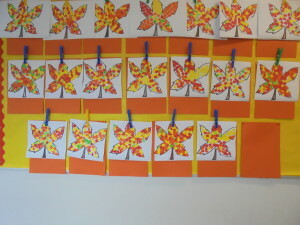 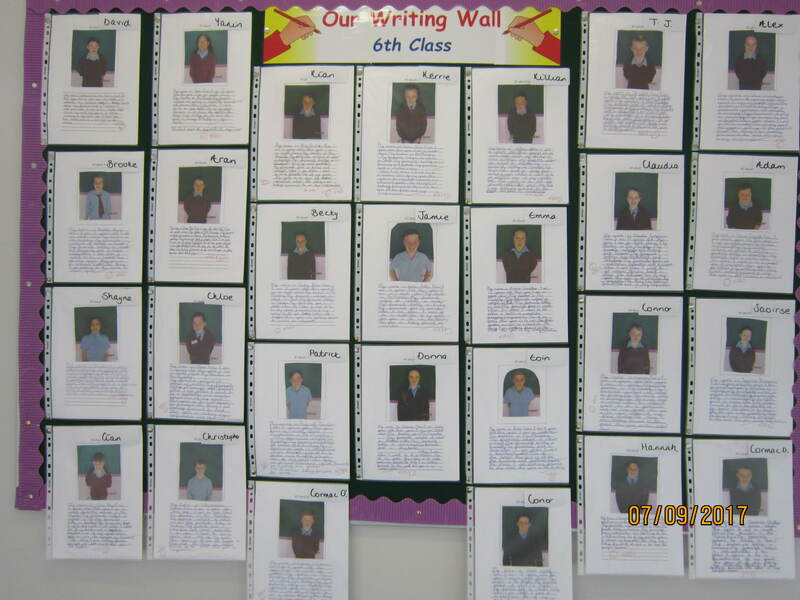 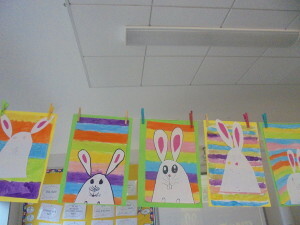 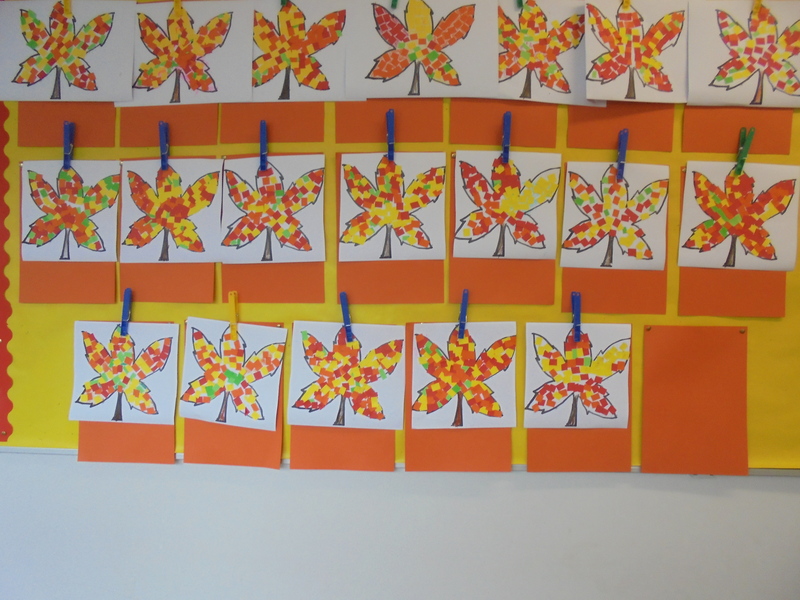 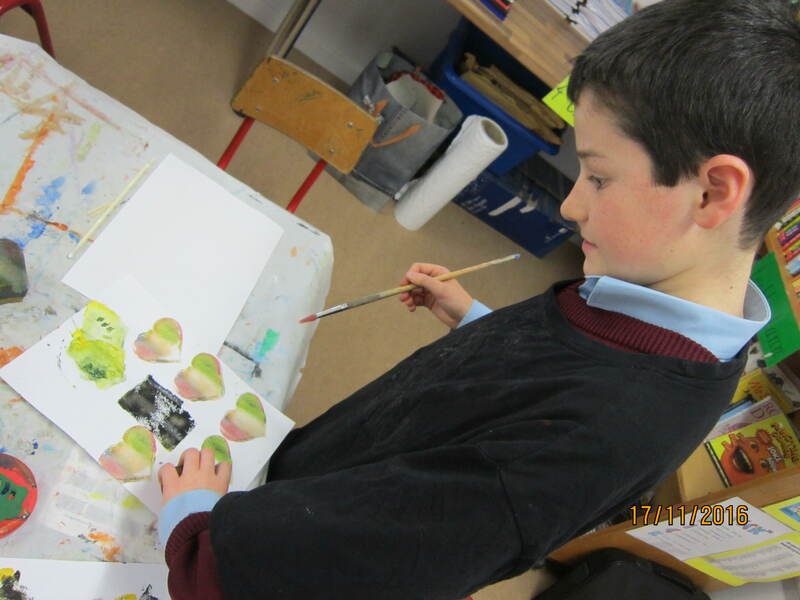 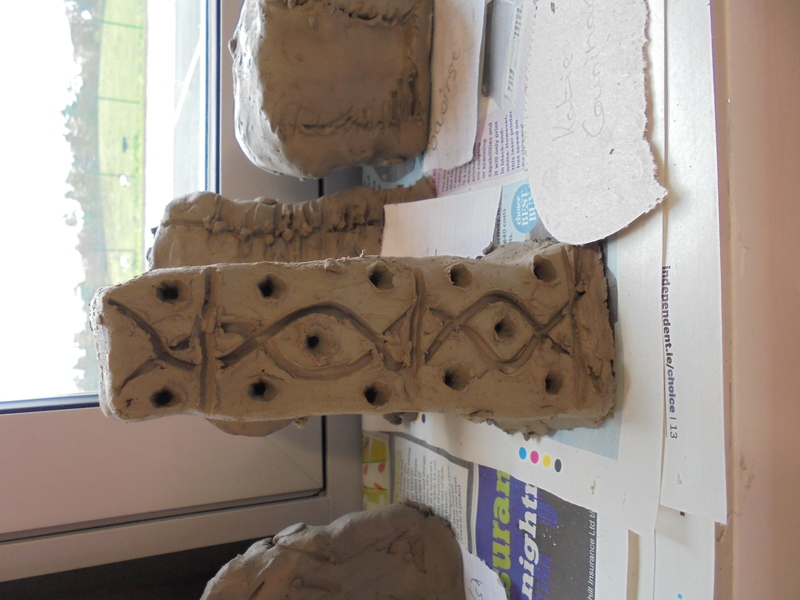 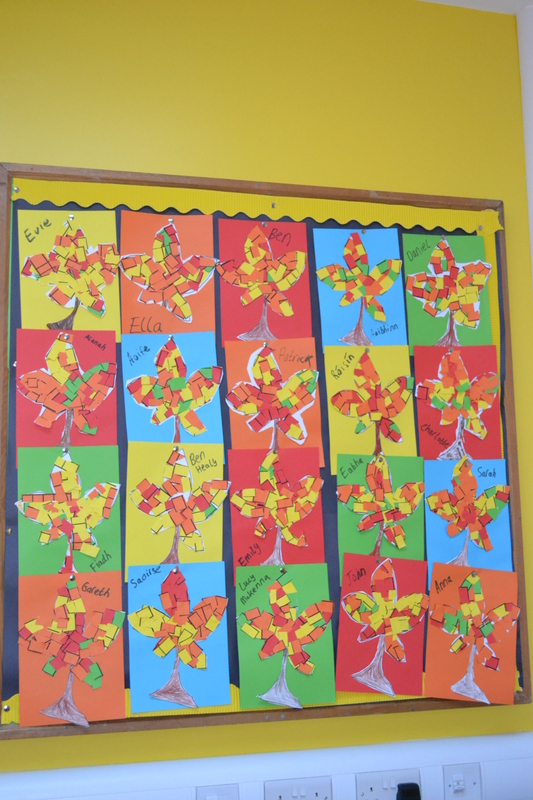 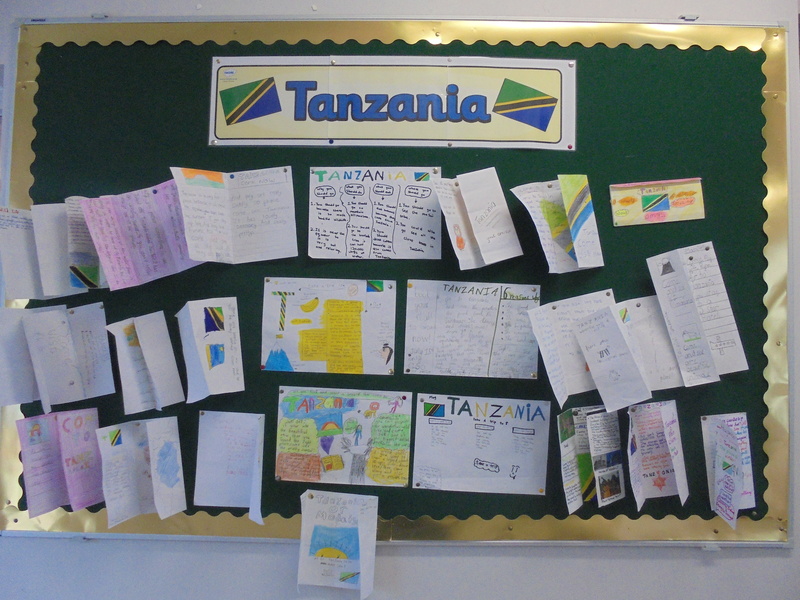 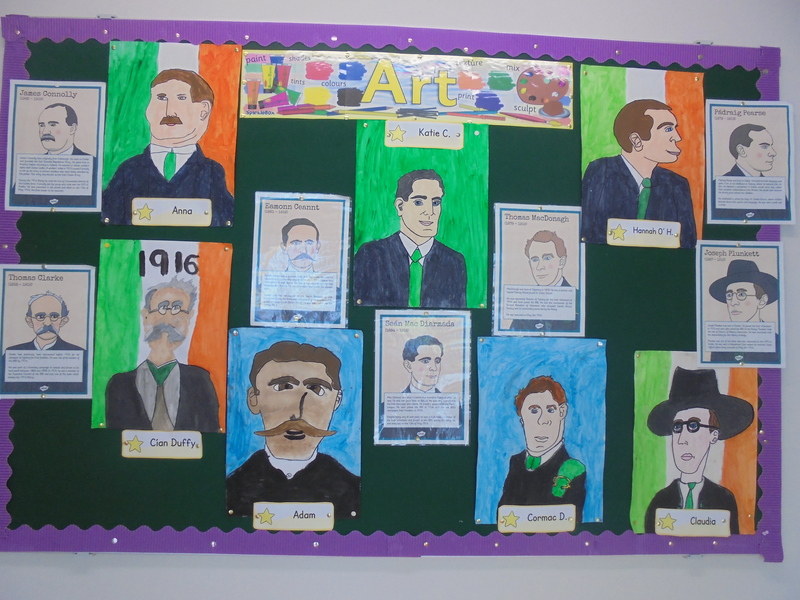 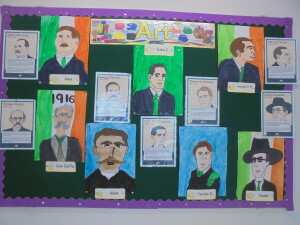 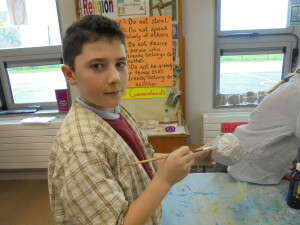 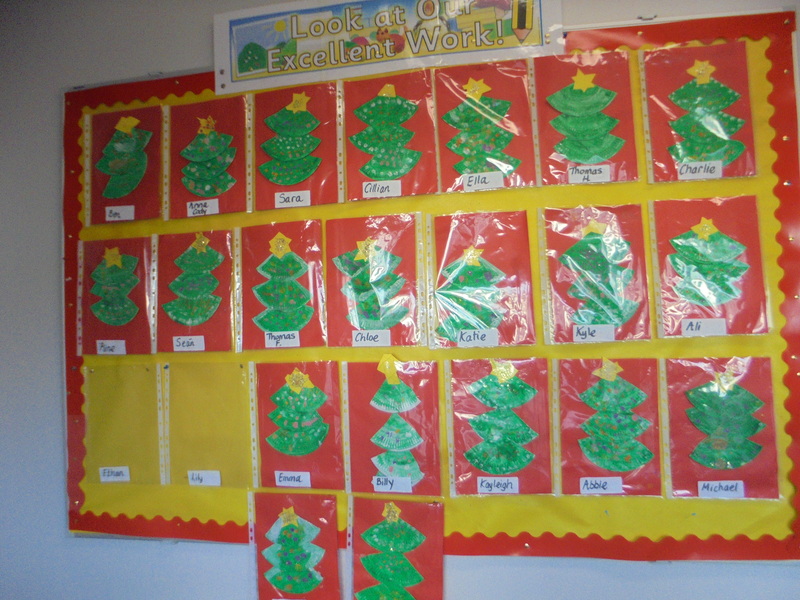 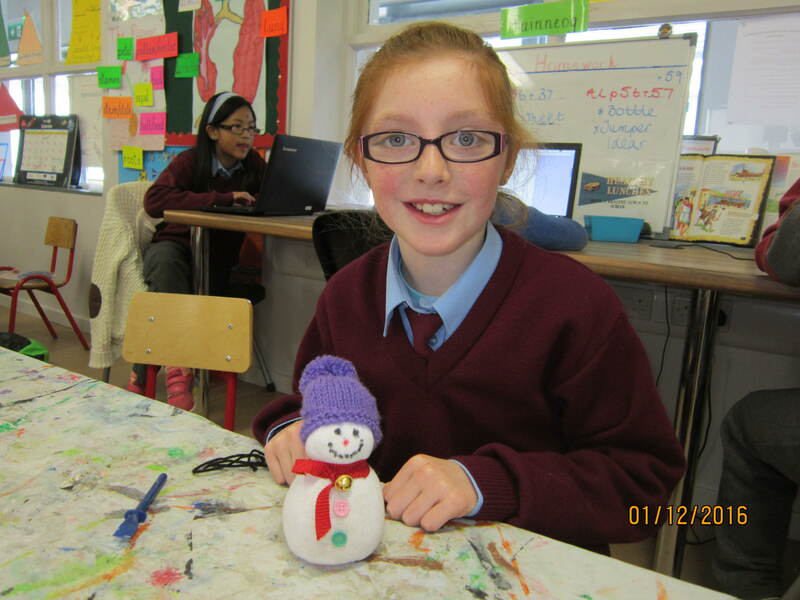 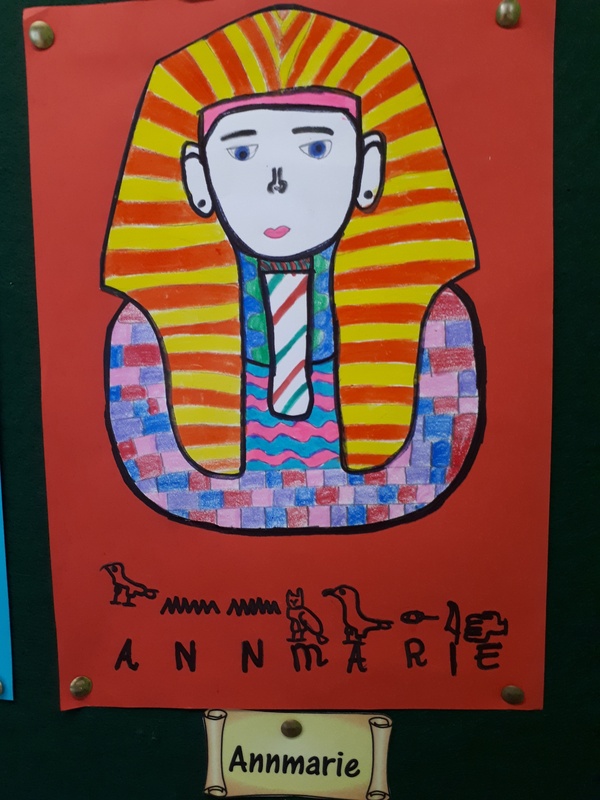 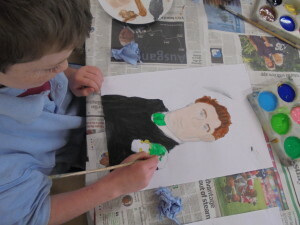 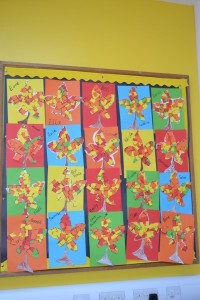 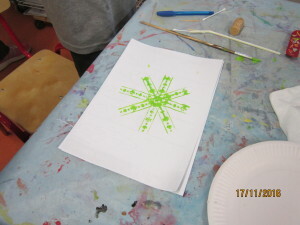 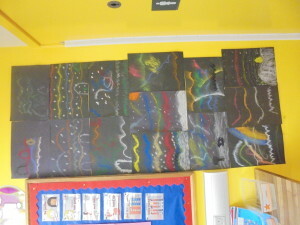 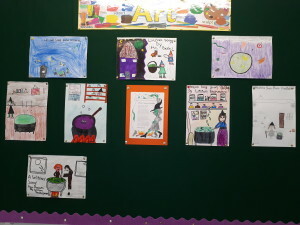 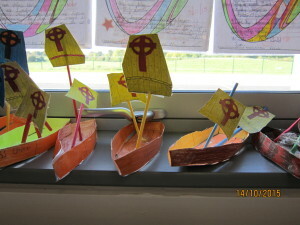 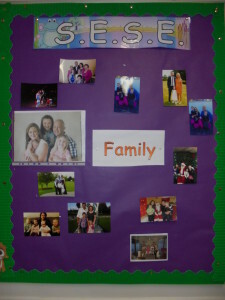 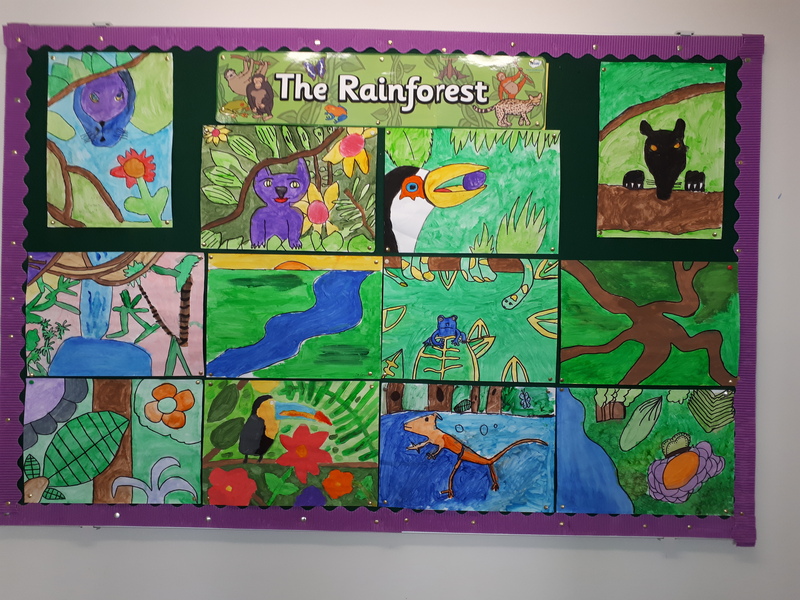 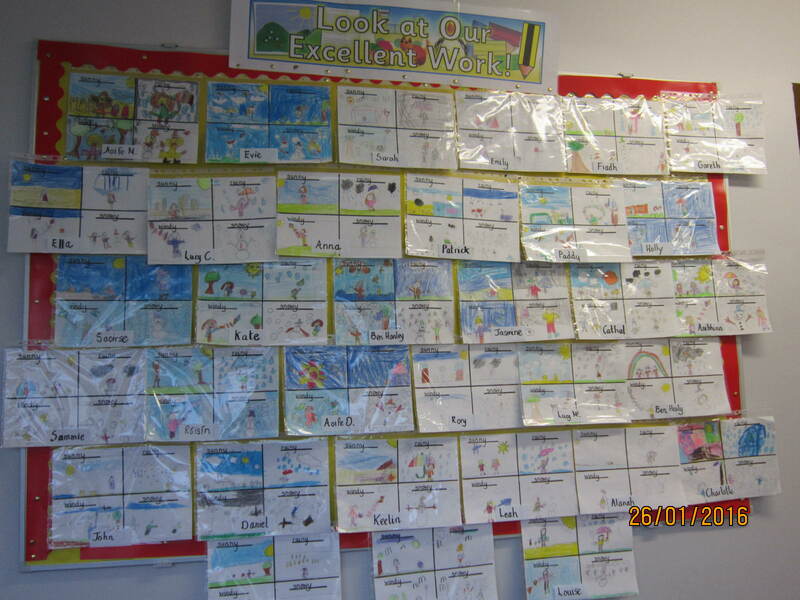 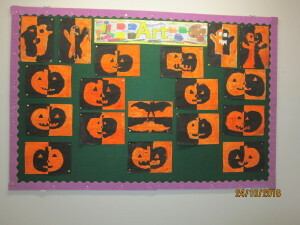 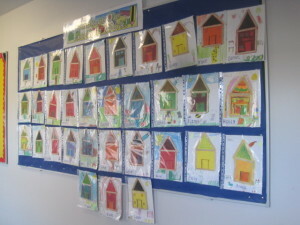 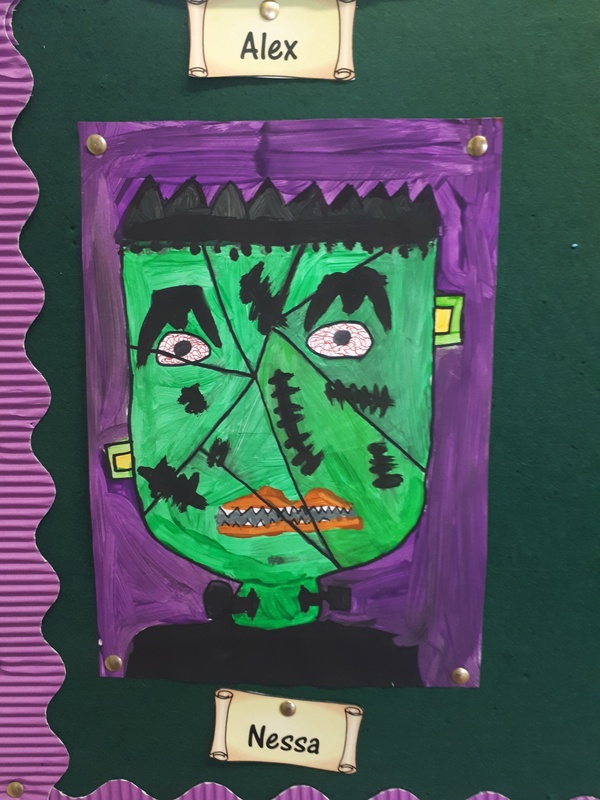 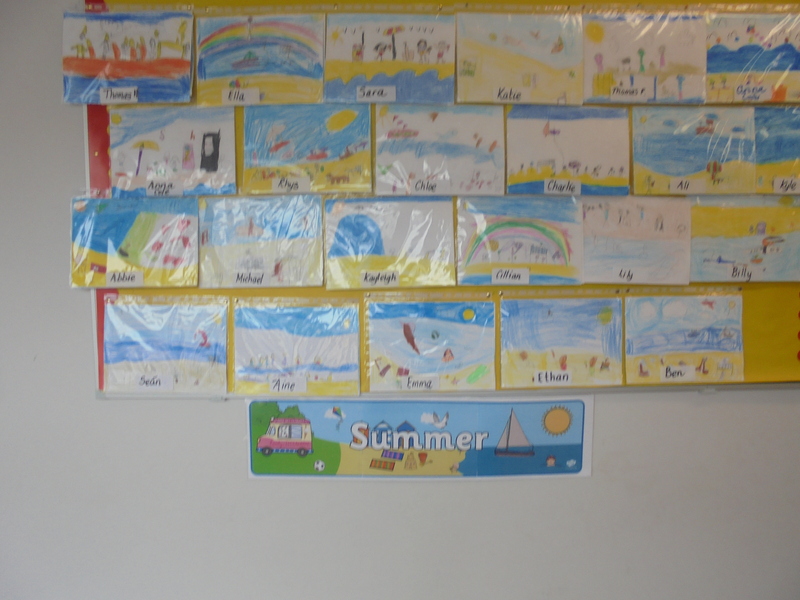 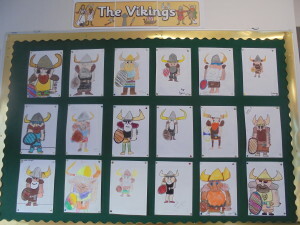 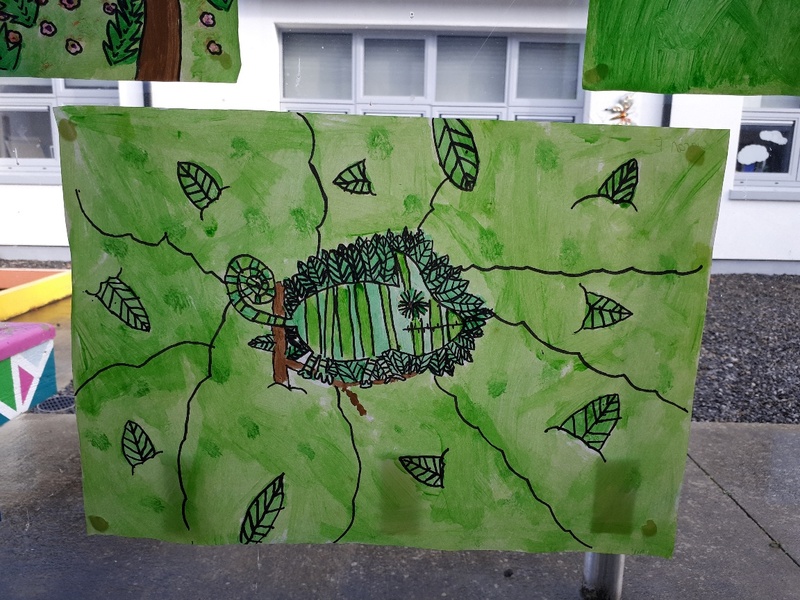 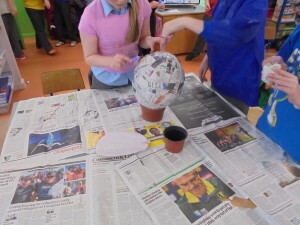 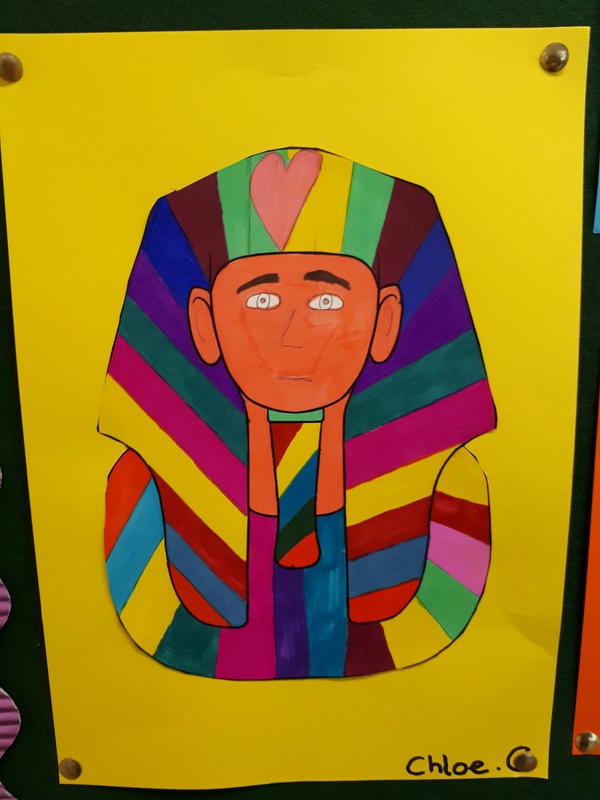 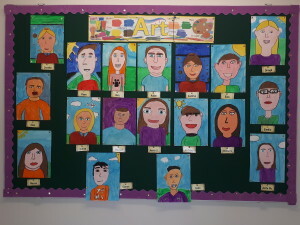 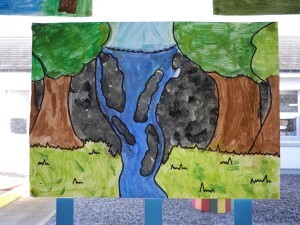 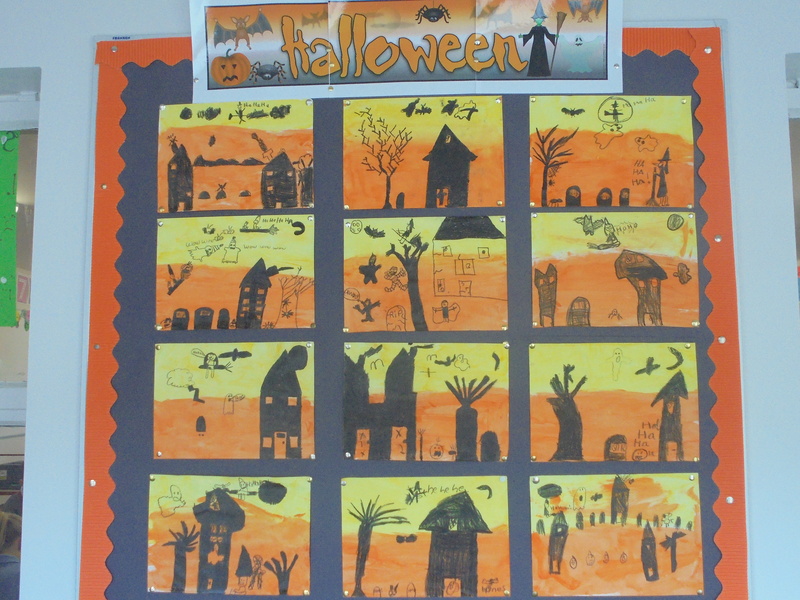 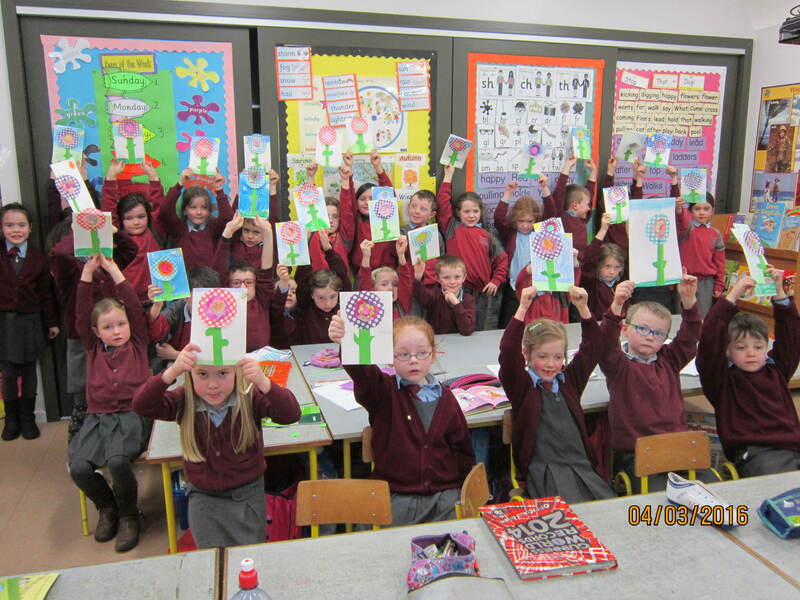 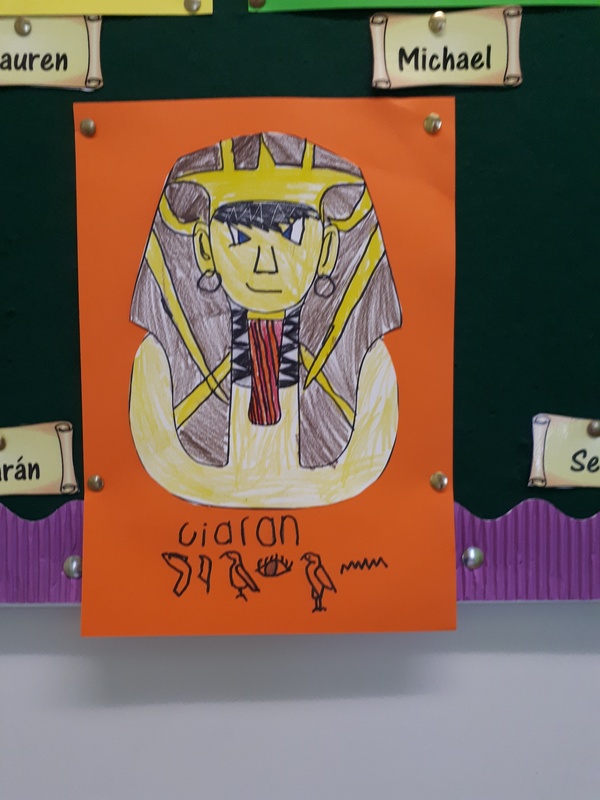 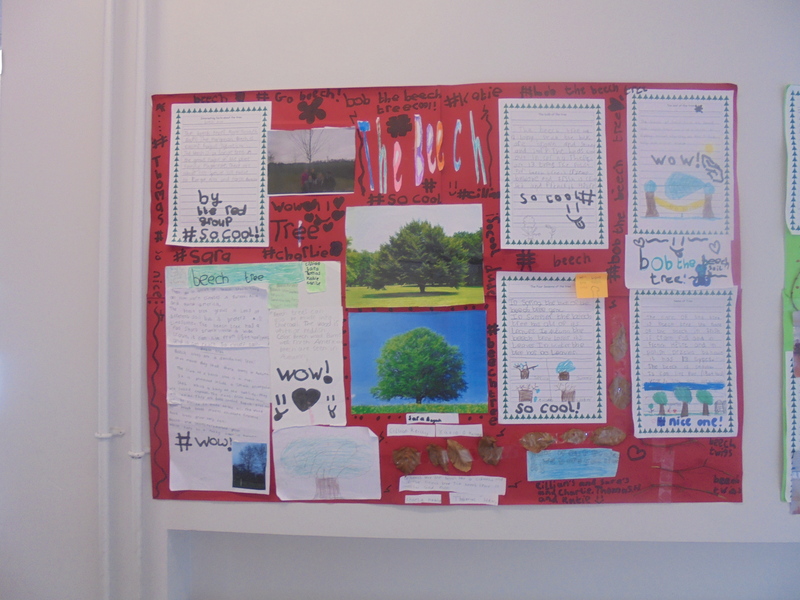 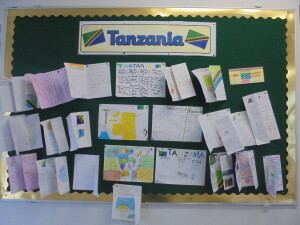 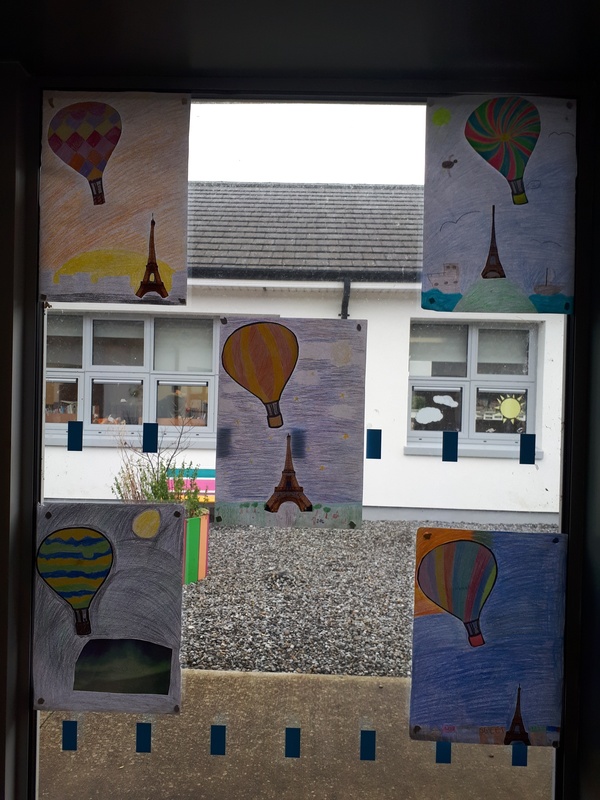 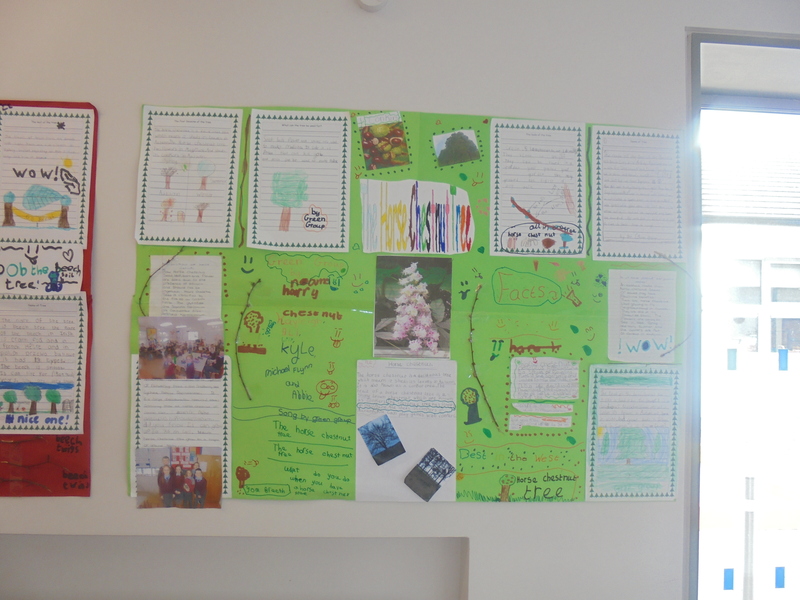 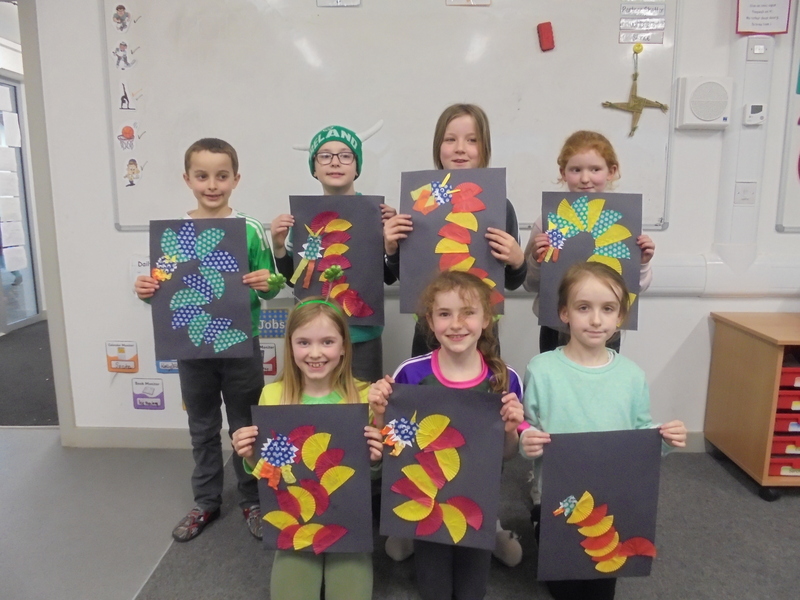 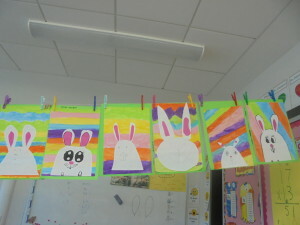 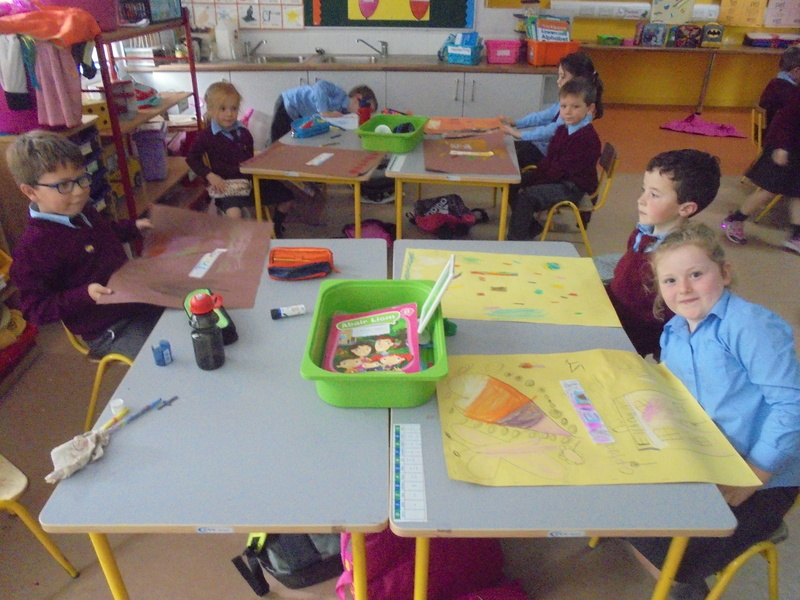 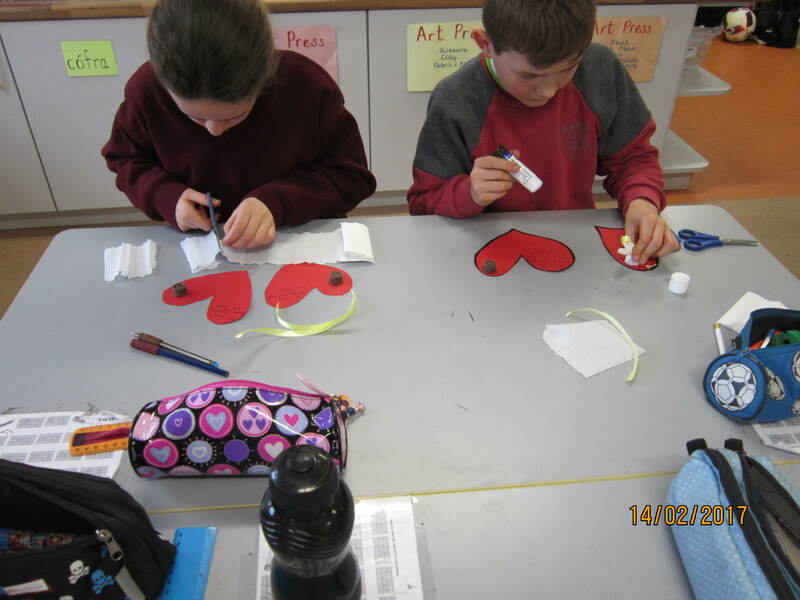 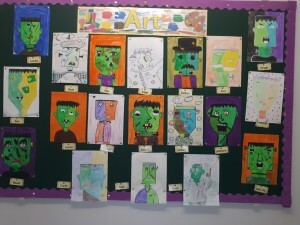 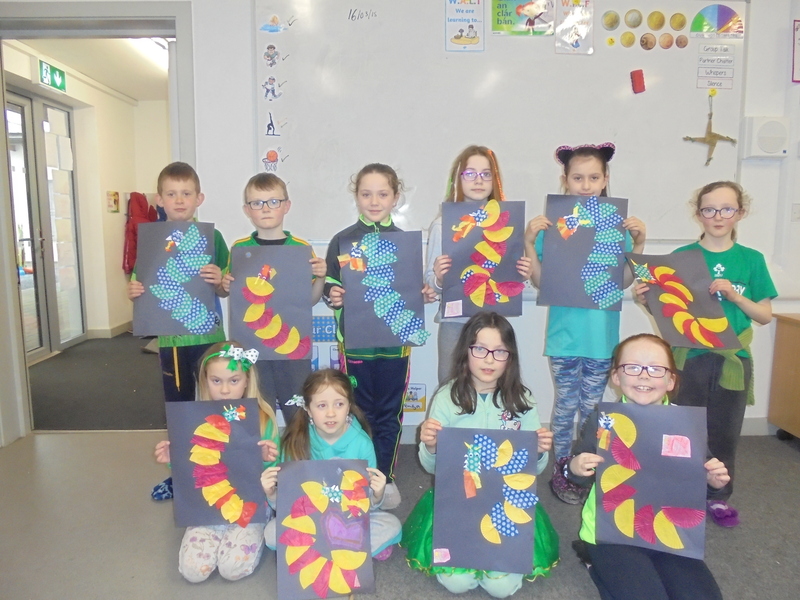 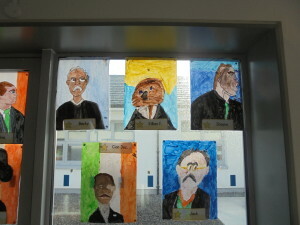 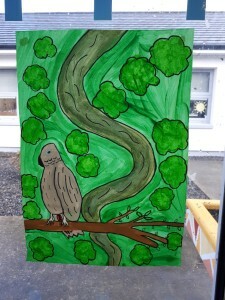 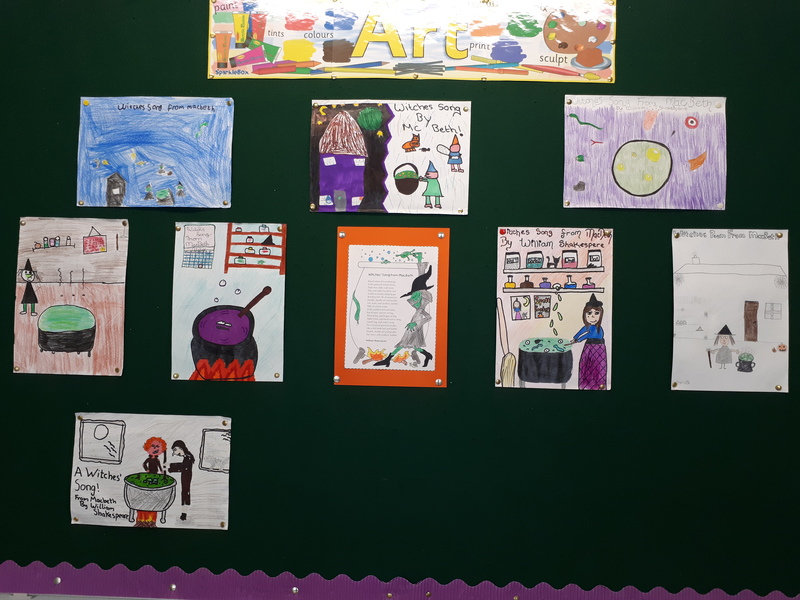 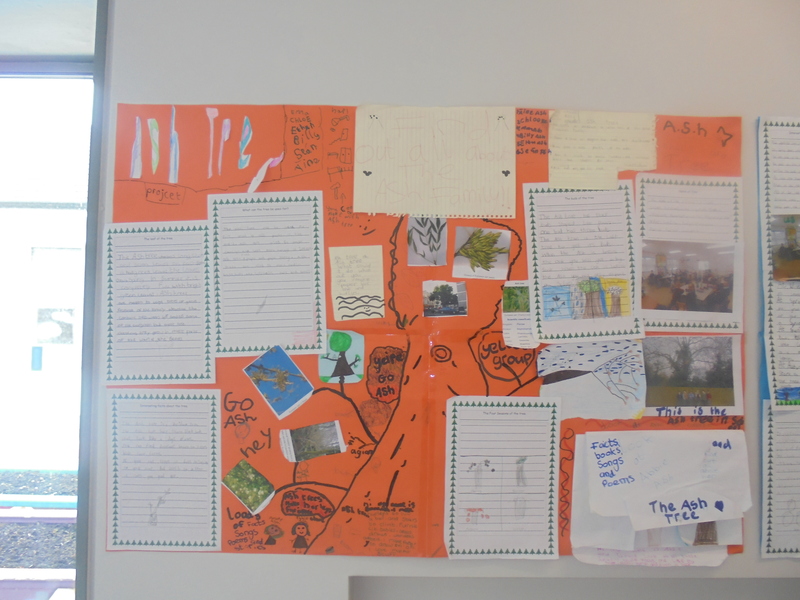 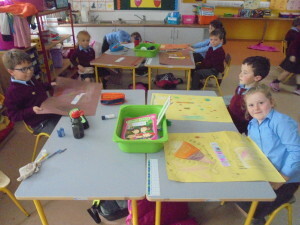 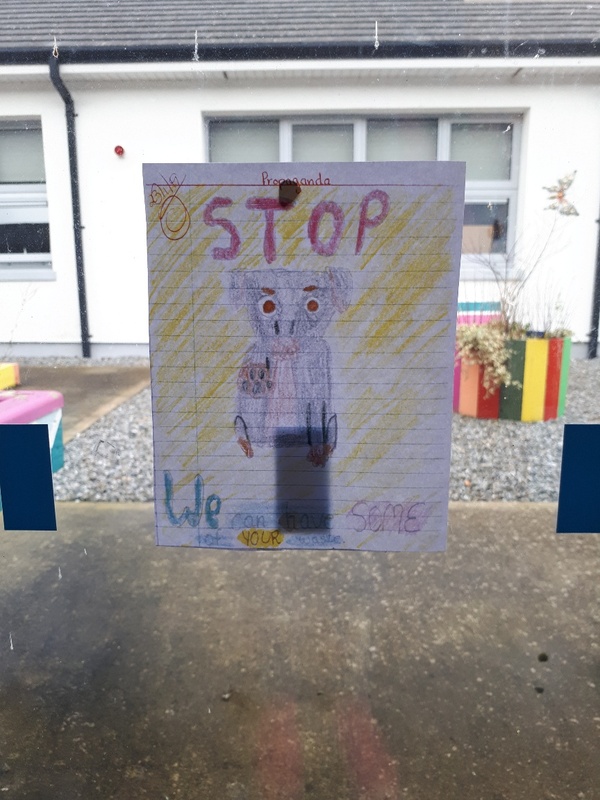 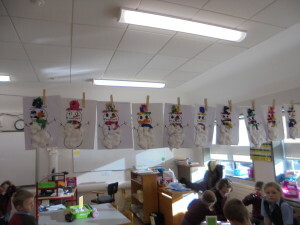 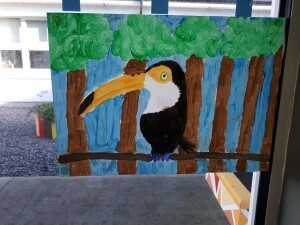 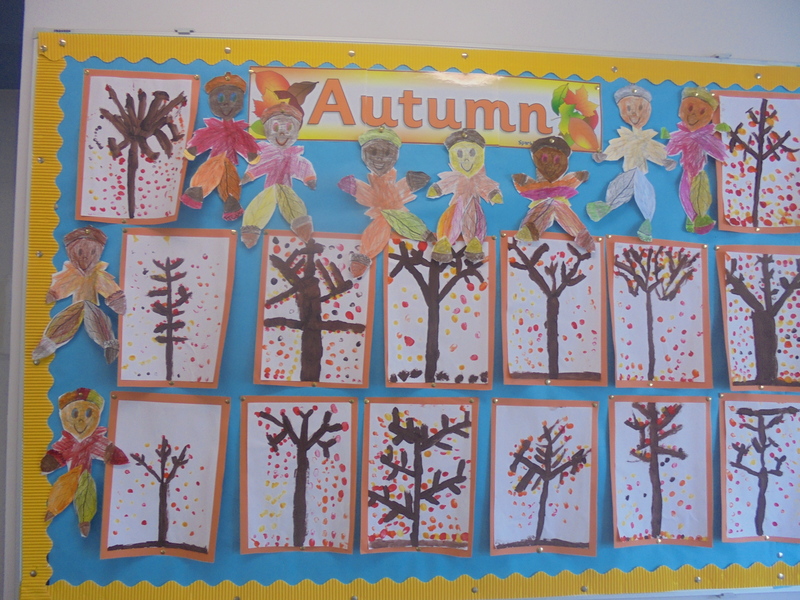 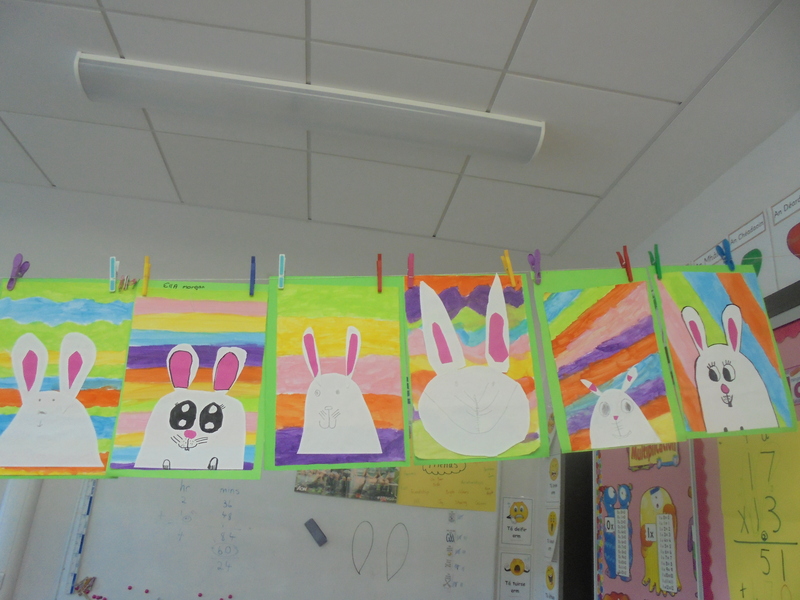 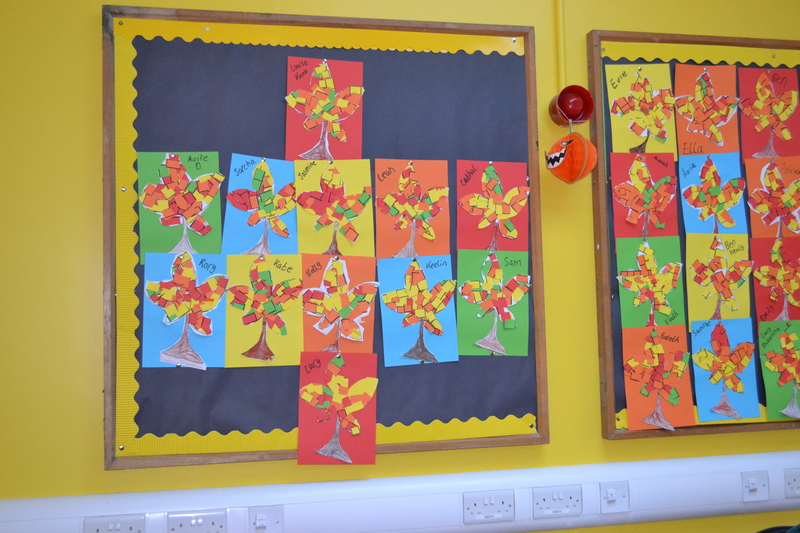 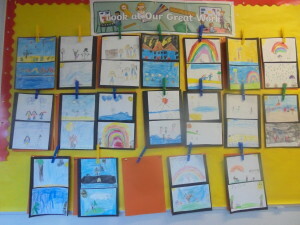 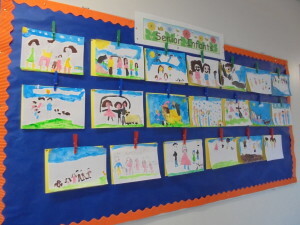 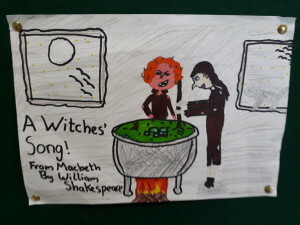 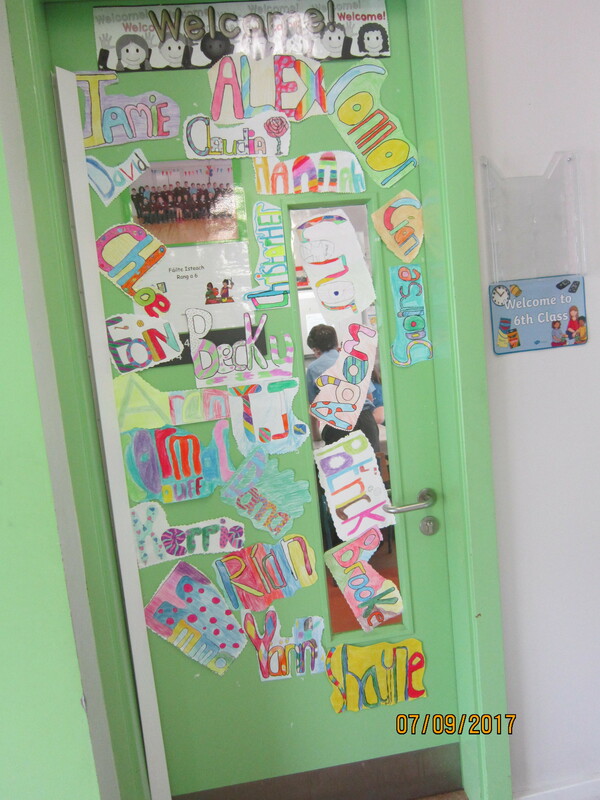 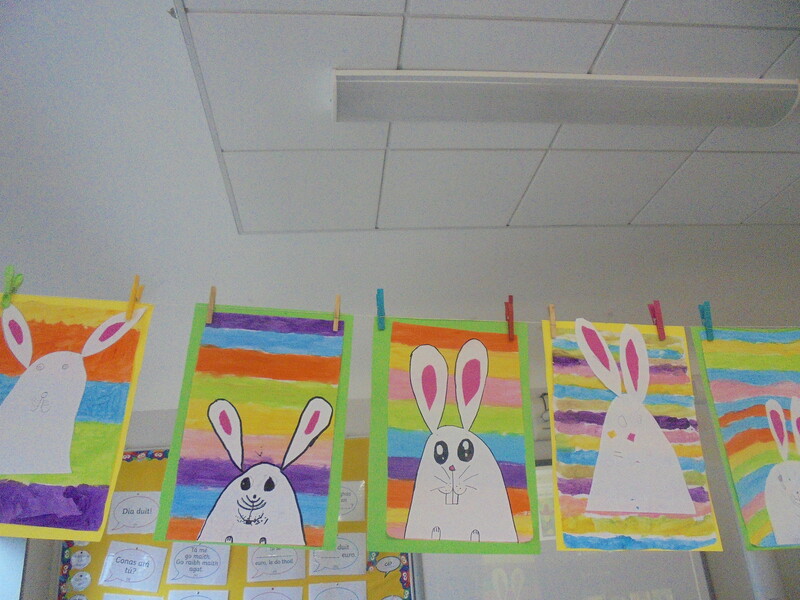 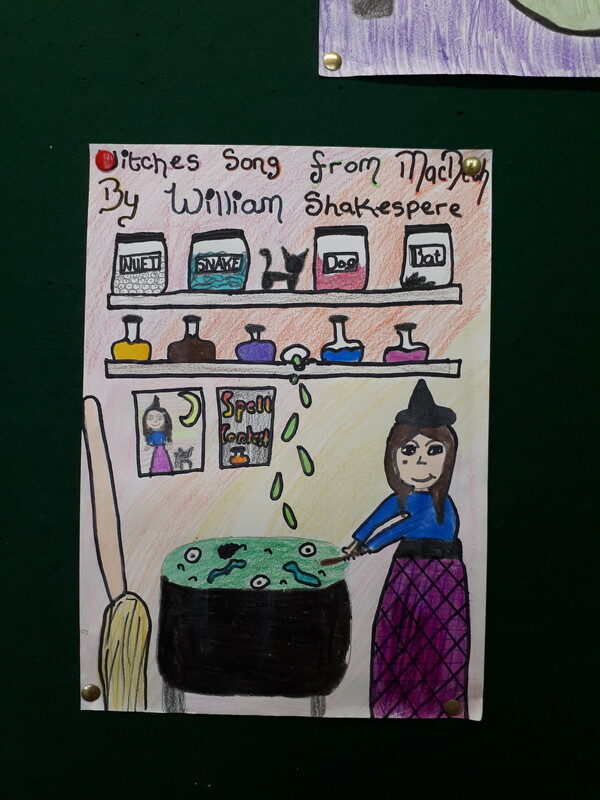 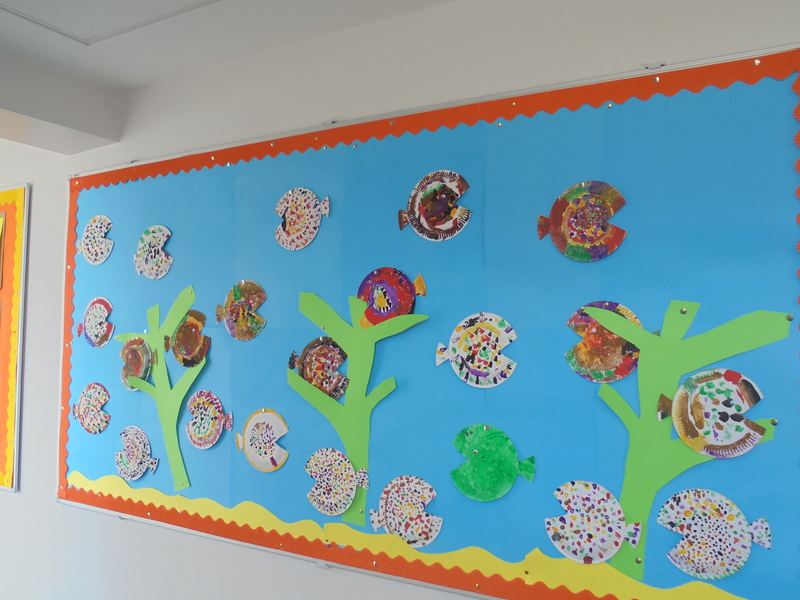 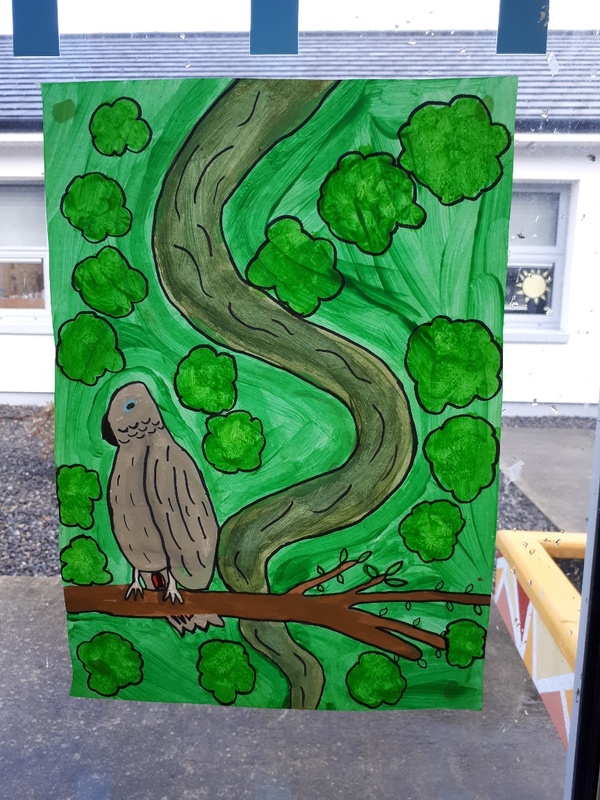 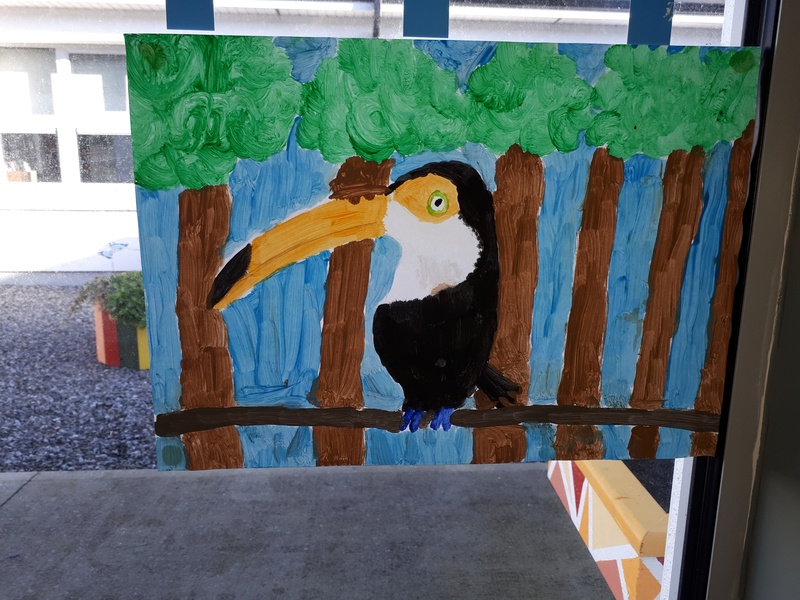 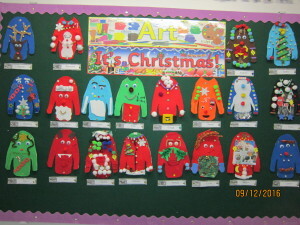 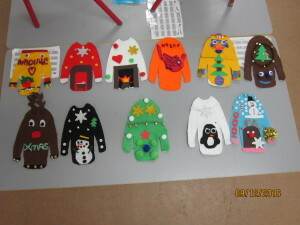 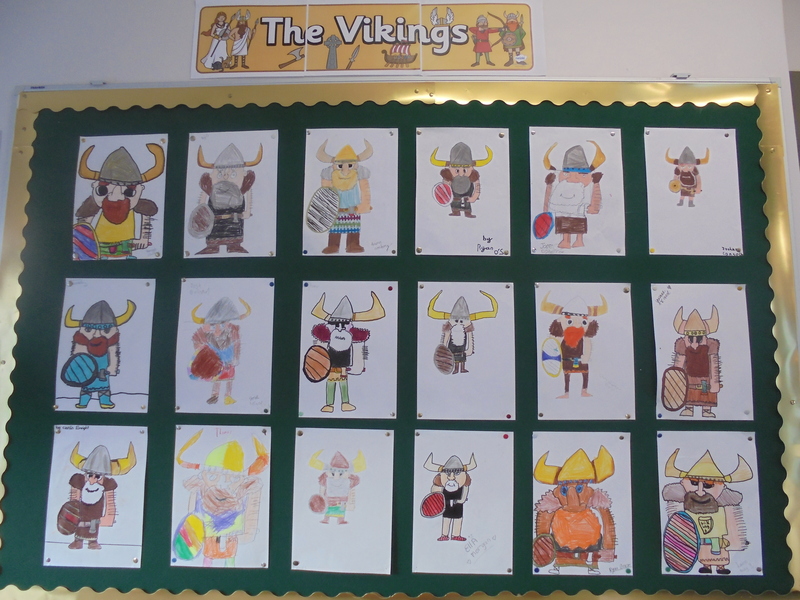 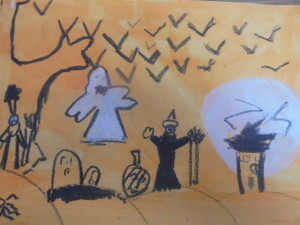 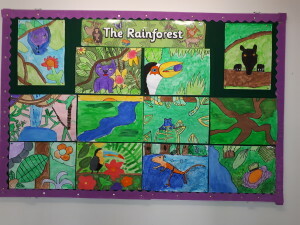 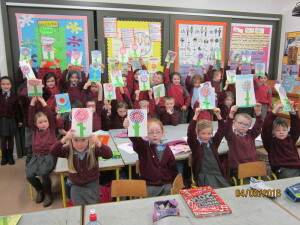 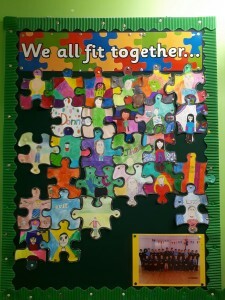 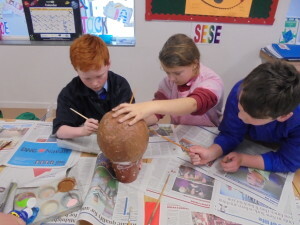 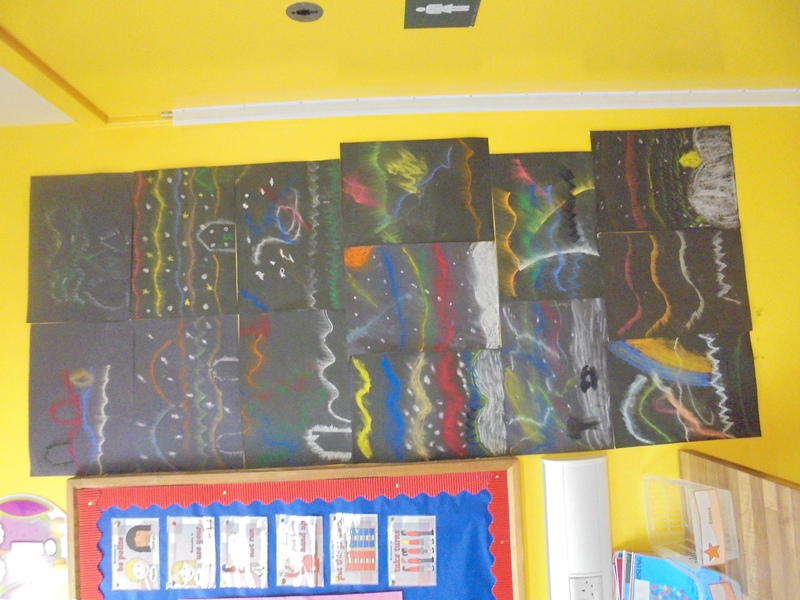 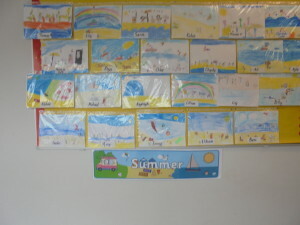 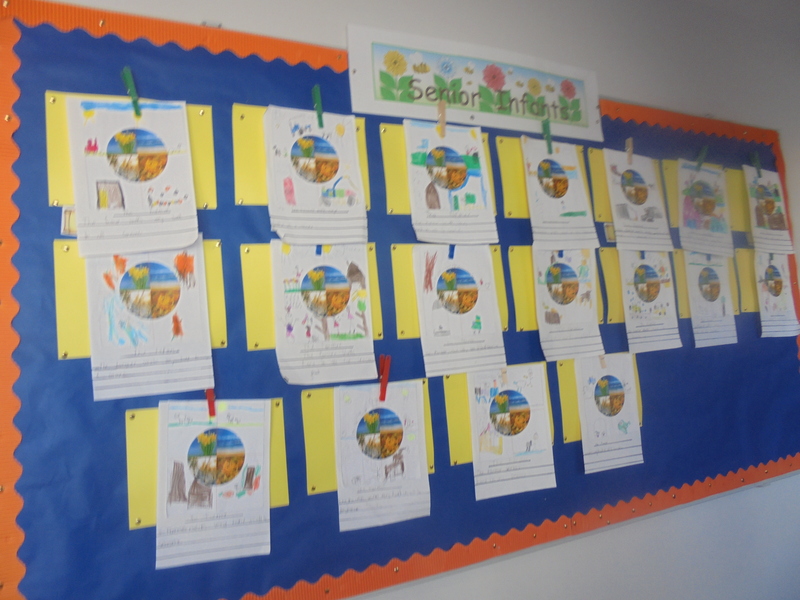 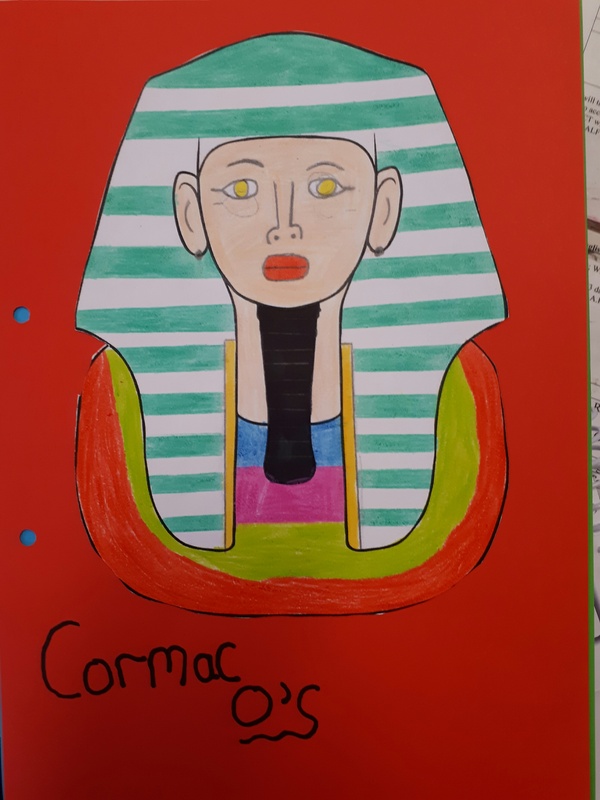 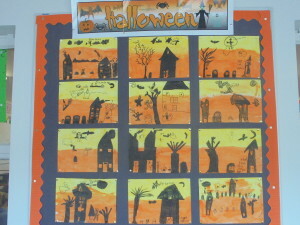 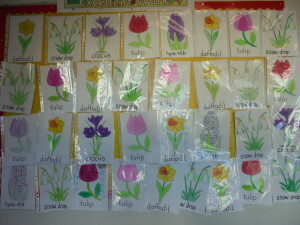 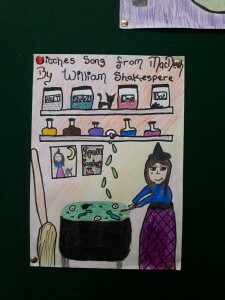 Ms Murphy’s 6th class enjoyed doing their art work during September. 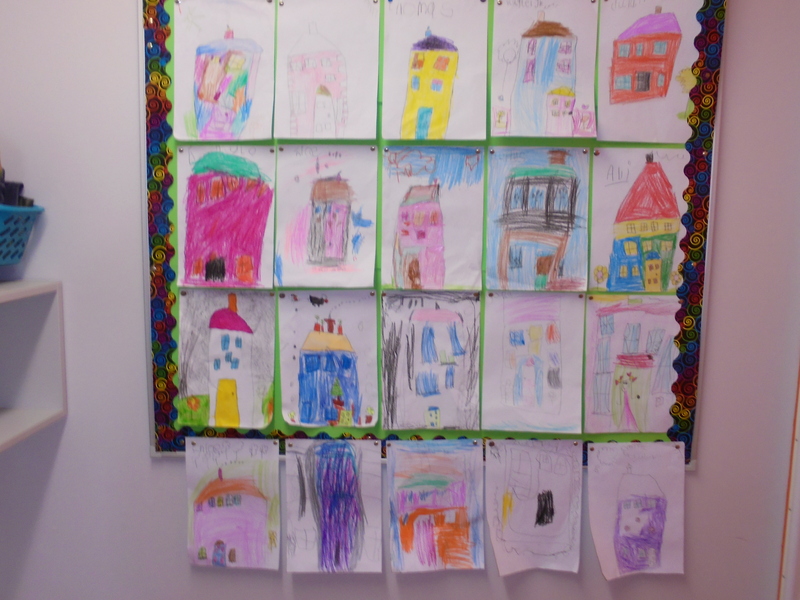 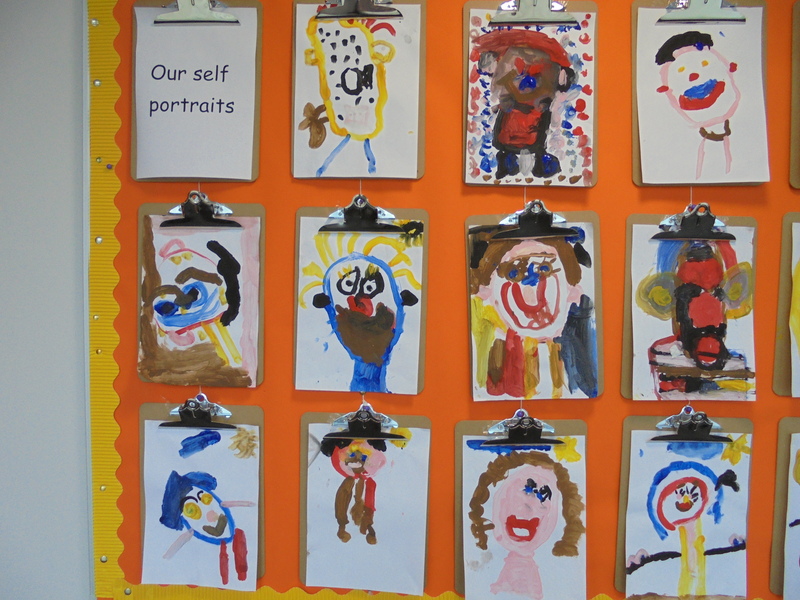 They drew self portraits and their names in bubble letters and made a writing wall where they have been learning about Narrative Writing!!! 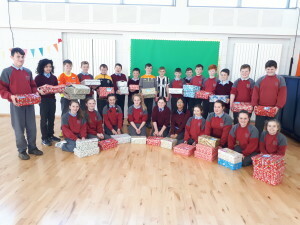 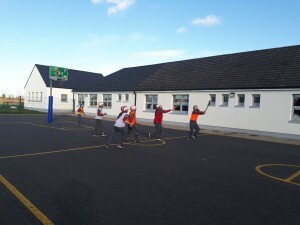 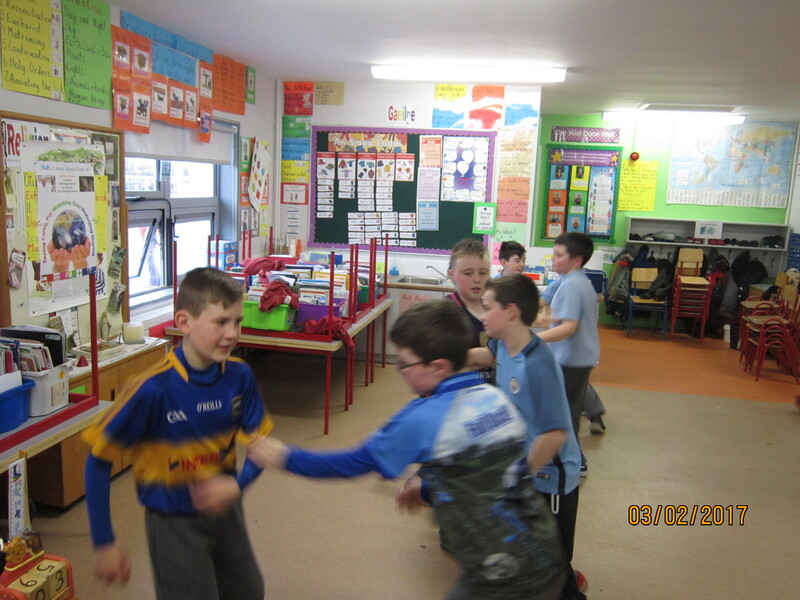 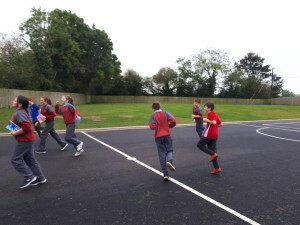 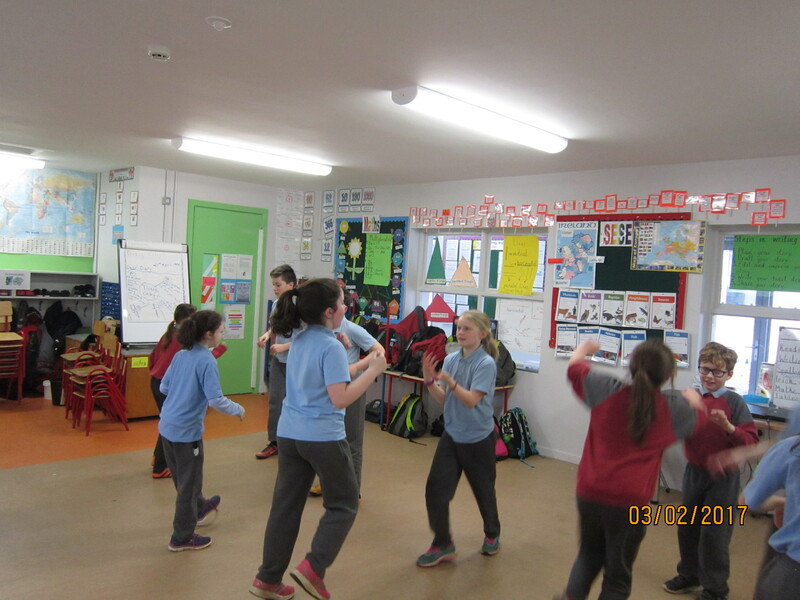 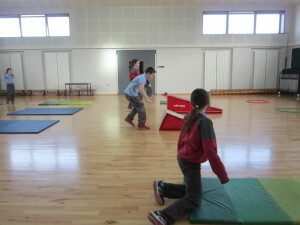 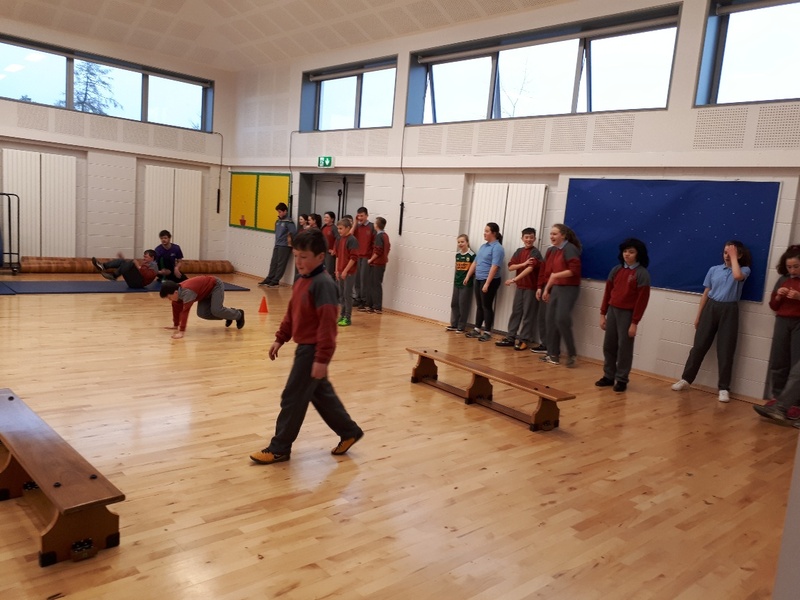 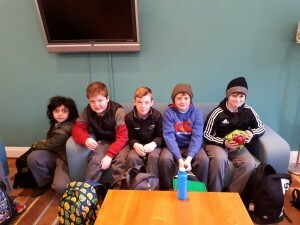 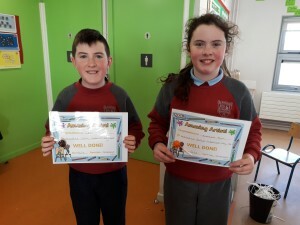 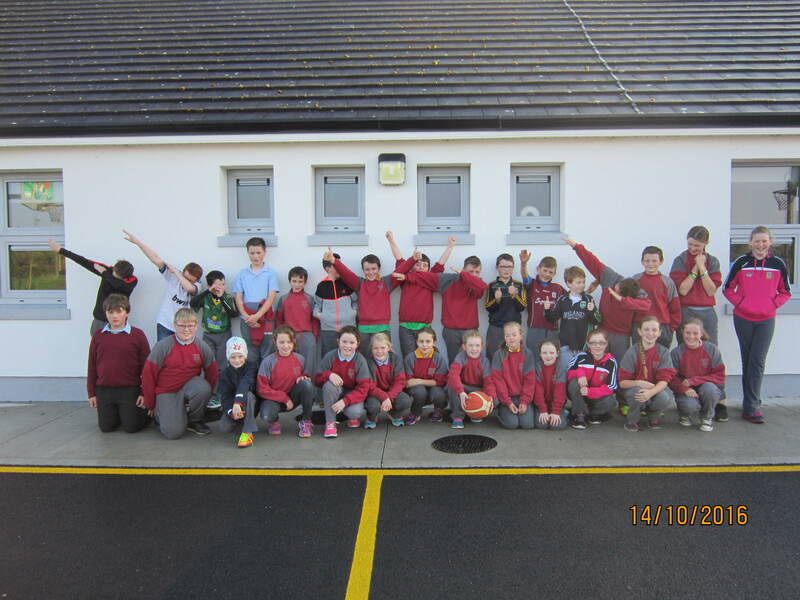 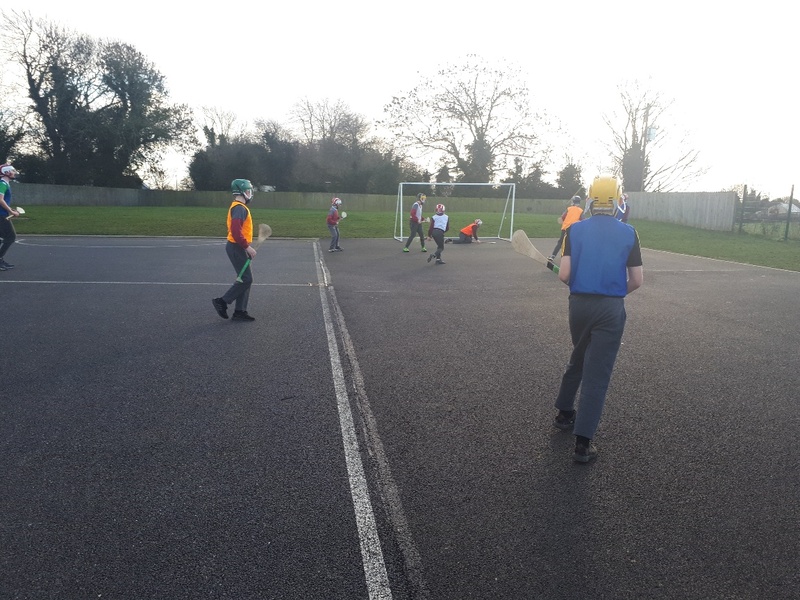 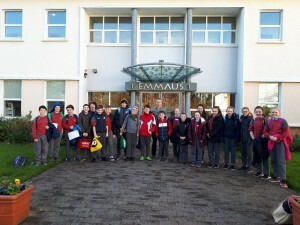 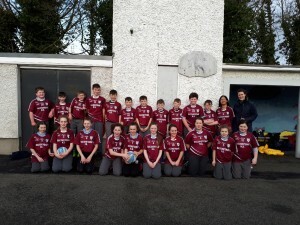 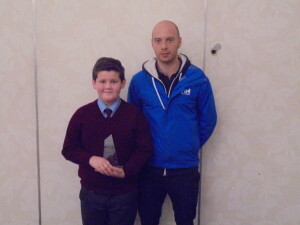 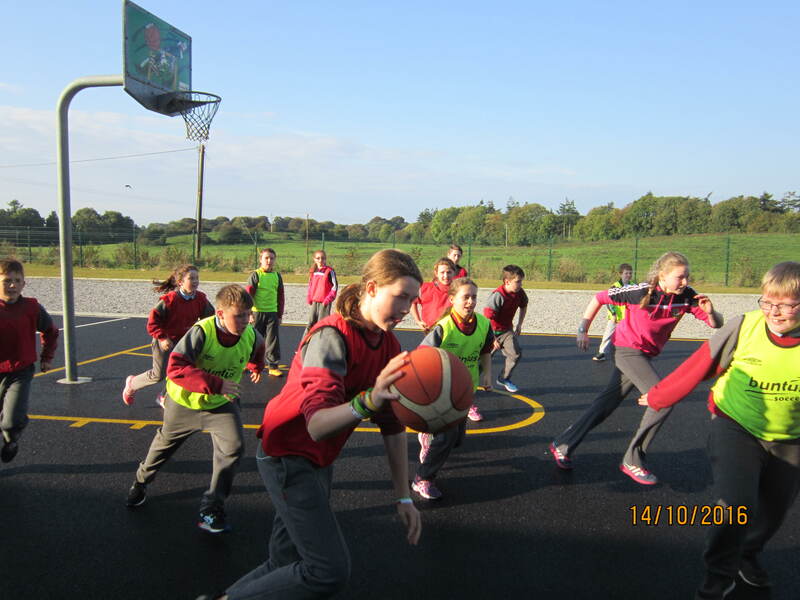 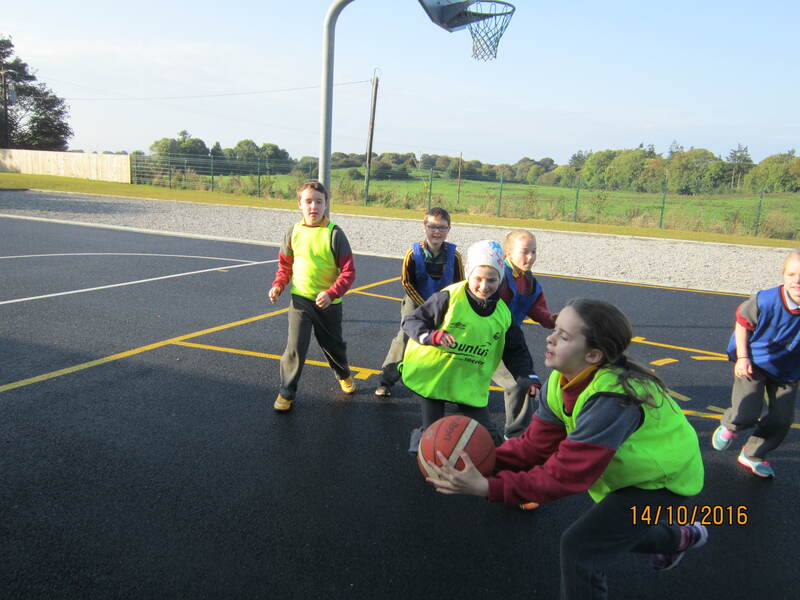 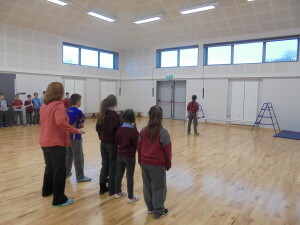 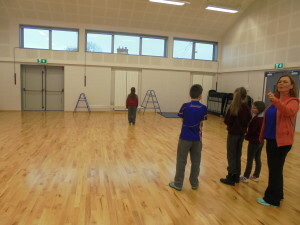 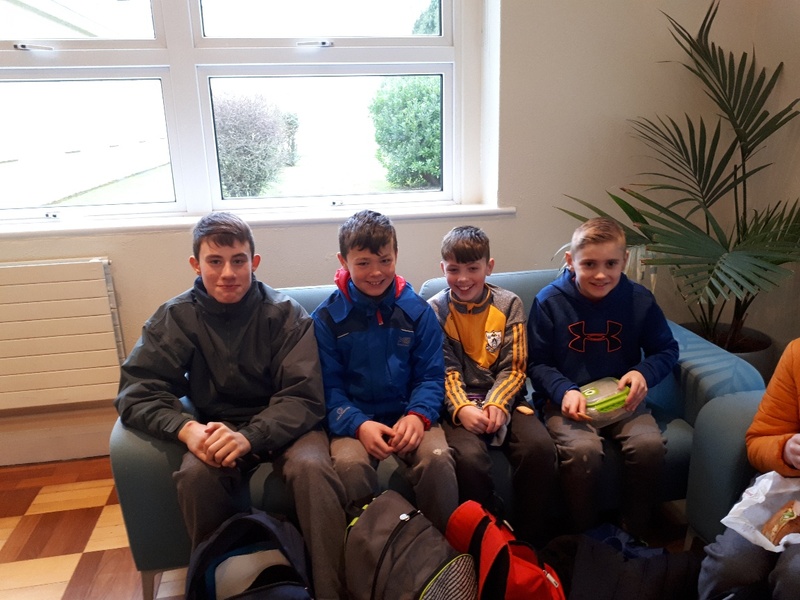 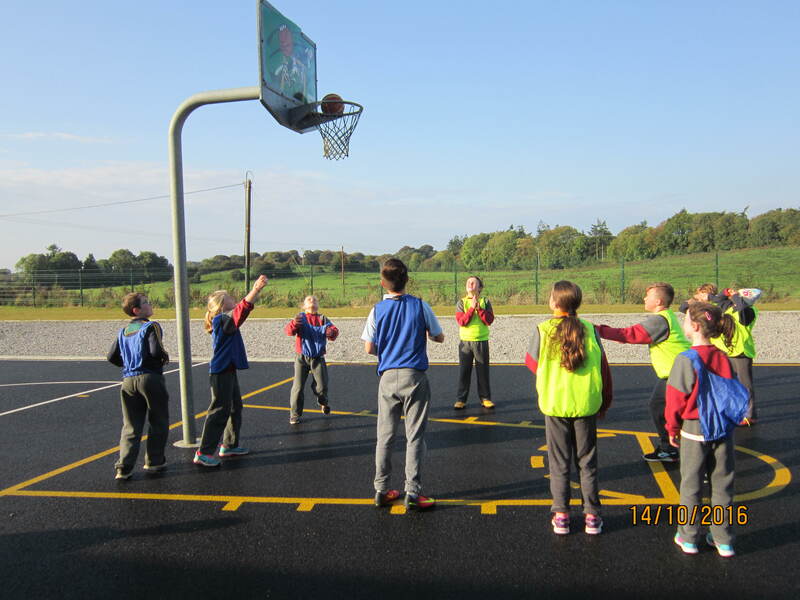 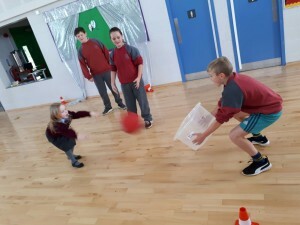 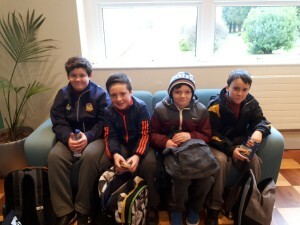 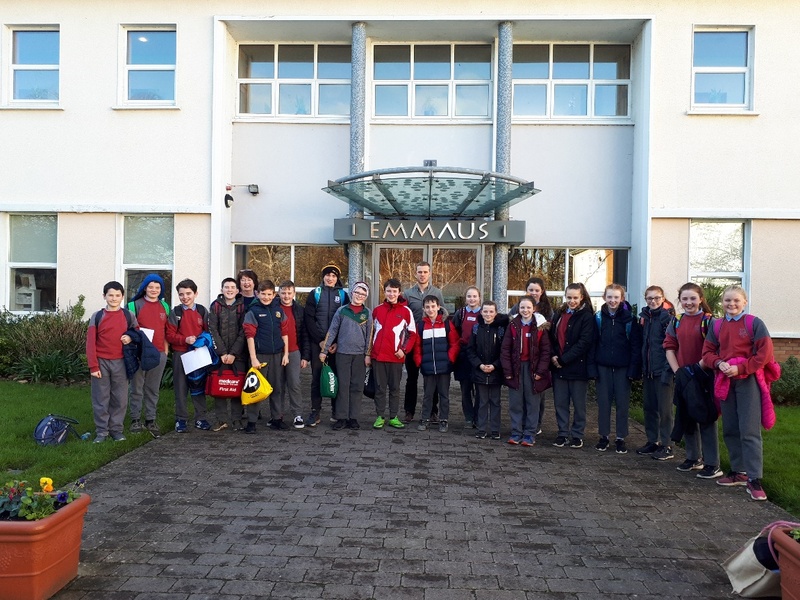 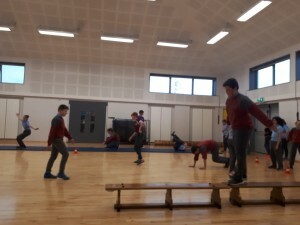 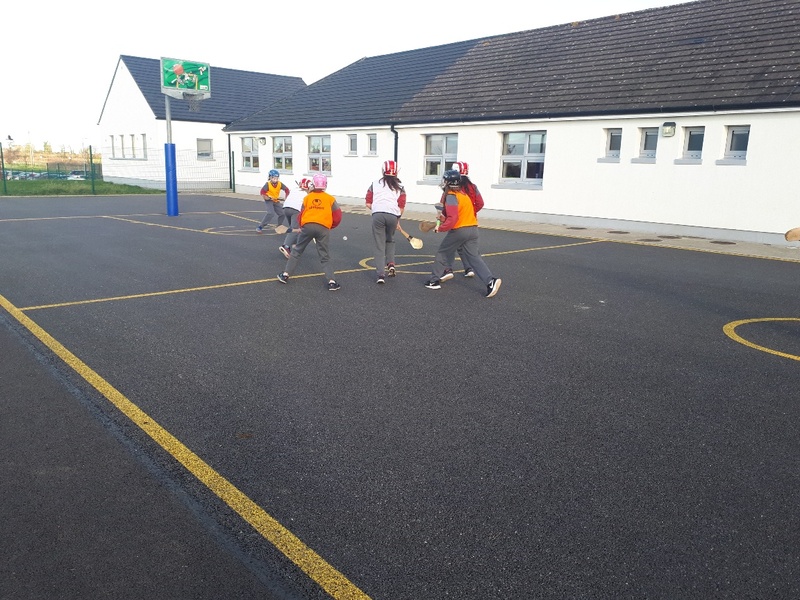 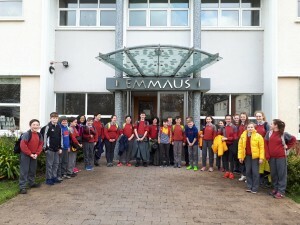 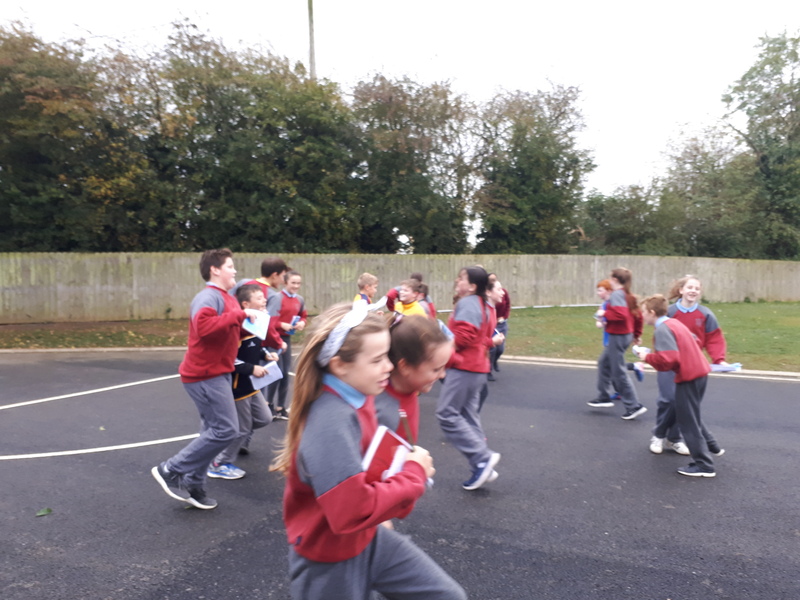 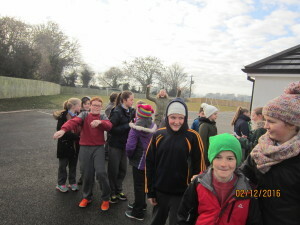 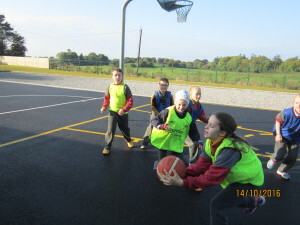 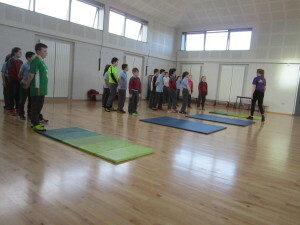 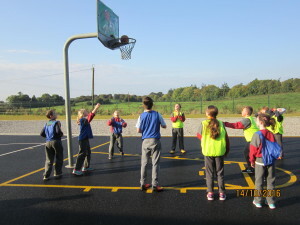 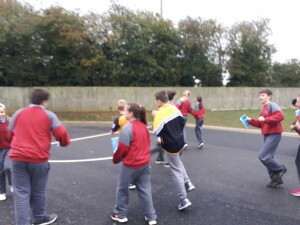 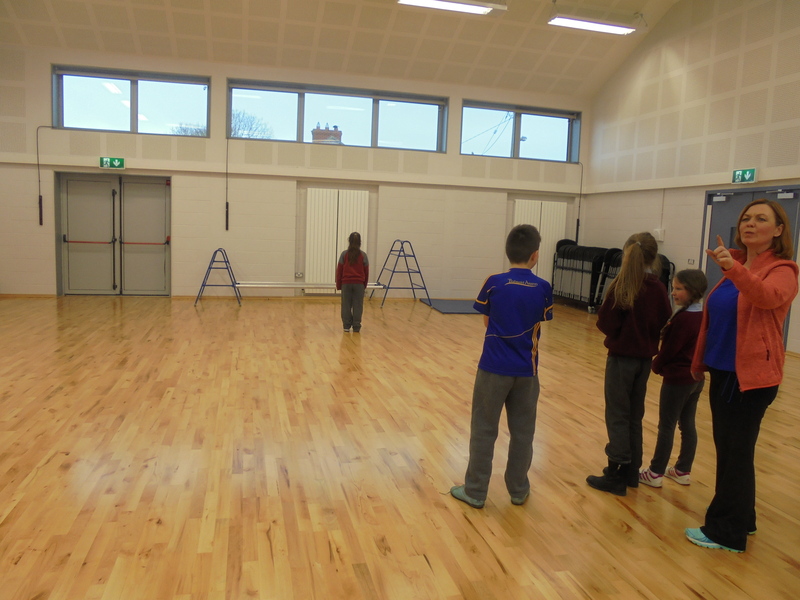 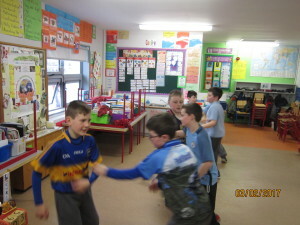 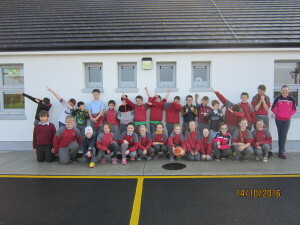 4th, 5th and 6th Class played basketball during our first term. 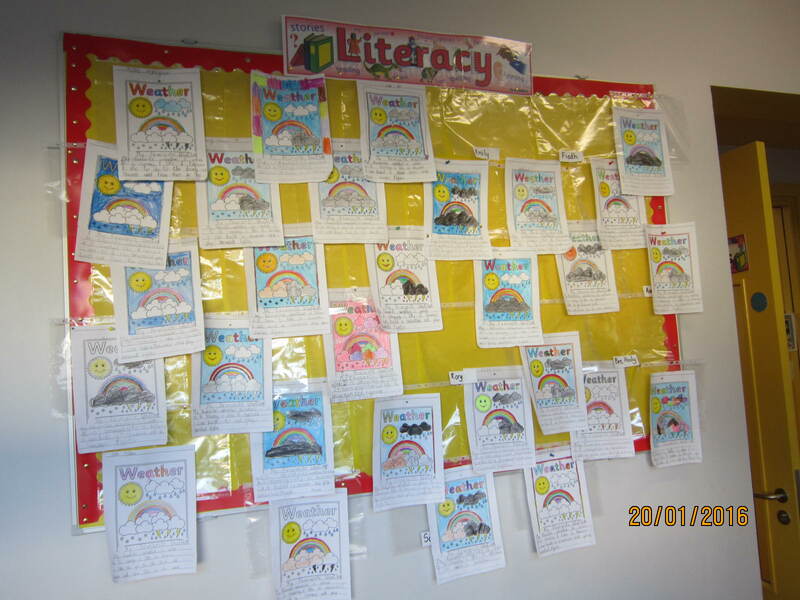 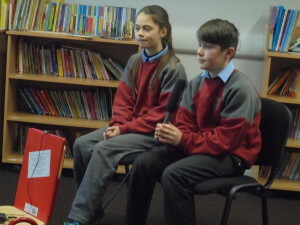 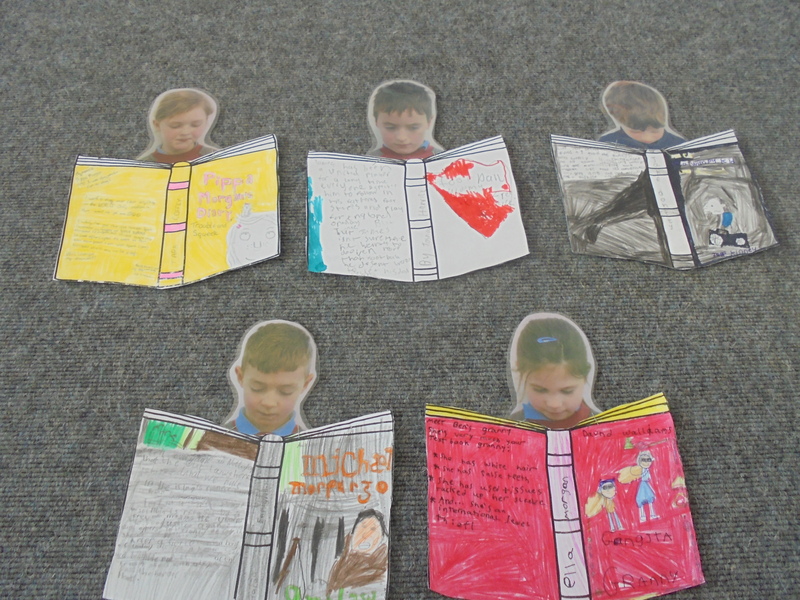 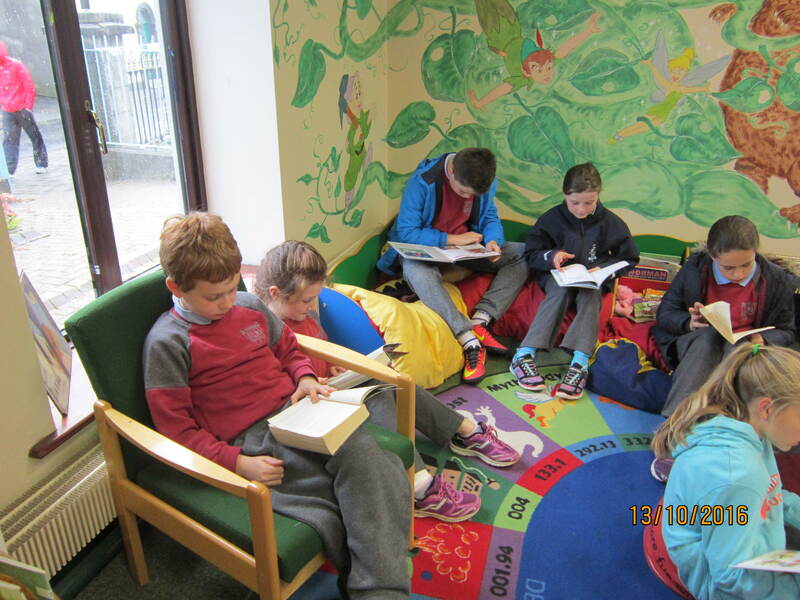 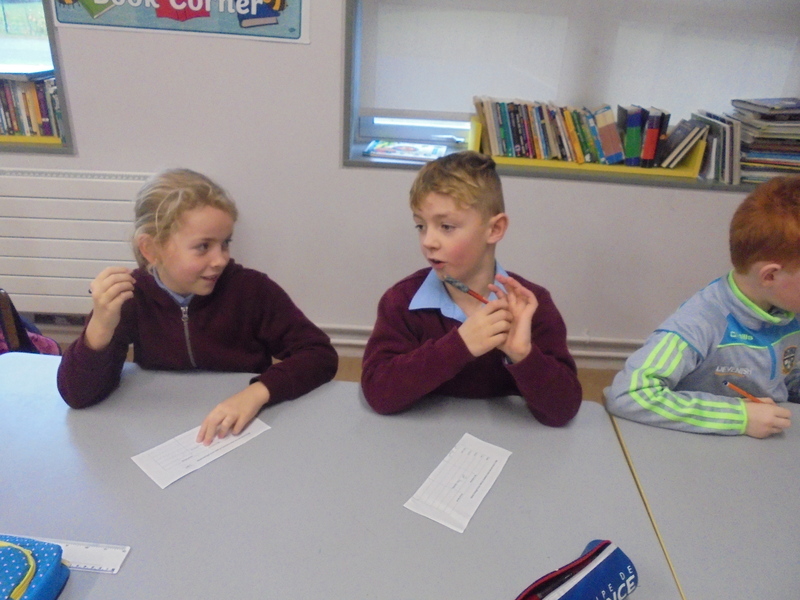 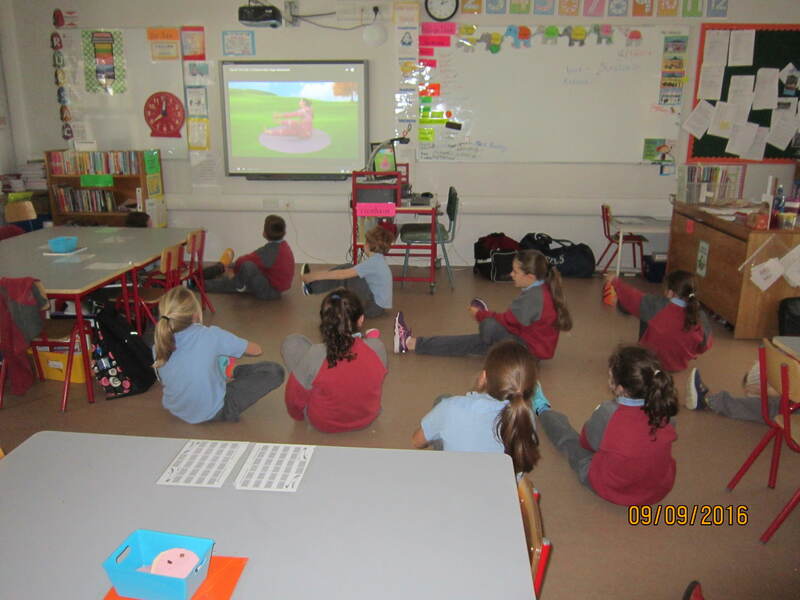 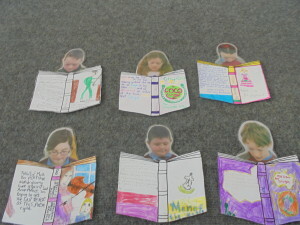 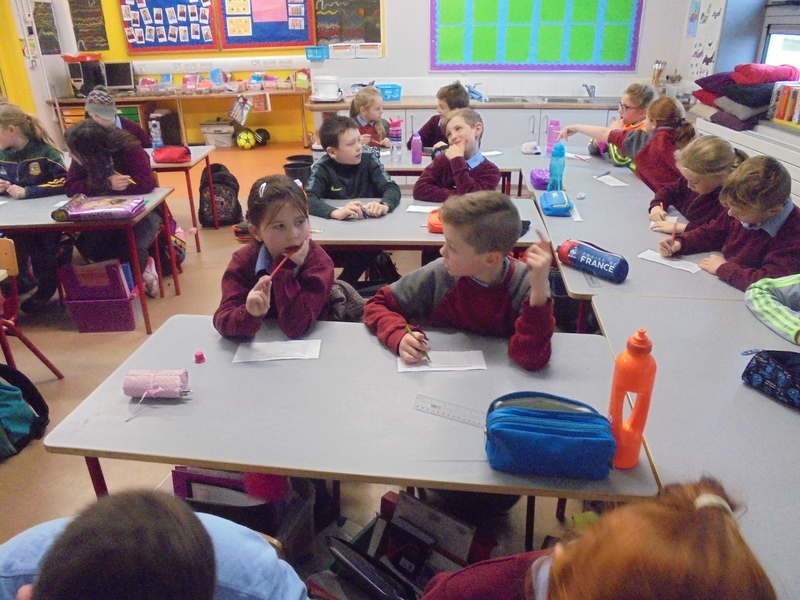 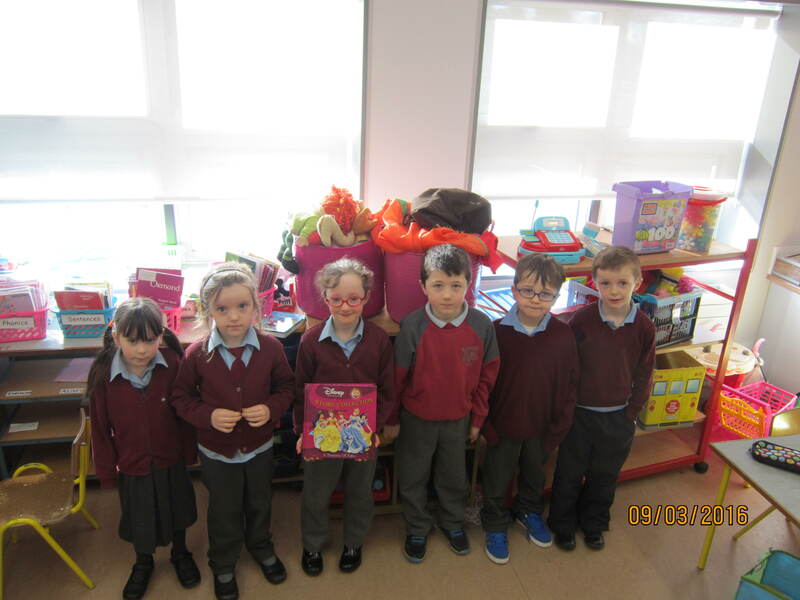 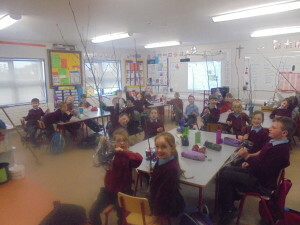 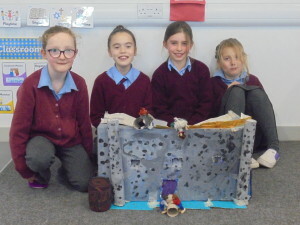 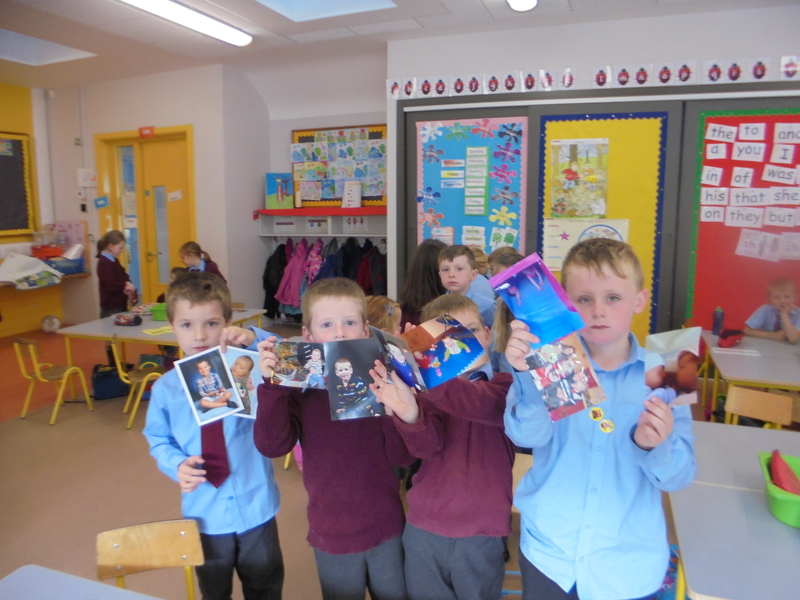 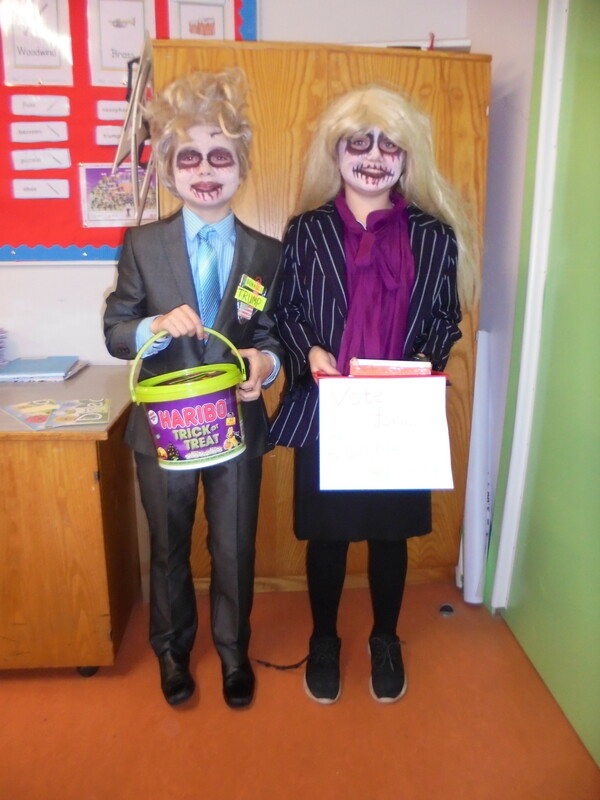 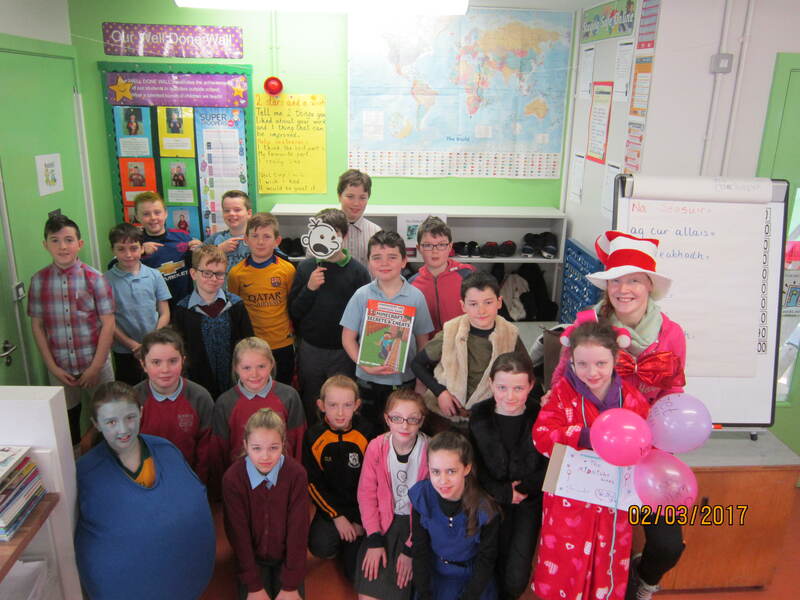 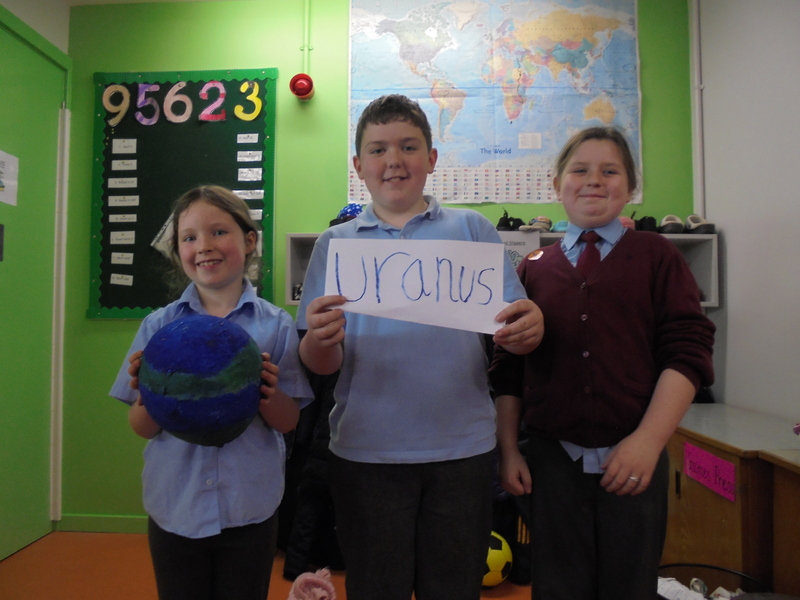 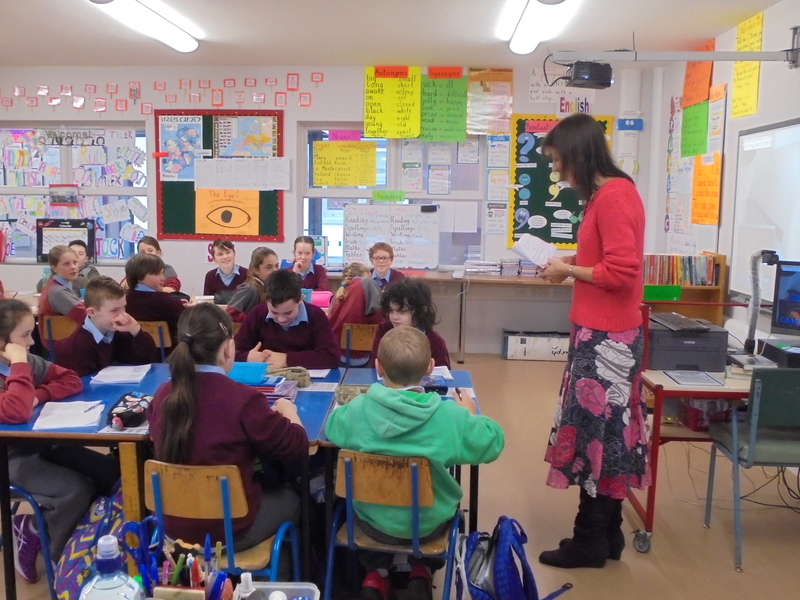 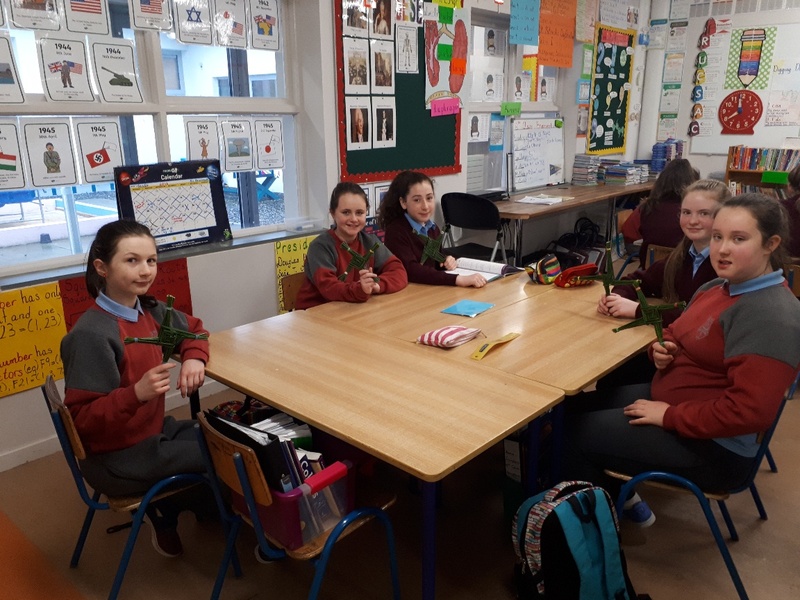 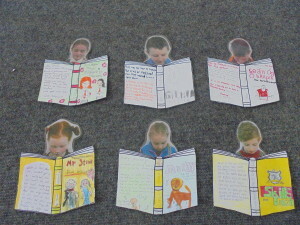 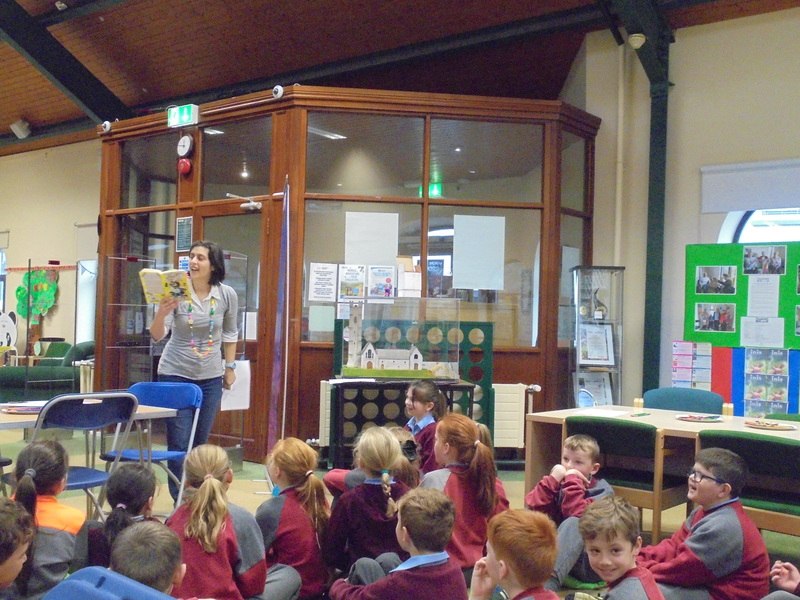 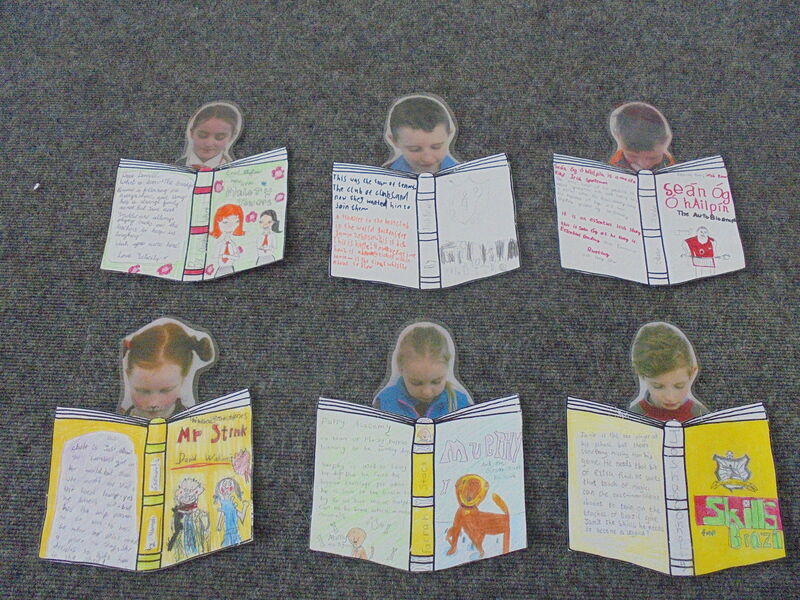 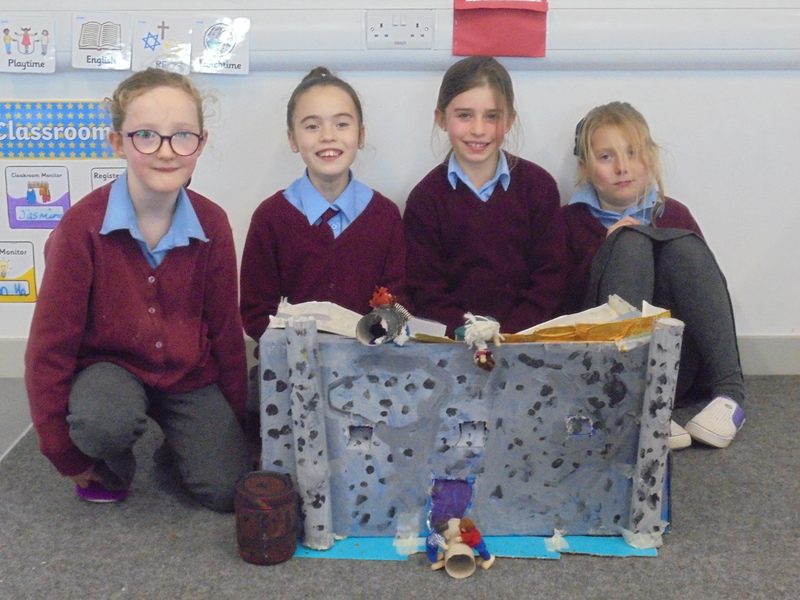 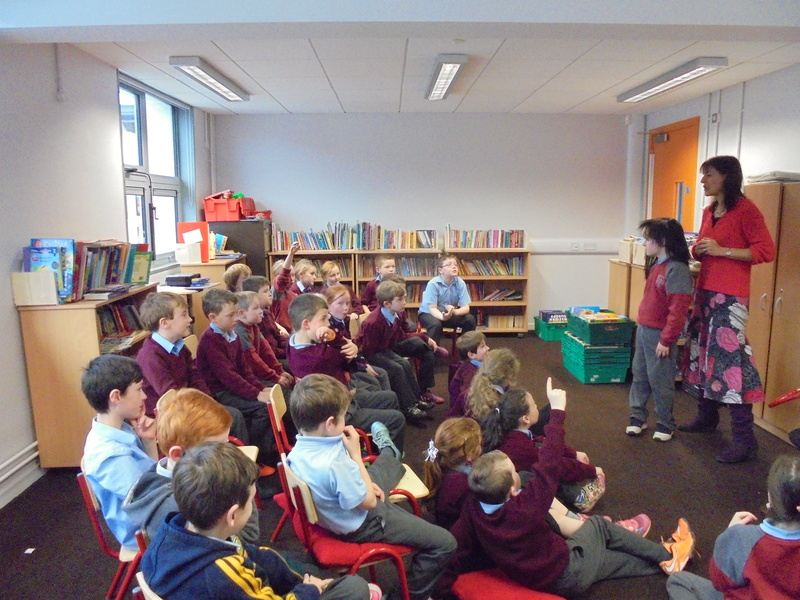 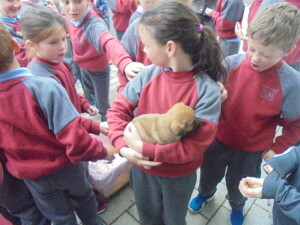 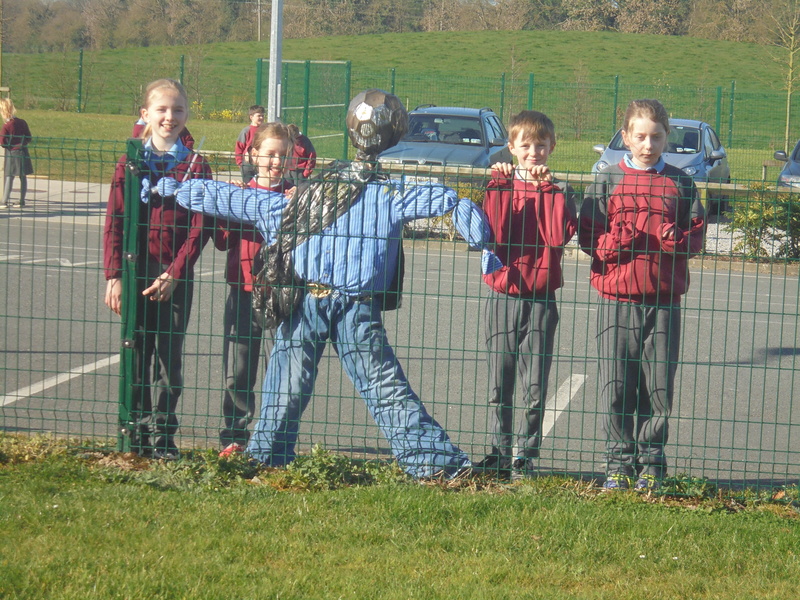 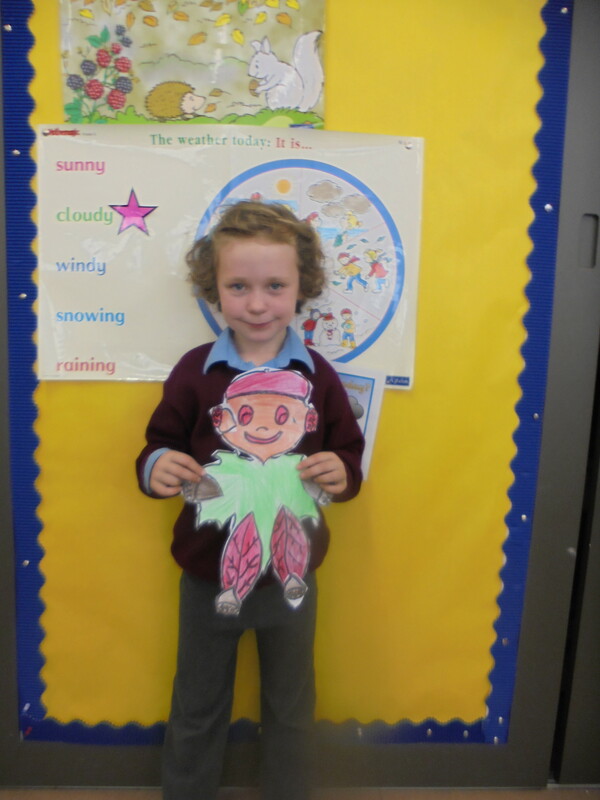 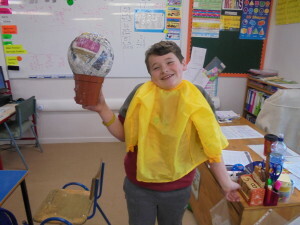 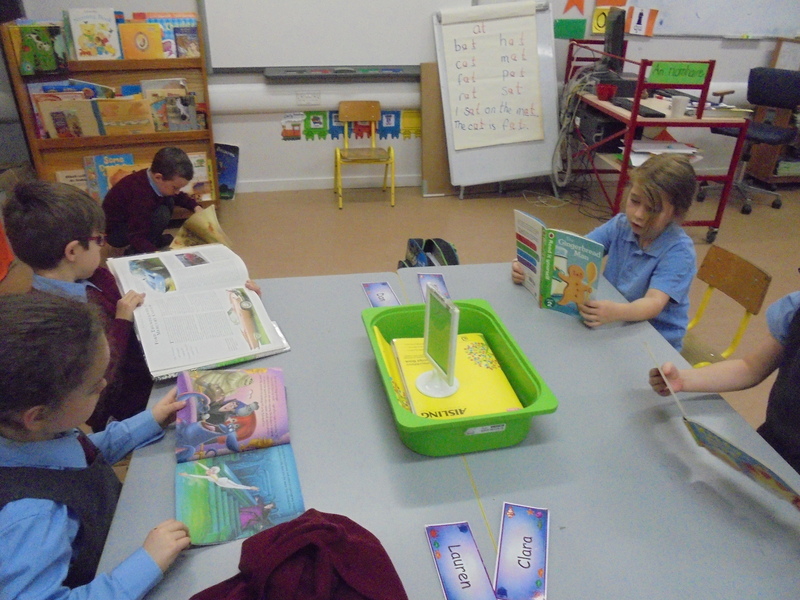 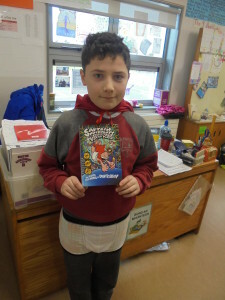 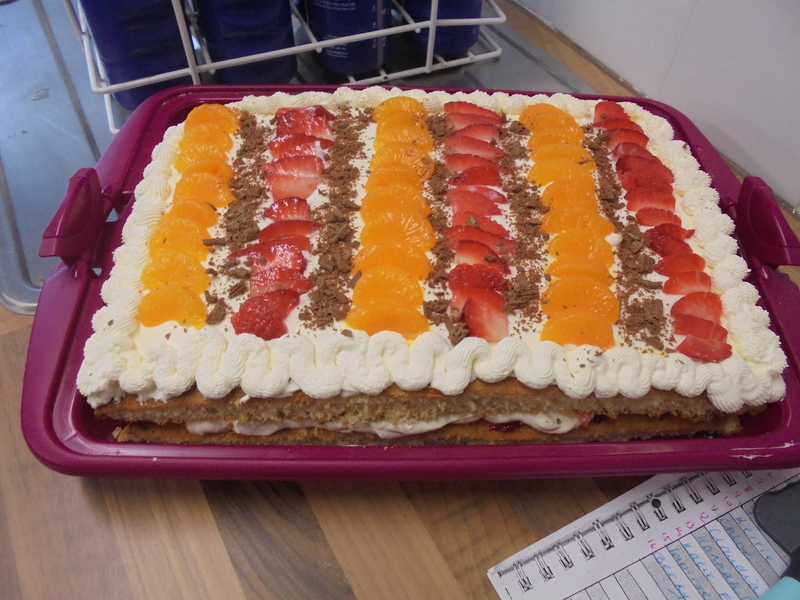 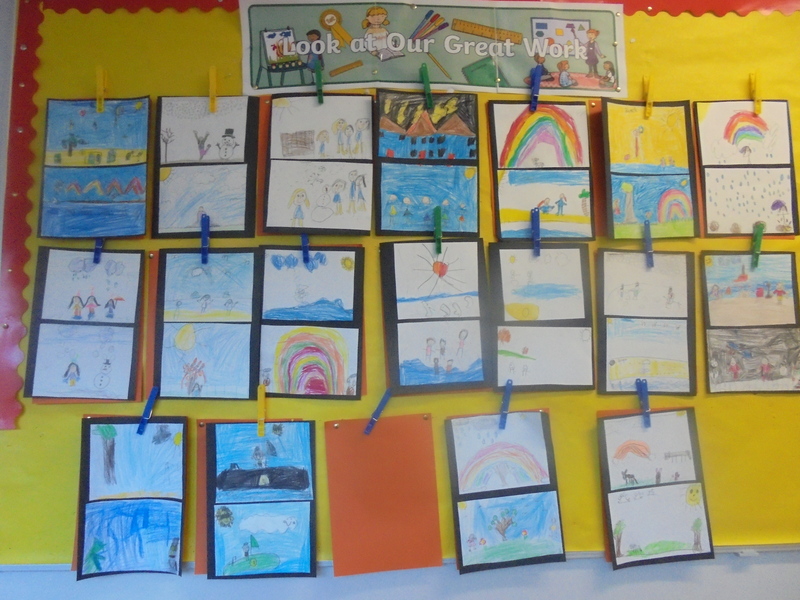 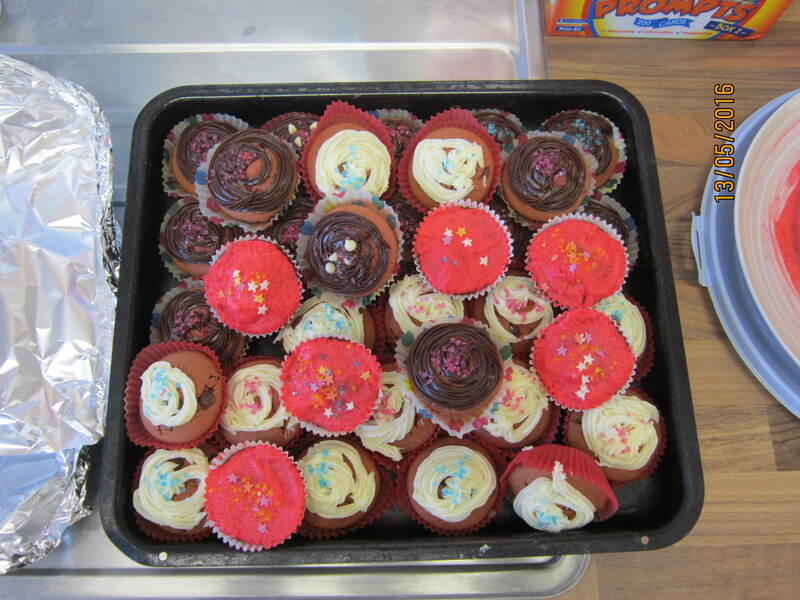 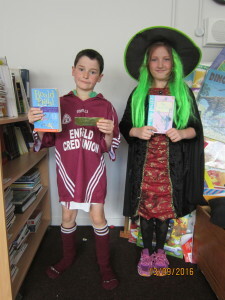 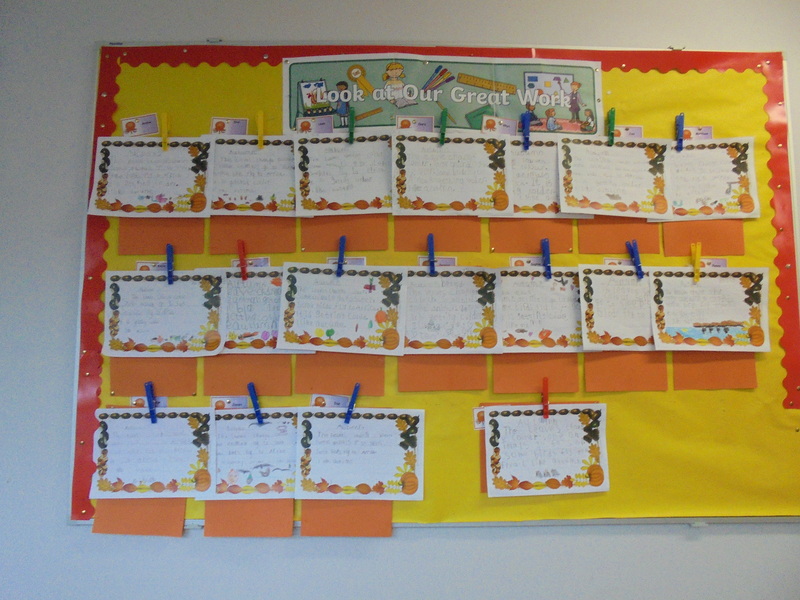 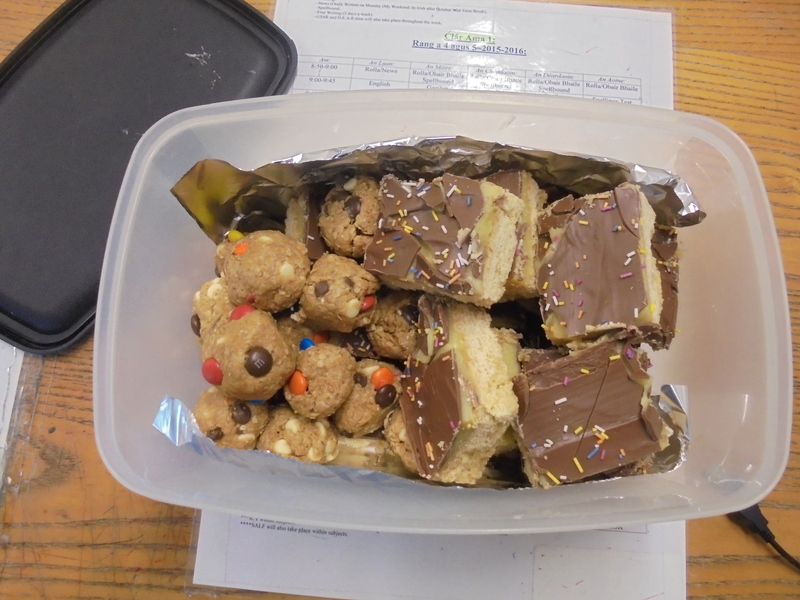 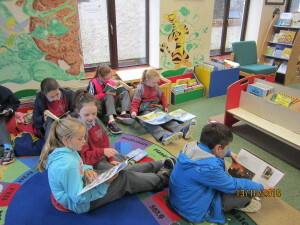 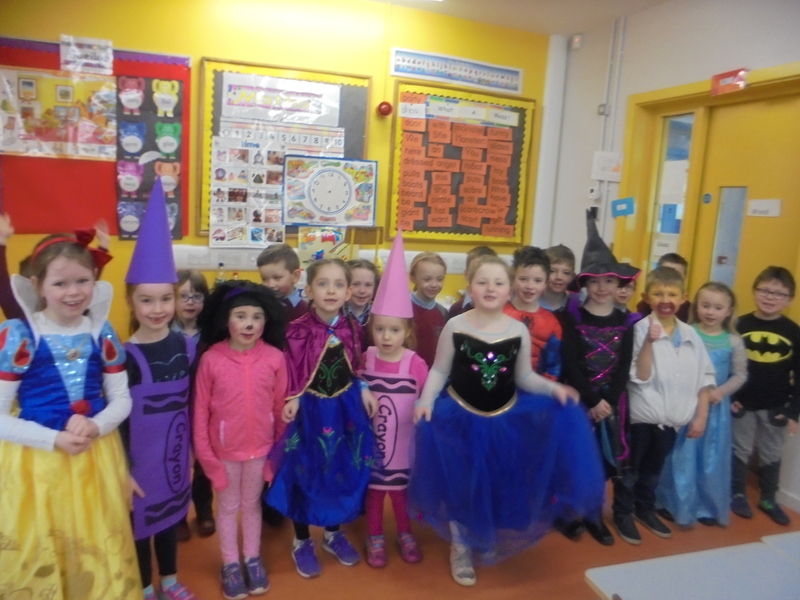 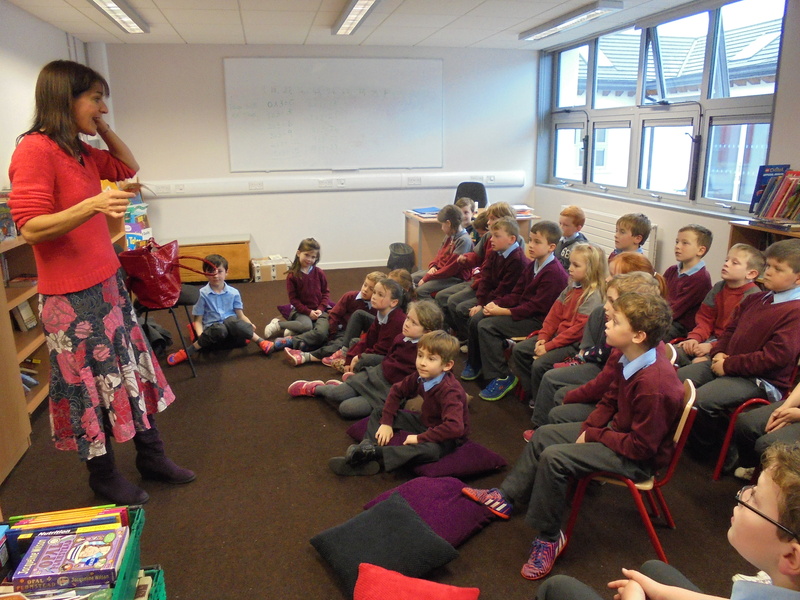 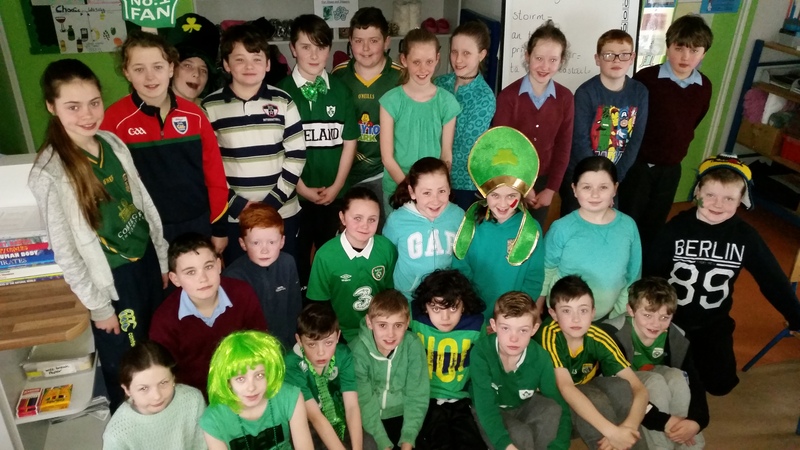 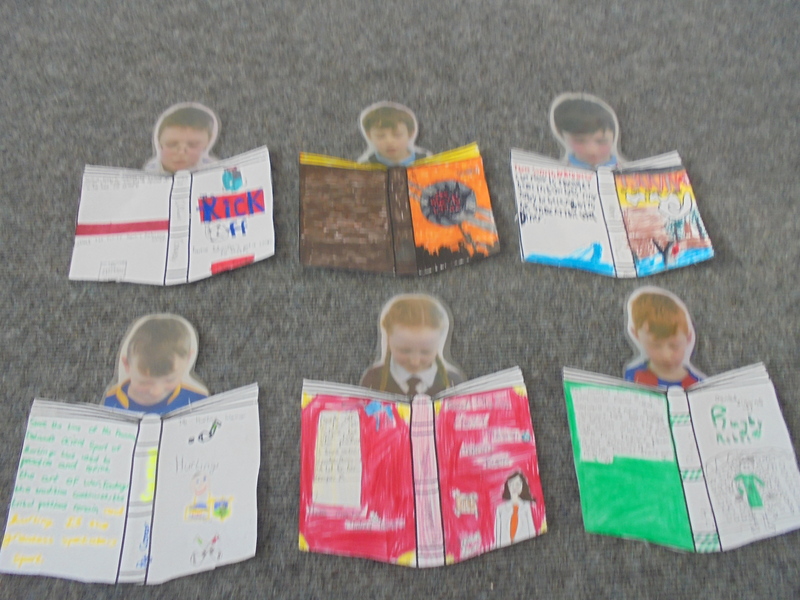 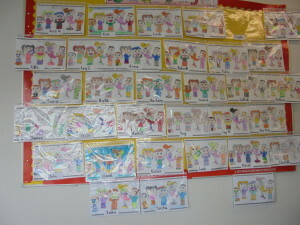 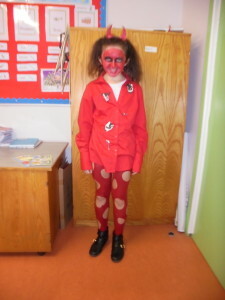 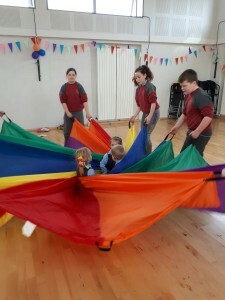 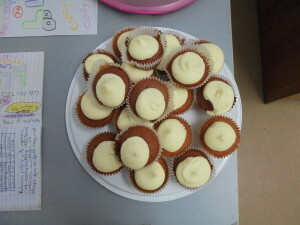 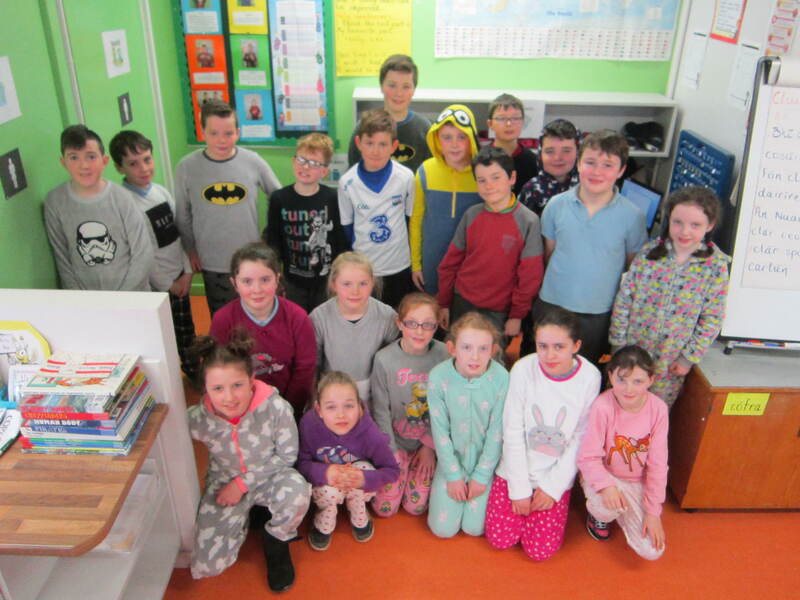 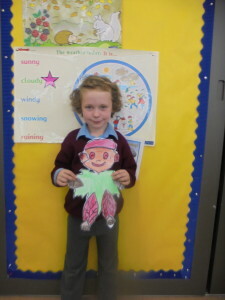 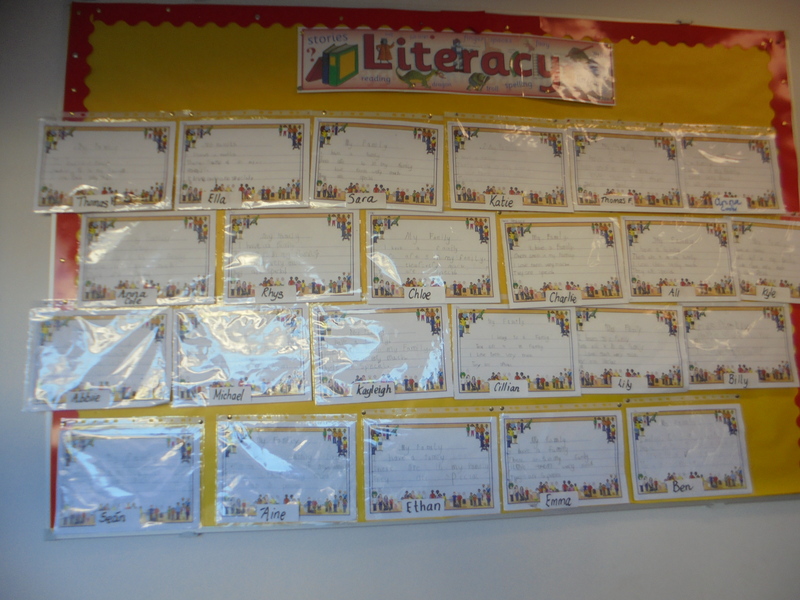 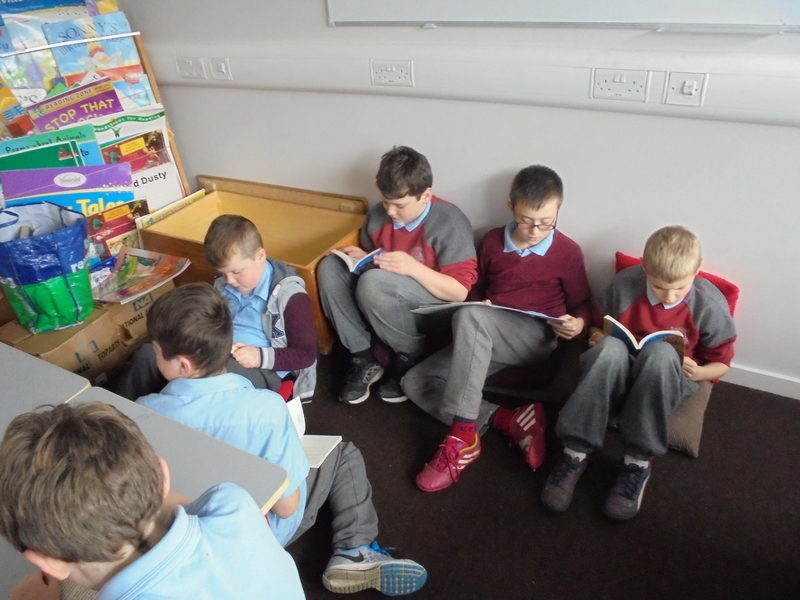 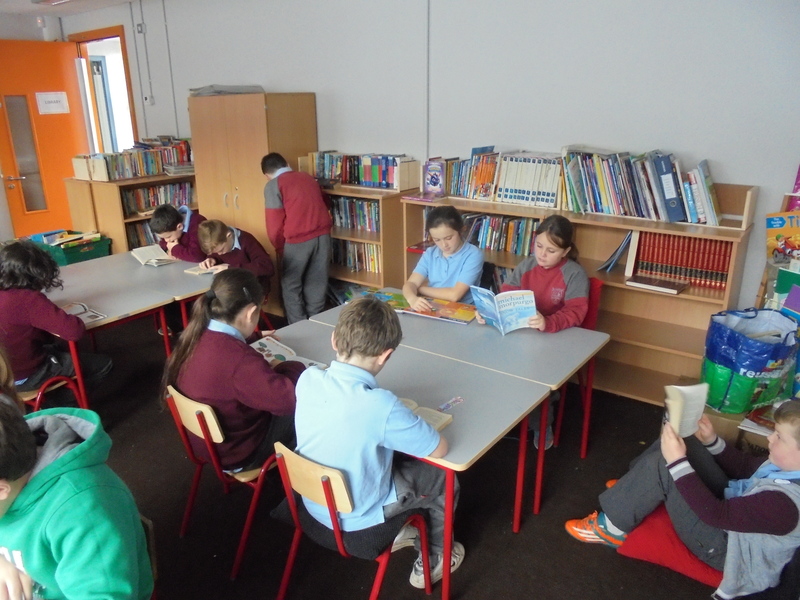 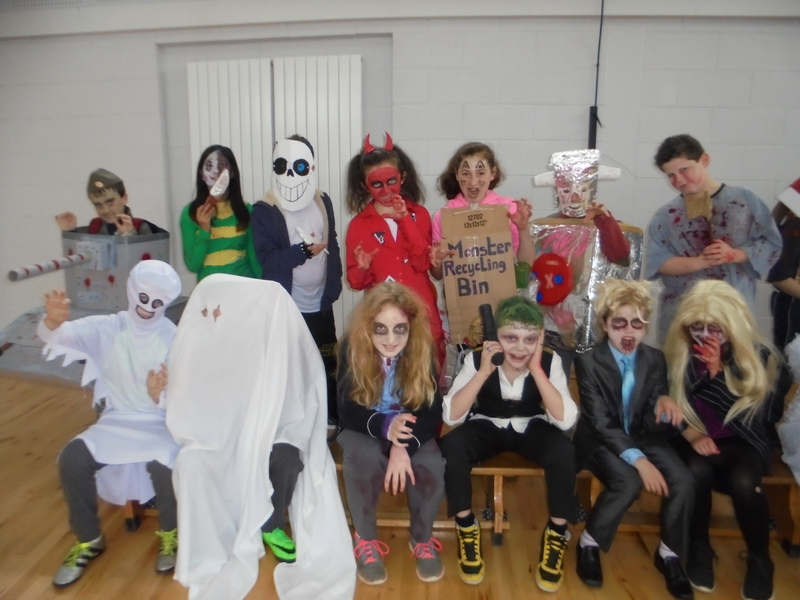 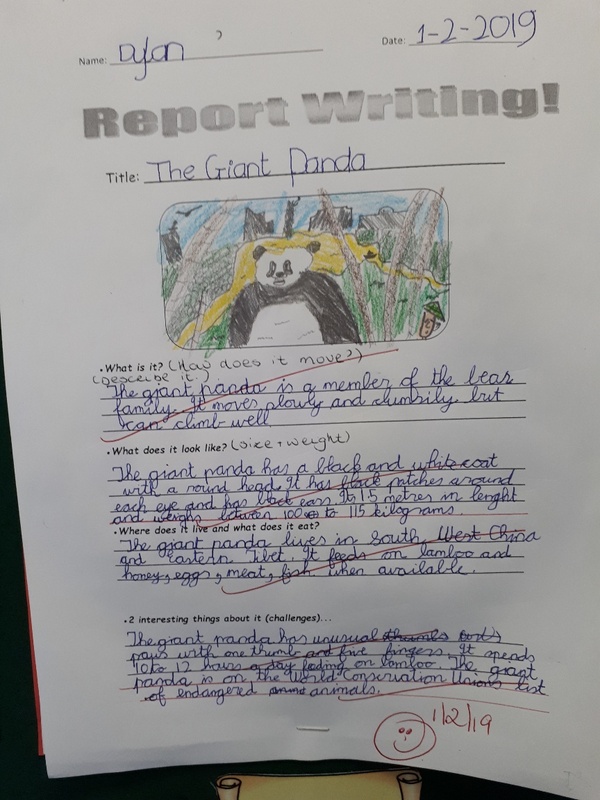 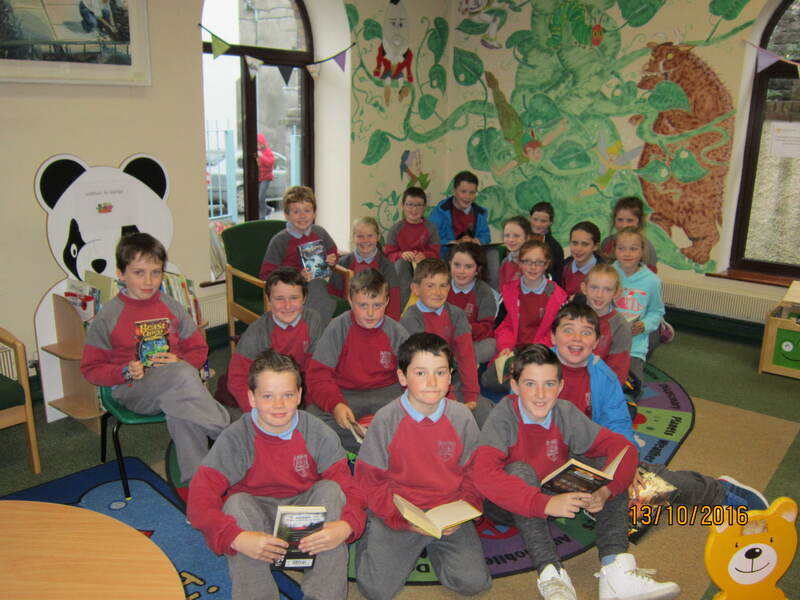 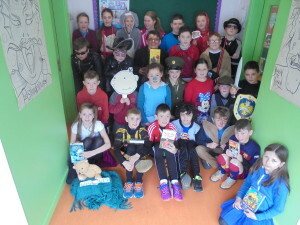 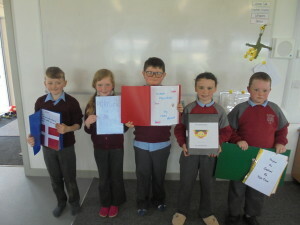 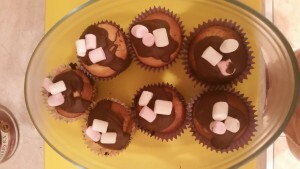 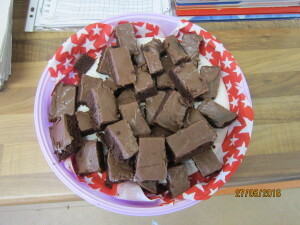 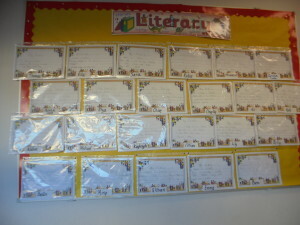 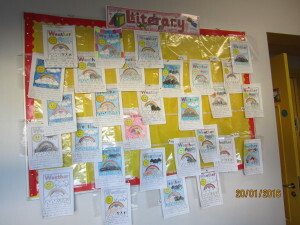 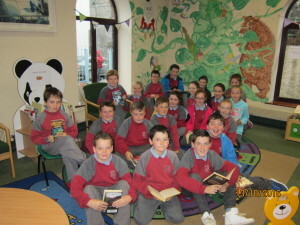 Ms Murphy’s 4th class celebrated Roald Dahl Day on September 13th. 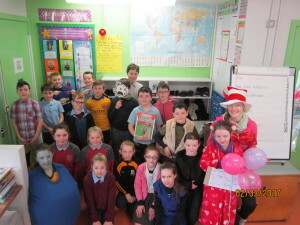 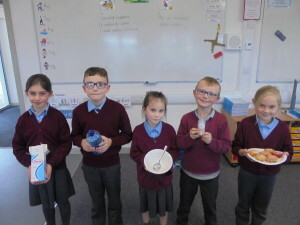 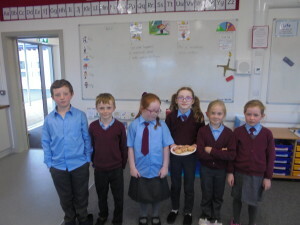 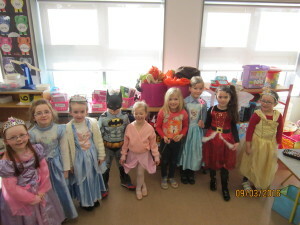 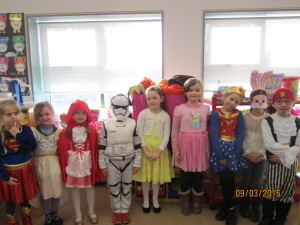 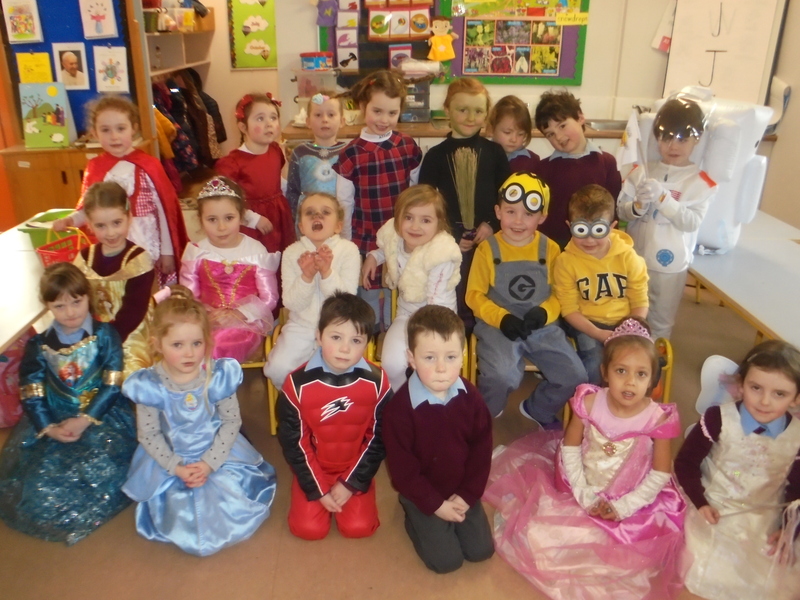 Some of the class dressed up and brought in things from their favourite Roald Dahl book. 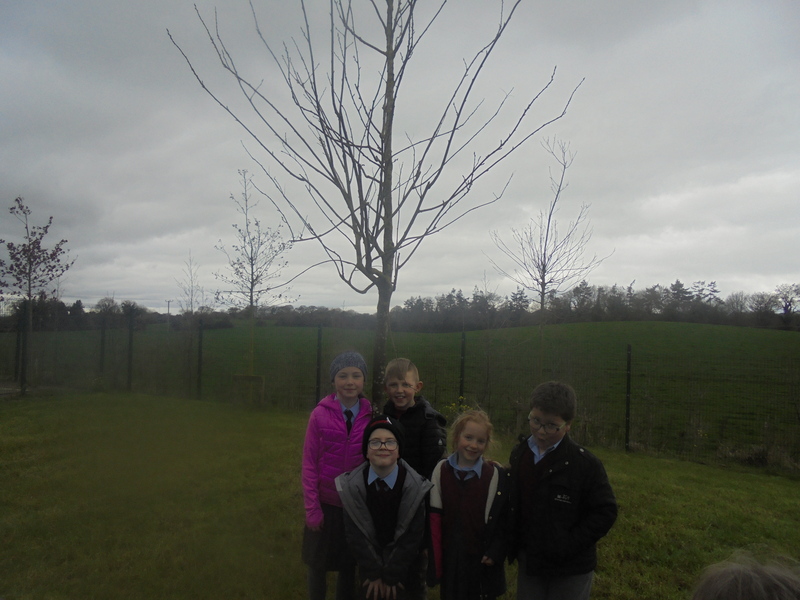 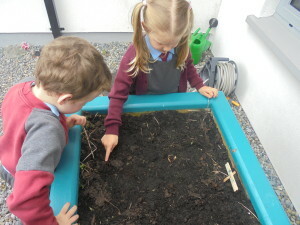 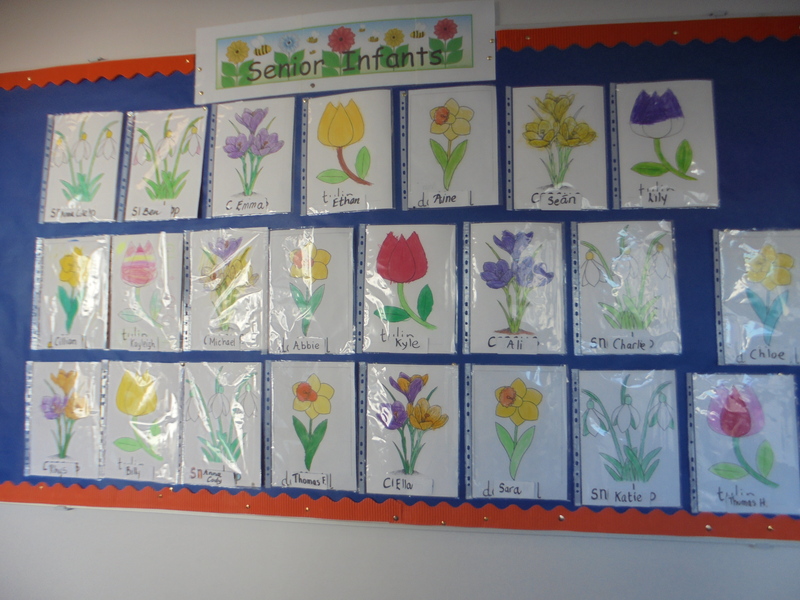 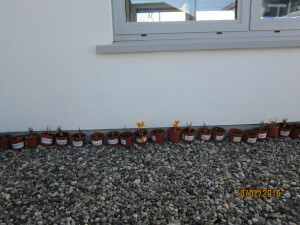 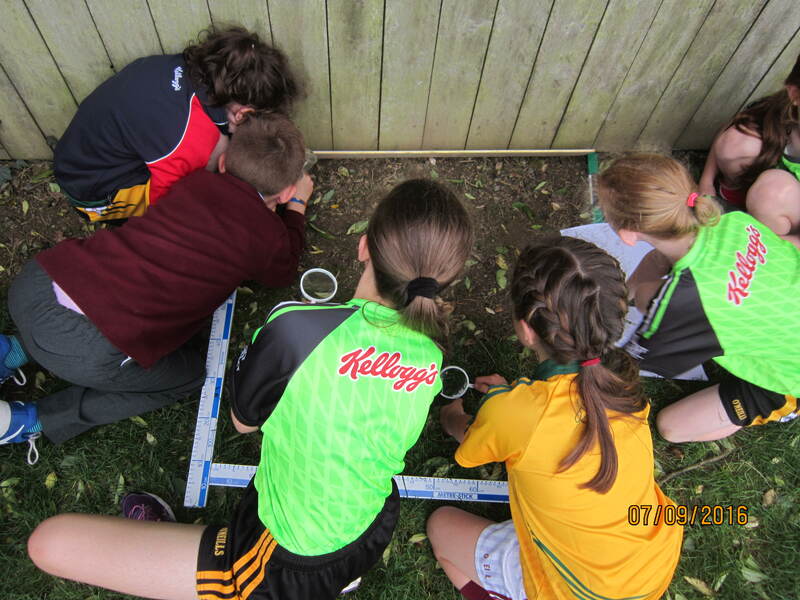 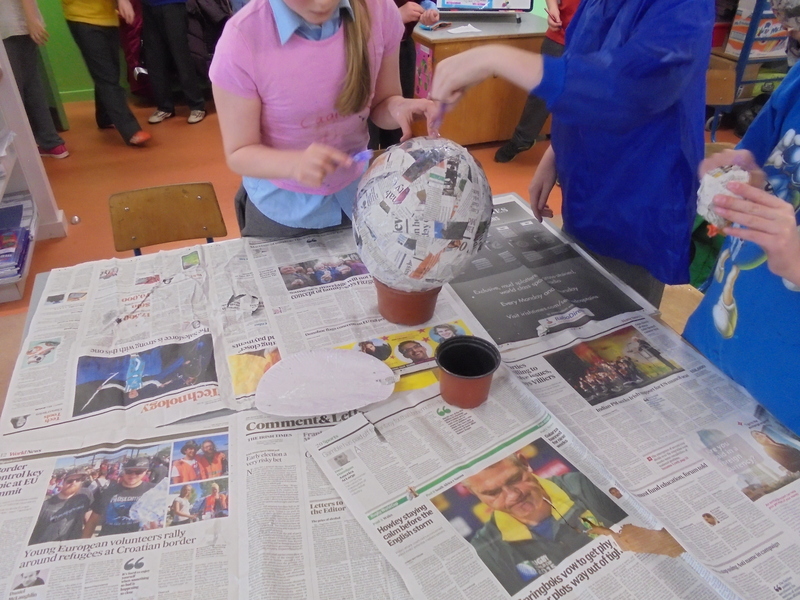 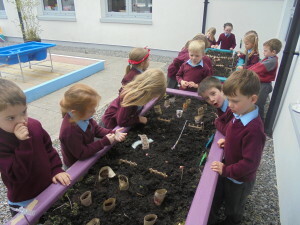 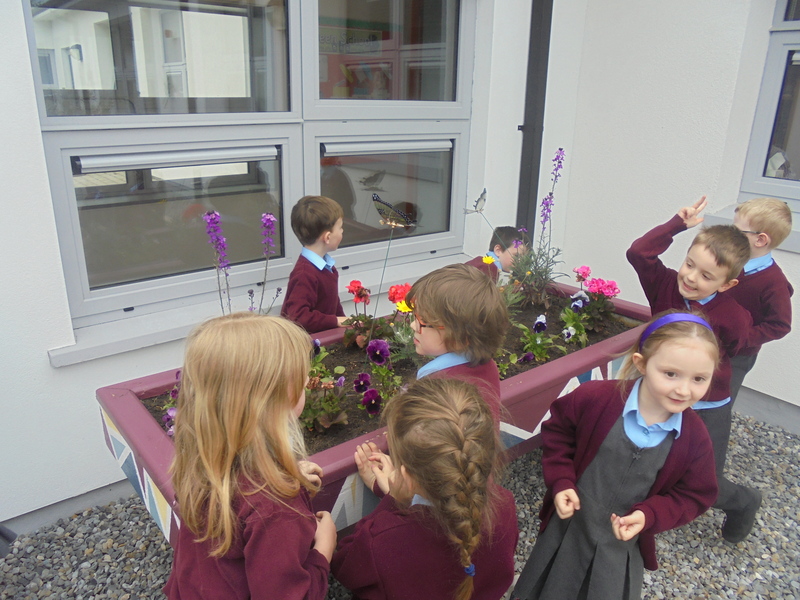 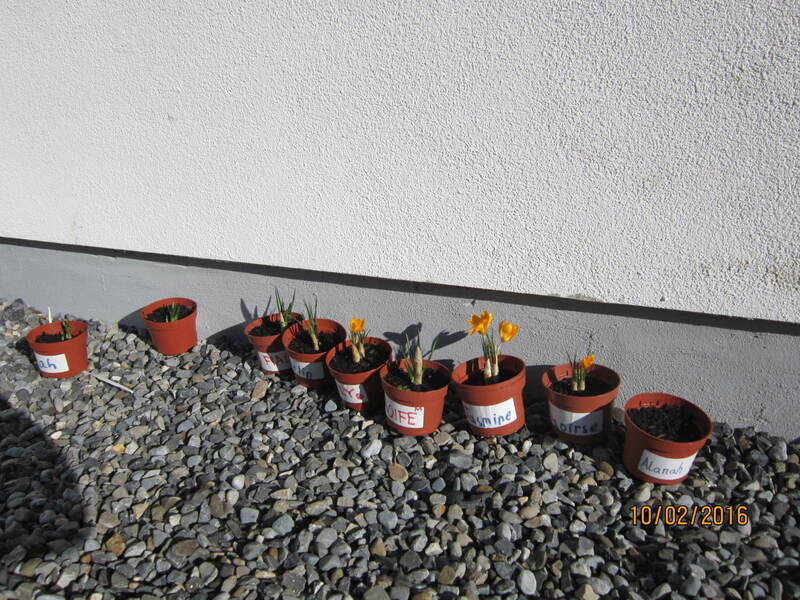 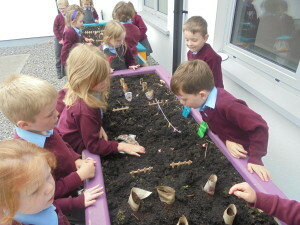 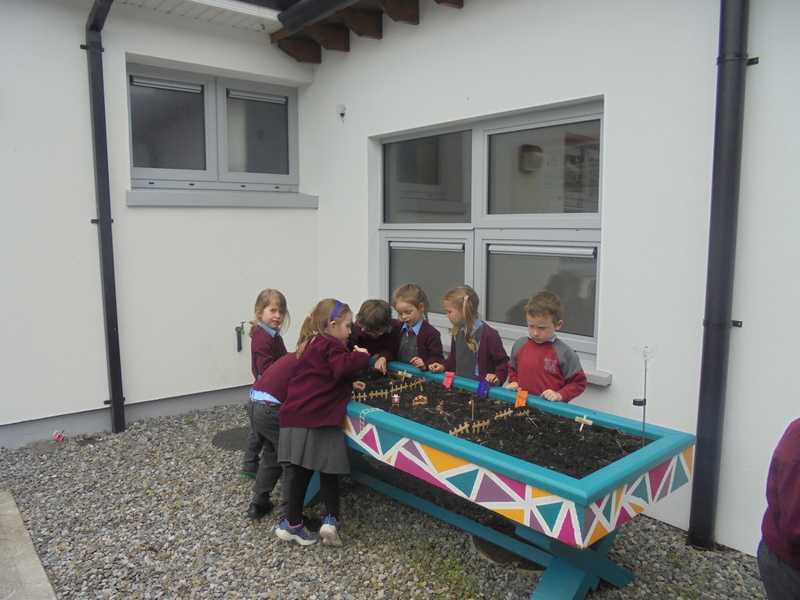 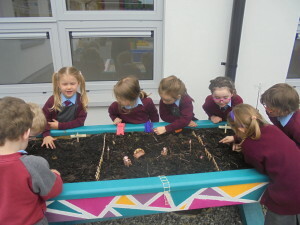 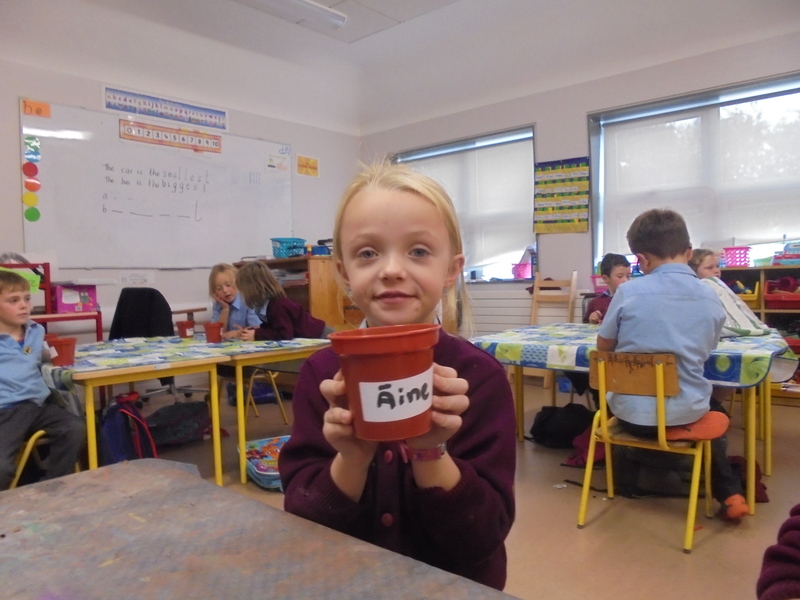 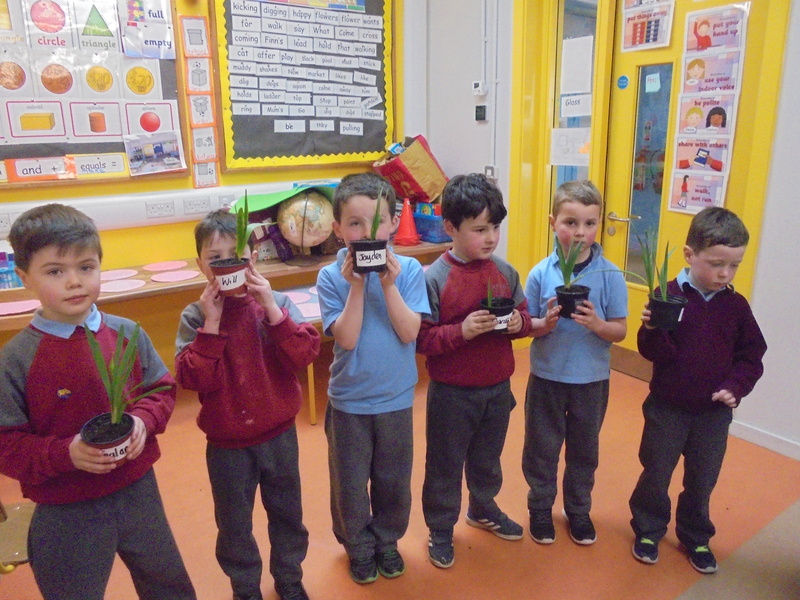 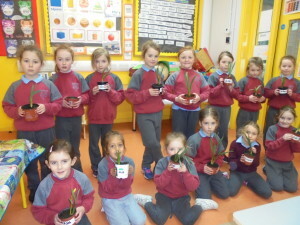 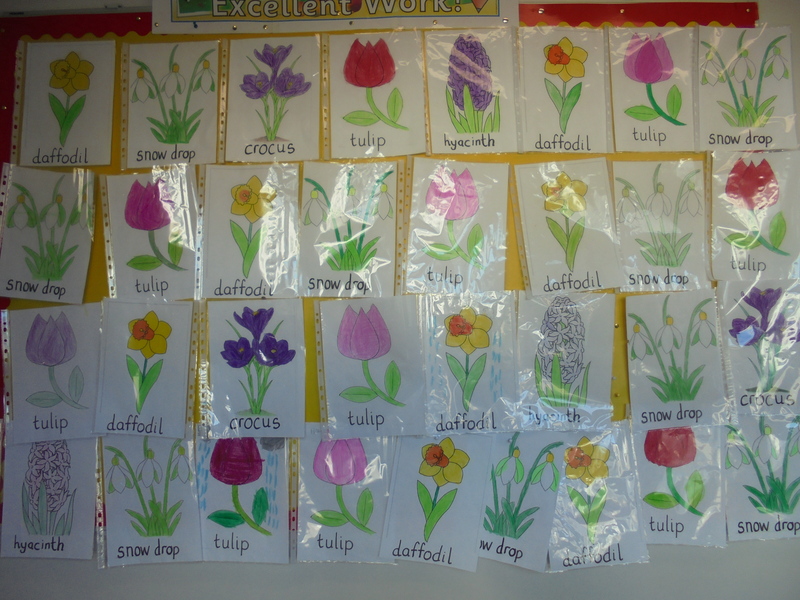 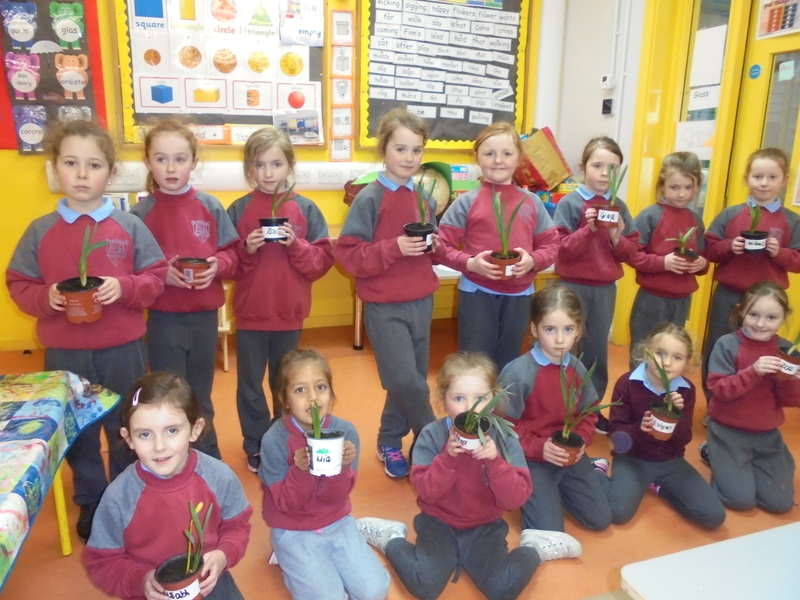 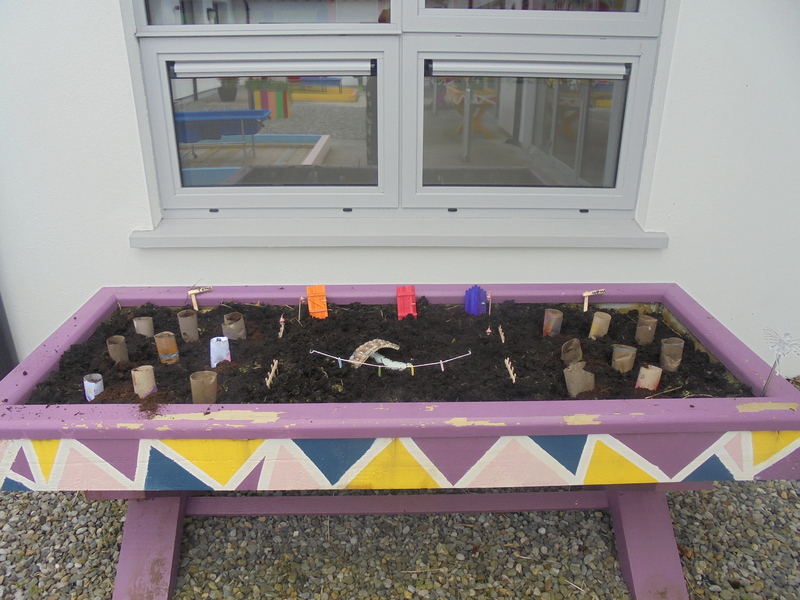 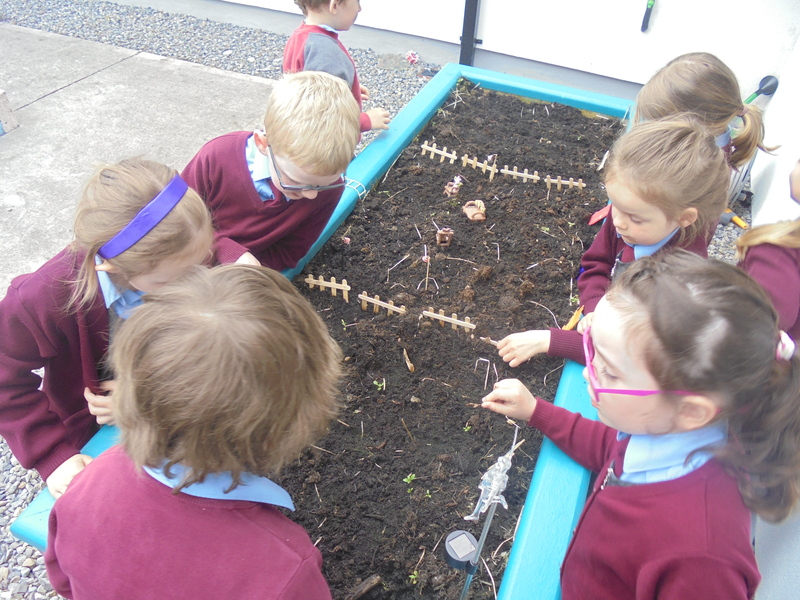 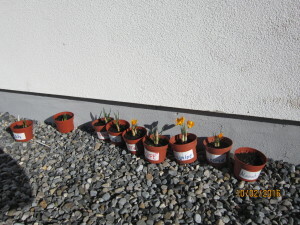 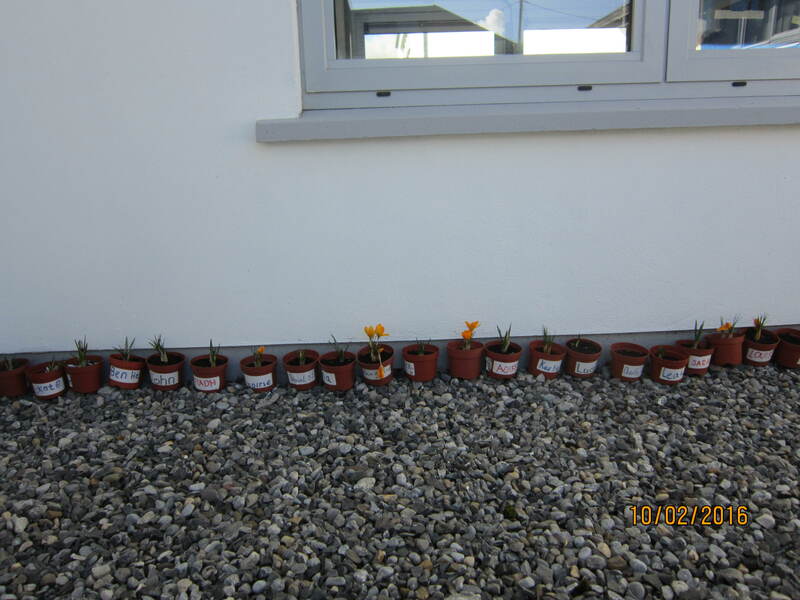 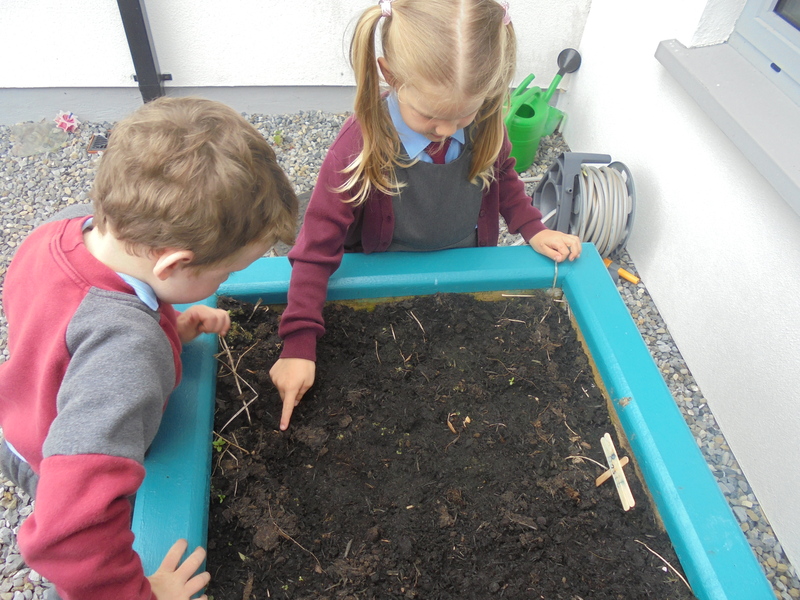 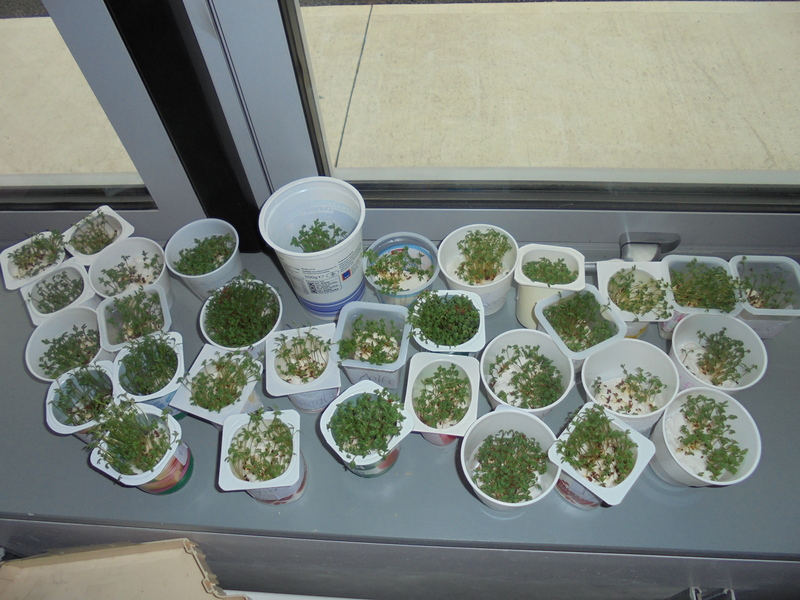 Senior Infants enjoyed watching the bulbs that they planted during the winter grow into flowering bulbs (Feb 2016). 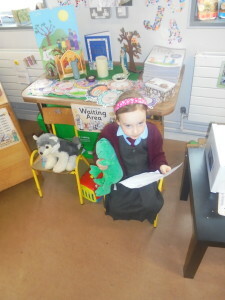 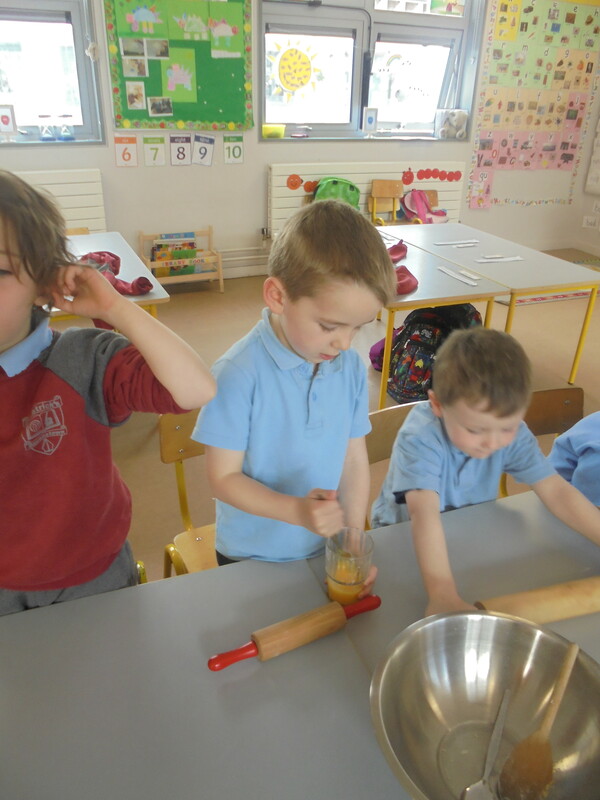 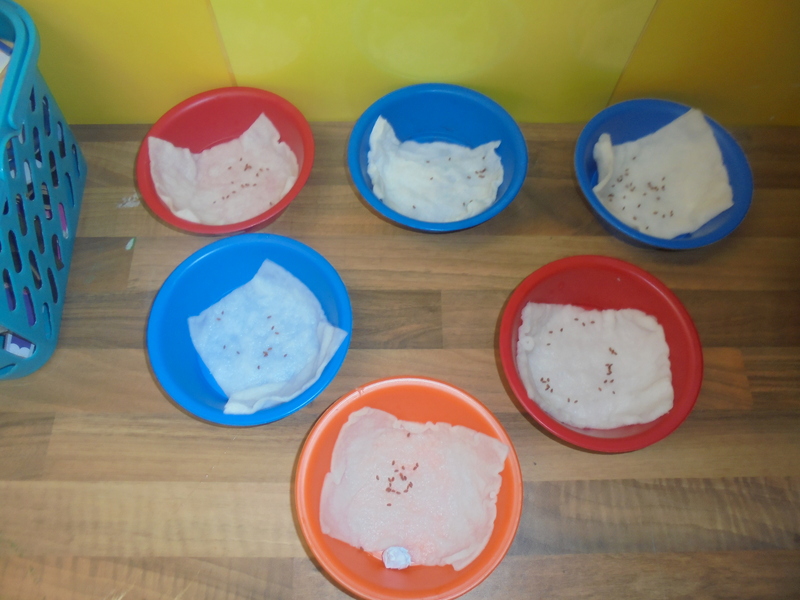 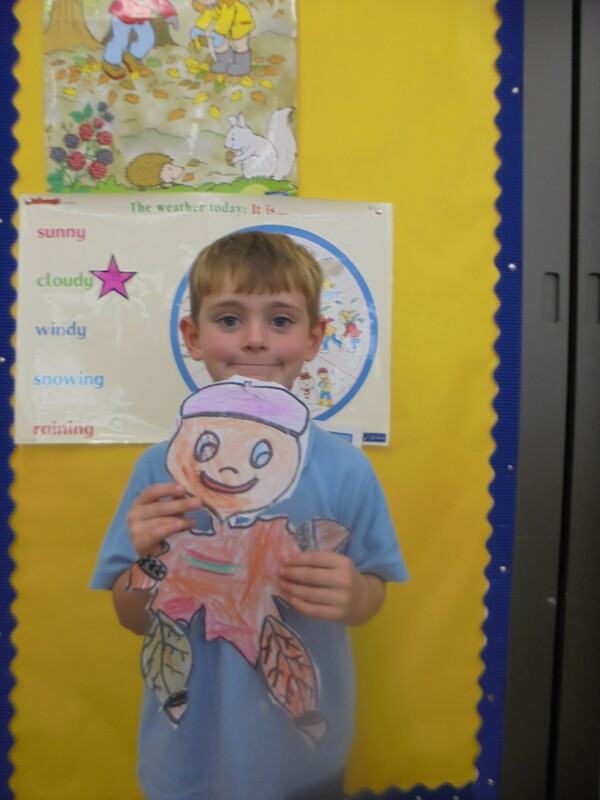 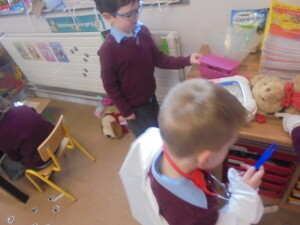 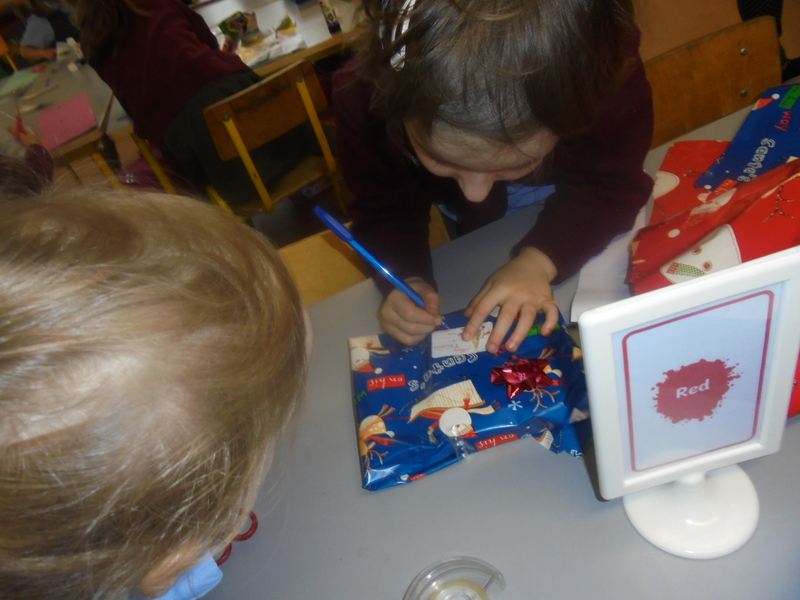 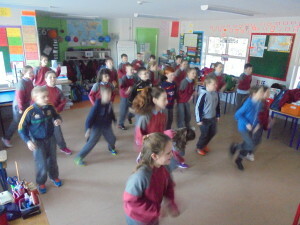 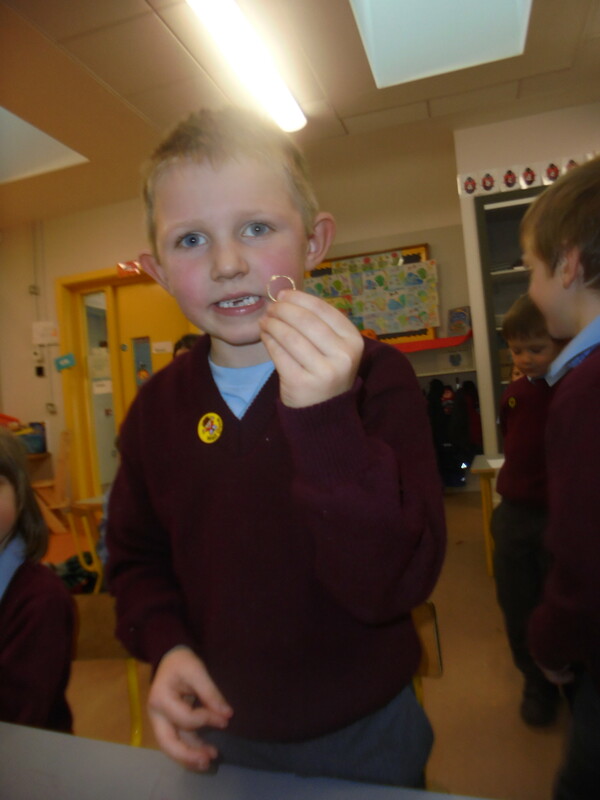 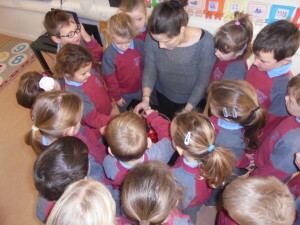 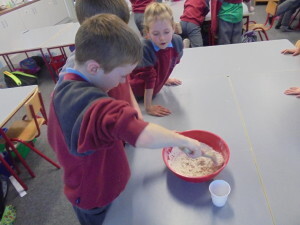 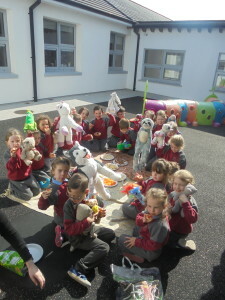 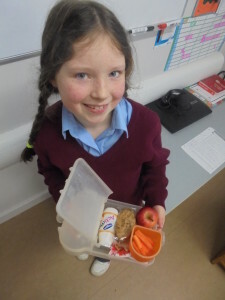 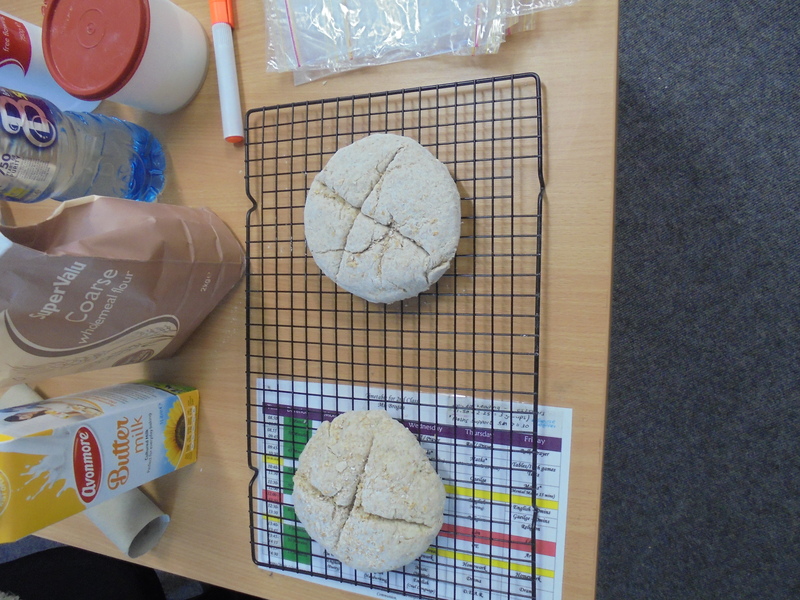 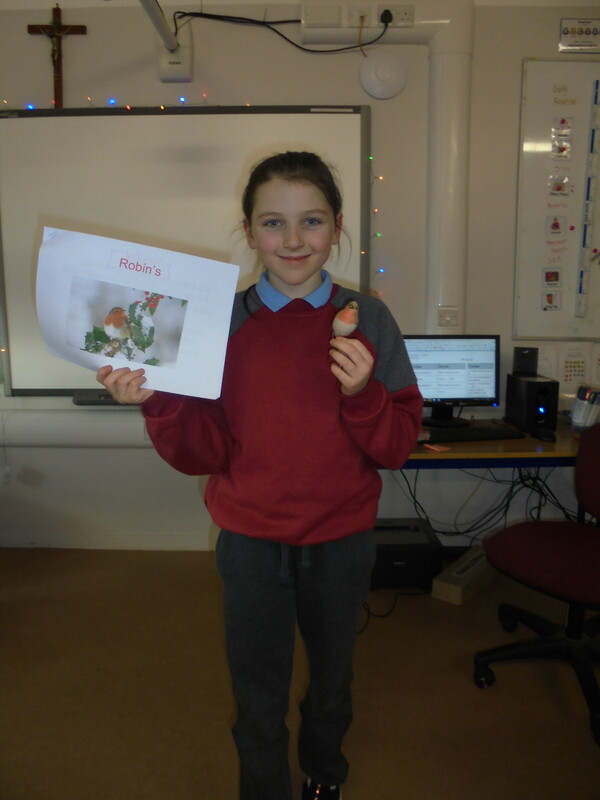 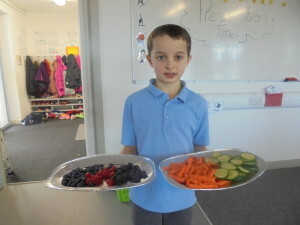 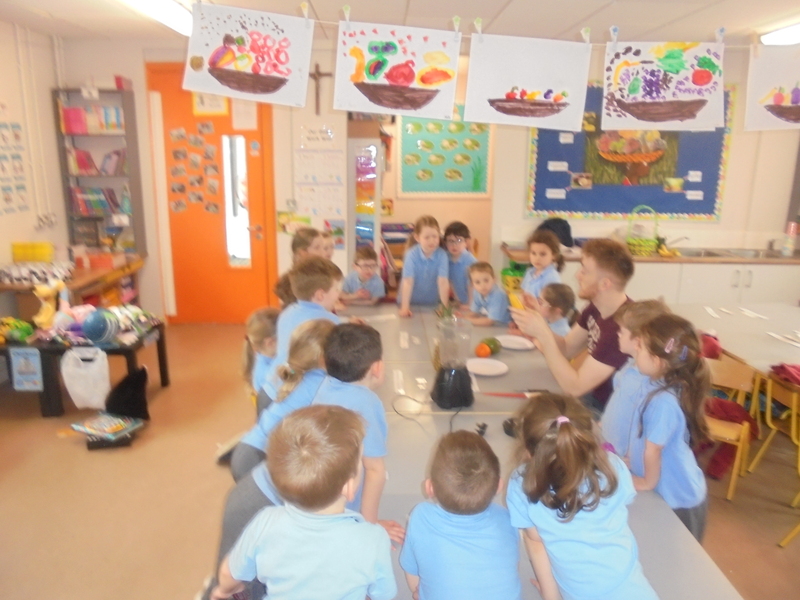 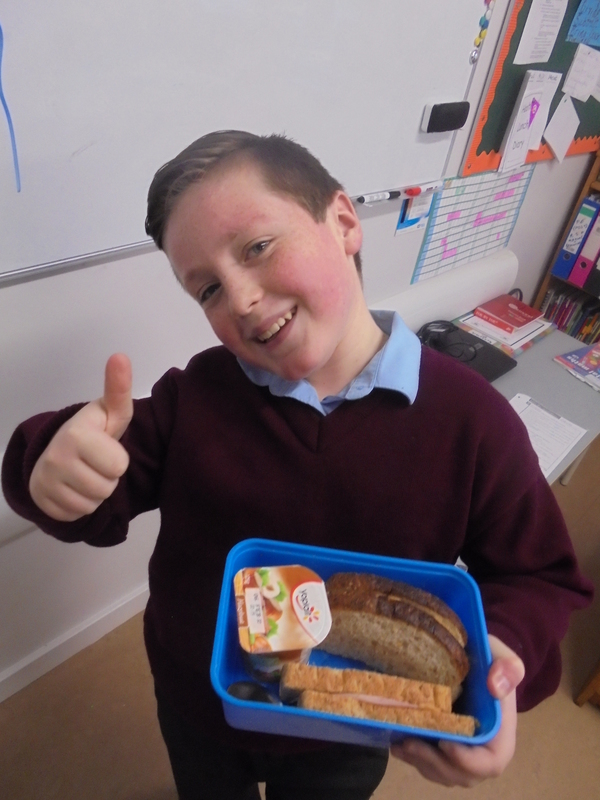 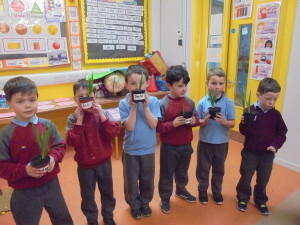 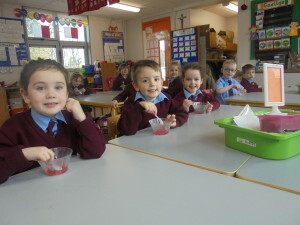 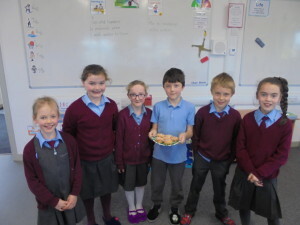 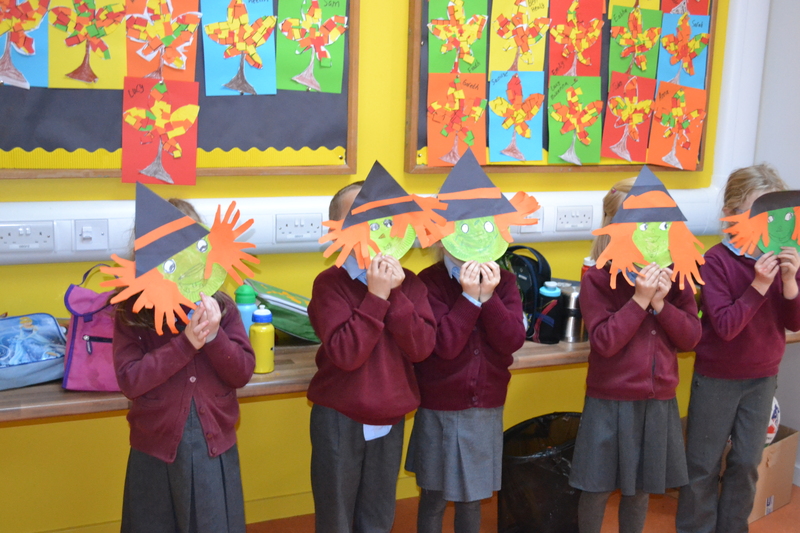 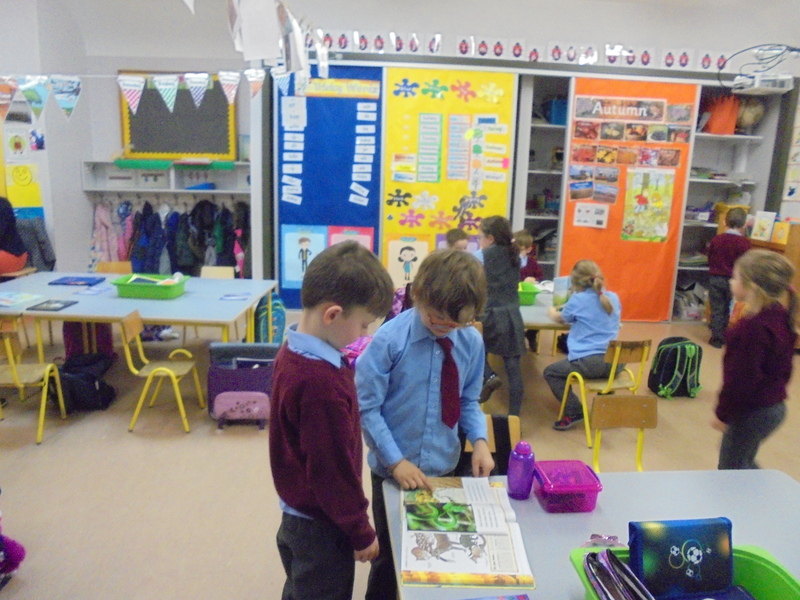 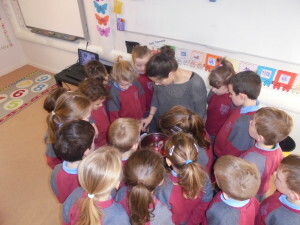 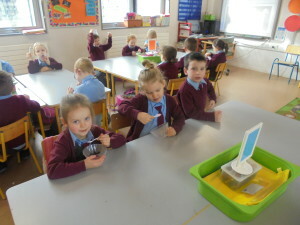 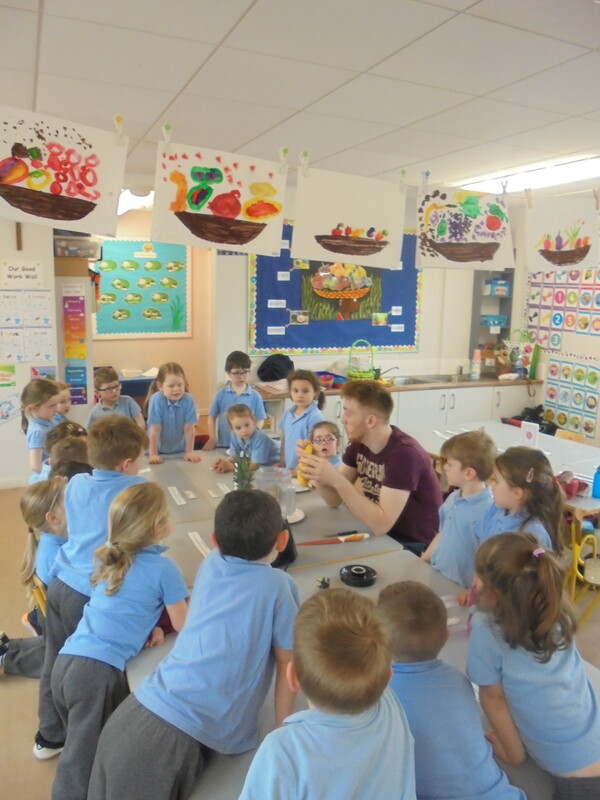 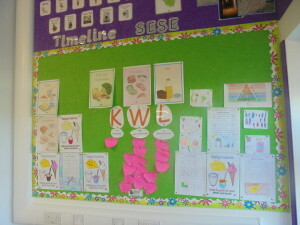 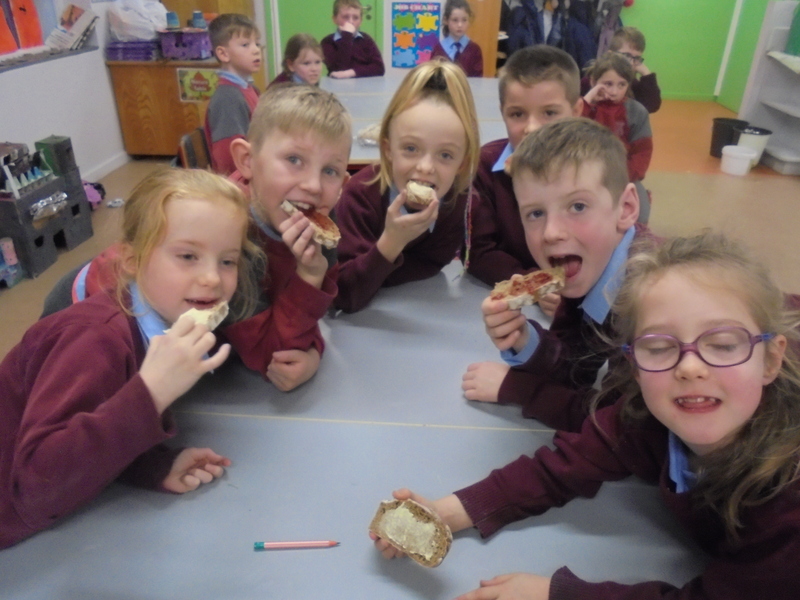 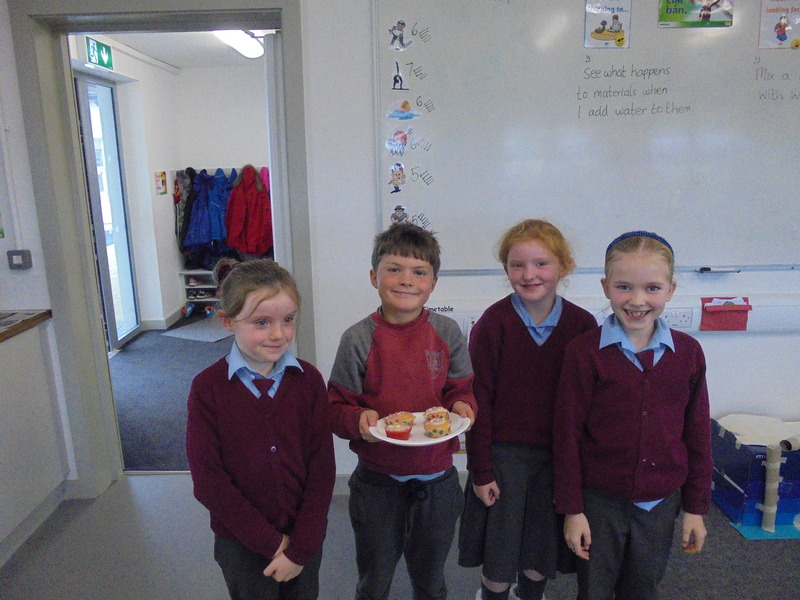 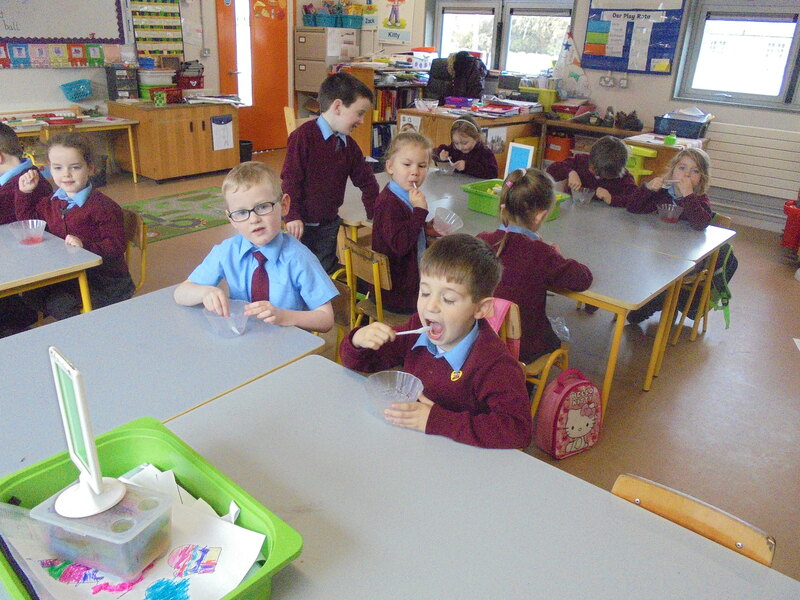 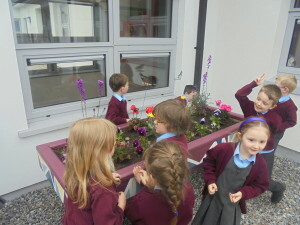 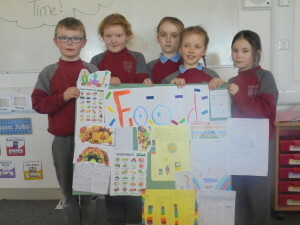 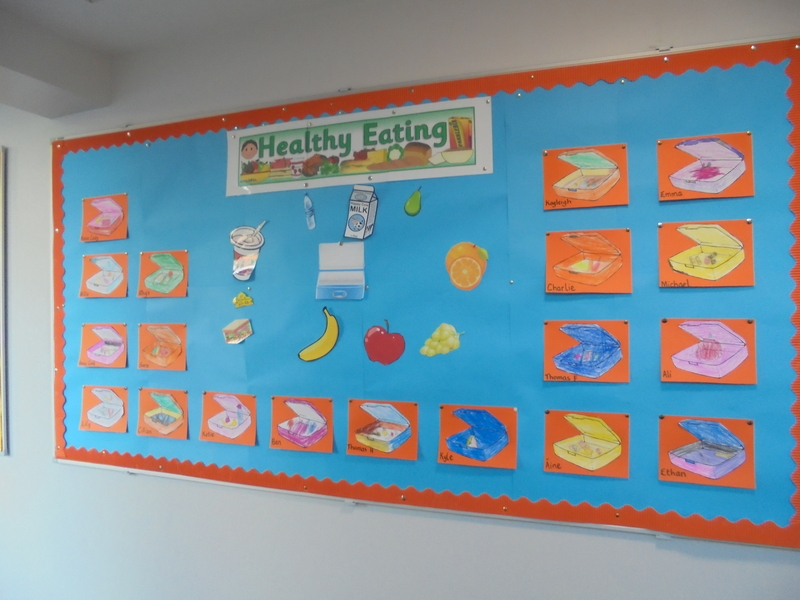 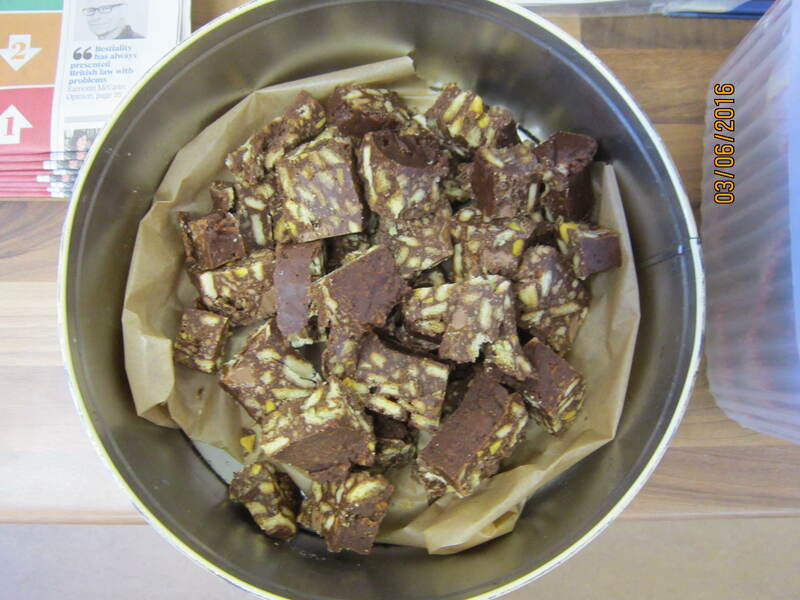 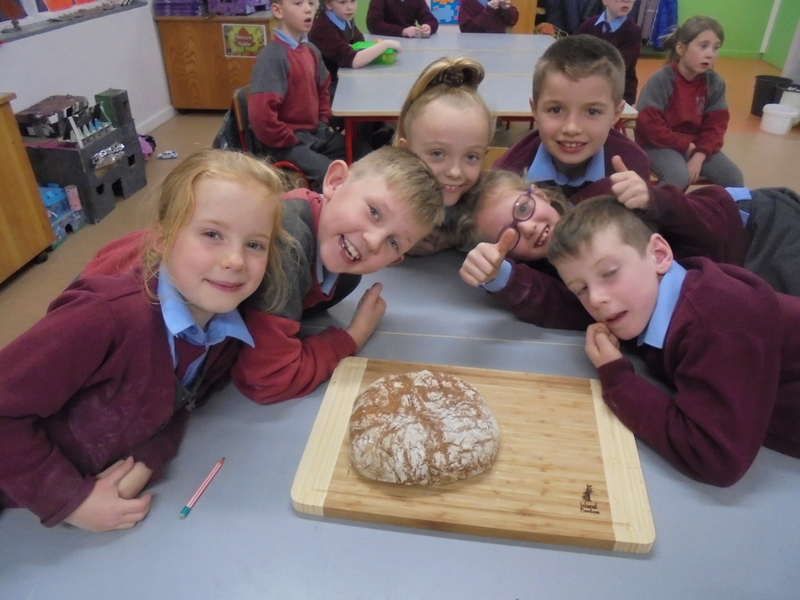 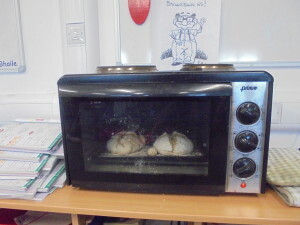 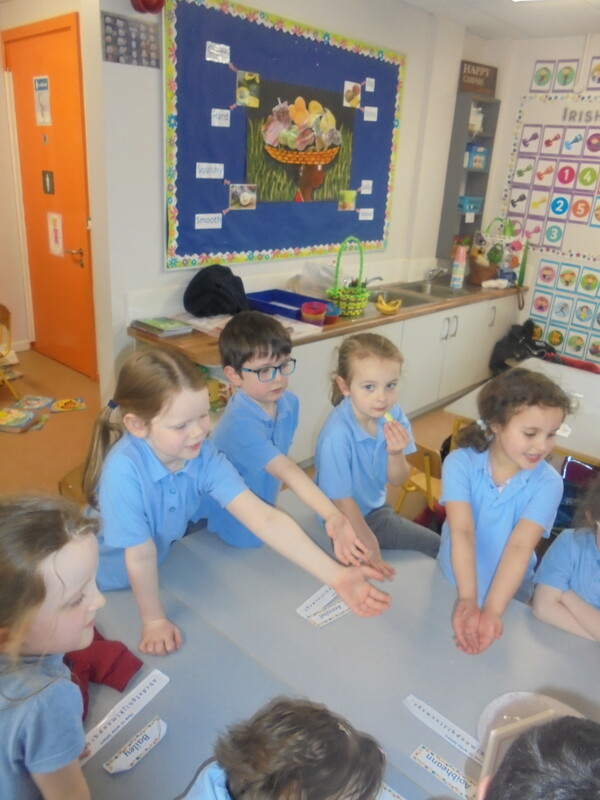 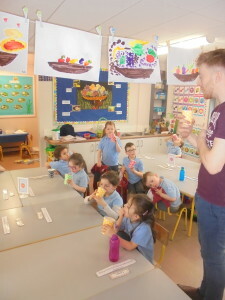 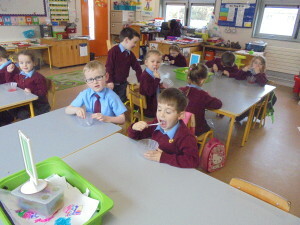 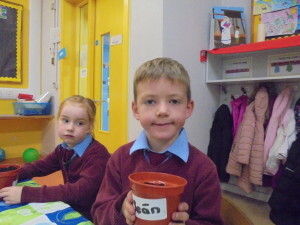 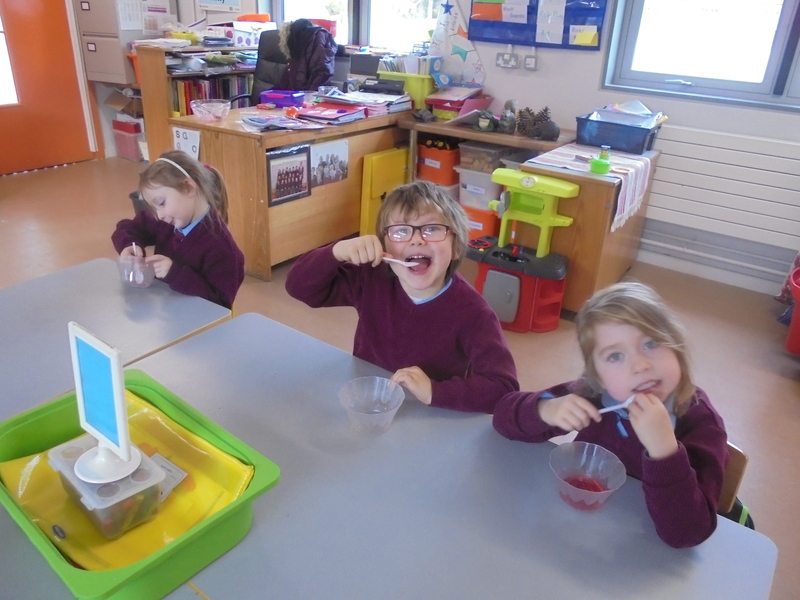 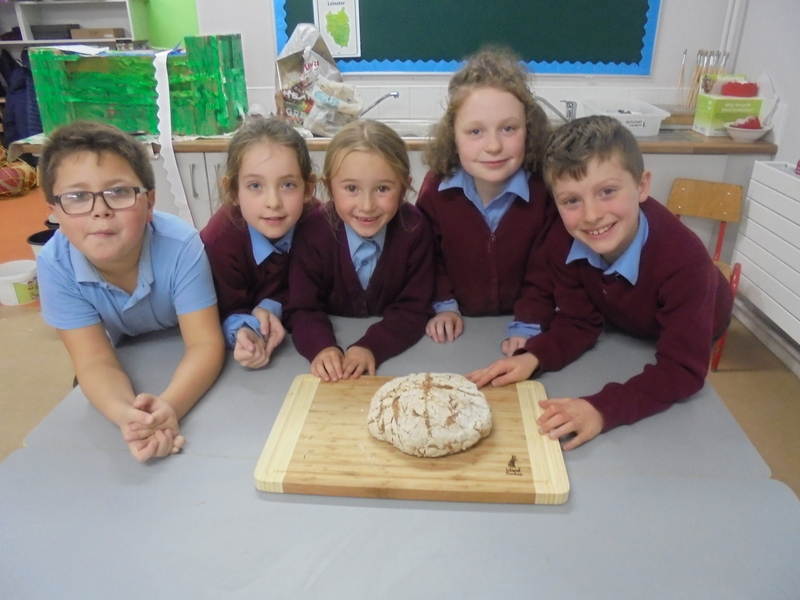 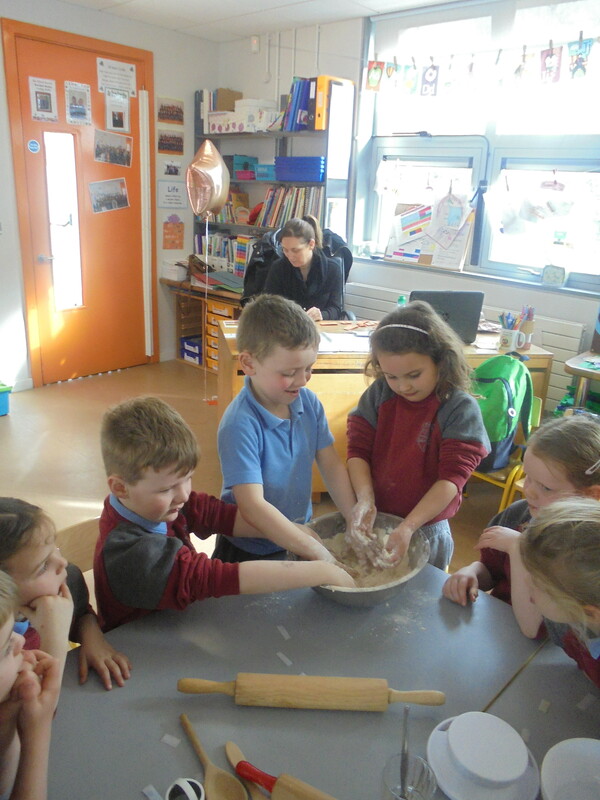 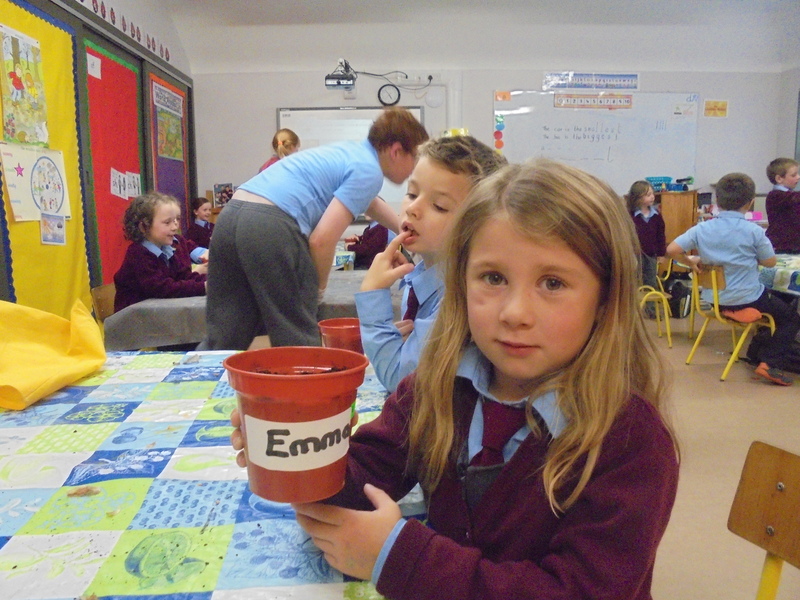 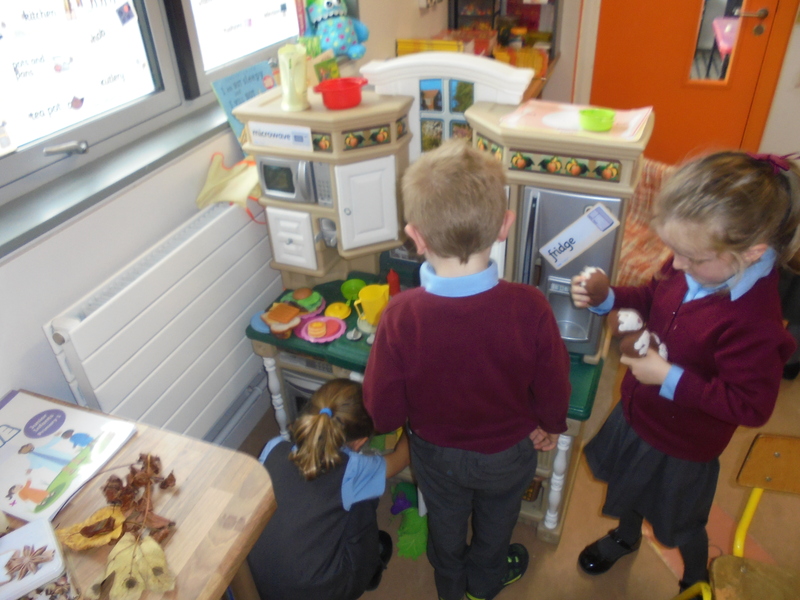 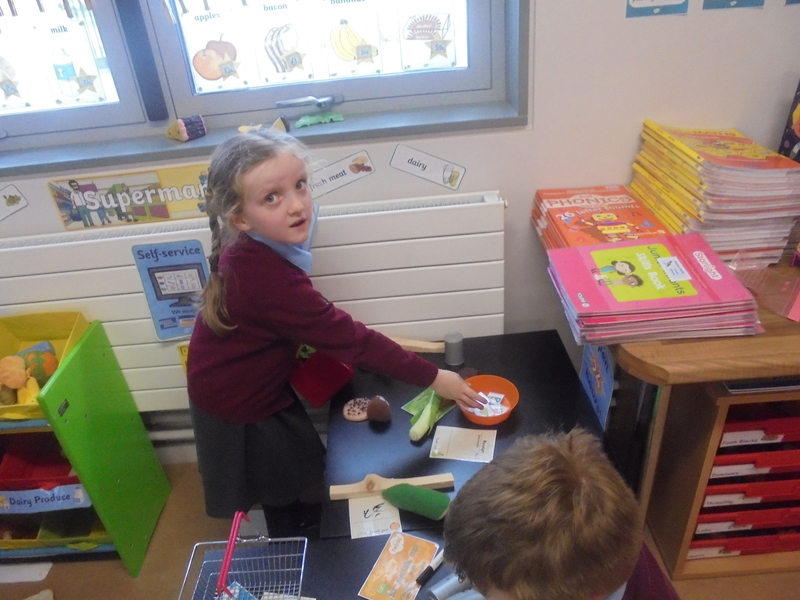 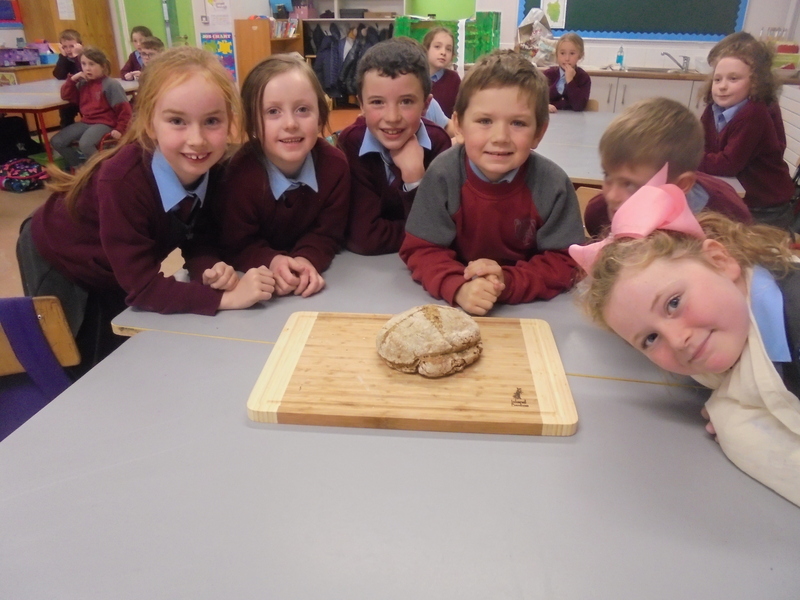 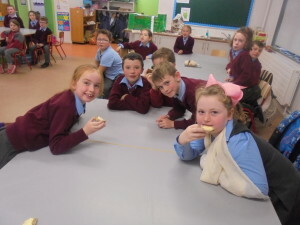 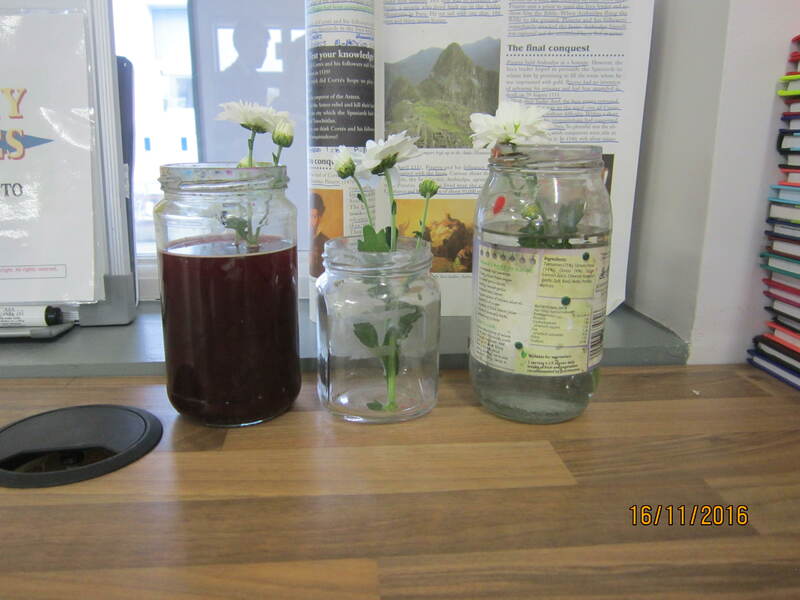 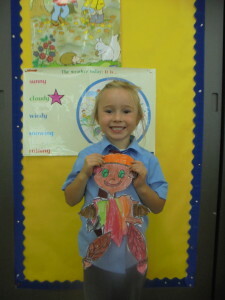 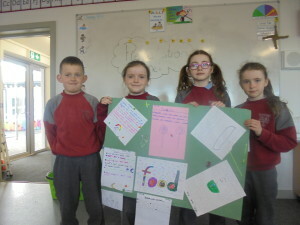 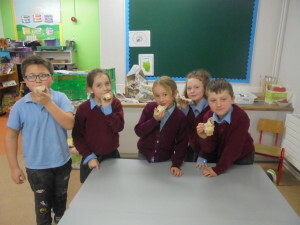 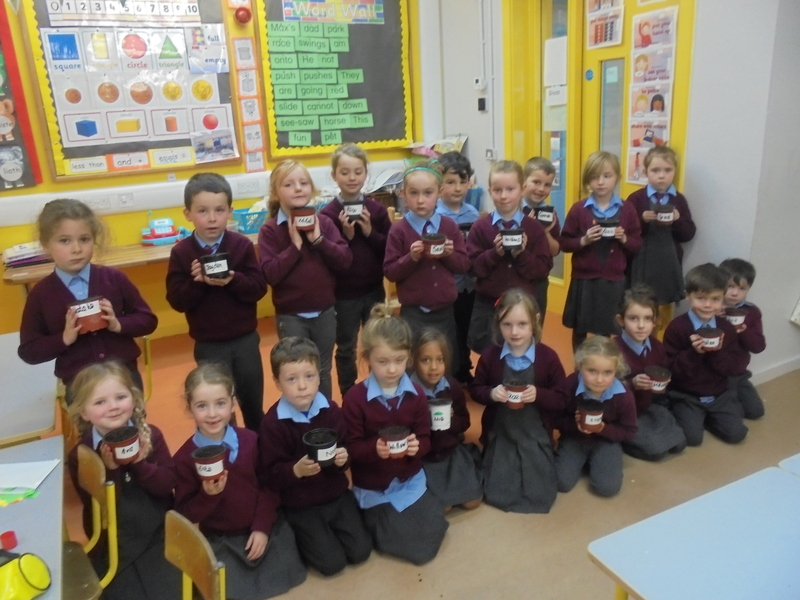 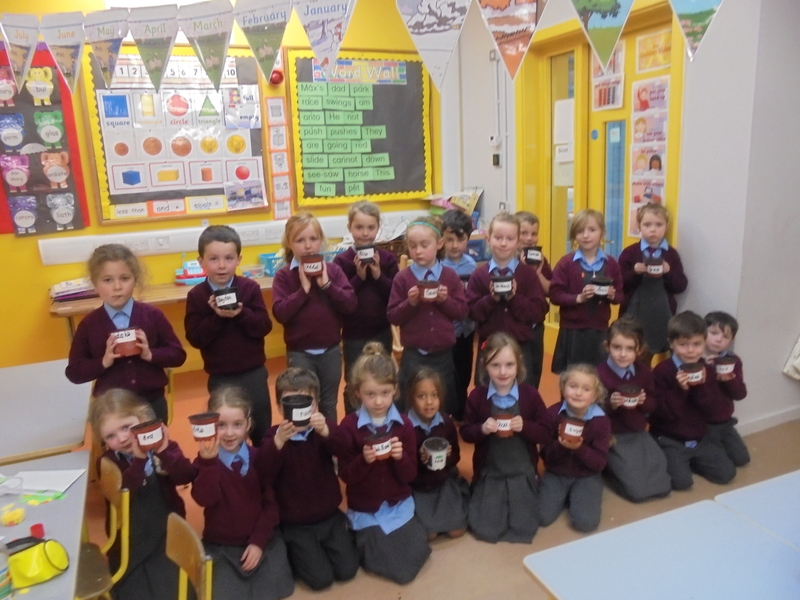 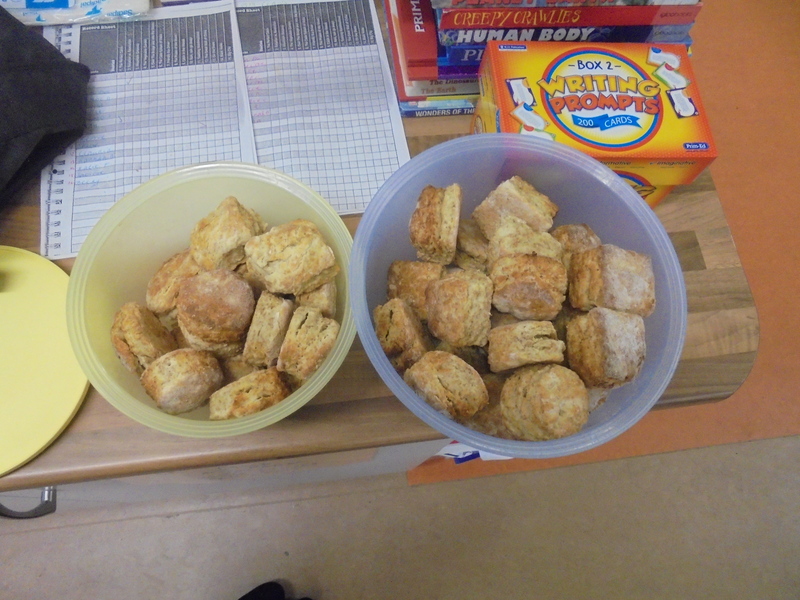 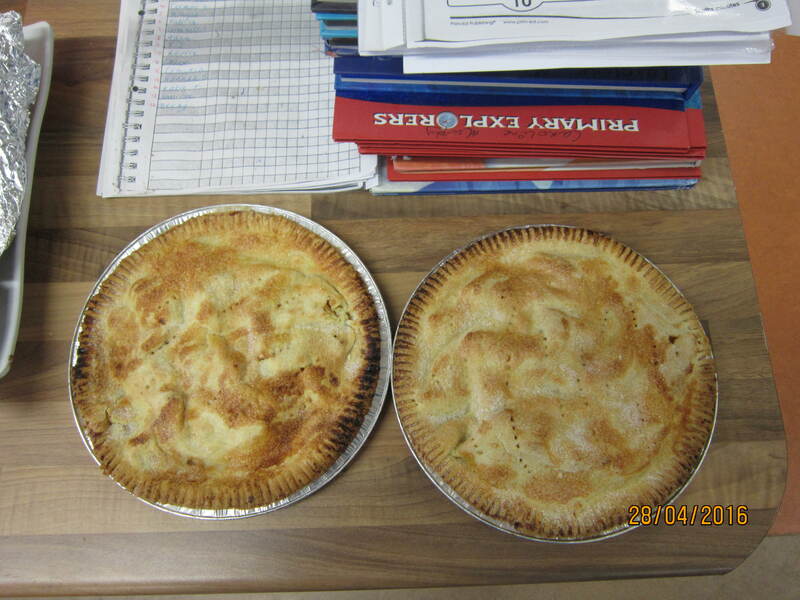 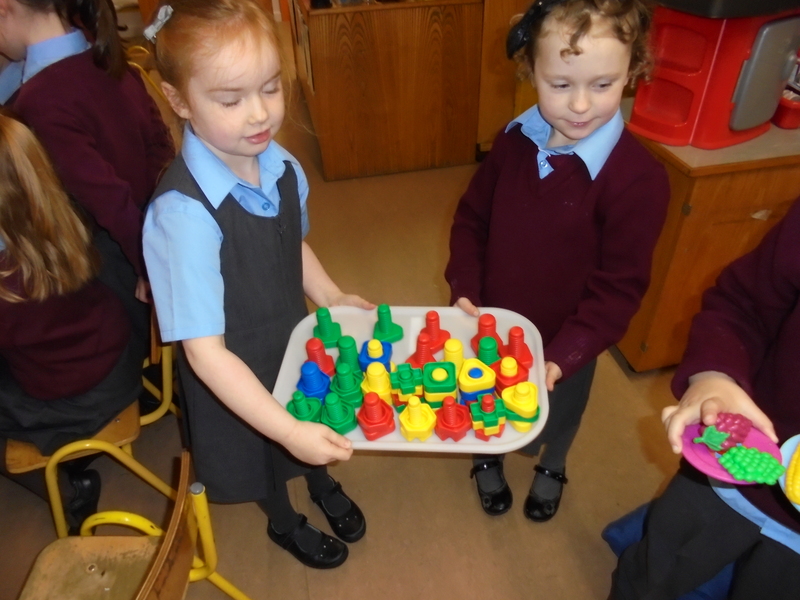 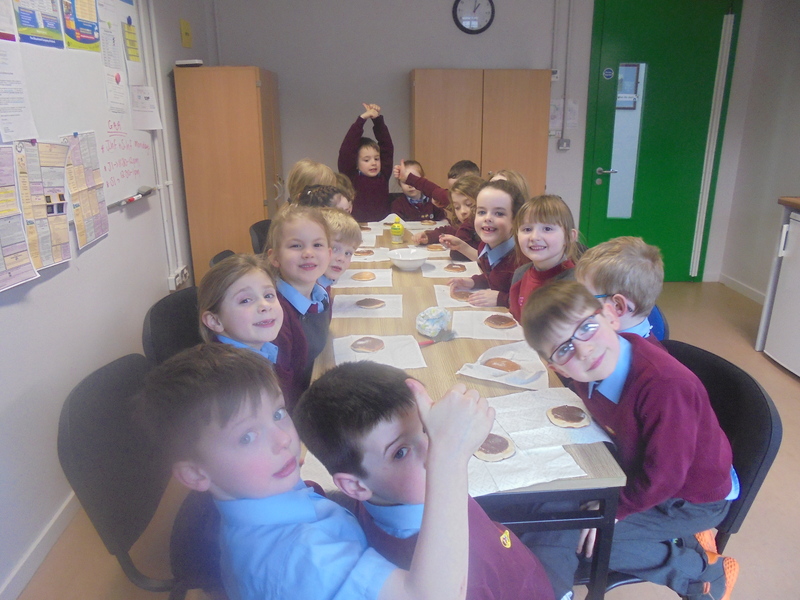 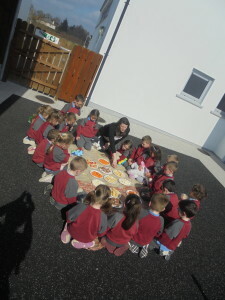 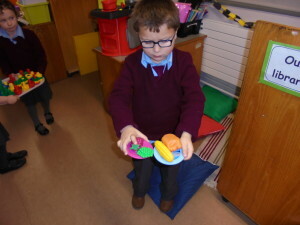 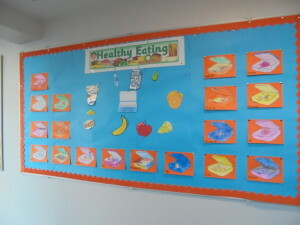 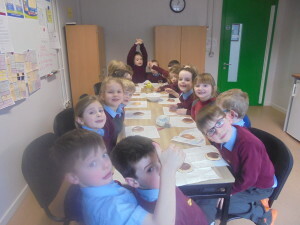 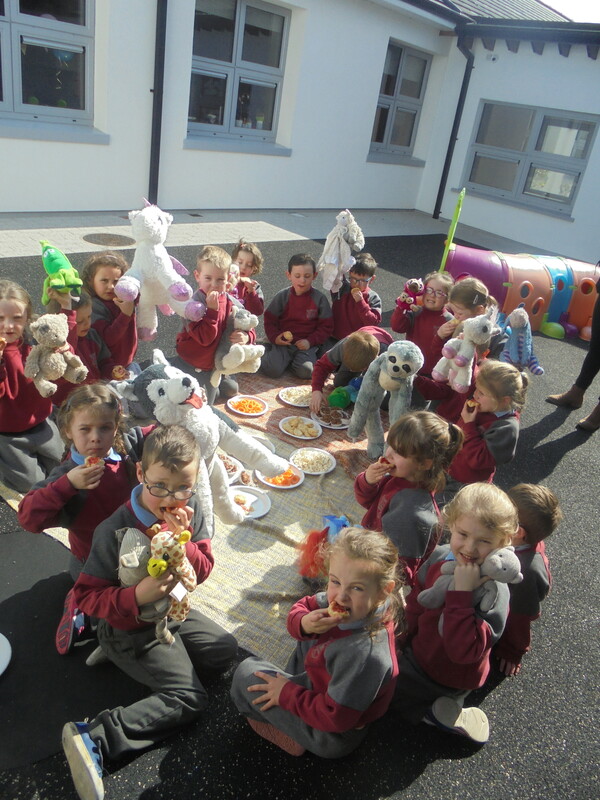 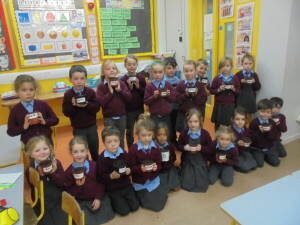 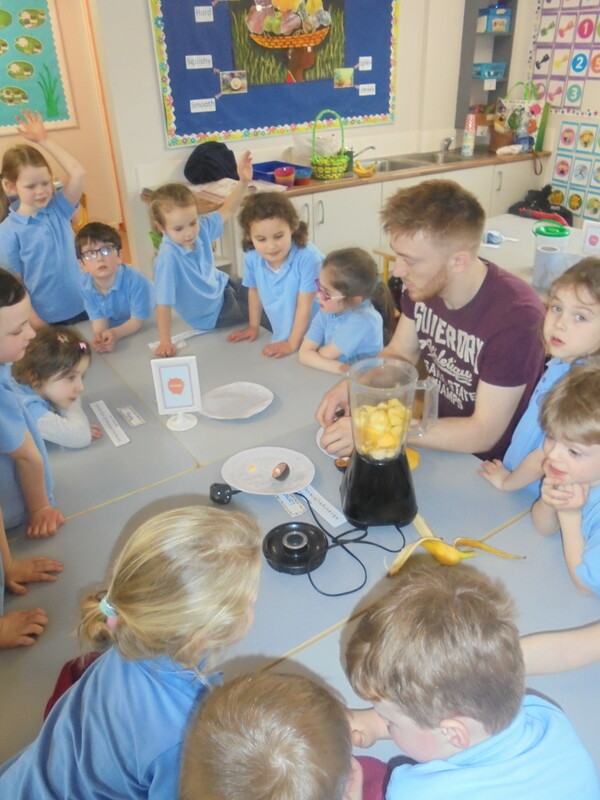 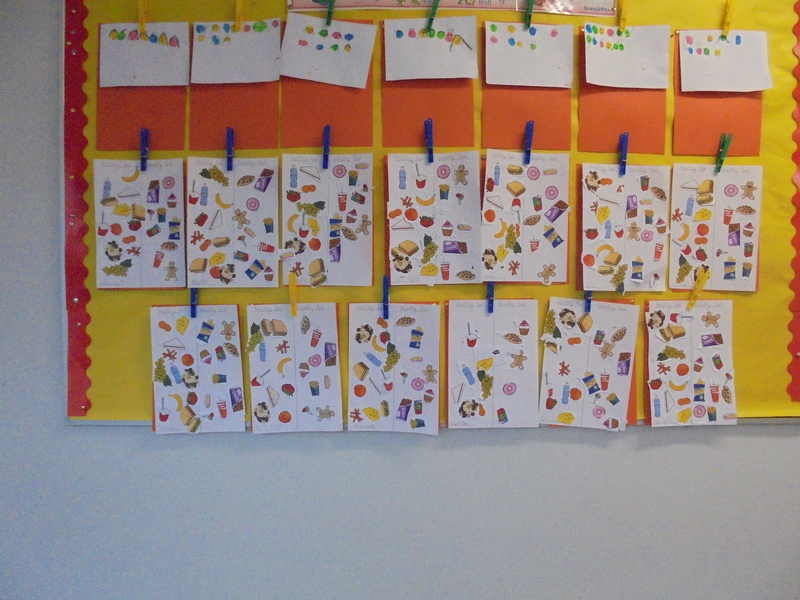 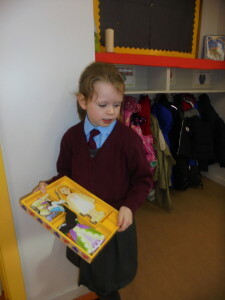 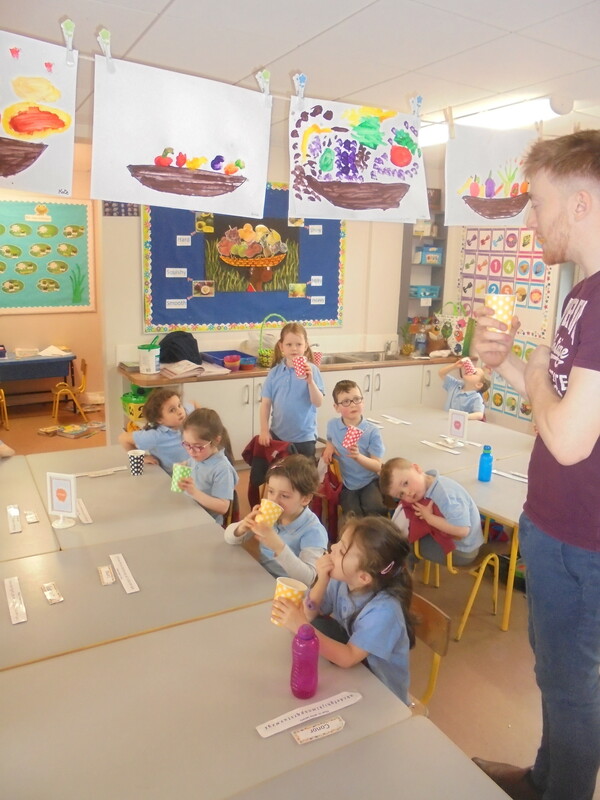 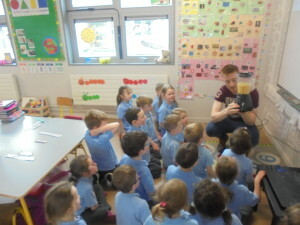 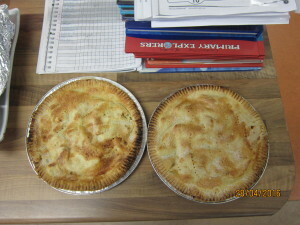 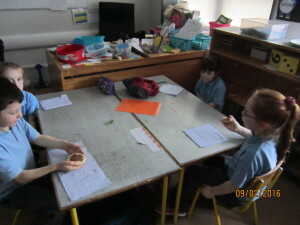 Senior Infants were learning about healthy food. 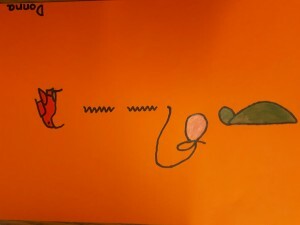 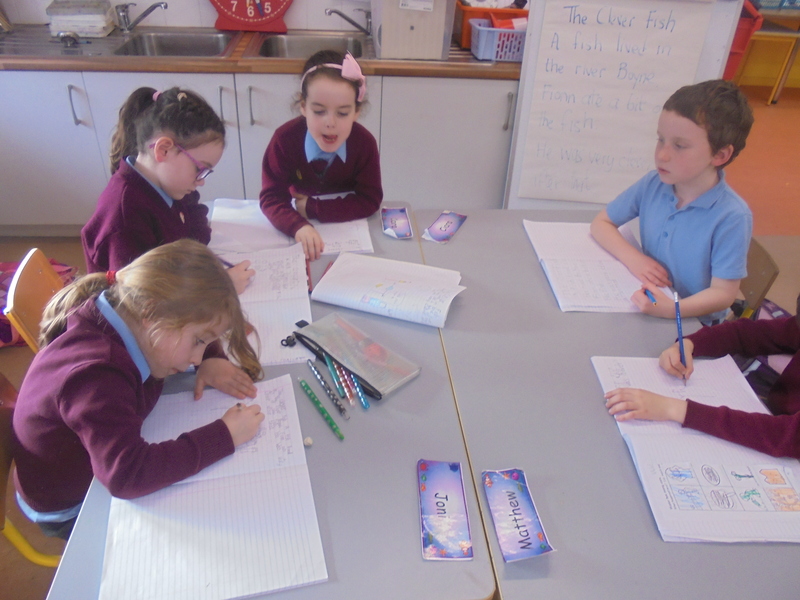 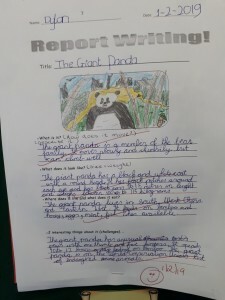 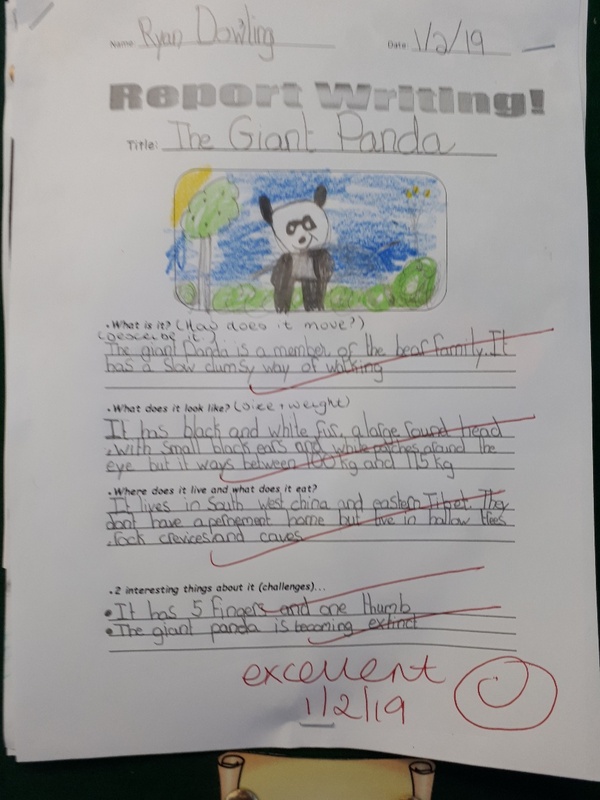 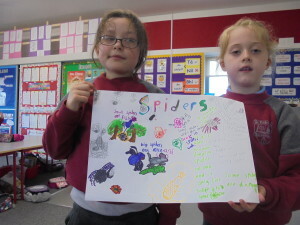 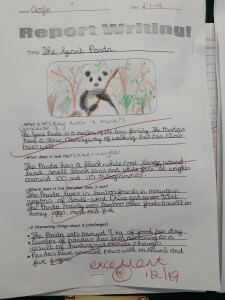 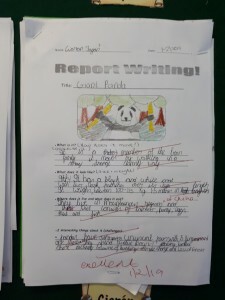 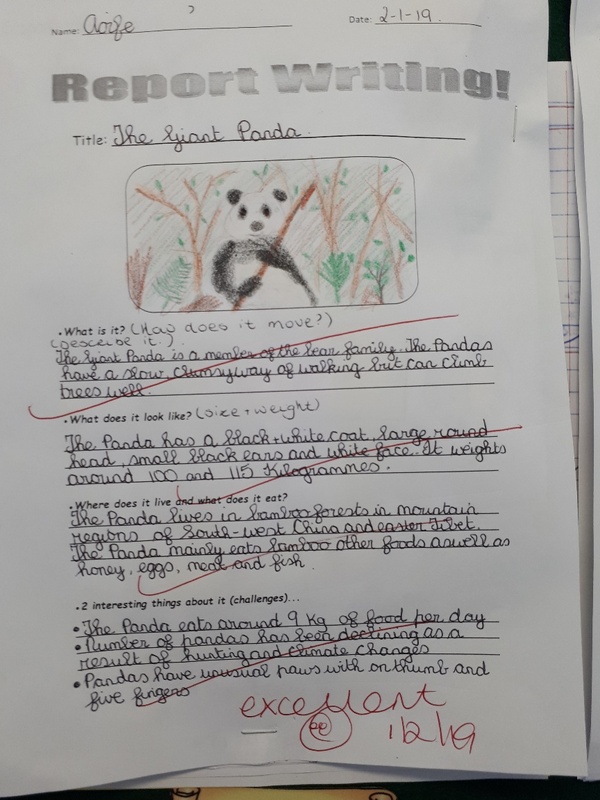 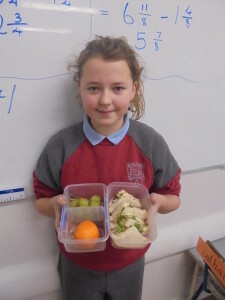 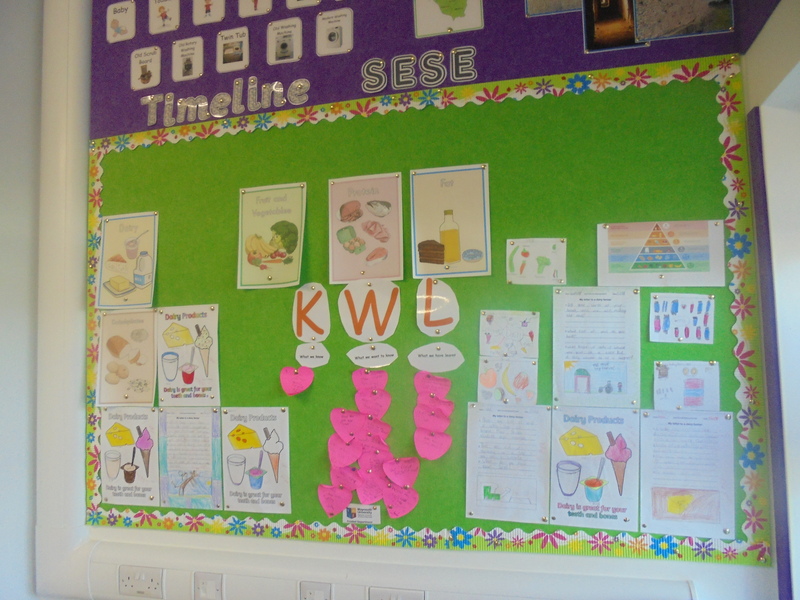 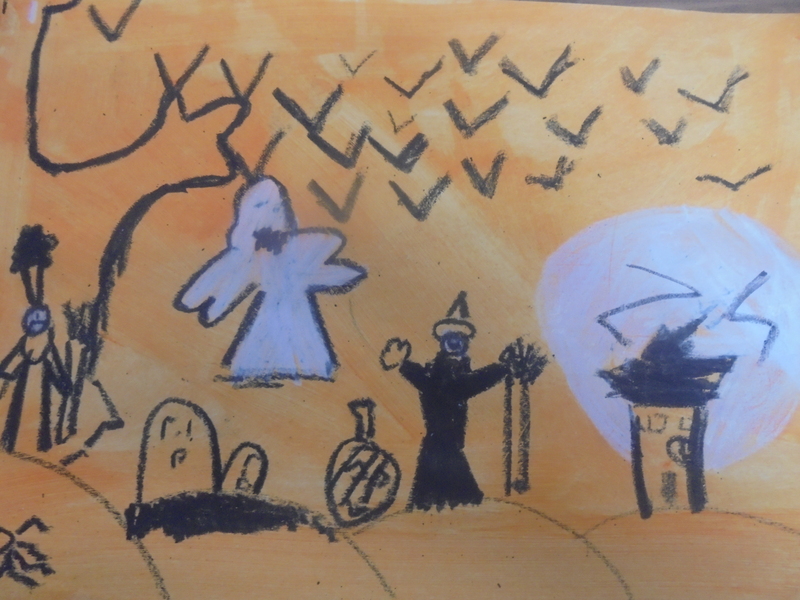 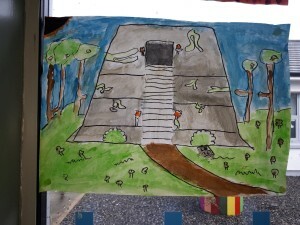 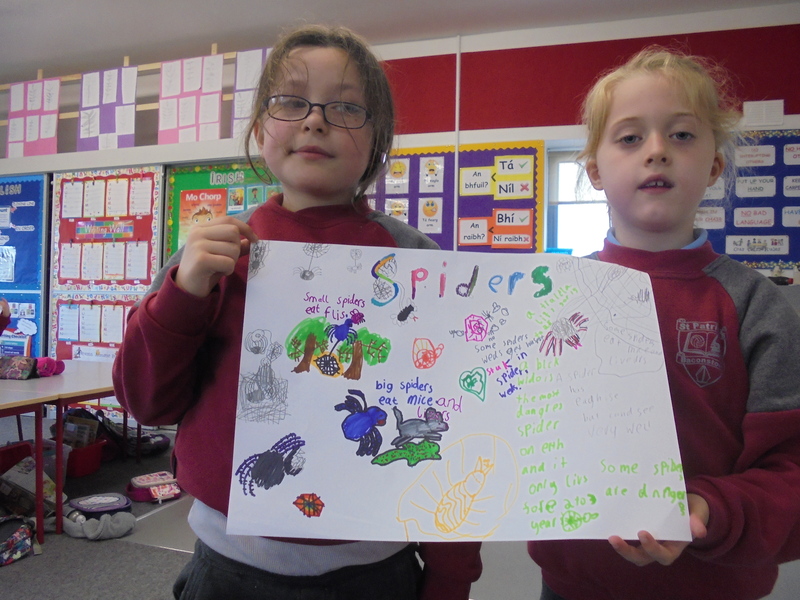 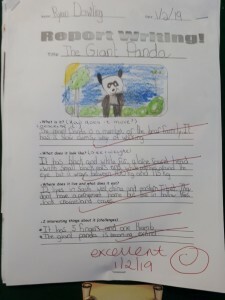 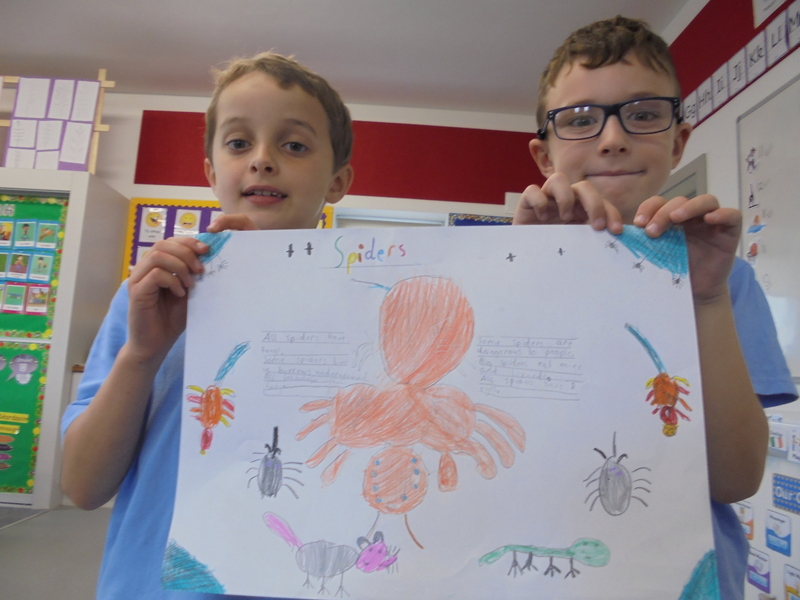 They drew food pyramids, and fruit bowls and wrote about healthy eating (Feb 2016). 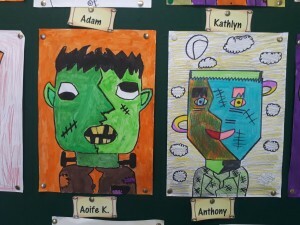 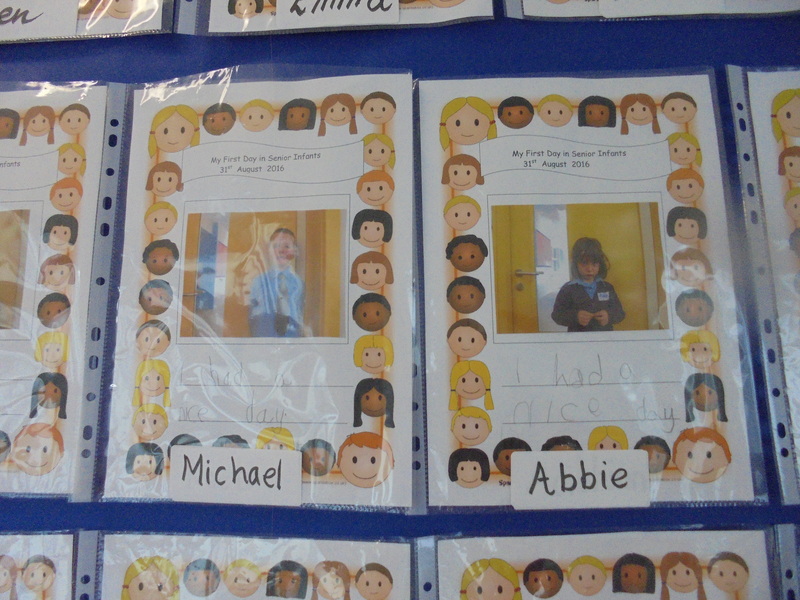 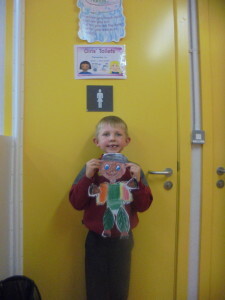 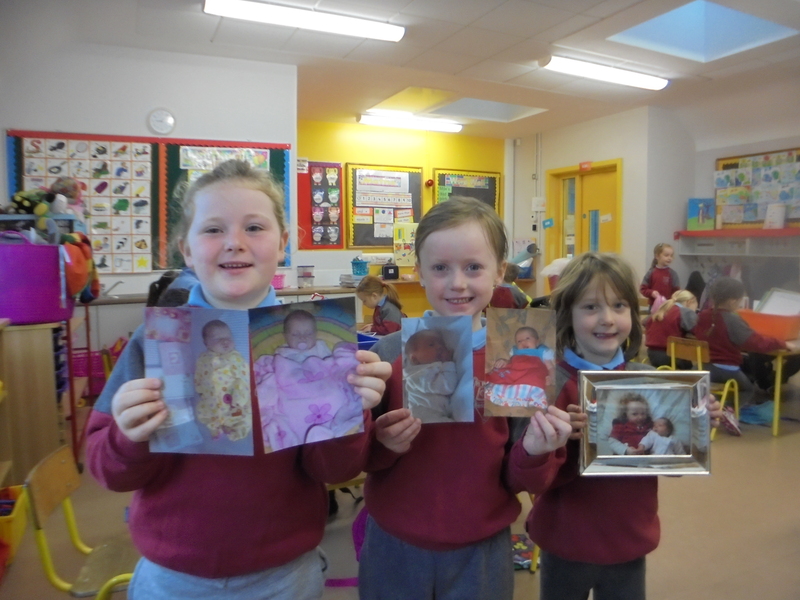 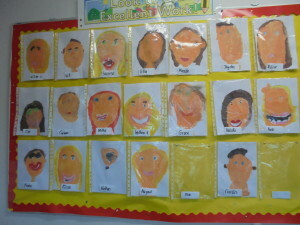 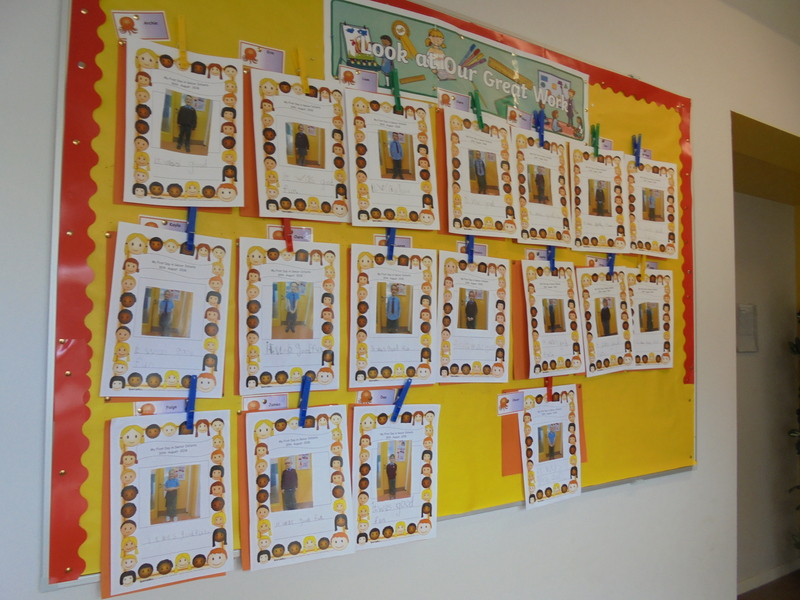 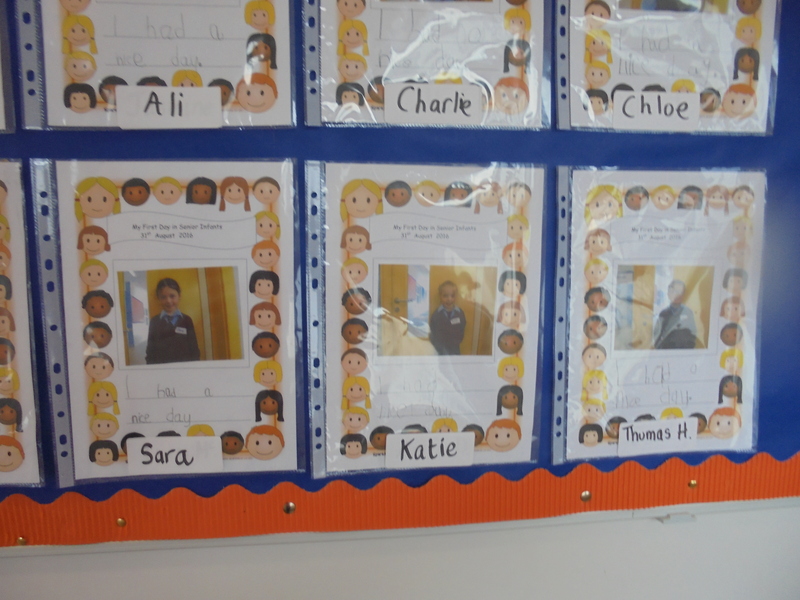 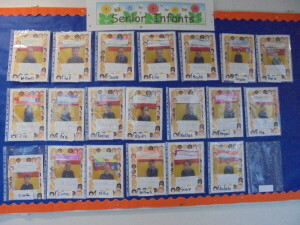 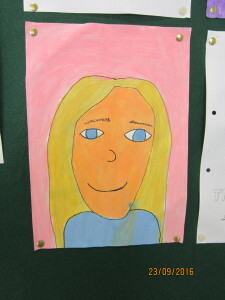 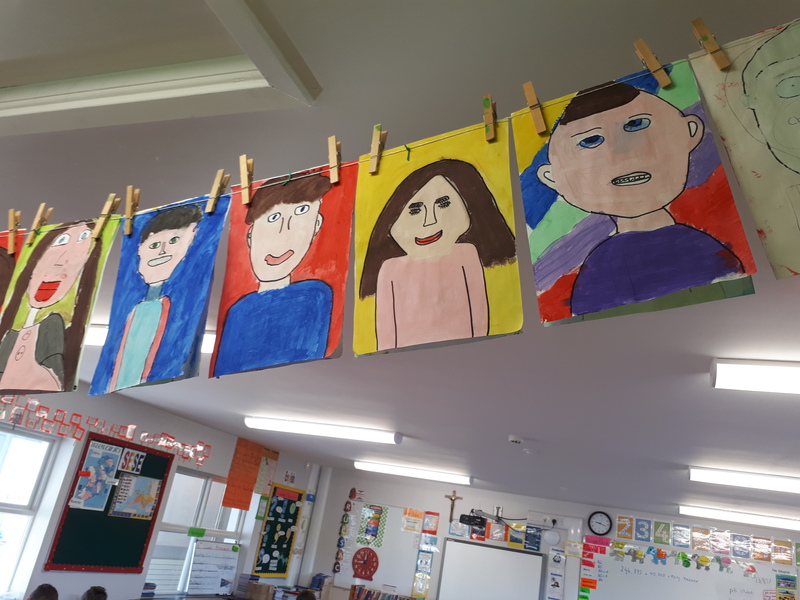 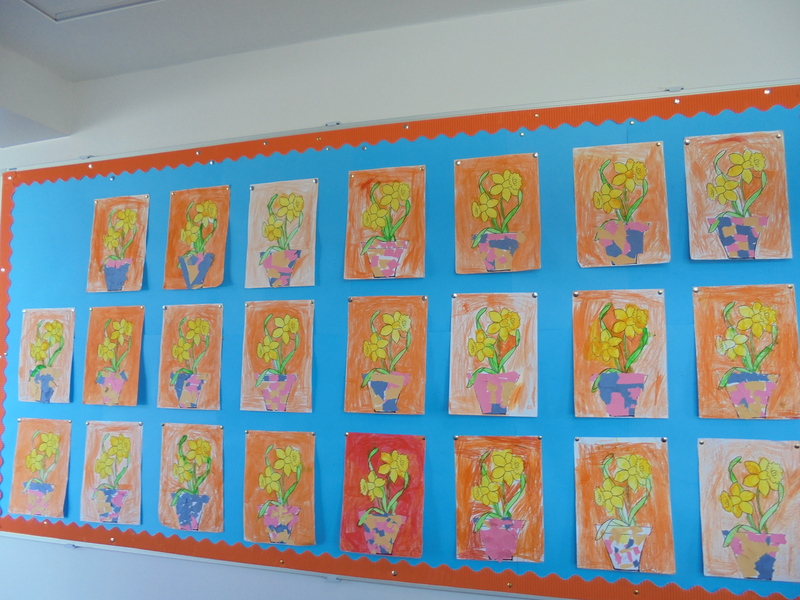 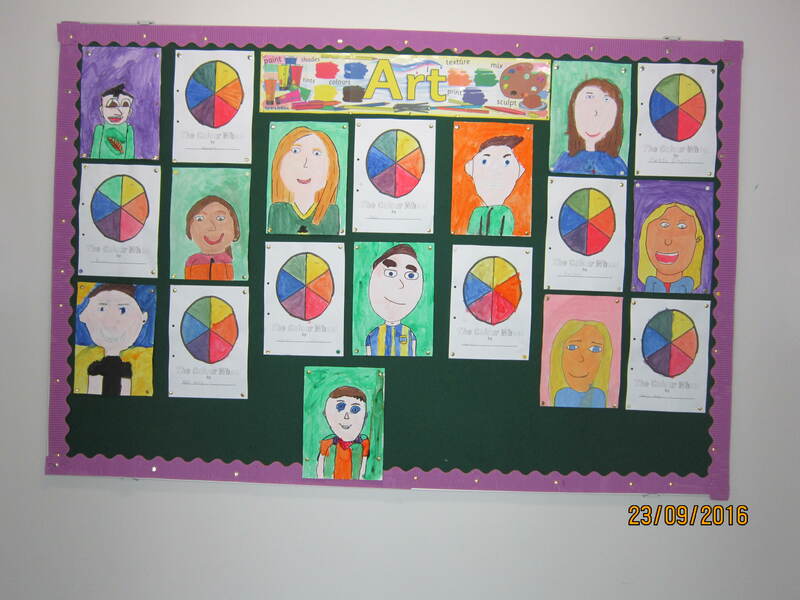 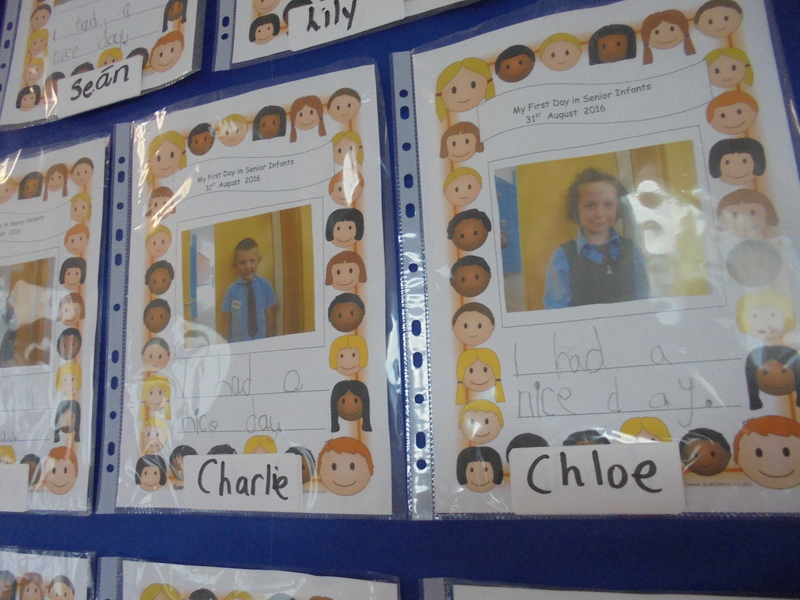 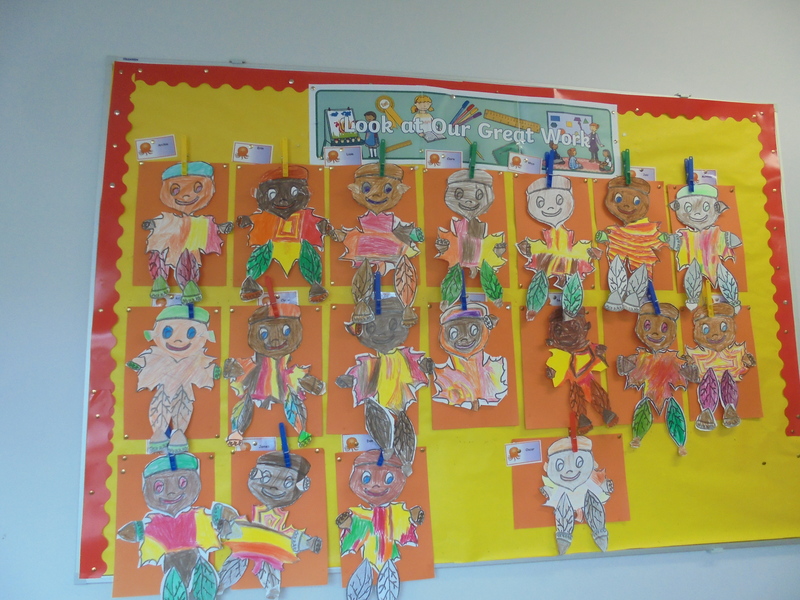 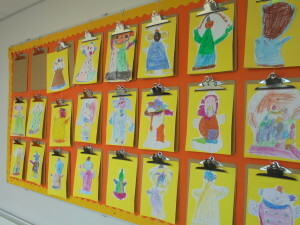 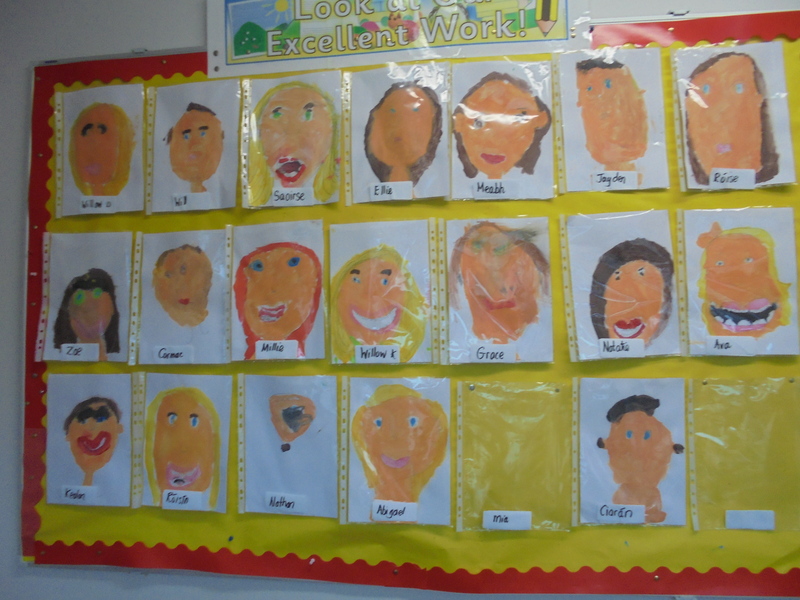 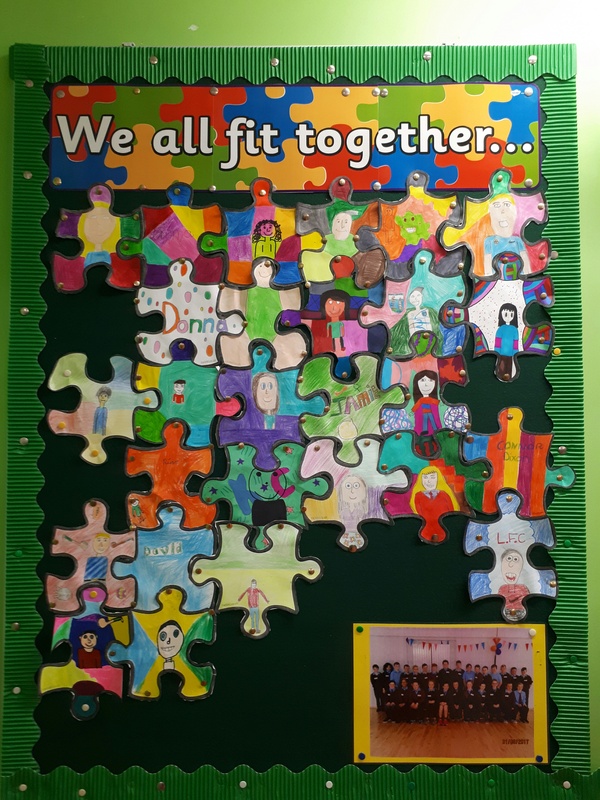 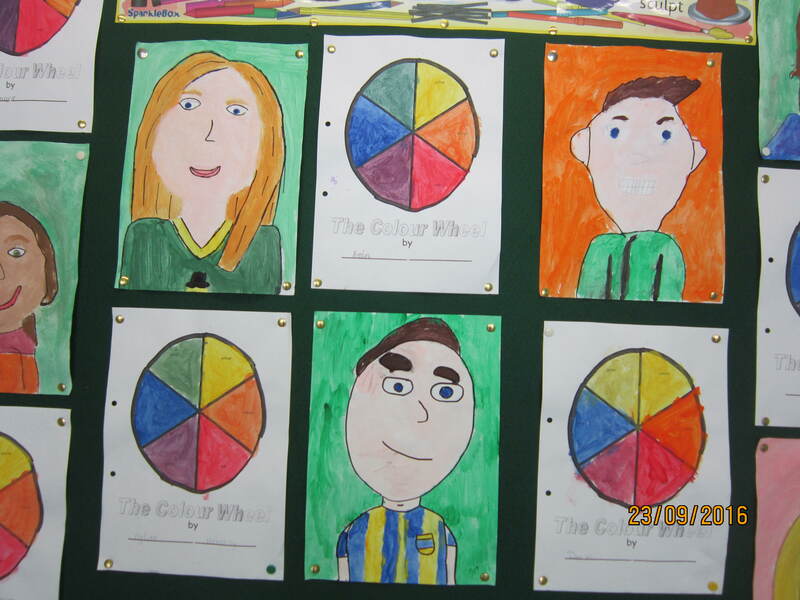 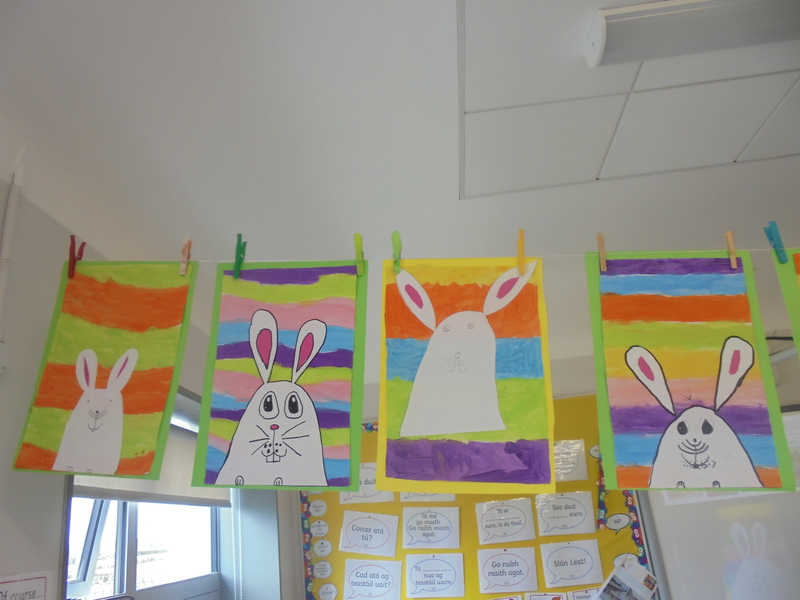 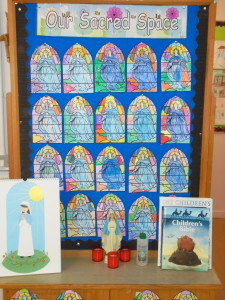 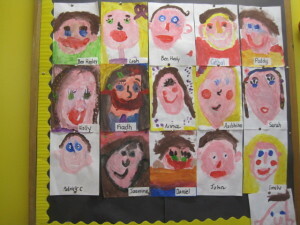 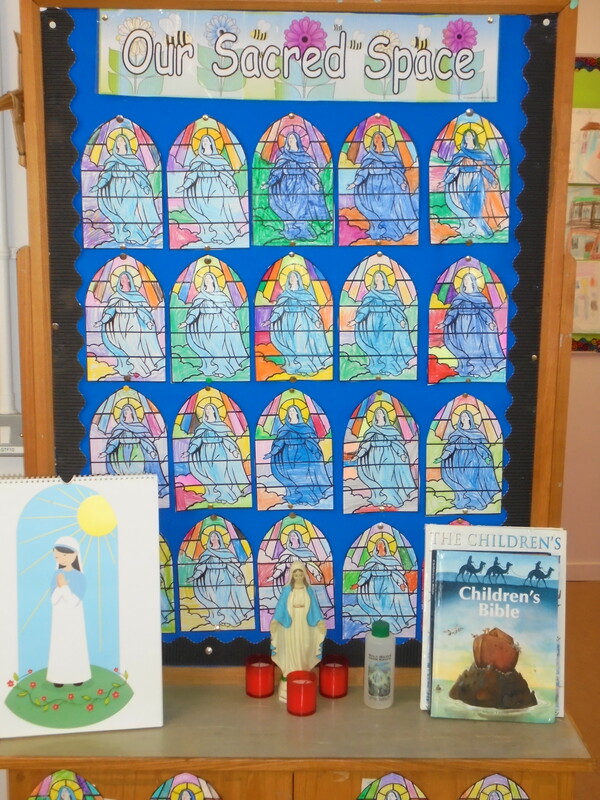 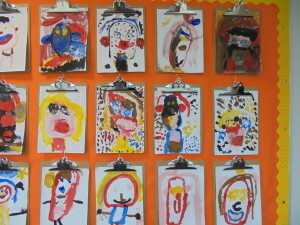 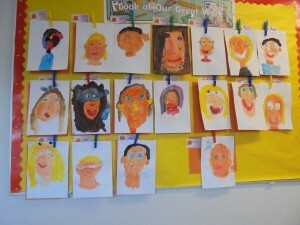 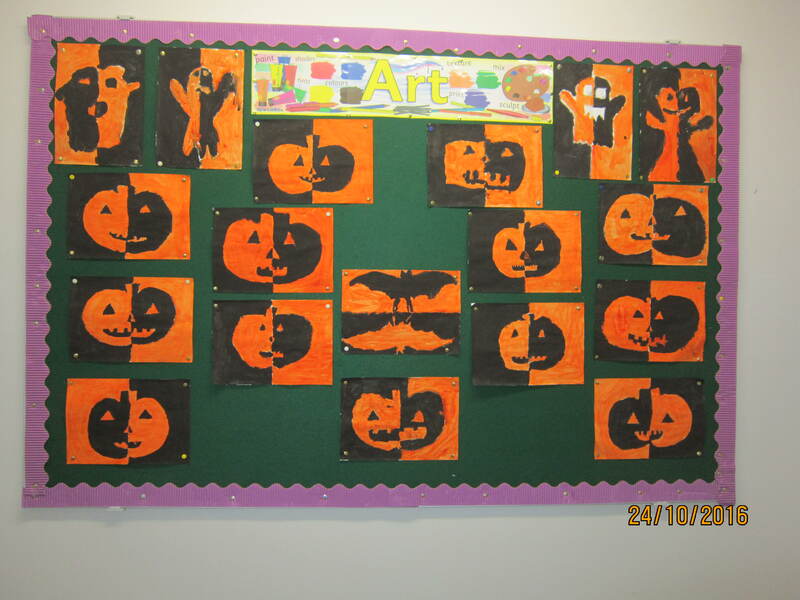 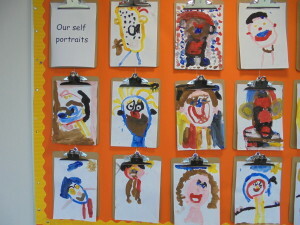 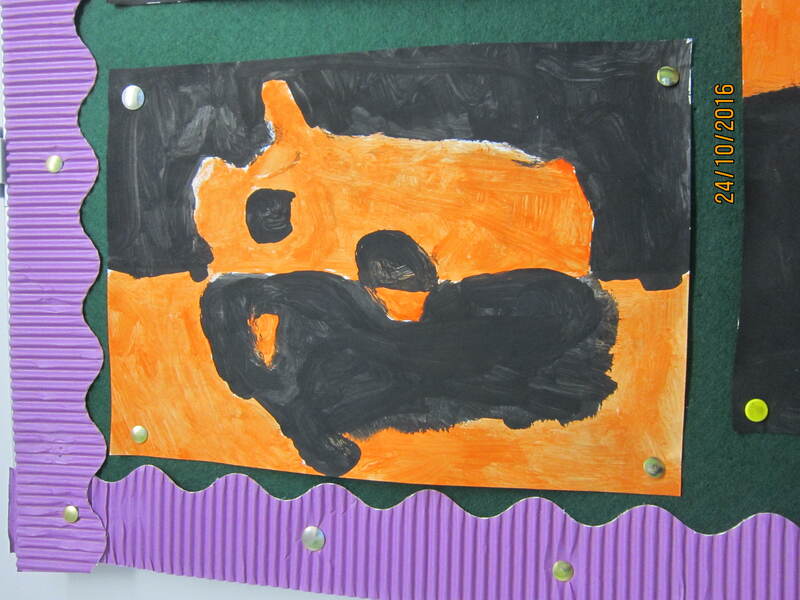 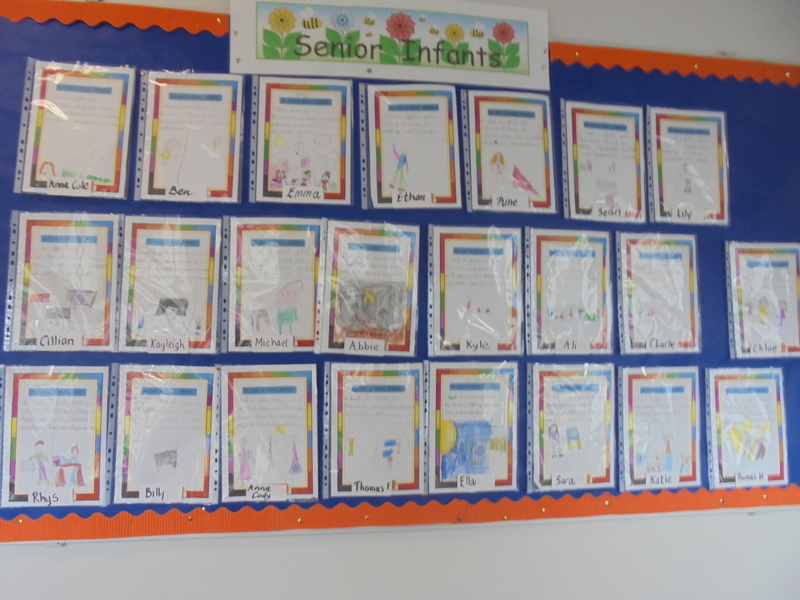 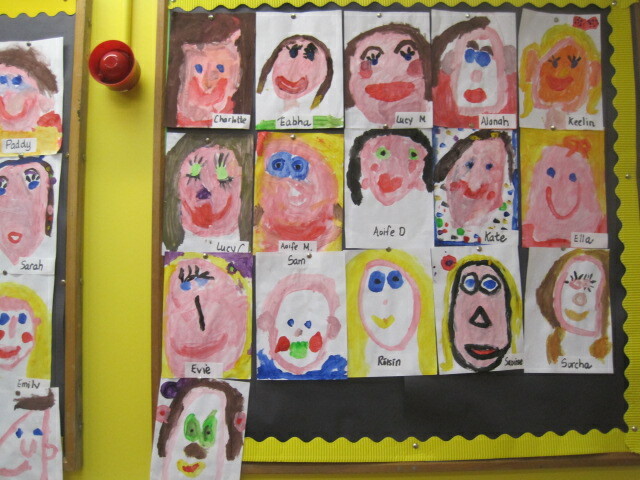 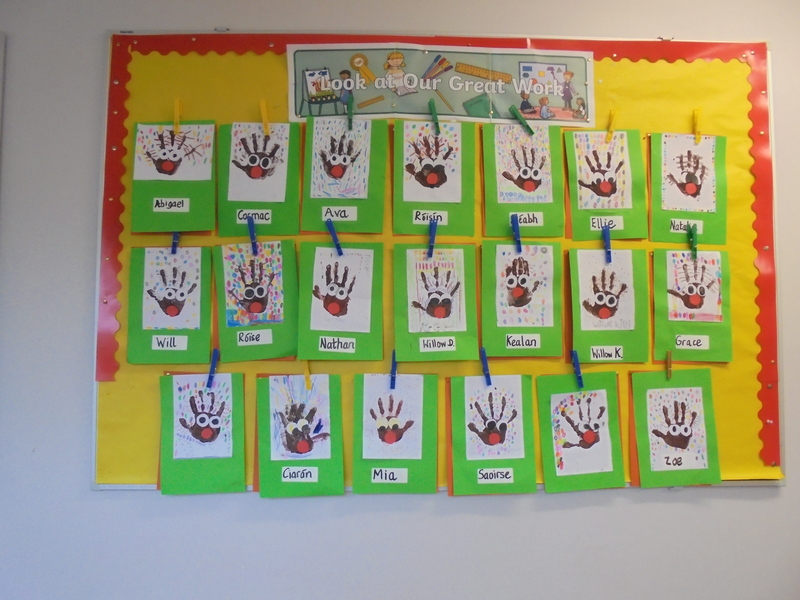 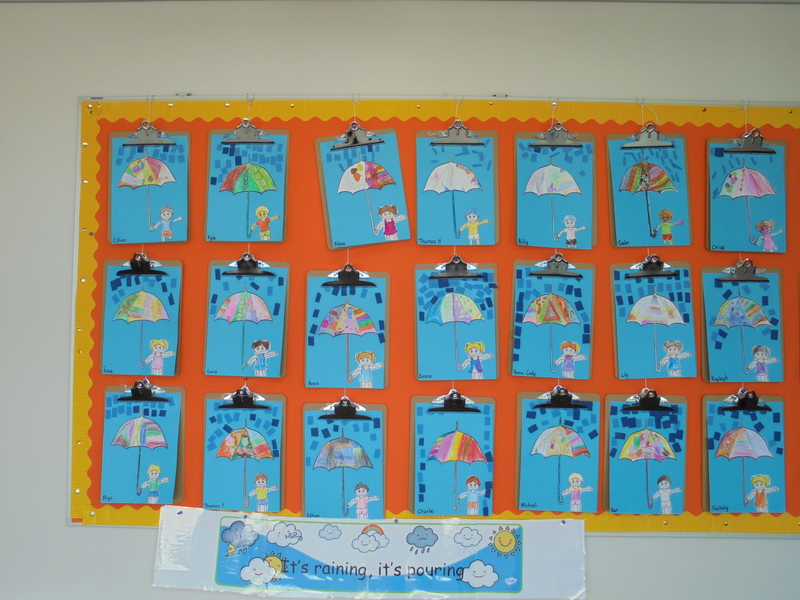 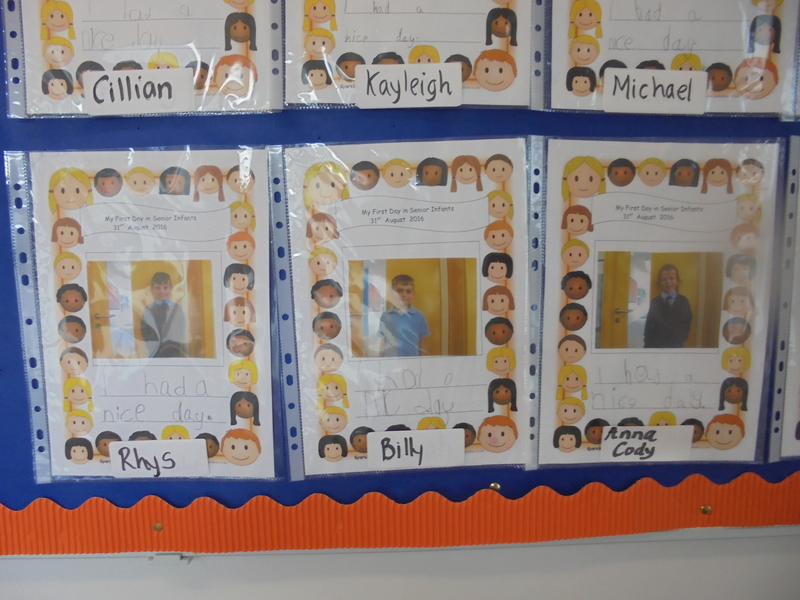 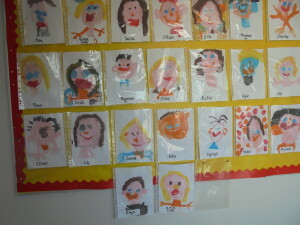 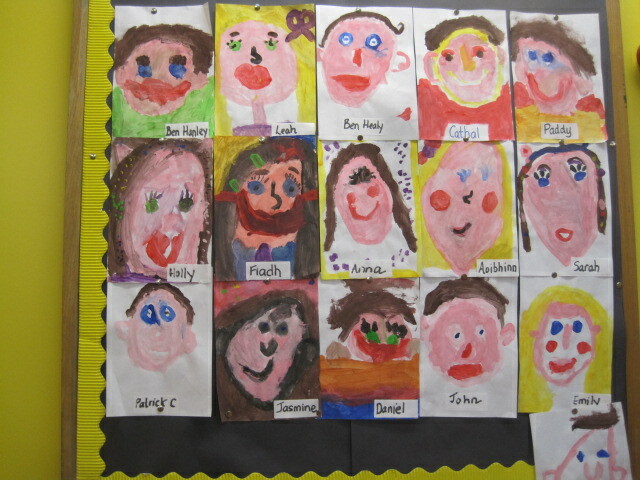 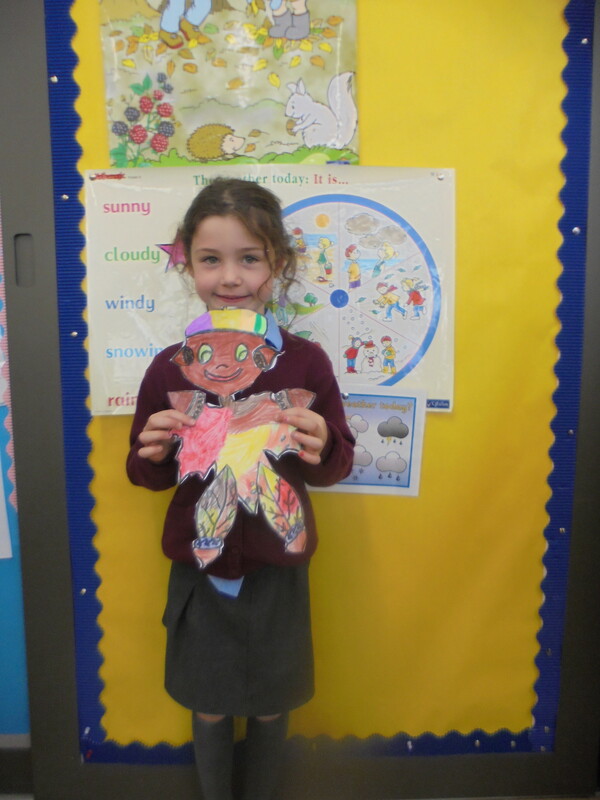 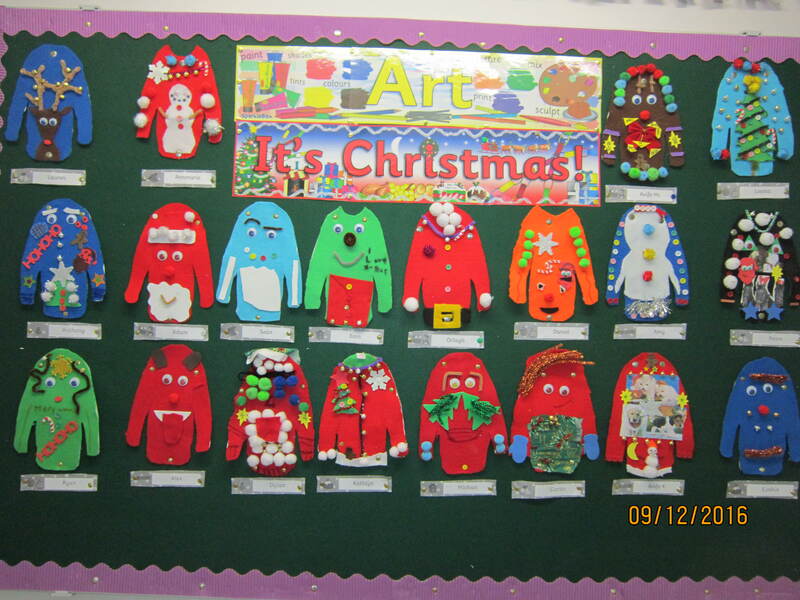 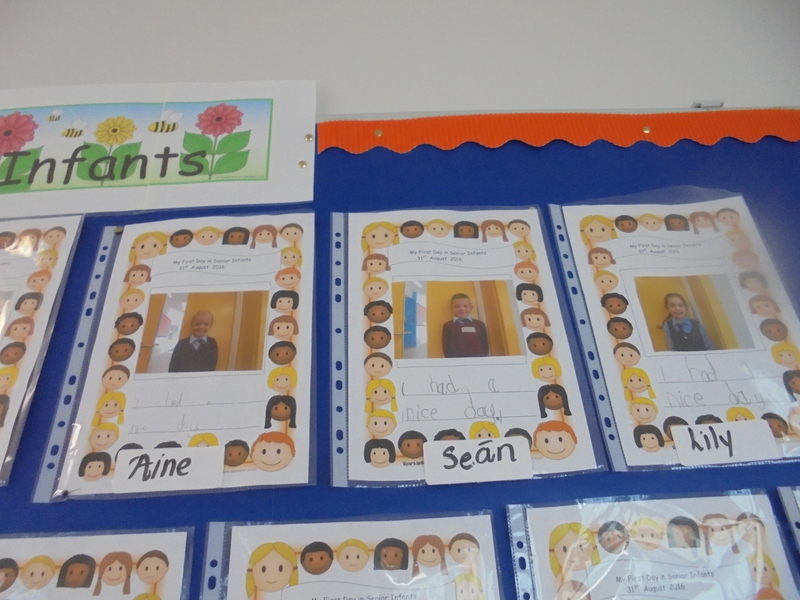 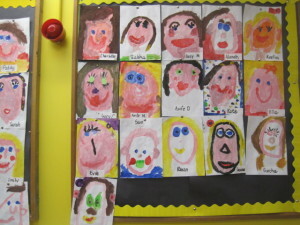 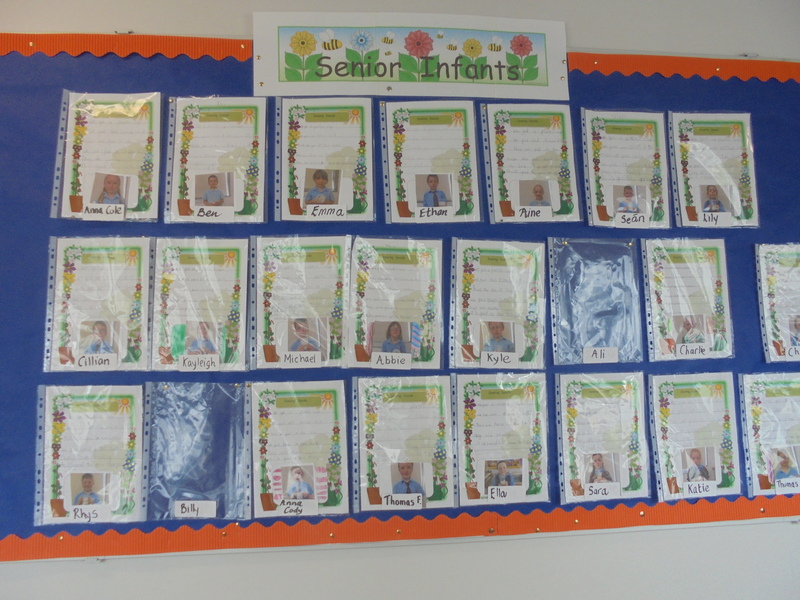 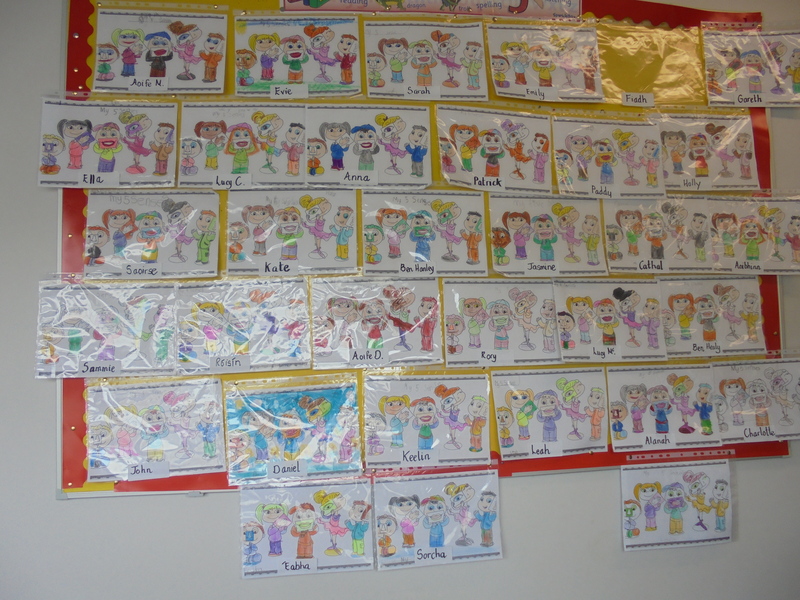 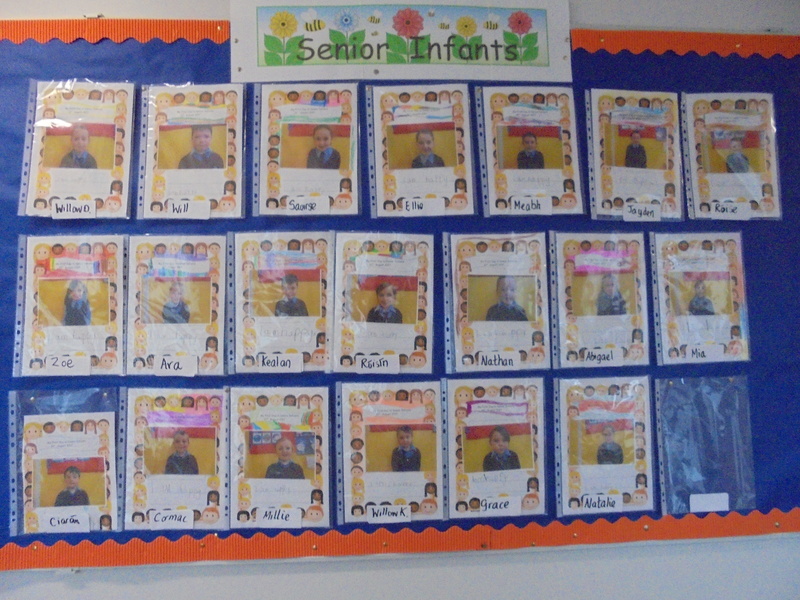 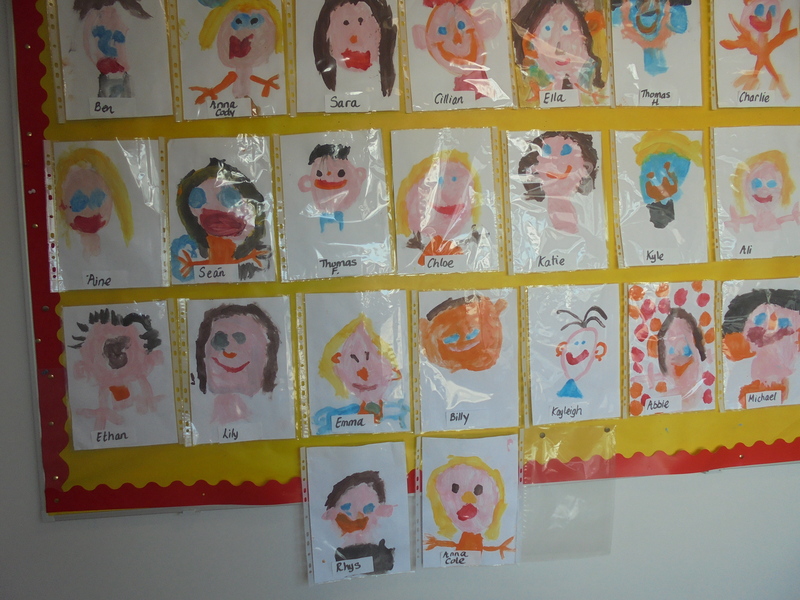 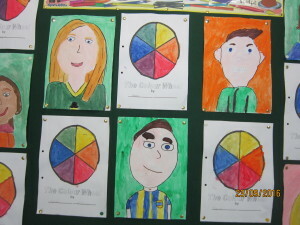 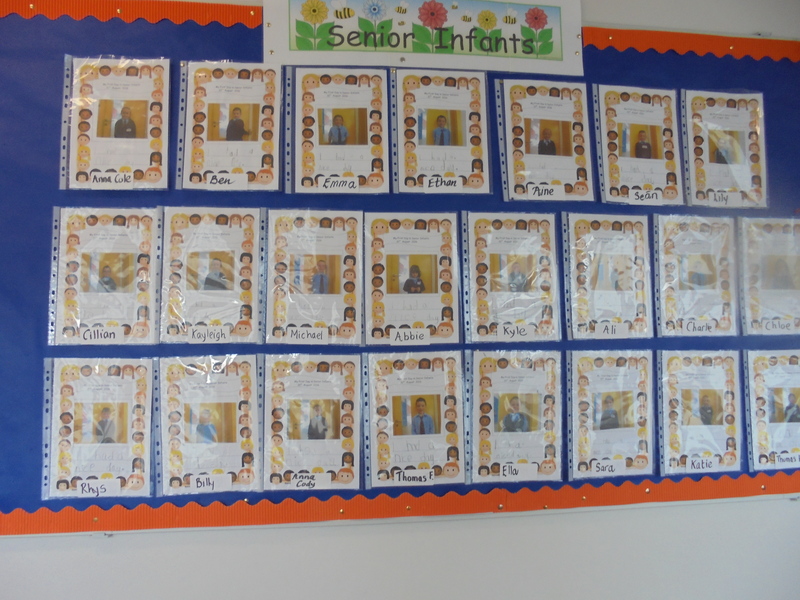 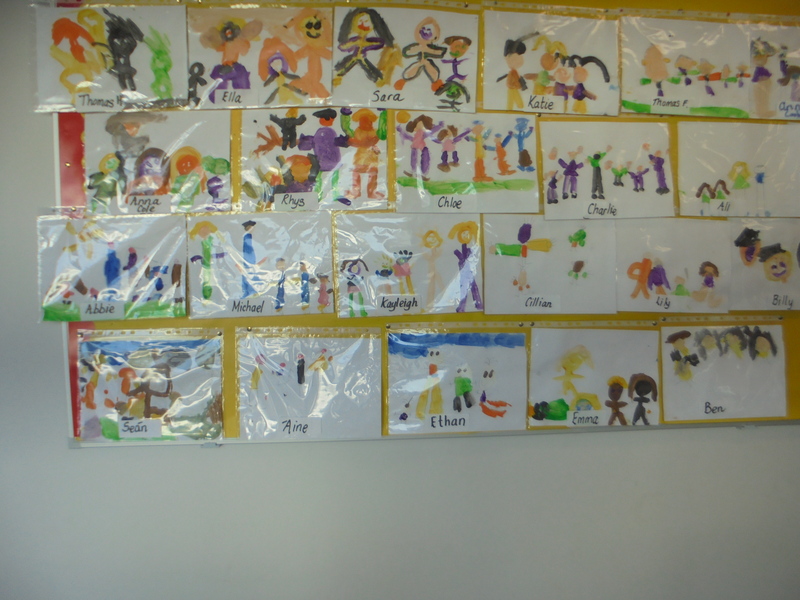 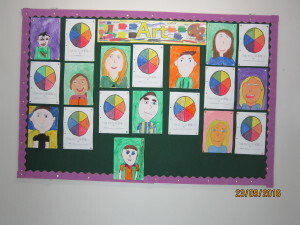 Ms Flynn’s Junior Infants painted self-portraits which are hanging in the corridor outside their class (Nov 2015).